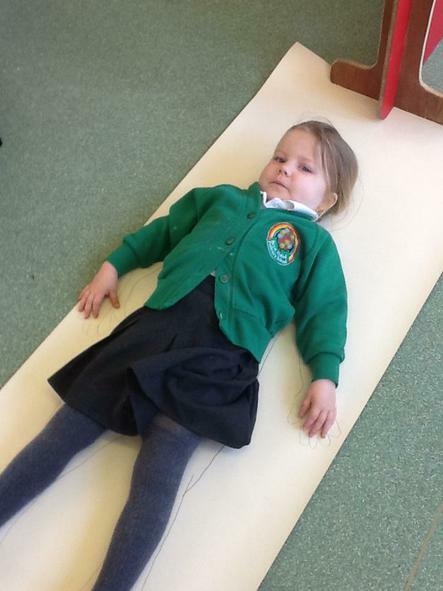 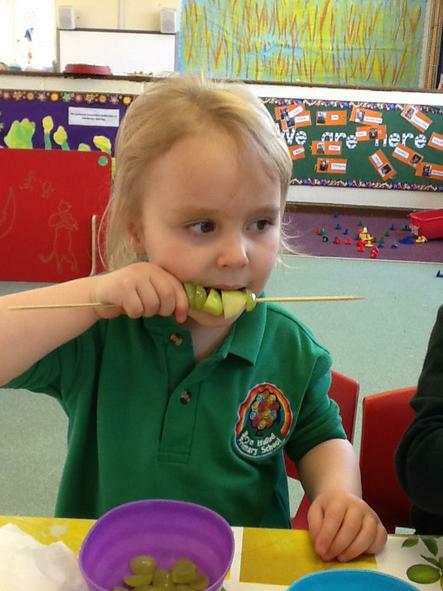 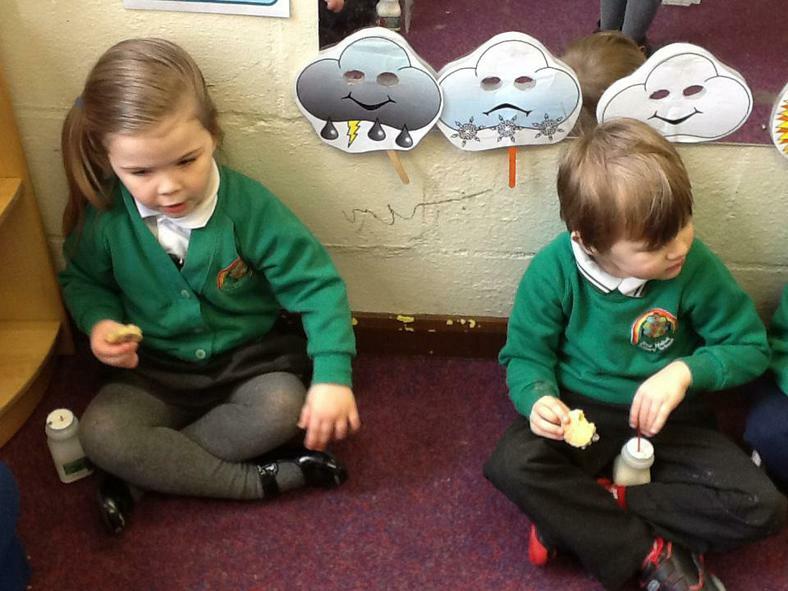 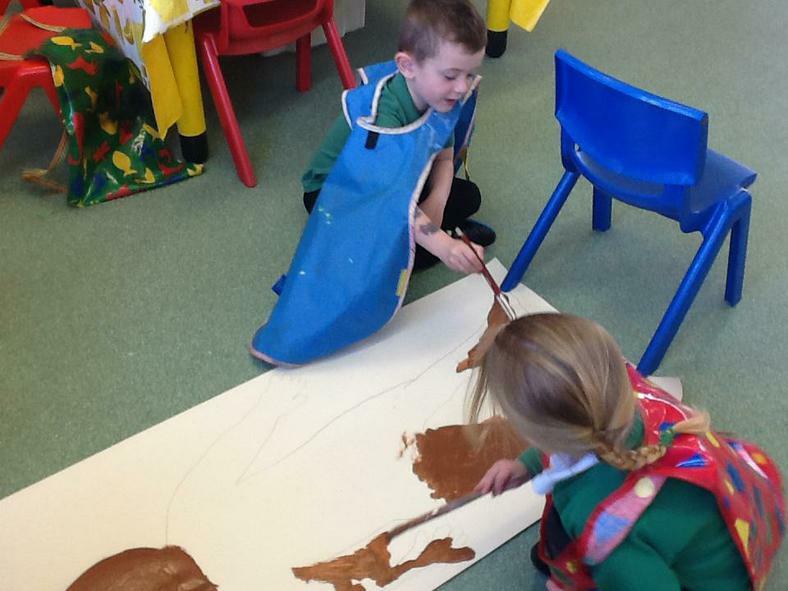 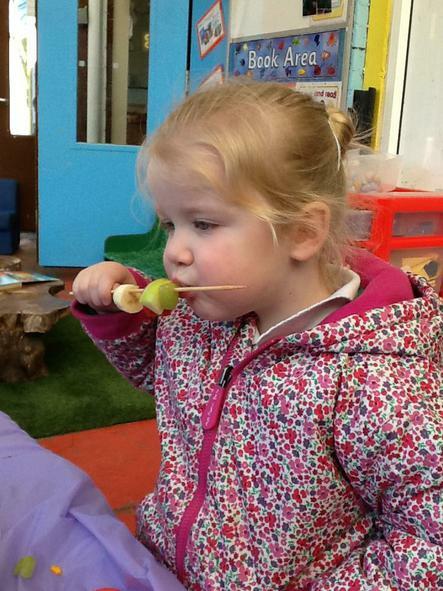 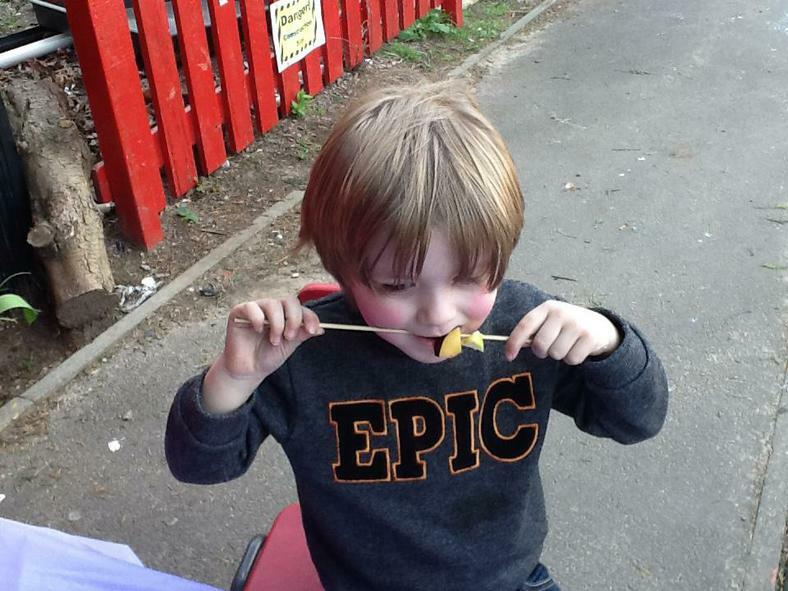 This week we have been focusing on 'The Enormous Turnip' and 'Jack and the Beanstalk'. 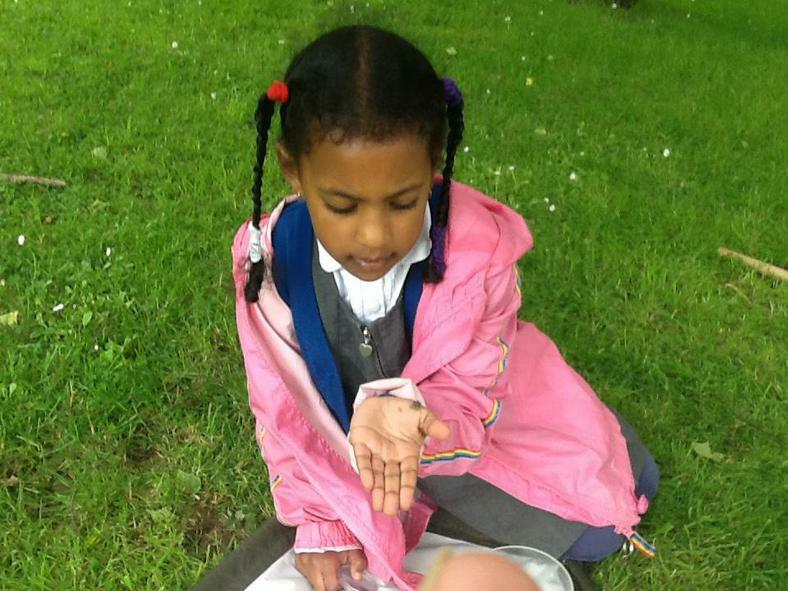 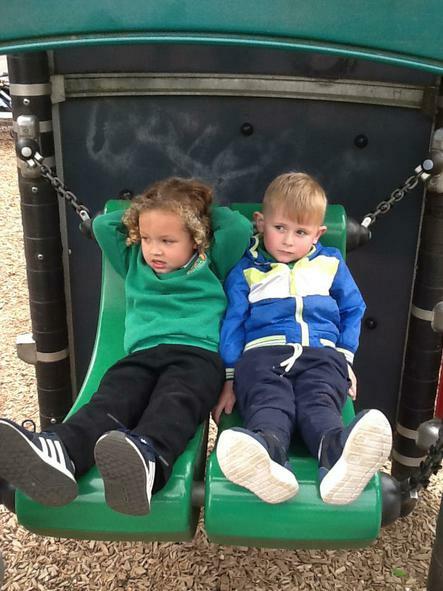 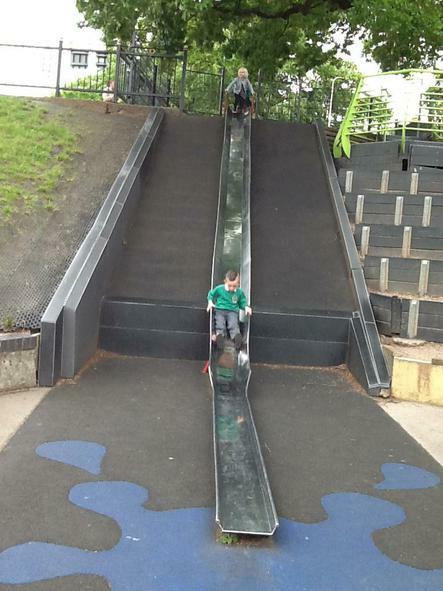 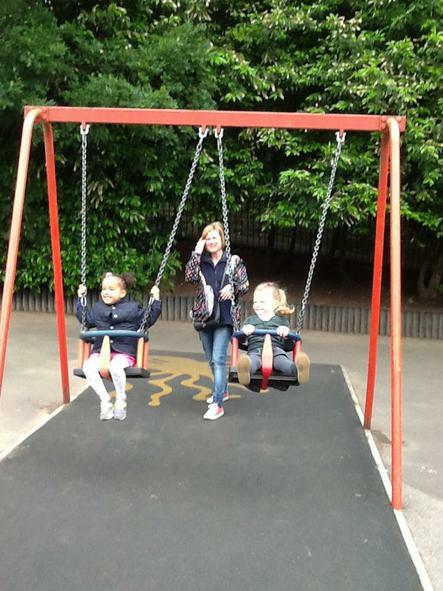 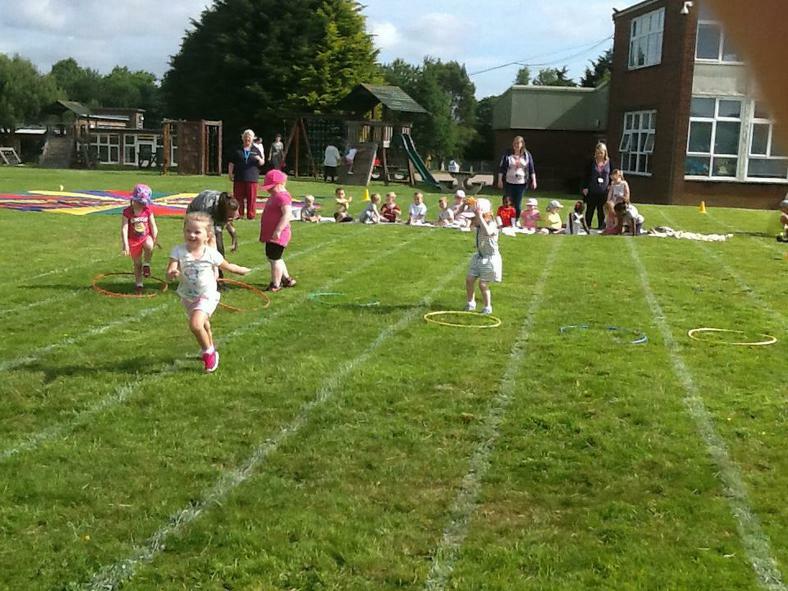 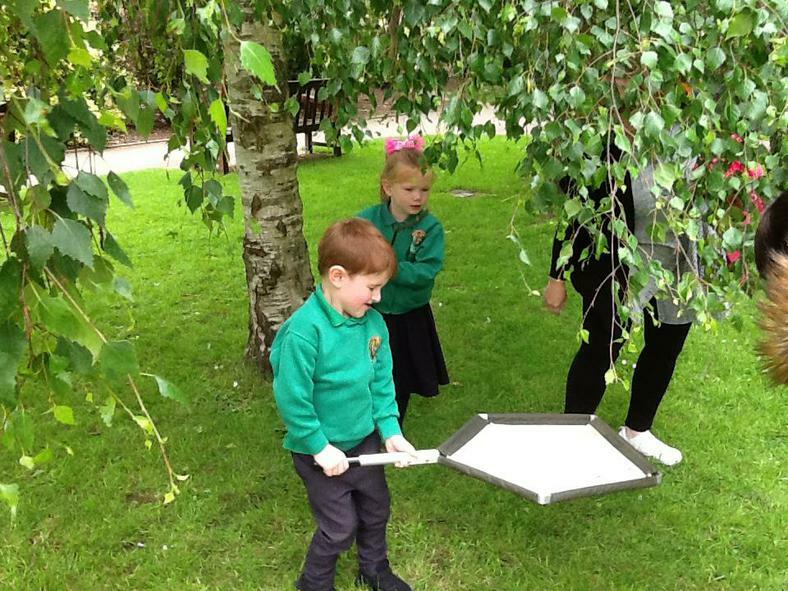 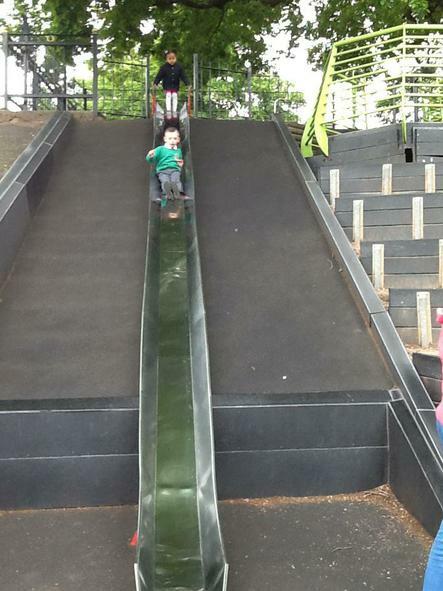 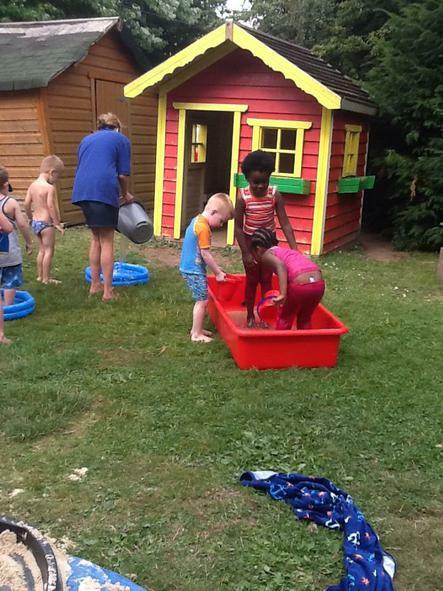 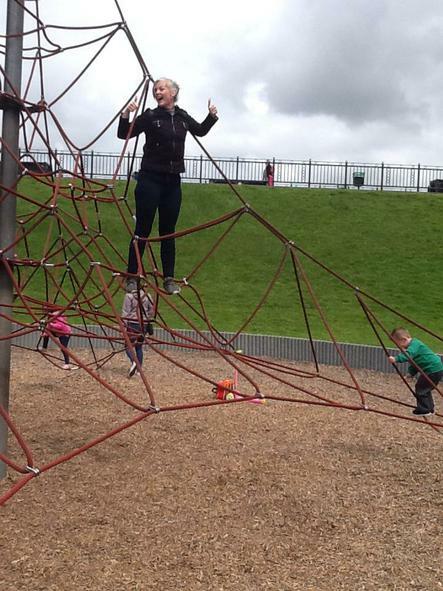 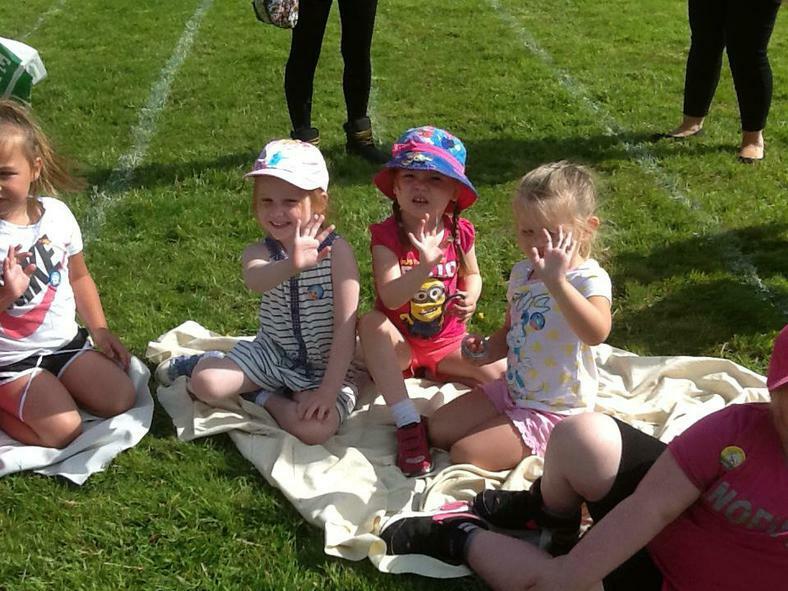 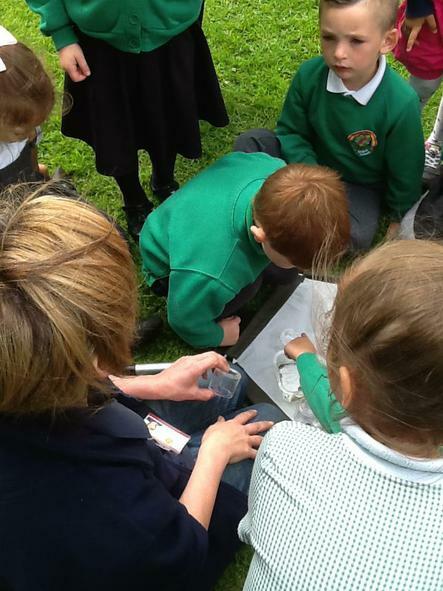 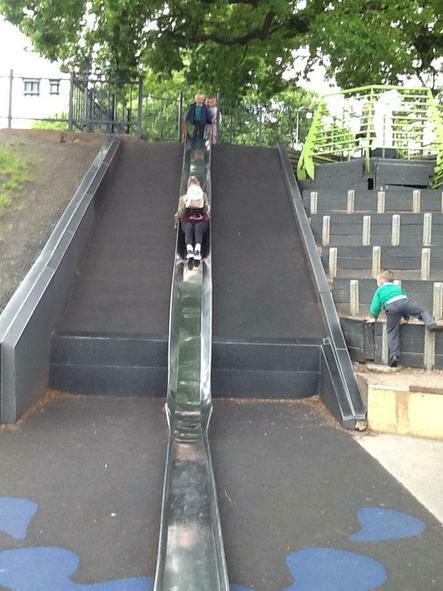 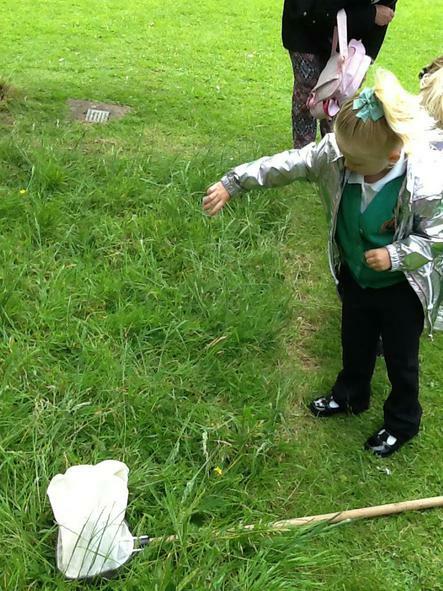 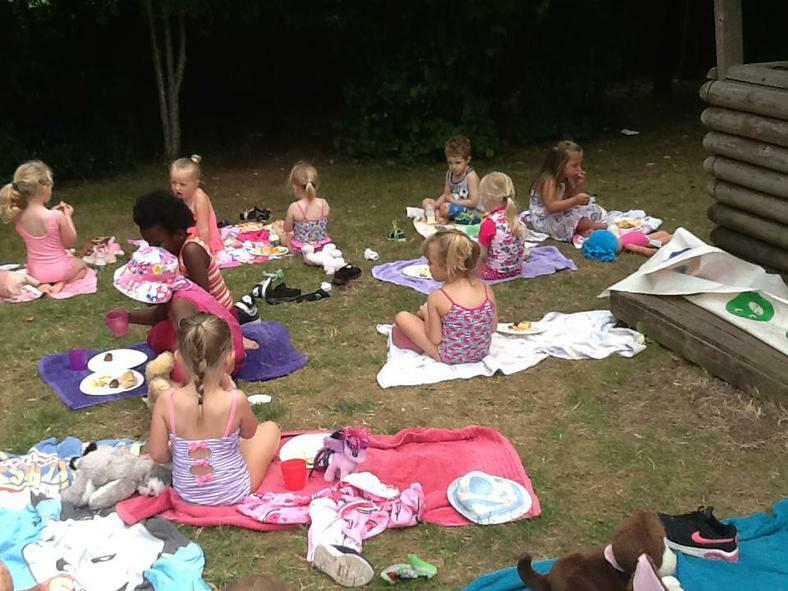 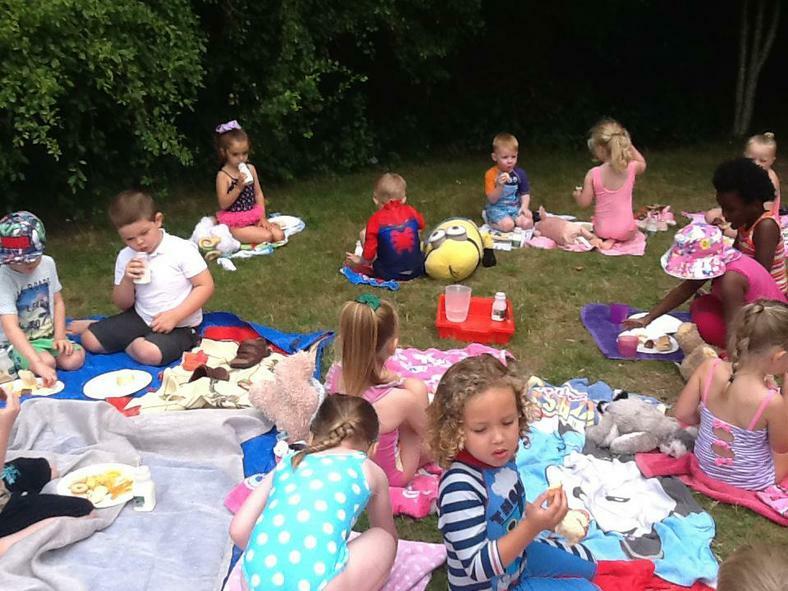 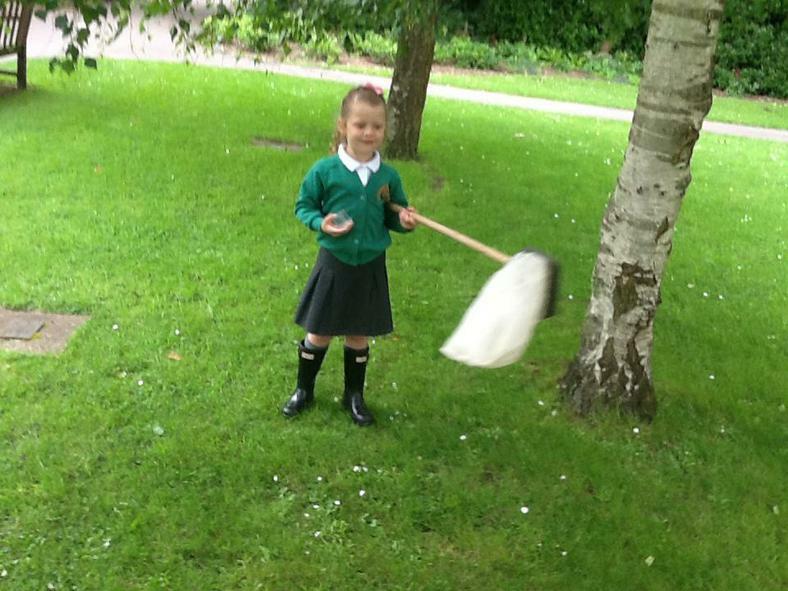 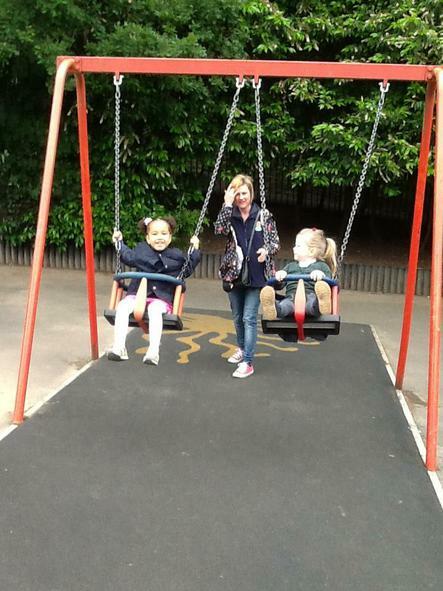 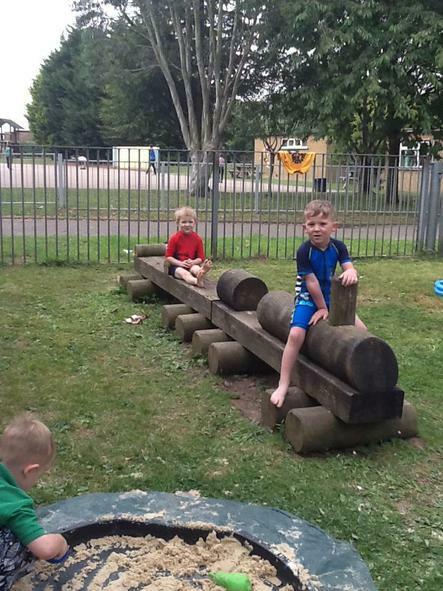 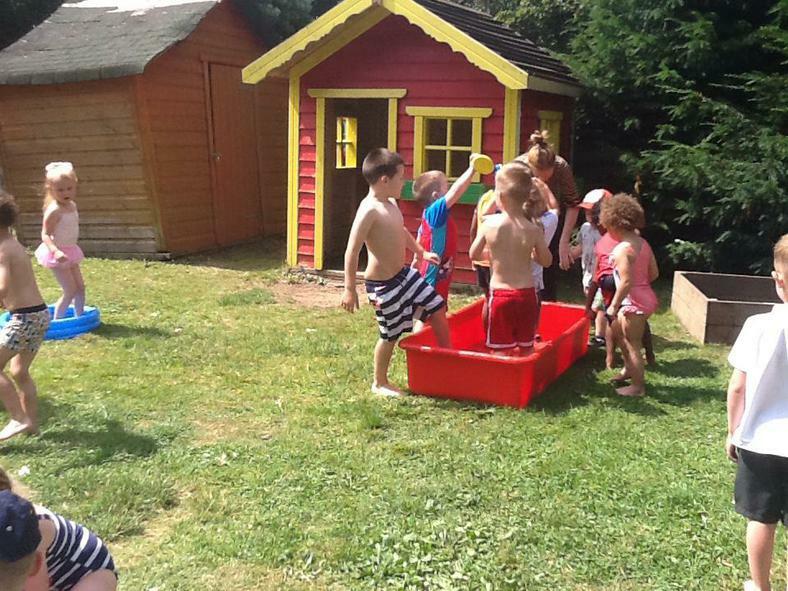 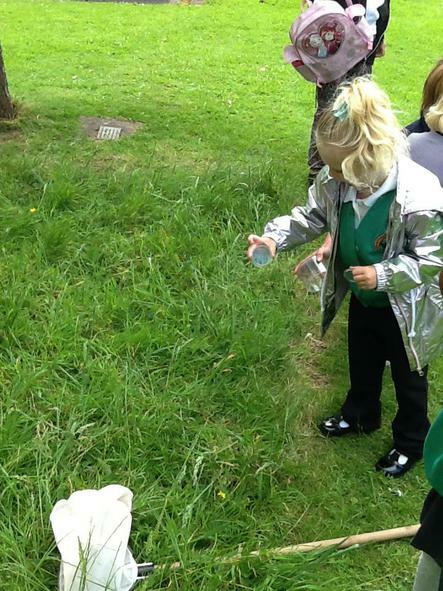 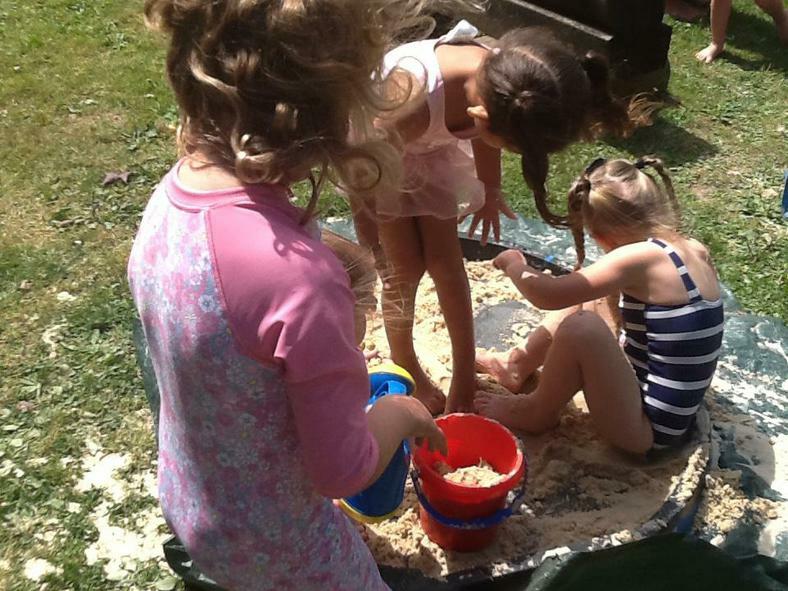 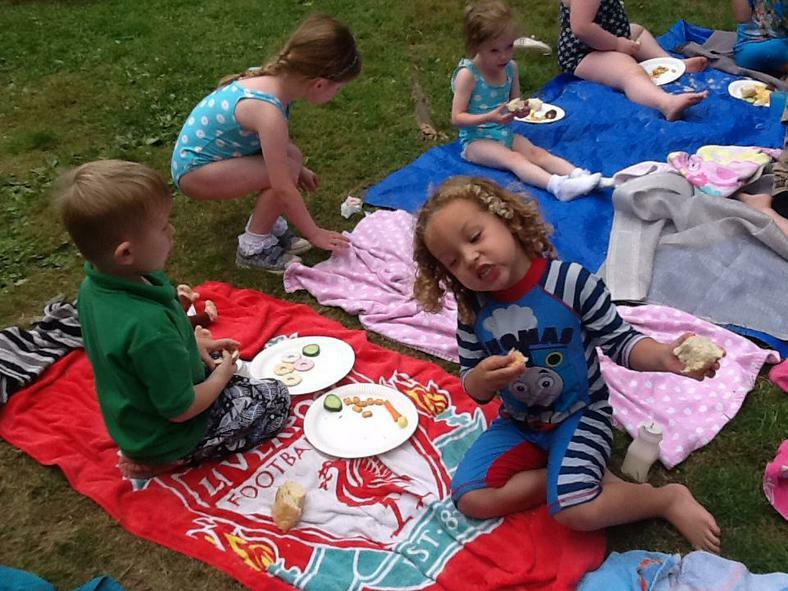 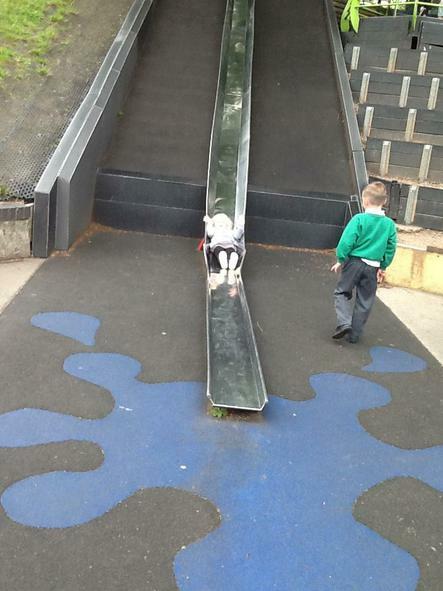 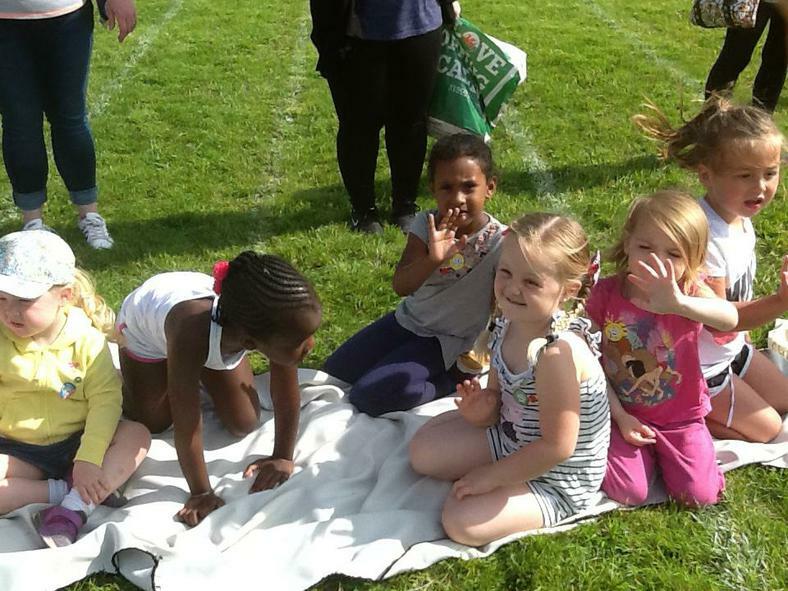 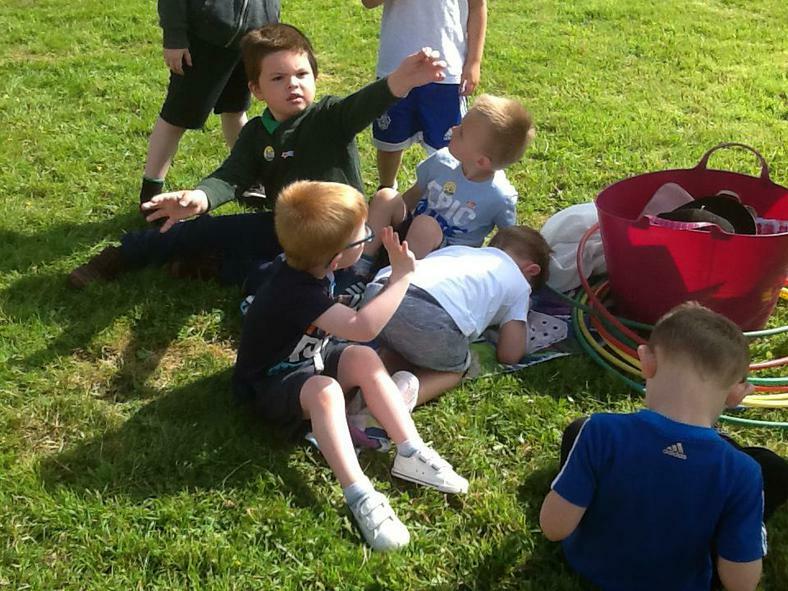 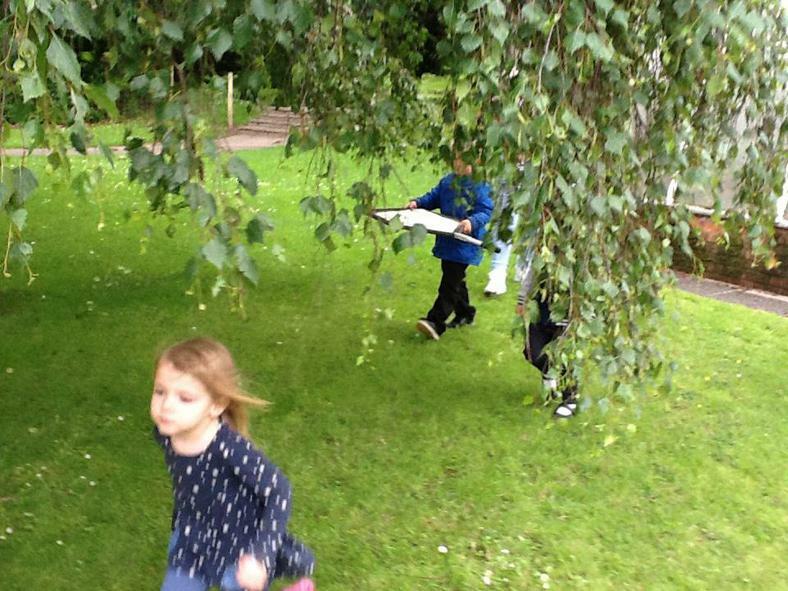 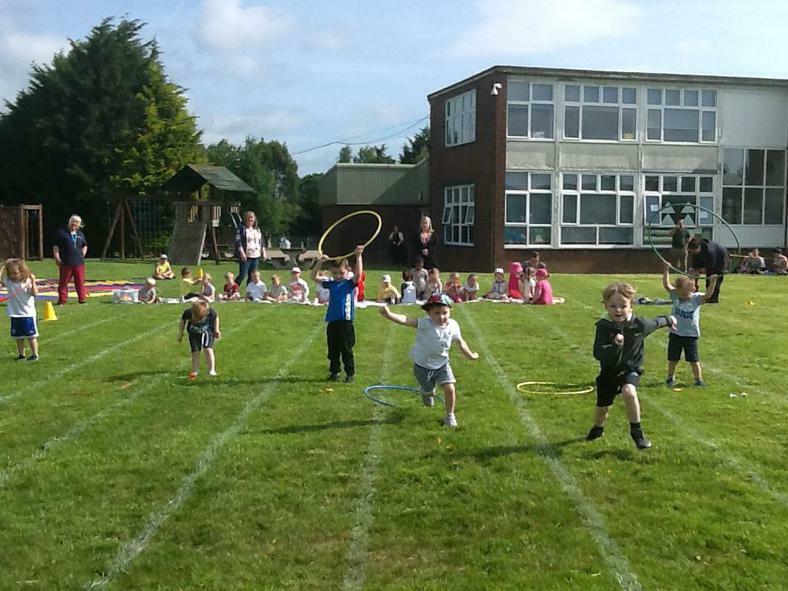 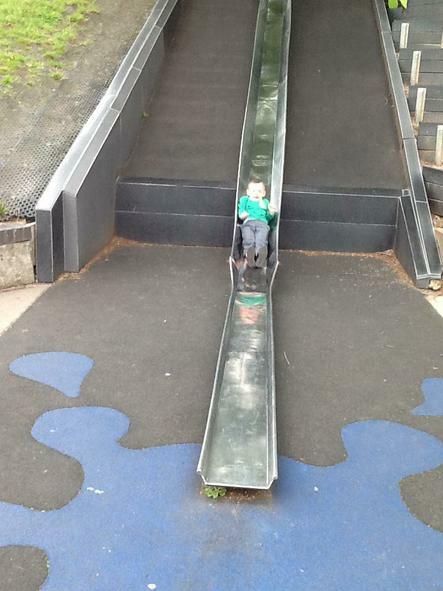 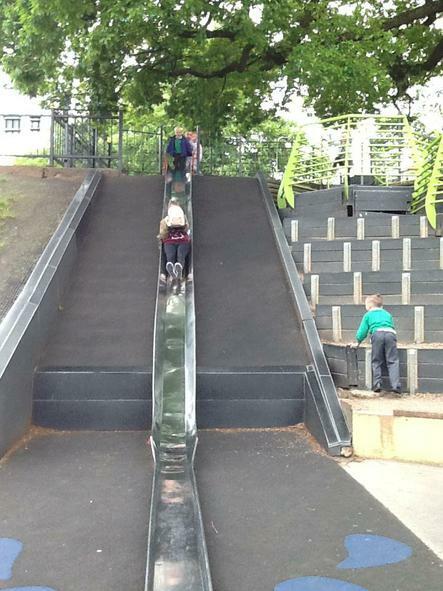 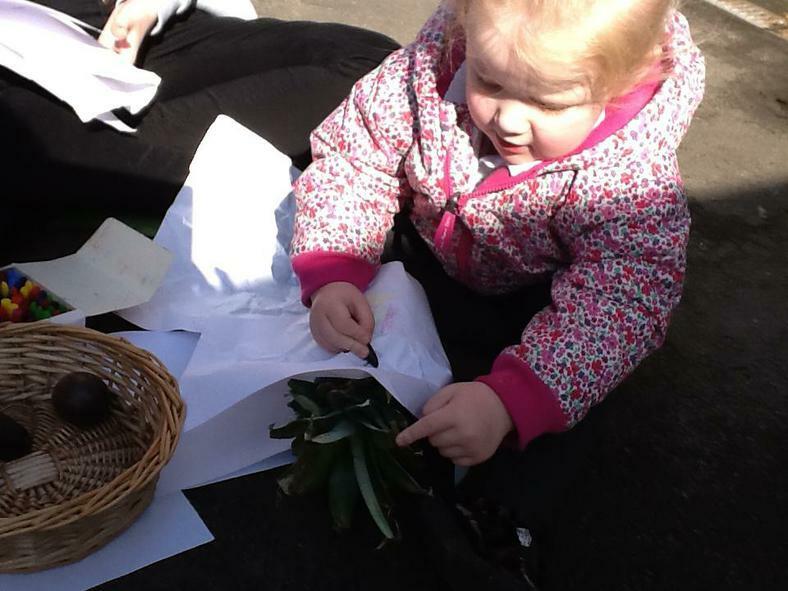 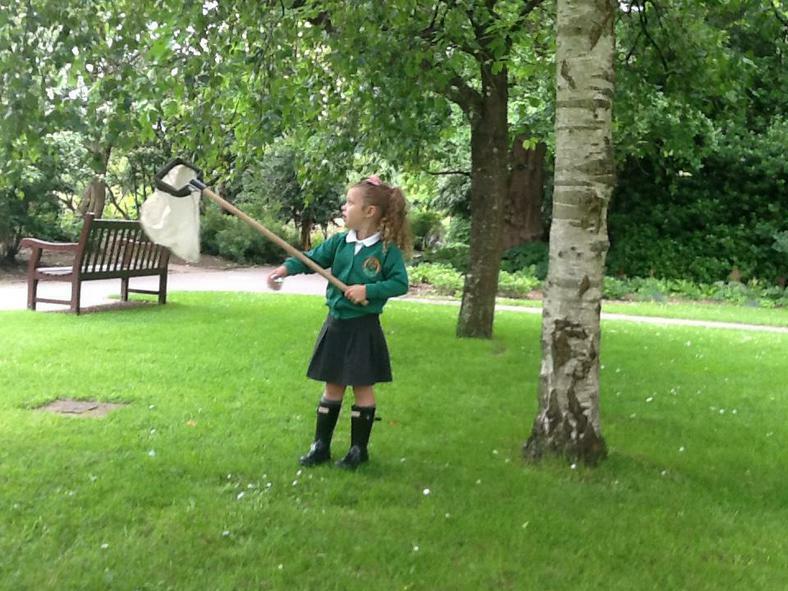 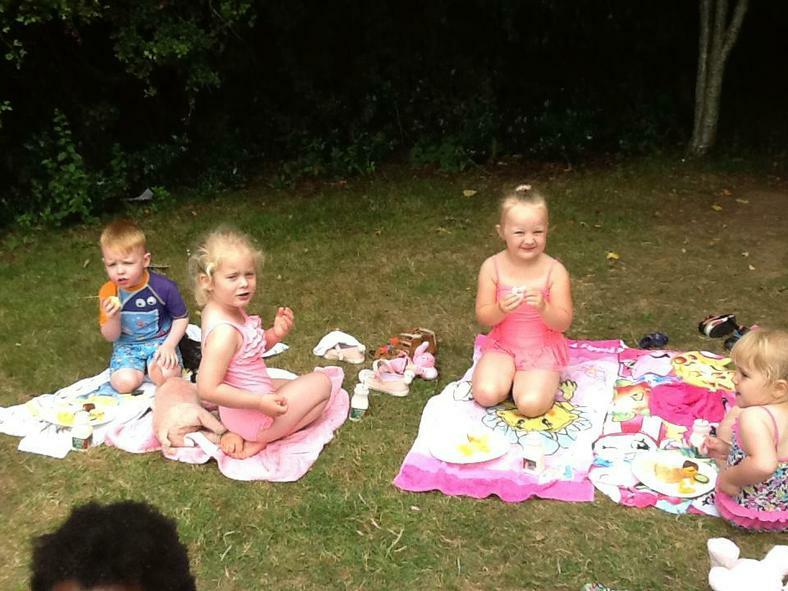 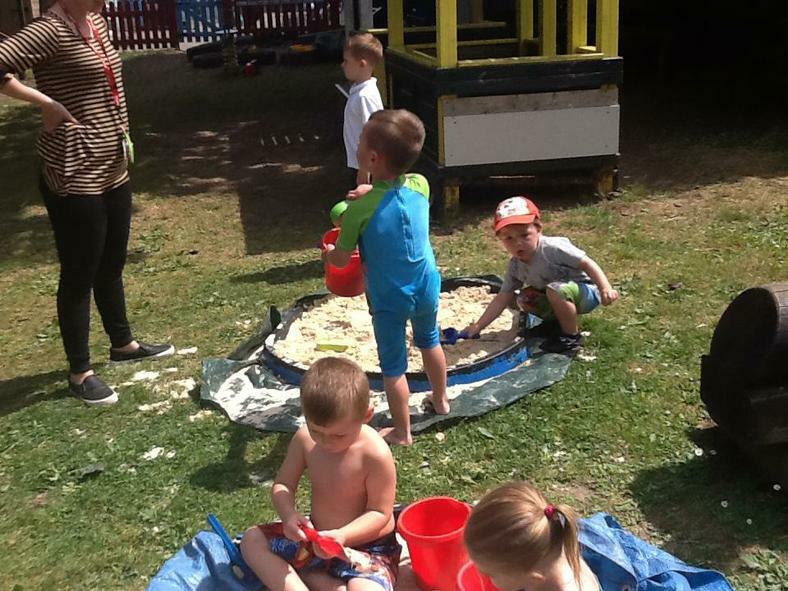 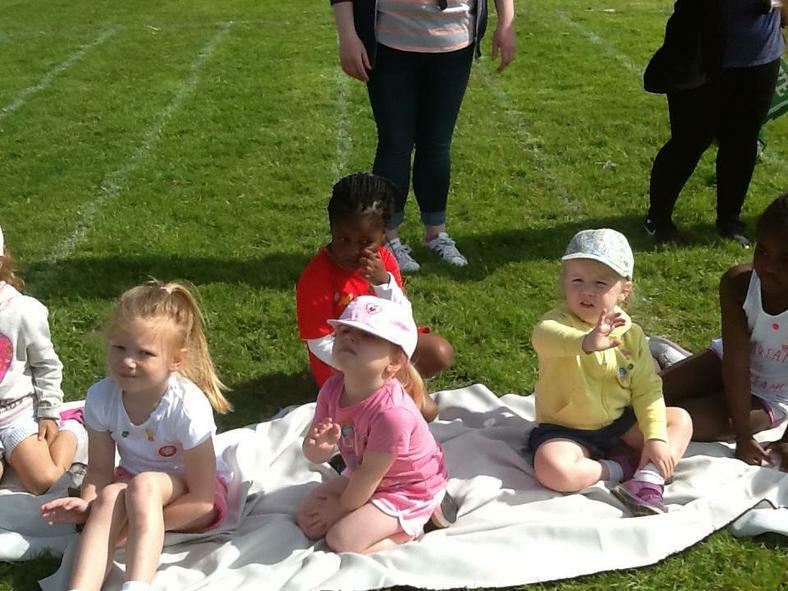 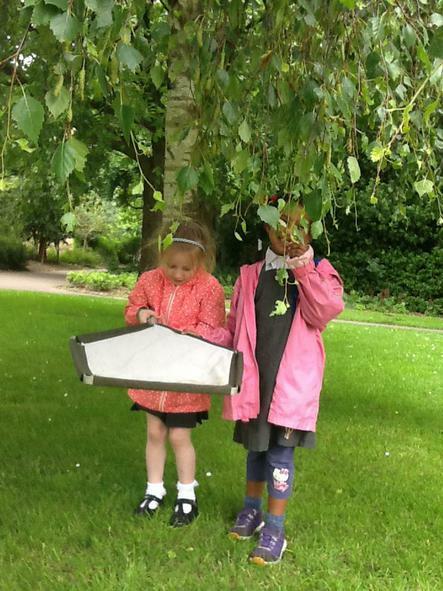 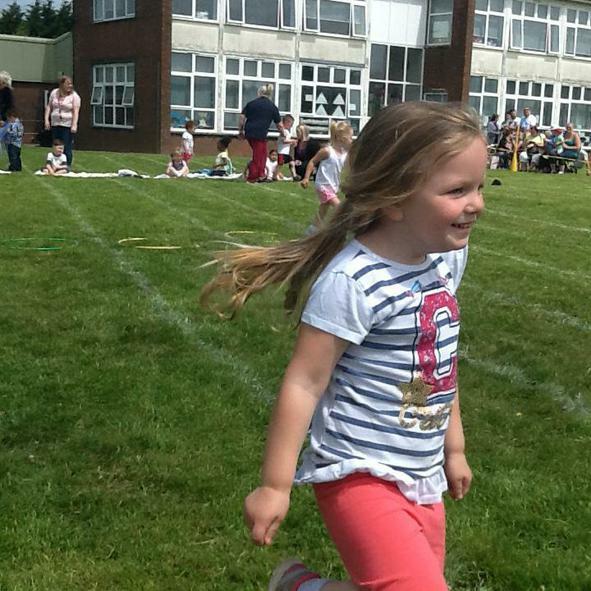 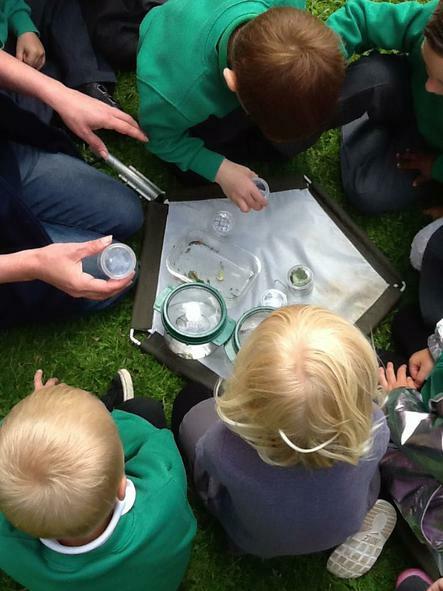 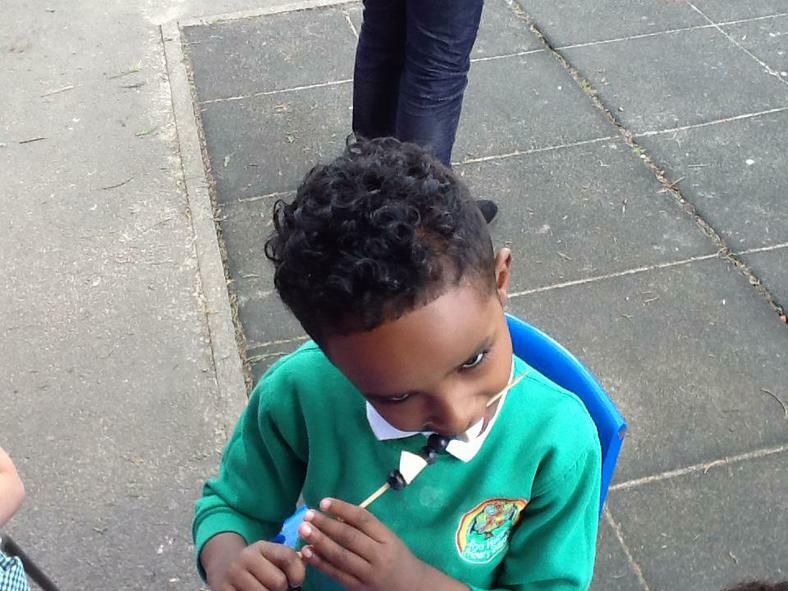 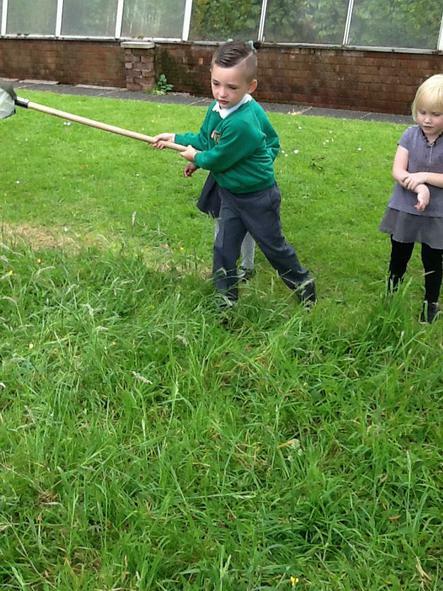 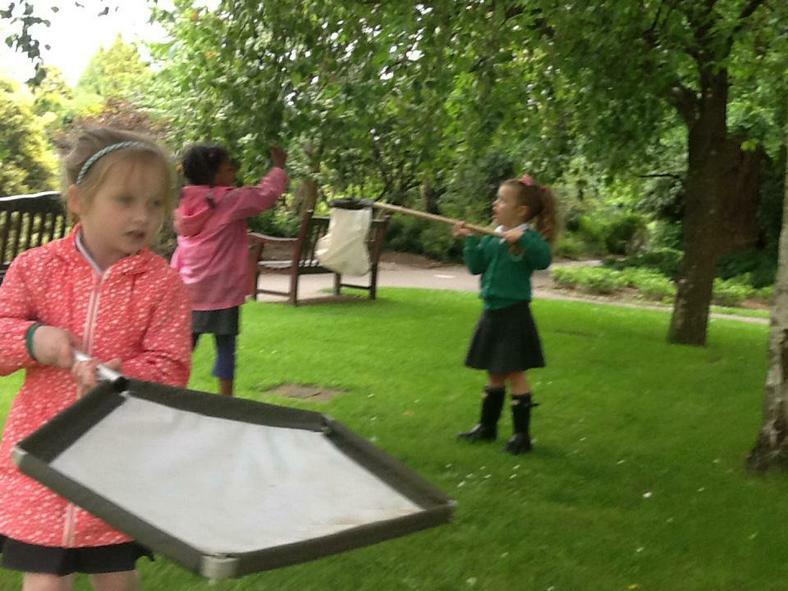 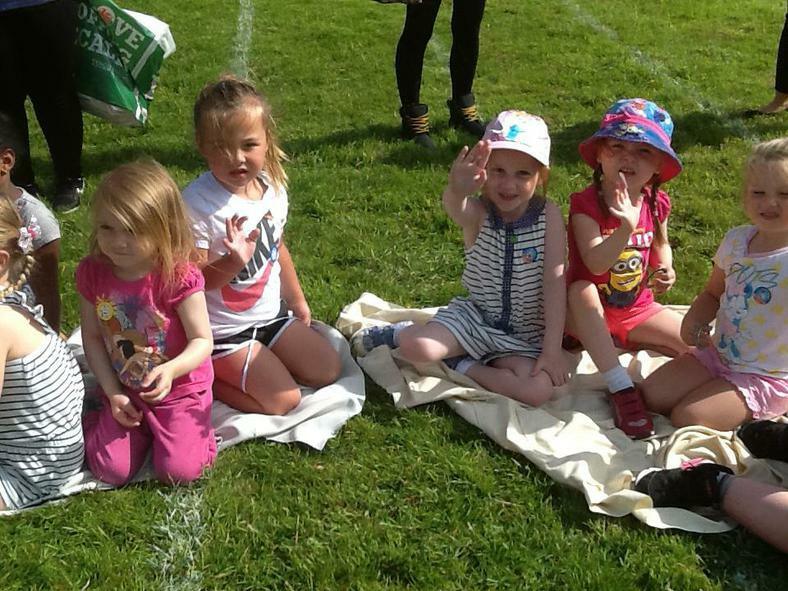 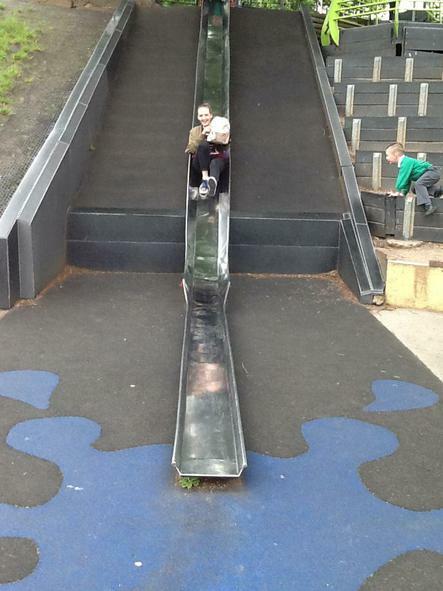 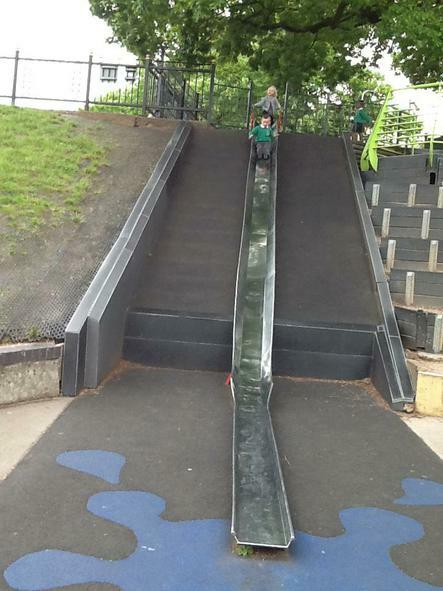 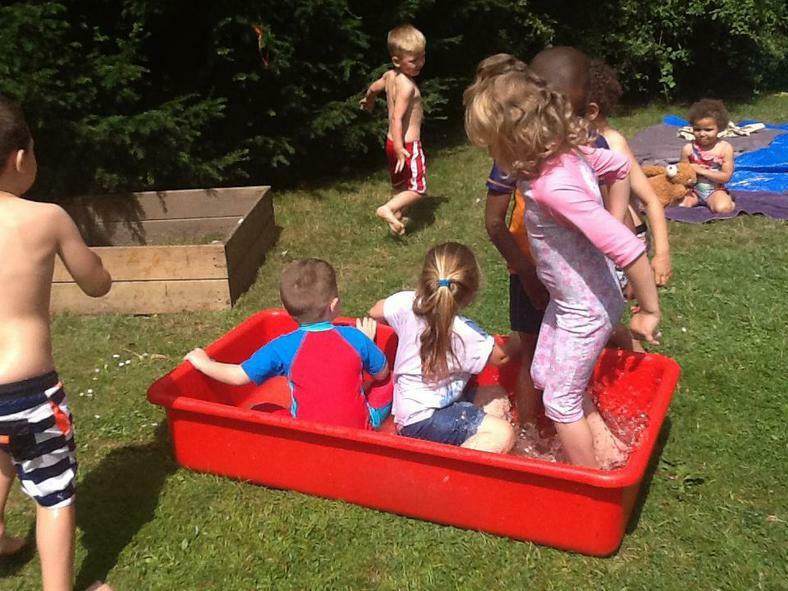 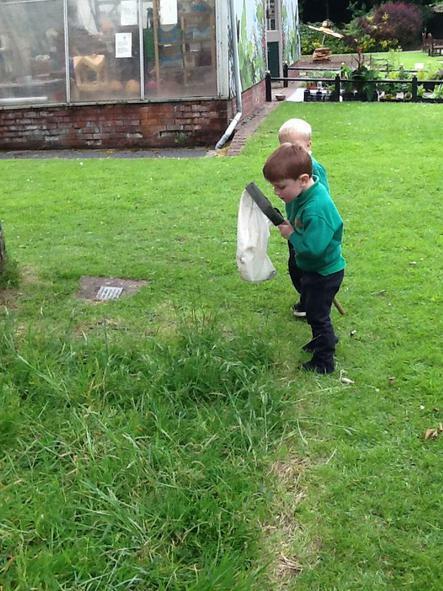 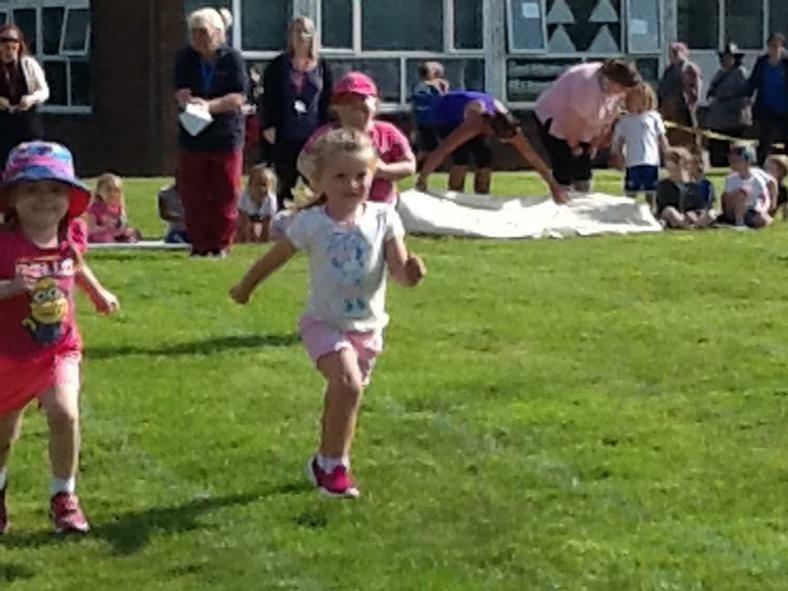 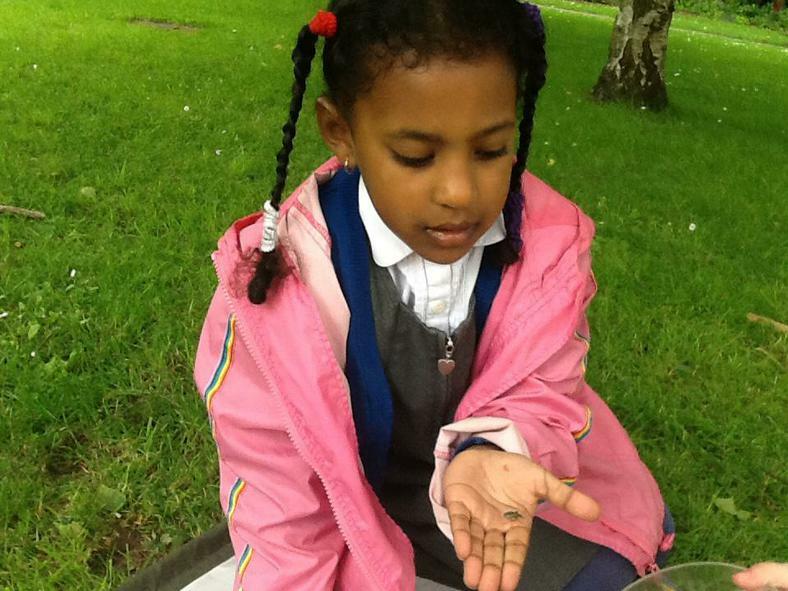 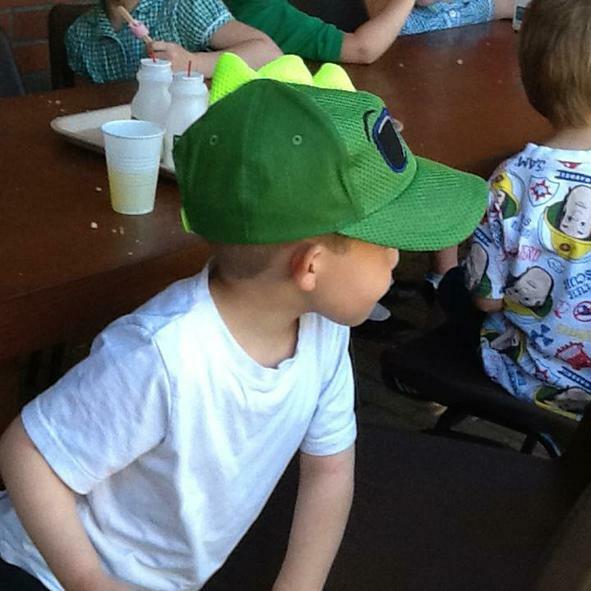 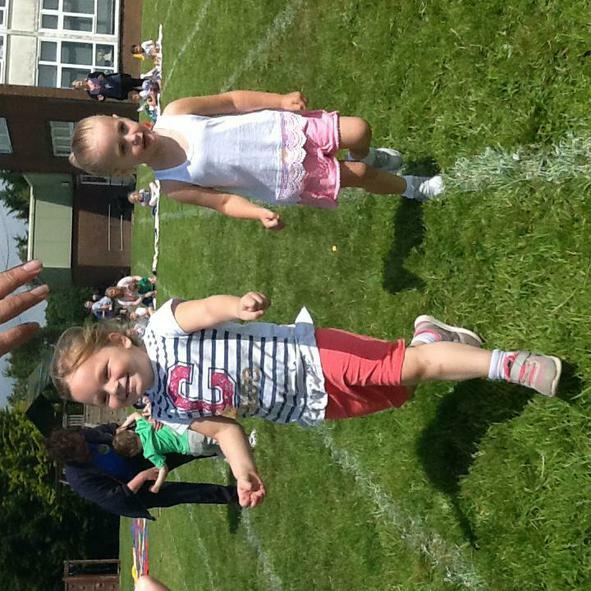 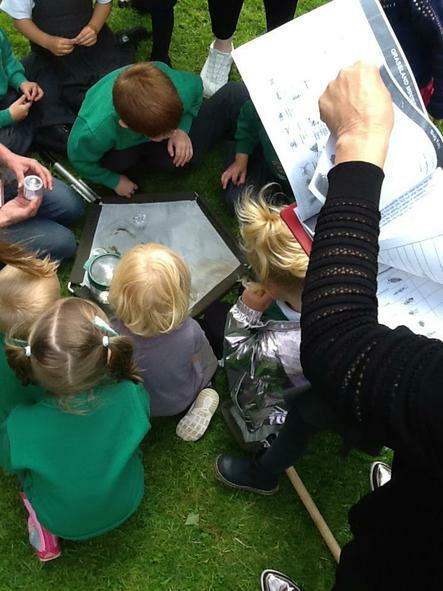 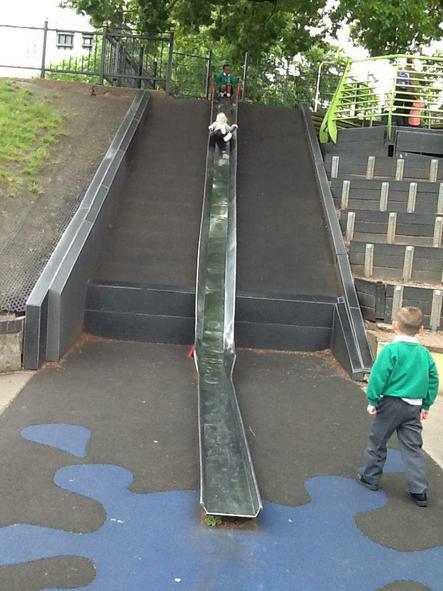 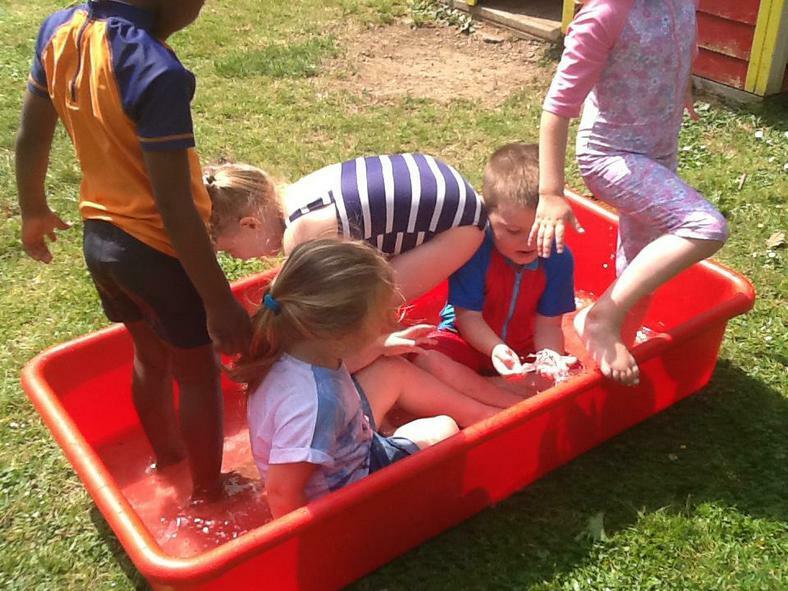 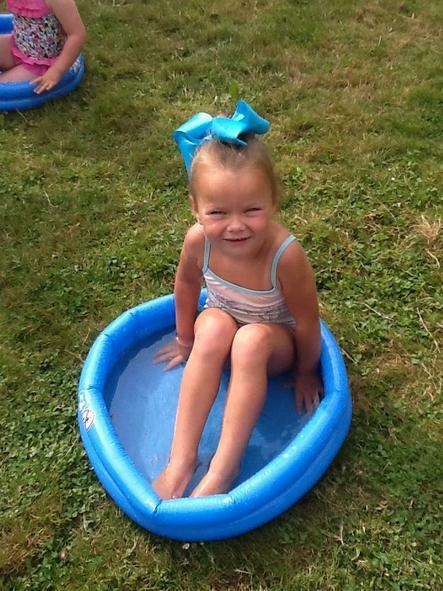 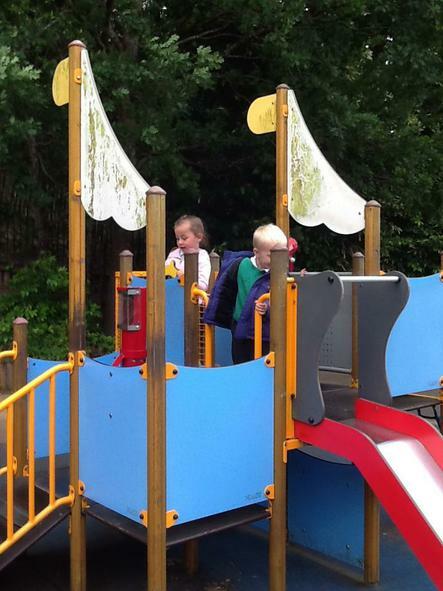 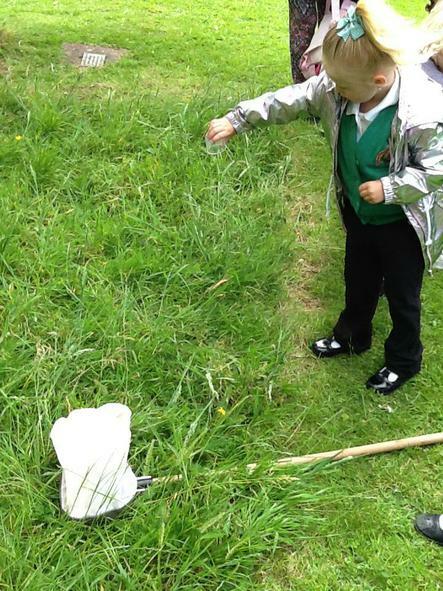 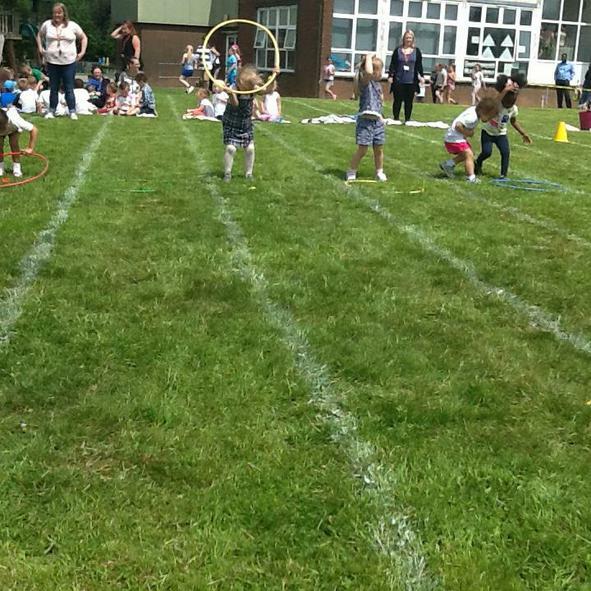 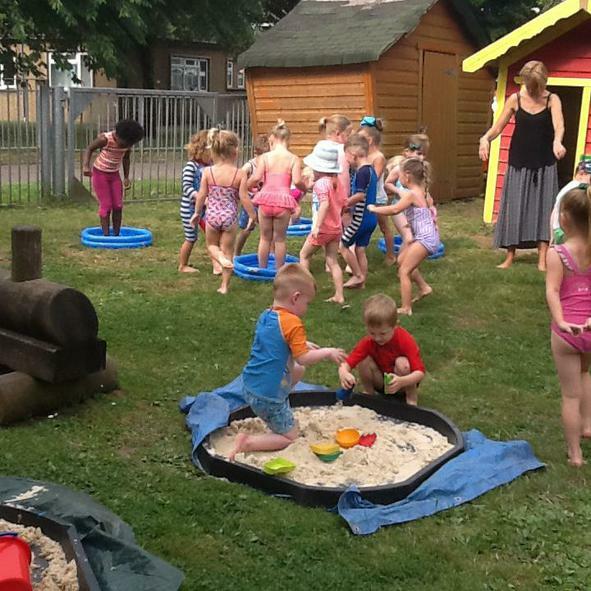 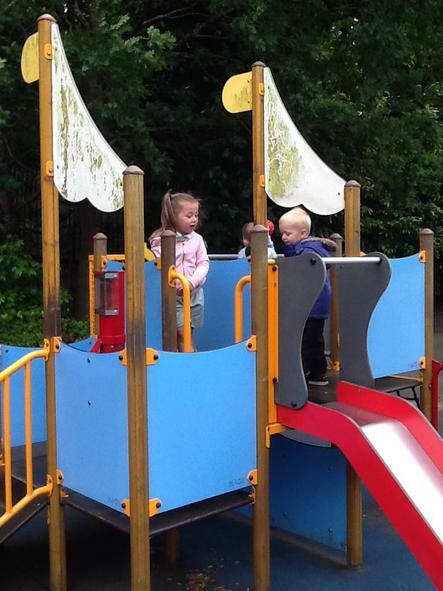 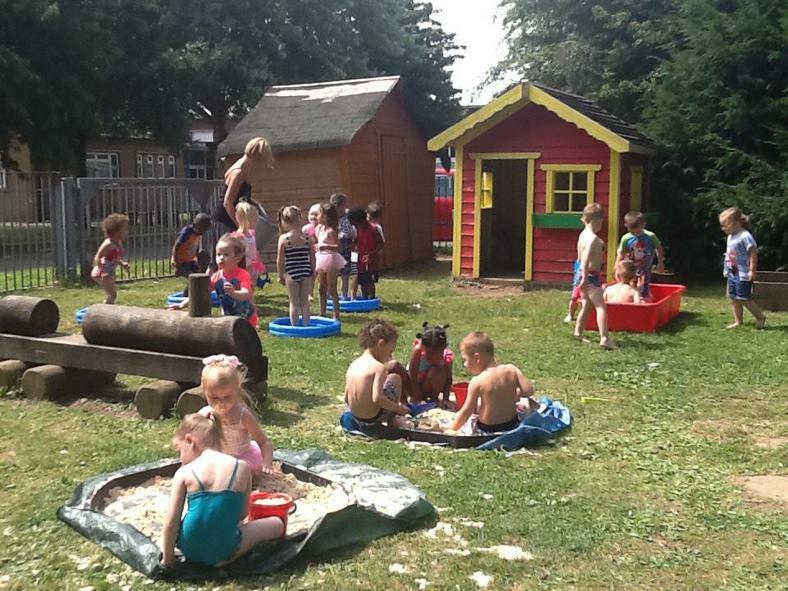 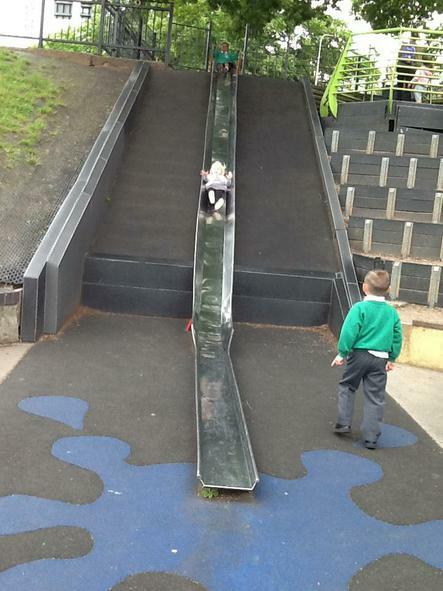 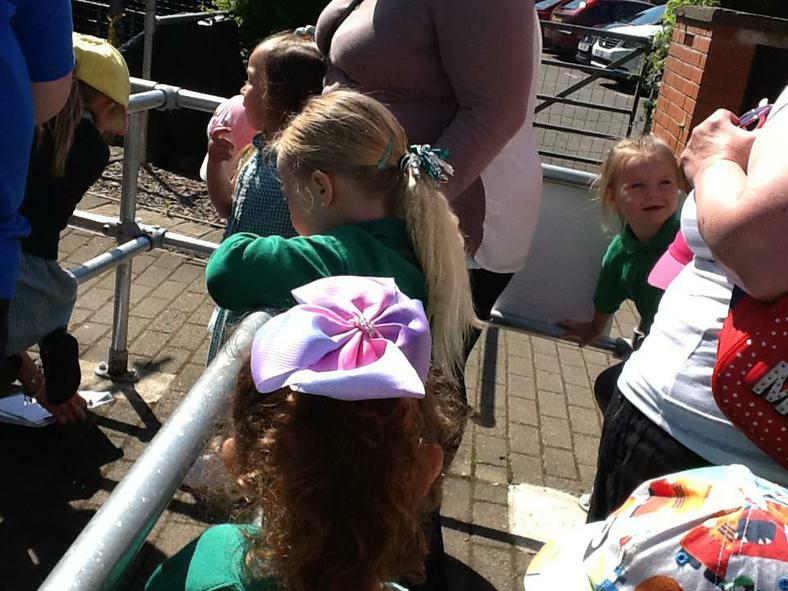 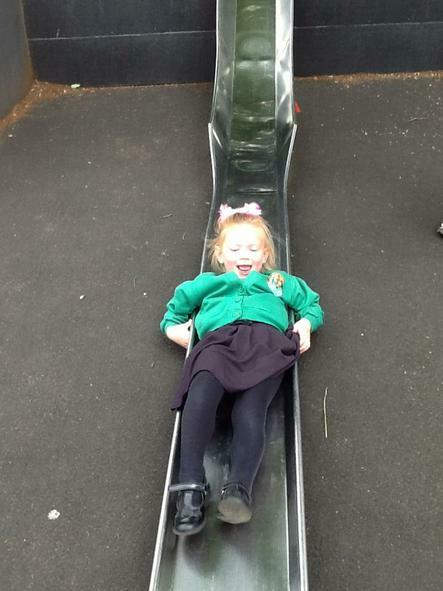 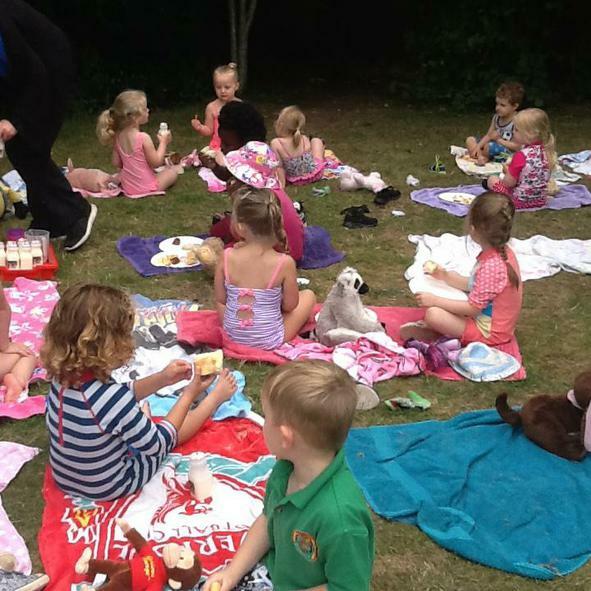 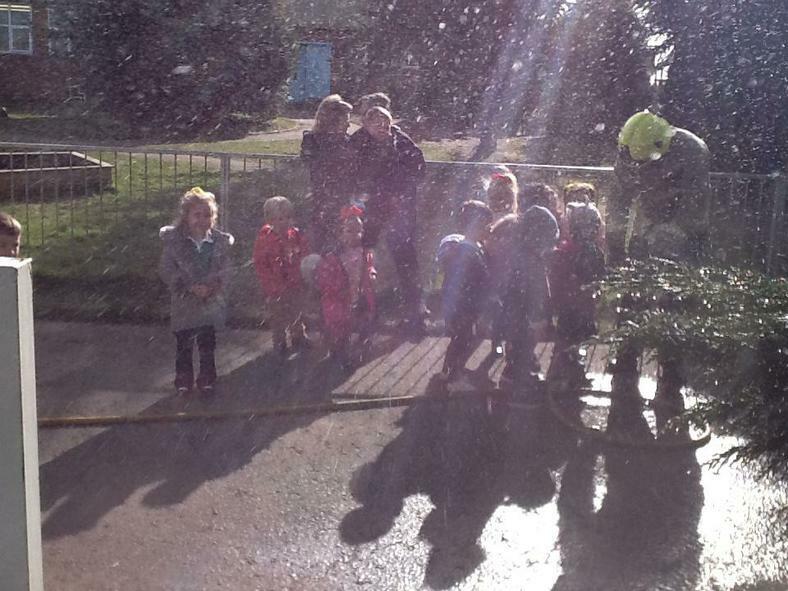 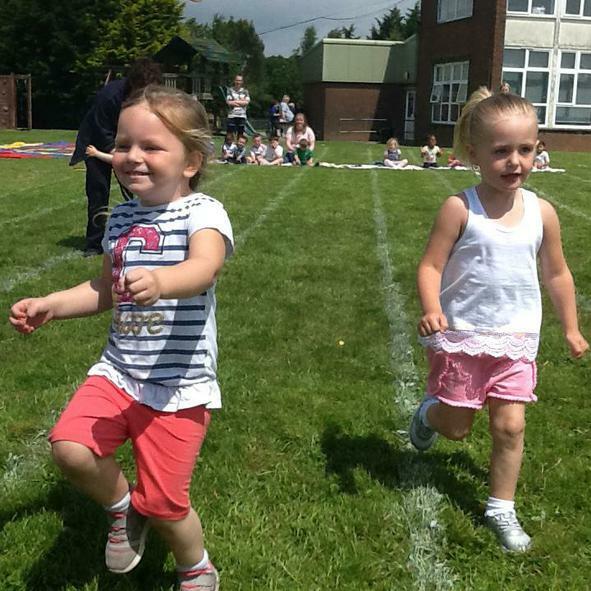 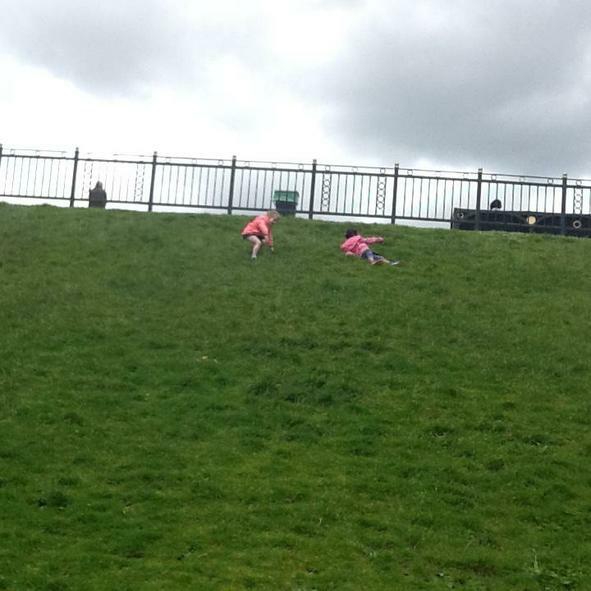 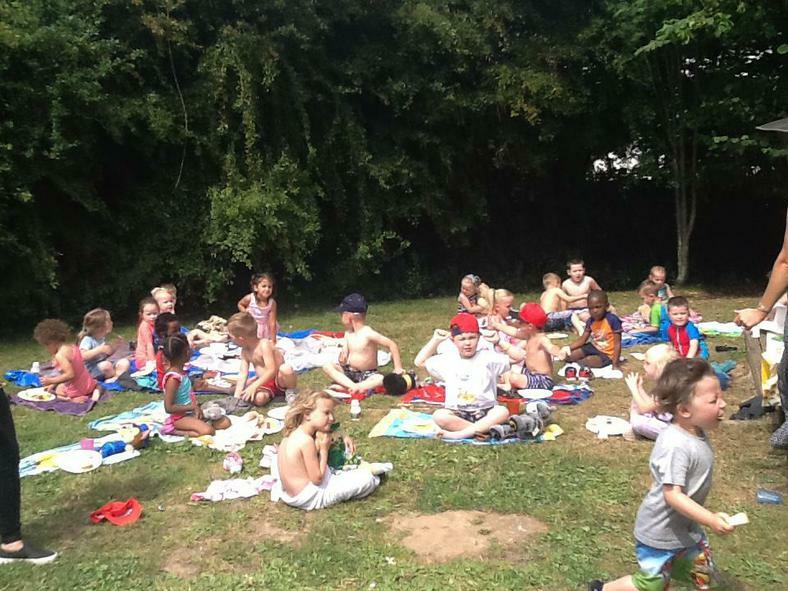 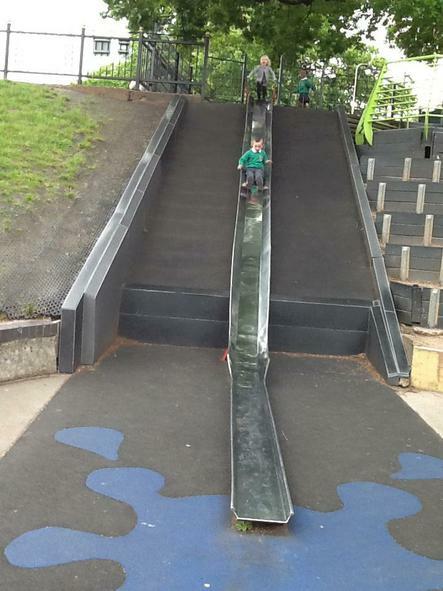 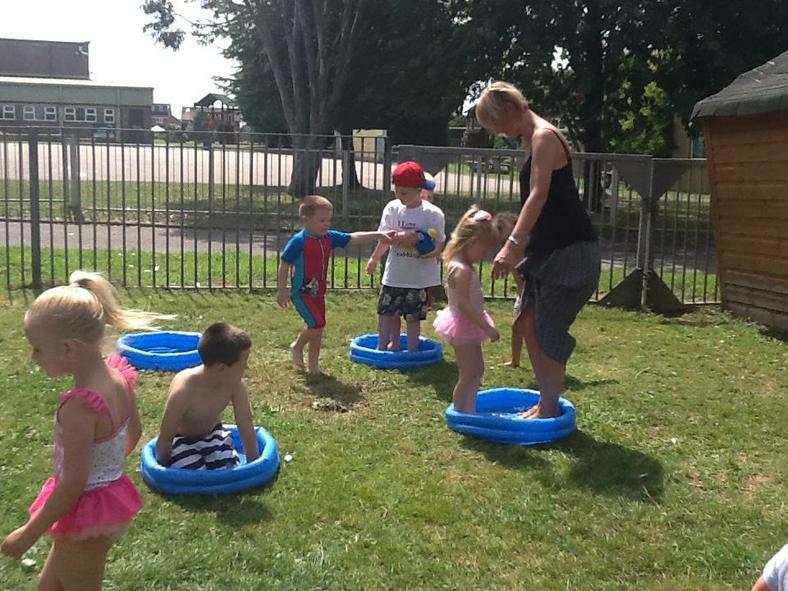 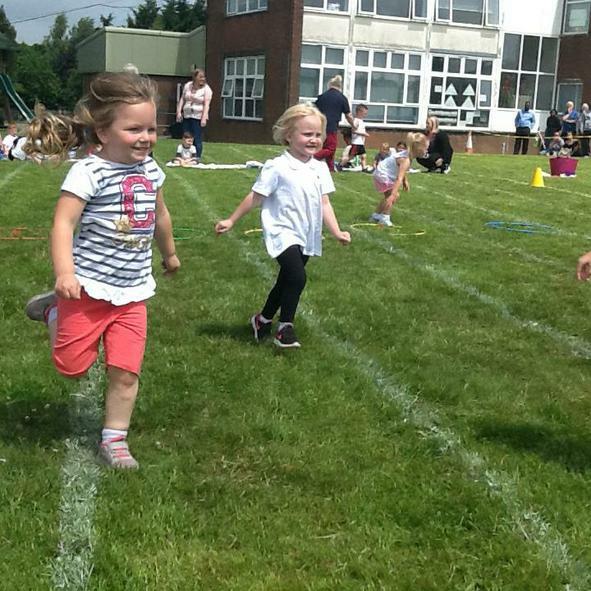 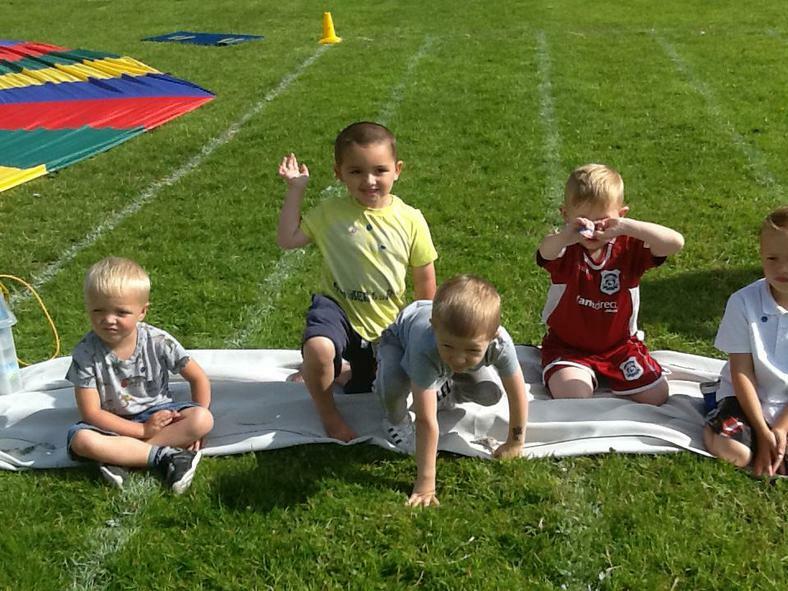 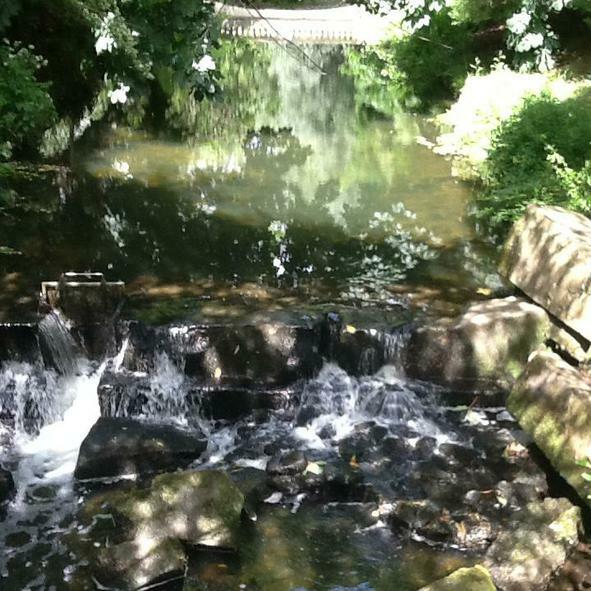 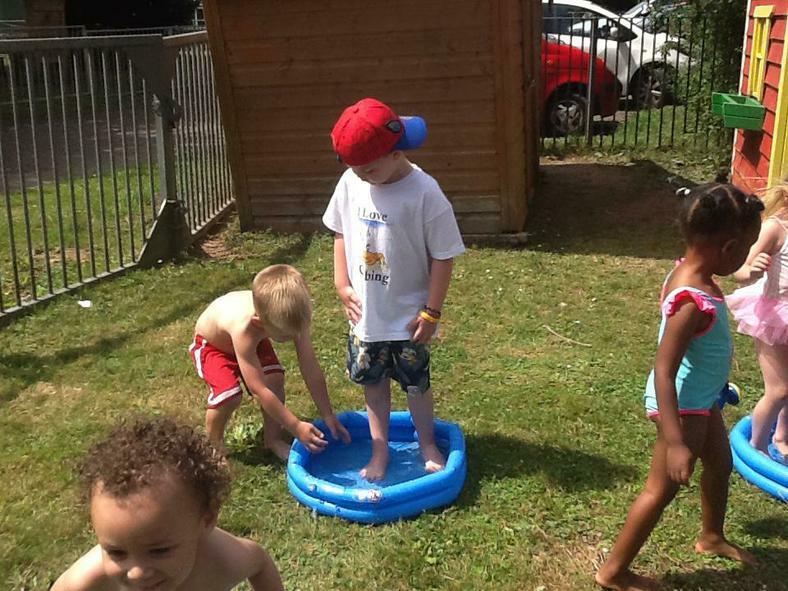 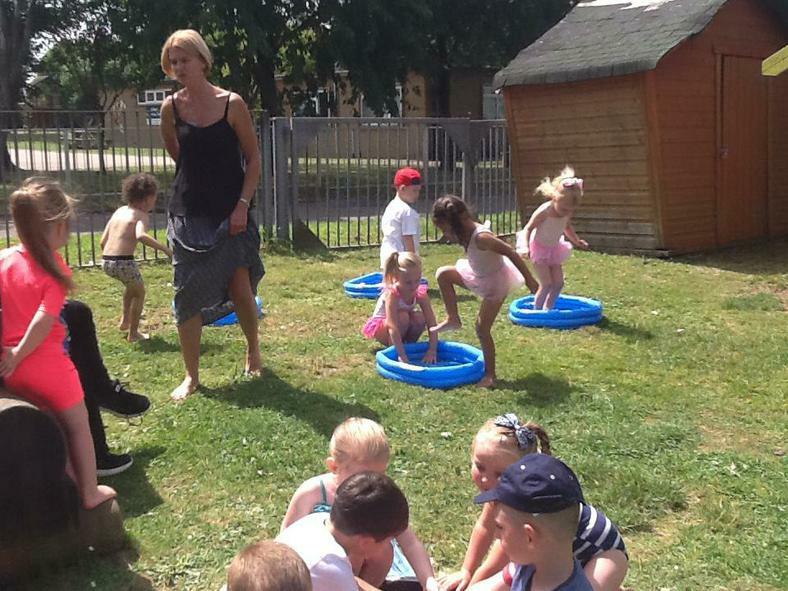 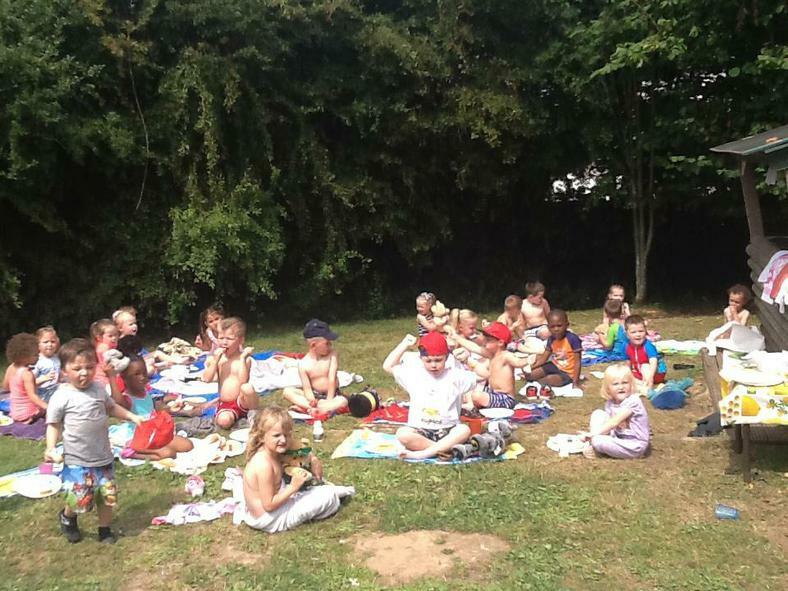 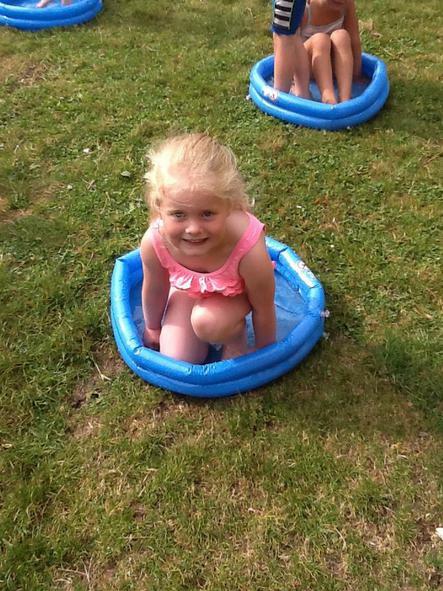 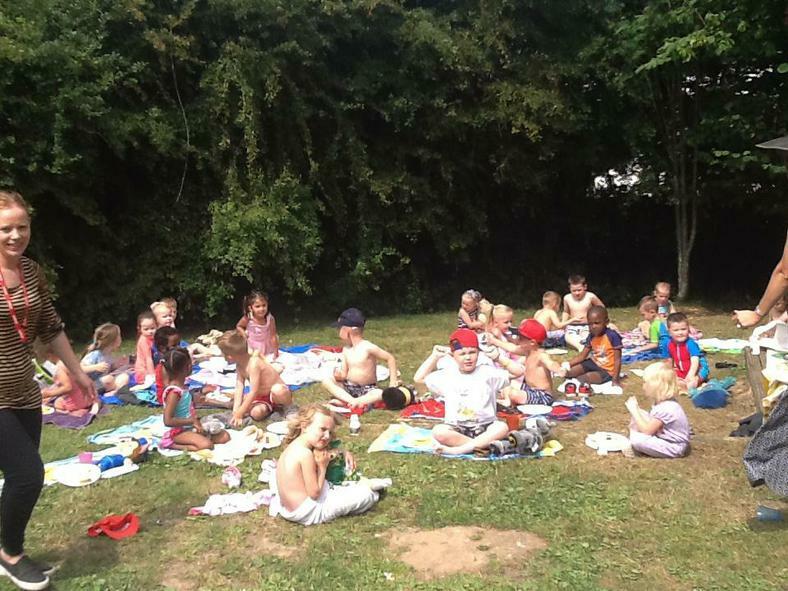 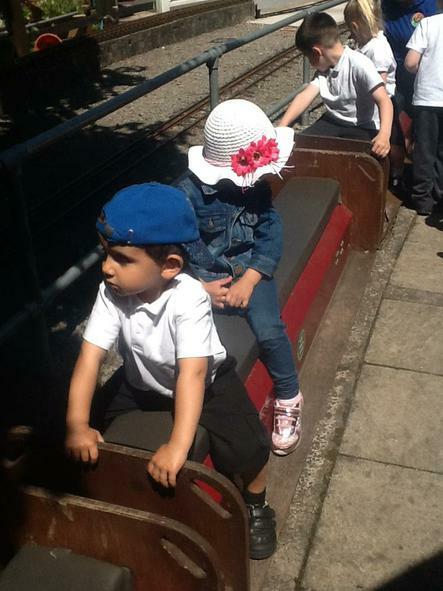 The children have had lots of outdoor opportunities this week thanks to the glorious sunshine. 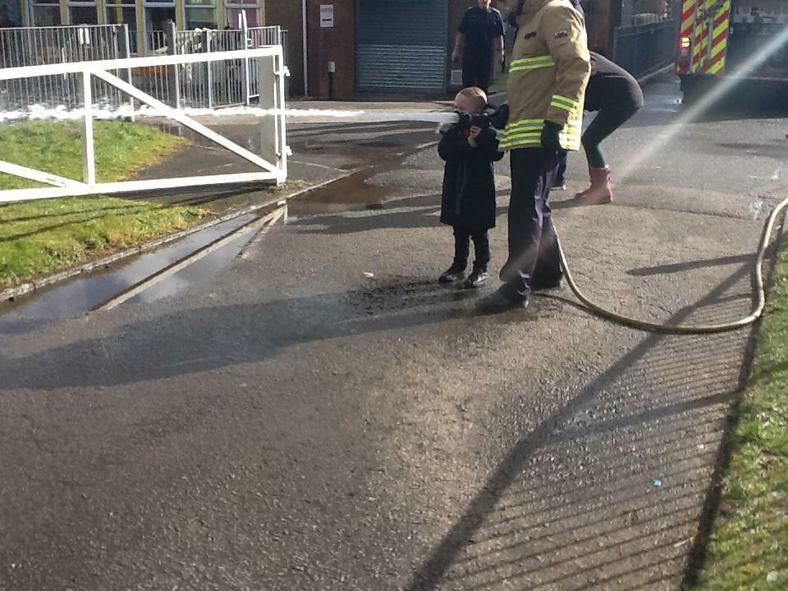 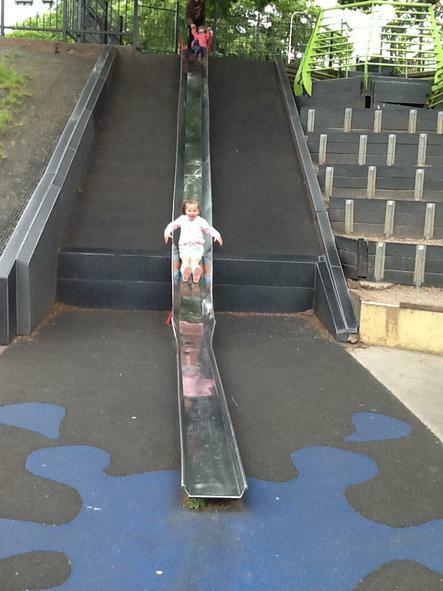 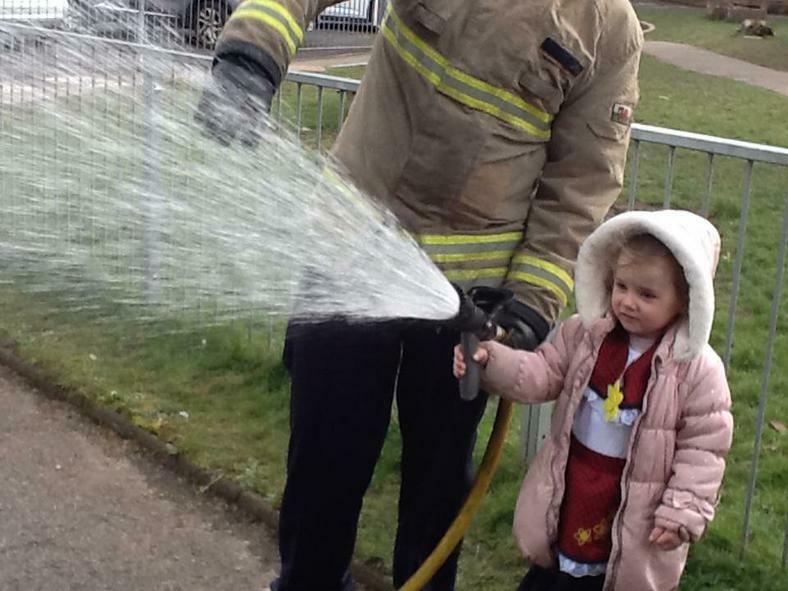 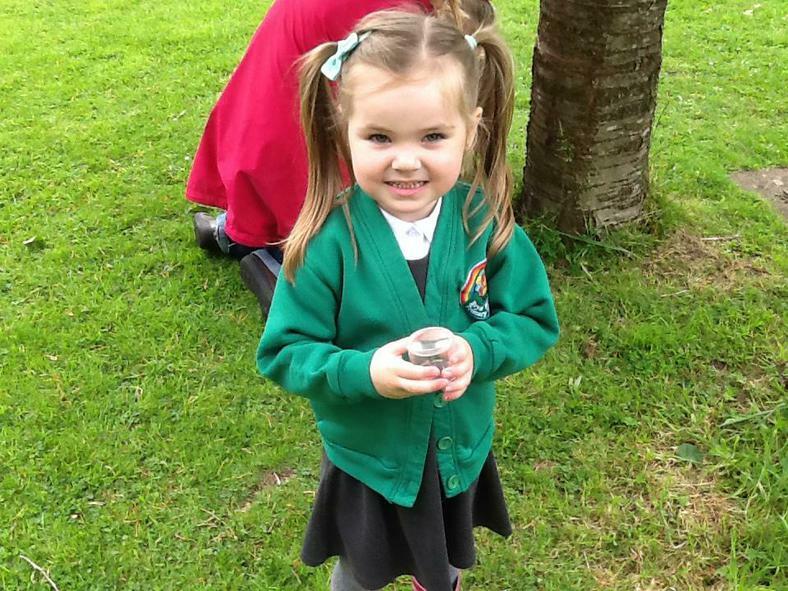 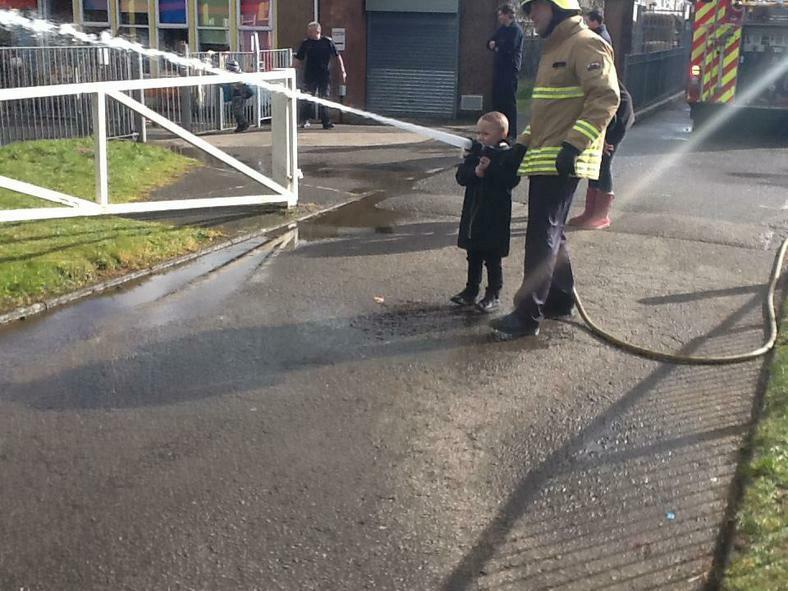 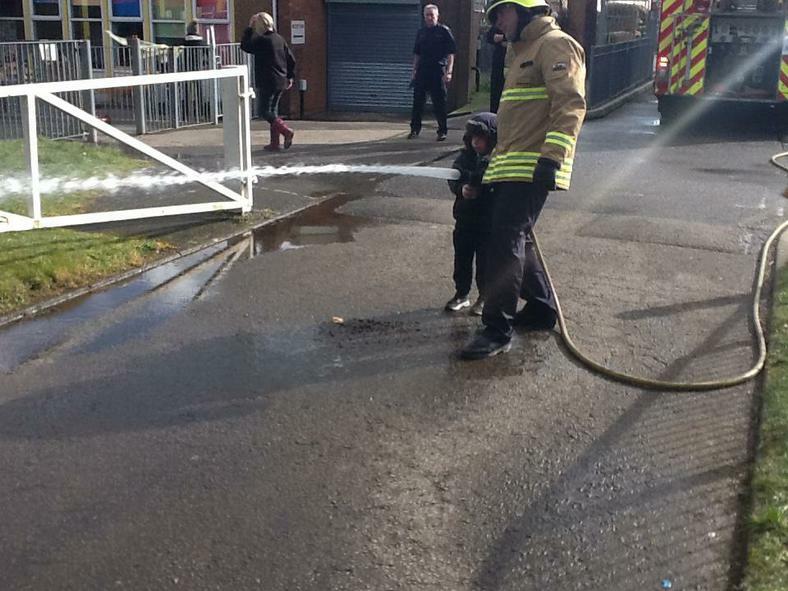 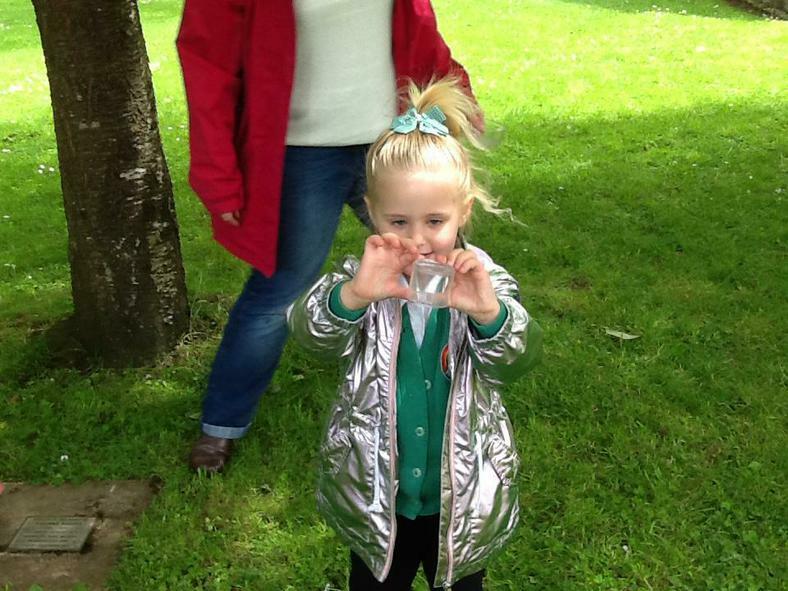 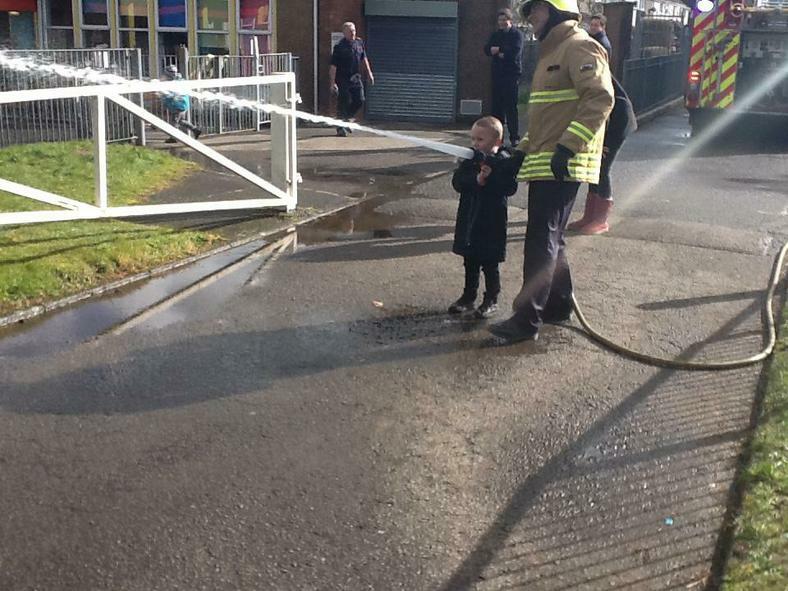 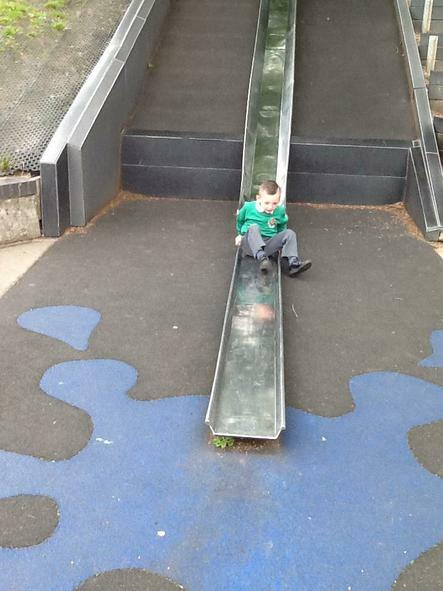 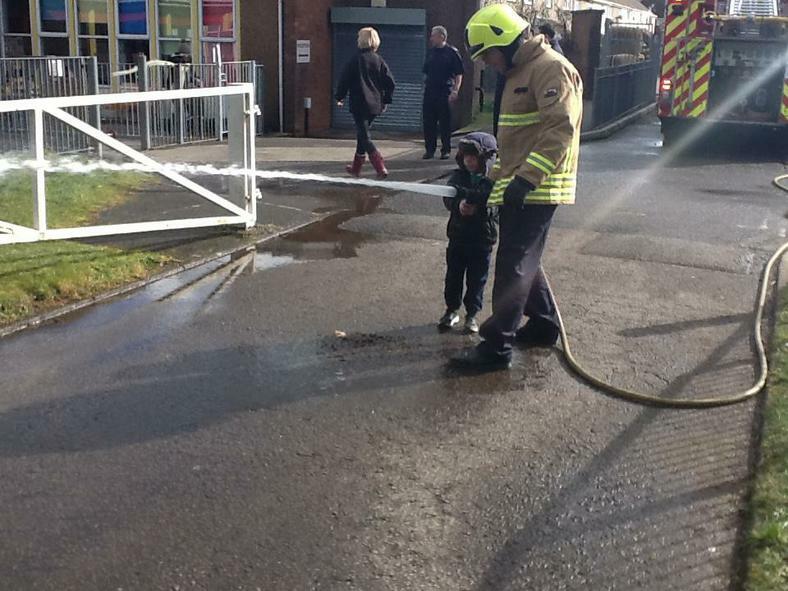 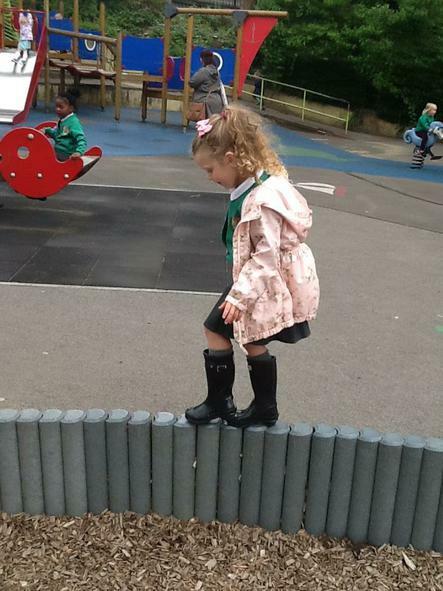 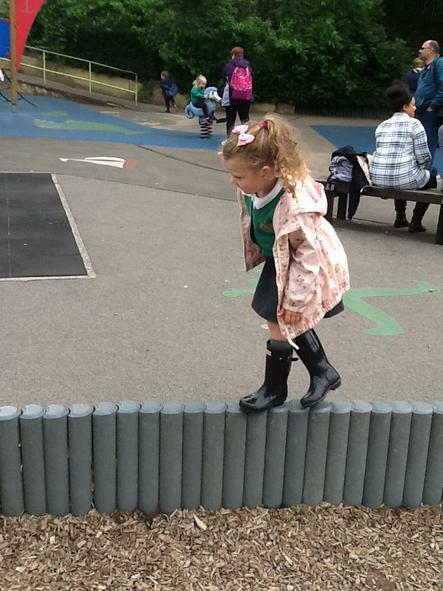 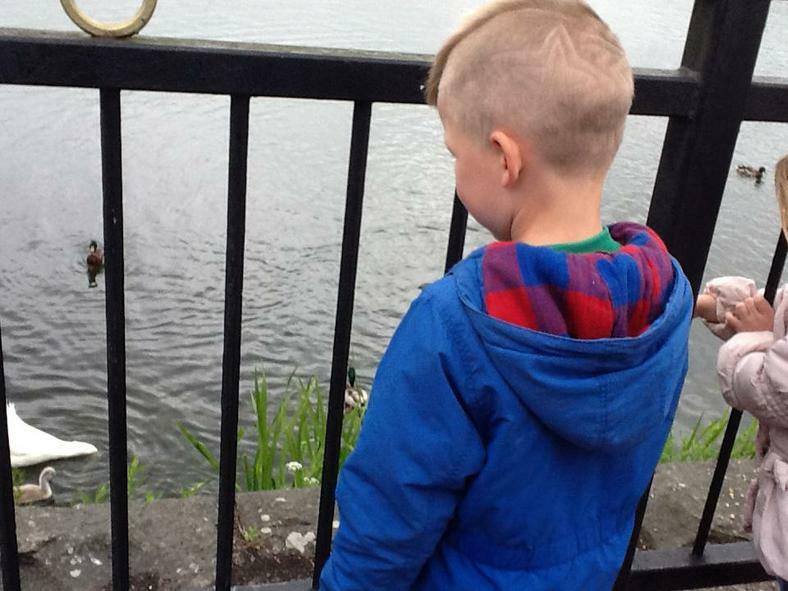 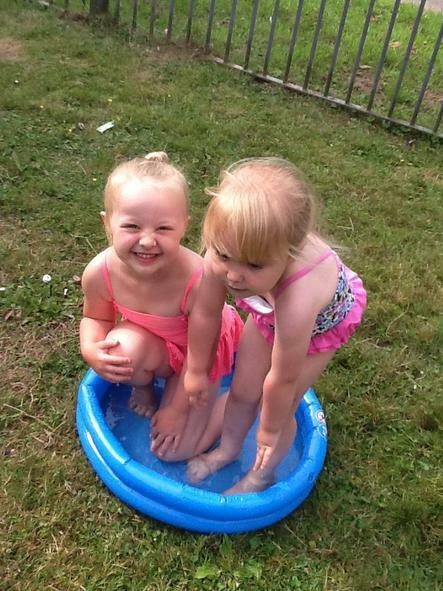 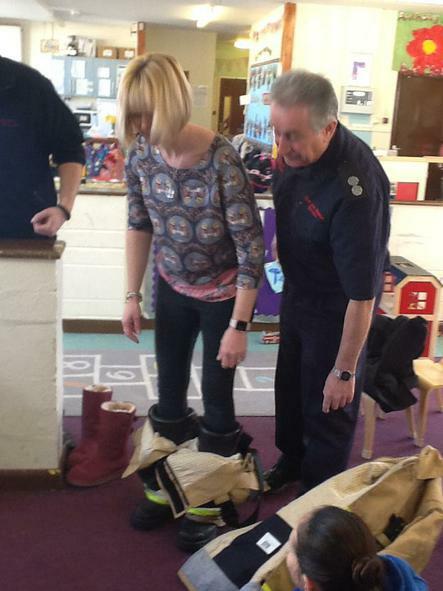 Please ensure that your child has suitable clothing for the weather, including sensible footwear. 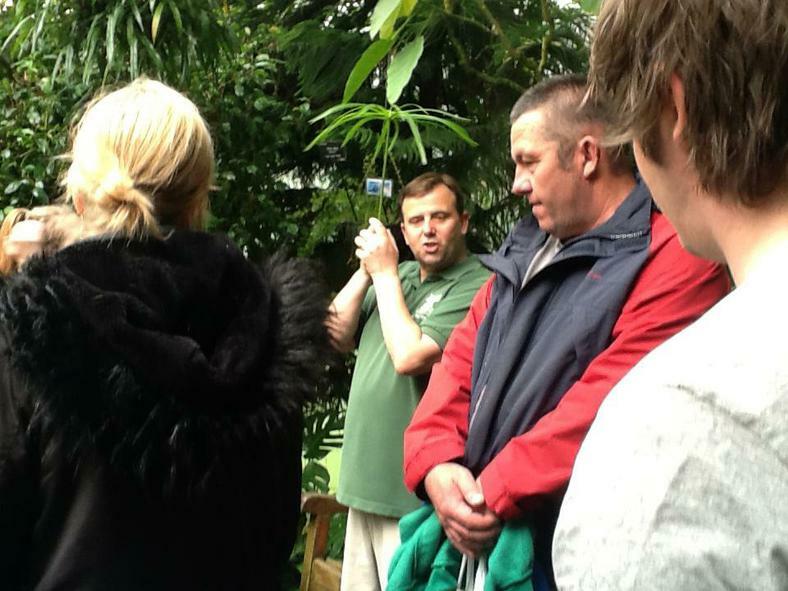 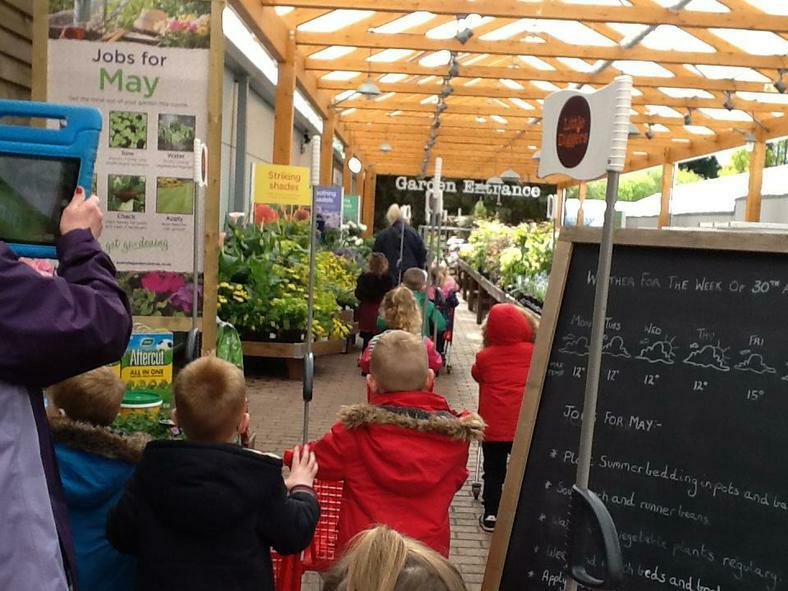 On Wednesday 2nd May we had our first of six trips to the Wyevale Garden Centre, thanks to Jan and Claire for being awesome helpers. 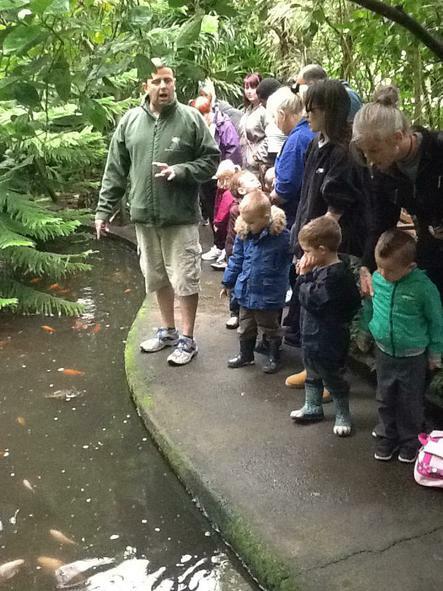 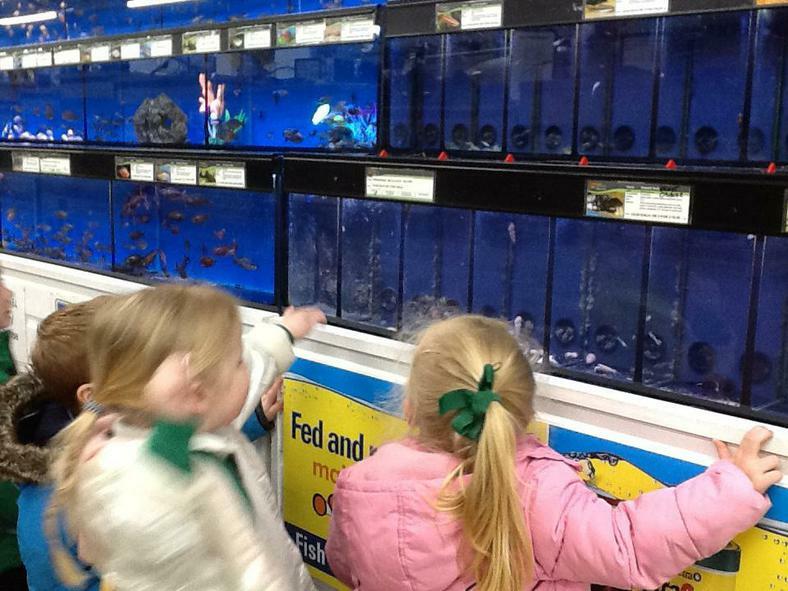 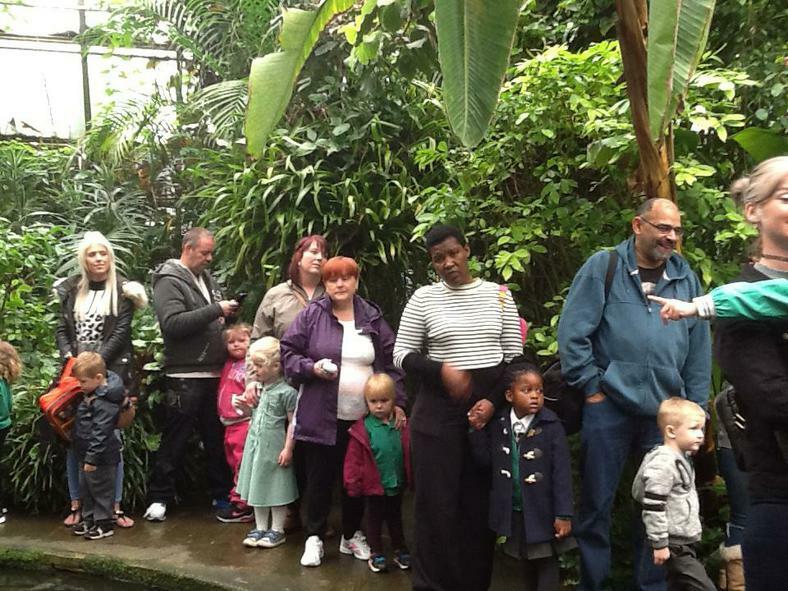 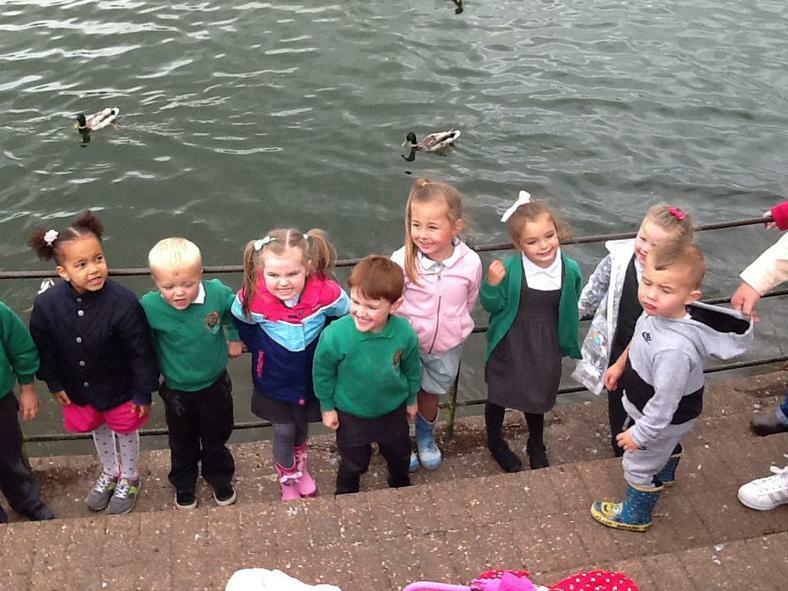 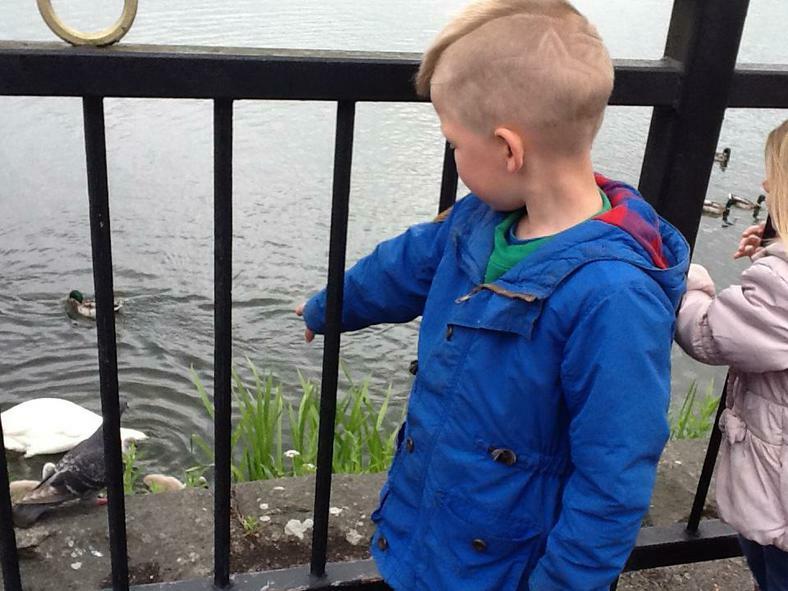 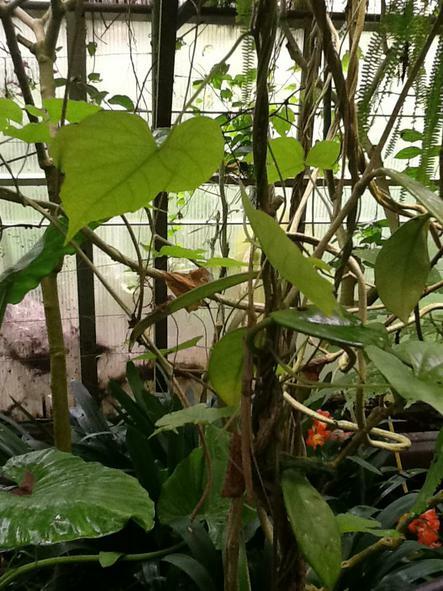 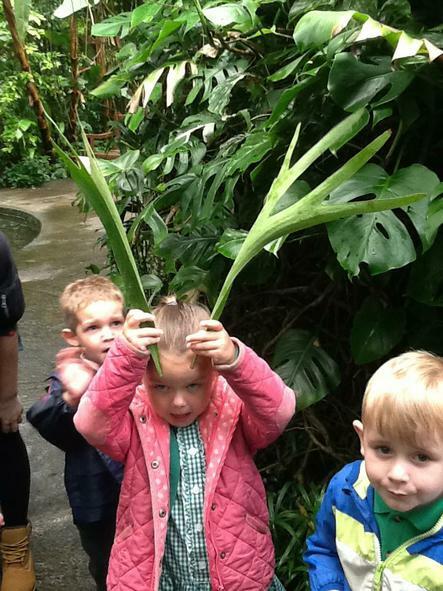 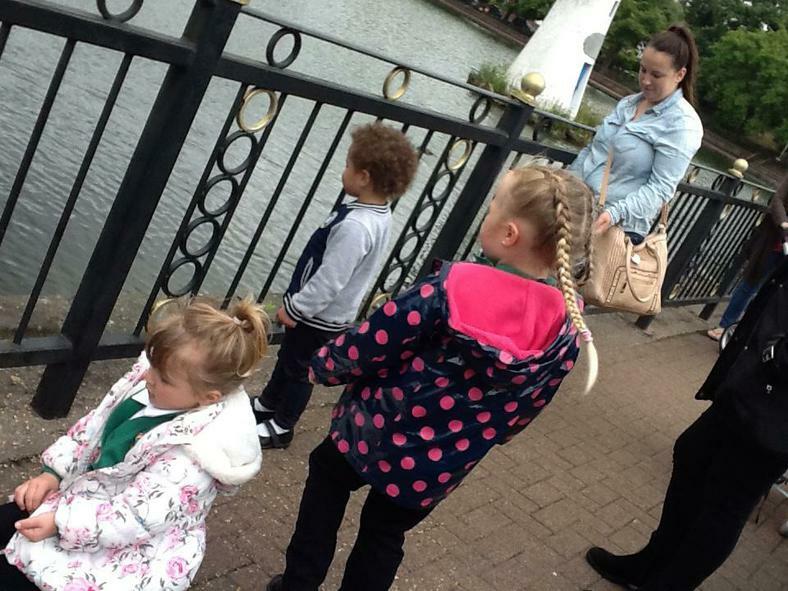 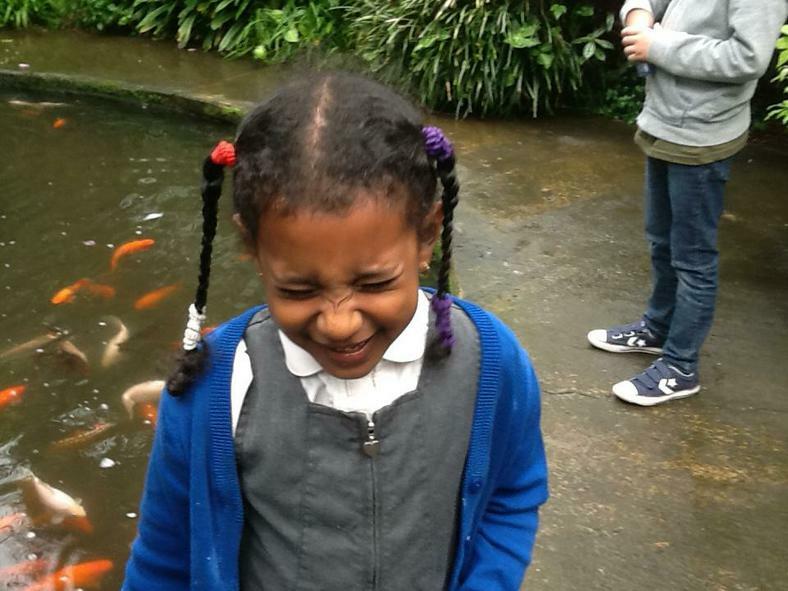 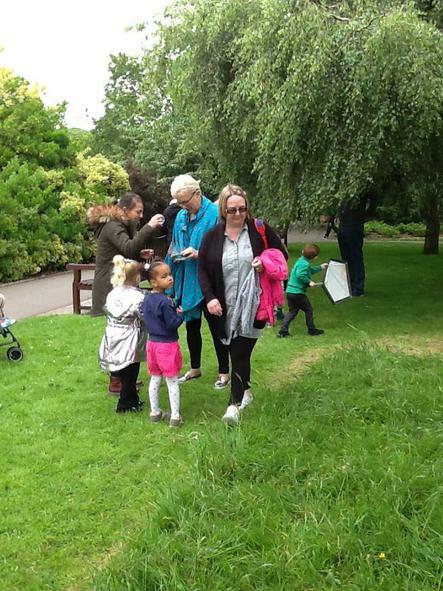 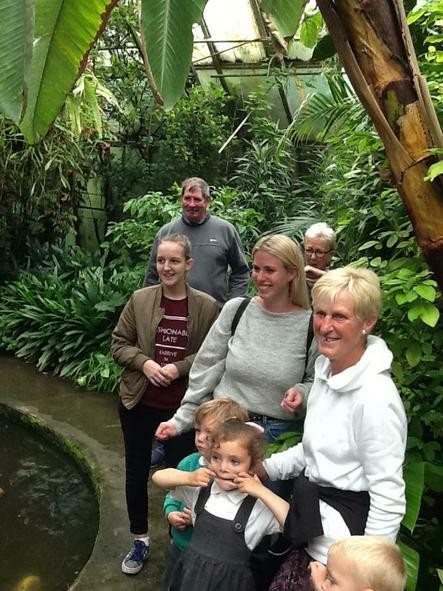 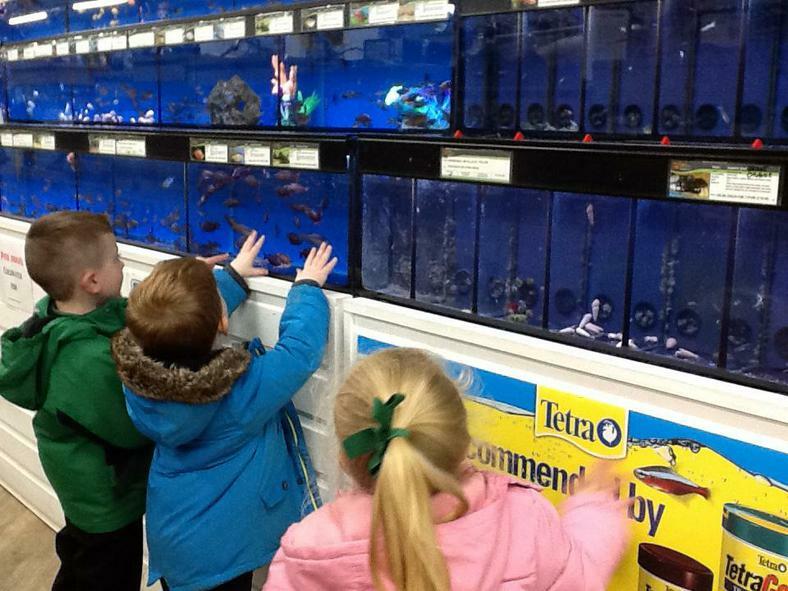 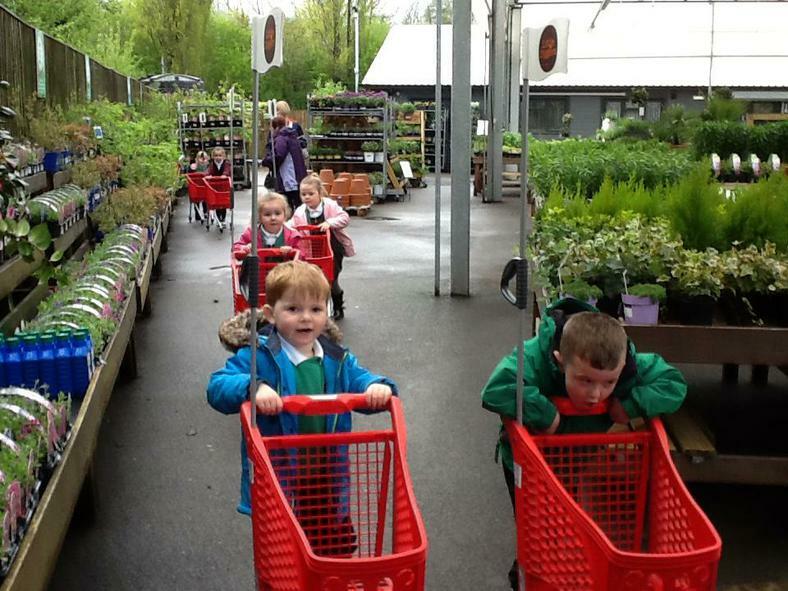 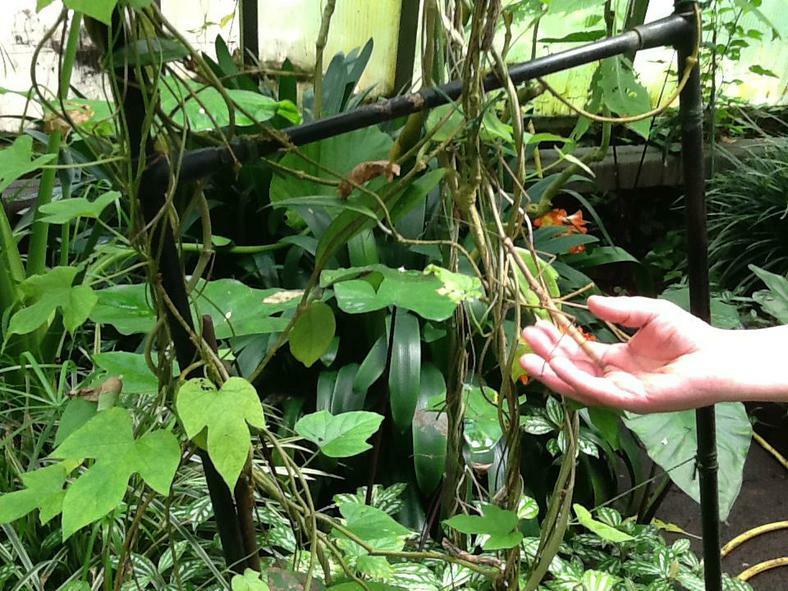 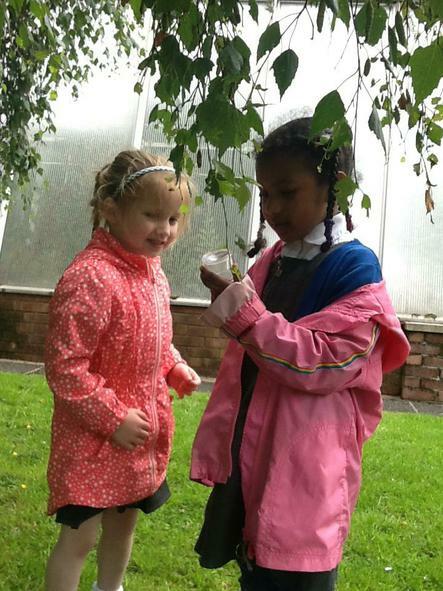 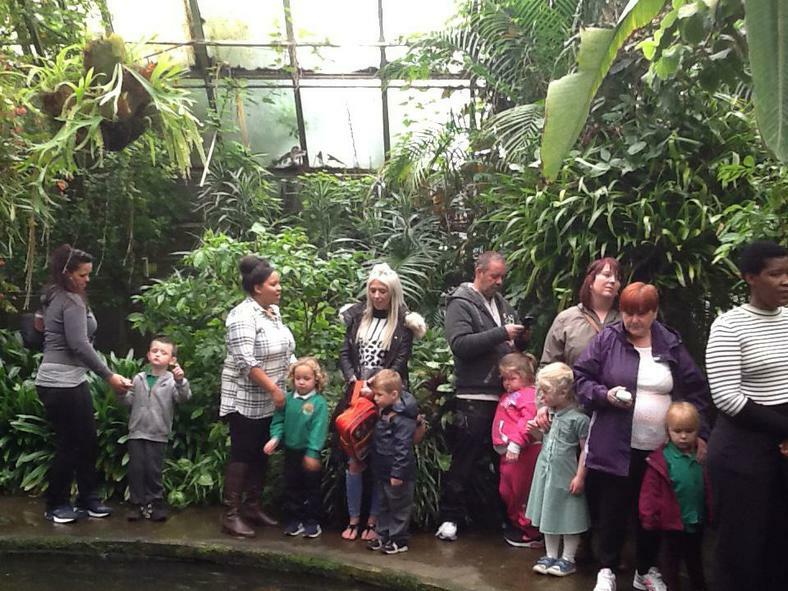 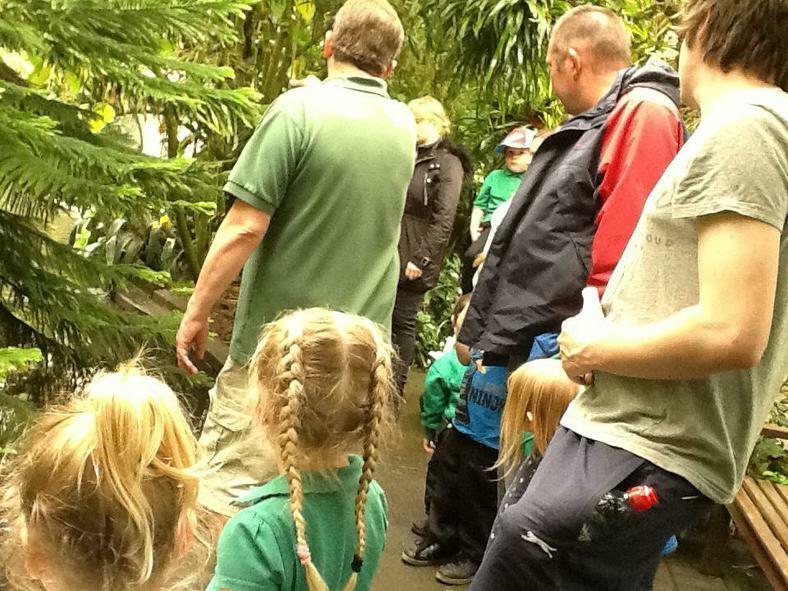 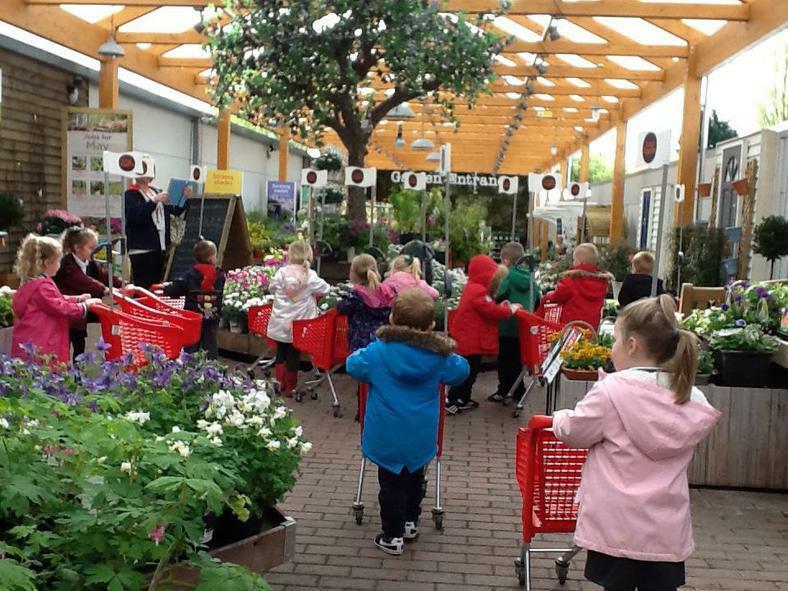 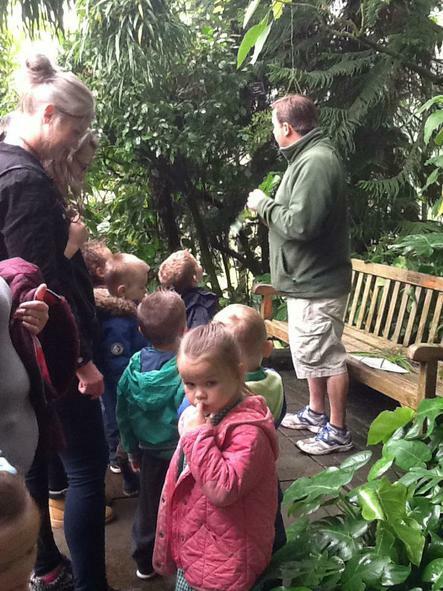 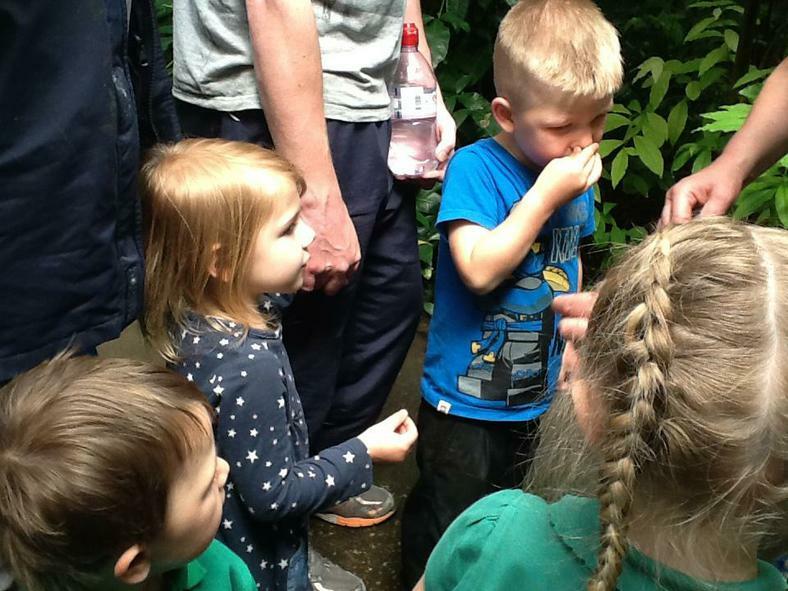 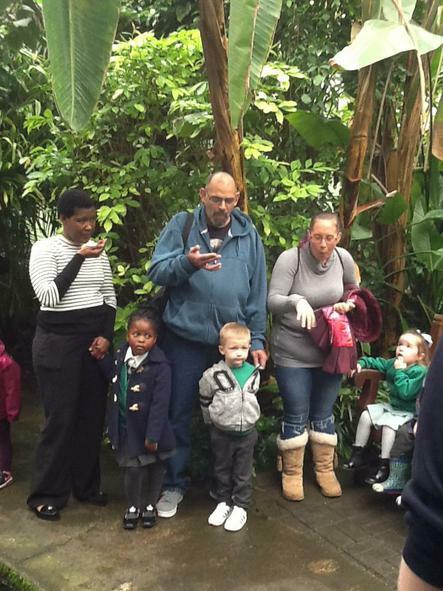 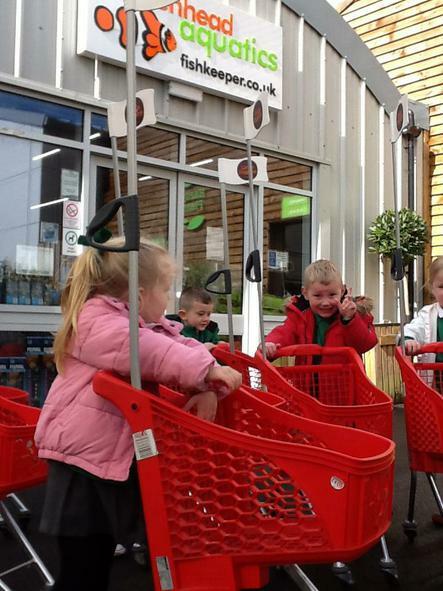 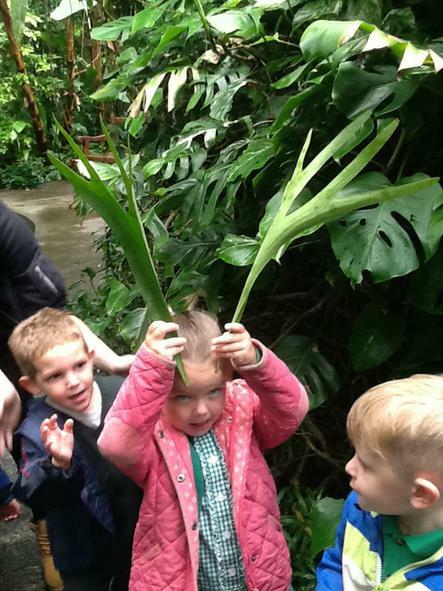 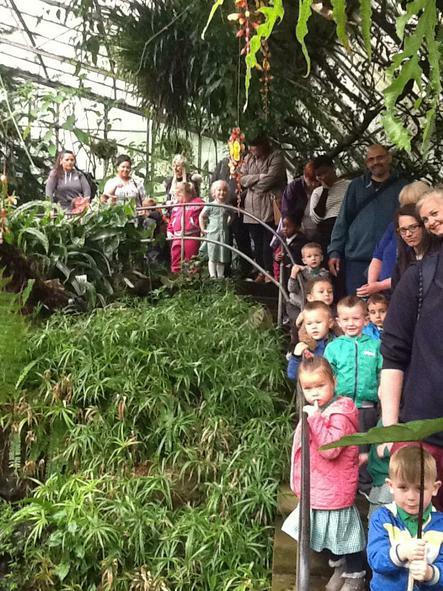 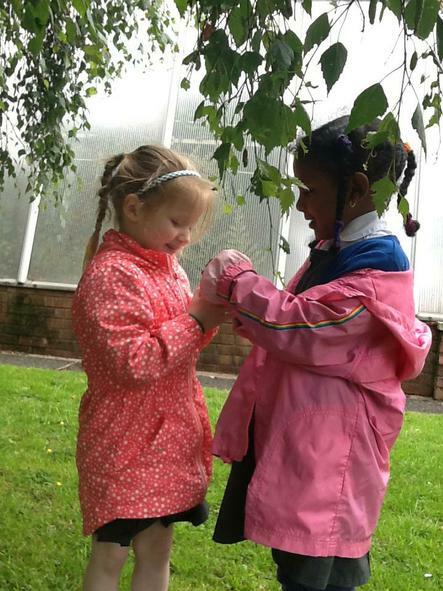 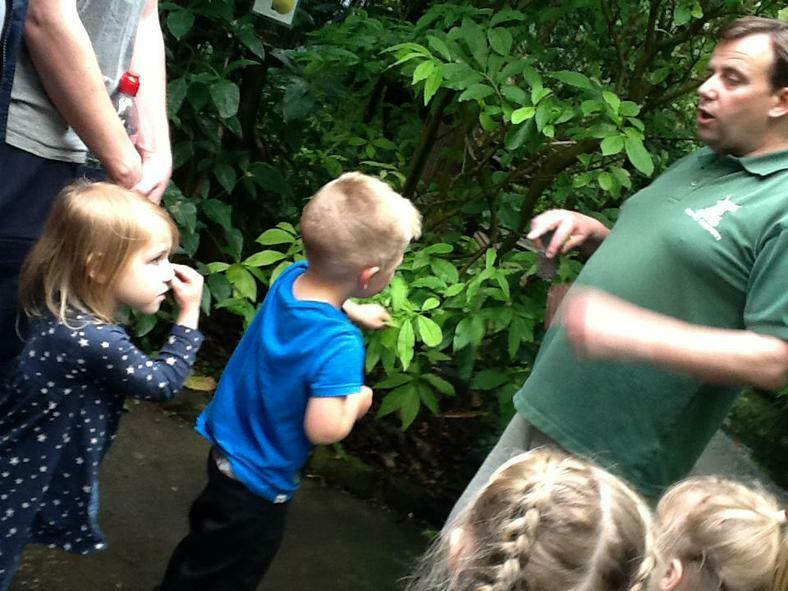 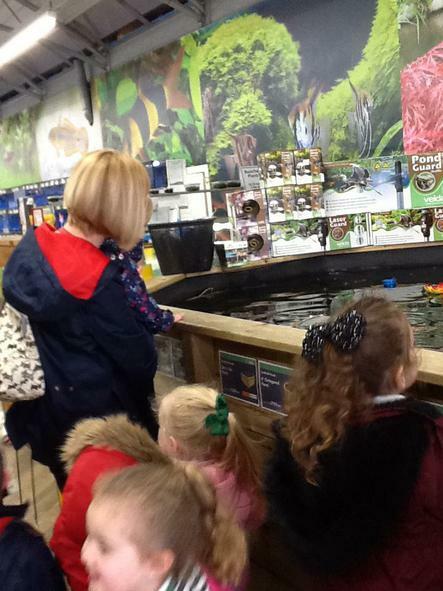 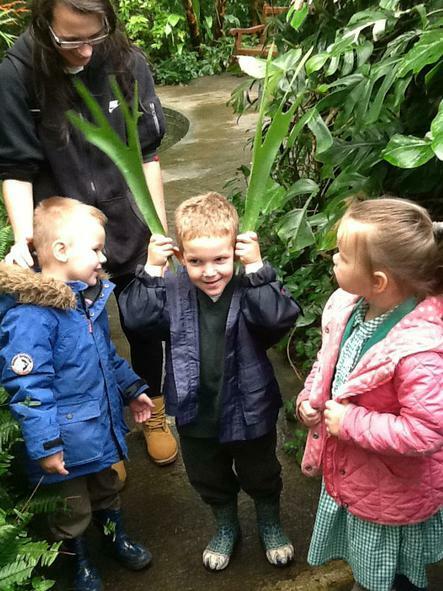 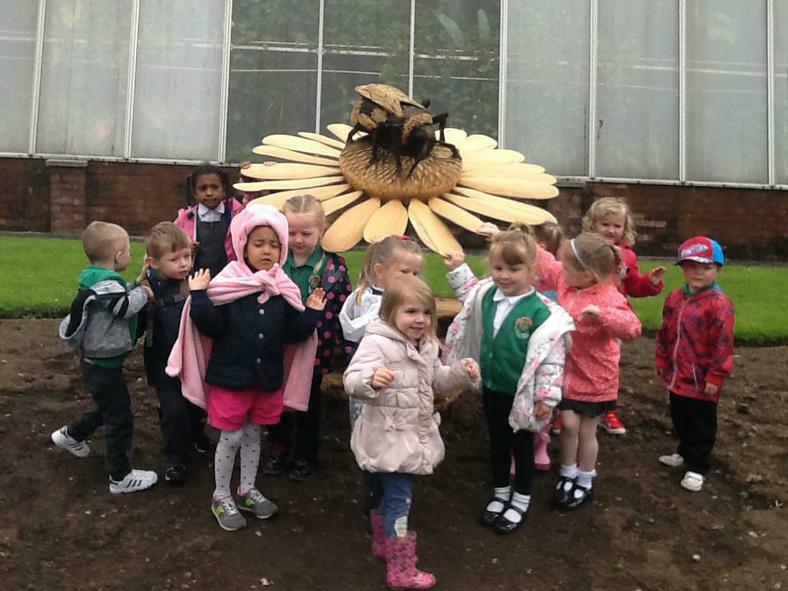 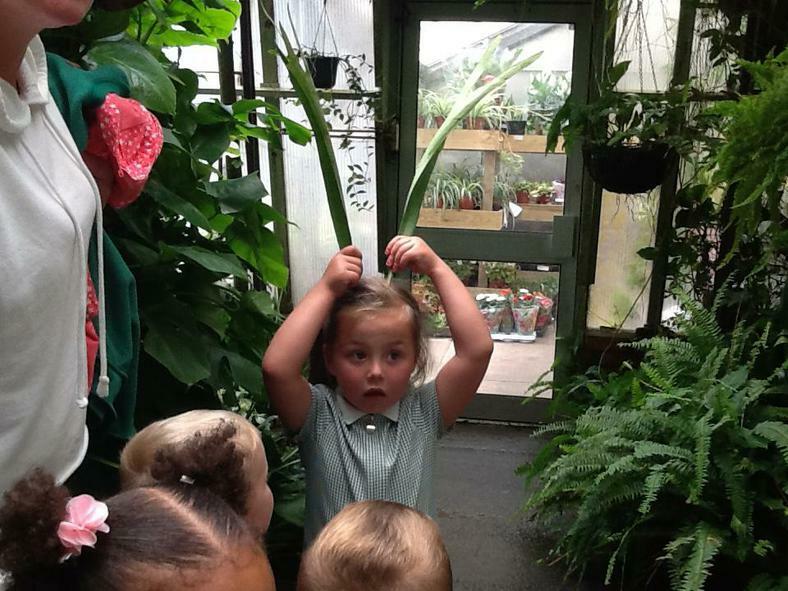 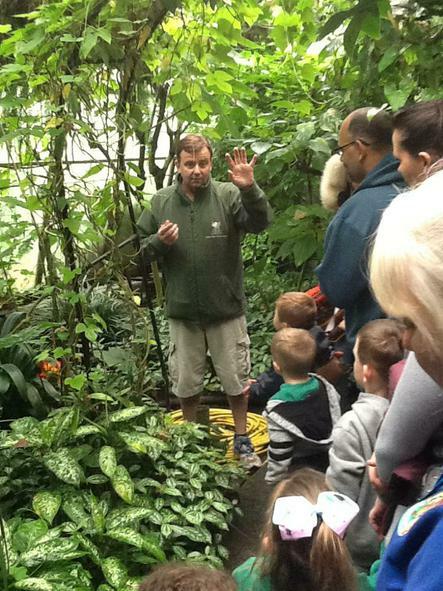 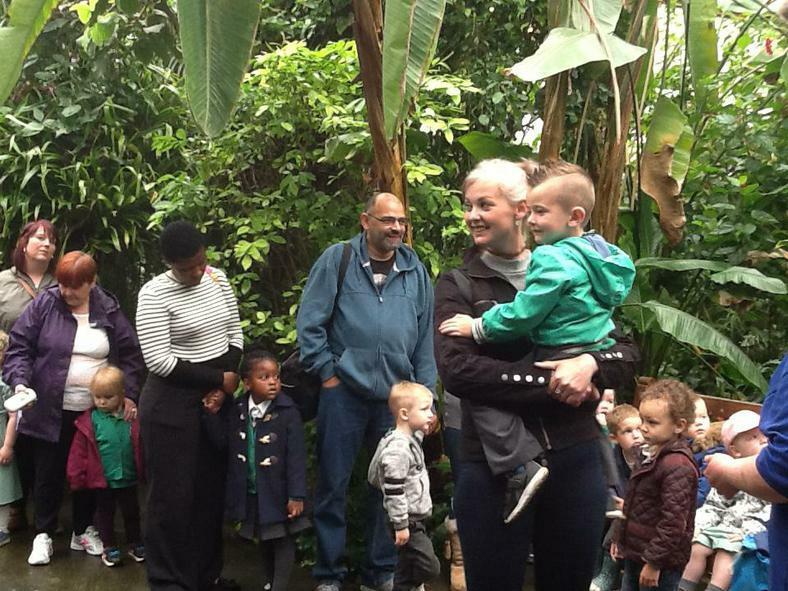 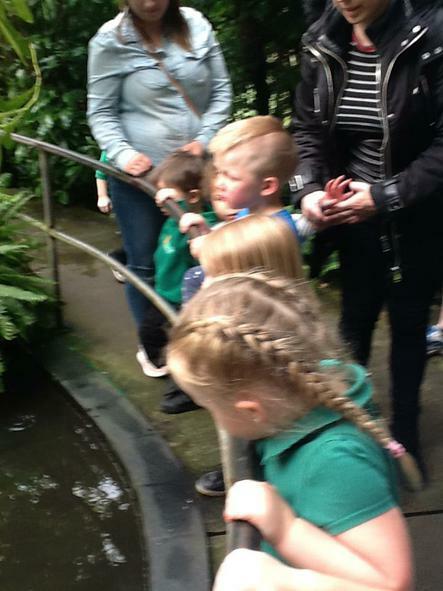 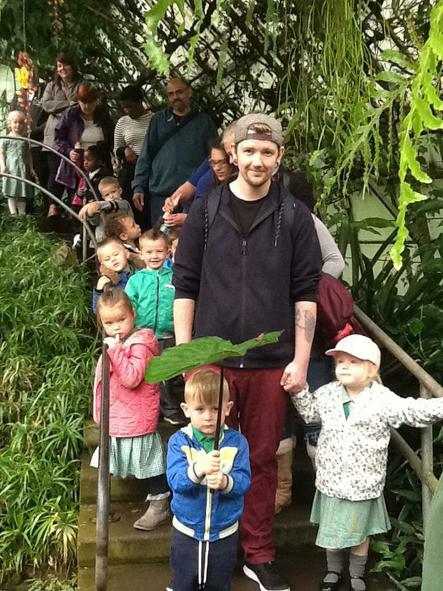 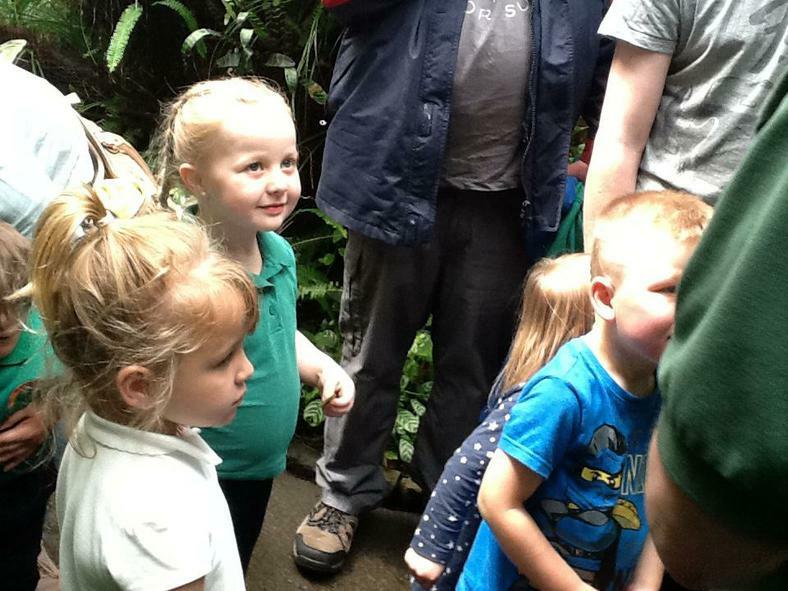 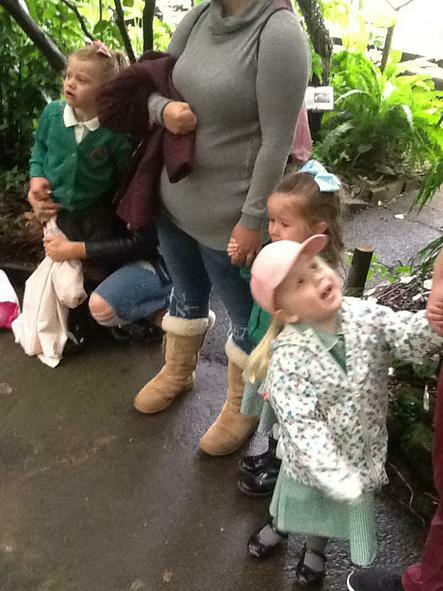 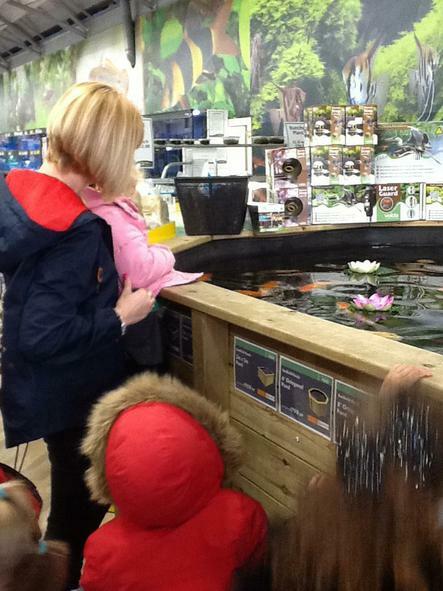 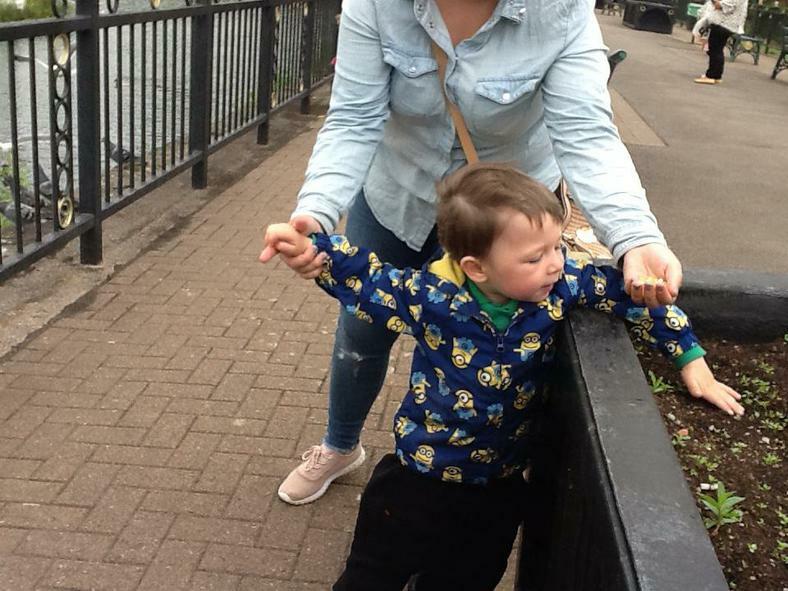 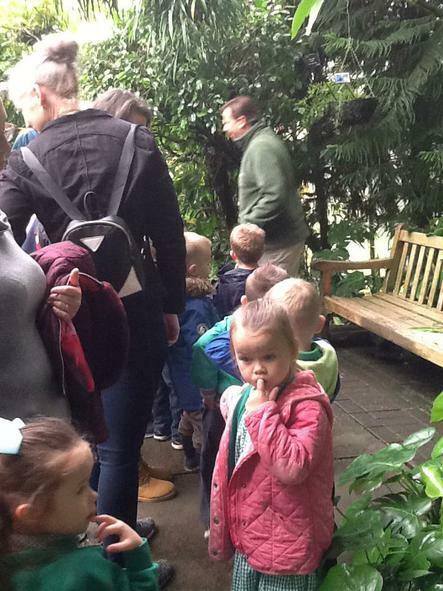 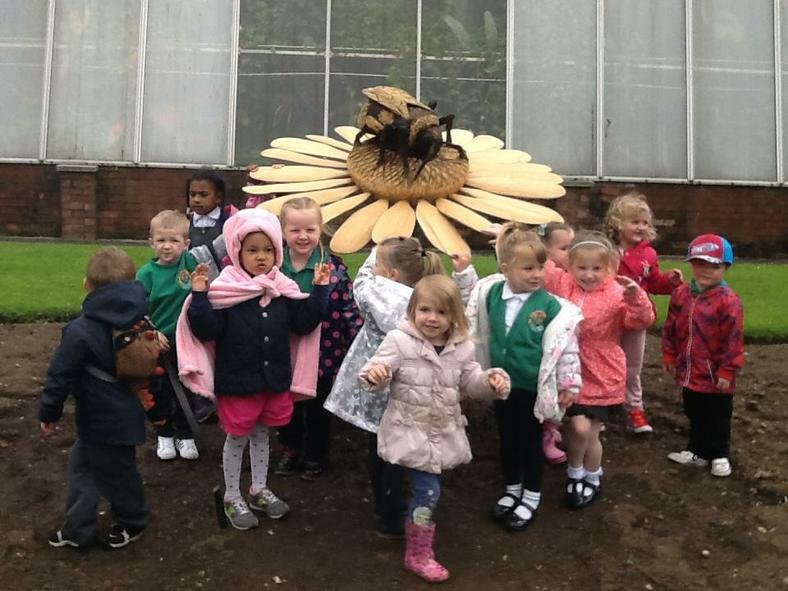 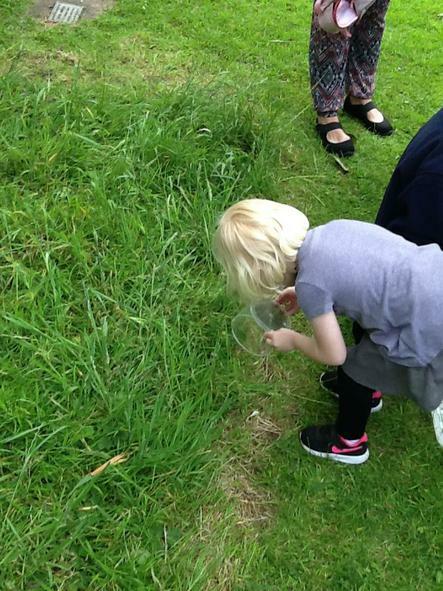 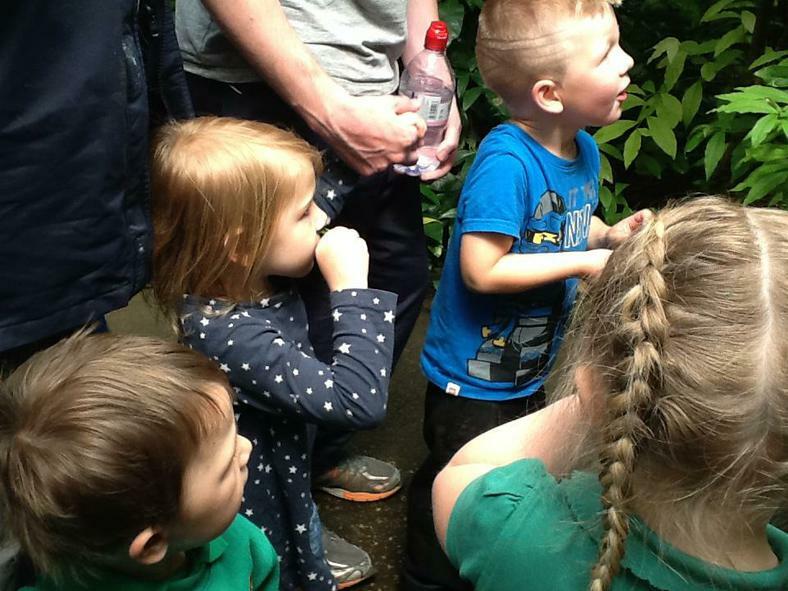 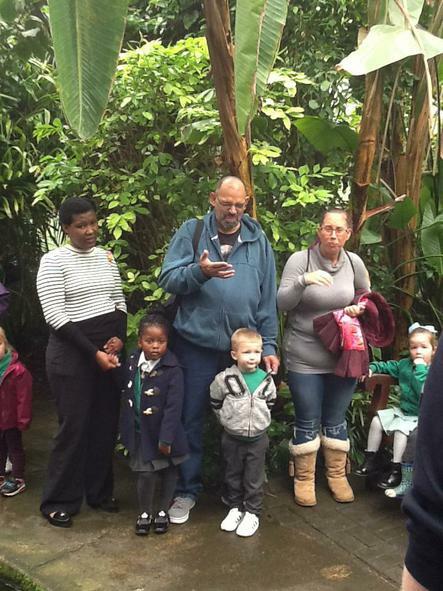 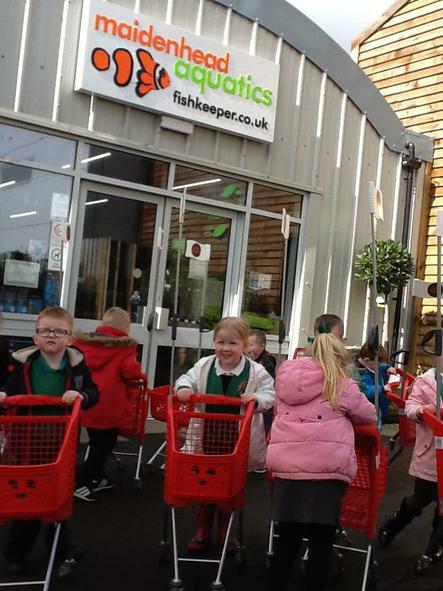 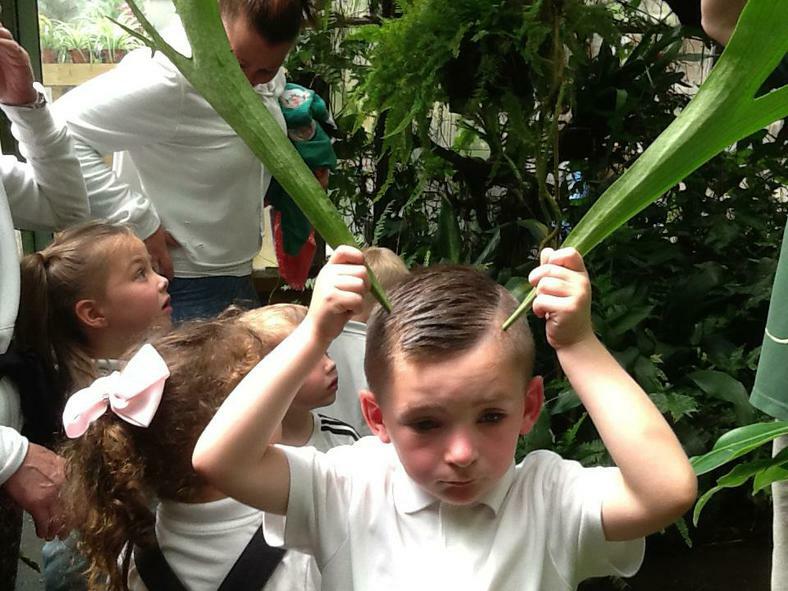 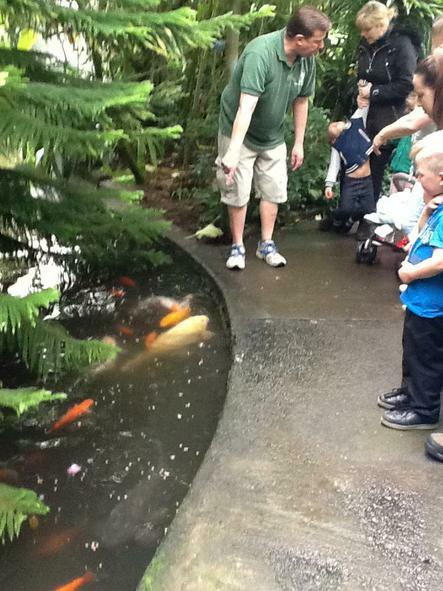 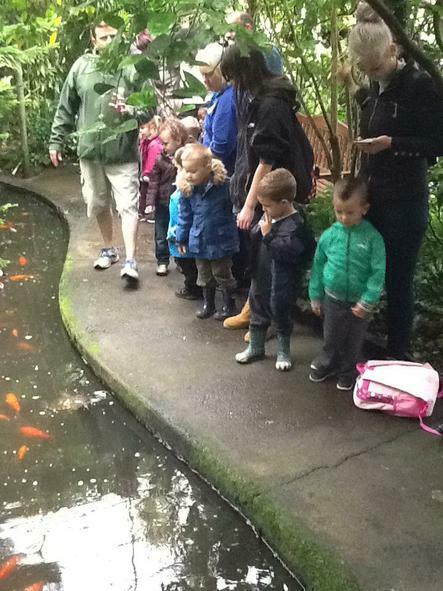 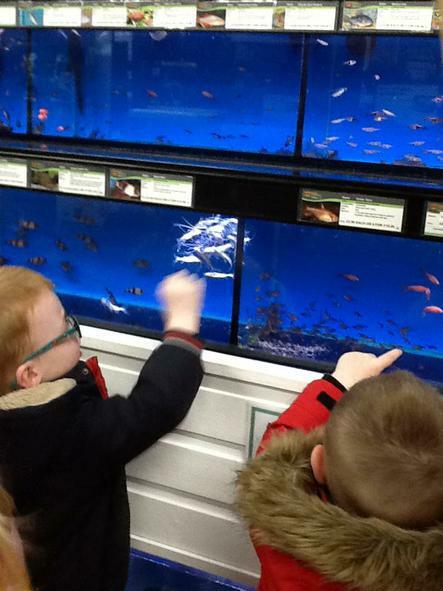 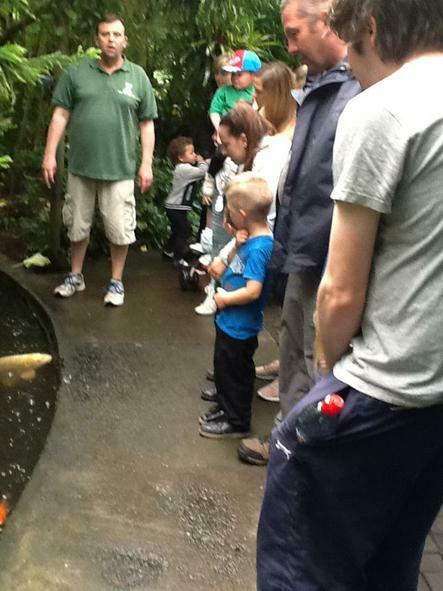 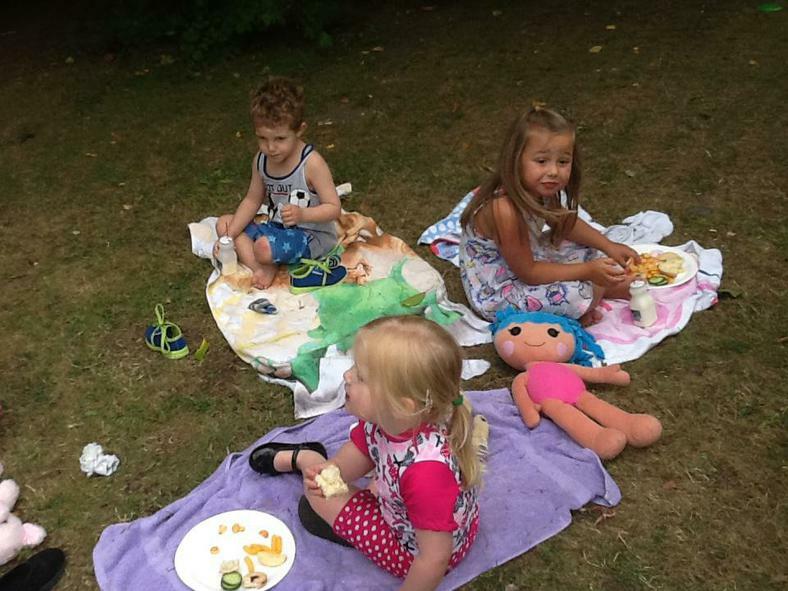 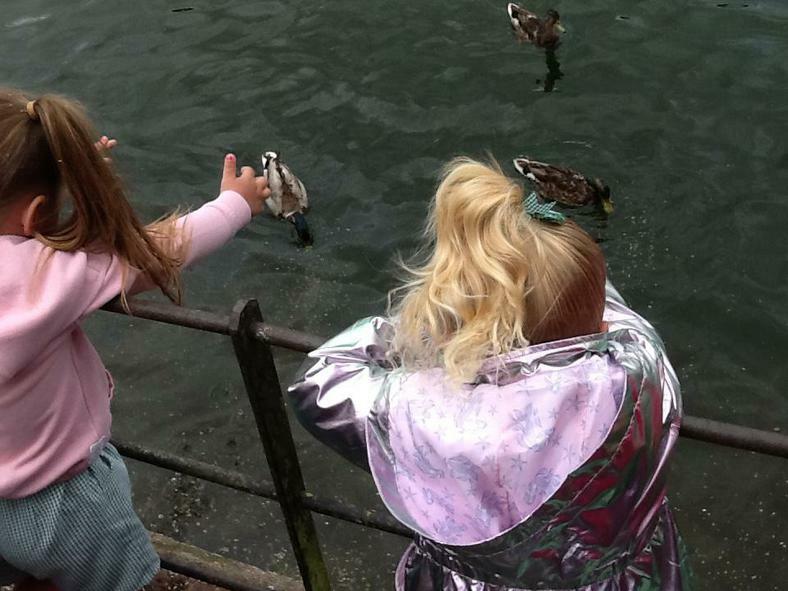 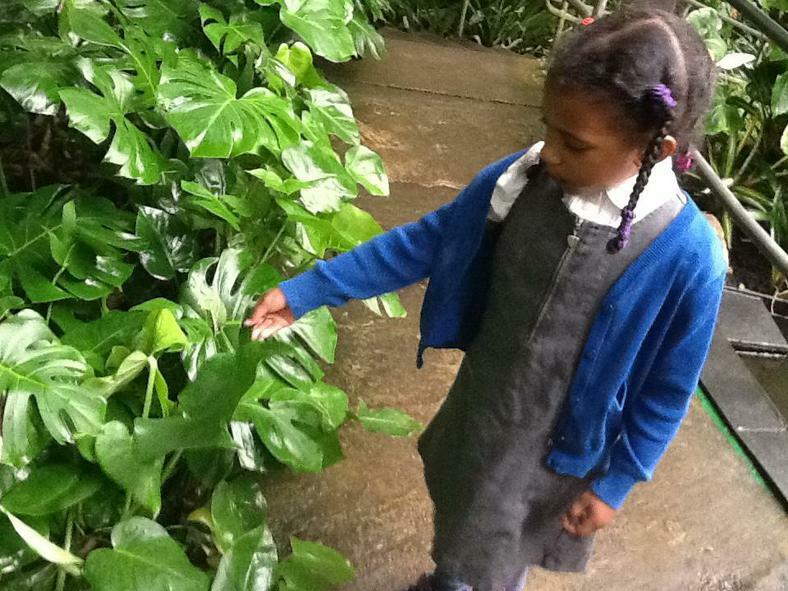 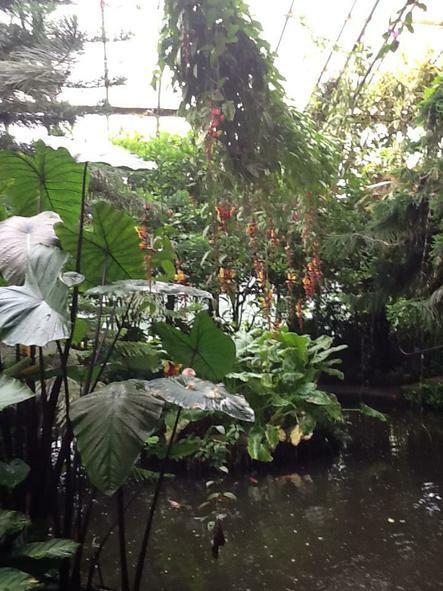 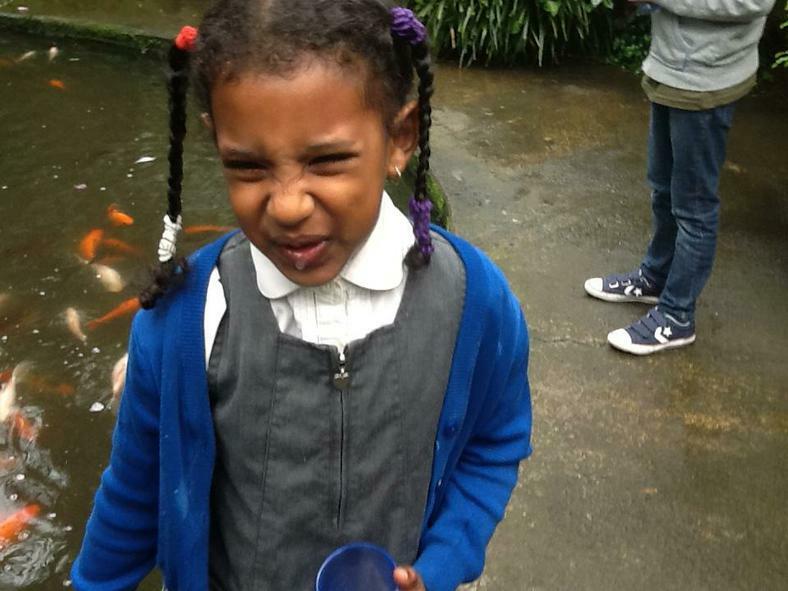 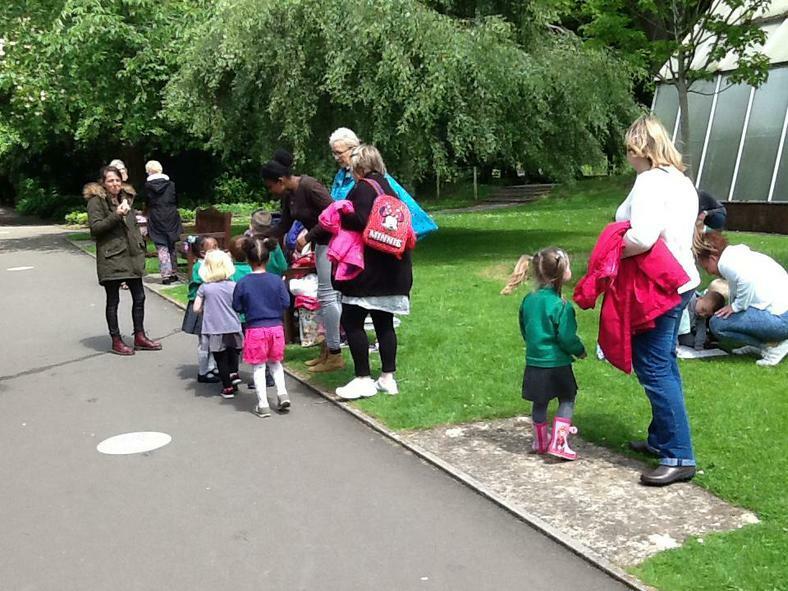 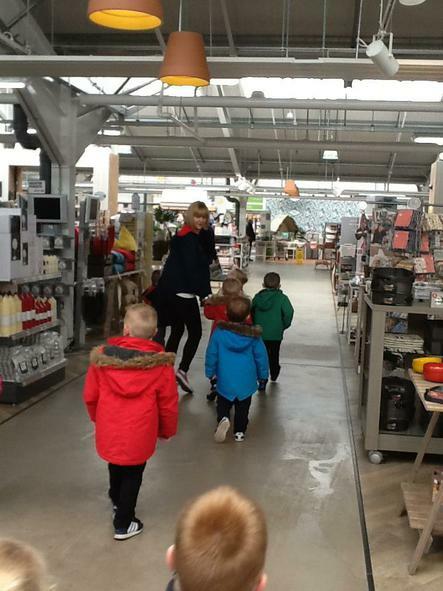 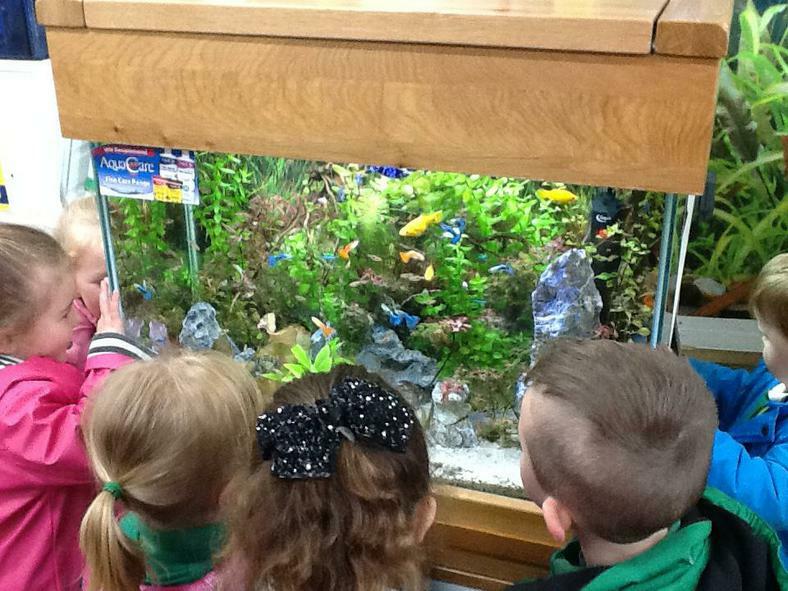 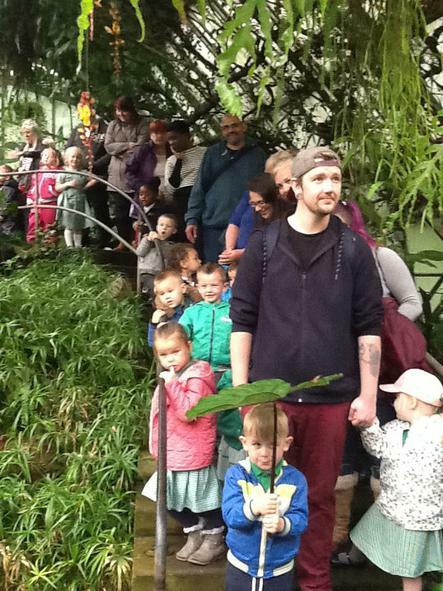 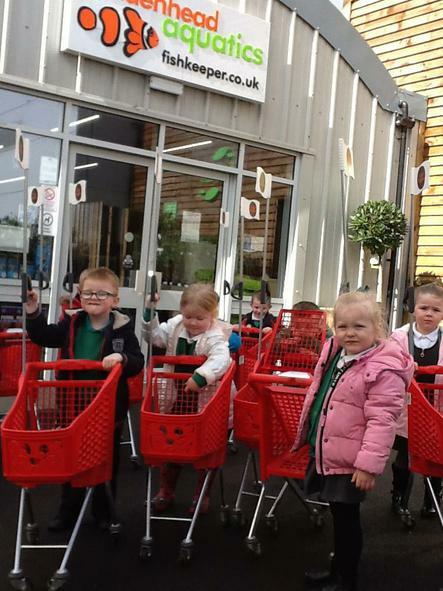 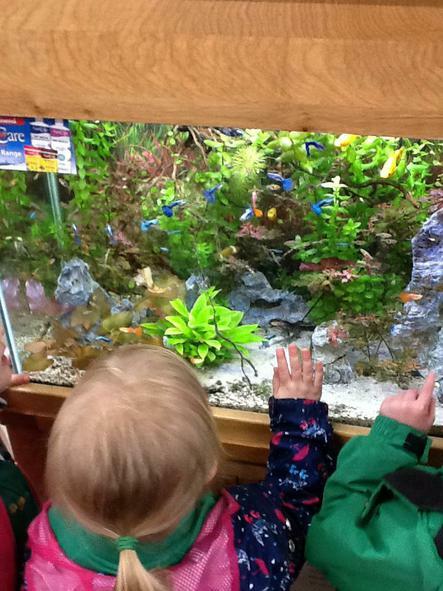 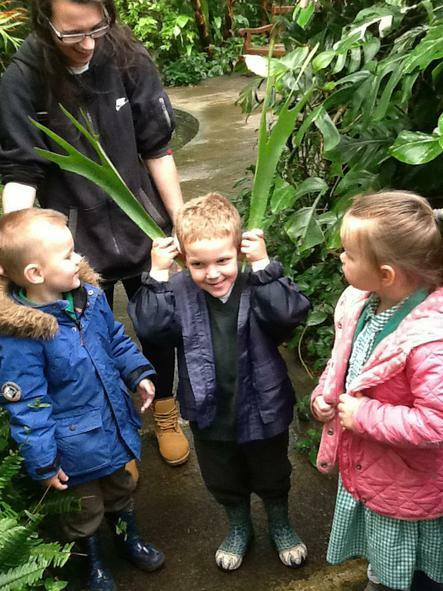 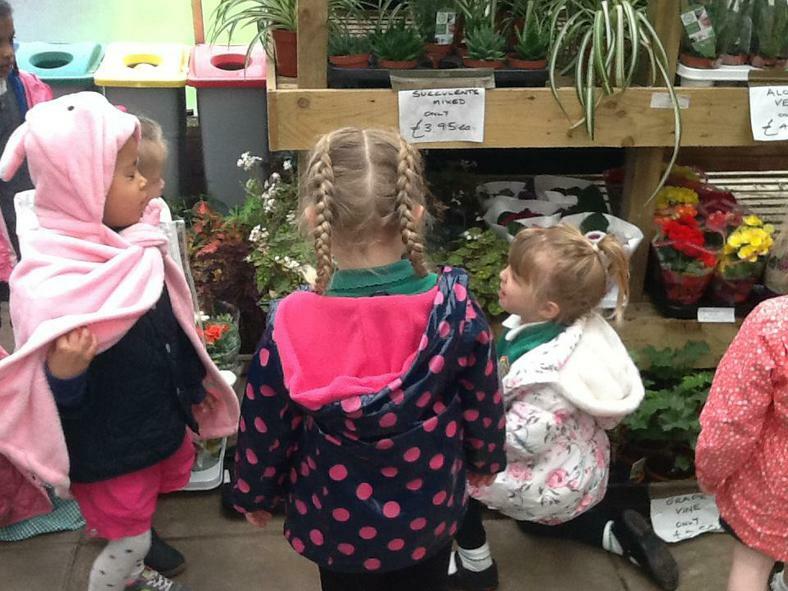 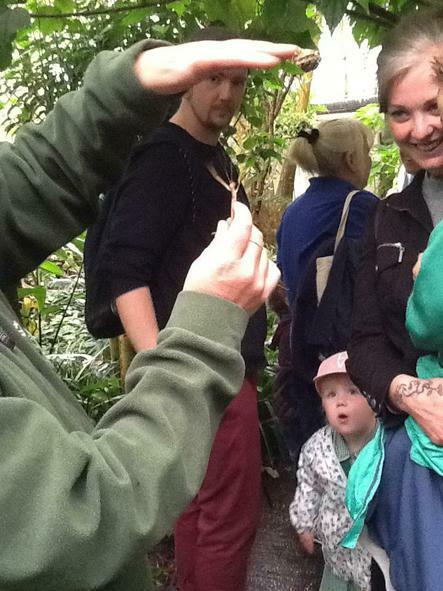 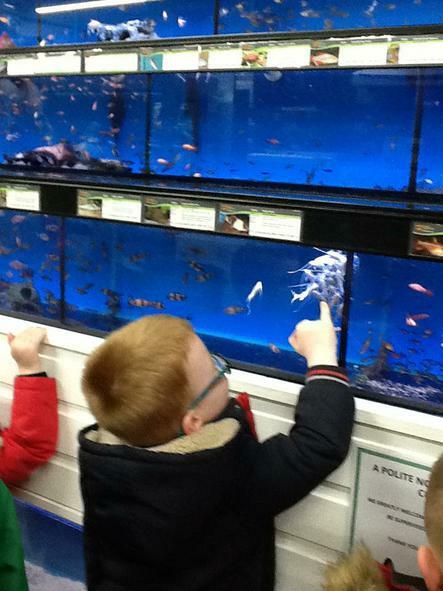 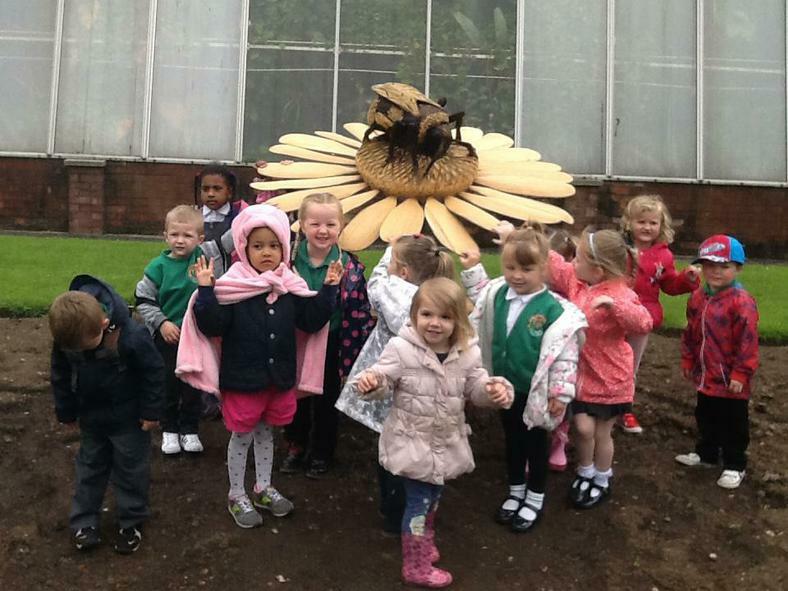 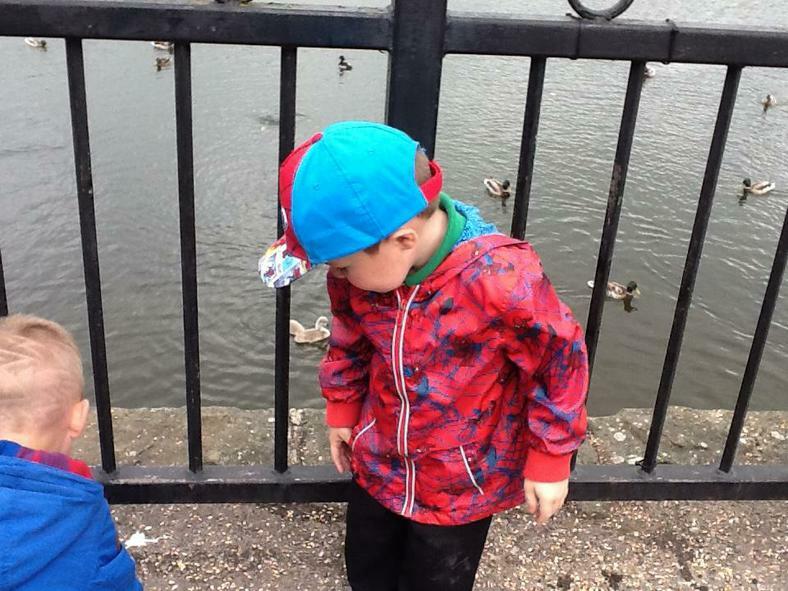 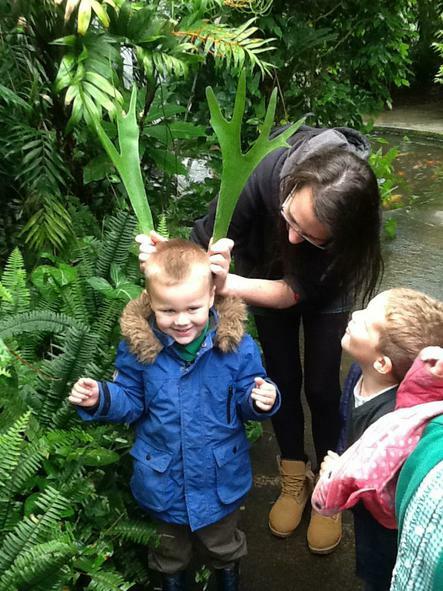 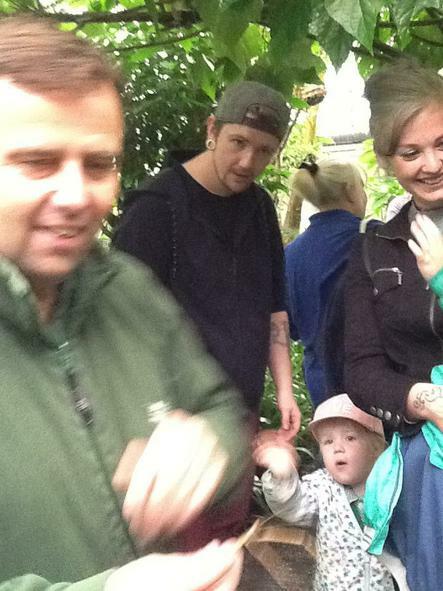 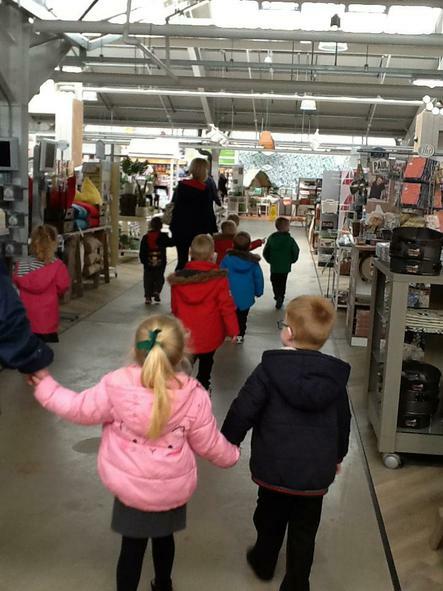 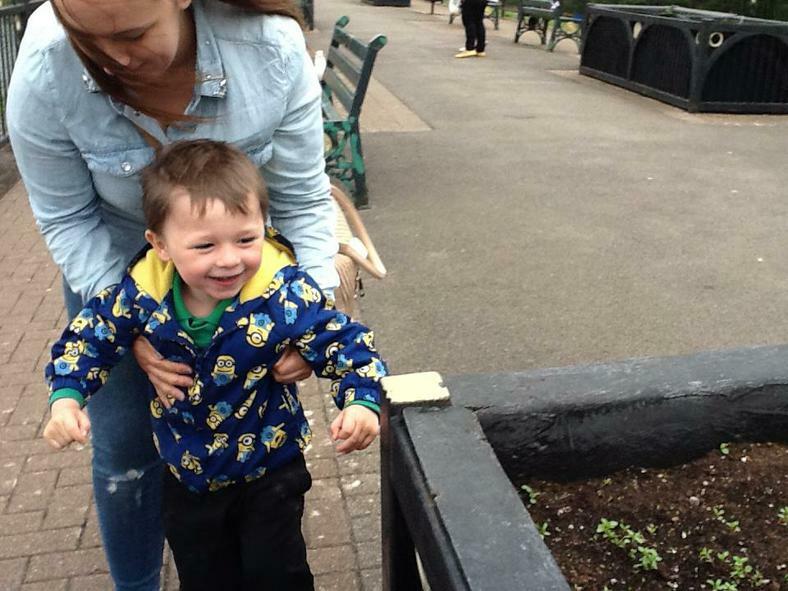 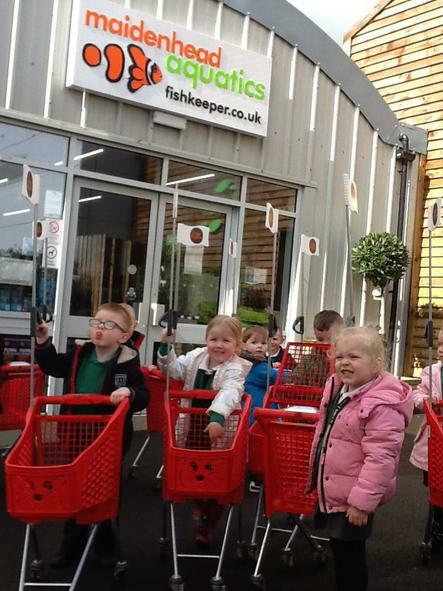 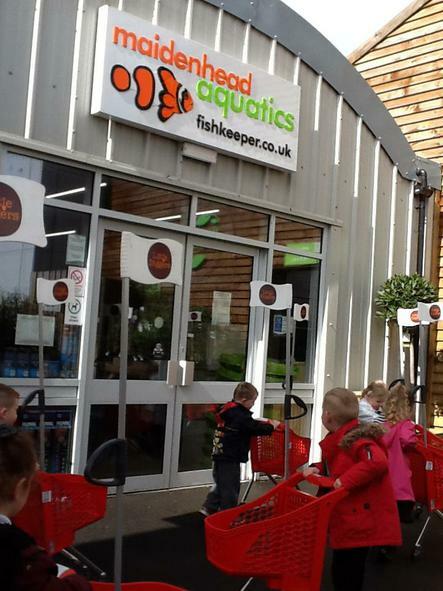 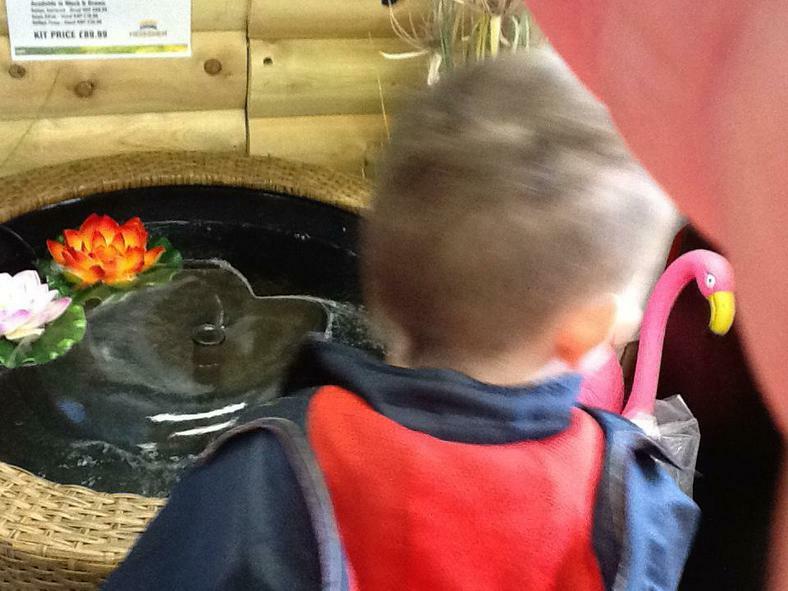 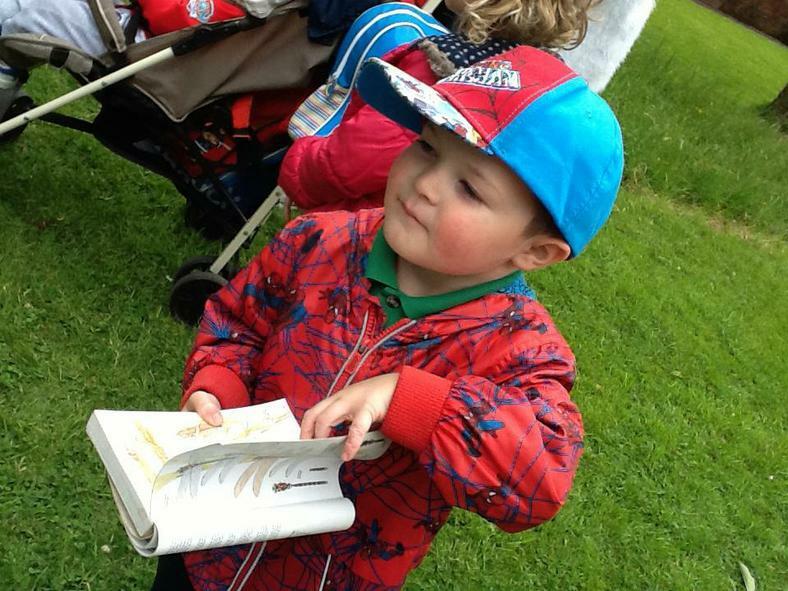 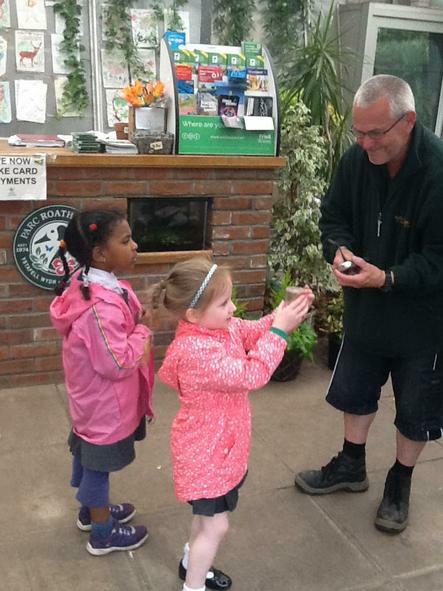 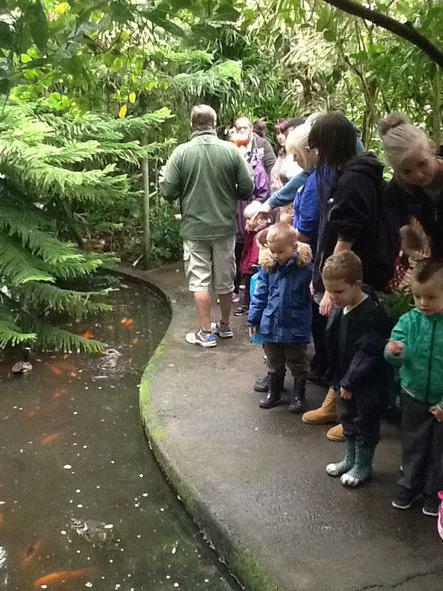 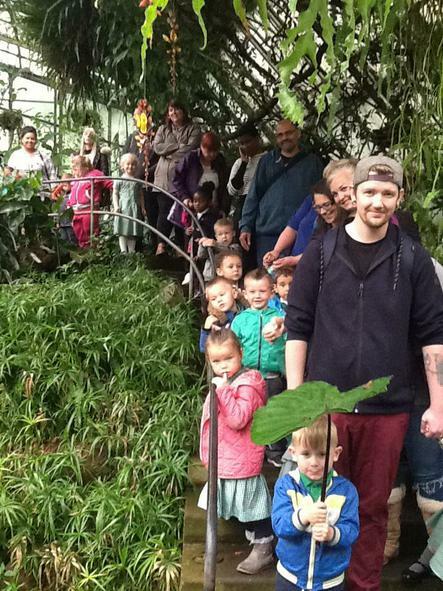 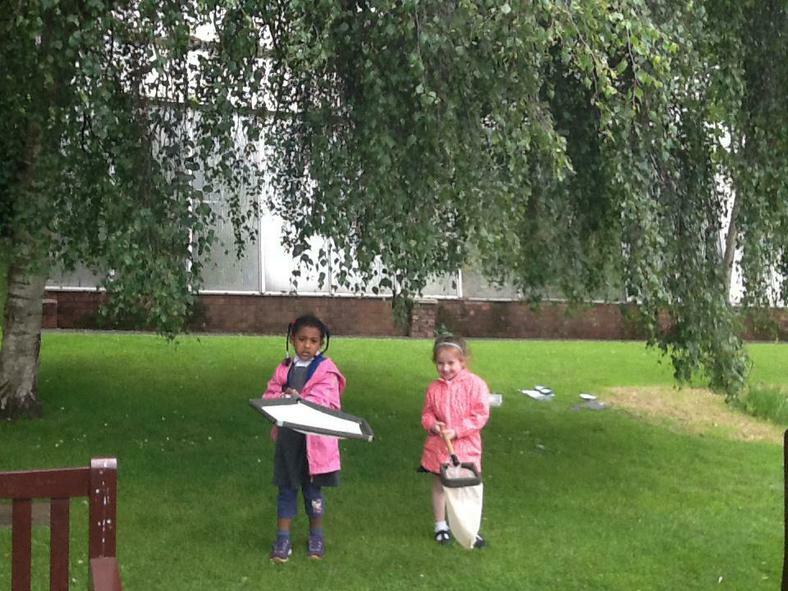 Here are some photos of our little shoppers, they all enjoyed exploring the plants, the aquarium and definitely the soft play followed by party ring biscuits and milk. 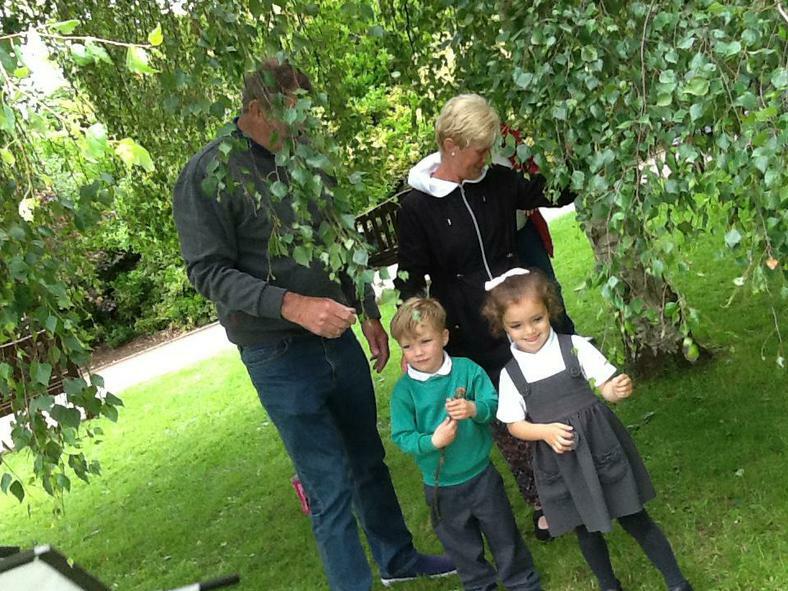 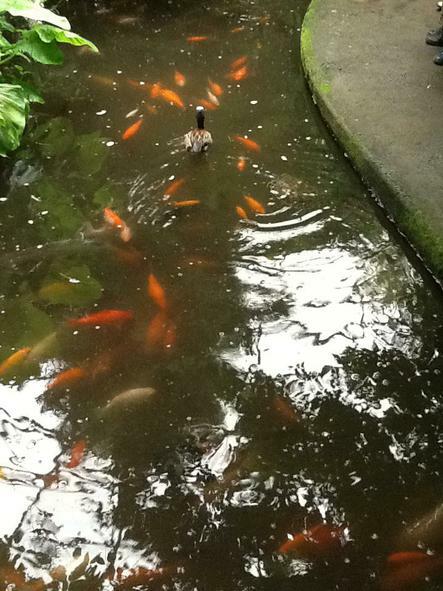 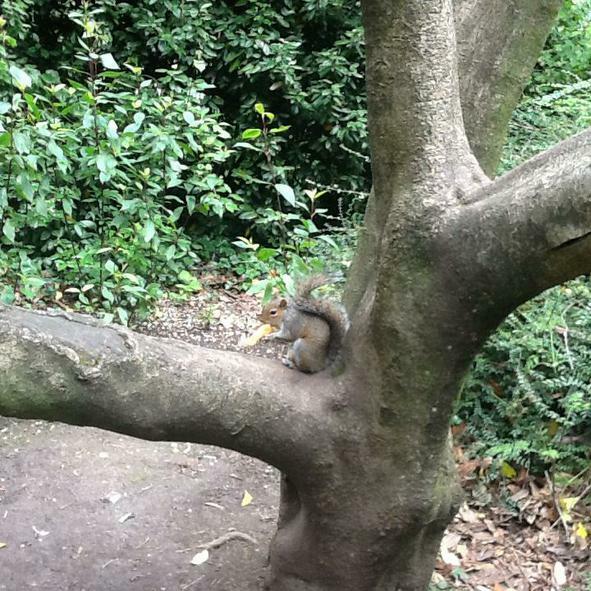 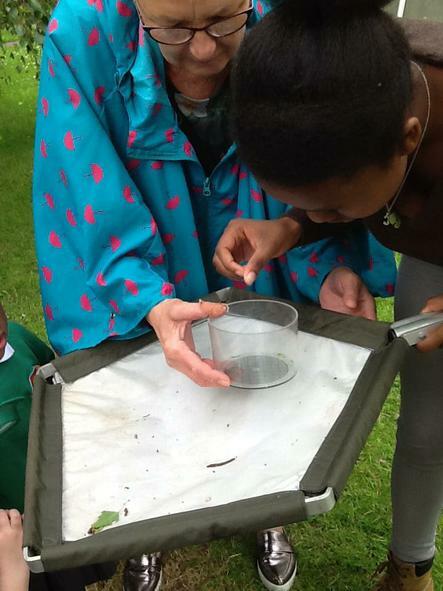 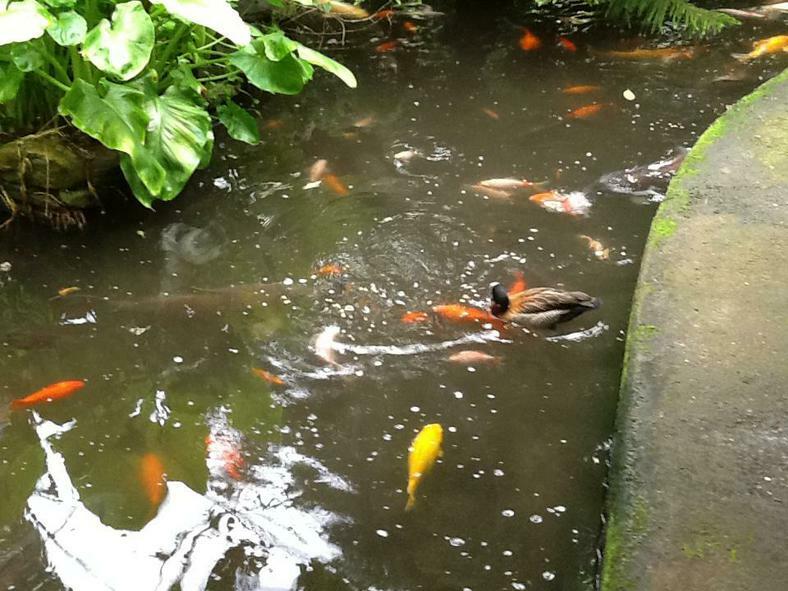 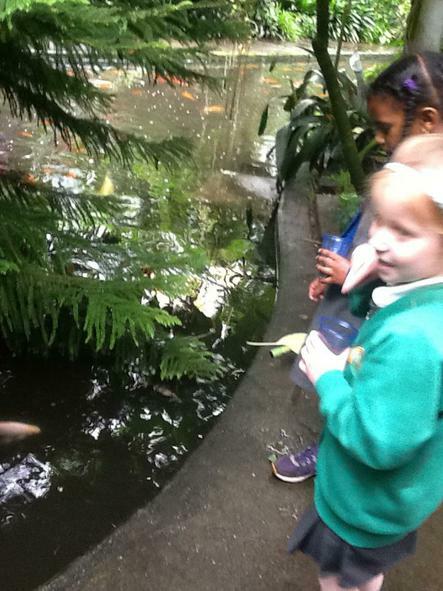 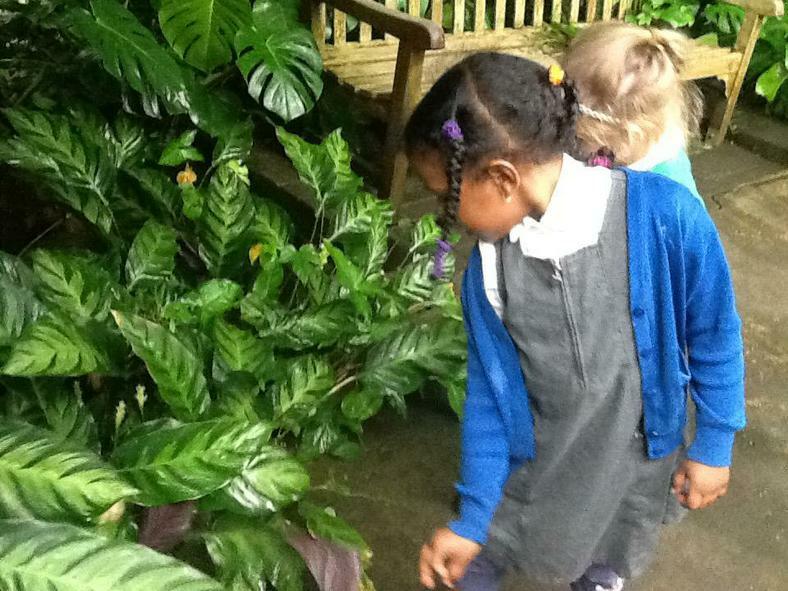 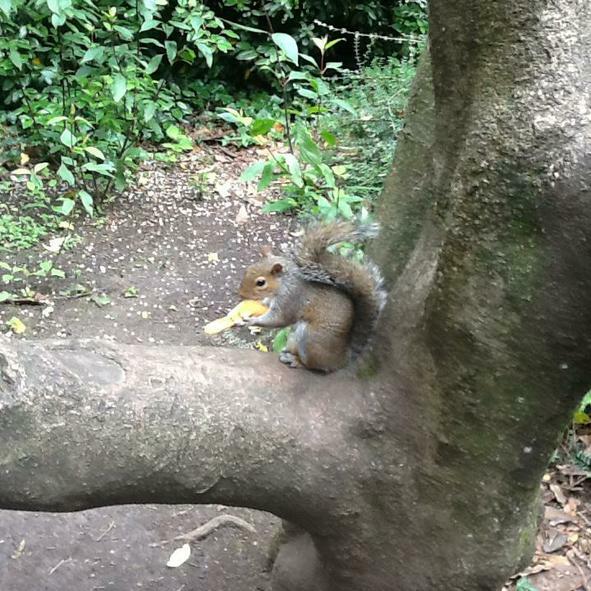 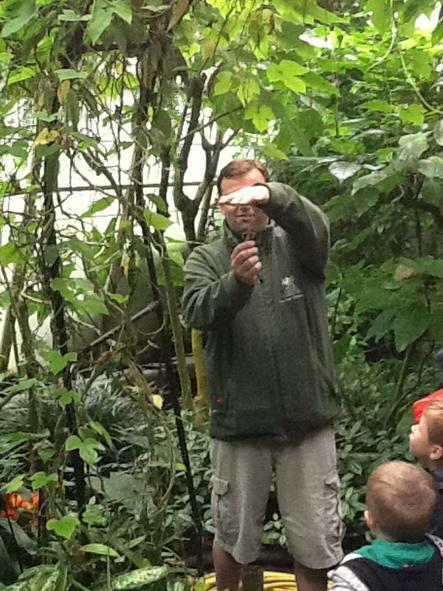 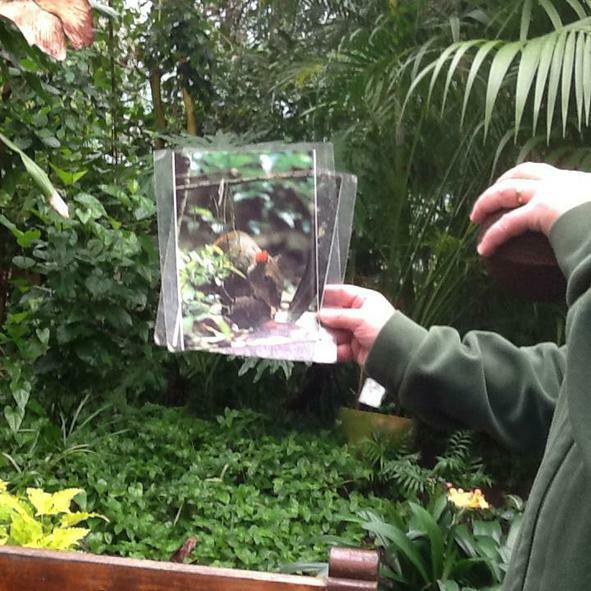 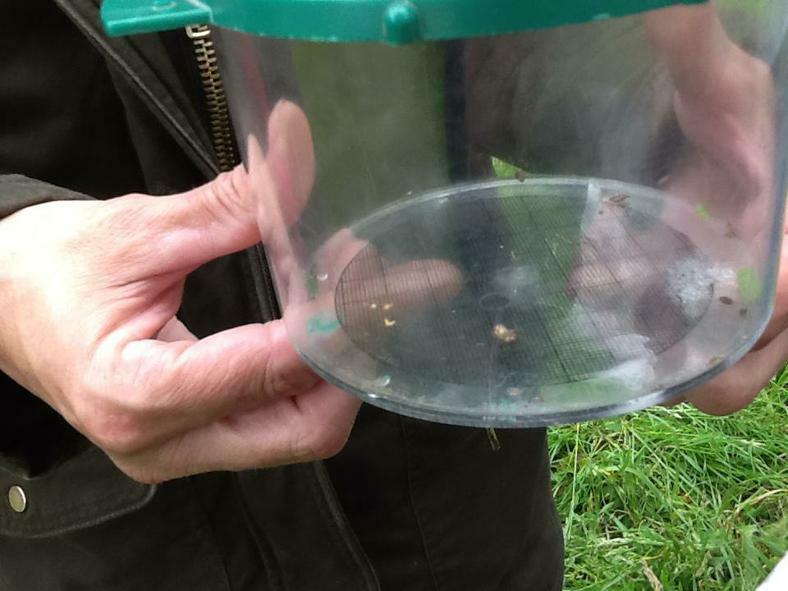 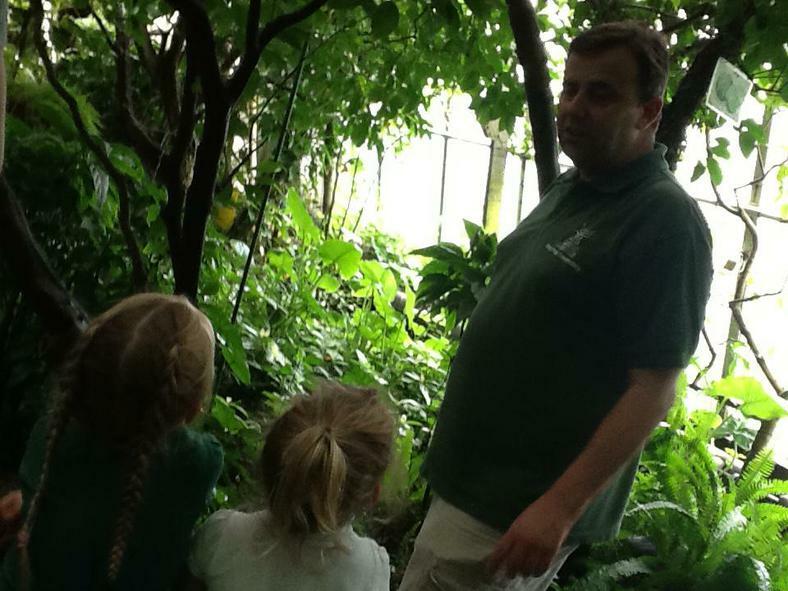 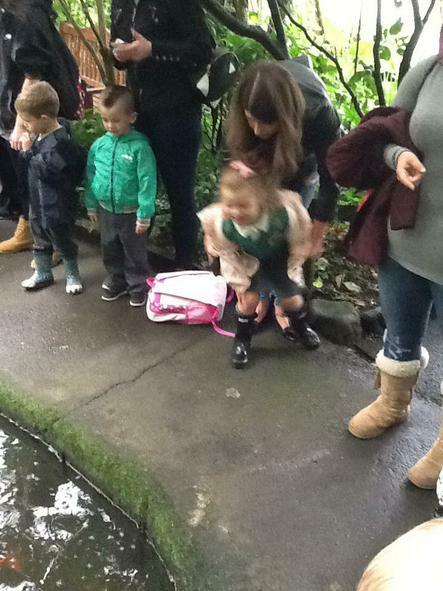 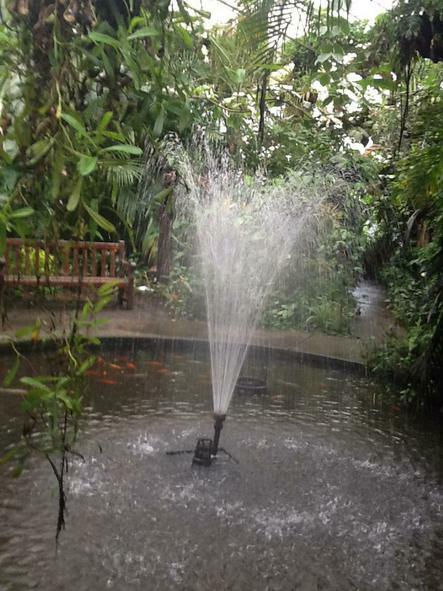 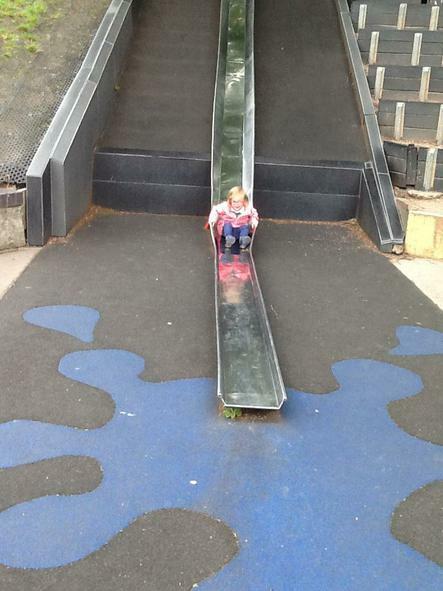 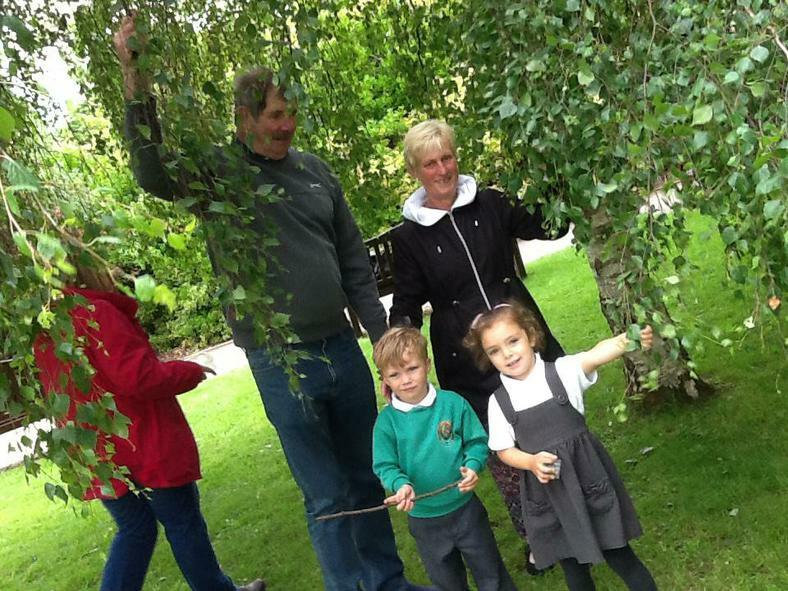 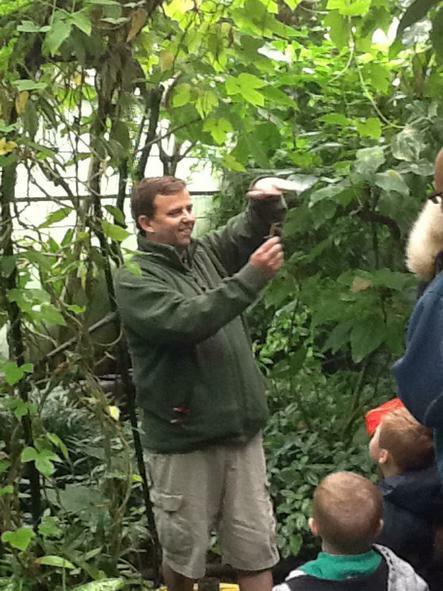 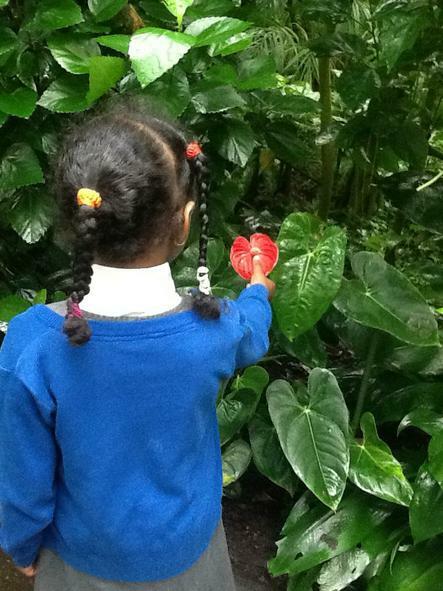 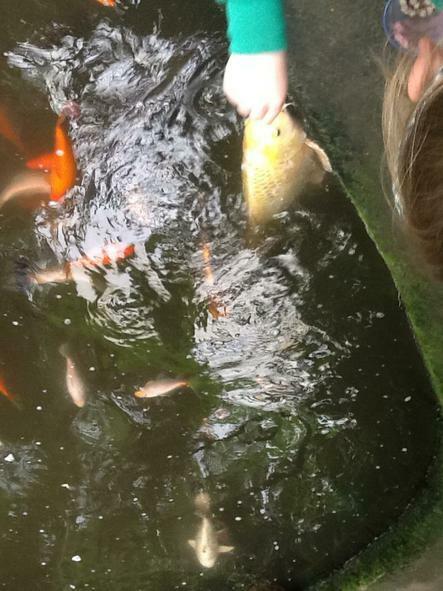 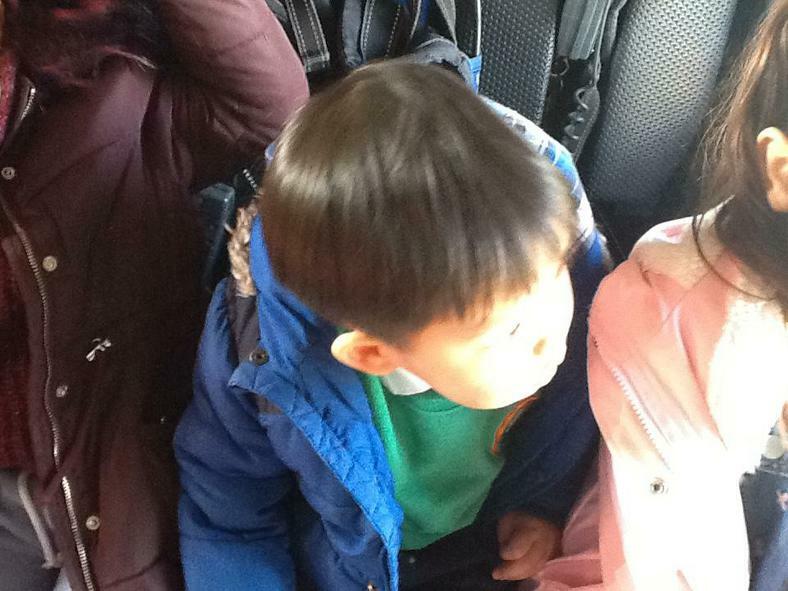 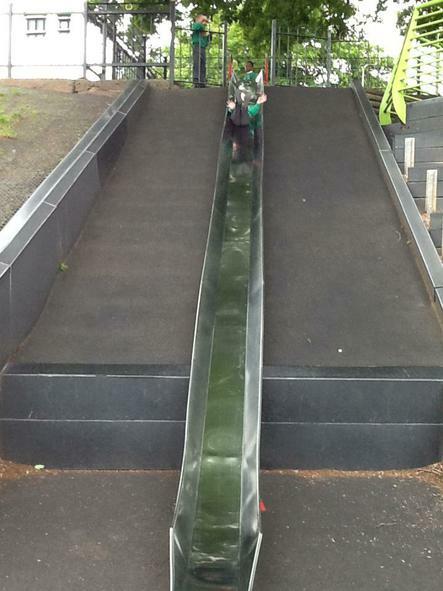 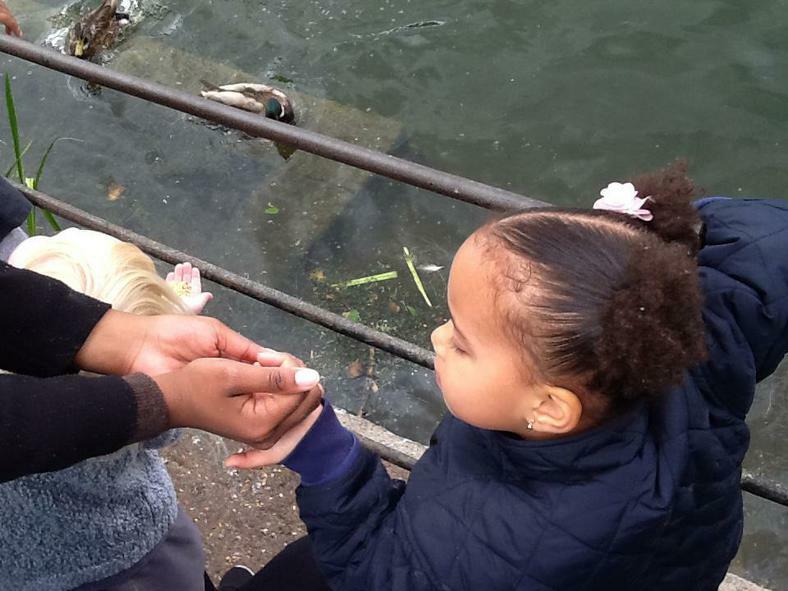 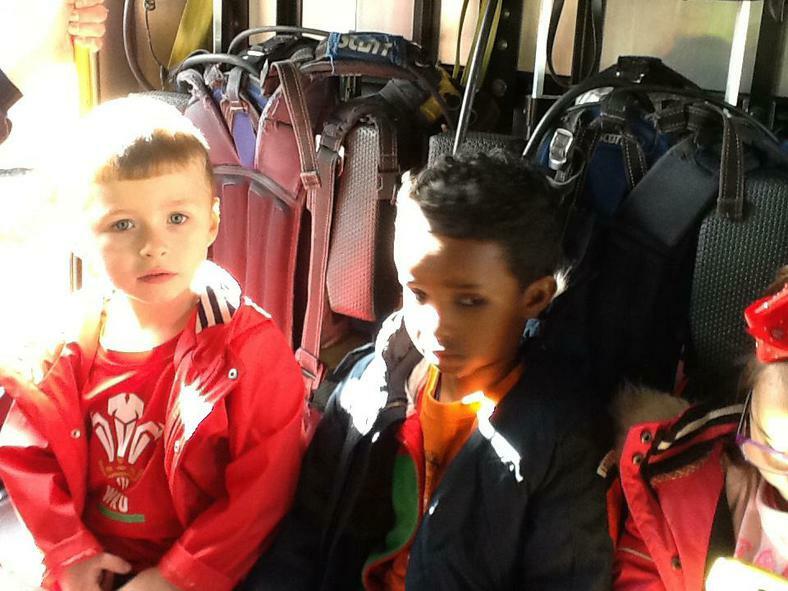 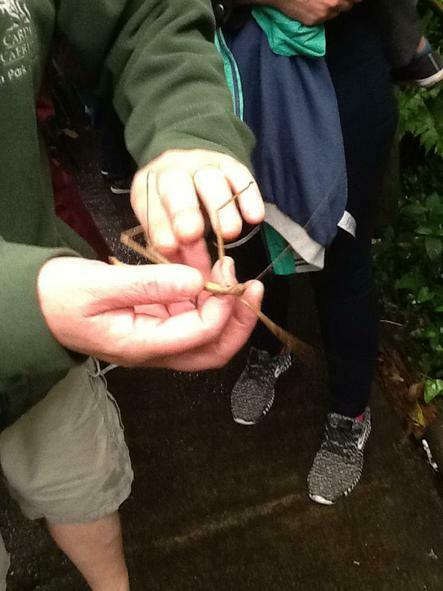 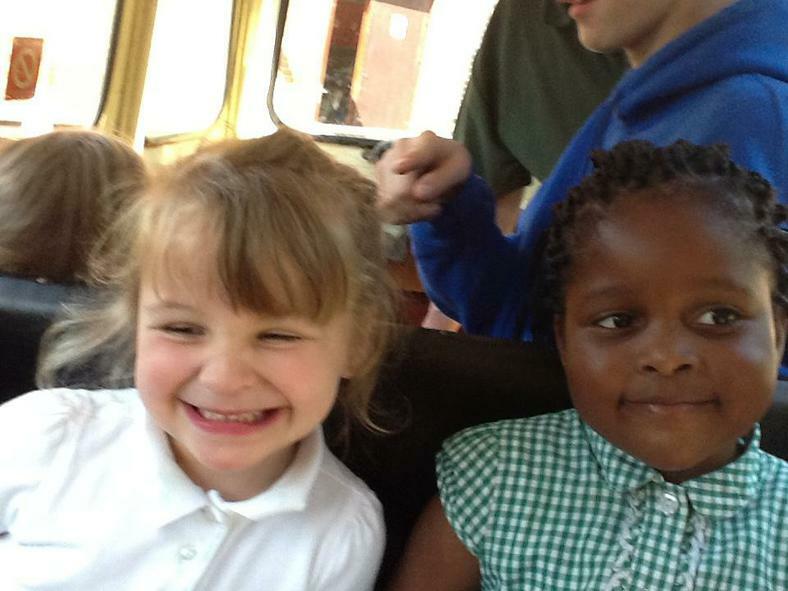 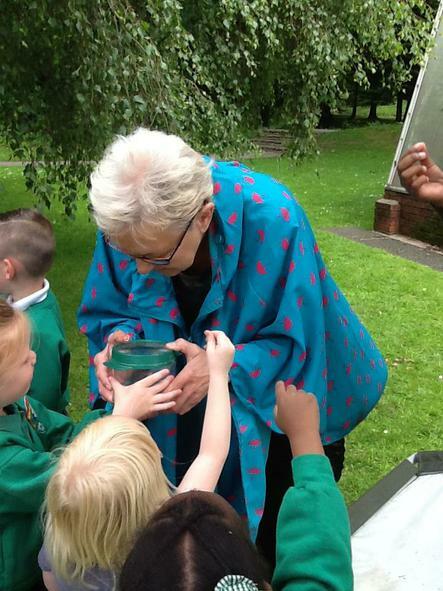 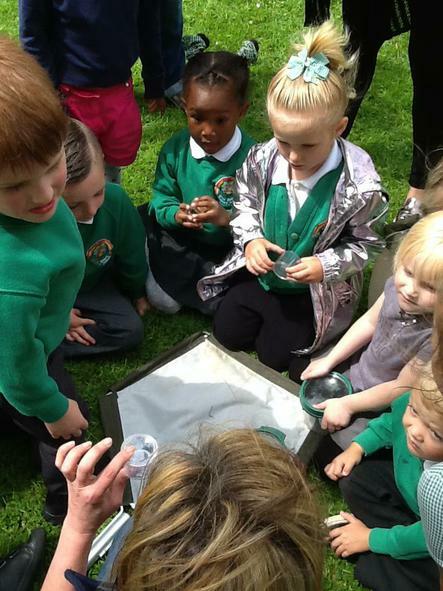 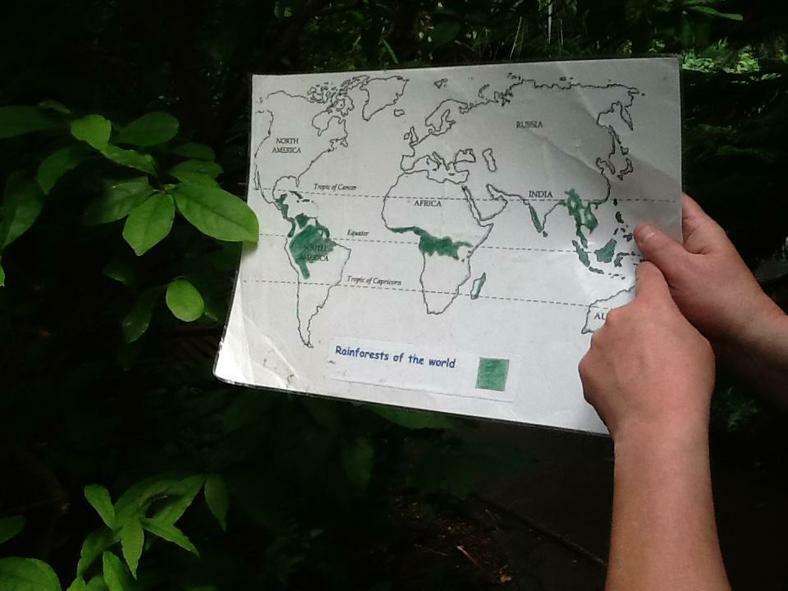 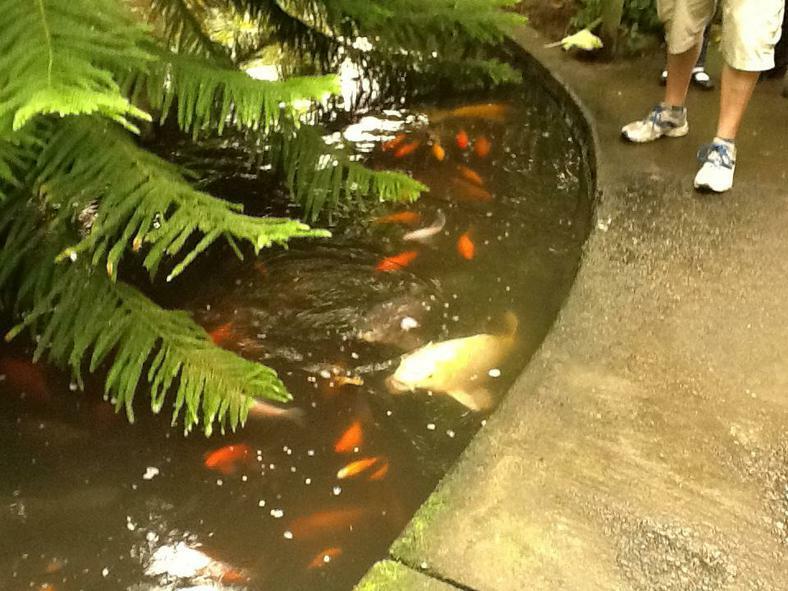 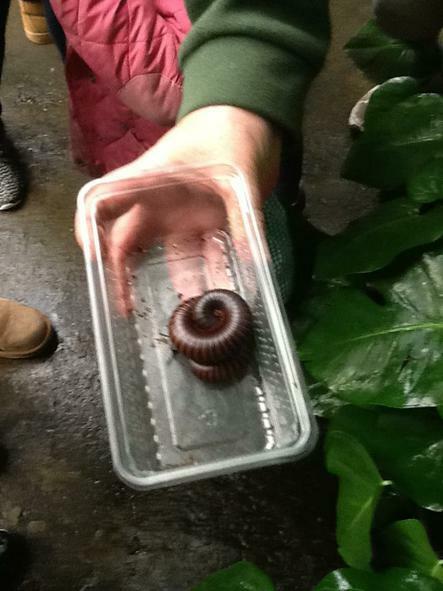 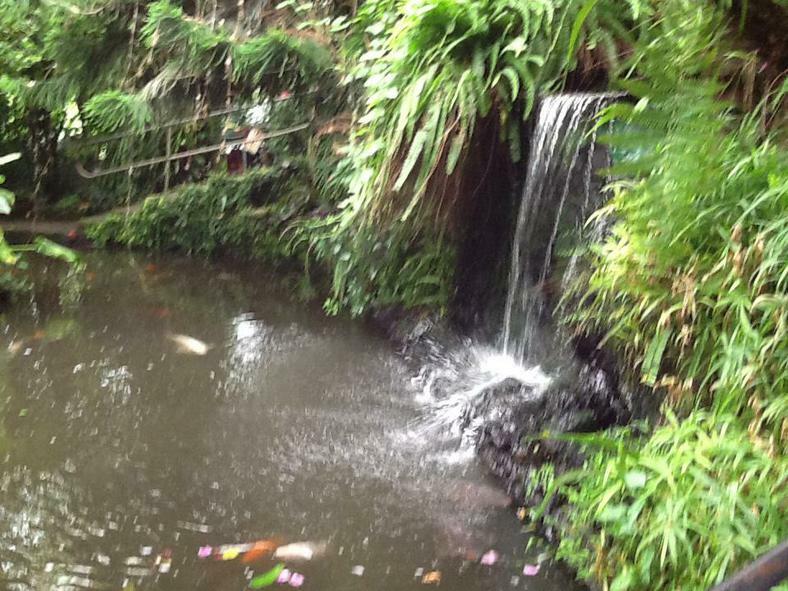 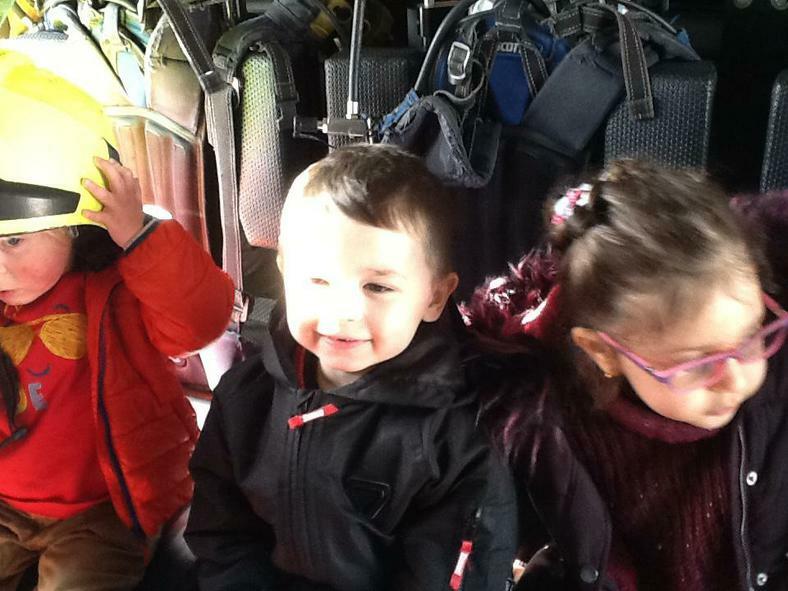 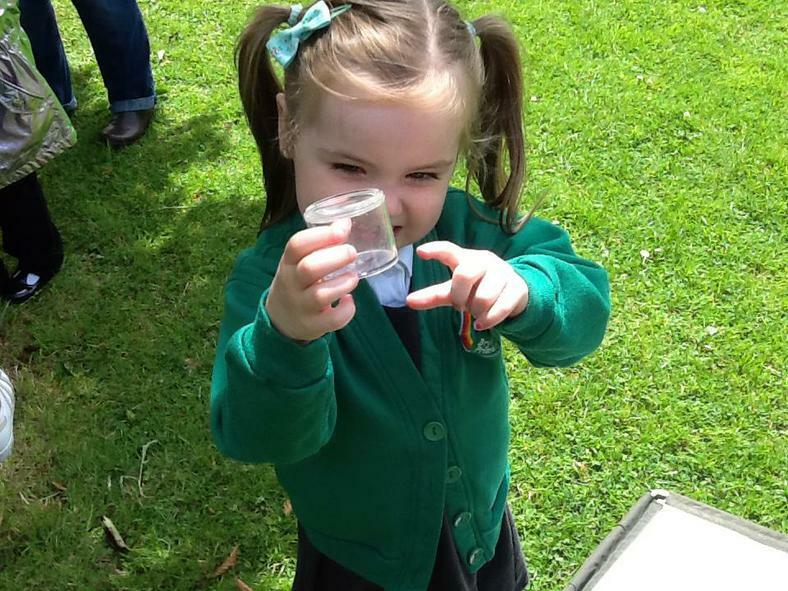 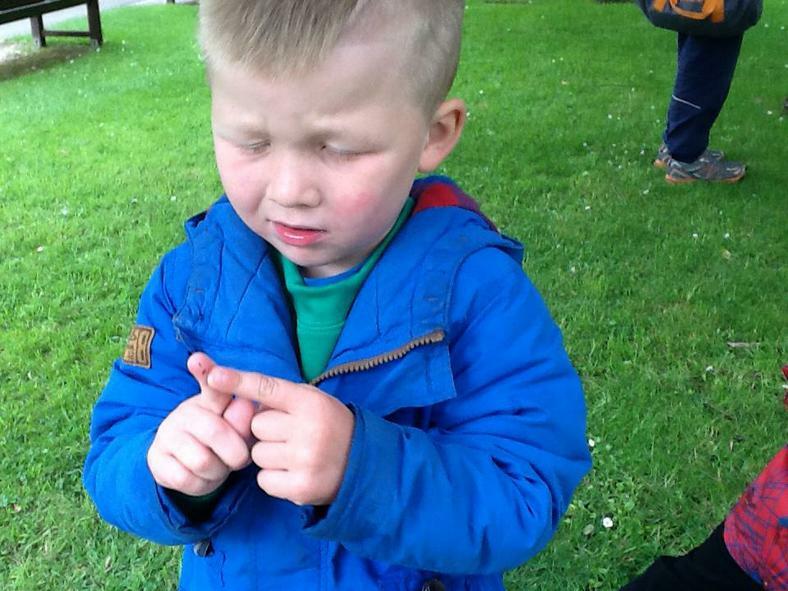 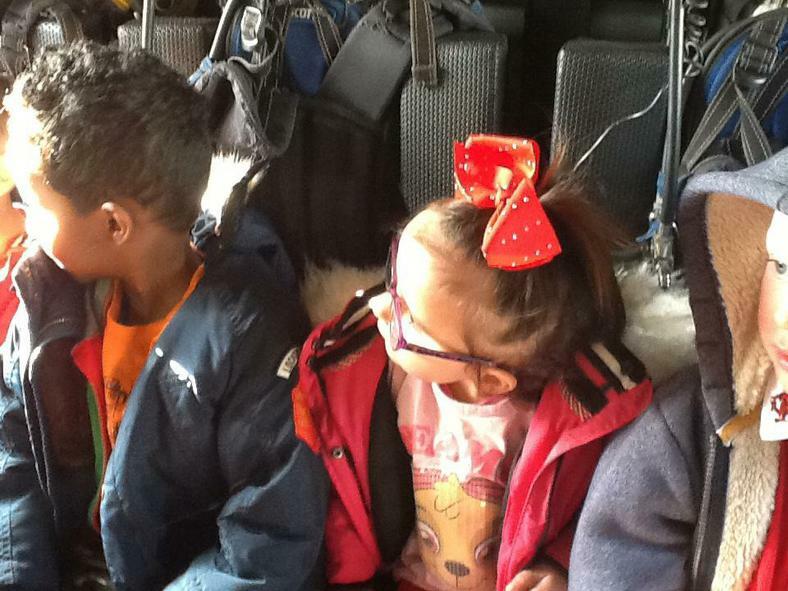 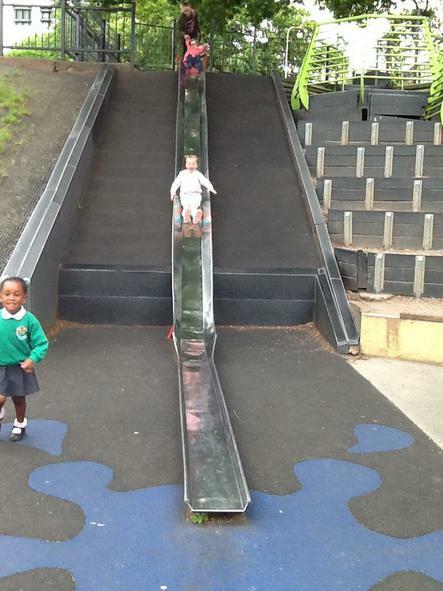 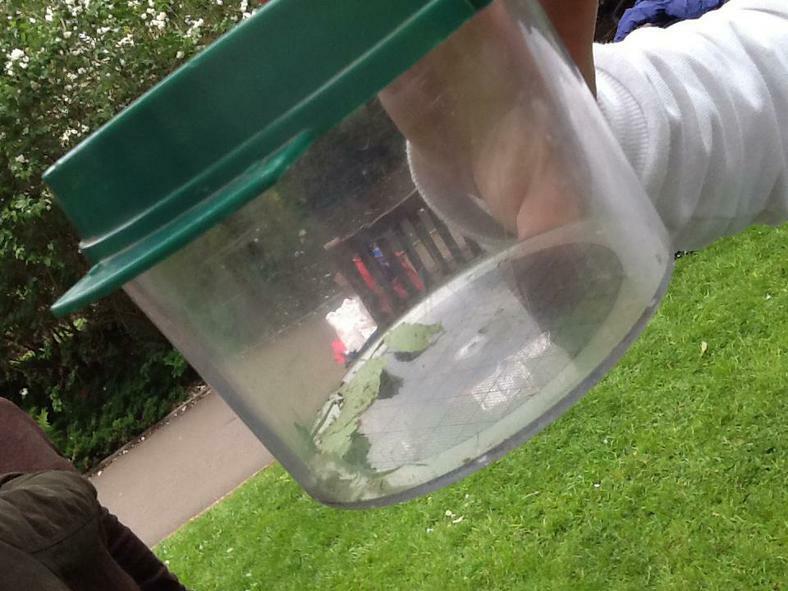 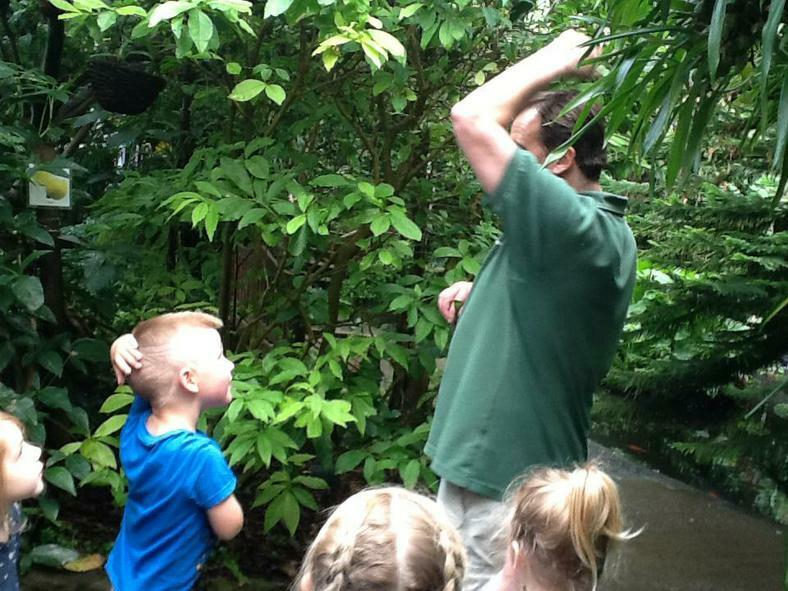 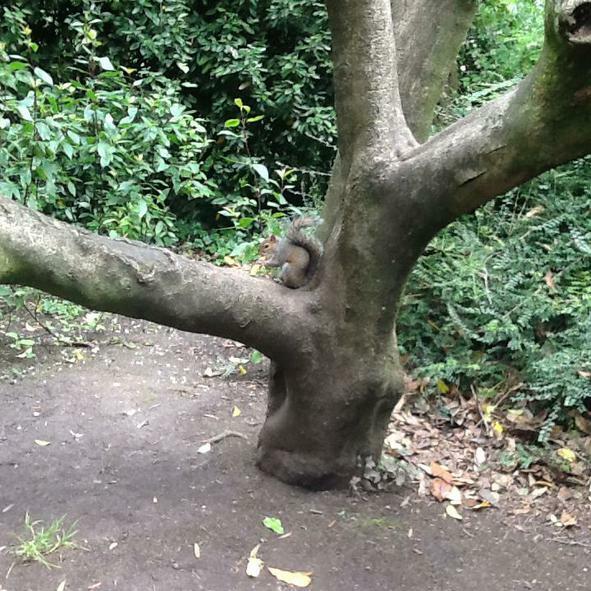 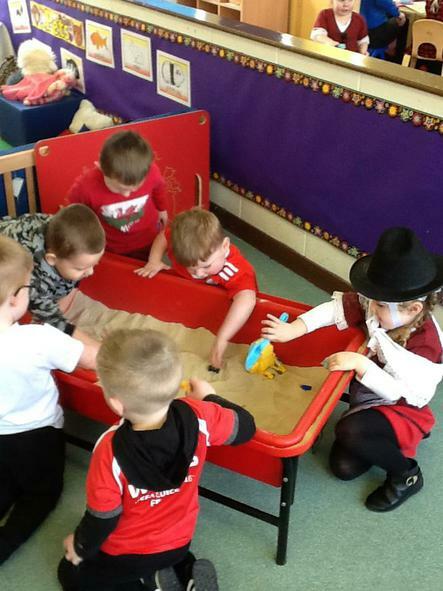 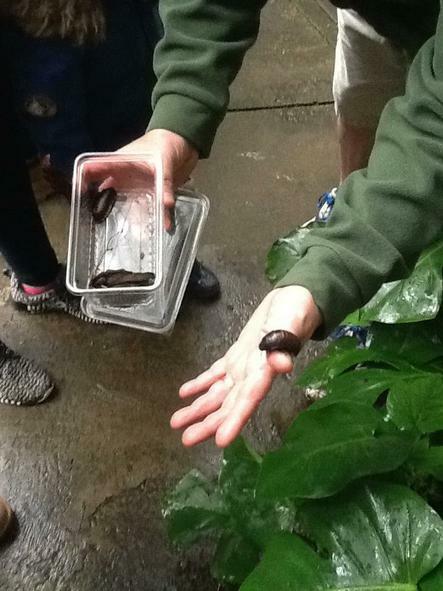 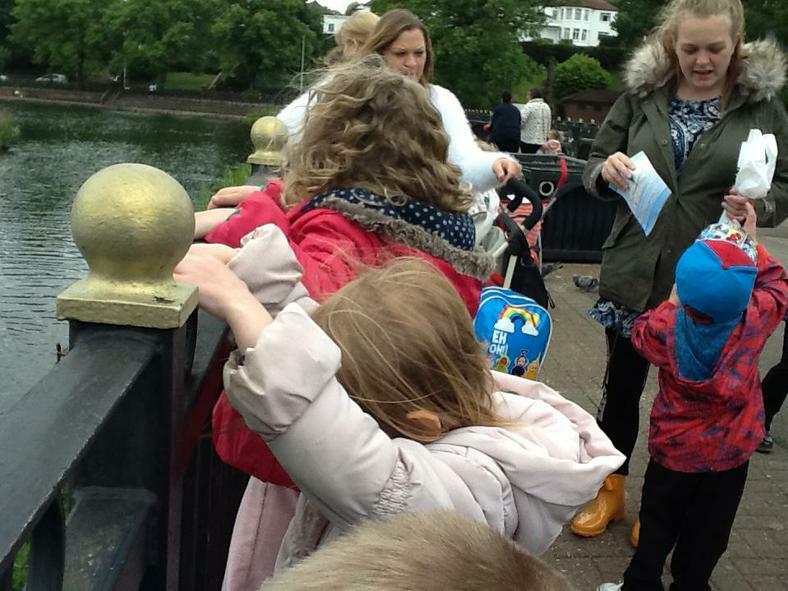 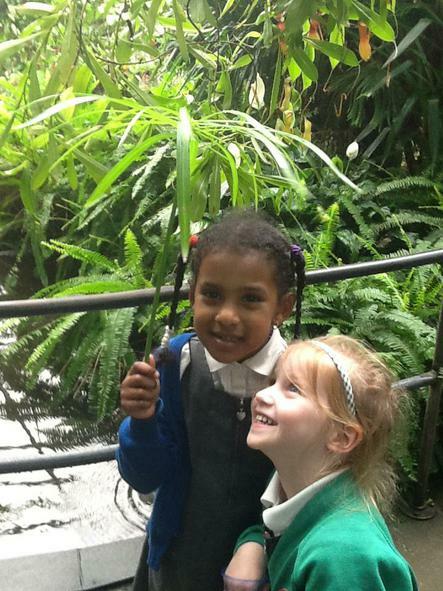 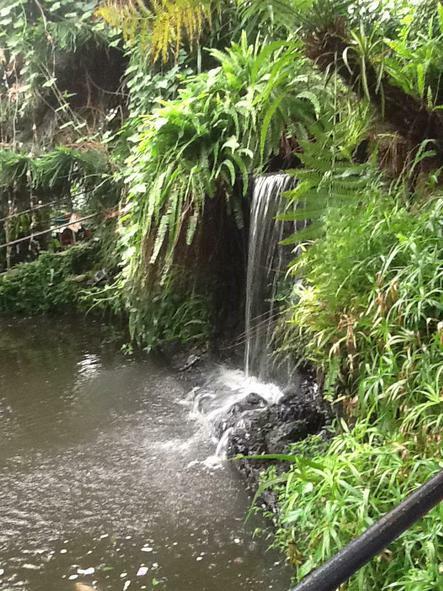 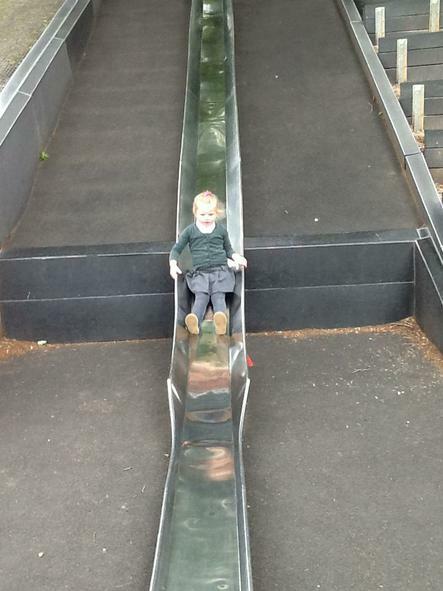 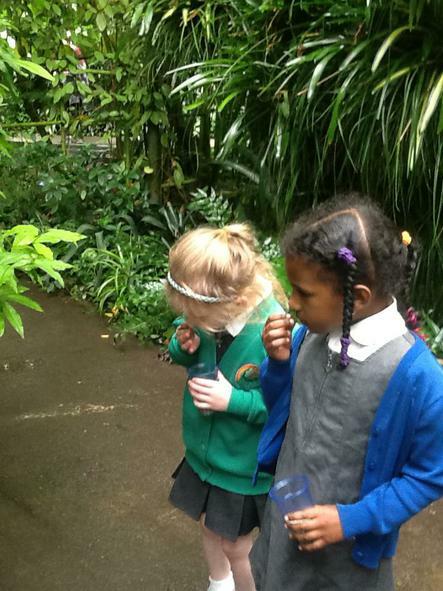 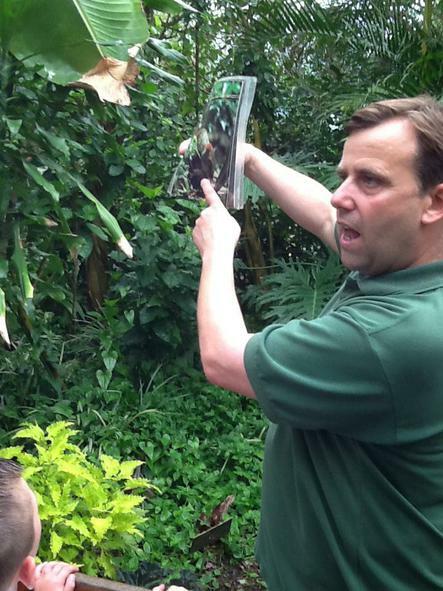 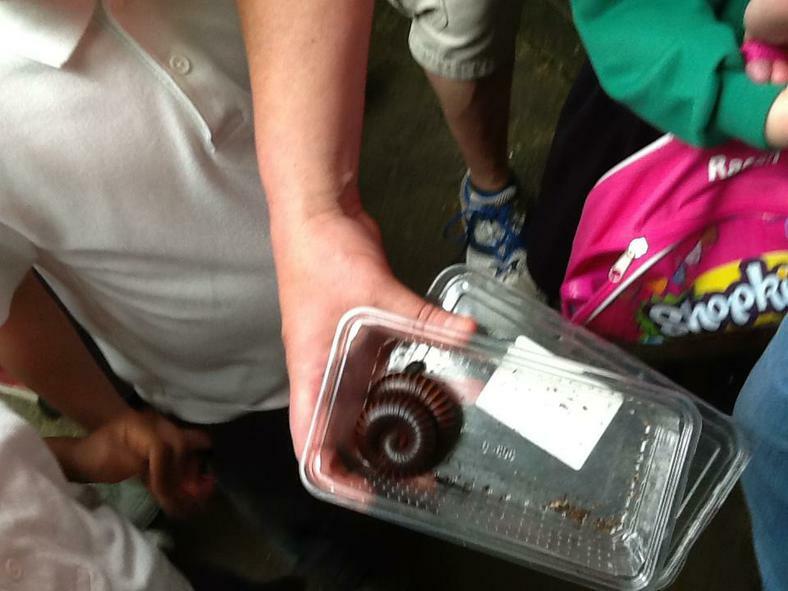 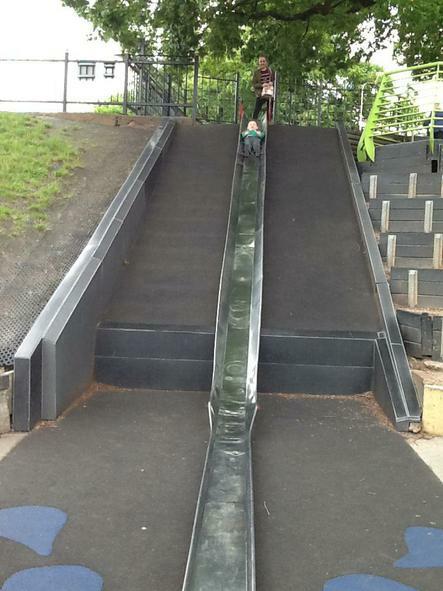 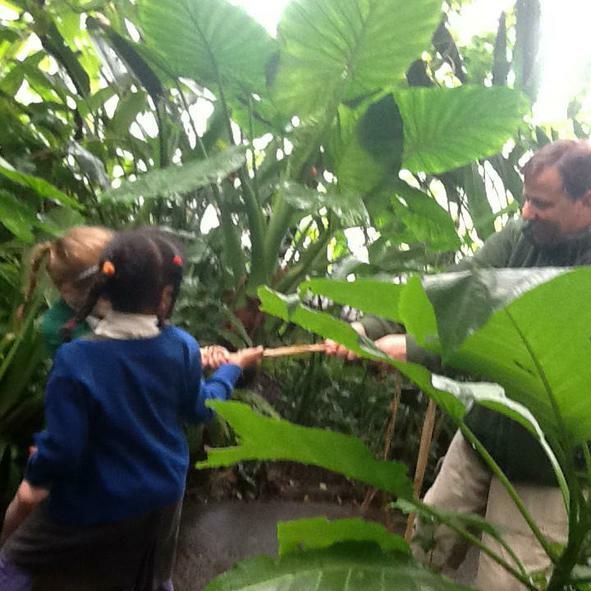 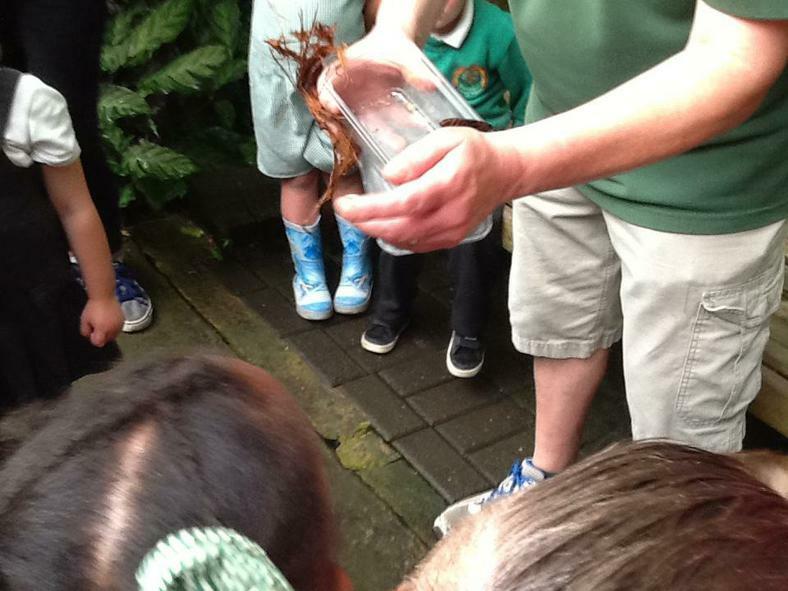 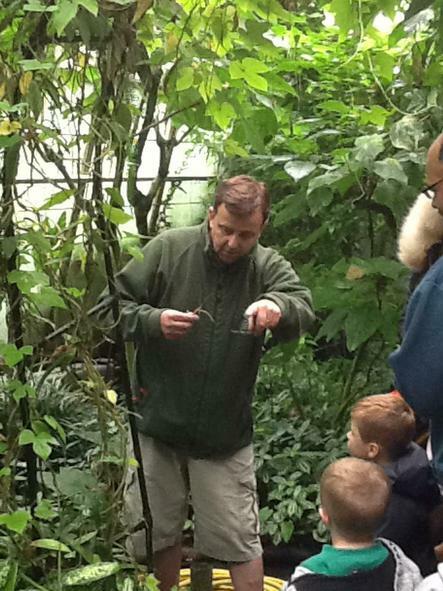 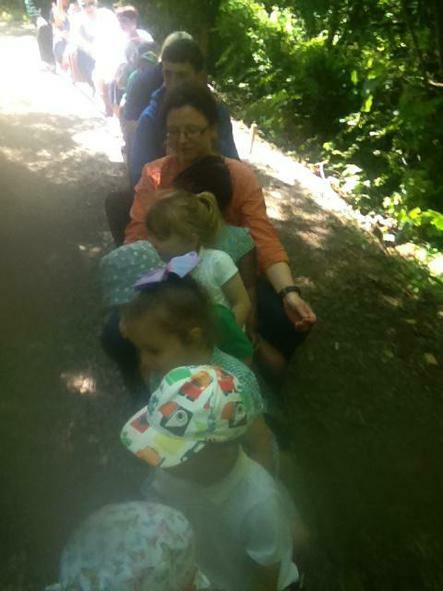 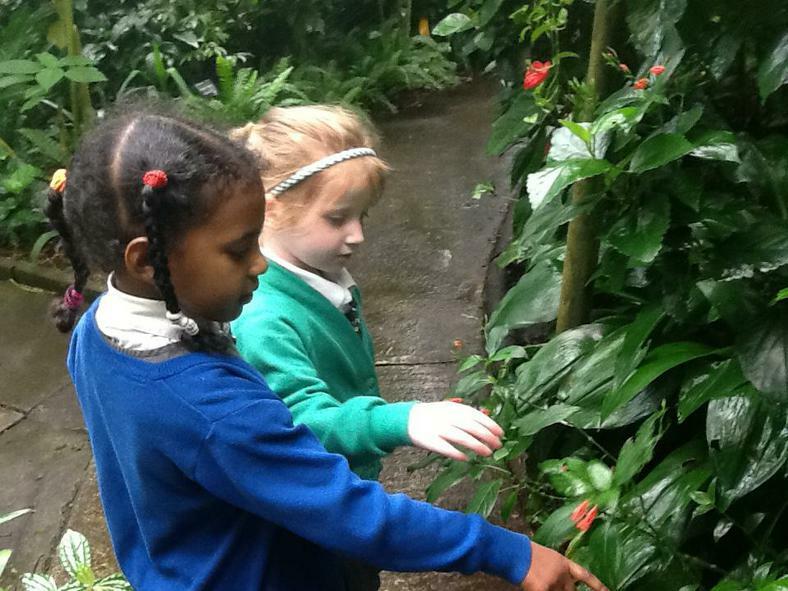 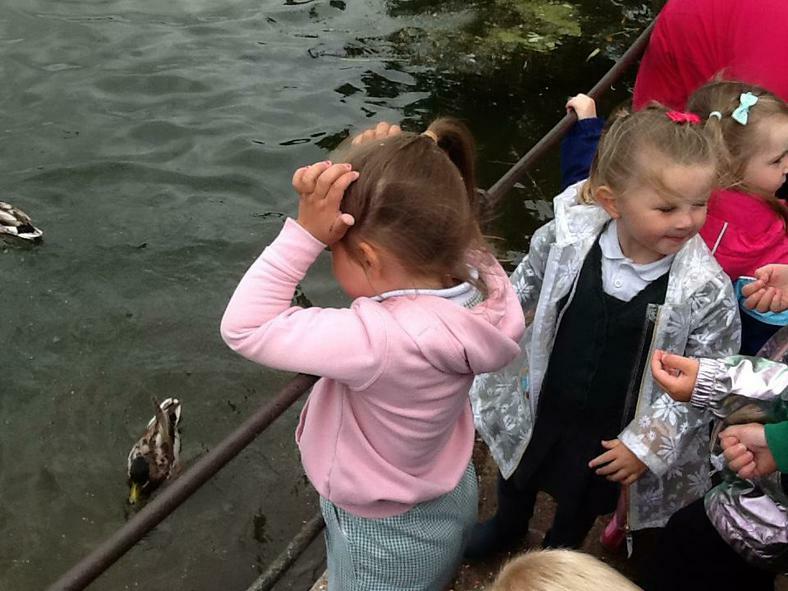 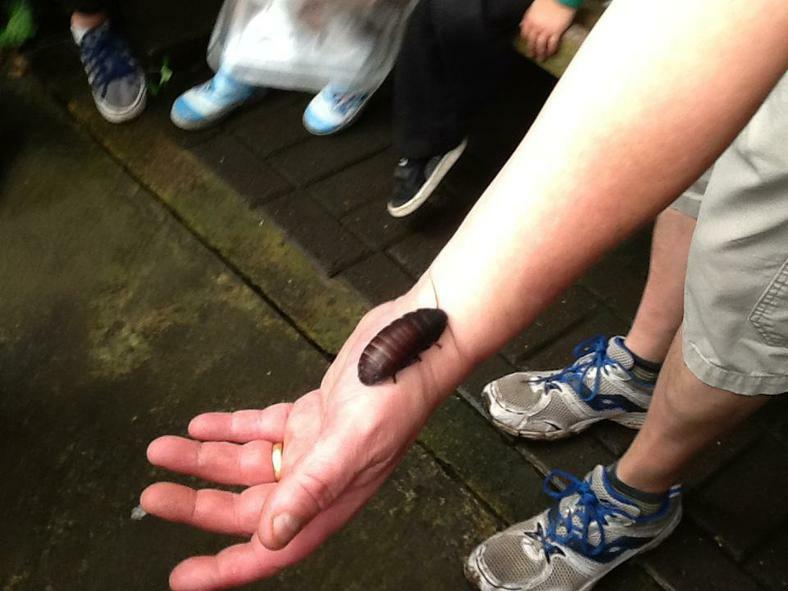 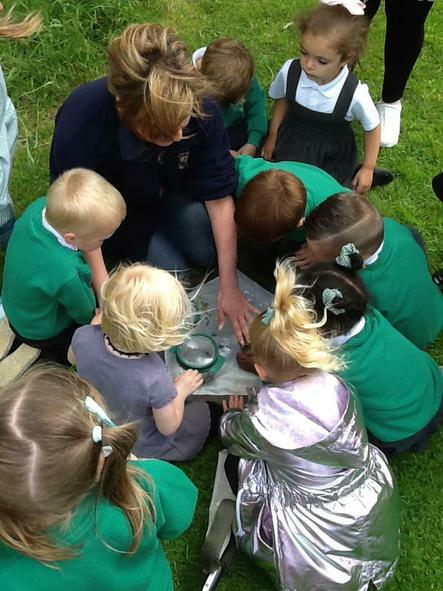 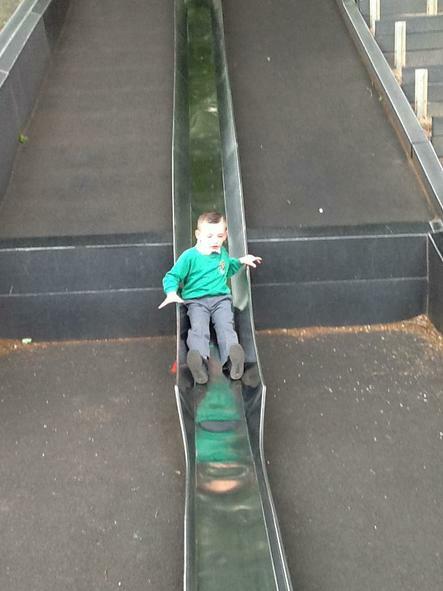 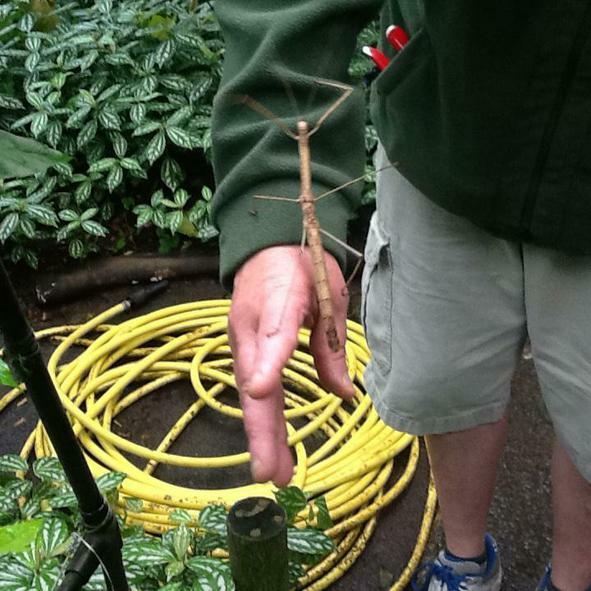 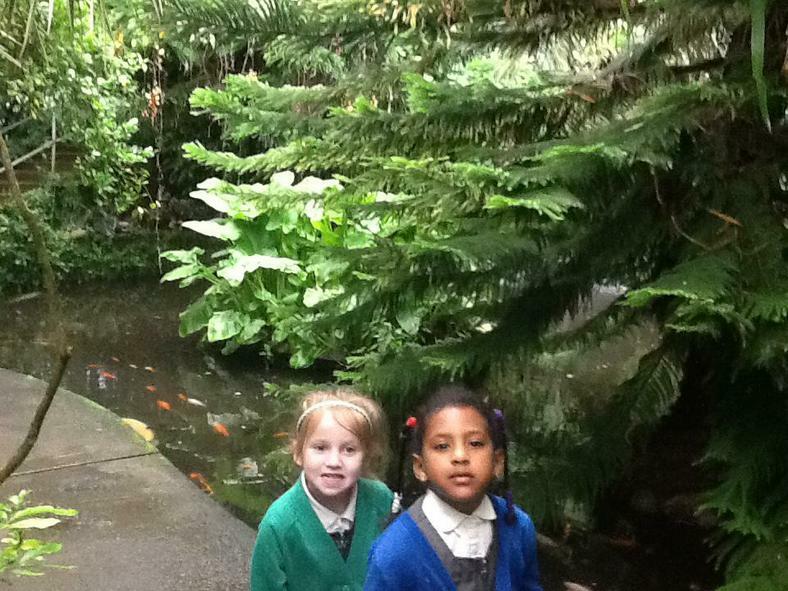 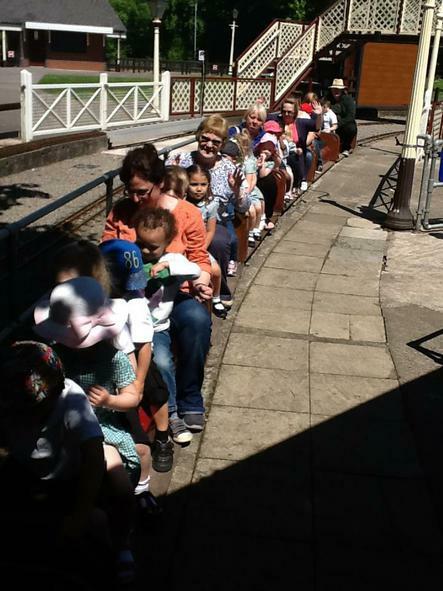 All nursery children will experience this trip over the next two weeks. 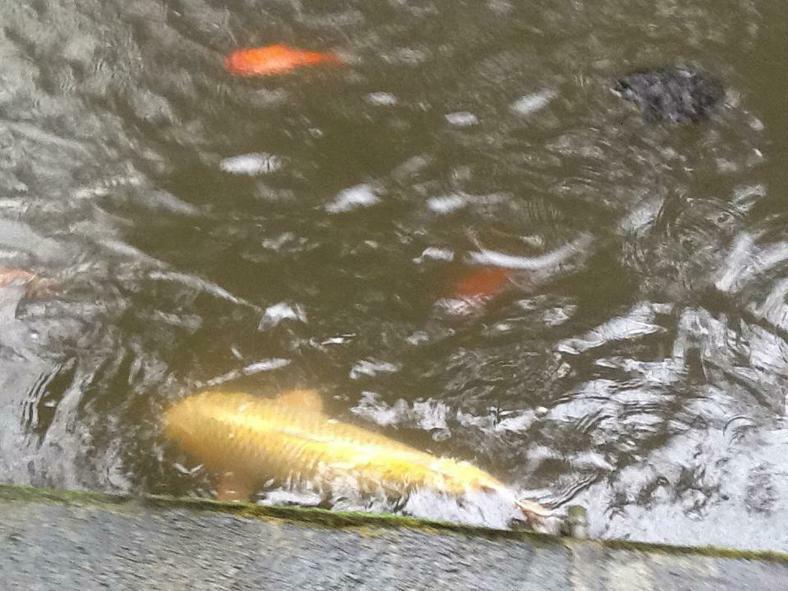 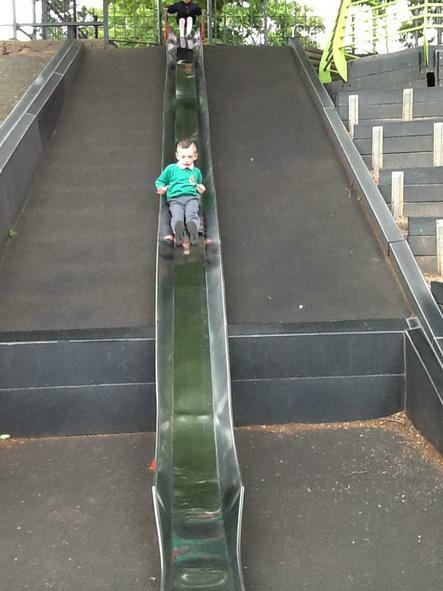 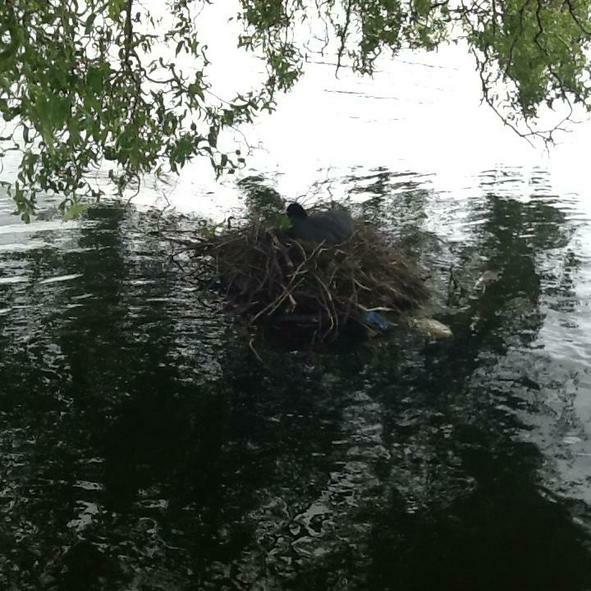 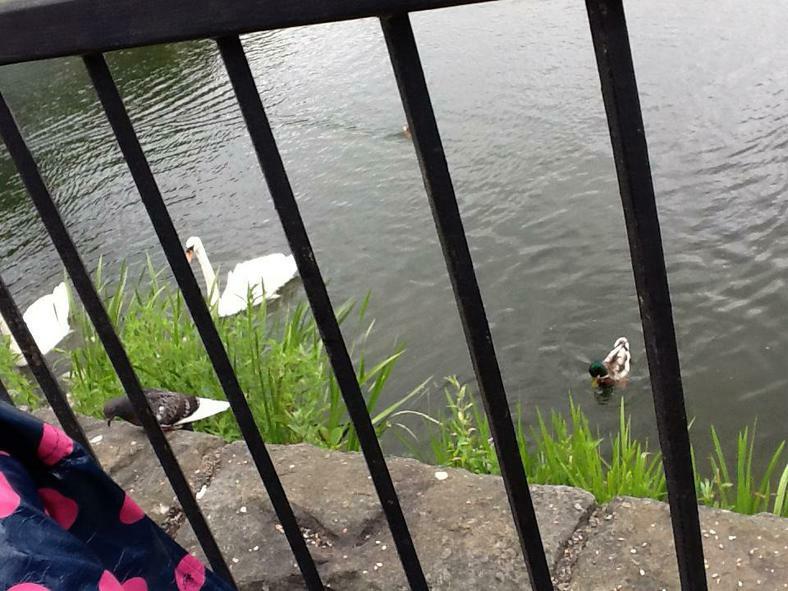 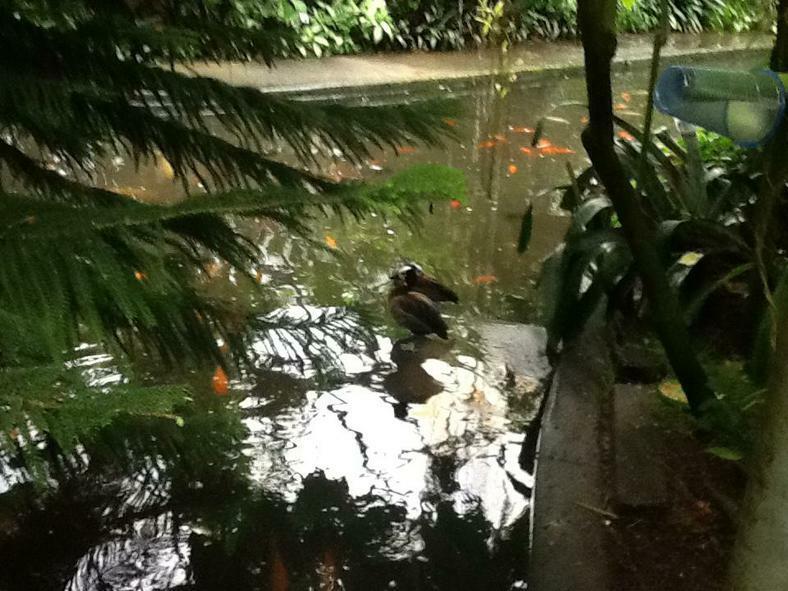 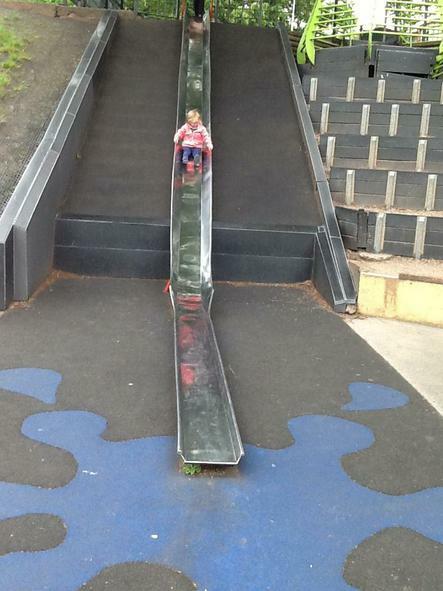 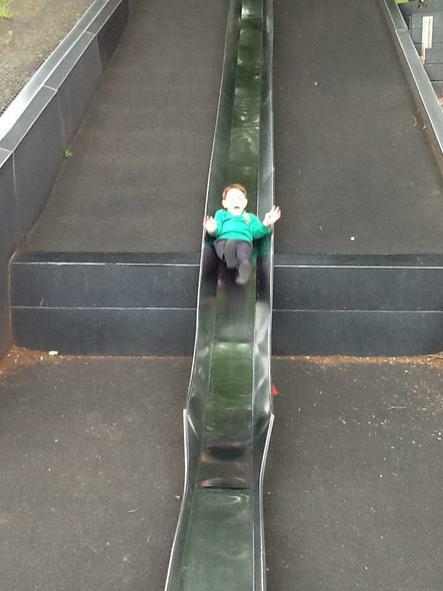 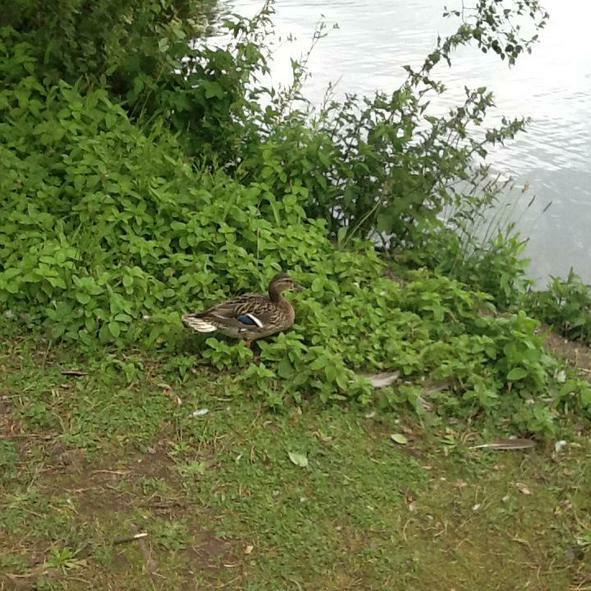 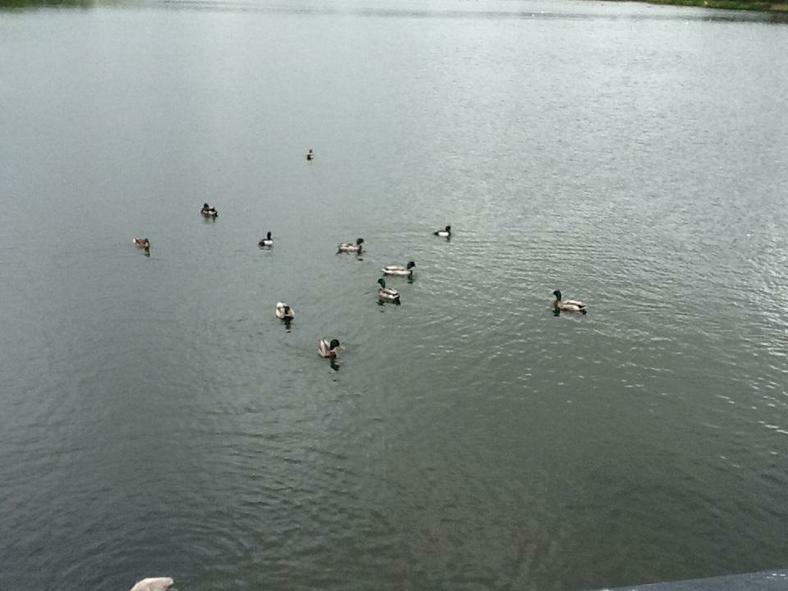 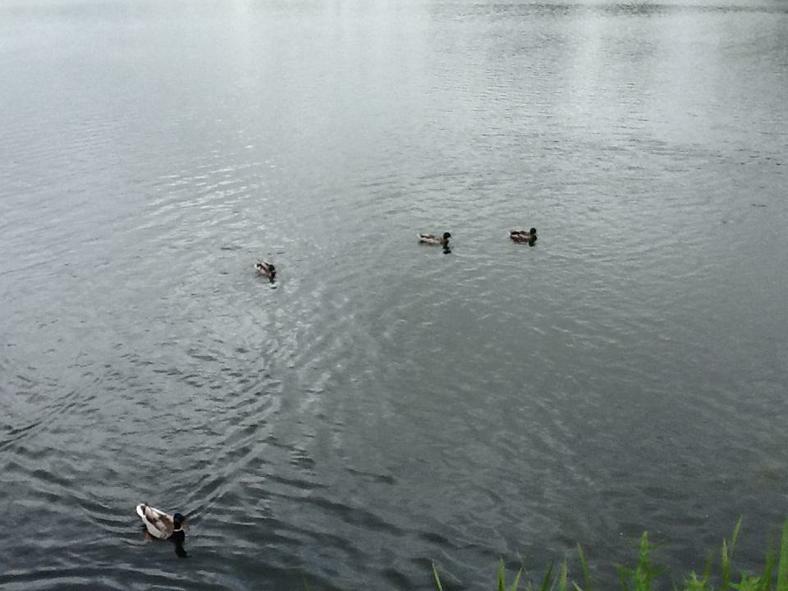 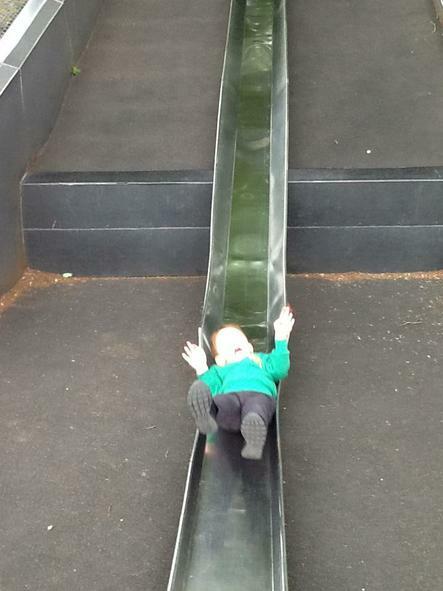 Welcome back to the Summer term. 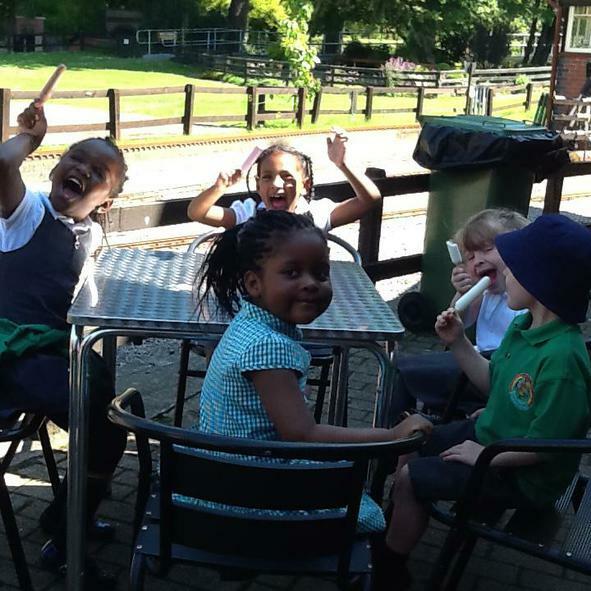 It's a six week half term where hopefully we will see an improvement in the weather and the sun shines for more than a day! 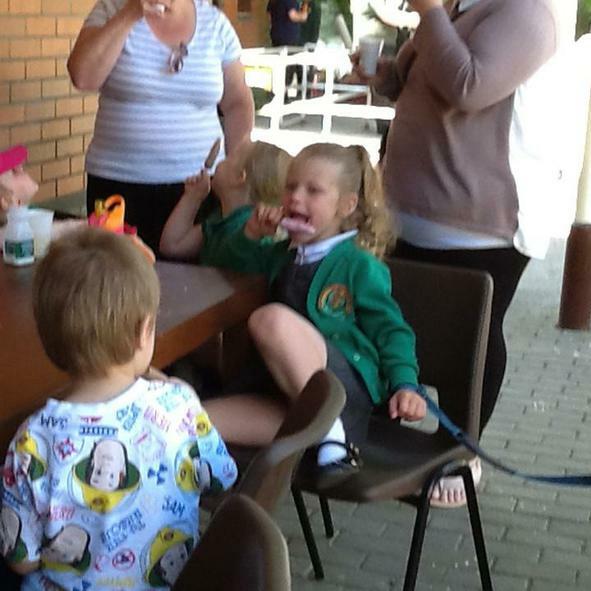 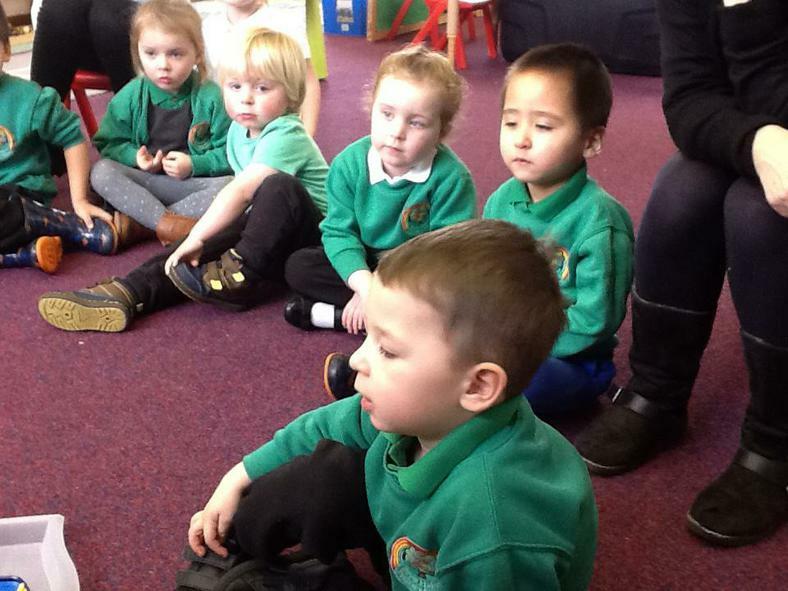 We welcome 13 new children to Nursery in the morning and afternoon sessions. 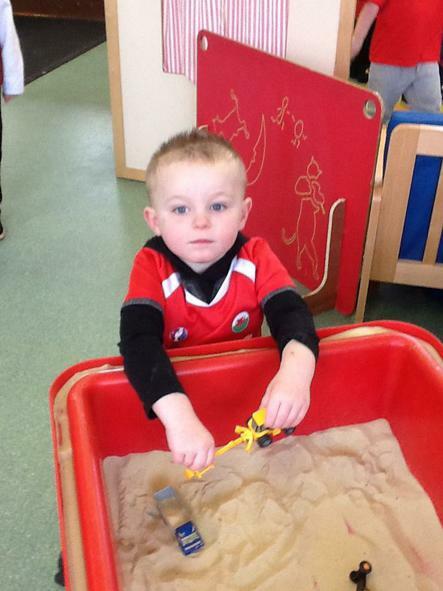 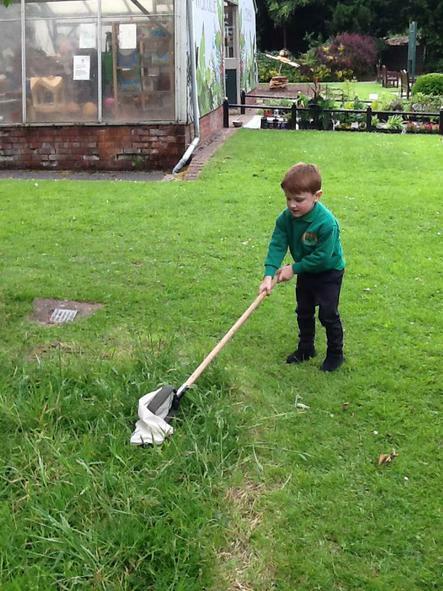 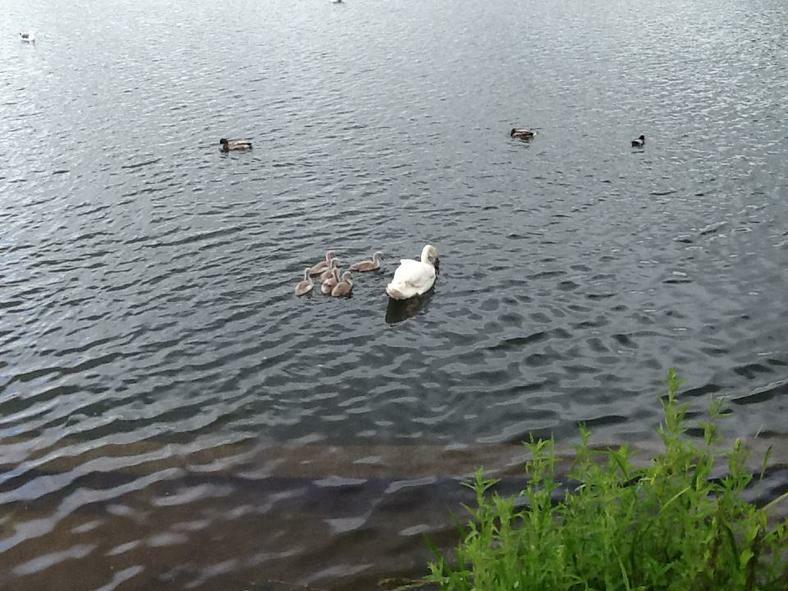 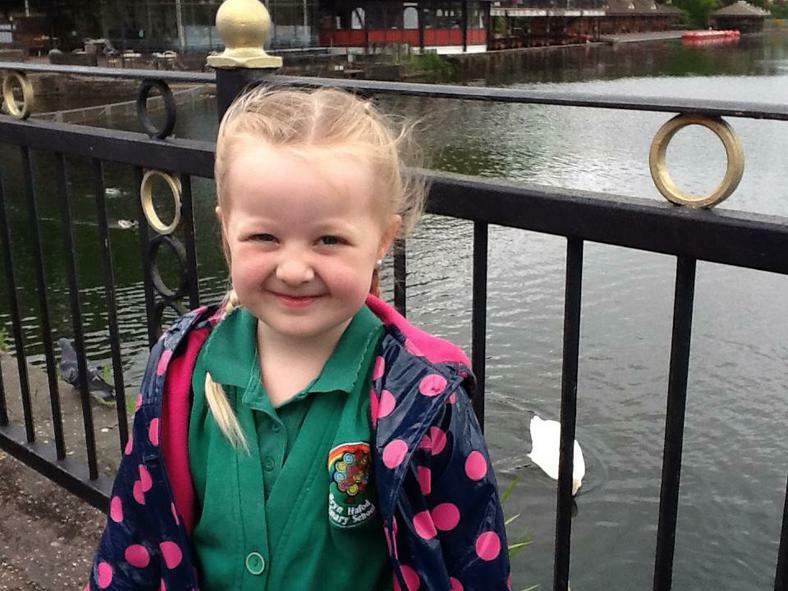 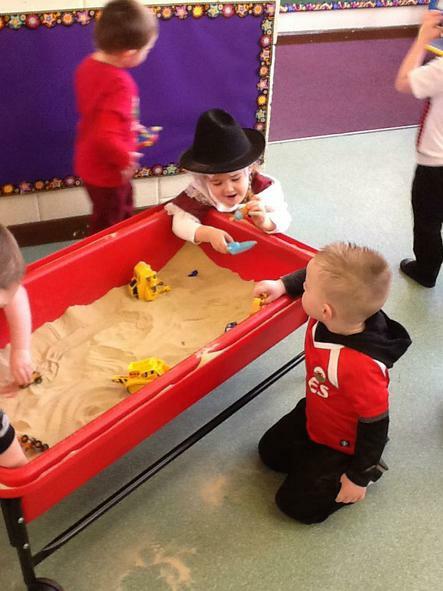 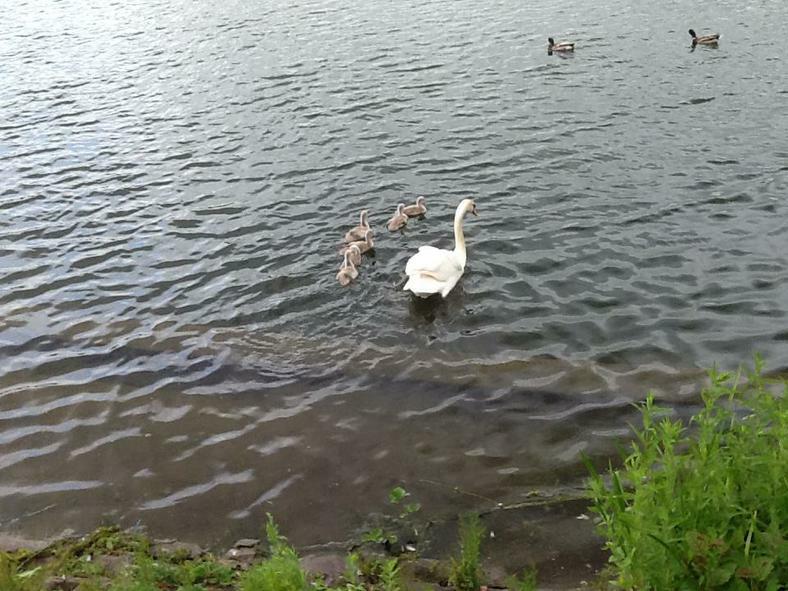 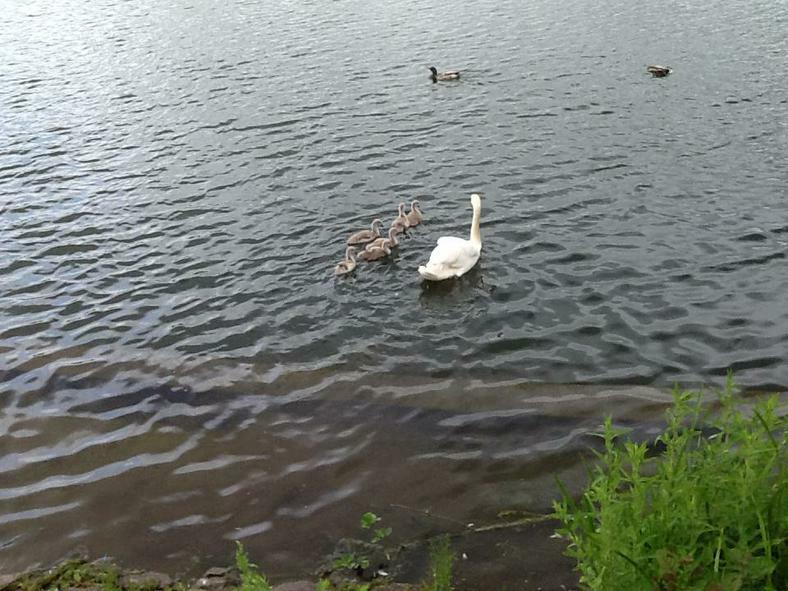 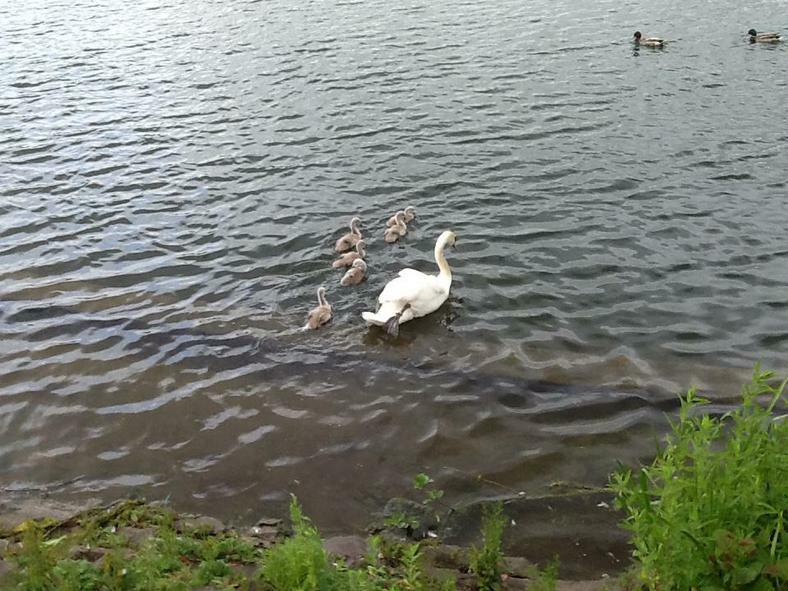 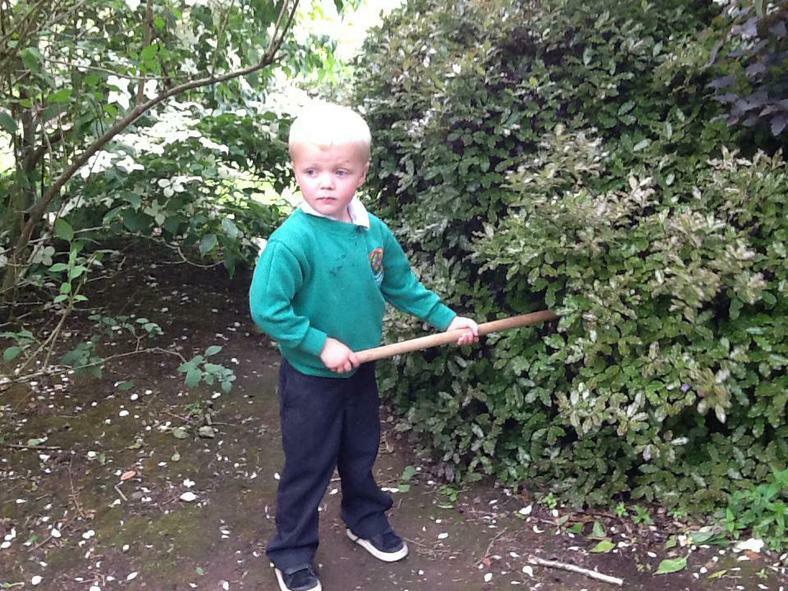 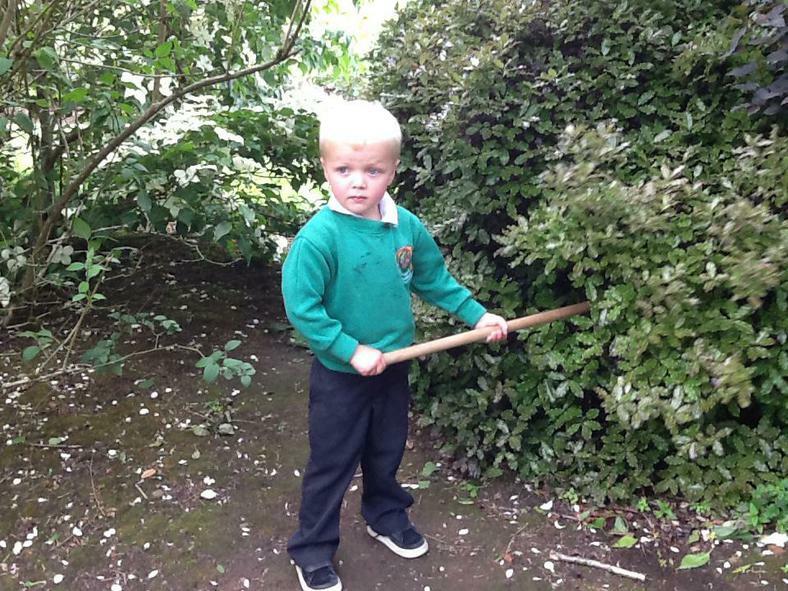 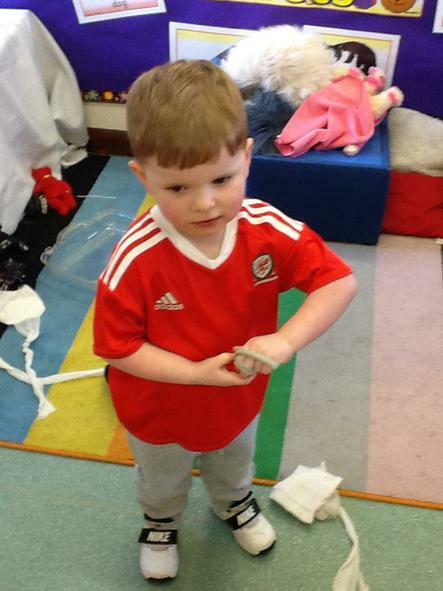 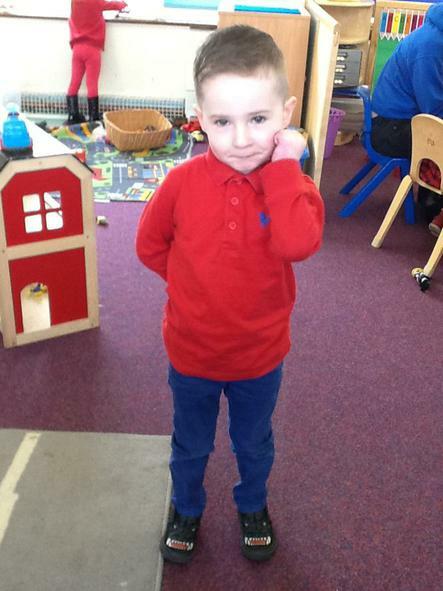 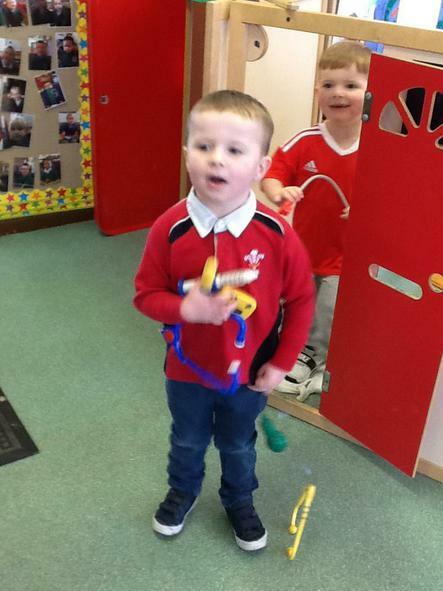 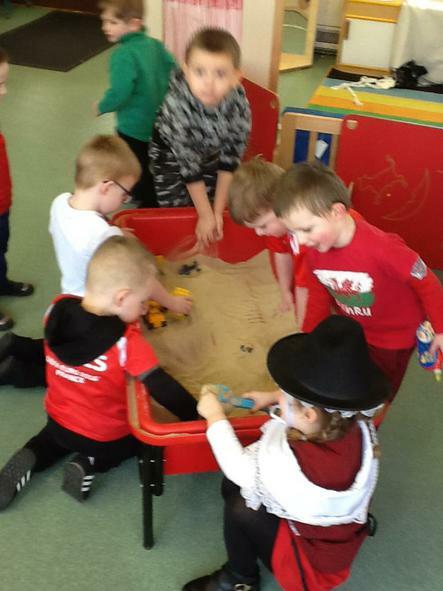 I know that you will make these new parents and children welcome to Bryn Hafod Nursery. 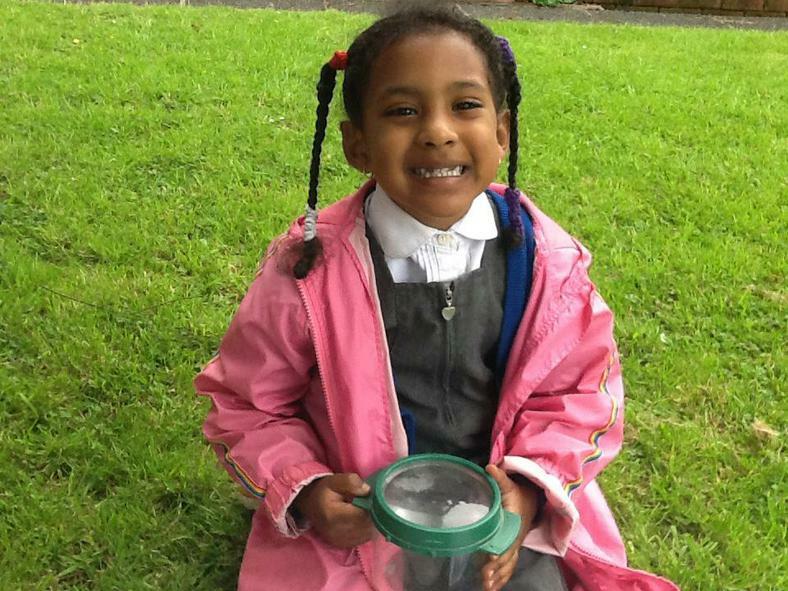 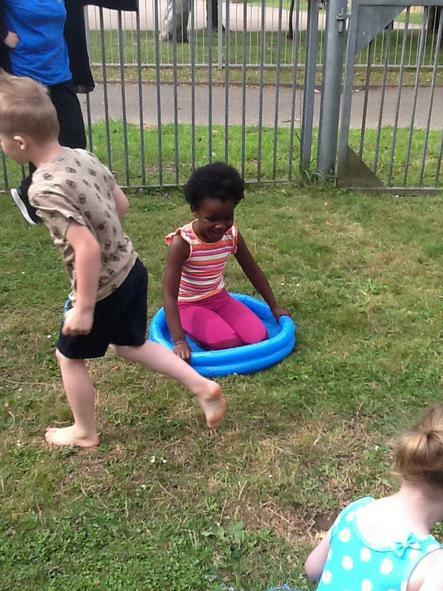 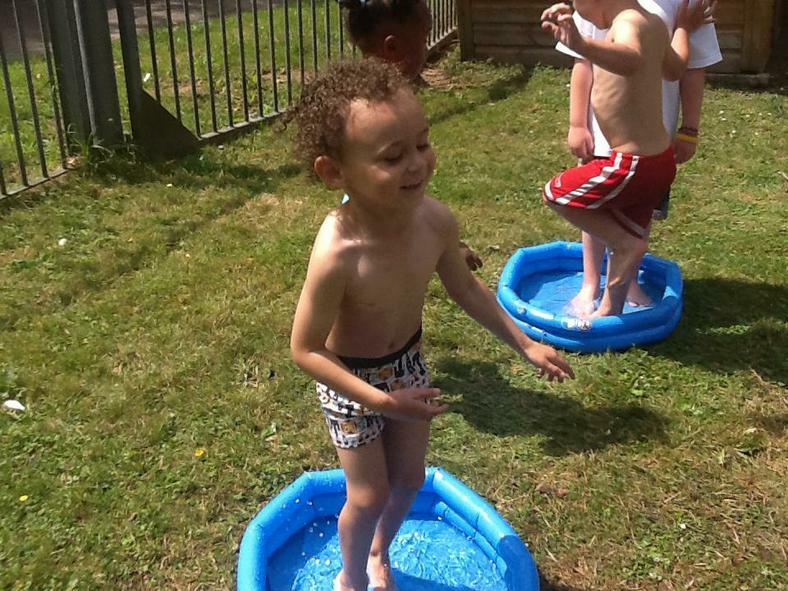 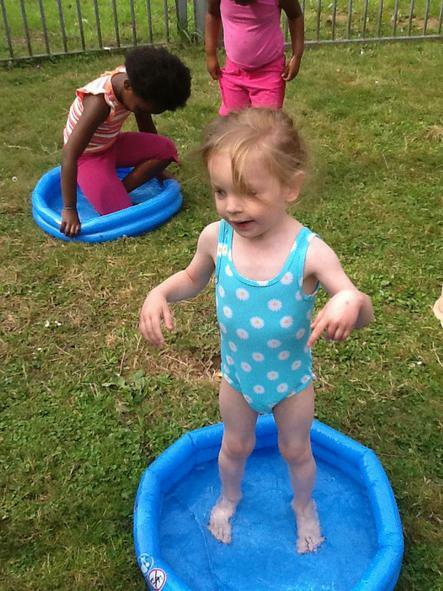 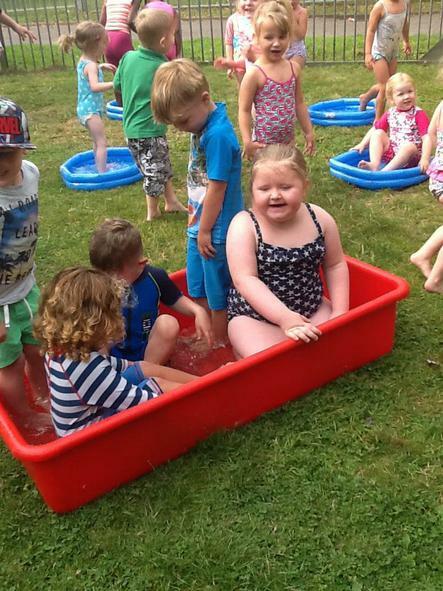 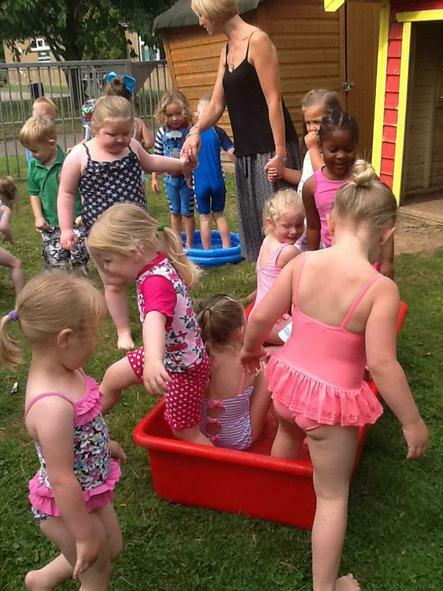 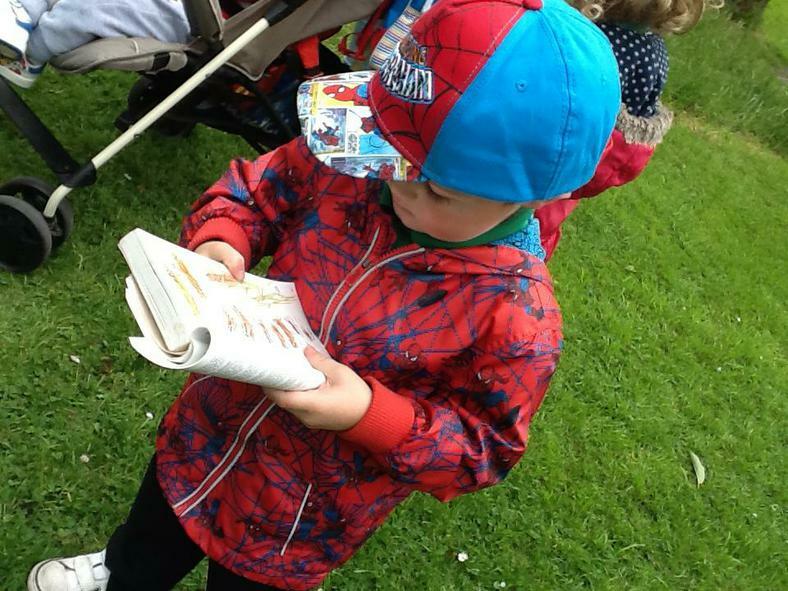 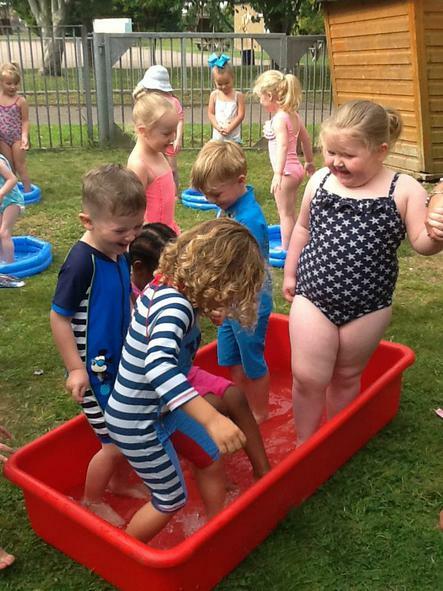 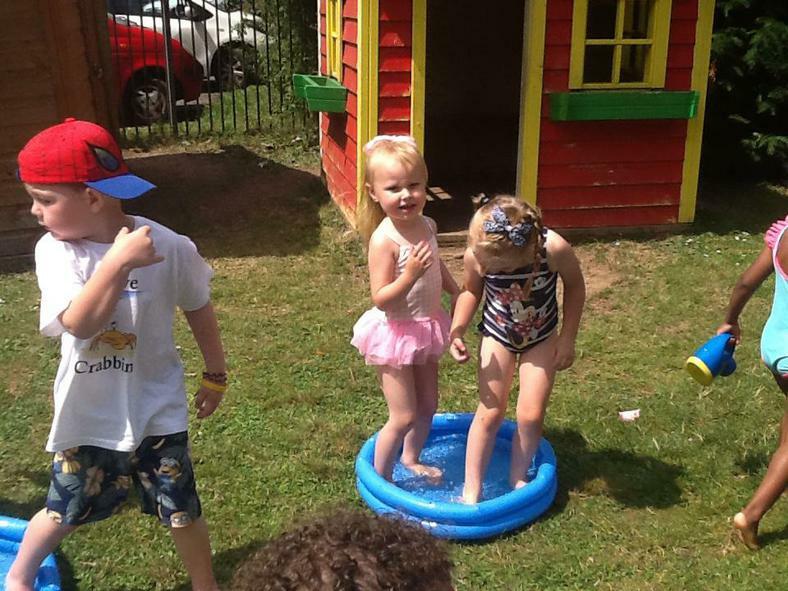 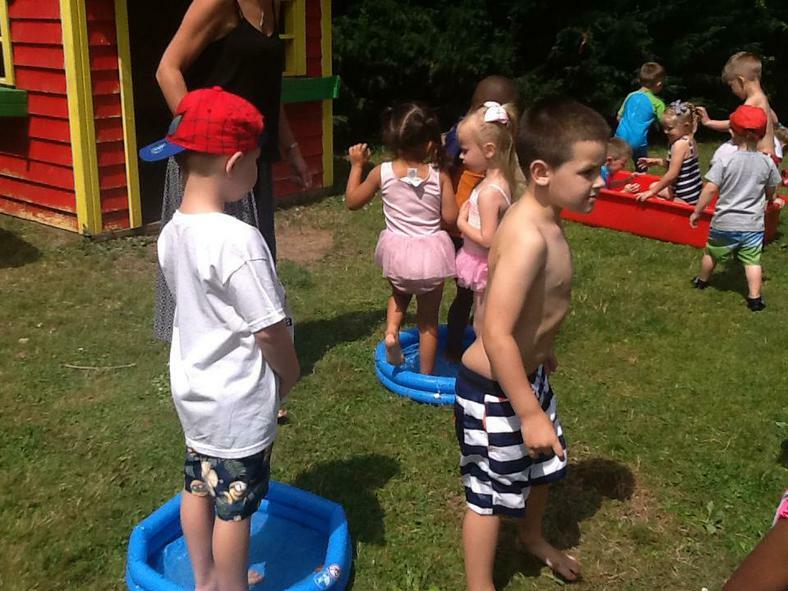 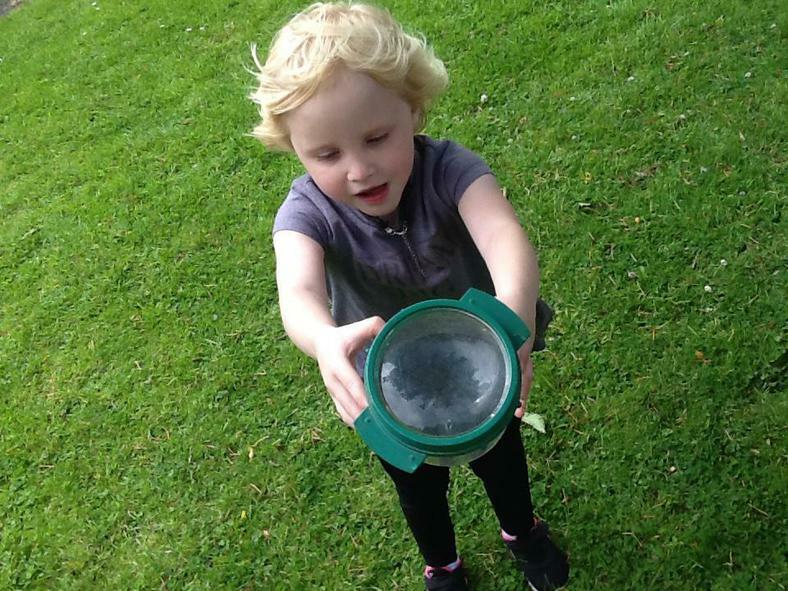 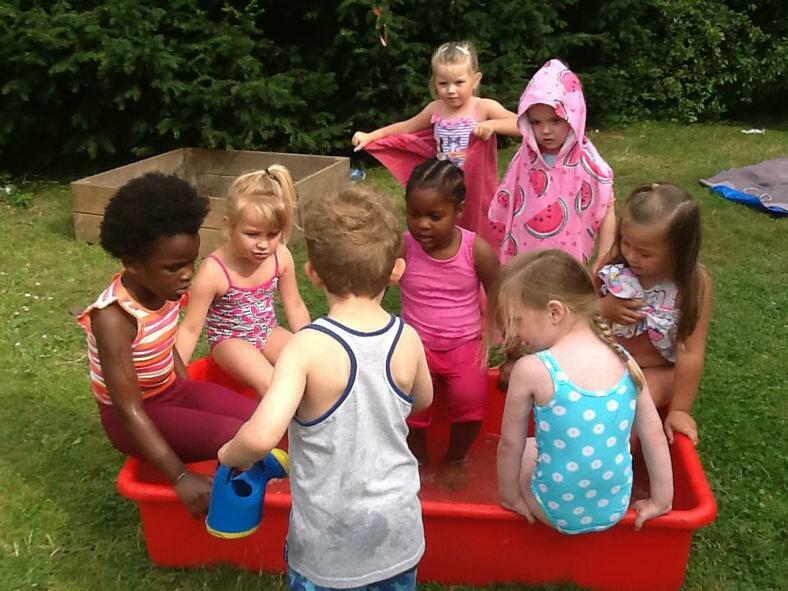 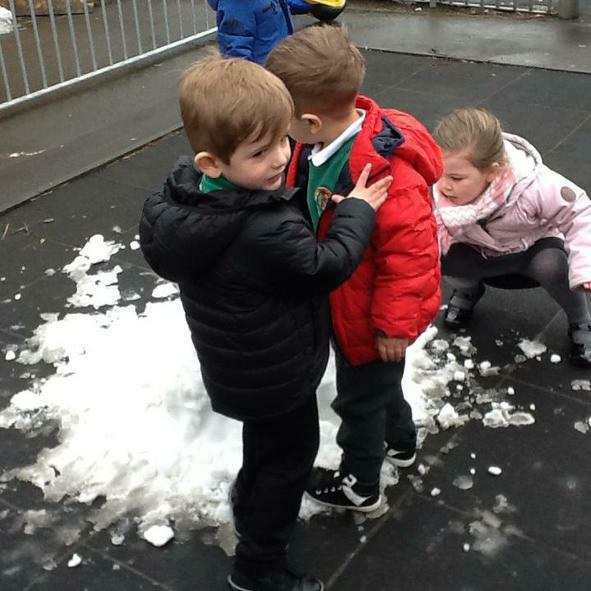 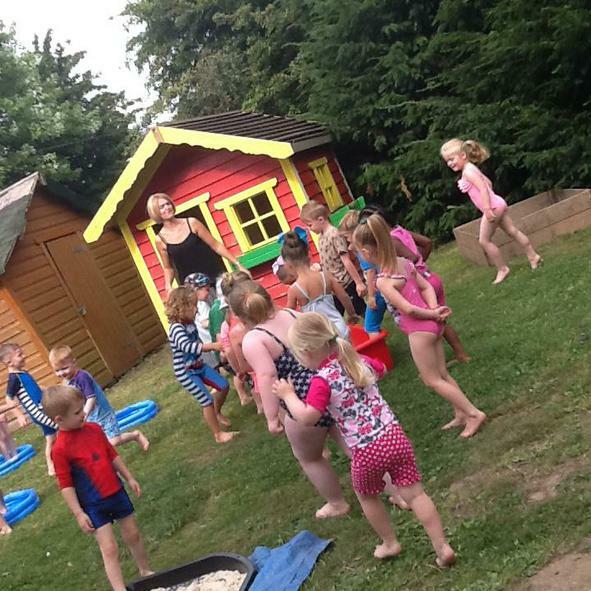 We have lots of fun activities planned for indoors and outdoors so please ensure that your children are dressed appropriately for the weather. 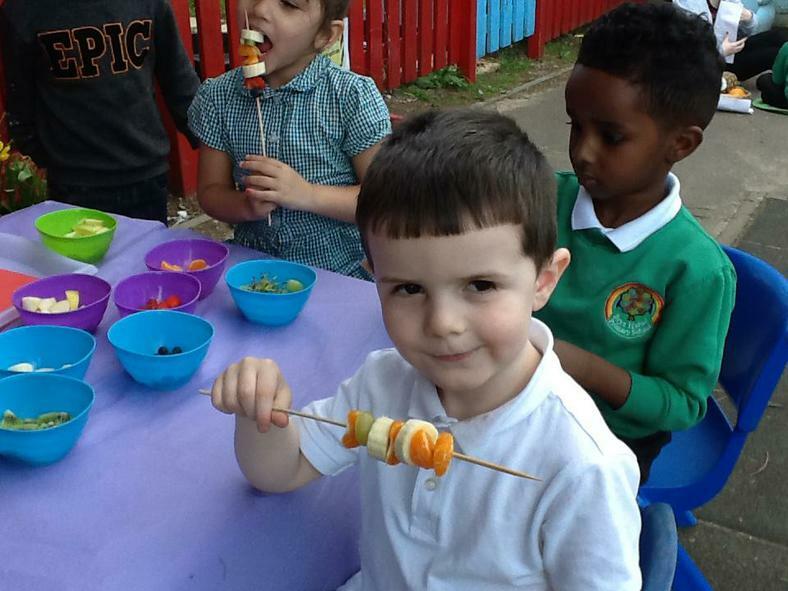 A gentle reminder for snack money, £1 a week, please ensure that you pay as it needs everyone paying to make it successful. 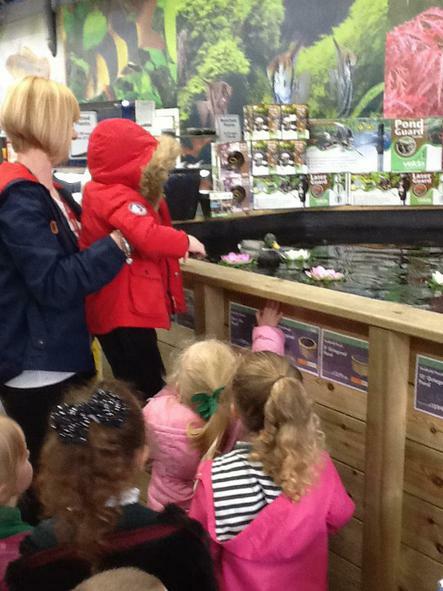 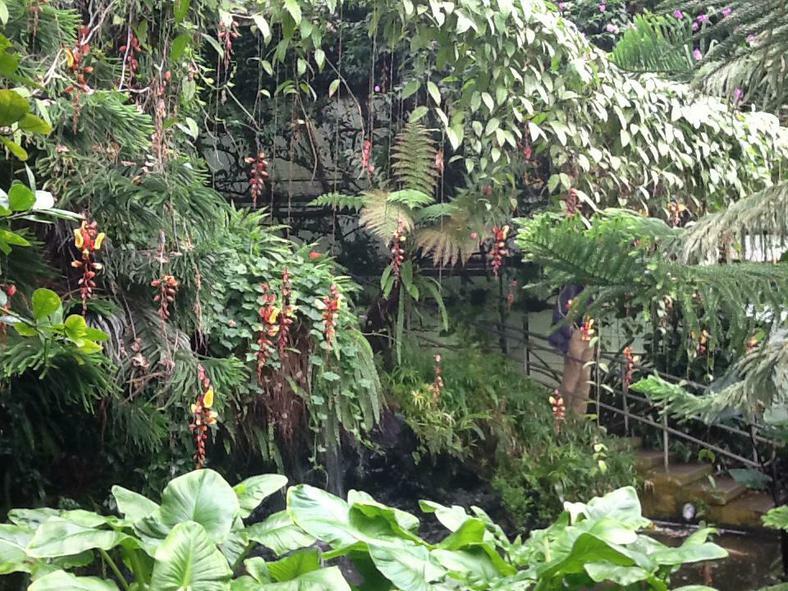 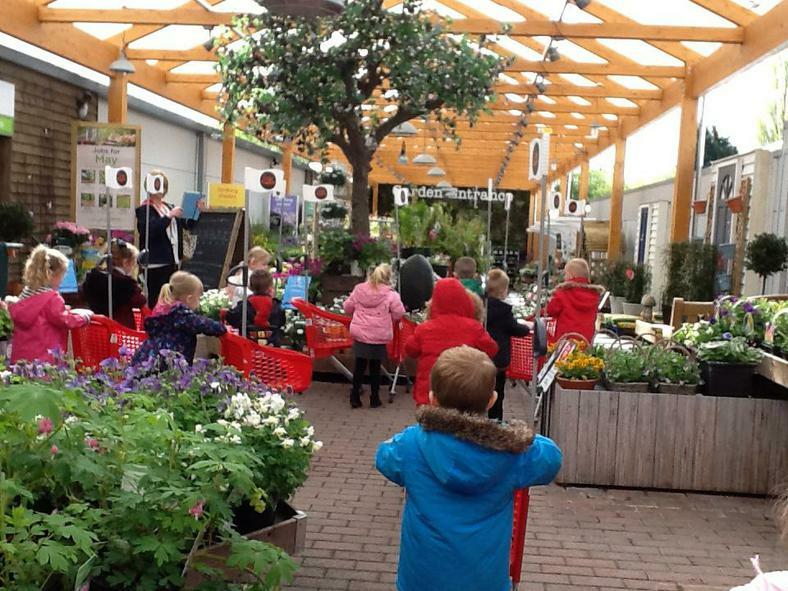 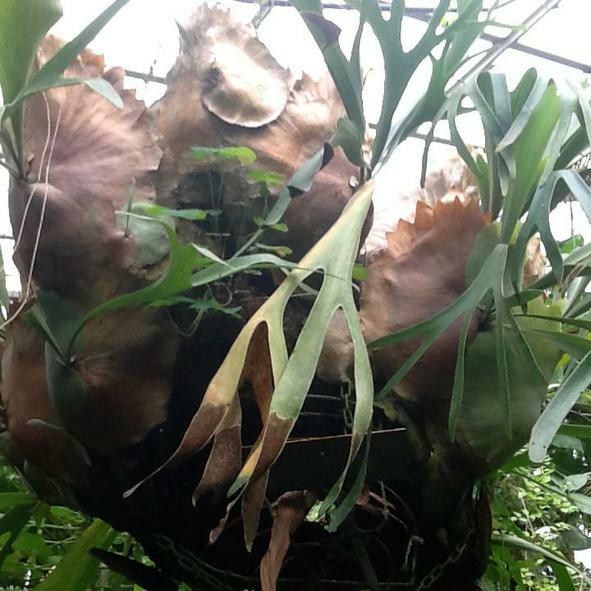 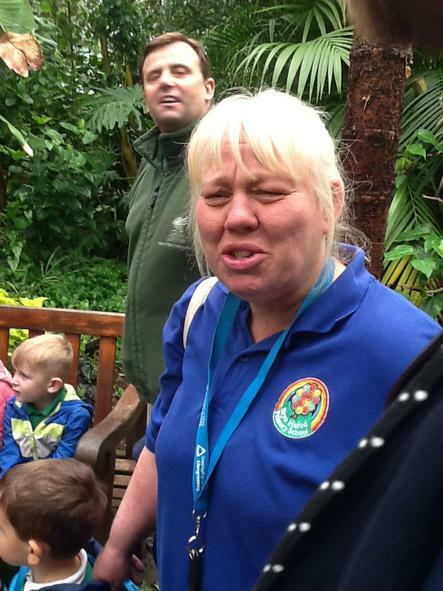 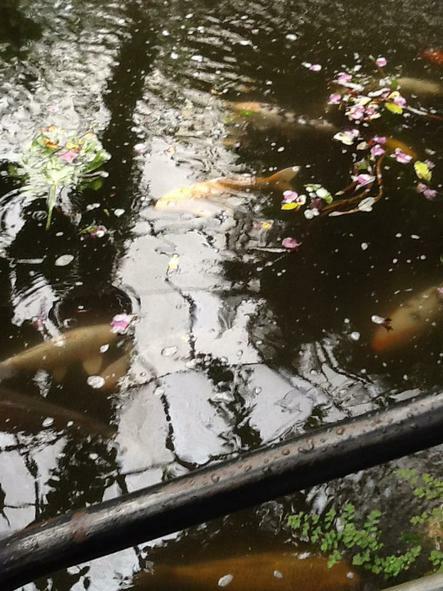 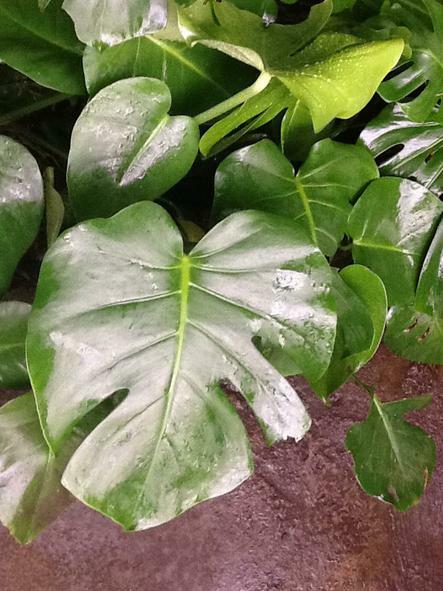 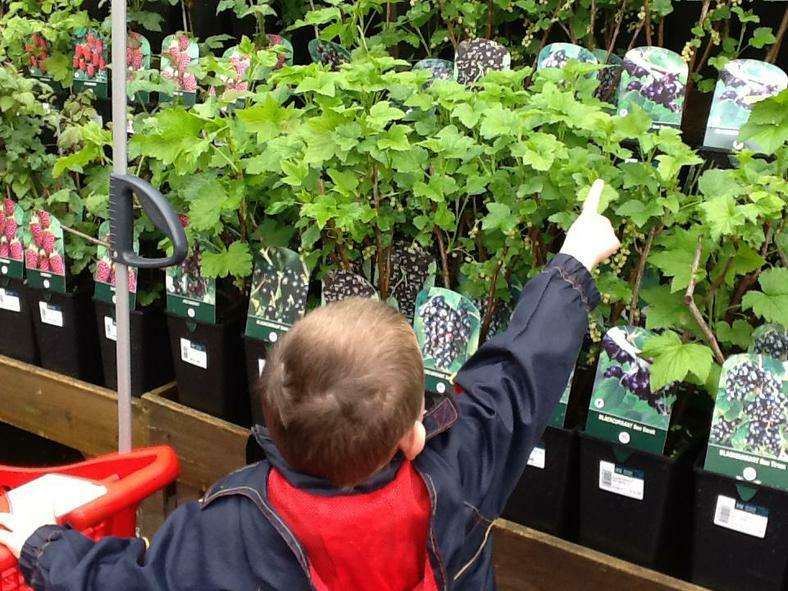 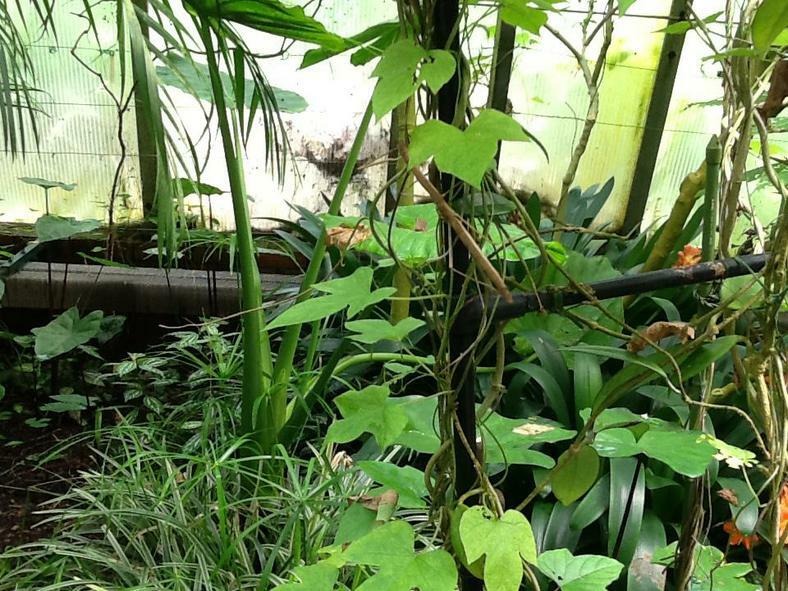 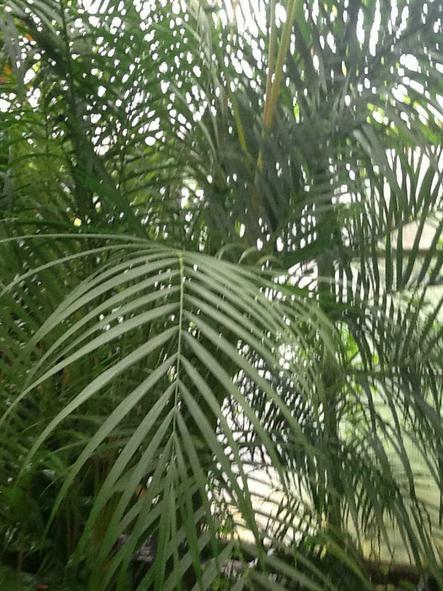 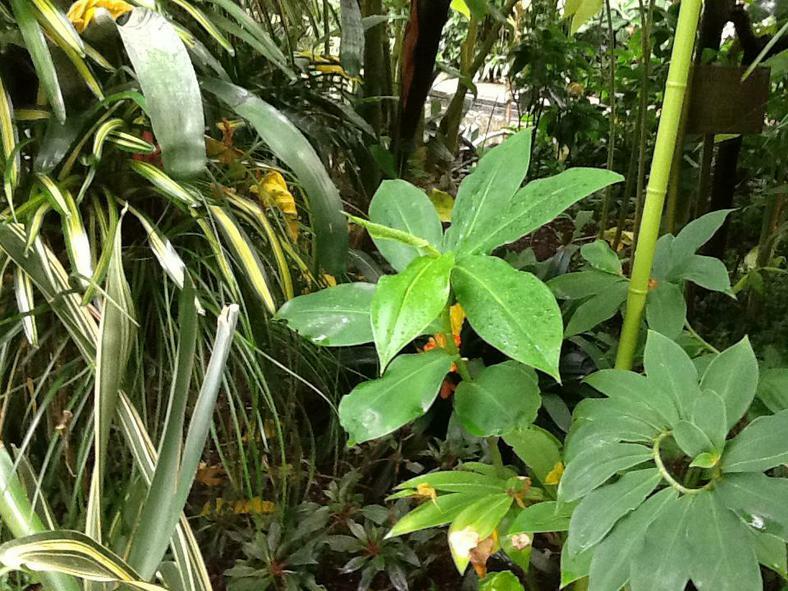 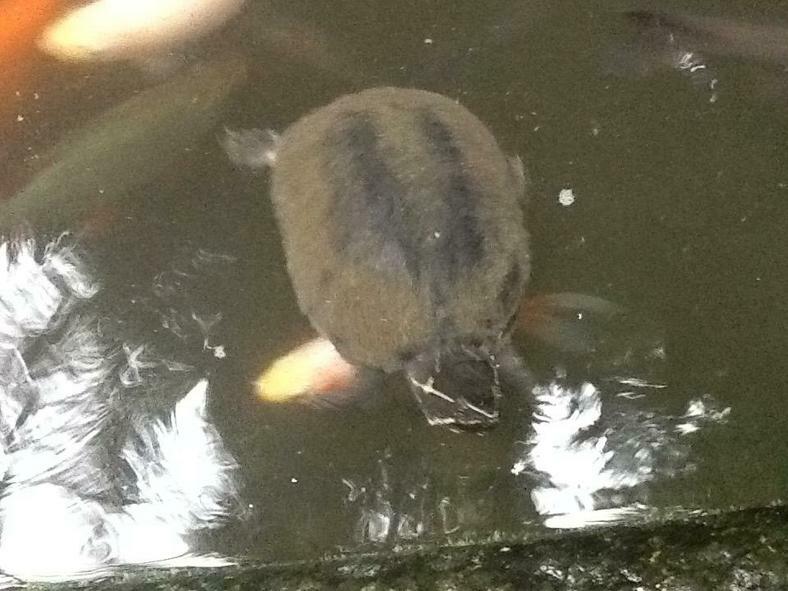 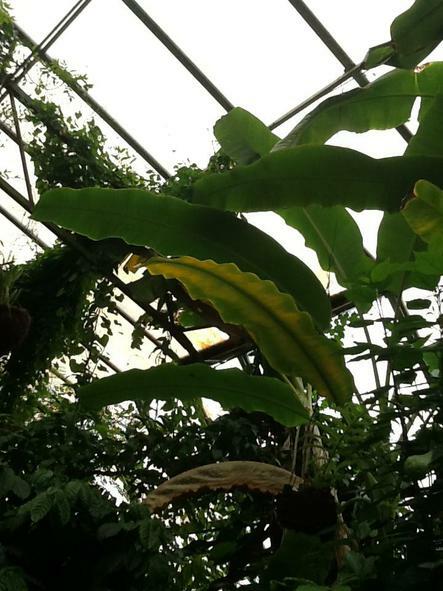 I have arranged for us to visit Wyevale Garden Centre during various dates in May, we will be looking at plants, fish and having a play in the lovely play area there during these visits. 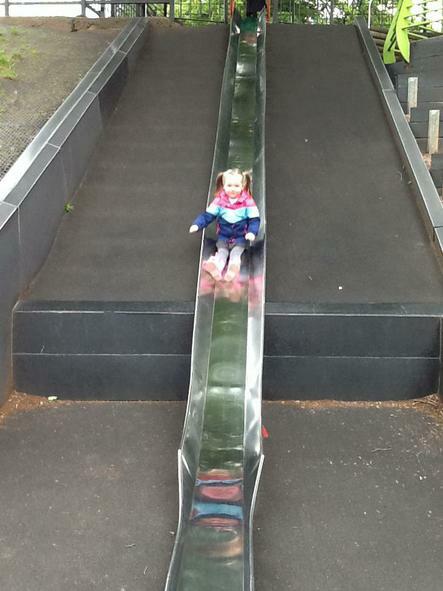 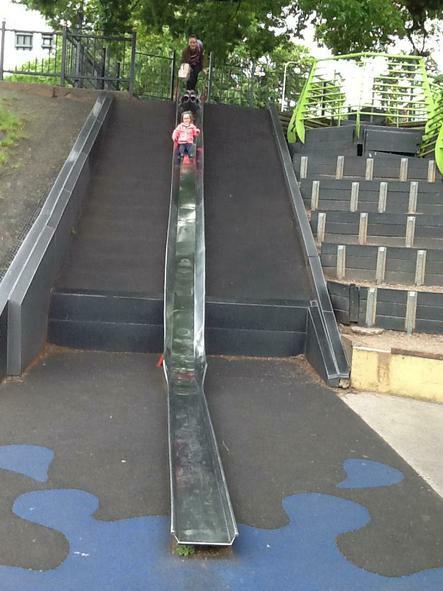 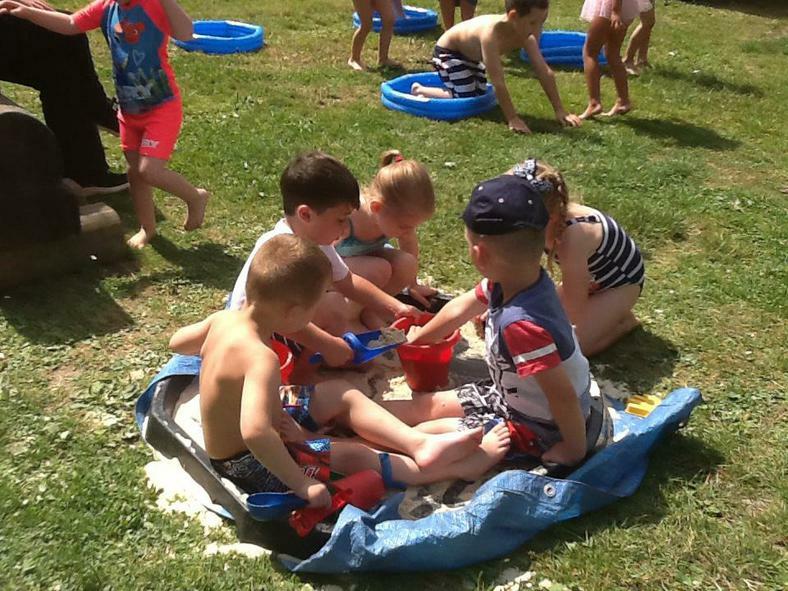 I will be driving the minibus to keep costs down so we will be charging a small amount of £2 to cover the cost of the play area (usually £3, but we are allowed in for £1.50 and 50p to cover the minibus cost). 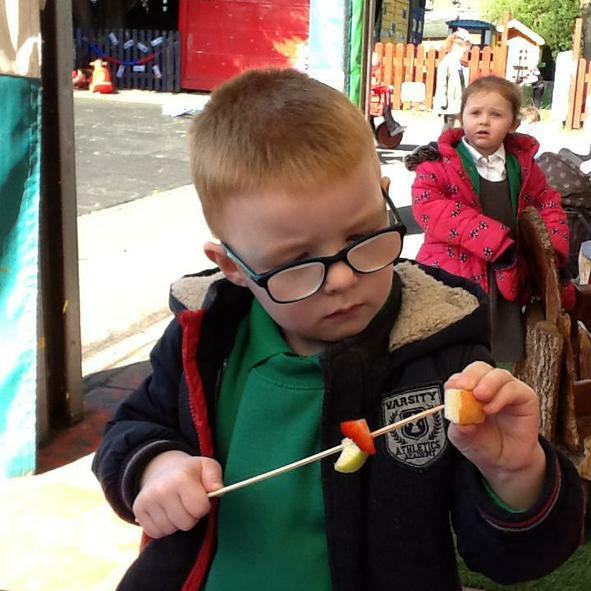 We will be focussing on various books to enhance our learning this term, starting with the lovely 'Handa's Surprise'last week, this week 'The Tiny Seed', and next week Oliver's Vegetables. 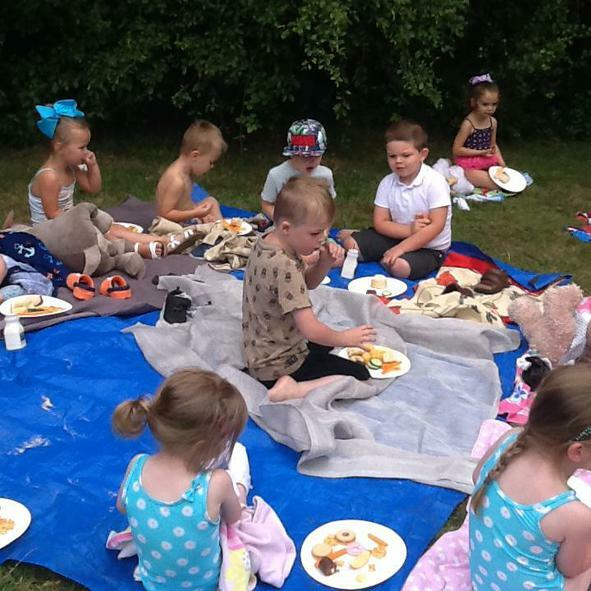 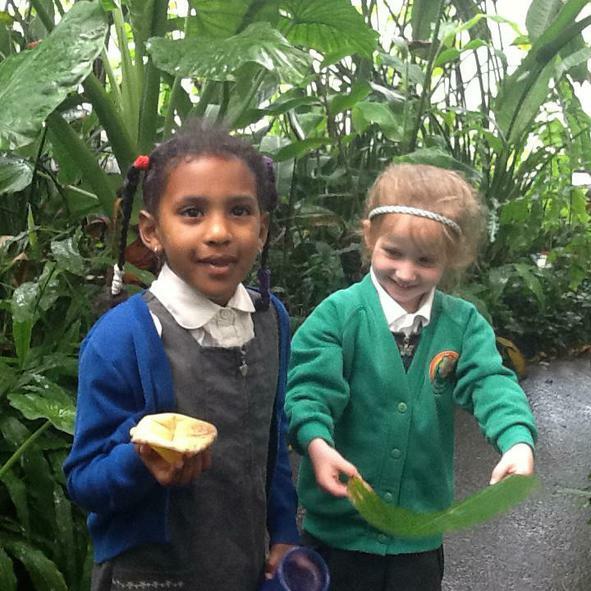 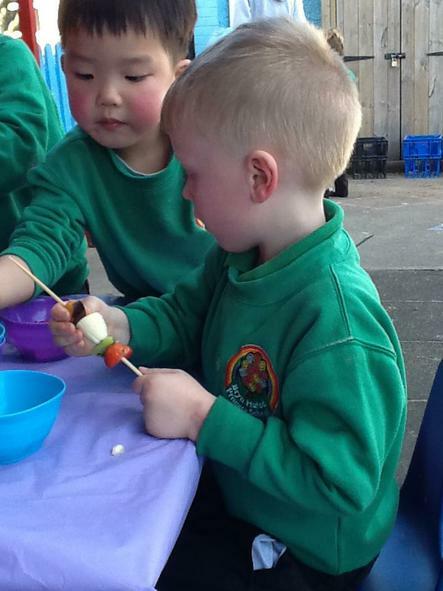 We have lots more photos from our various activities linked to Handa's Surprise. 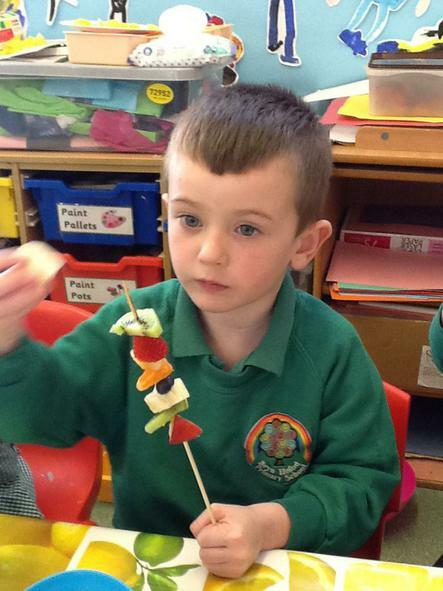 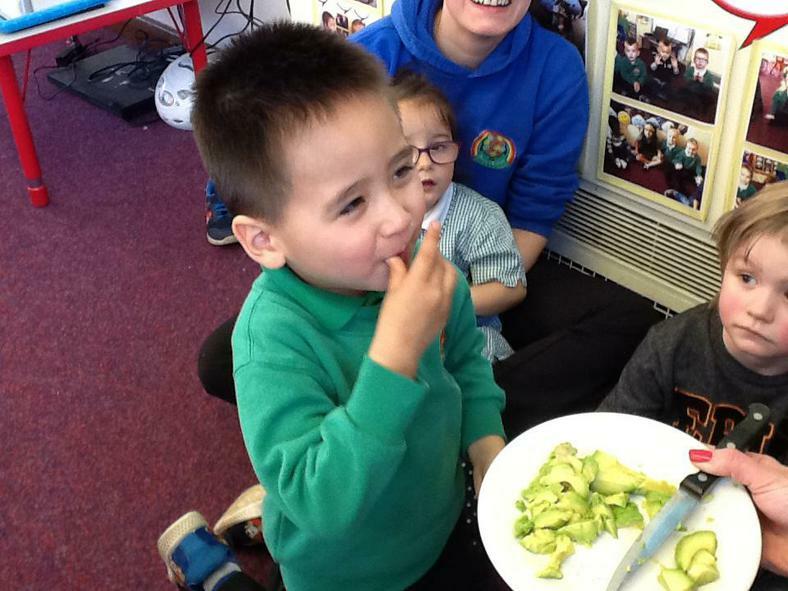 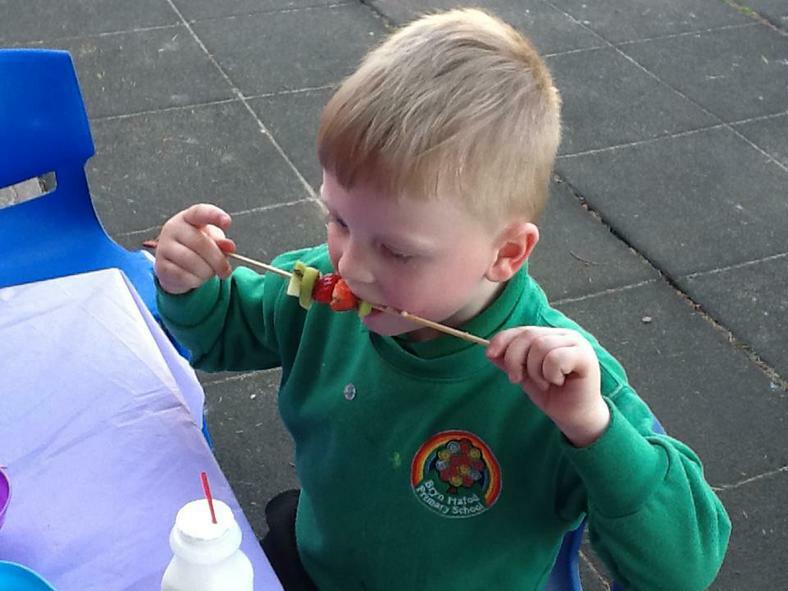 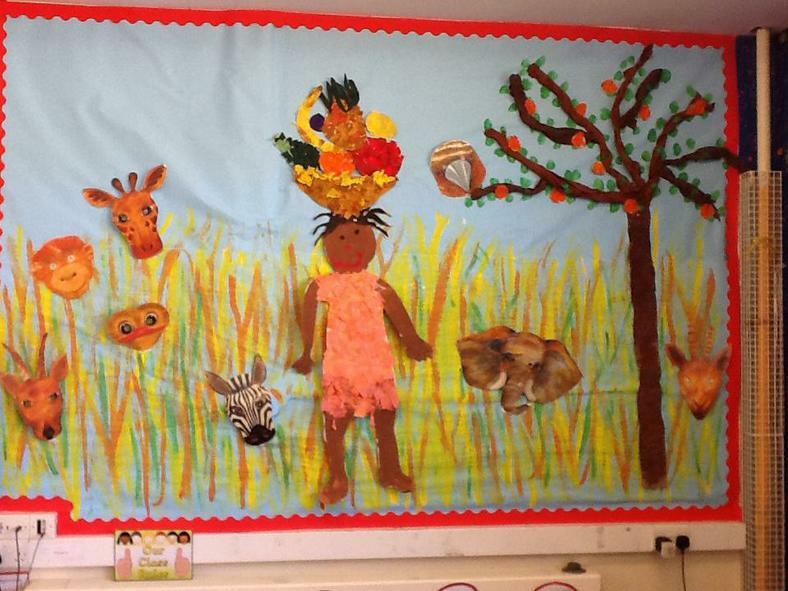 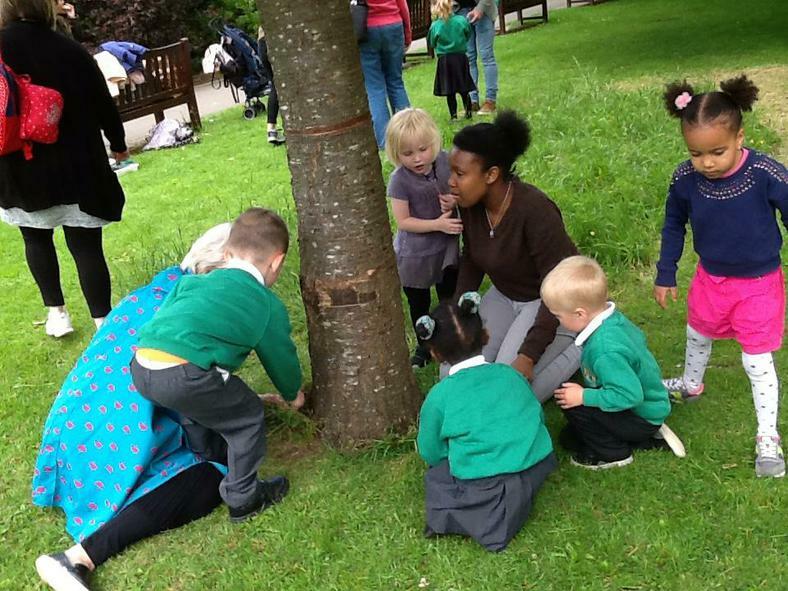 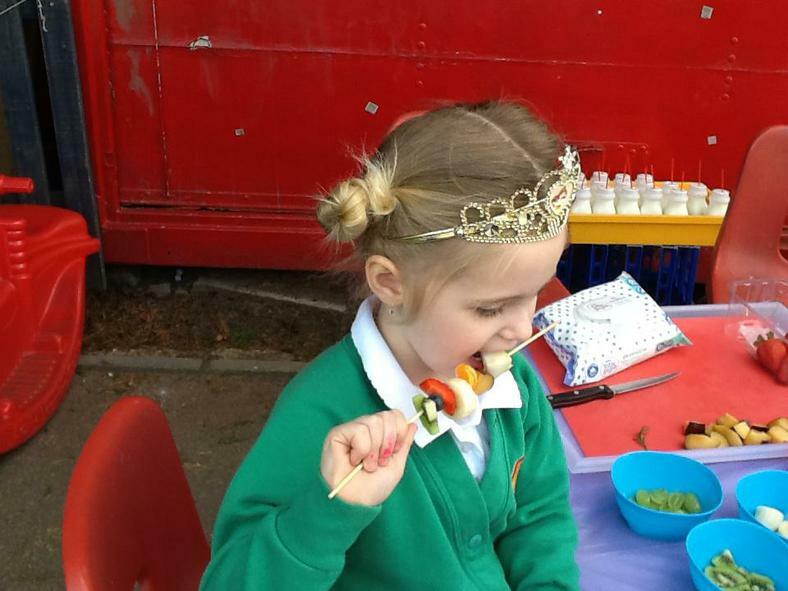 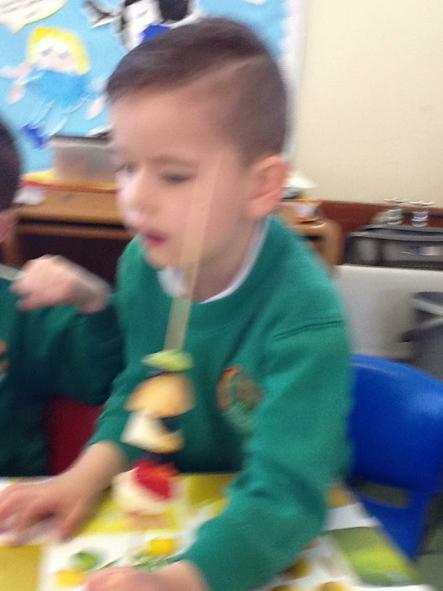 The children had the opportunity to taste and make fruit kebabs, they did rubbings of various fruits, they experienced African drumming, they designed and painted African necklaces, and they all worked collaboratively to create a wonderful wall display of 'Handa's Surprise'. 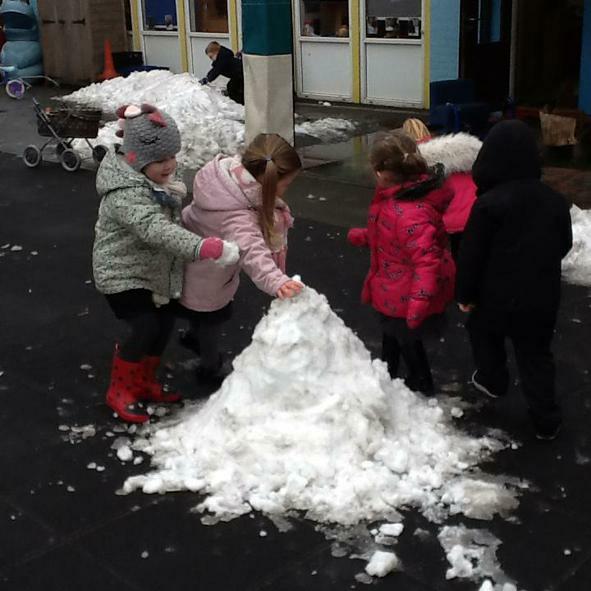 Welcome back to the Spring term that started off so well and then by day four we had two snow days, we are glad that everyone had fun and stayed safe in the snow. 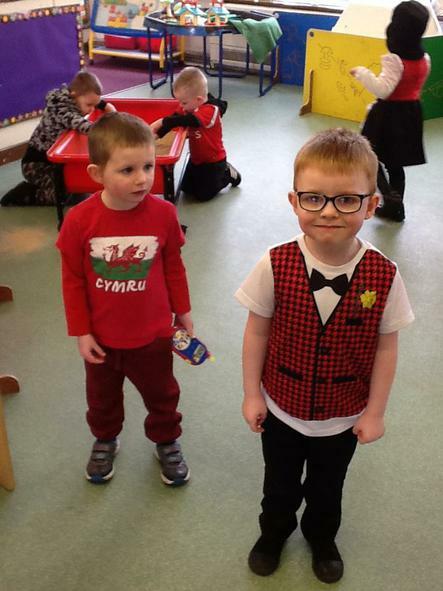 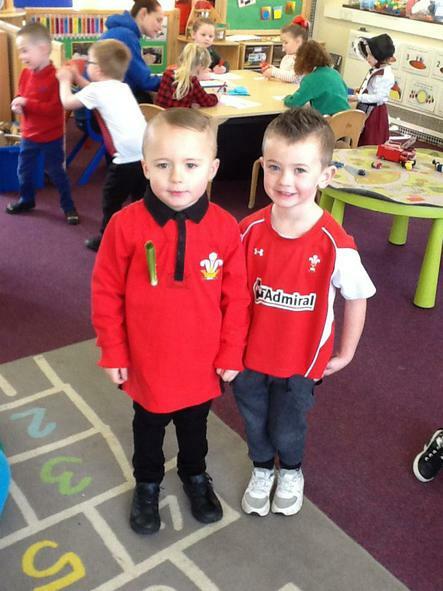 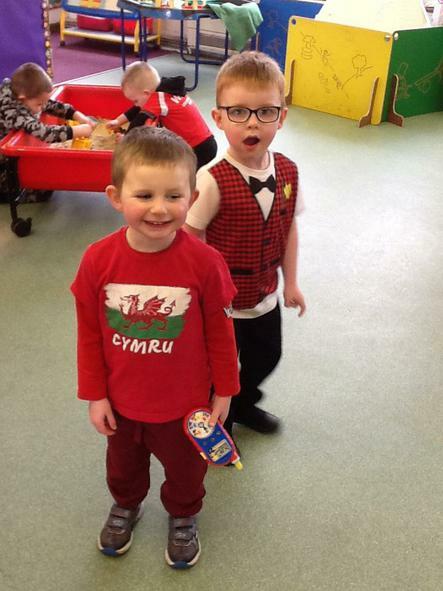 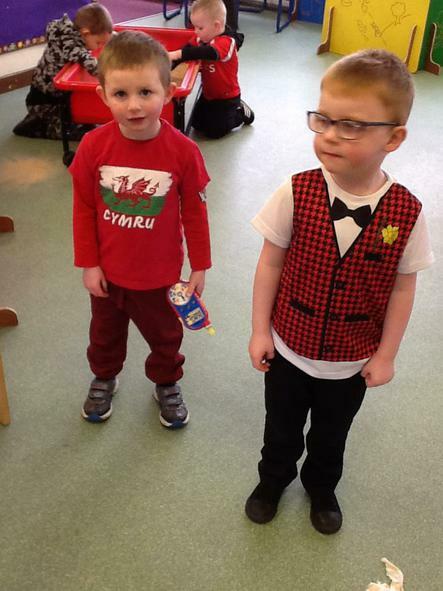 This week we will be celebrating the Eisteddfod on Thursday 8th March and World book day on Friday 9th March. 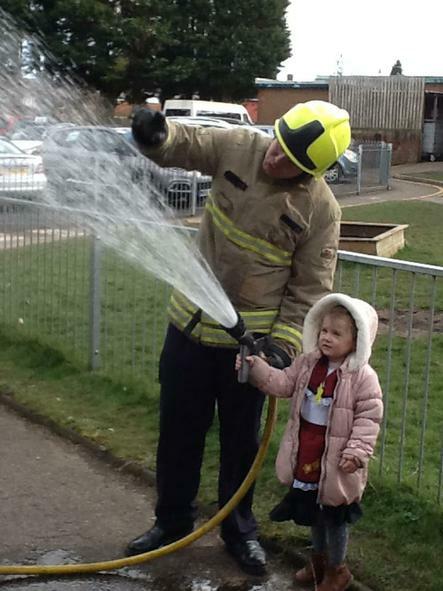 Our topic for this half term is 'People who help us'. 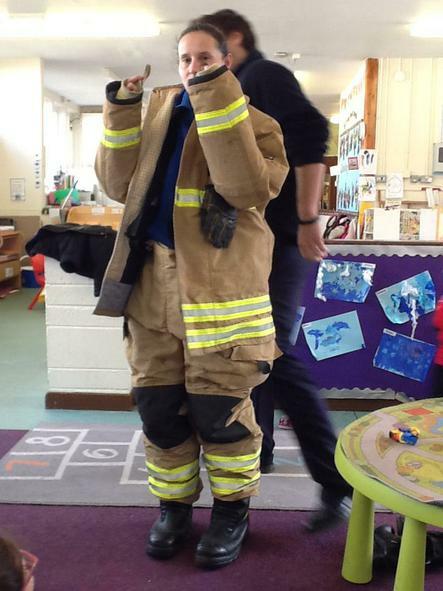 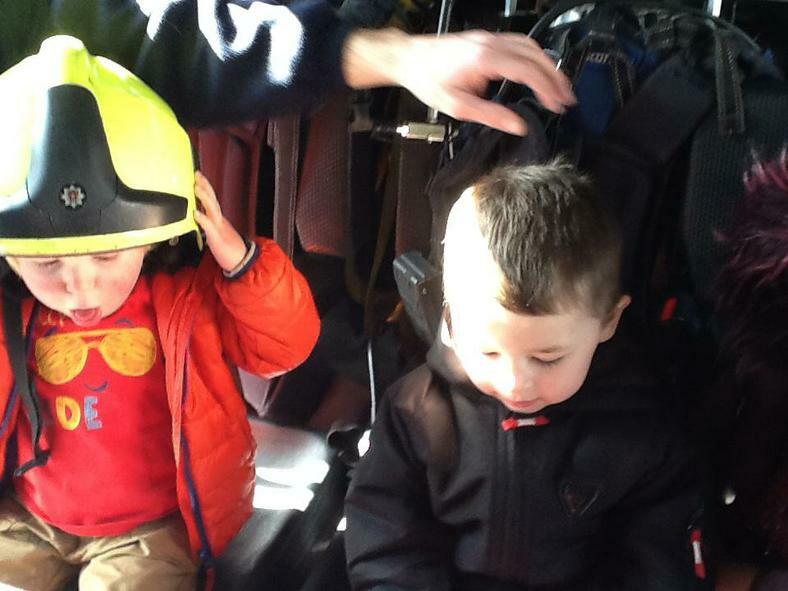 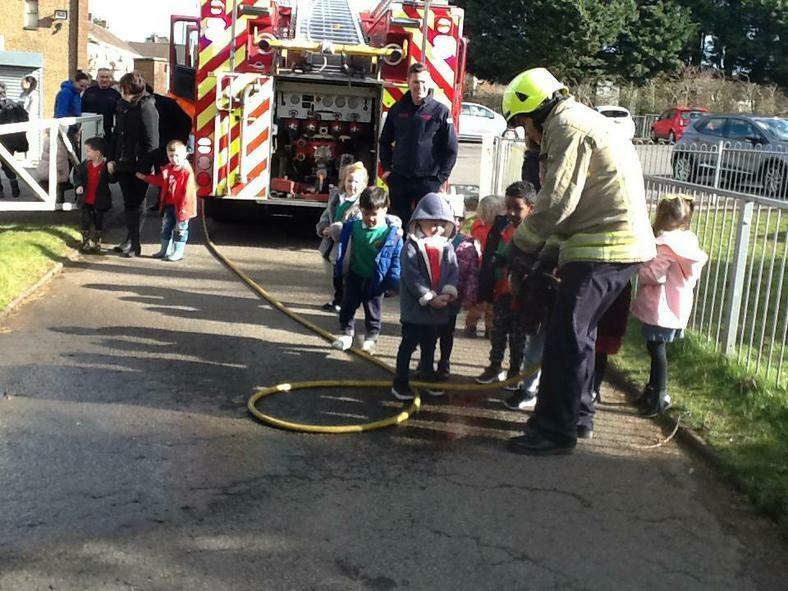 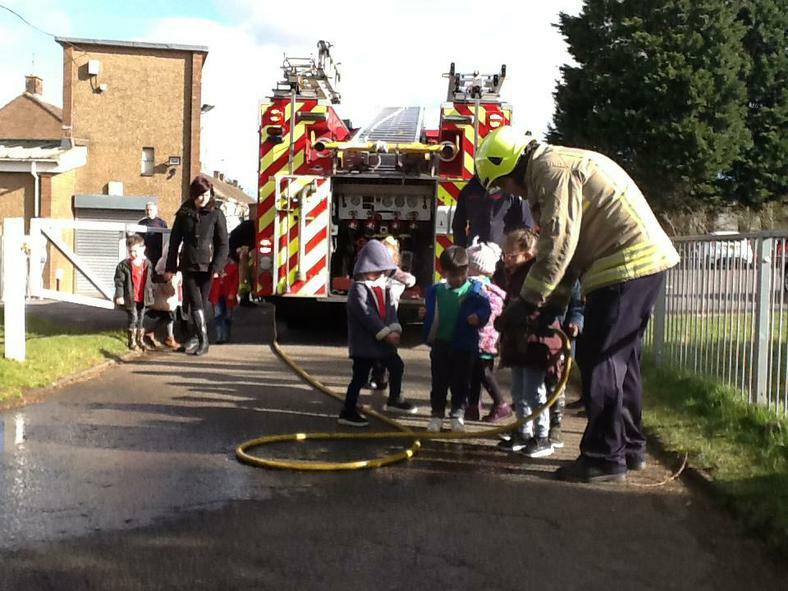 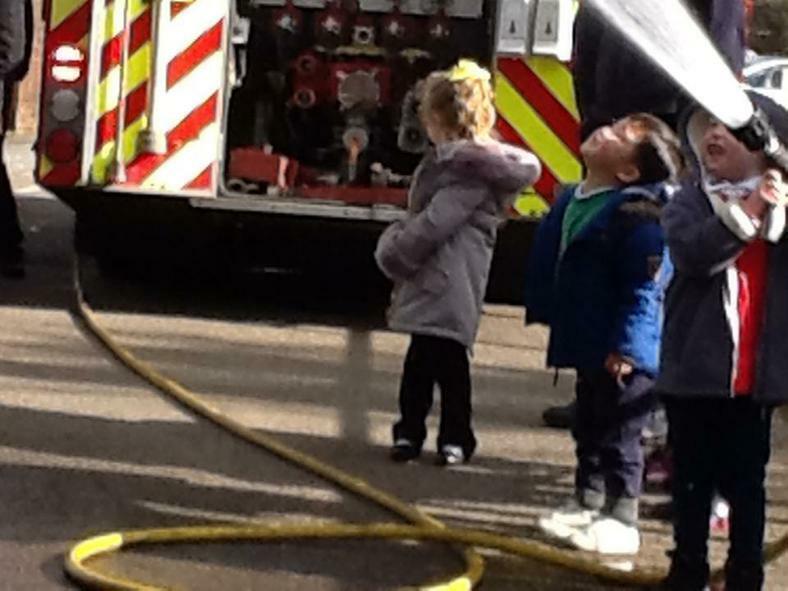 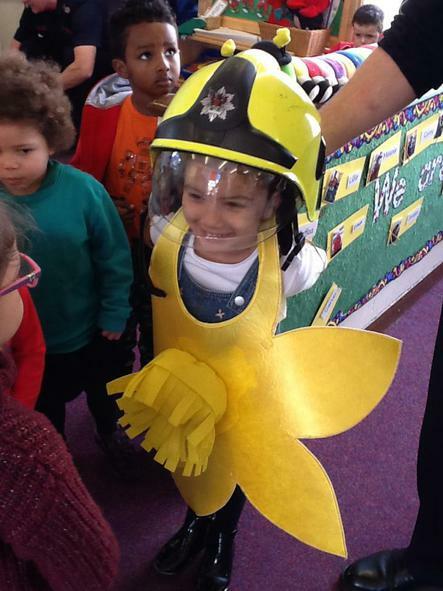 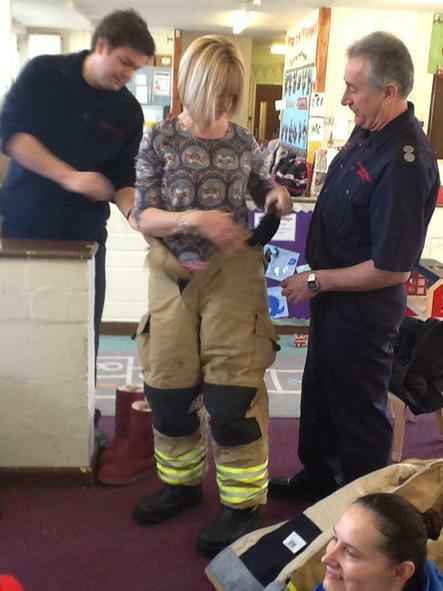 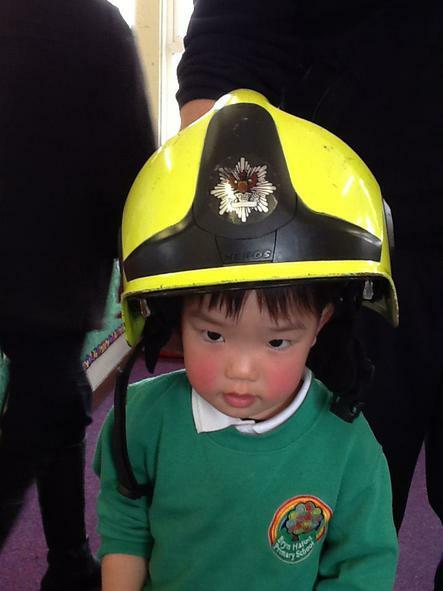 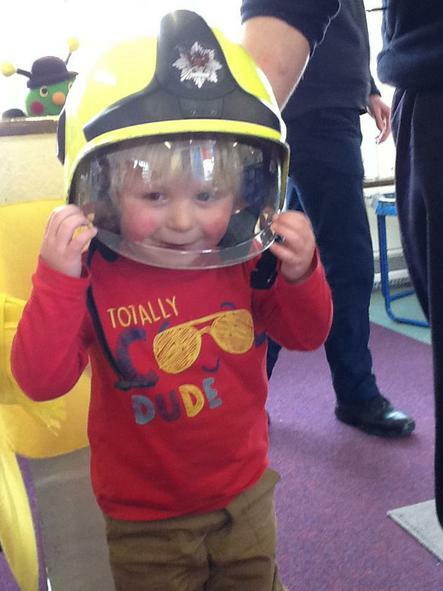 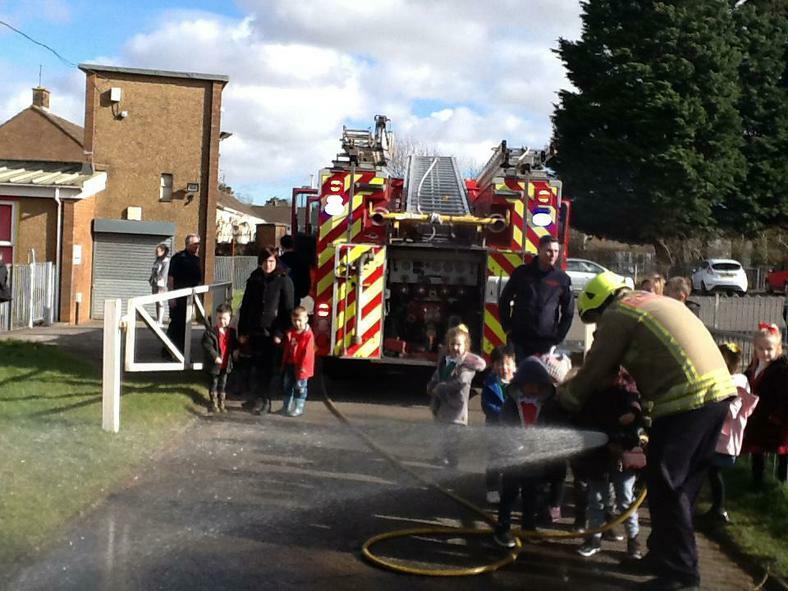 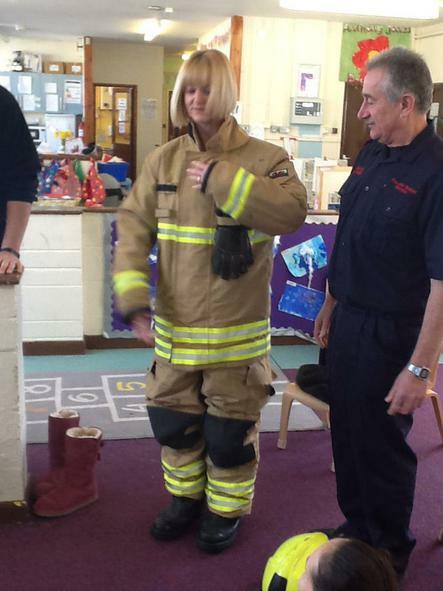 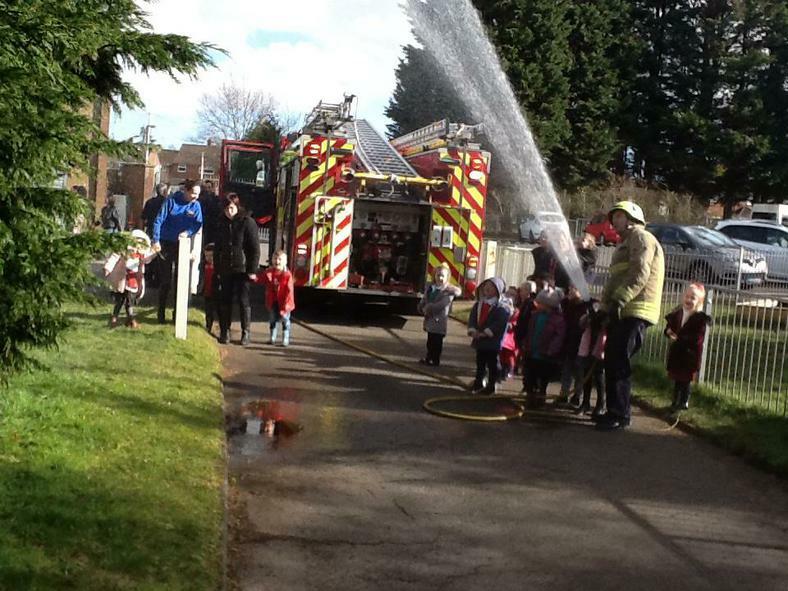 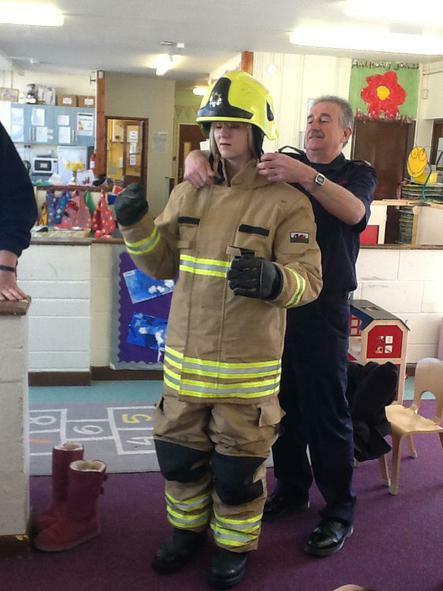 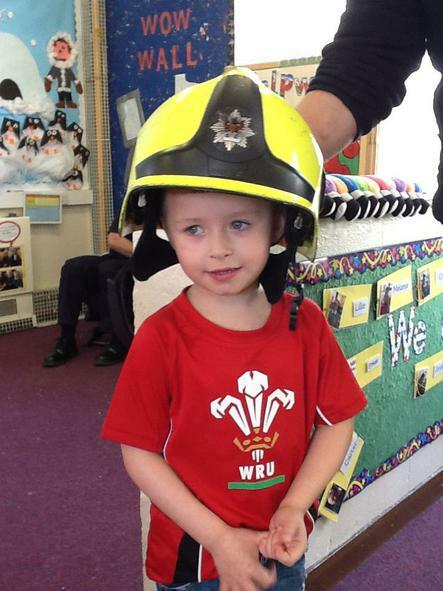 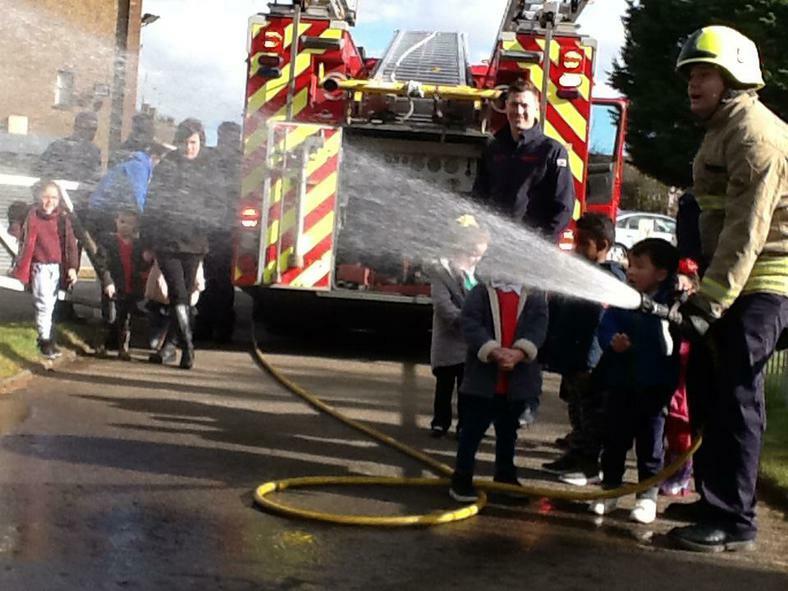 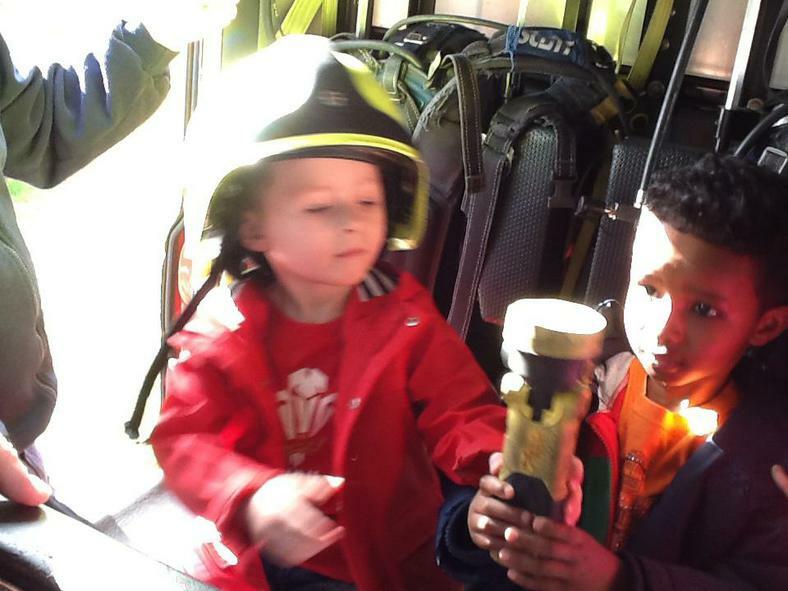 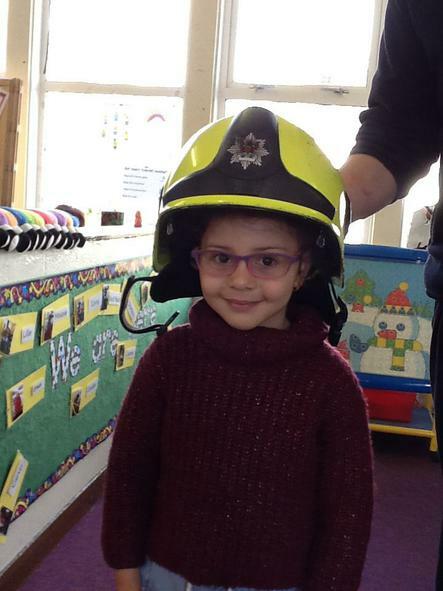 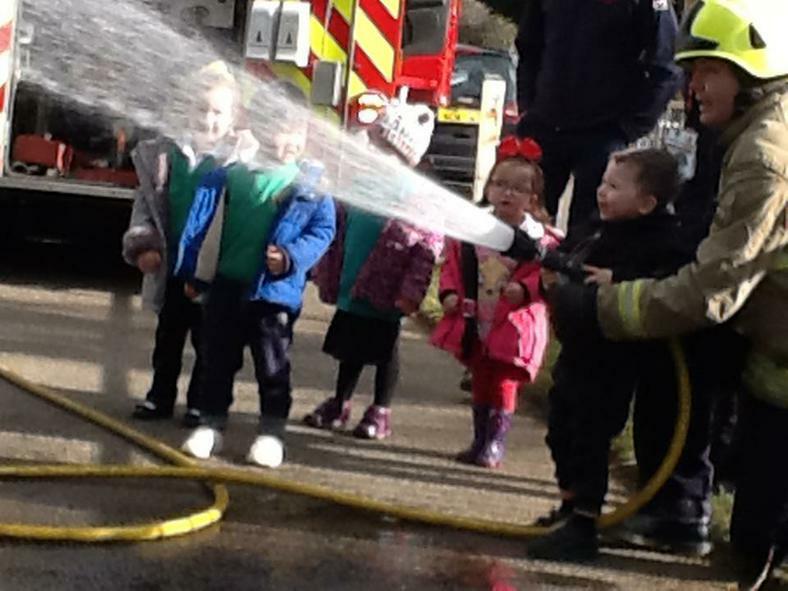 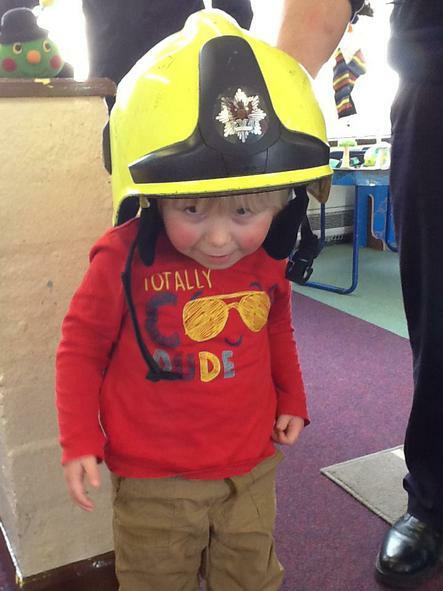 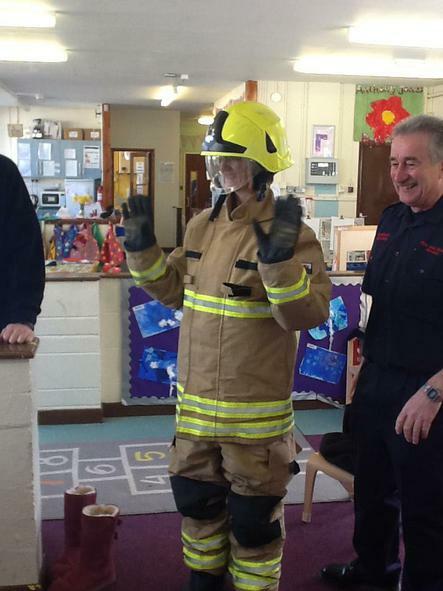 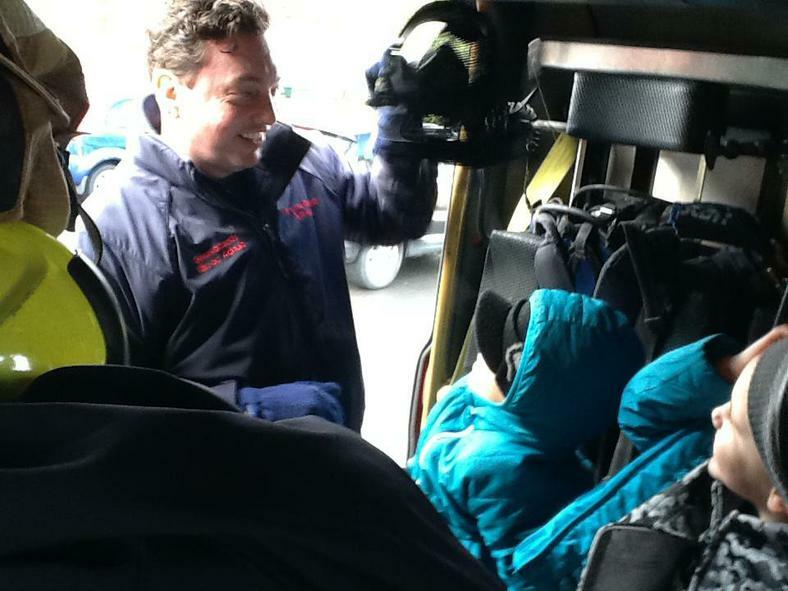 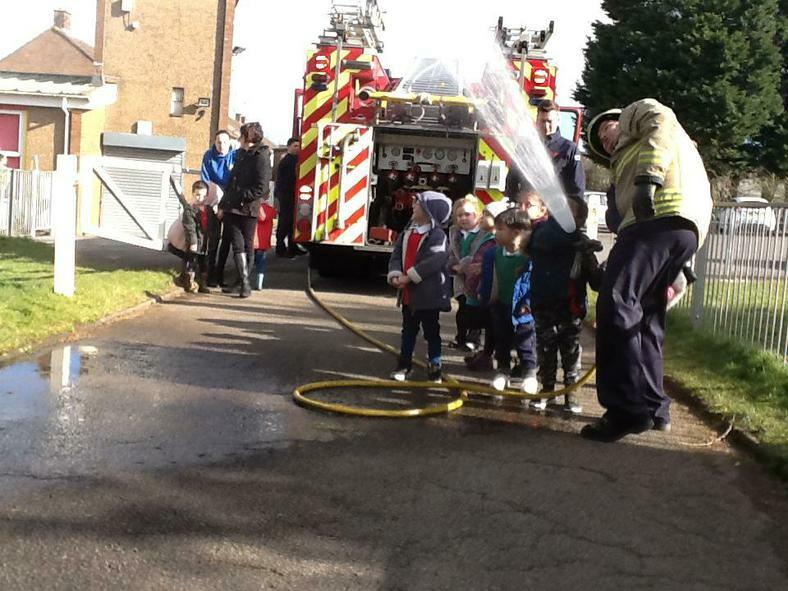 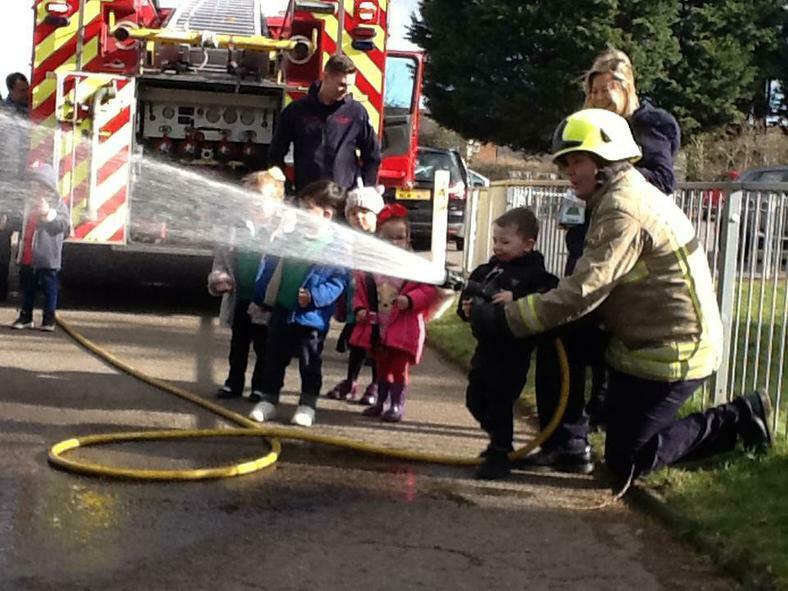 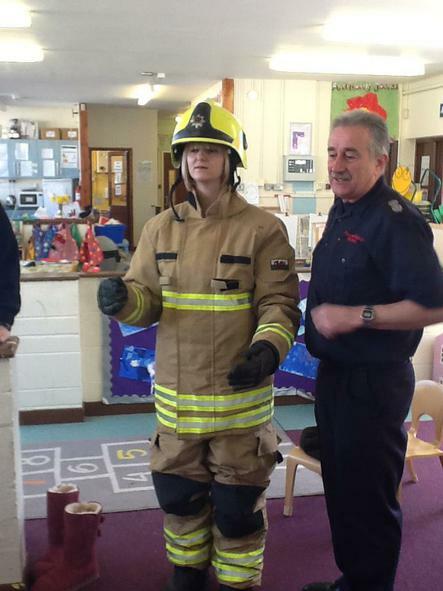 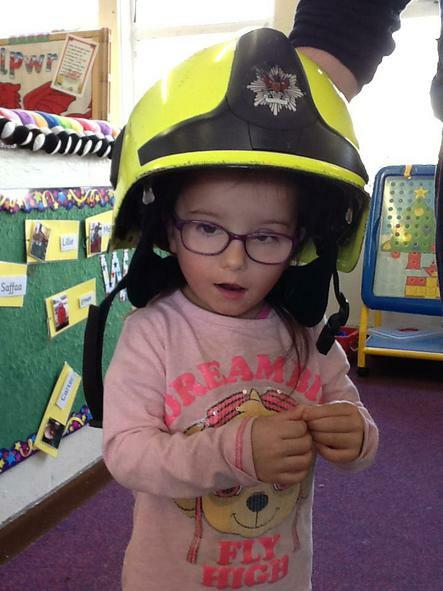 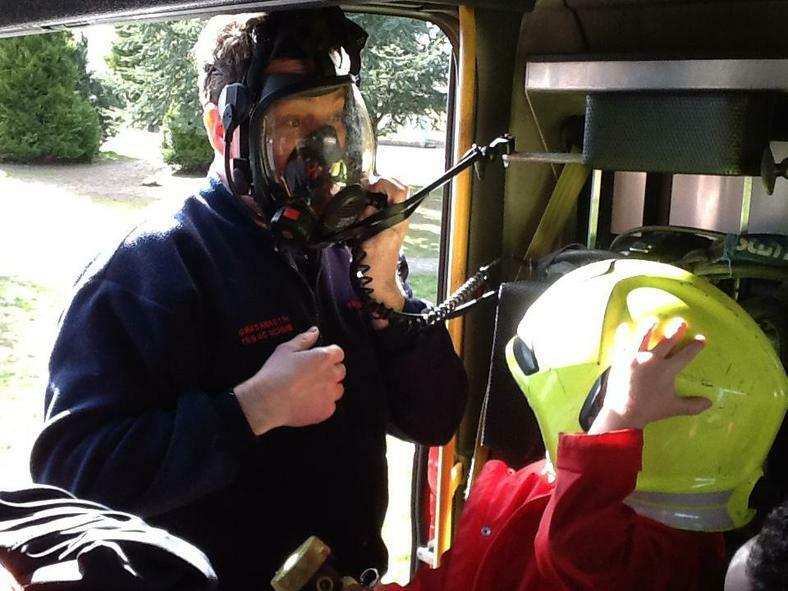 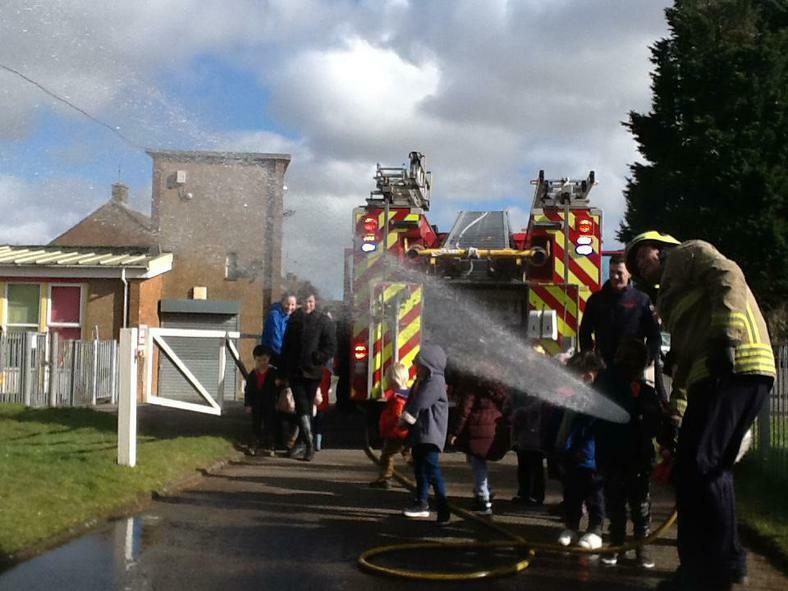 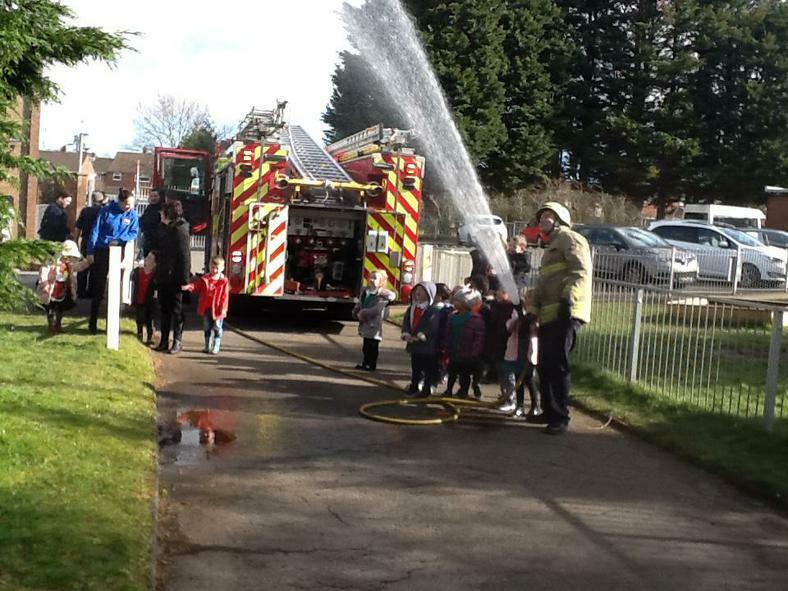 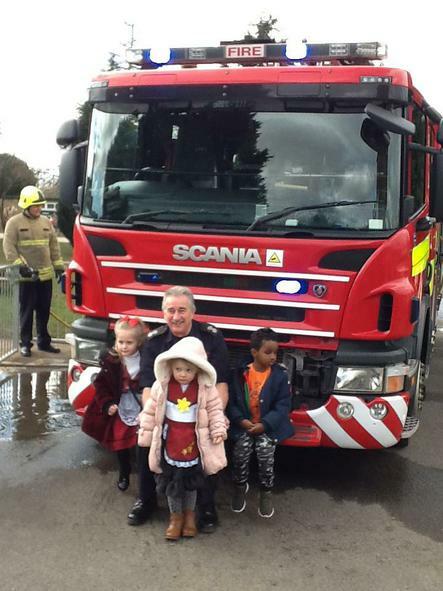 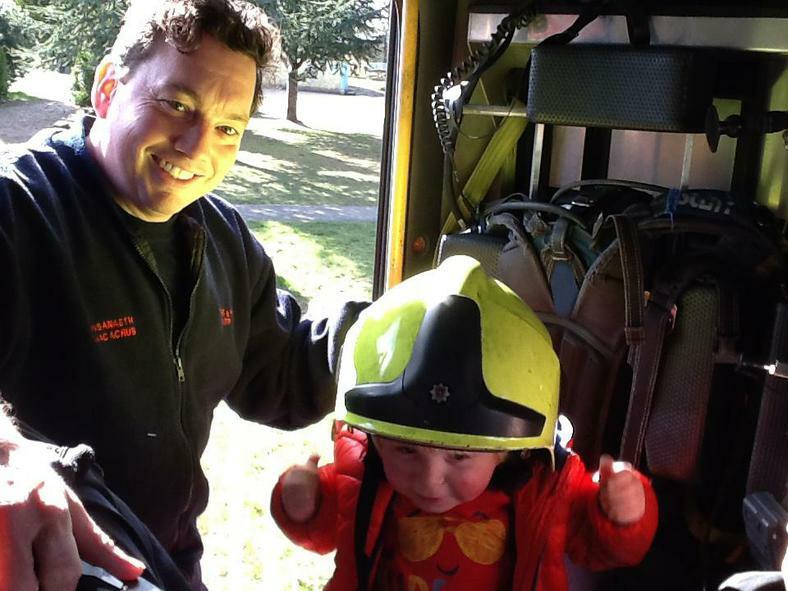 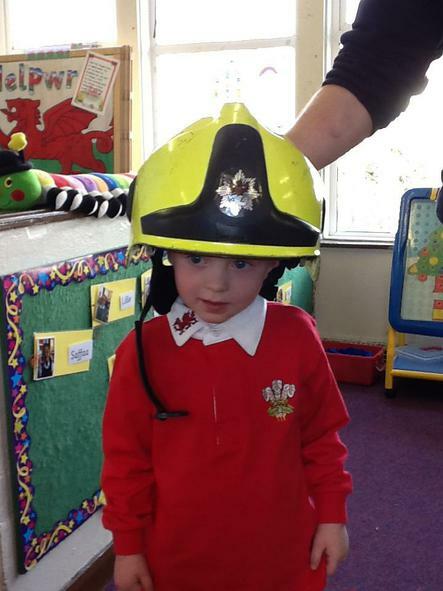 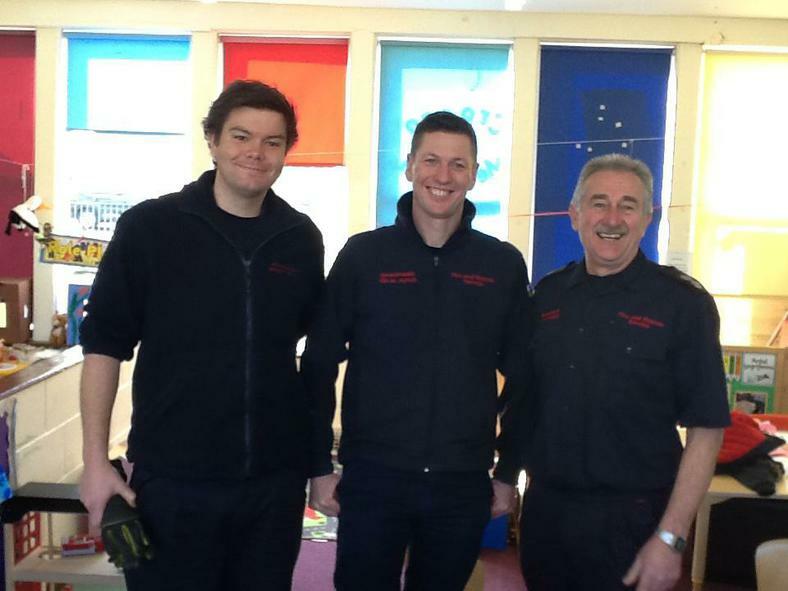 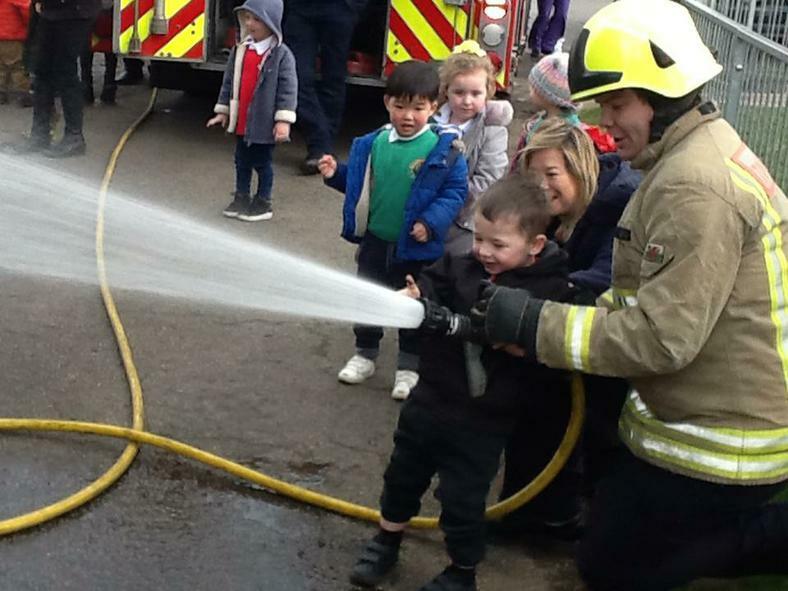 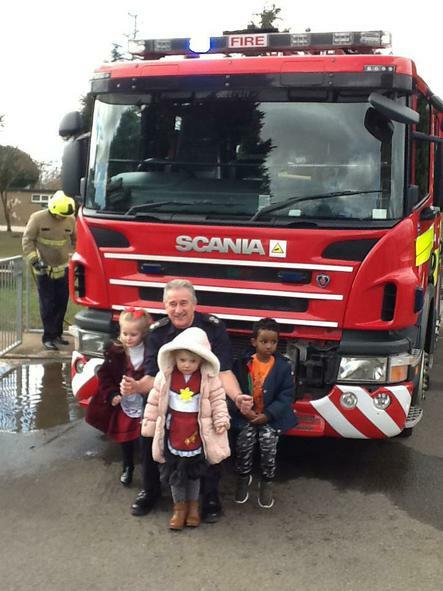 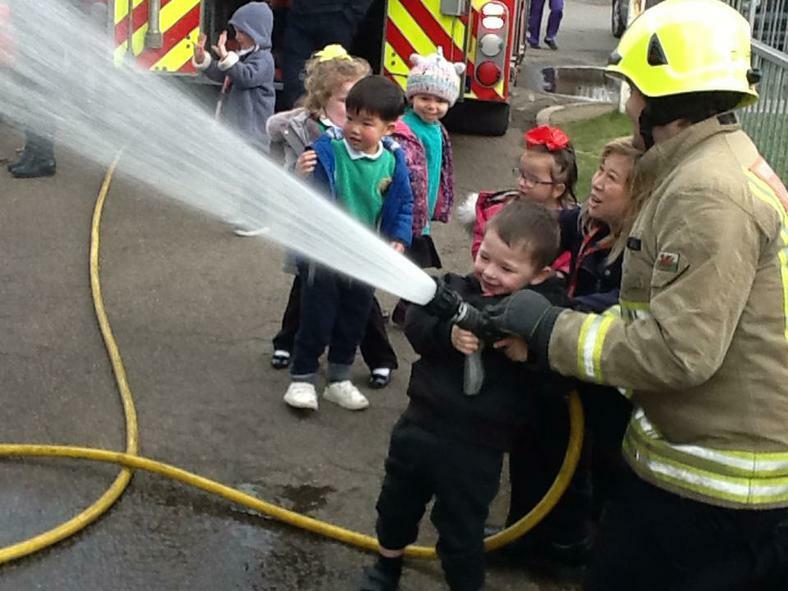 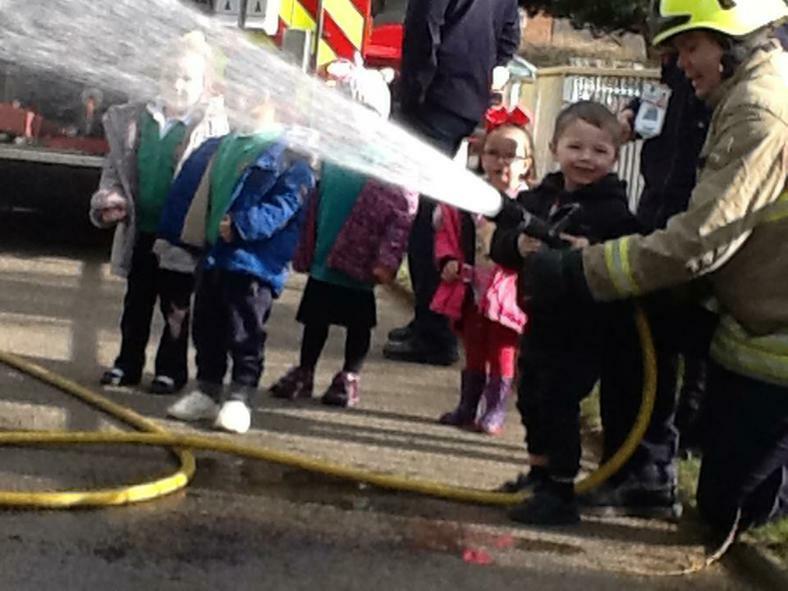 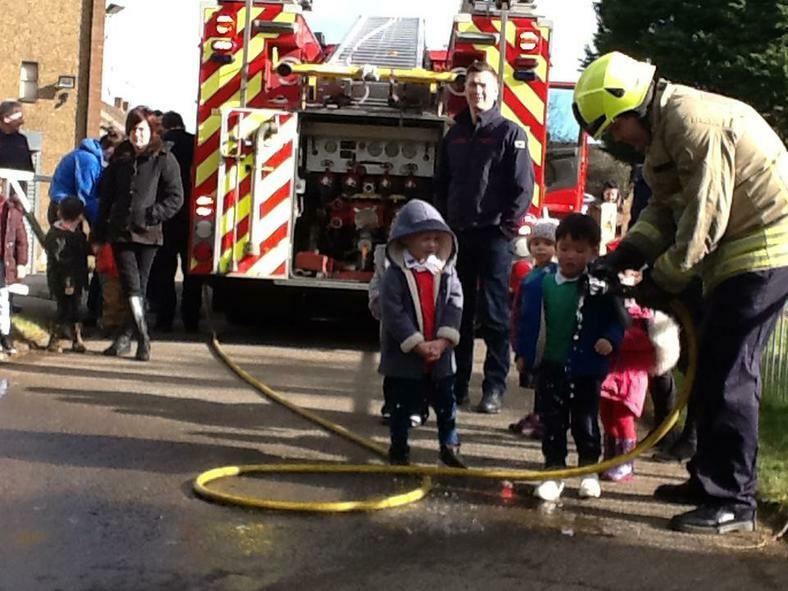 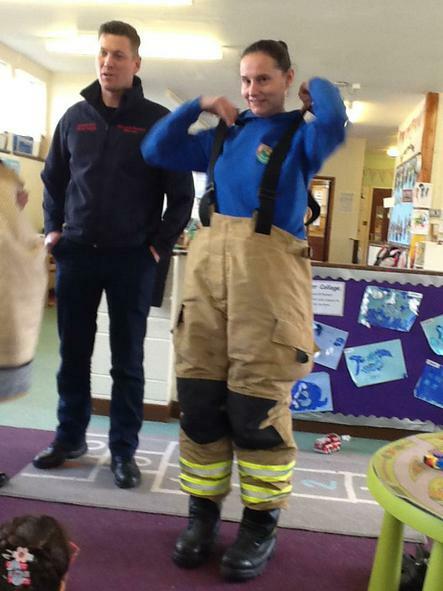 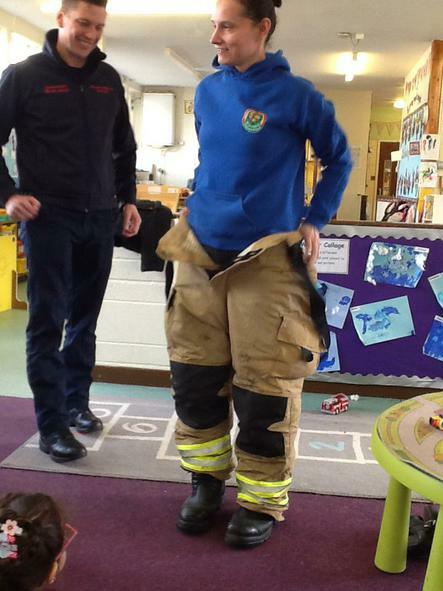 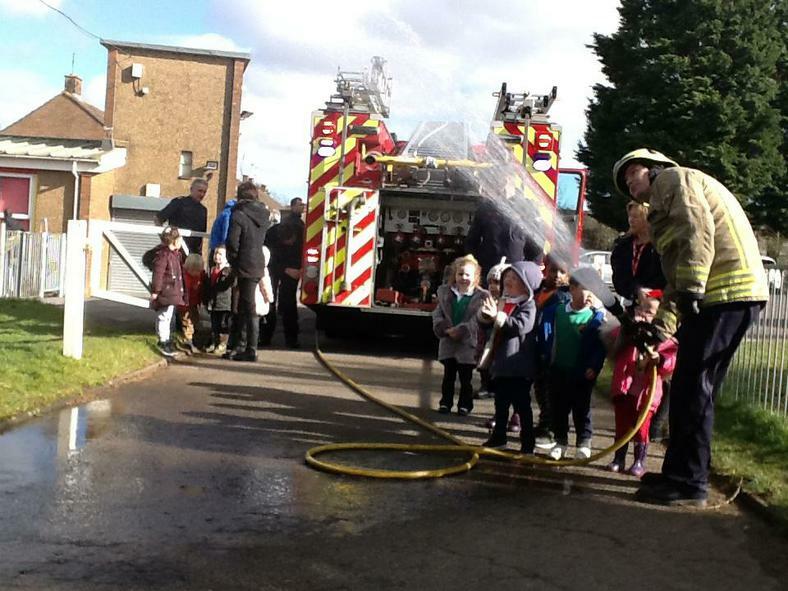 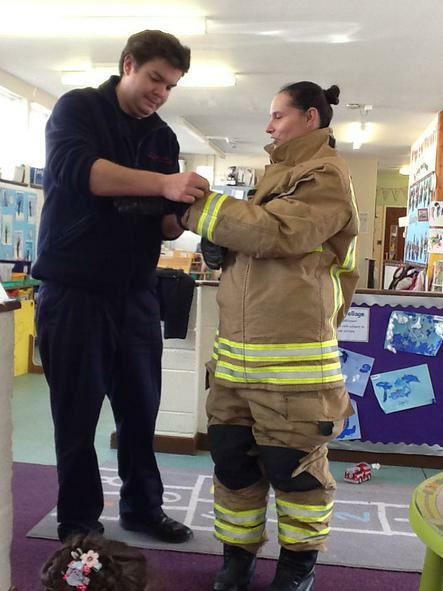 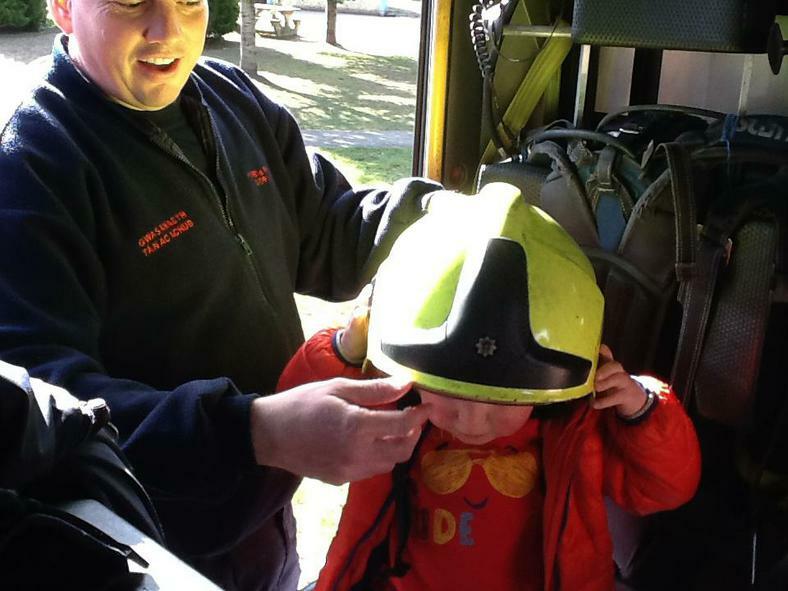 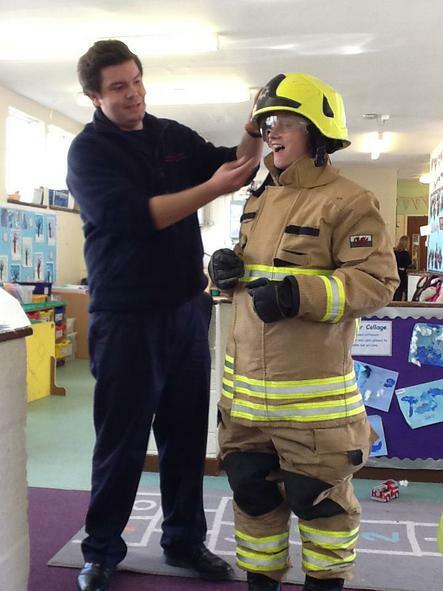 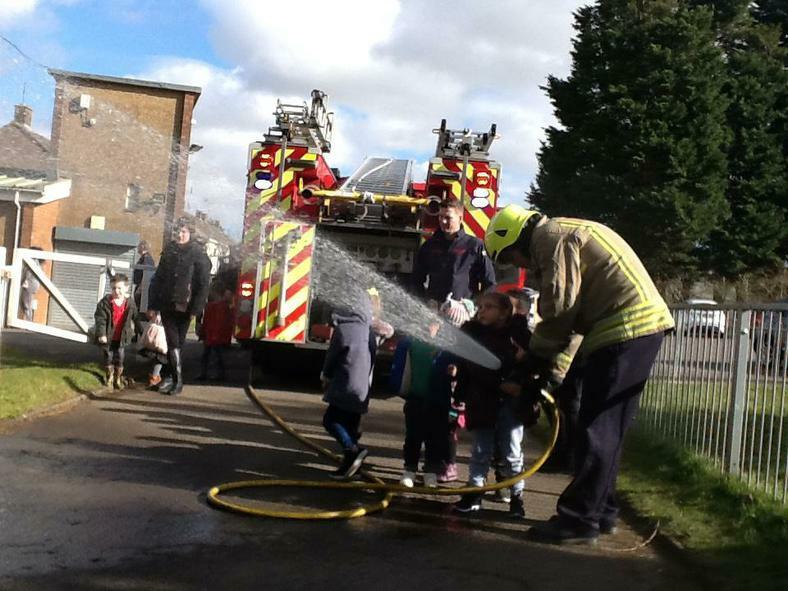 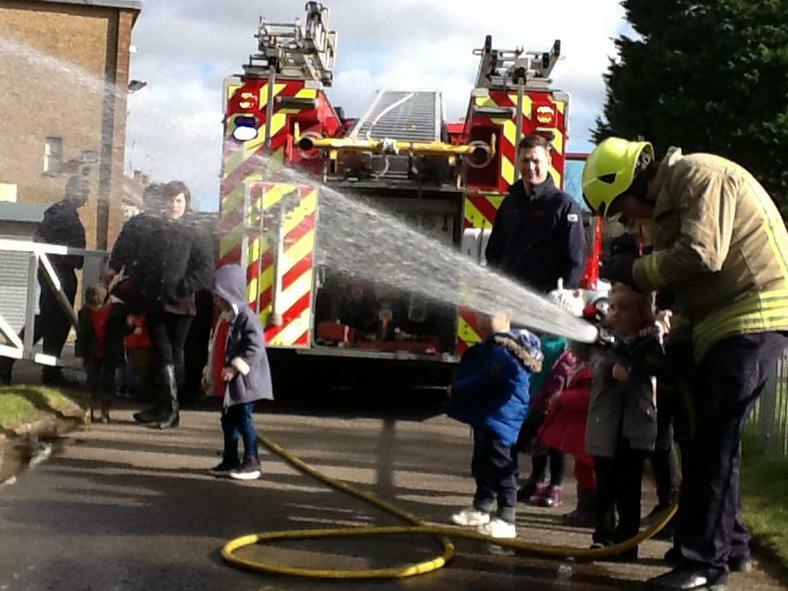 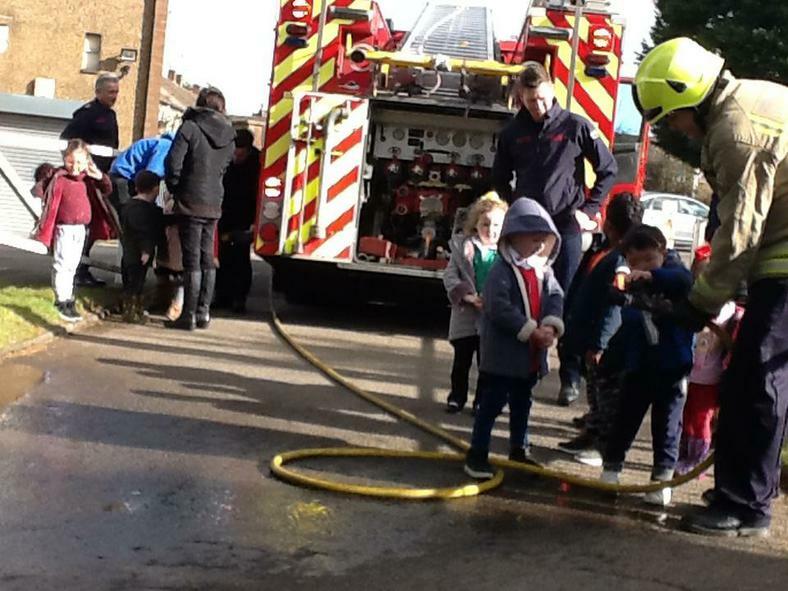 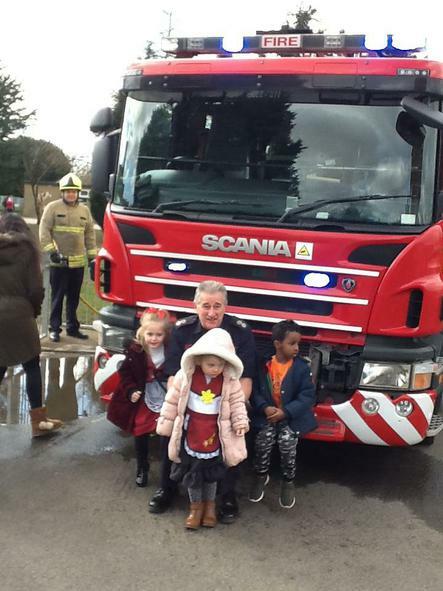 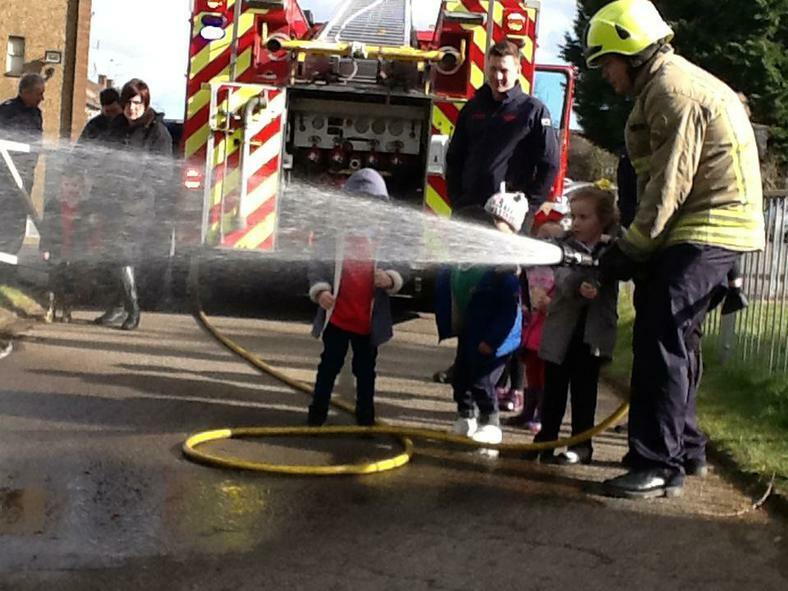 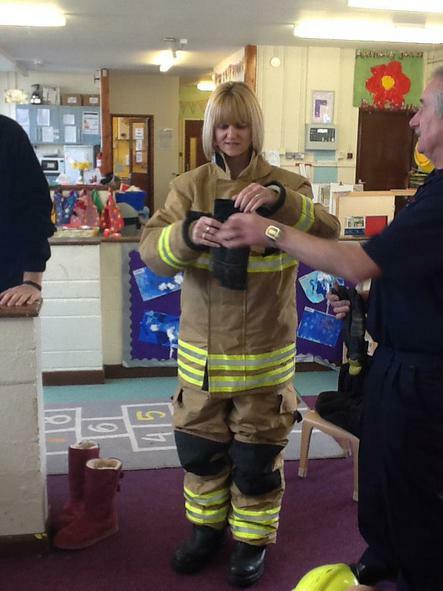 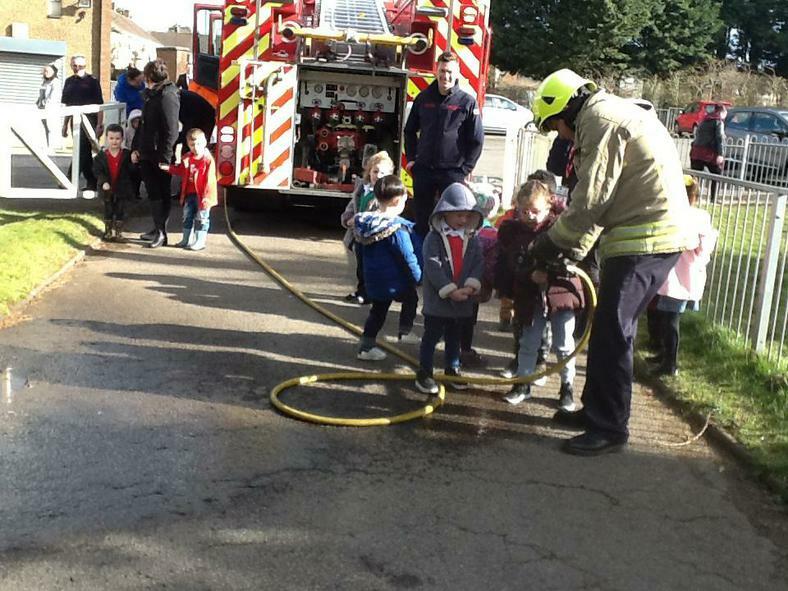 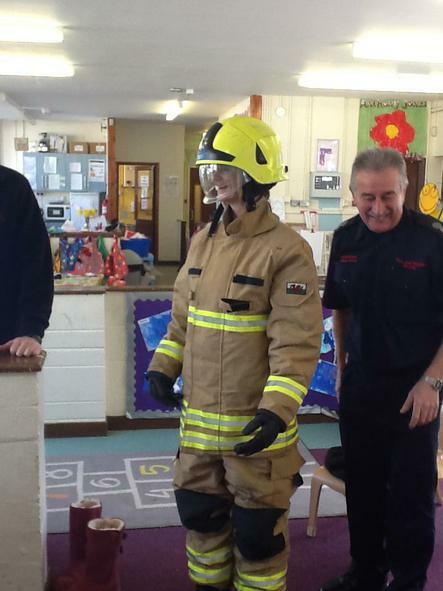 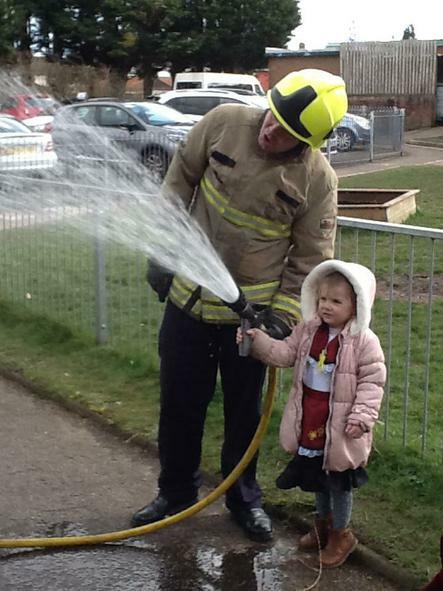 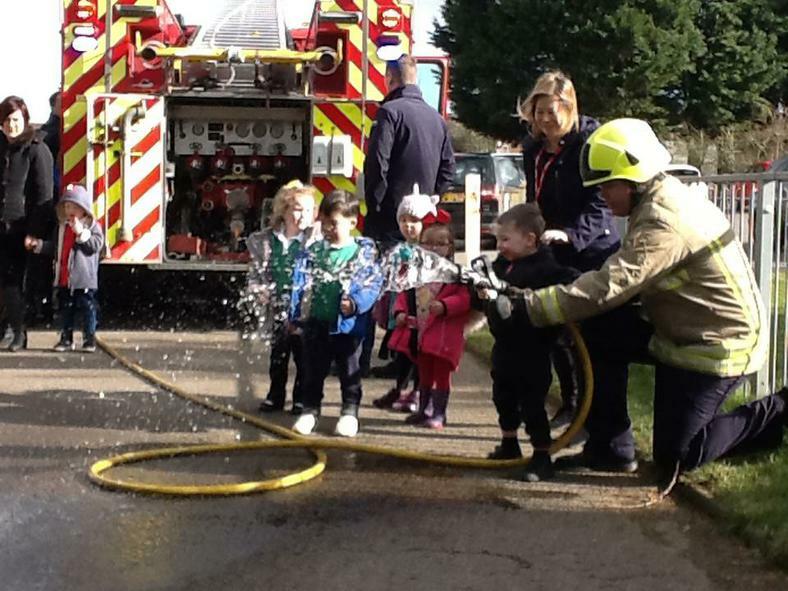 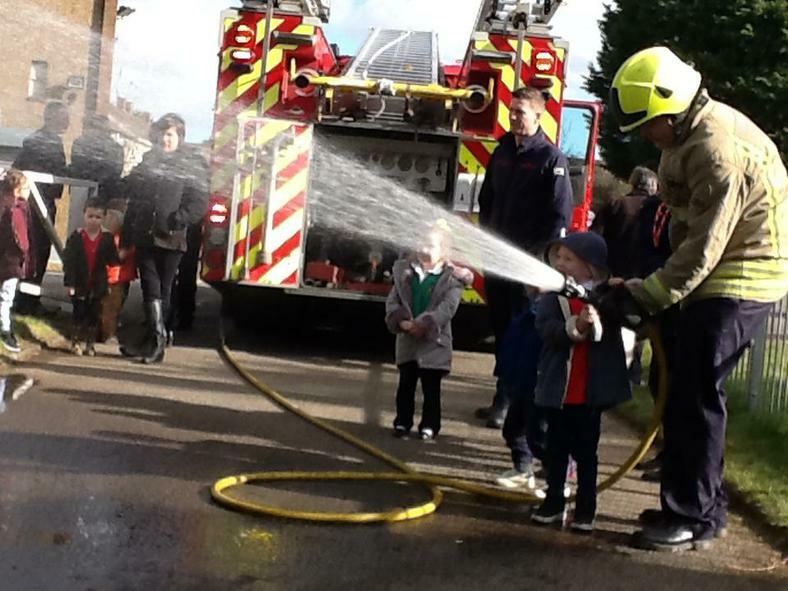 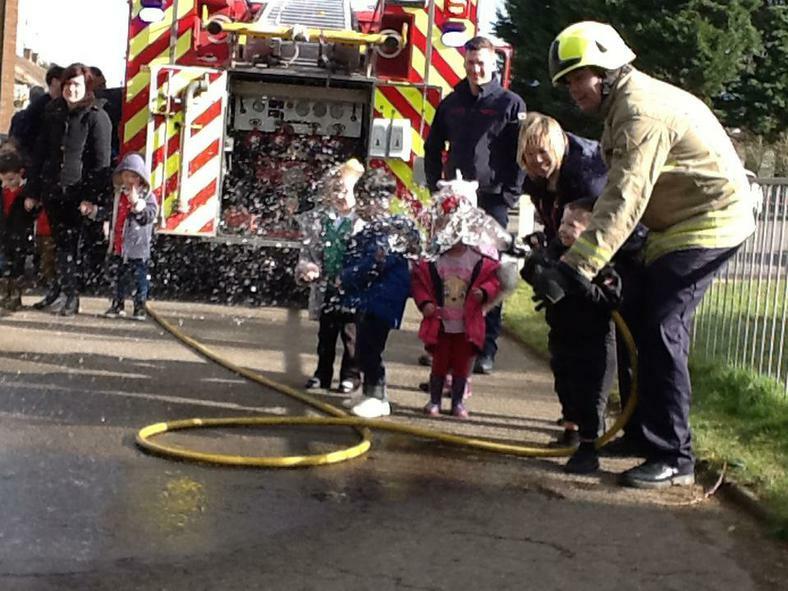 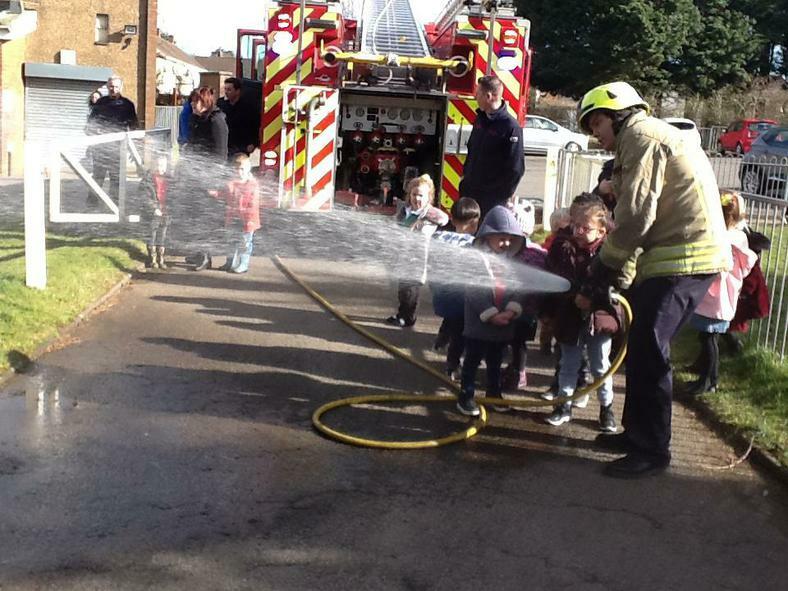 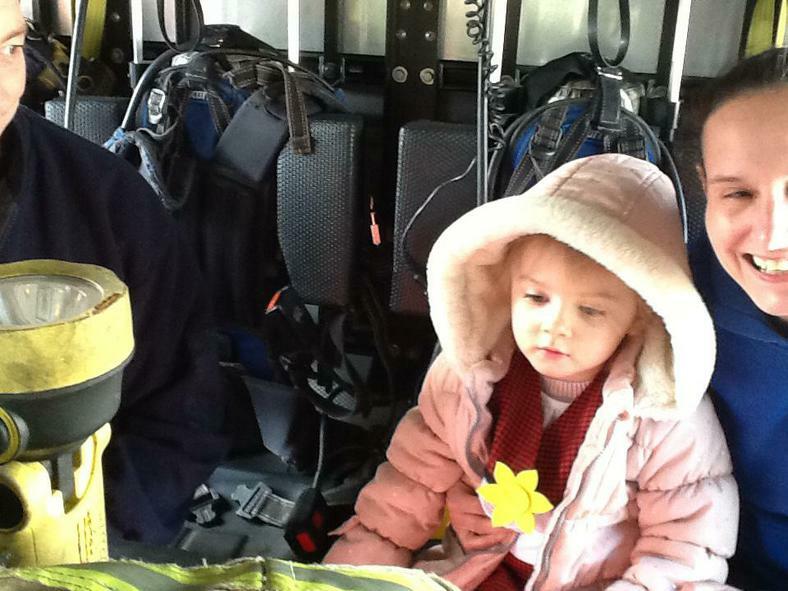 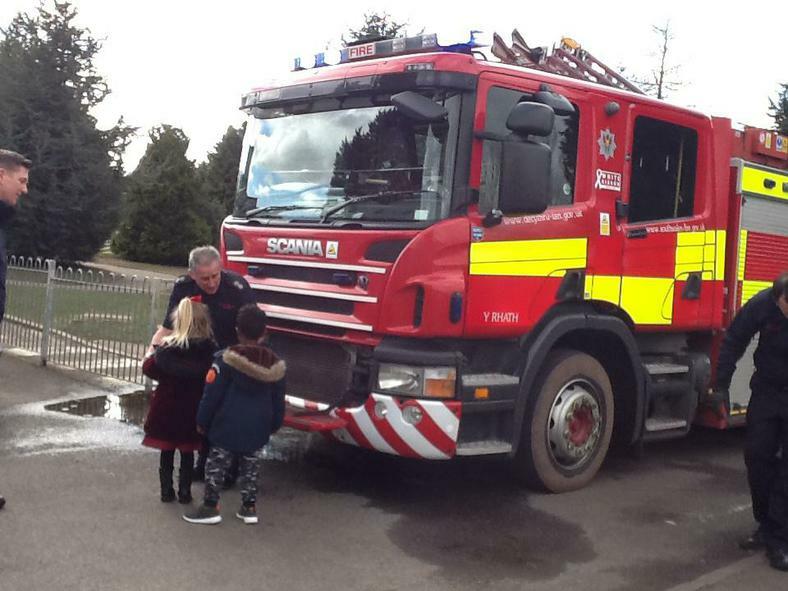 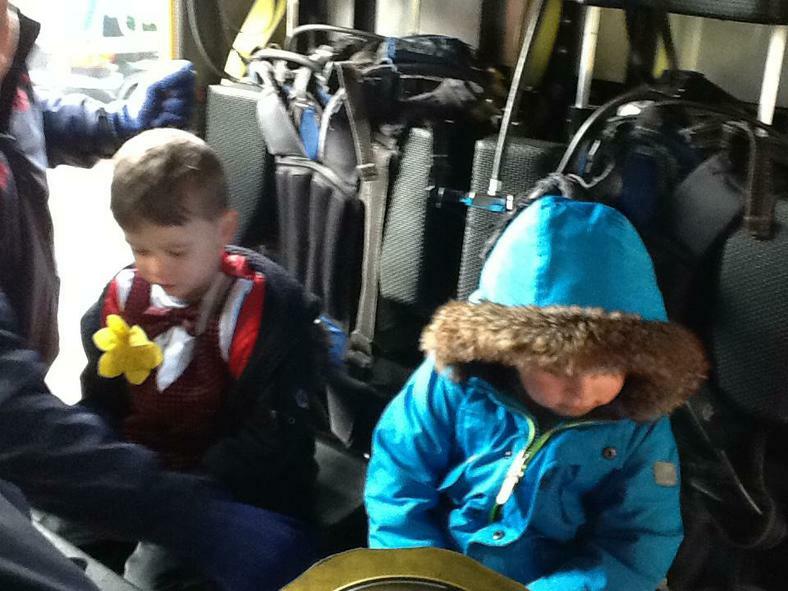 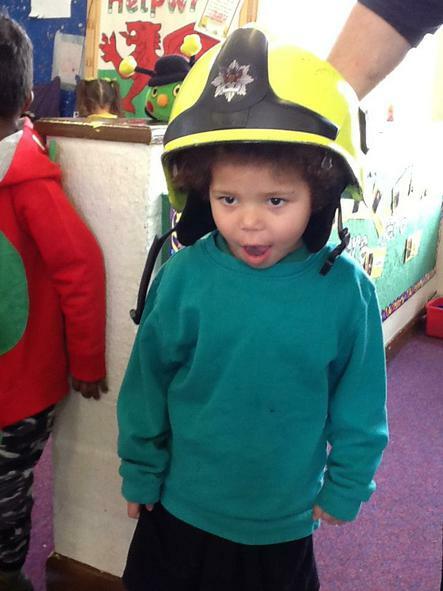 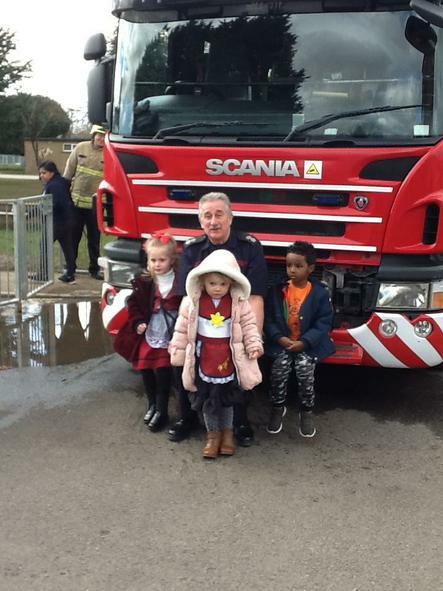 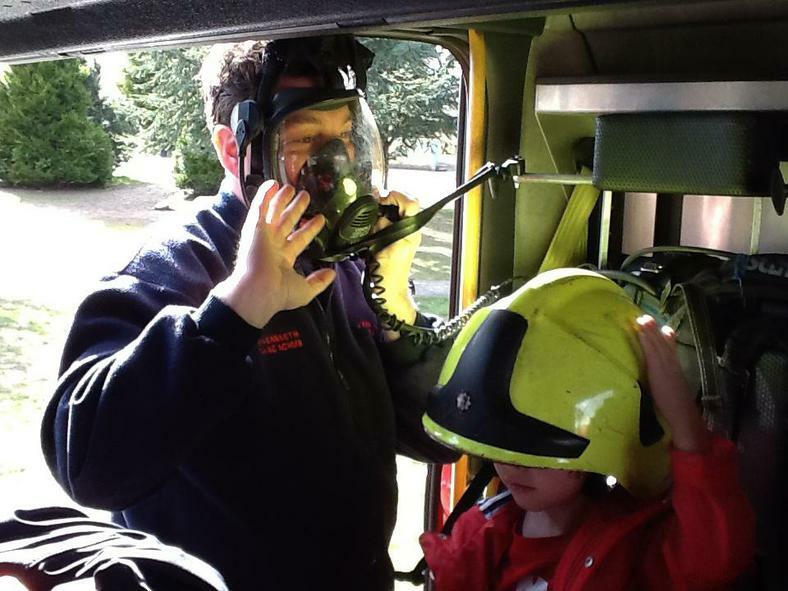 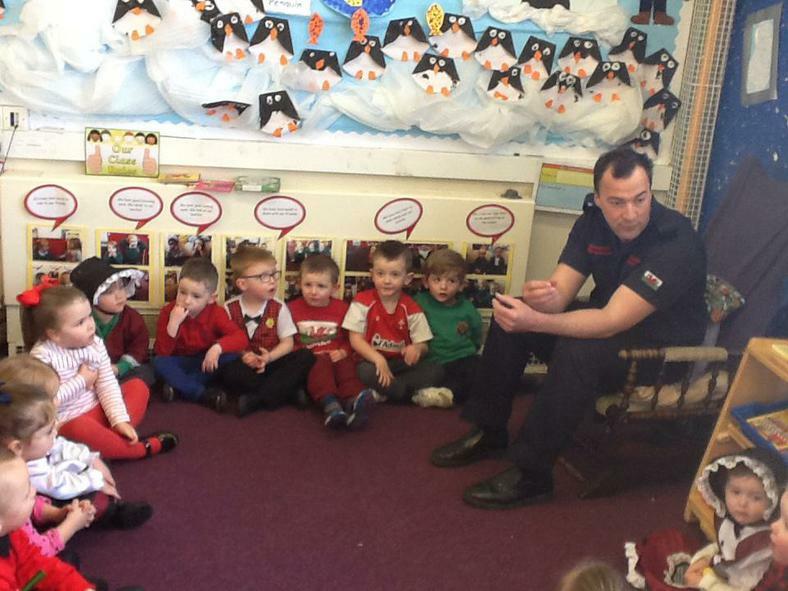 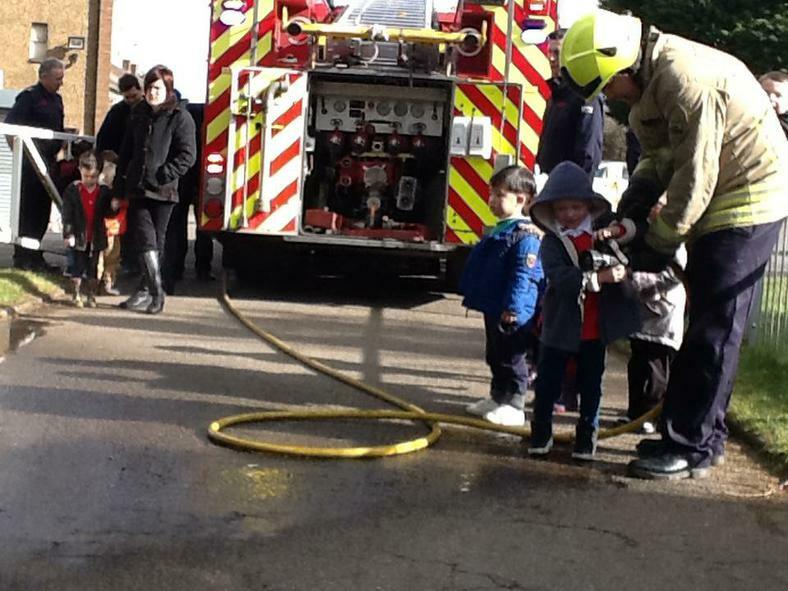 We are lucky that this week on Thursday 8th we will be having some visitors from the local Fire station. 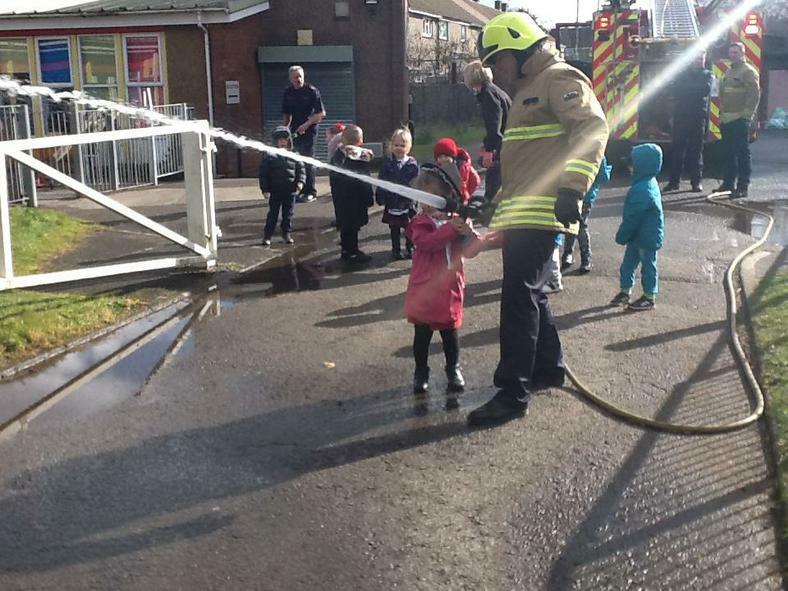 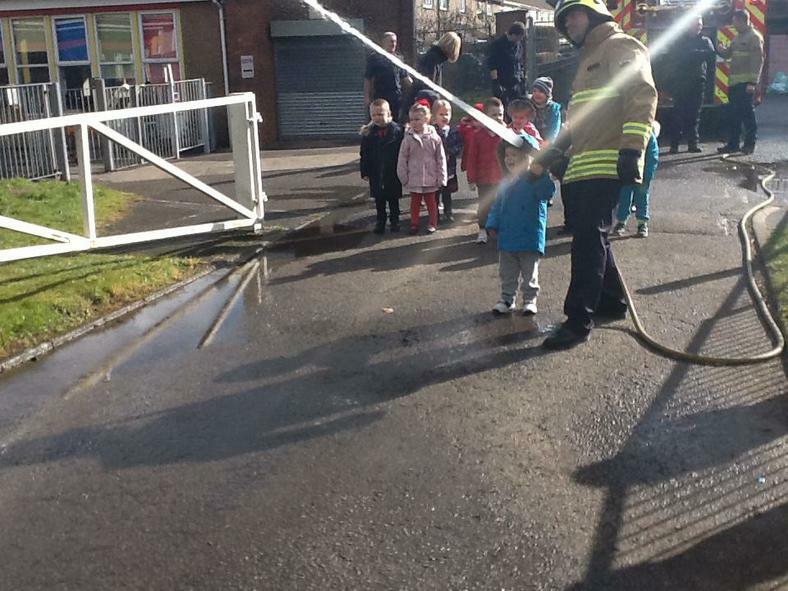 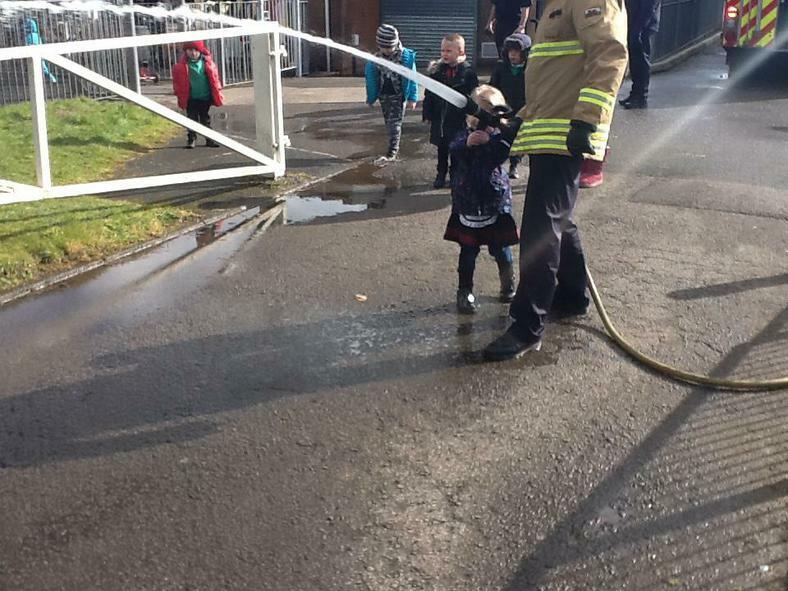 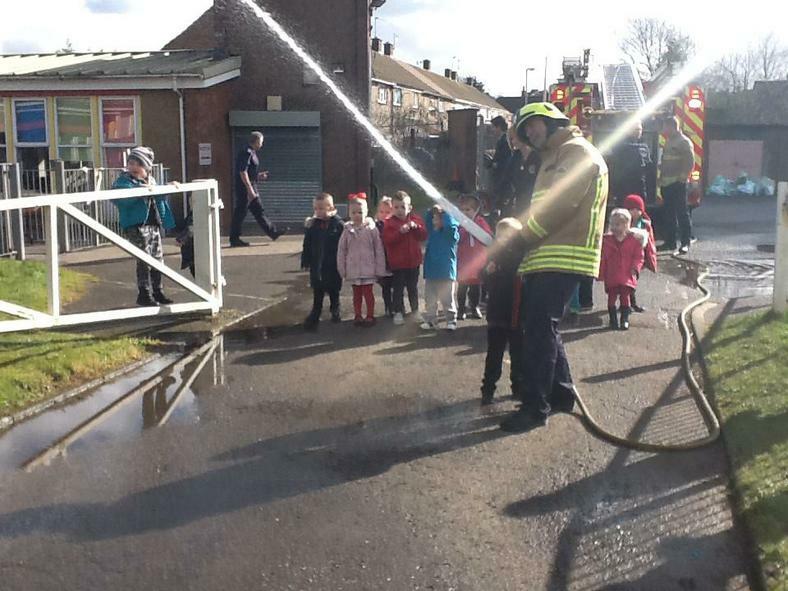 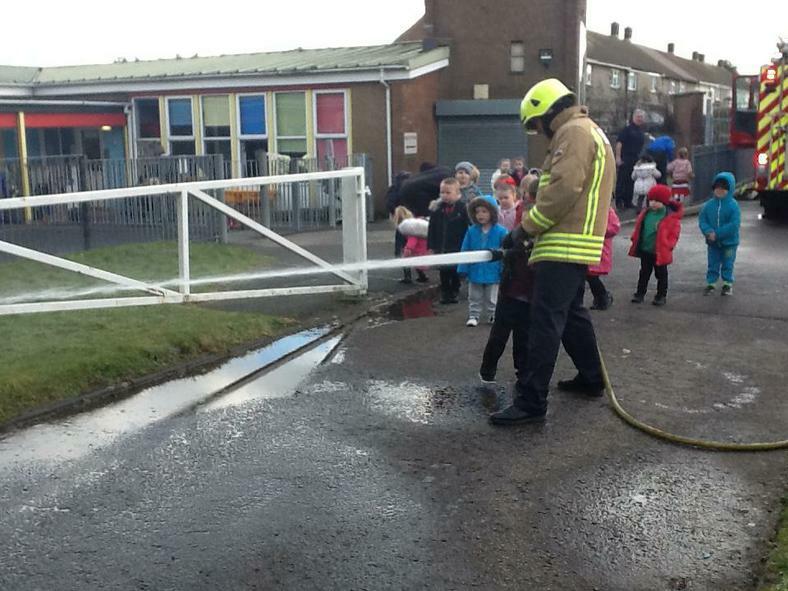 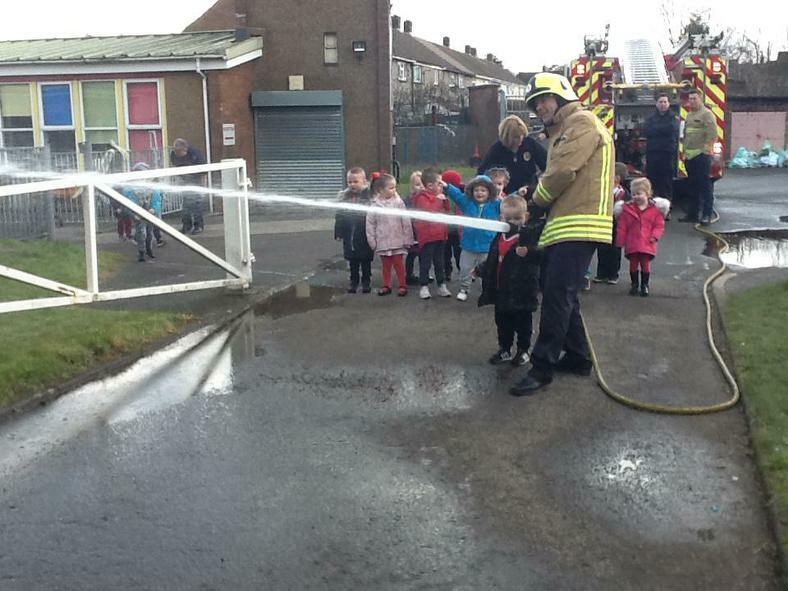 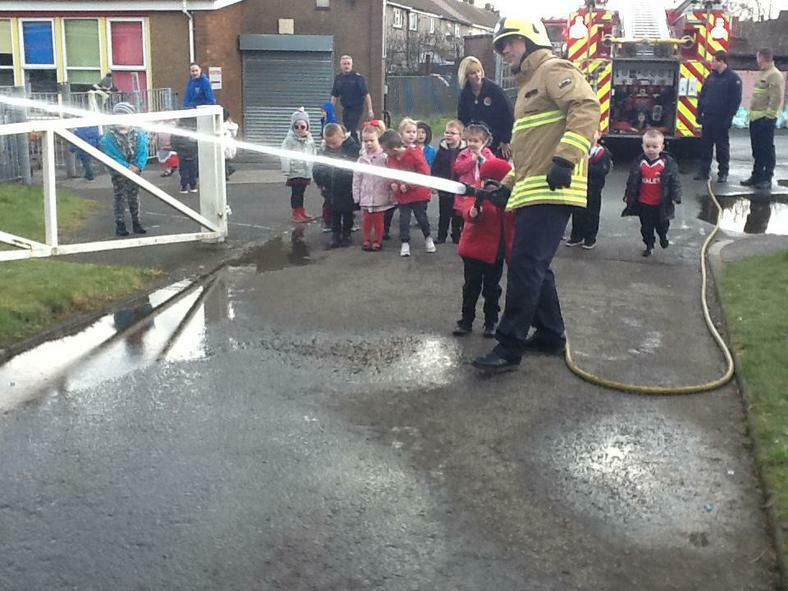 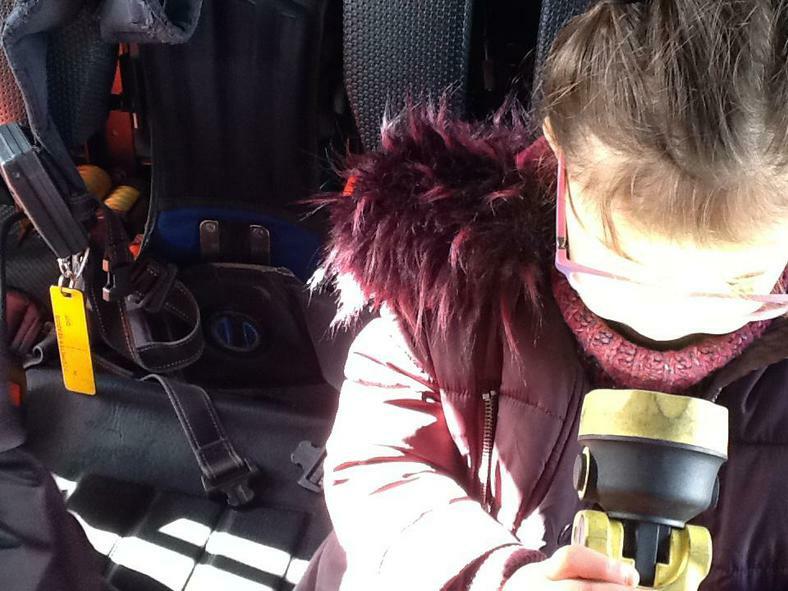 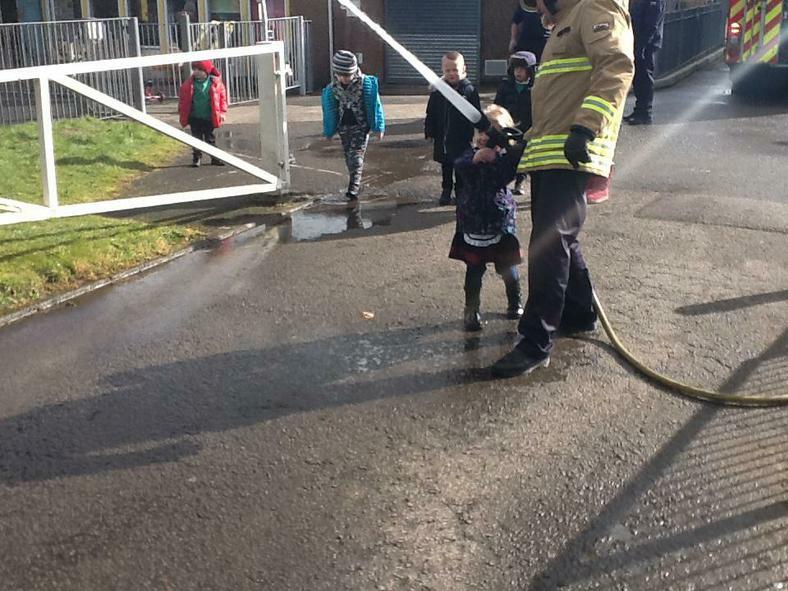 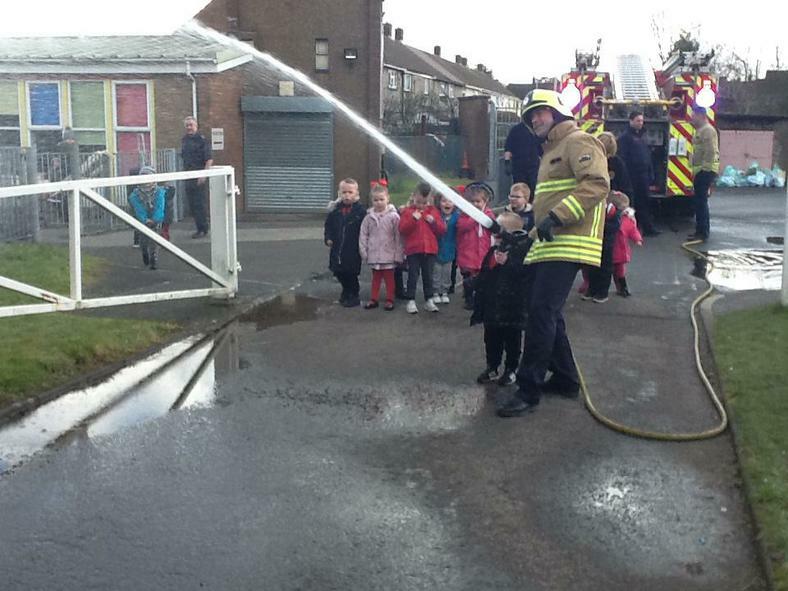 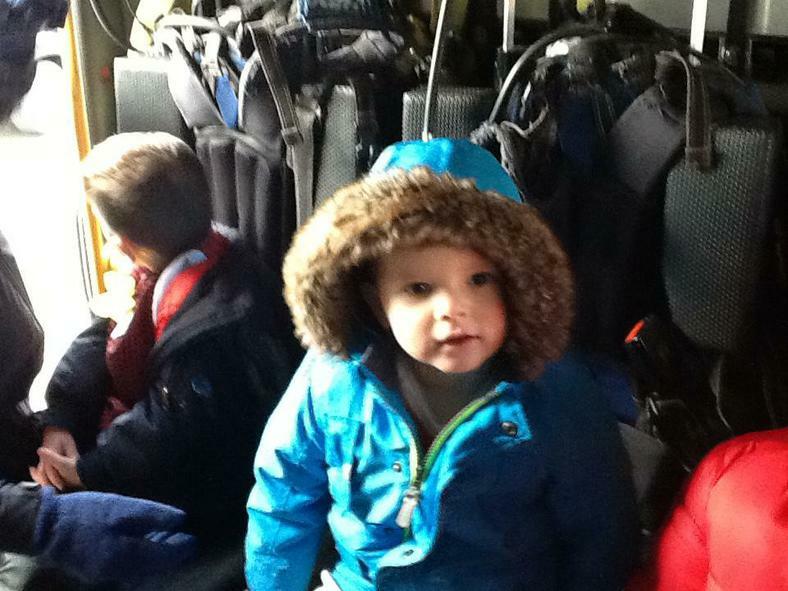 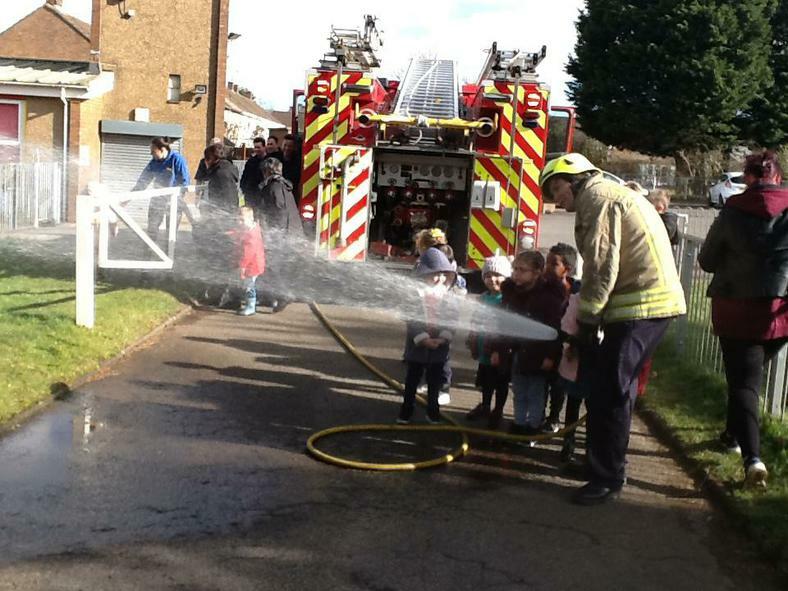 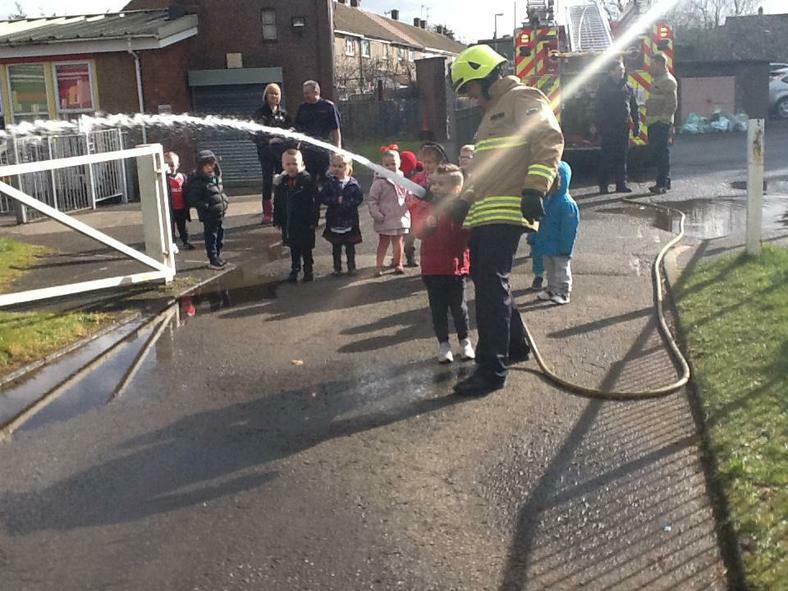 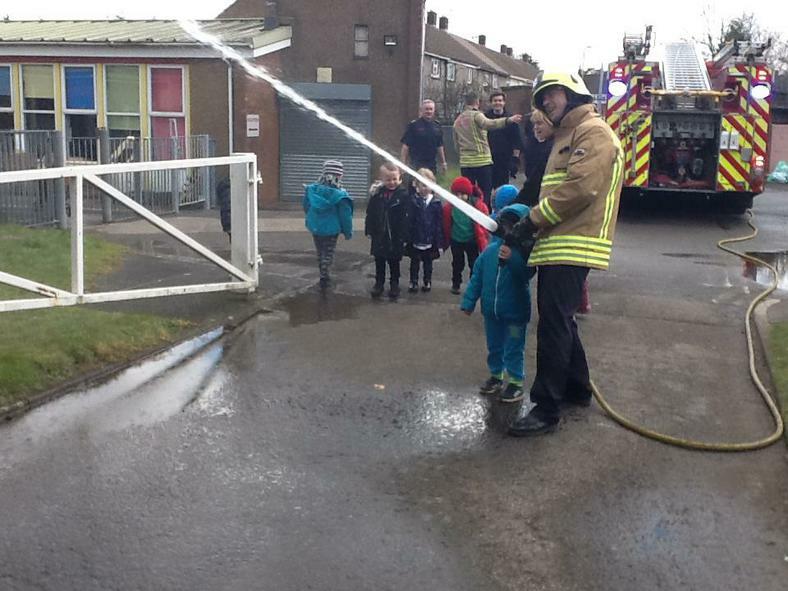 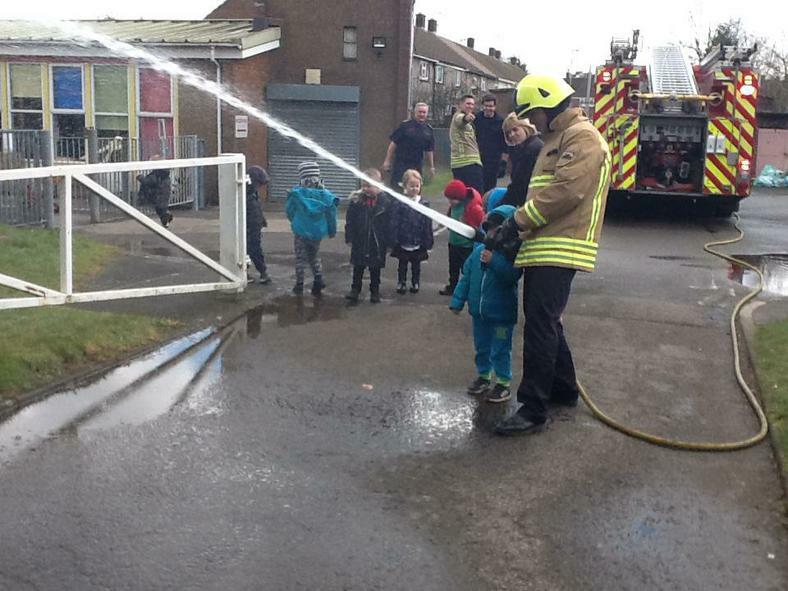 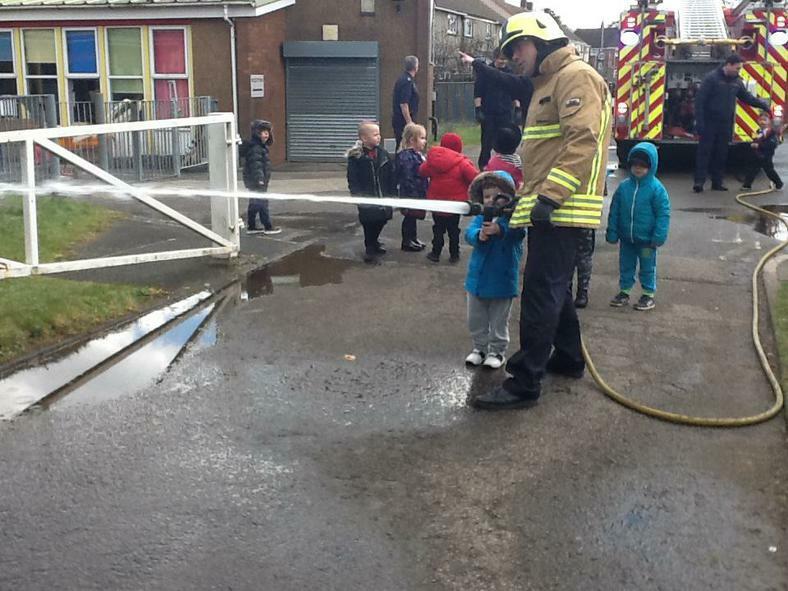 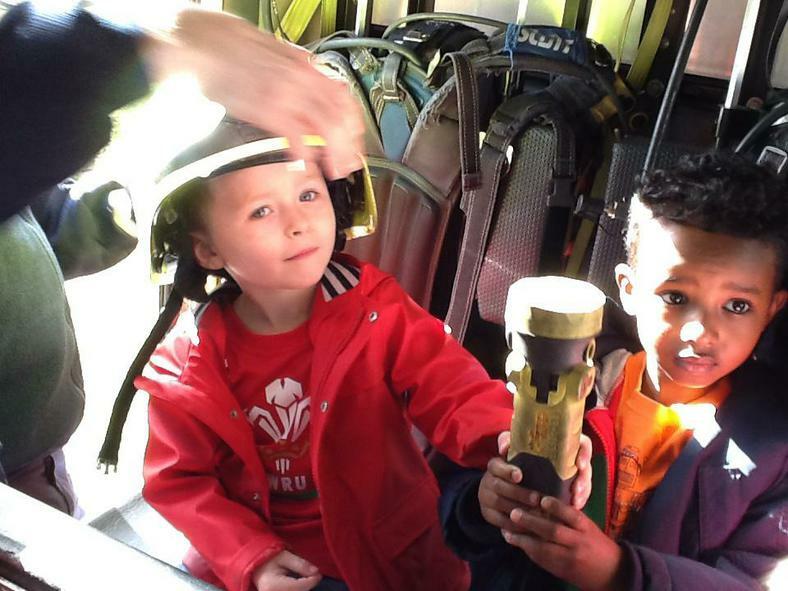 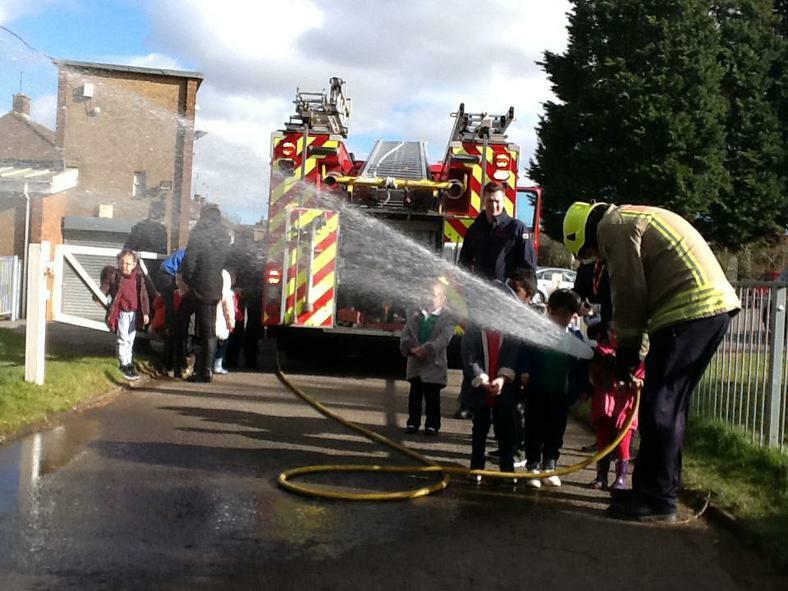 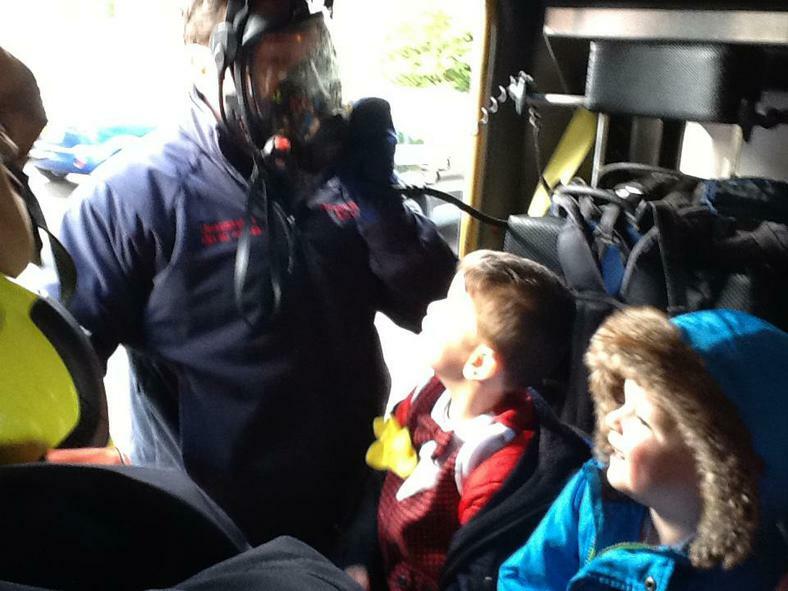 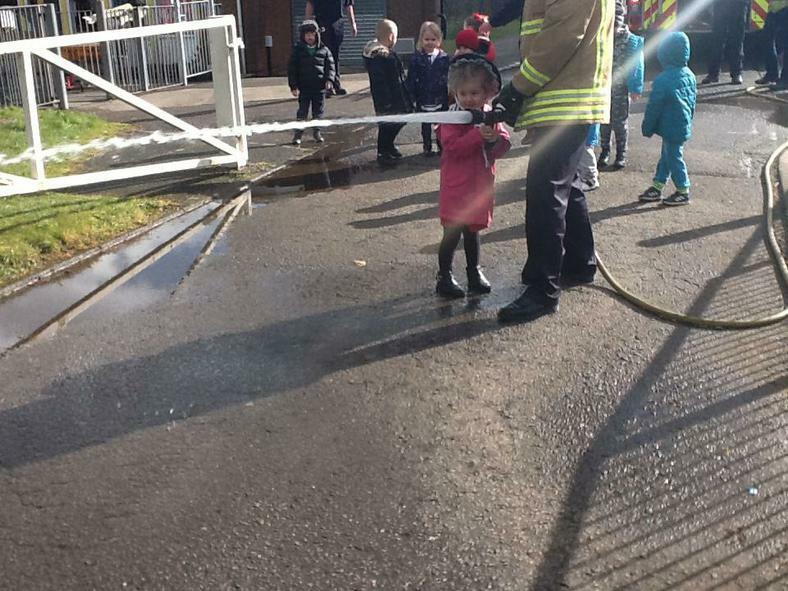 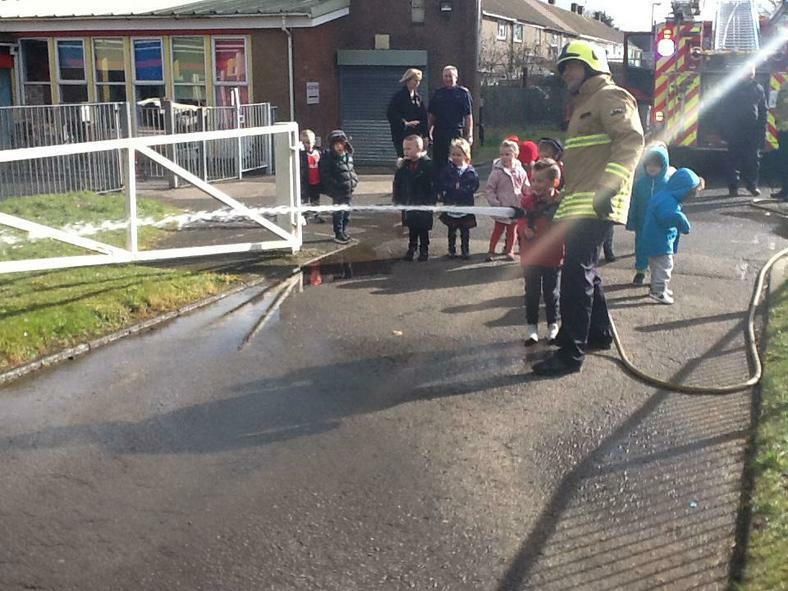 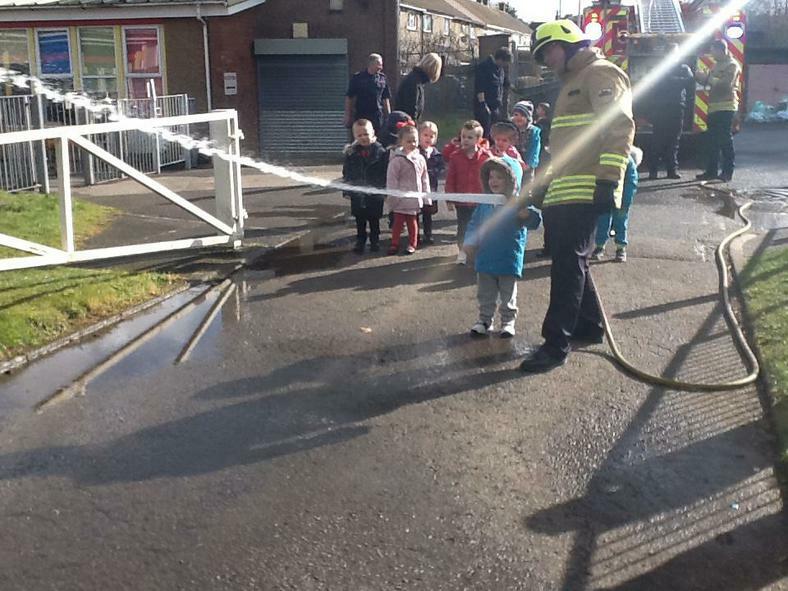 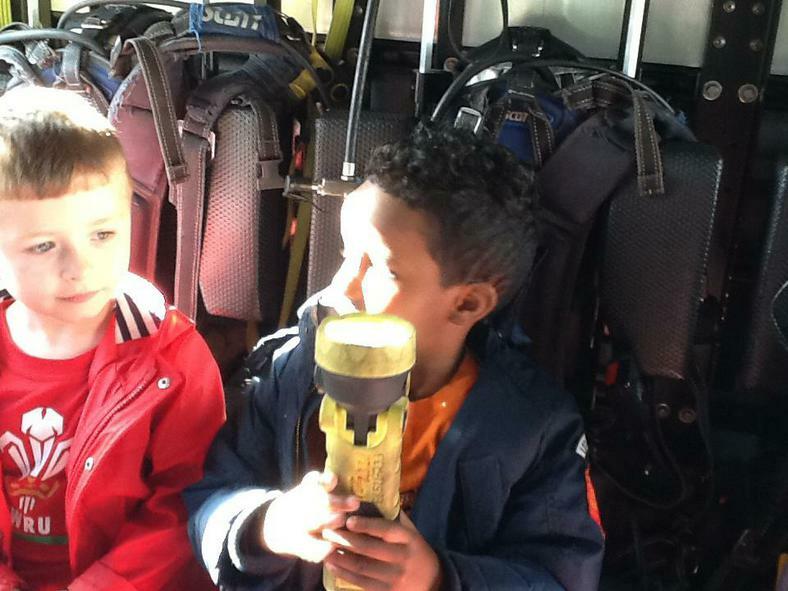 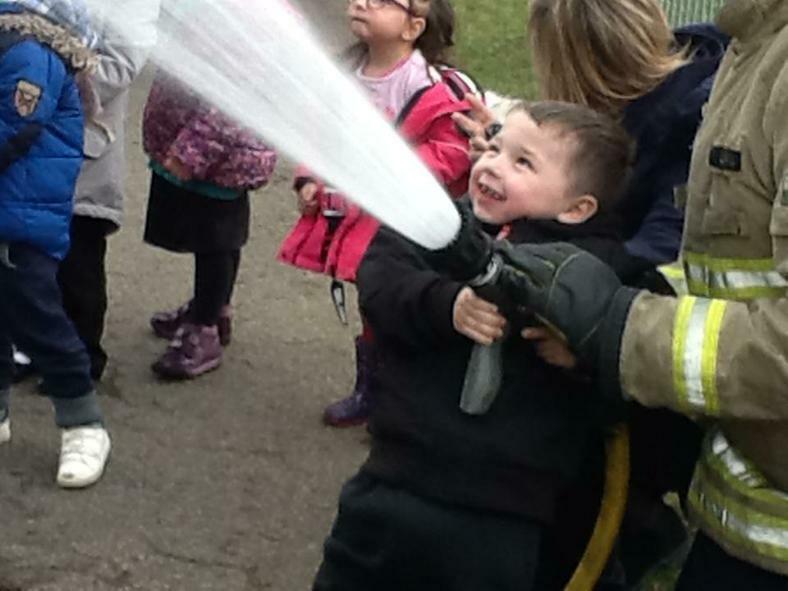 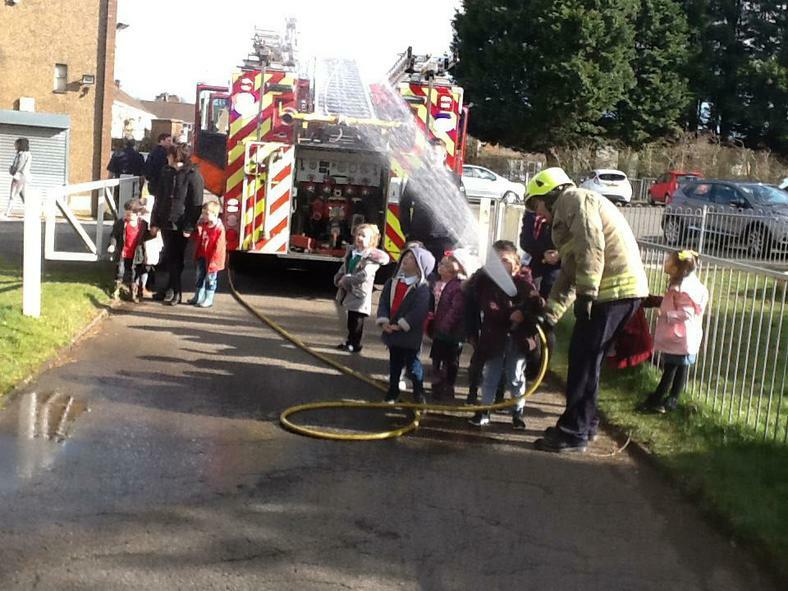 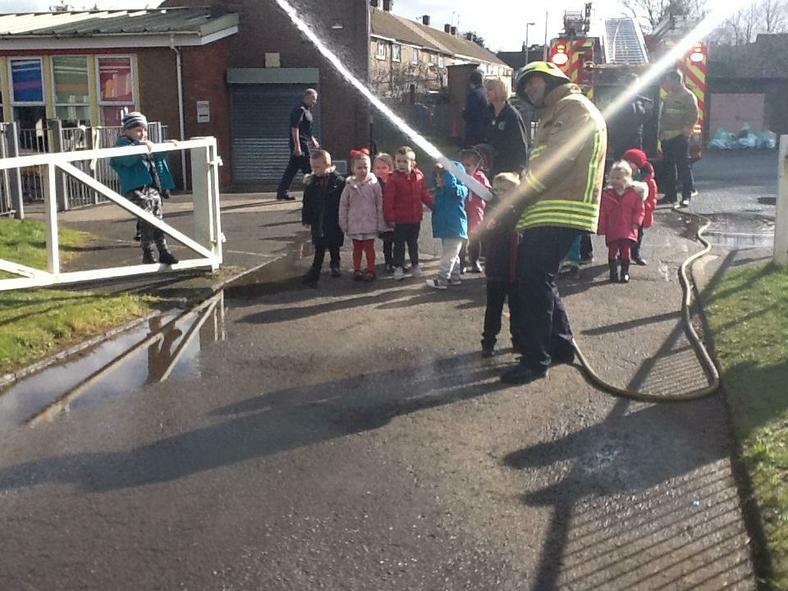 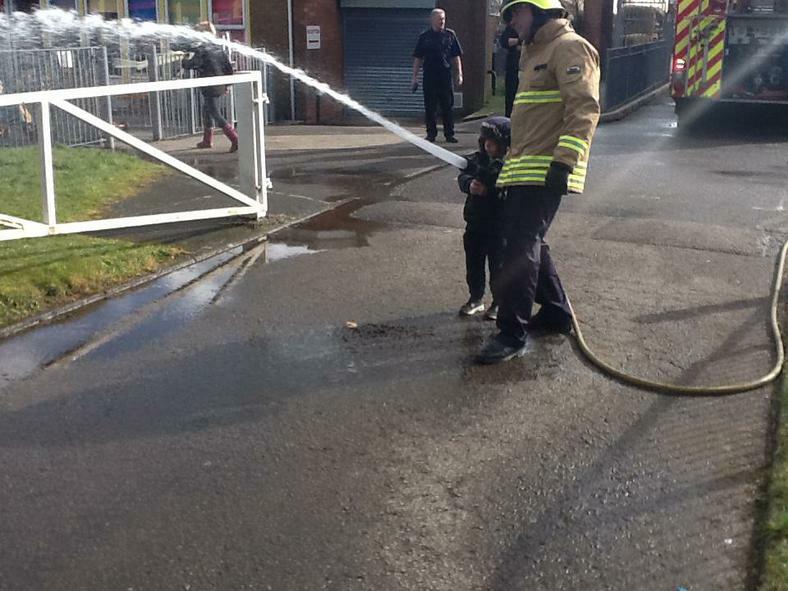 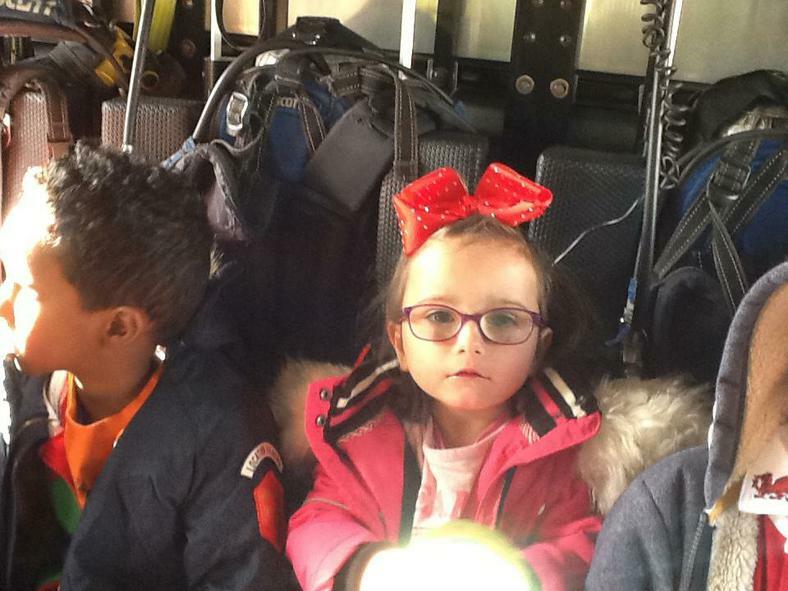 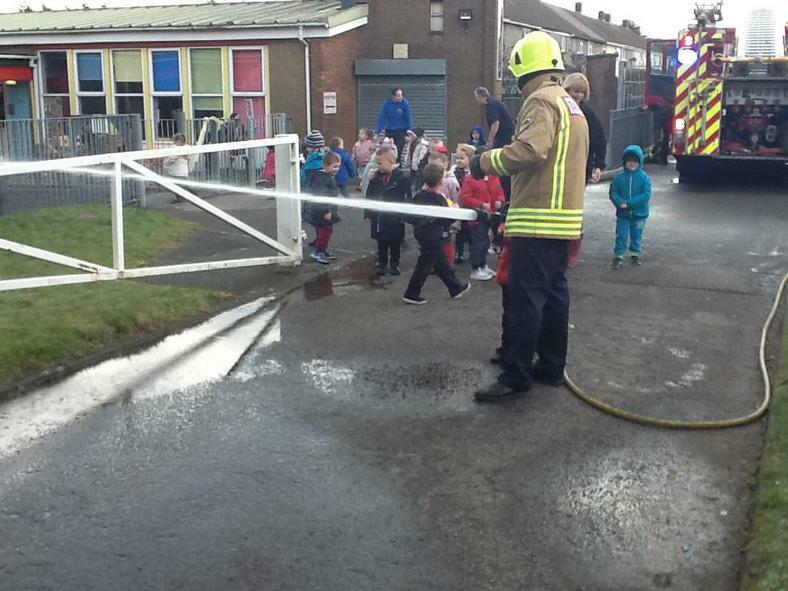 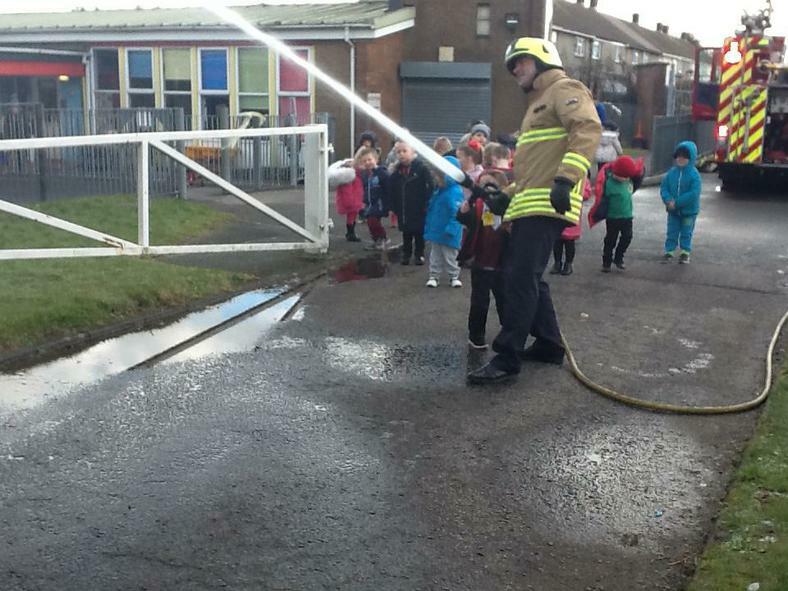 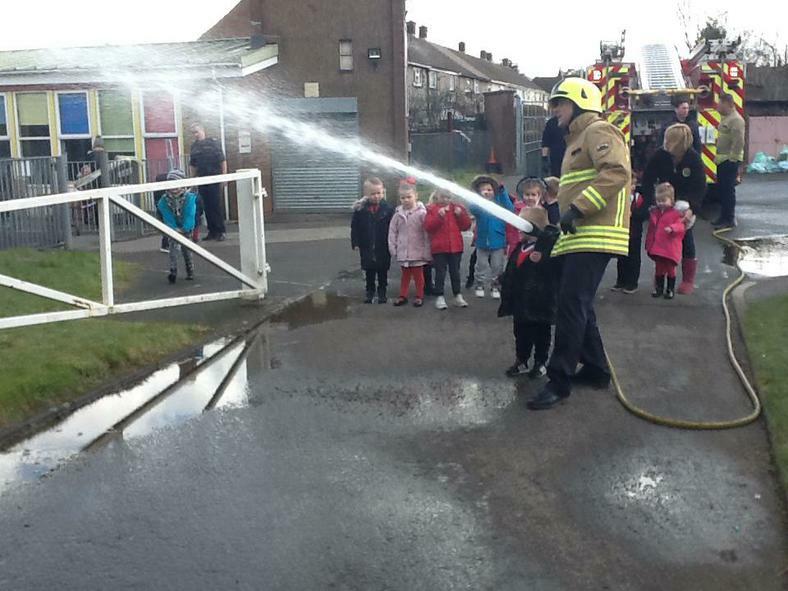 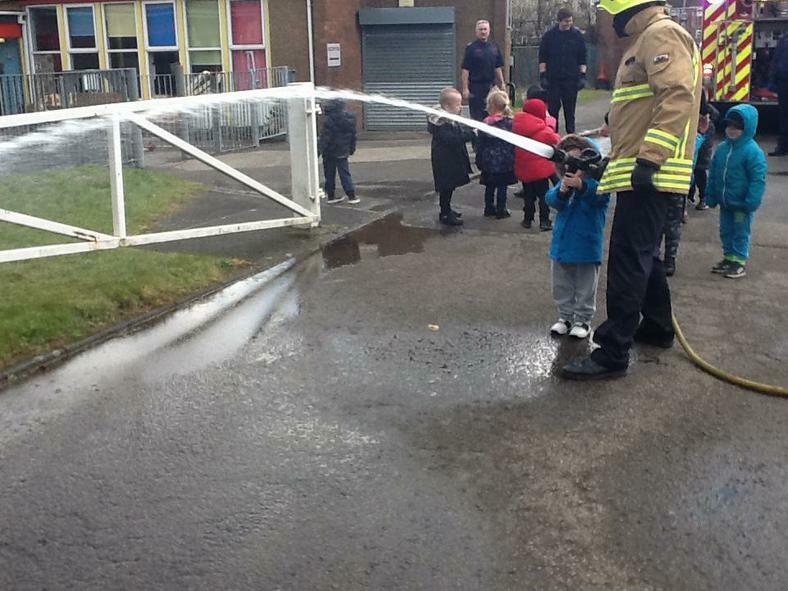 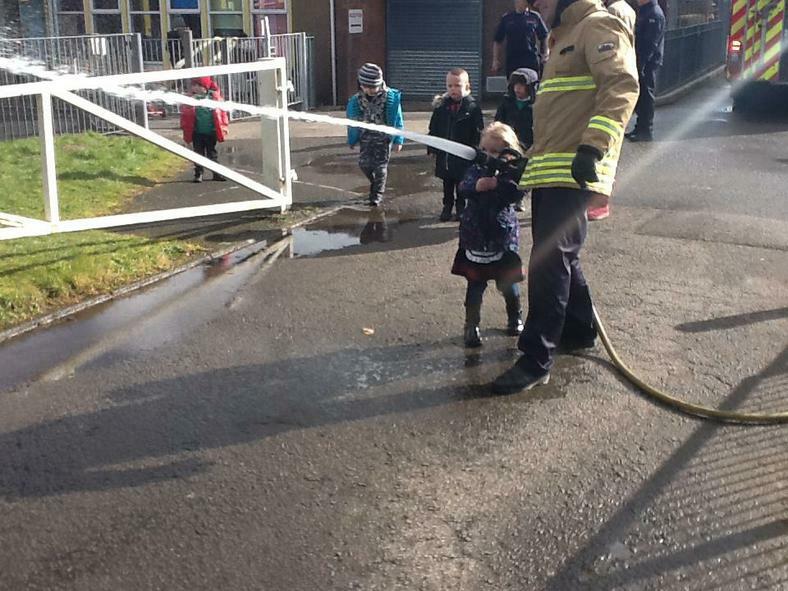 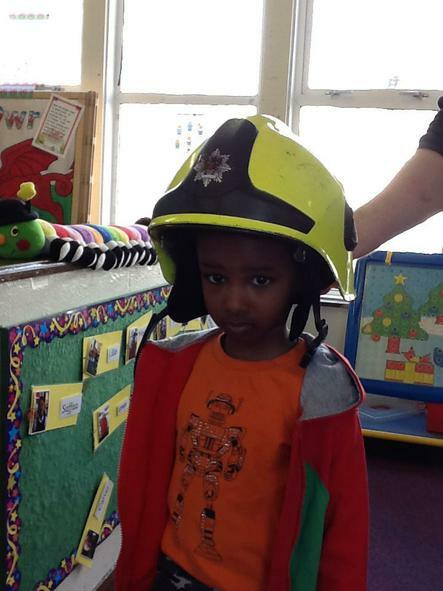 The fire fighters will tell us how to stay safe. 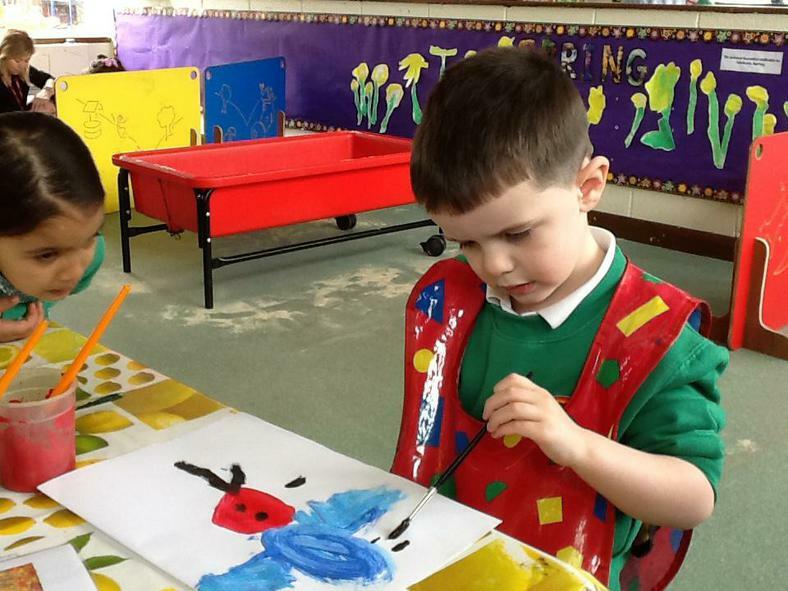 We will also be busy making cards for a special person in our family. 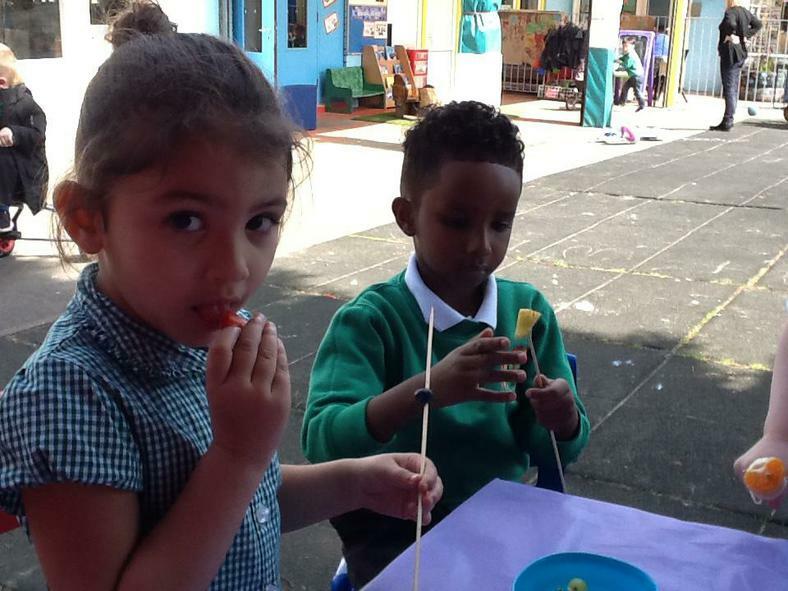 Please remember that snack money is £1 a week, there are still a number of people with outstanding amounts, please pay or see us as soon as possible. 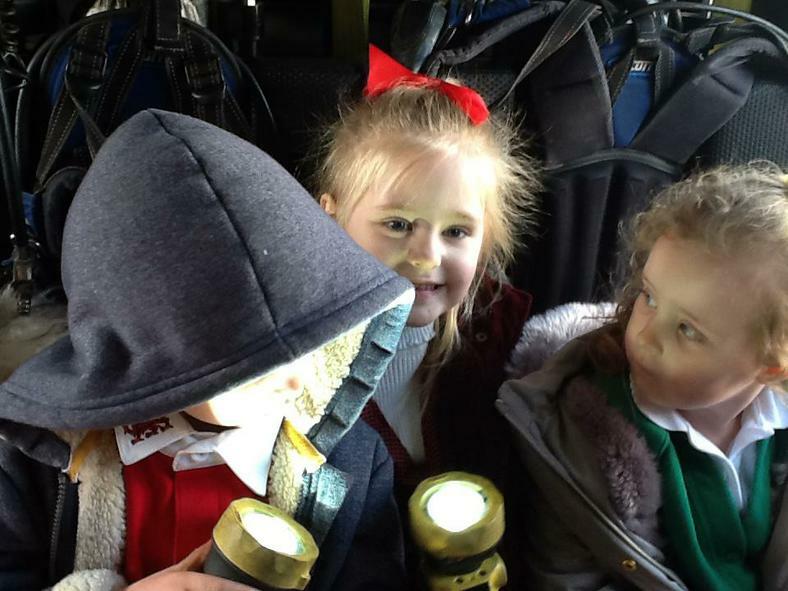 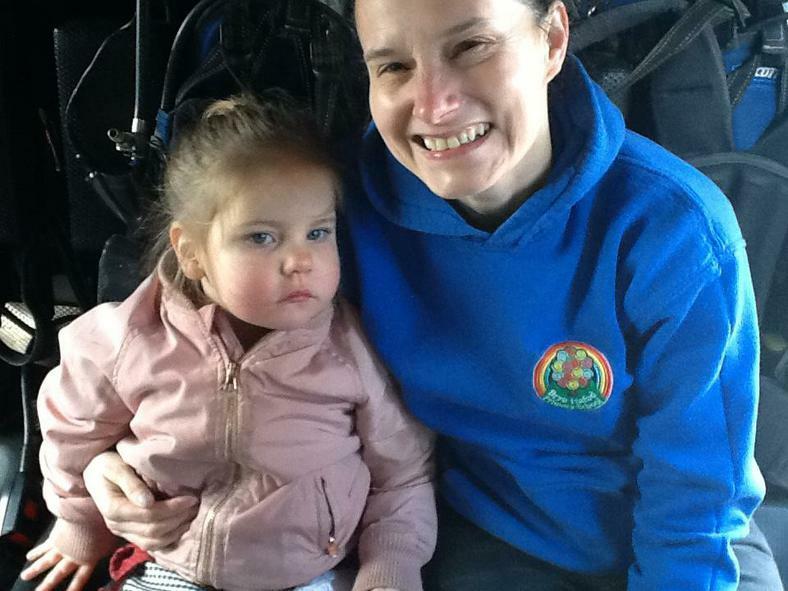 If any of our parents have expertise or experience in a job role of people who help us and would be willing to come and chat to the children or show any equipment that they use, please see me to arrange. 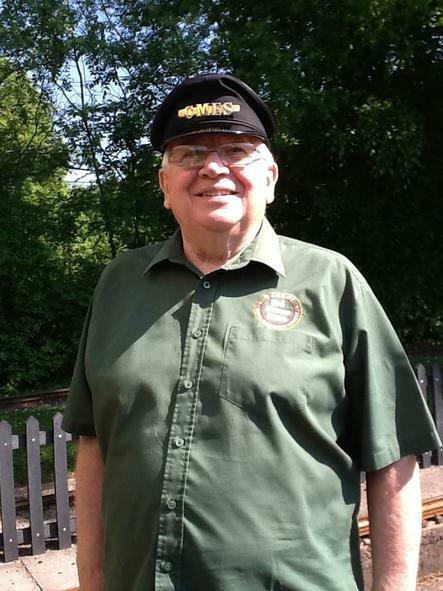 Many thanks for your continued support and well wishes whilst I've been ill and off work. 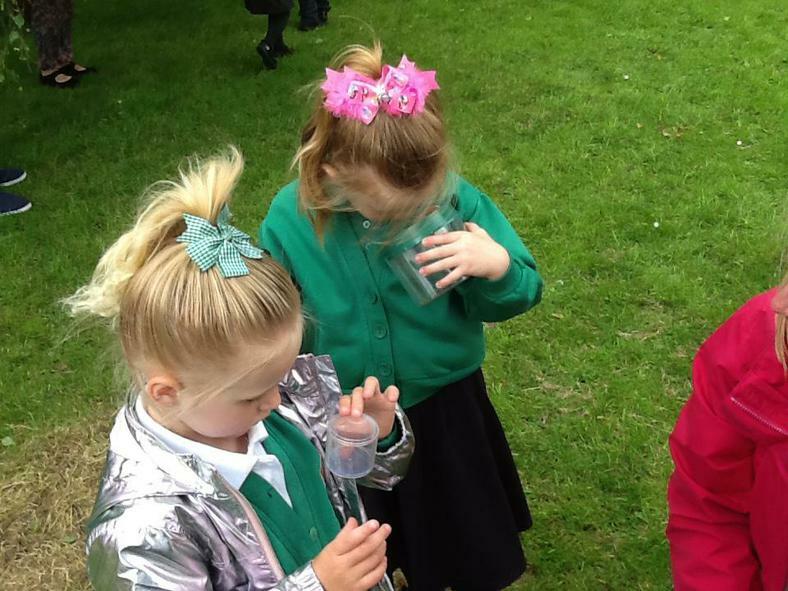 We are continuing with our SPACE topic and this week we will be focussing on Reflections and Mirrors. 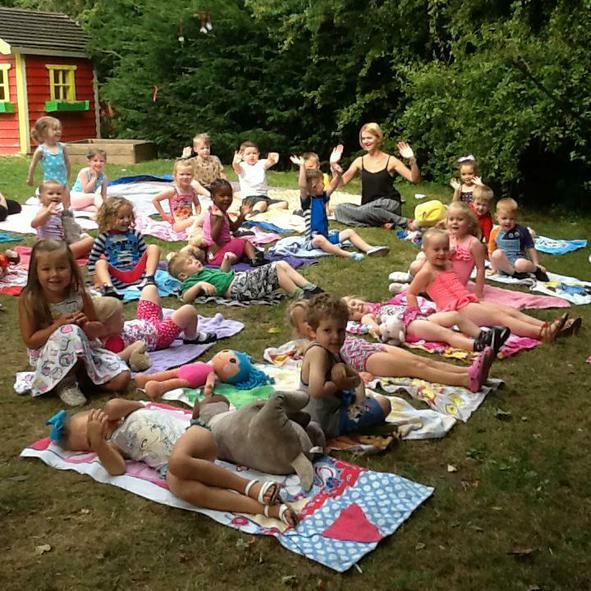 We will be reading a few short stories and watching some videos including clips from Rainbow Fish, Snow White, Mirror Mirror on the wall, The Ugly Duckling and The magic Mirror. 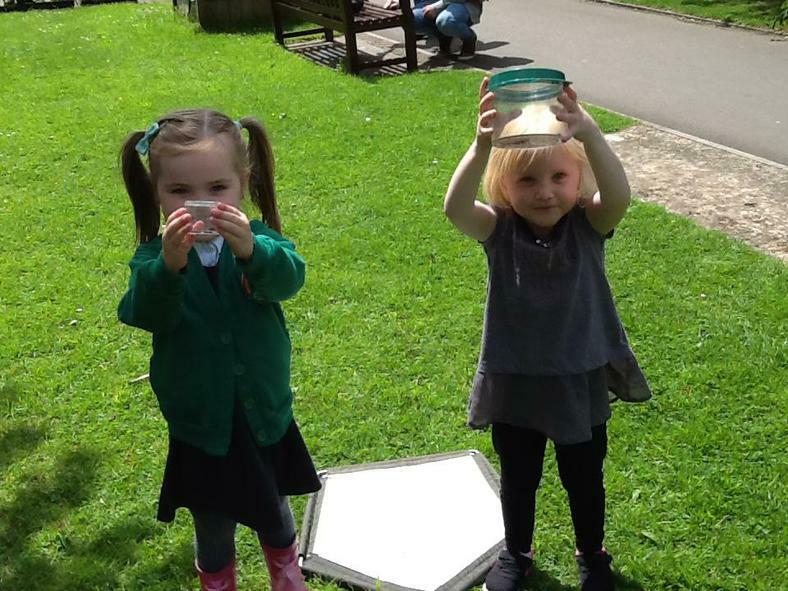 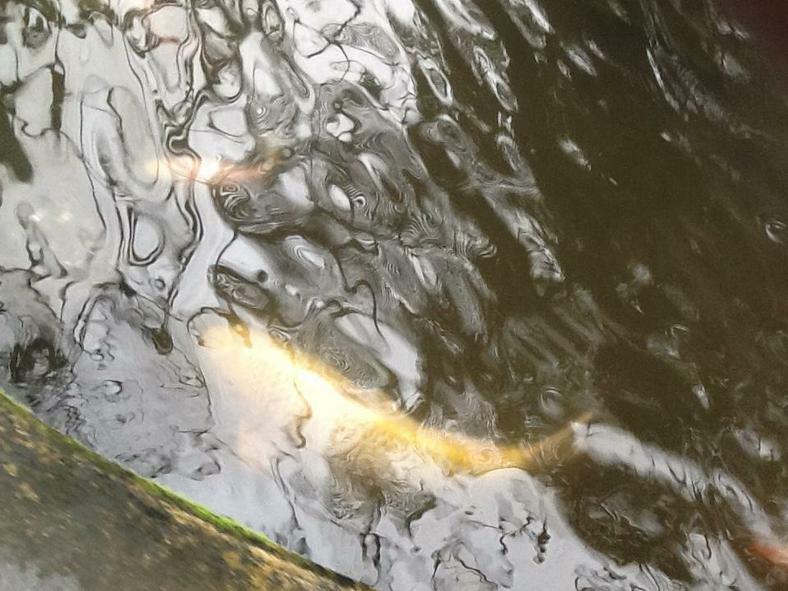 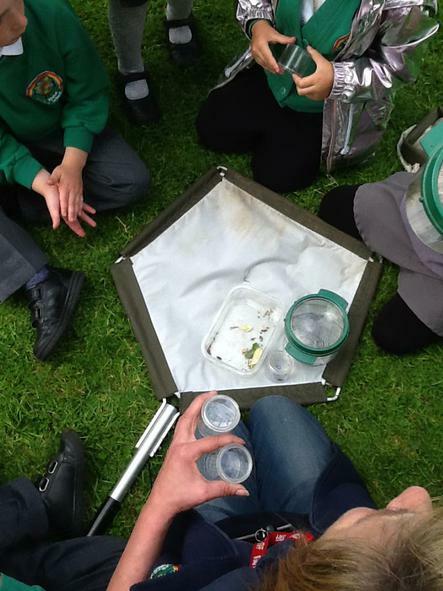 We will be creating our own magic mirrors, decorating old CD's to shimmer like Rainbow Fish with his shiny scales, building rockets, and looking at reflections in the water using mirrors. 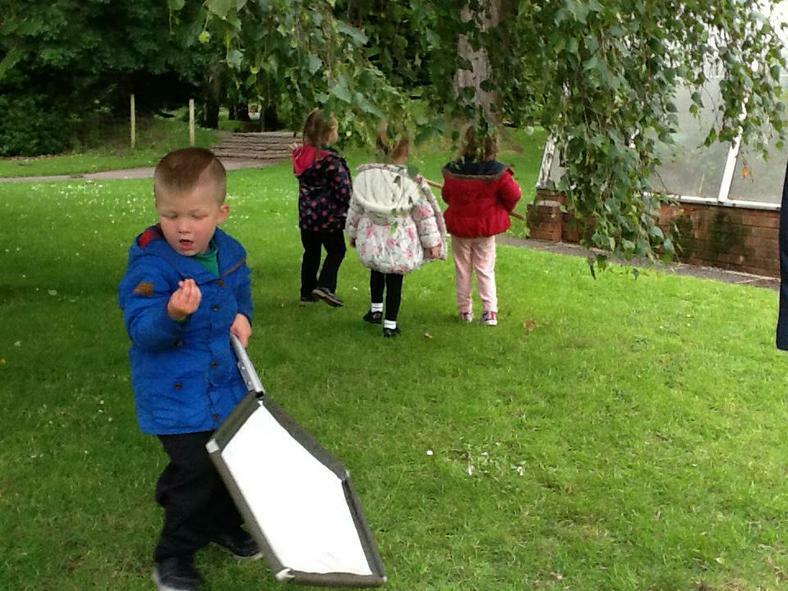 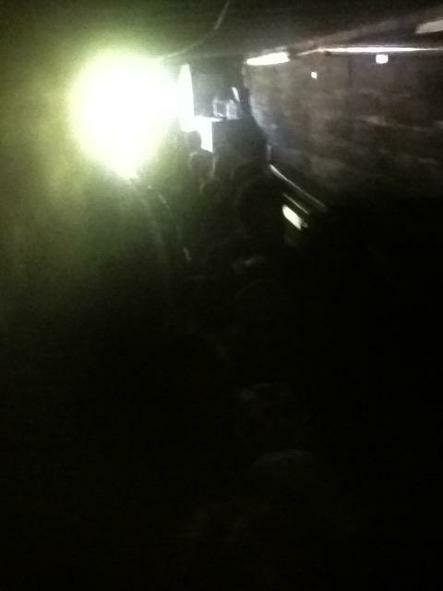 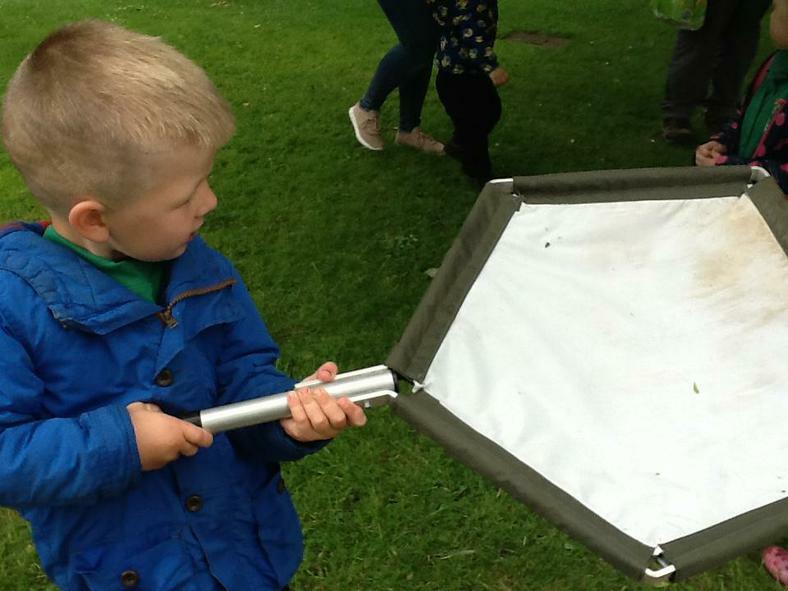 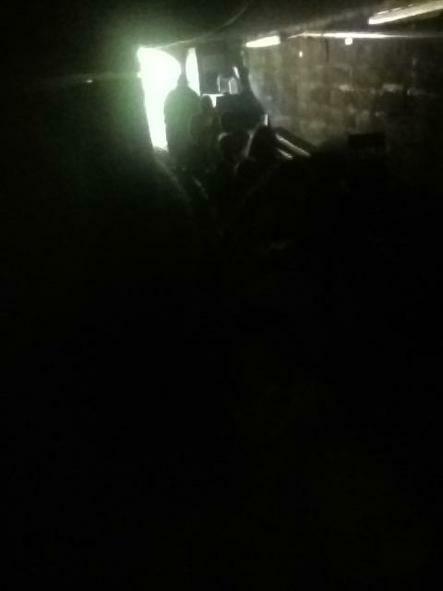 We will be introducing our dark den outside and using torches to create shadows. 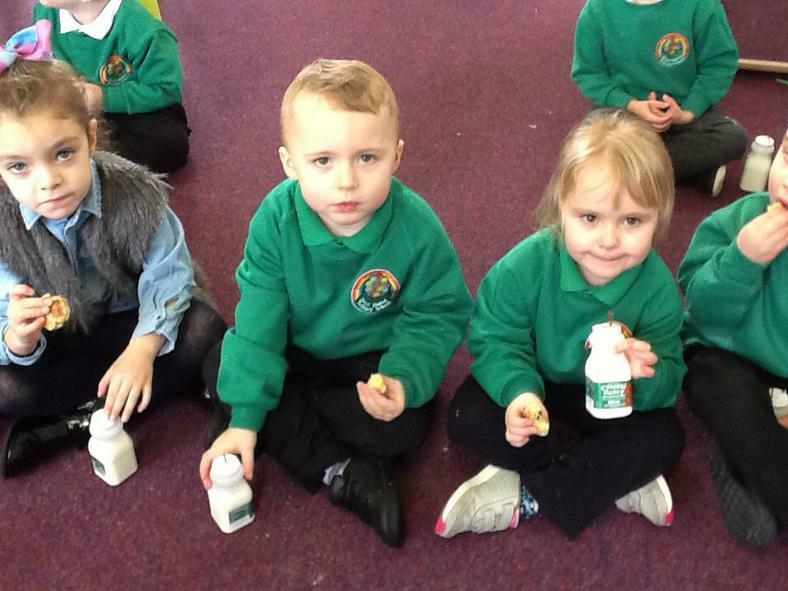 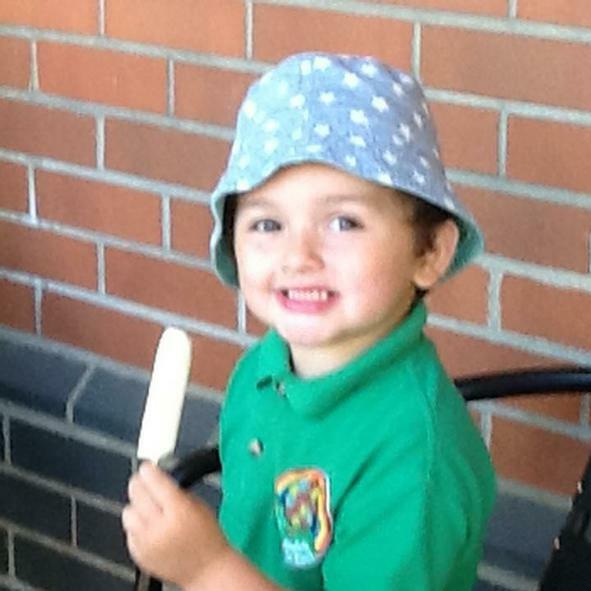 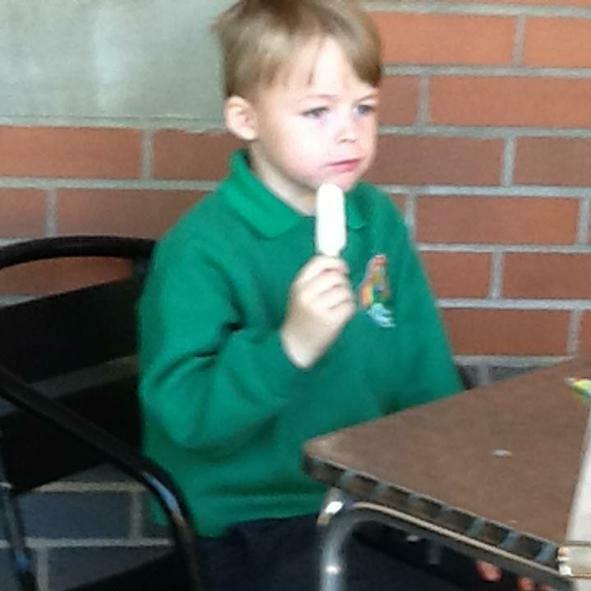 PLEASE REMEMBER TO SEND IN YOUR CHILDS SNACK ONEY £1 A WEEK. 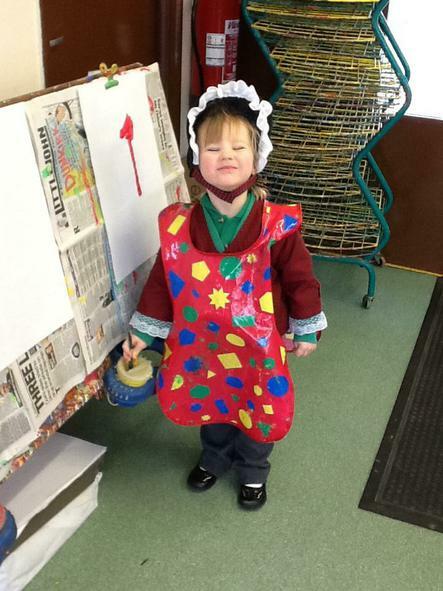 THURSDAY 16TH NOVEMBER LAST DATE FOR CHRISTMAS CARD DESIGN ORDERS, PLEASE RETURN OREDRS AND PAYMENTS BY THIS DATE. 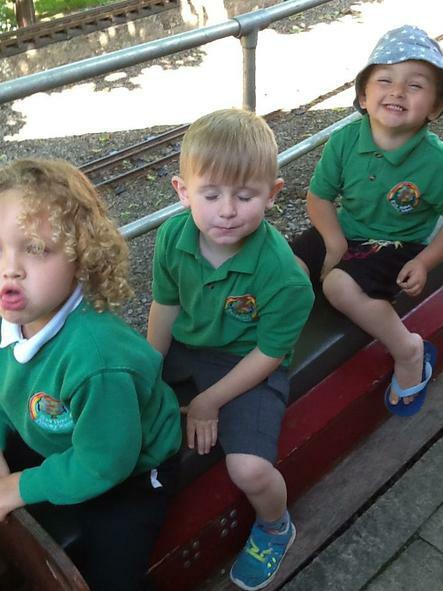 SCHOOL PHOTOGRAPH ORDERS NEED TO BE RETURNED BY WEDNESDAY 15TH NOVEMBER. 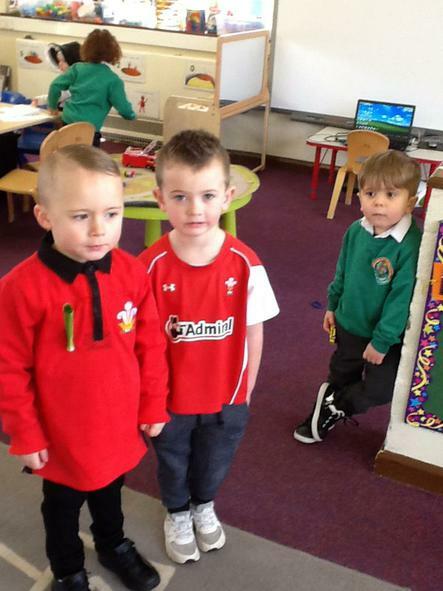 ODD SOCKS DAY THIS THURSADY 16TH NOVEMBER, PLEASE WEAR YOUR ODD SOCKS TO SCHOOL. 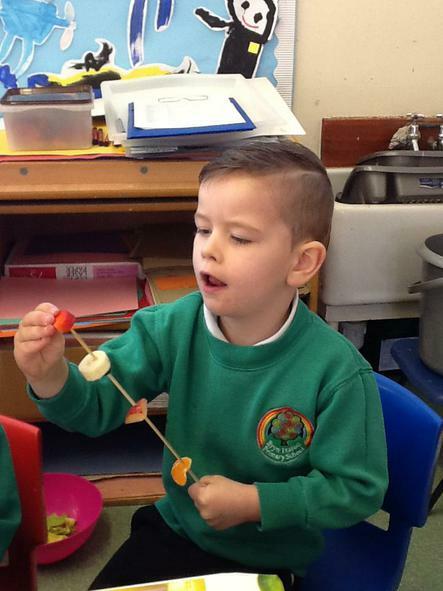 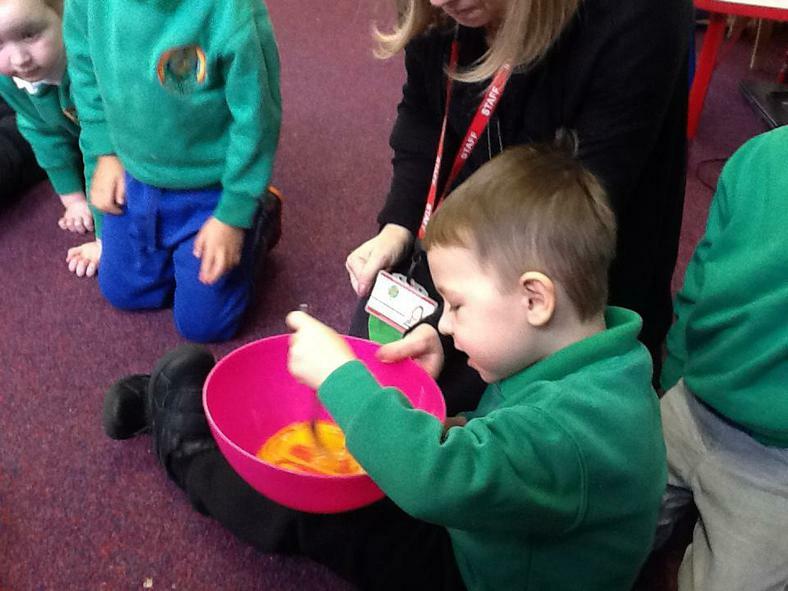 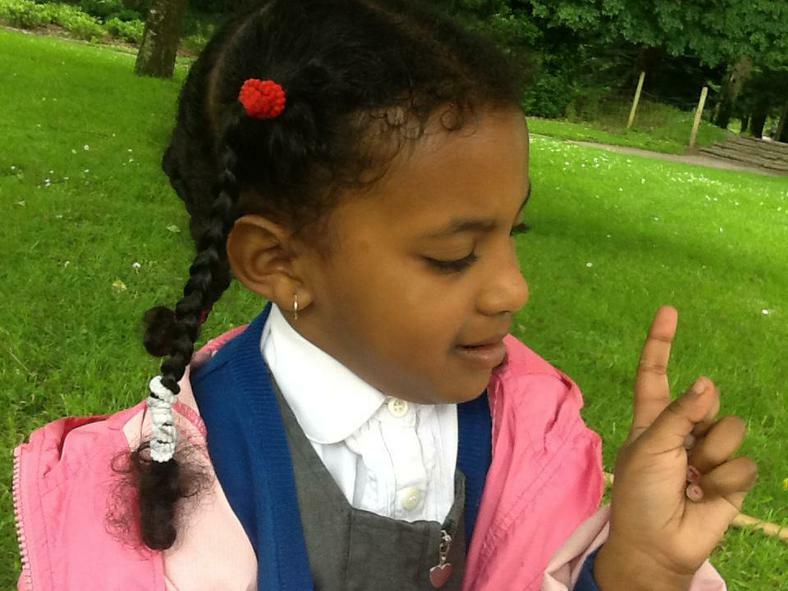 This week we are focussing on Our 5 Senses. 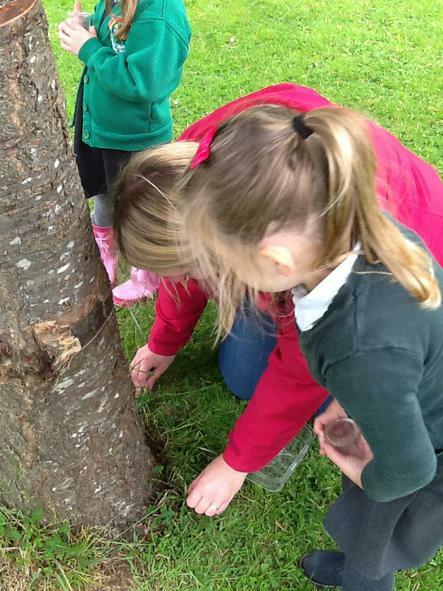 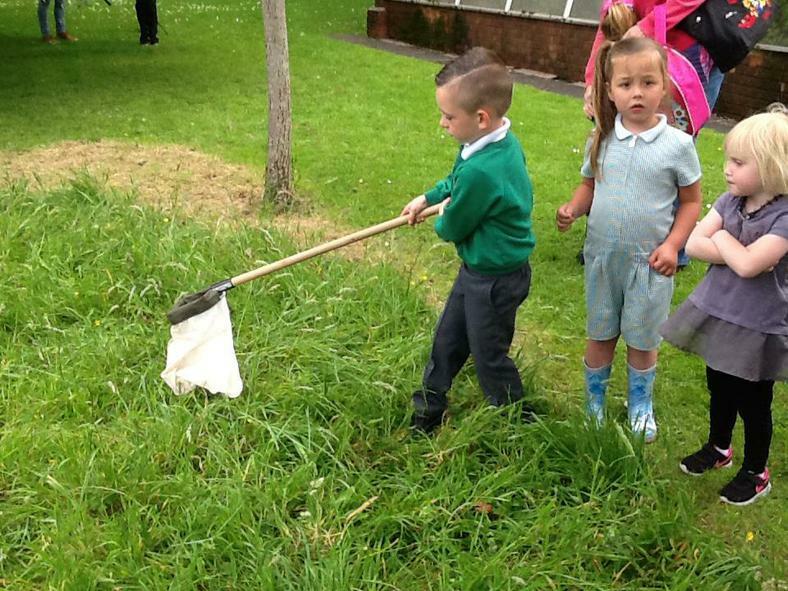 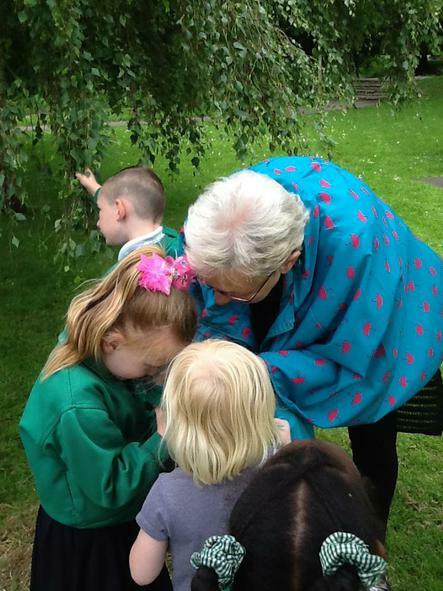 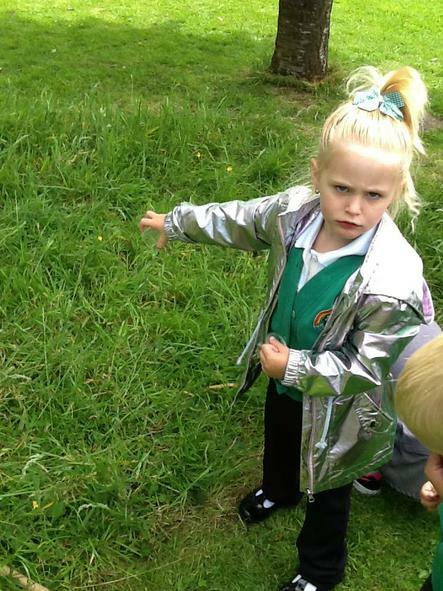 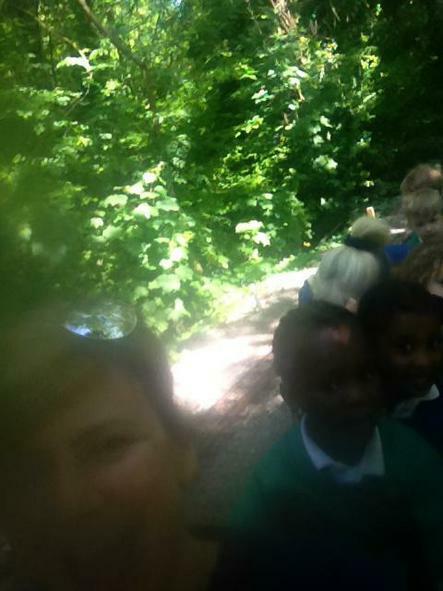 We will be going on a listening walk around the school grounds. 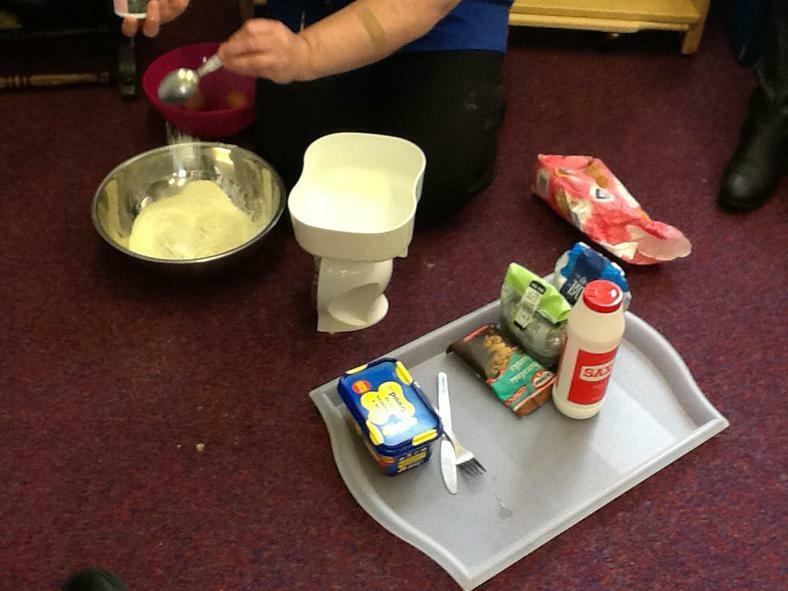 We will be tasting lots of different foods blindfolded and guessing what they are. 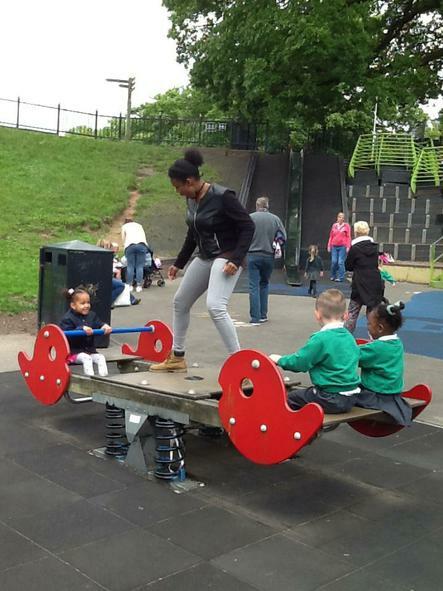 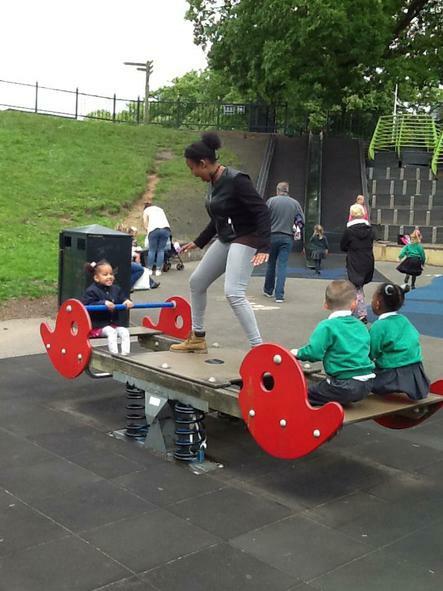 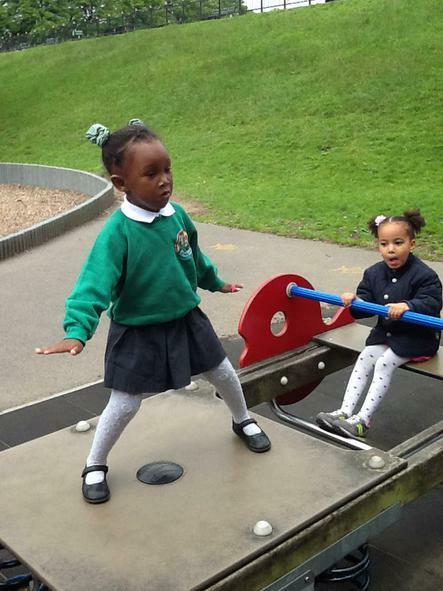 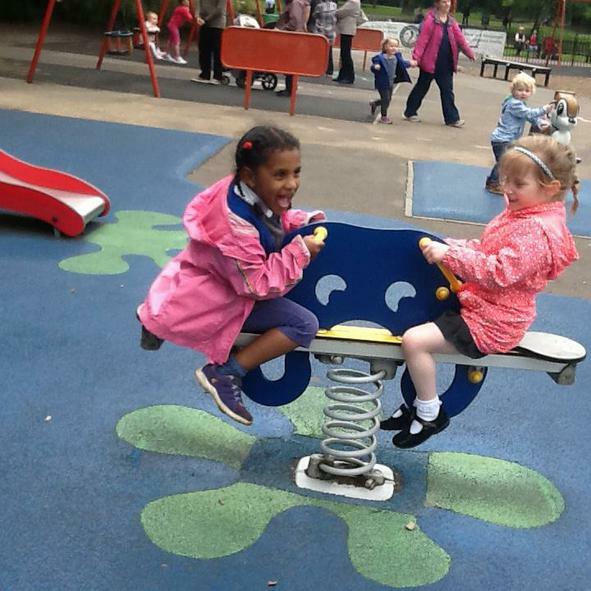 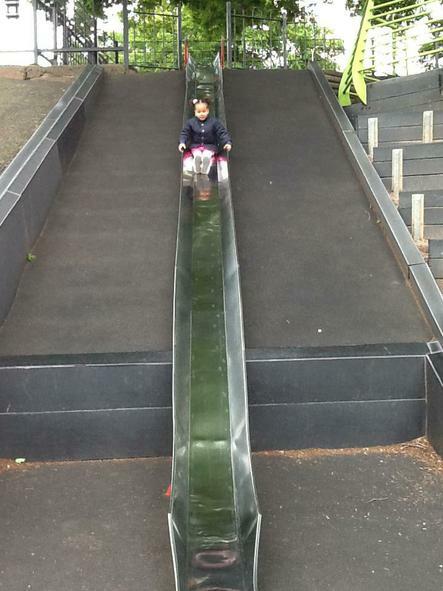 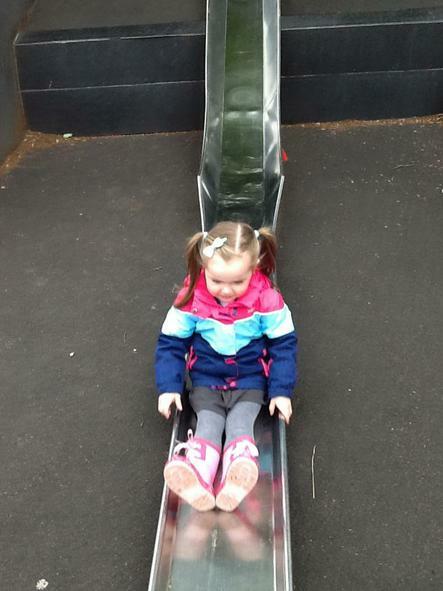 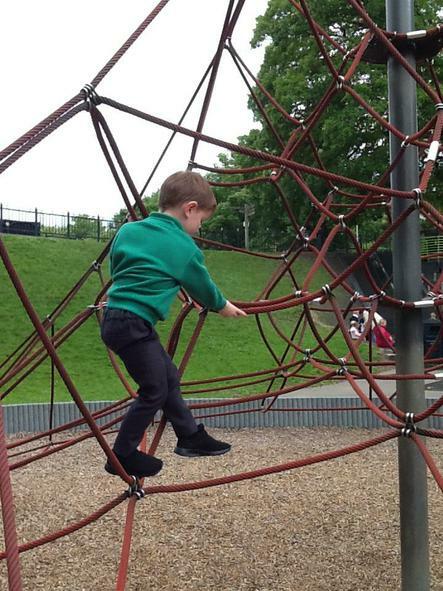 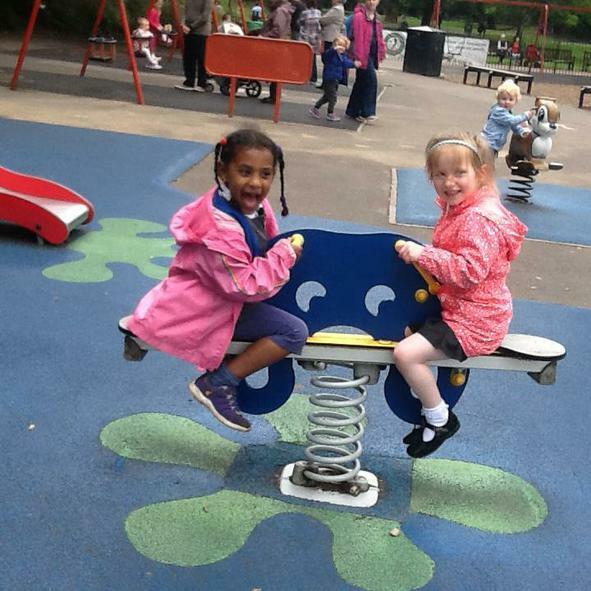 We will be enjoying the physical activities outside, lots of the children are now able to pedal the bikes and are able to use the balancing apparatus more confidently. 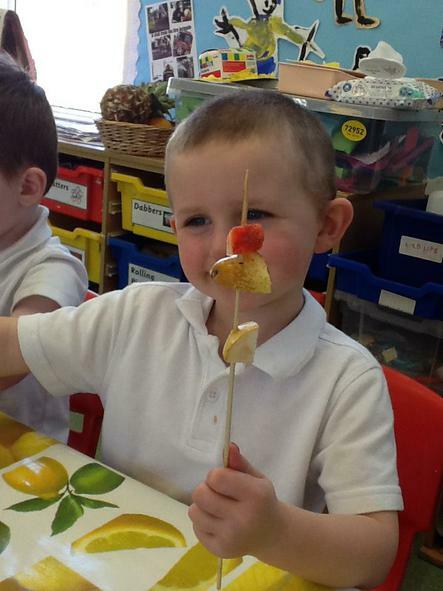 We will be creating individual Mr Potato Head pictures showing the 5 Senses, see, hear, taste, touch and listen. 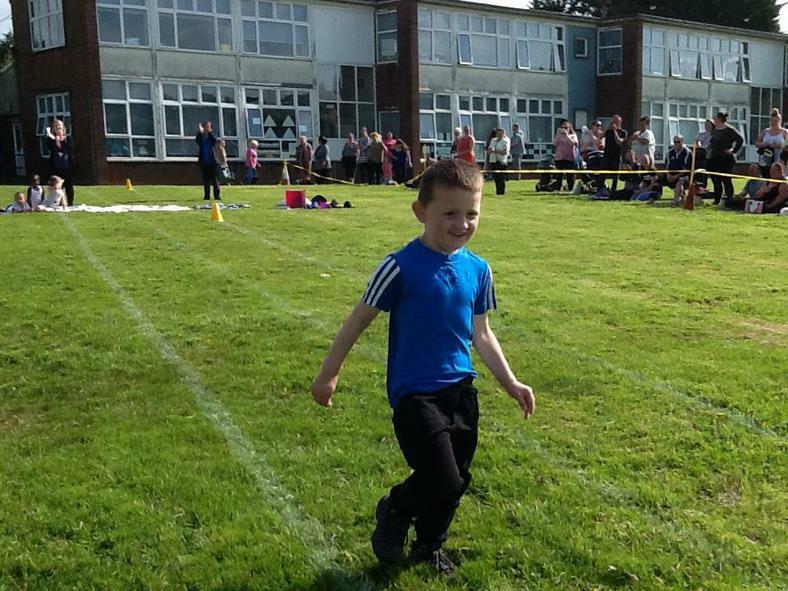 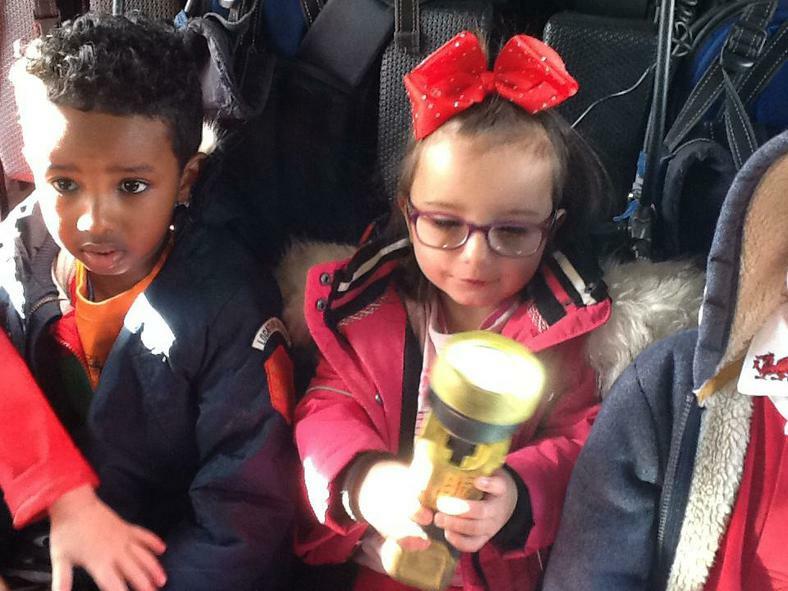 The children will be coming home with their targets over the next two weeks, this needs to be supported at home and the children will quickly achieve them and be given new targets. 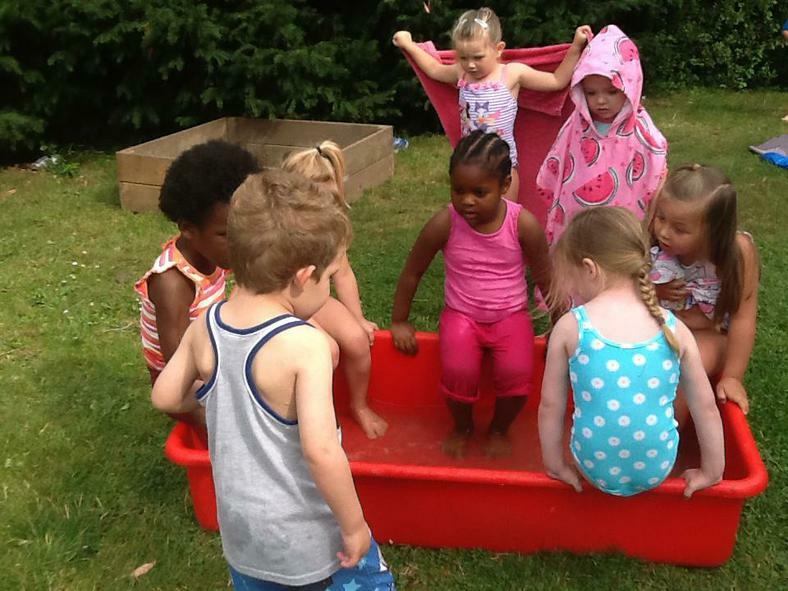 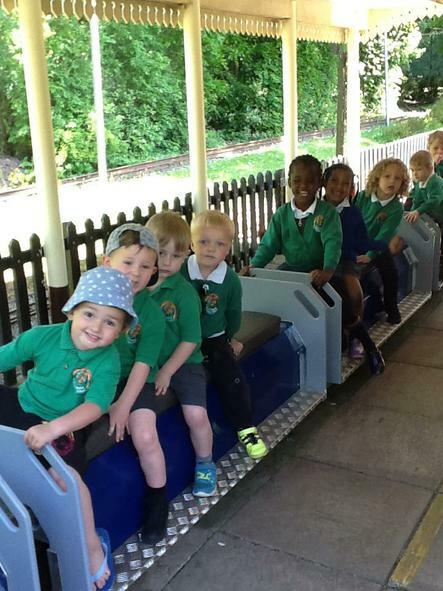 We welcome back a few of our old Nursery children and are excited to welcome our new starters who I know are very keen to join our fun filled Nursery sessions. 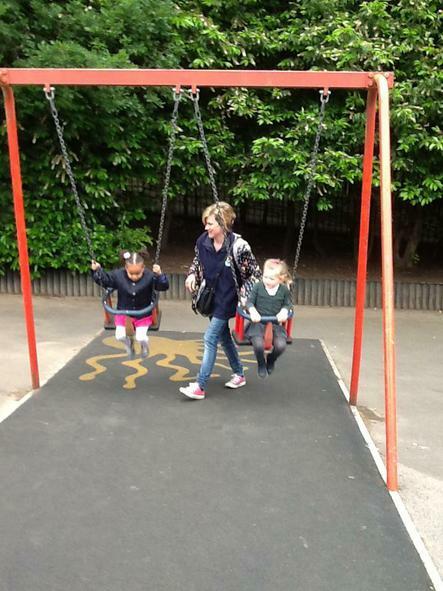 We stagger the children when starting to ensure that they have the best settling in period possible. 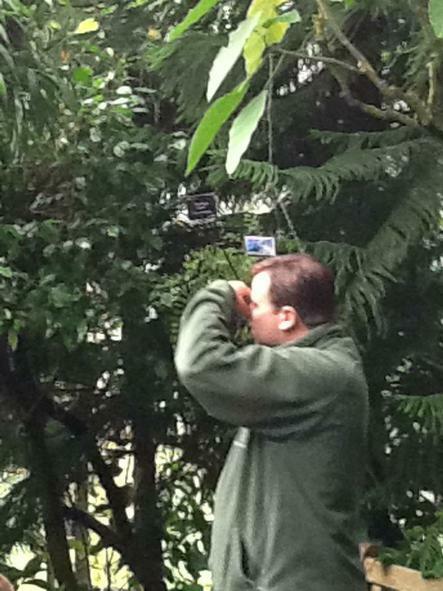 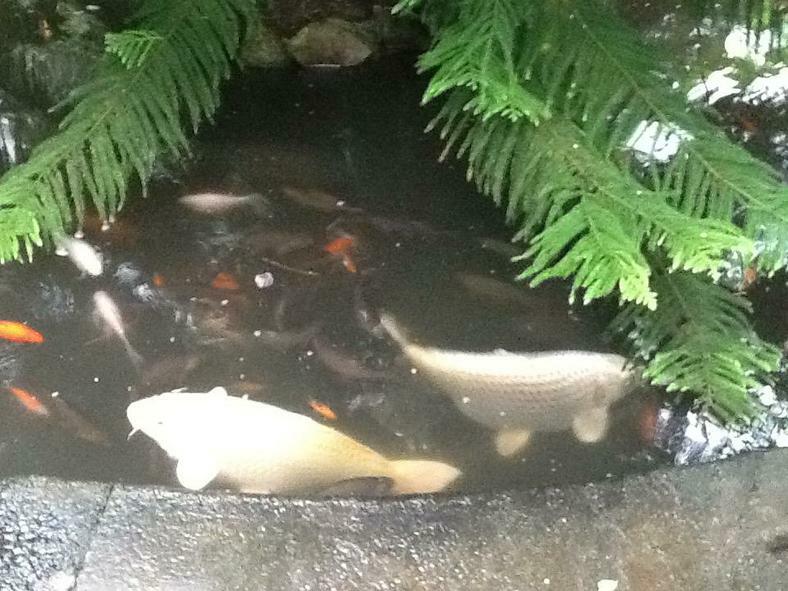 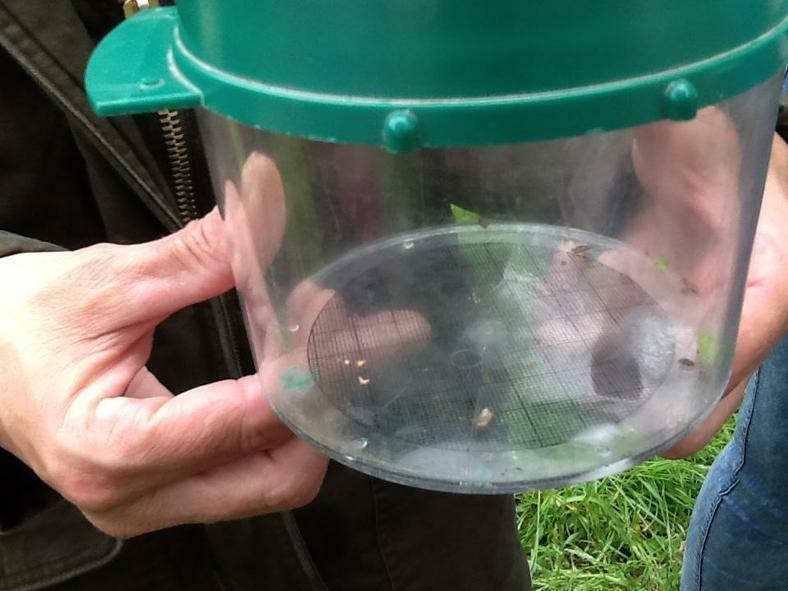 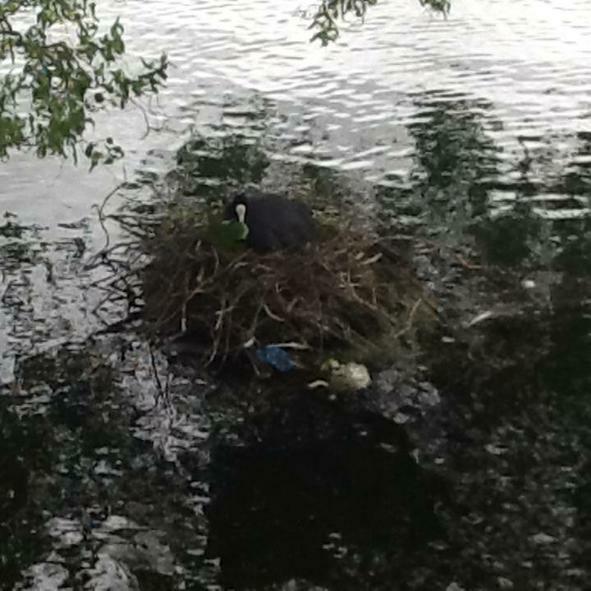 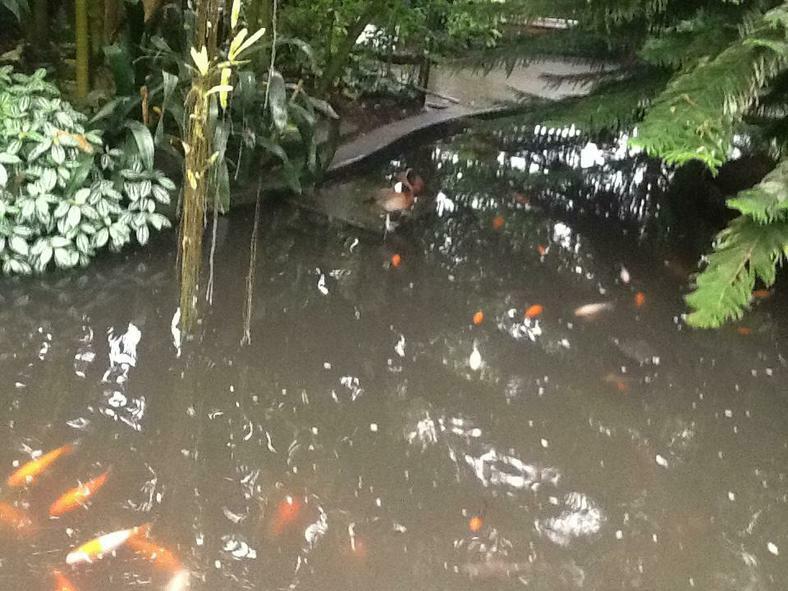 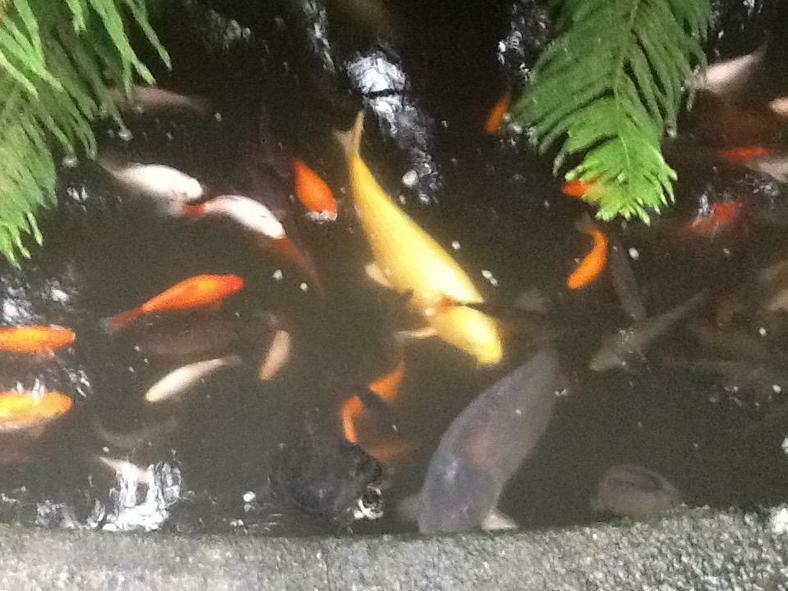 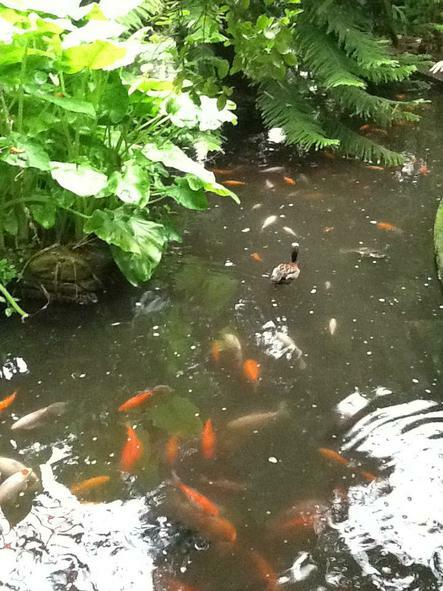 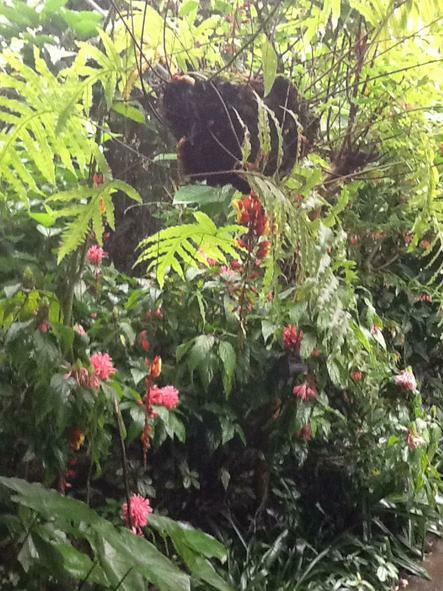 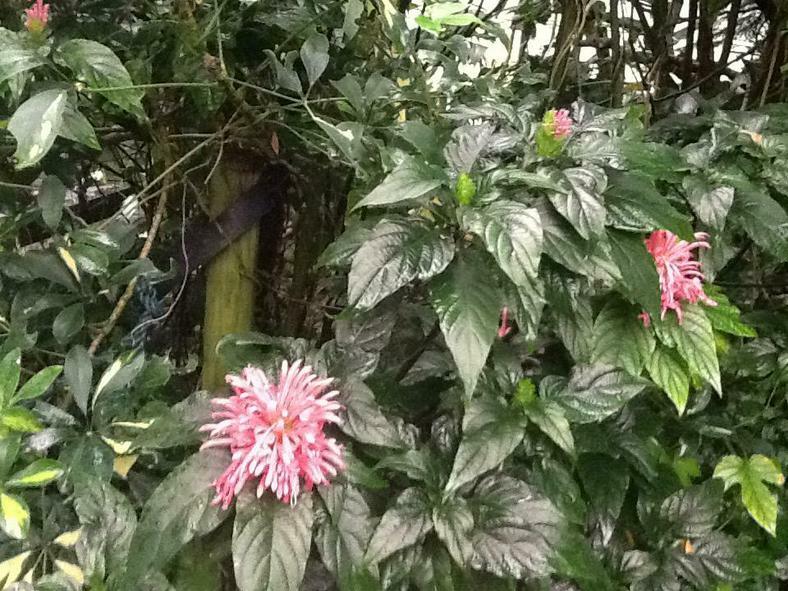 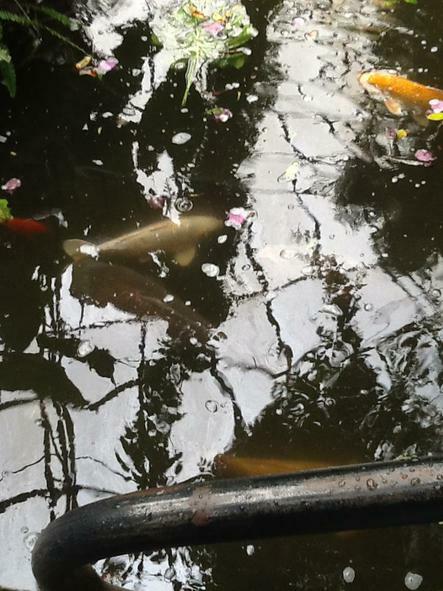 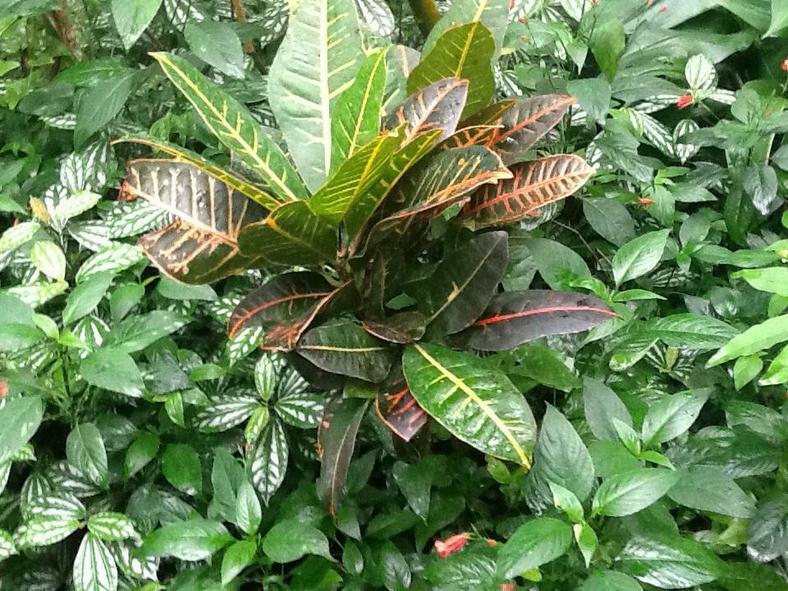 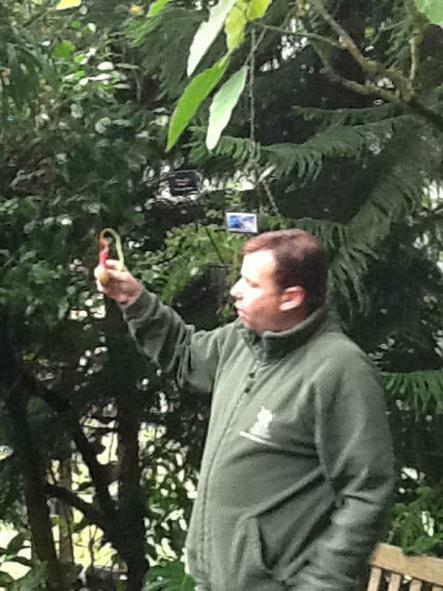 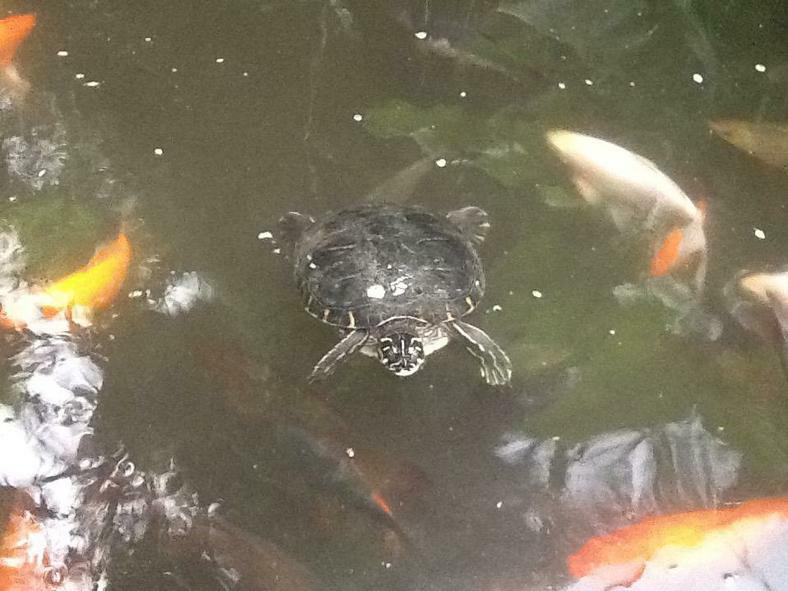 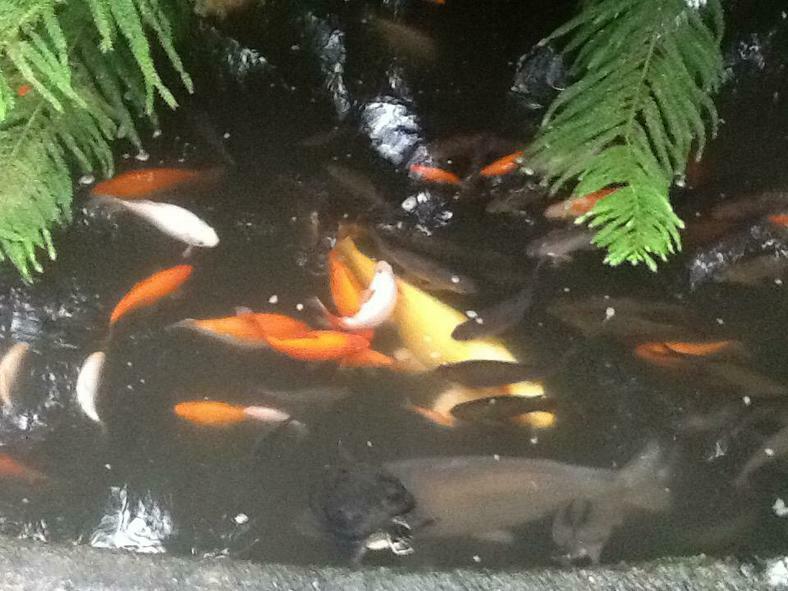 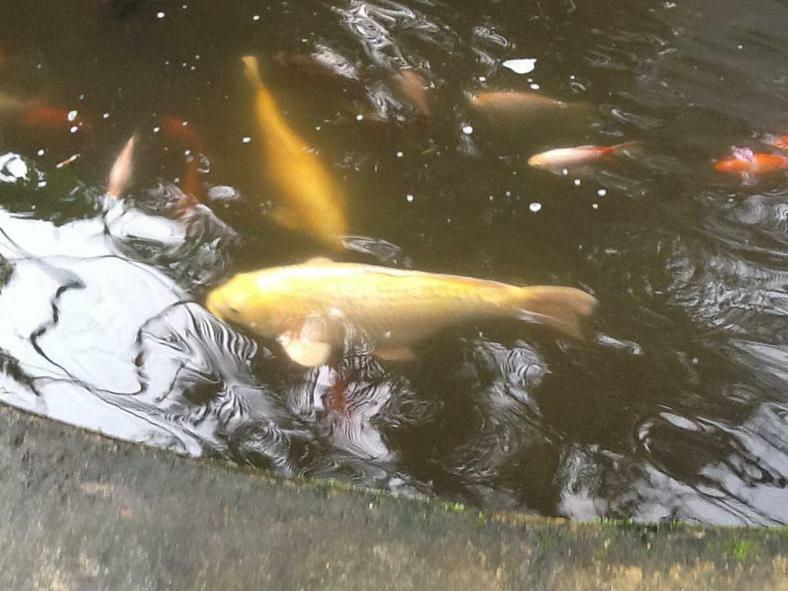 By the second week of October all our Autumn starters will be in and hopefully settled. 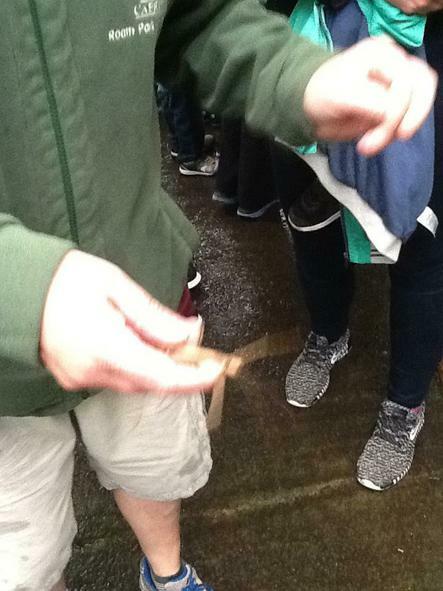 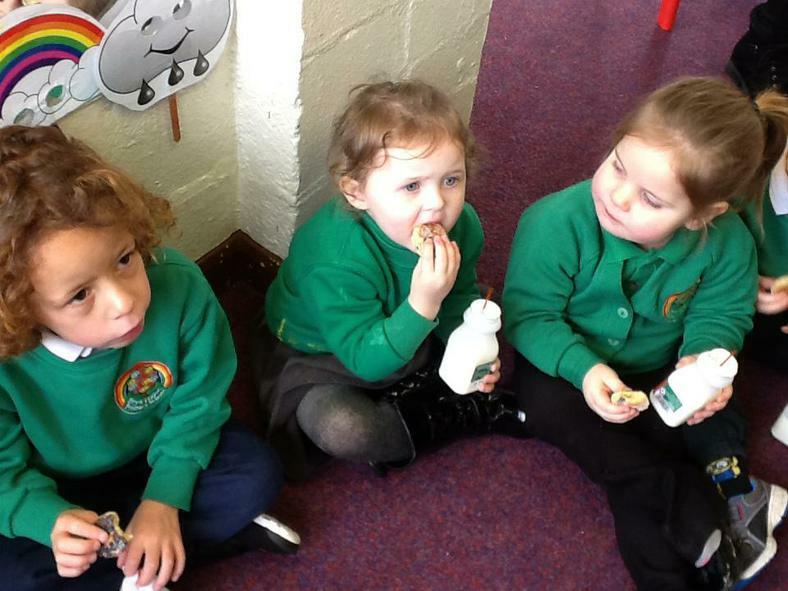 We expect a few tears and these I assure you don't last long! 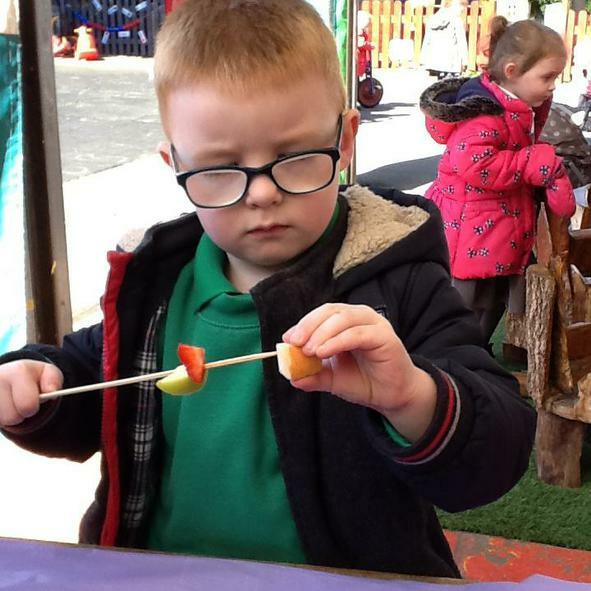 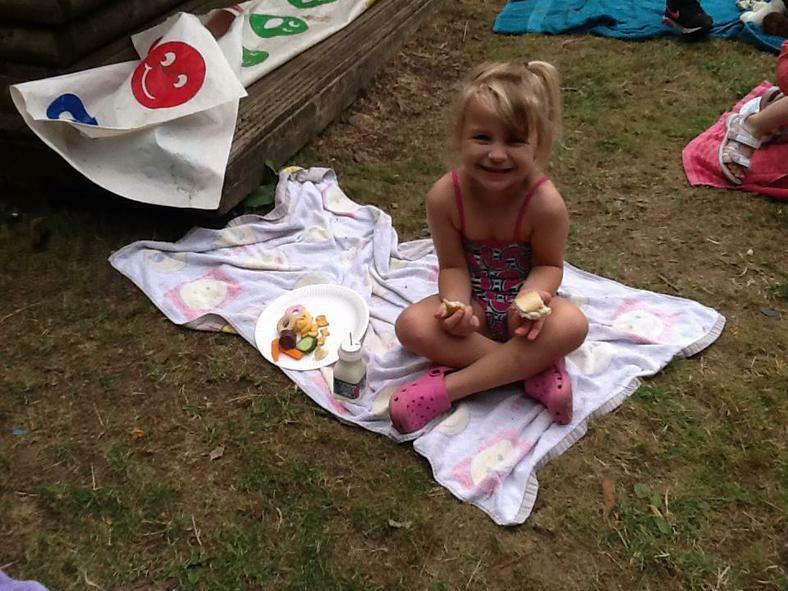 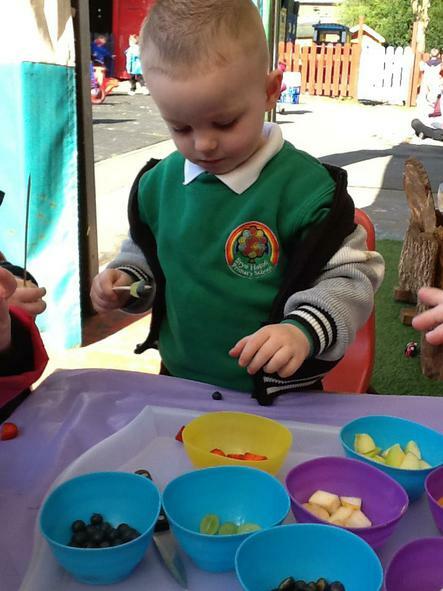 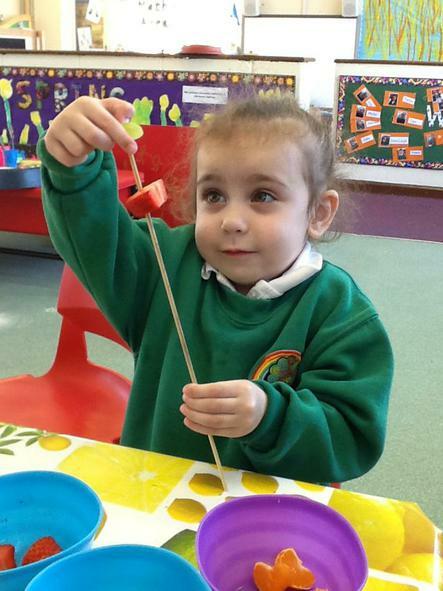 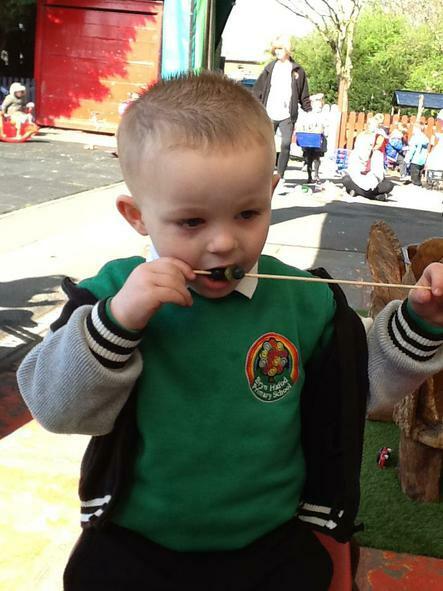 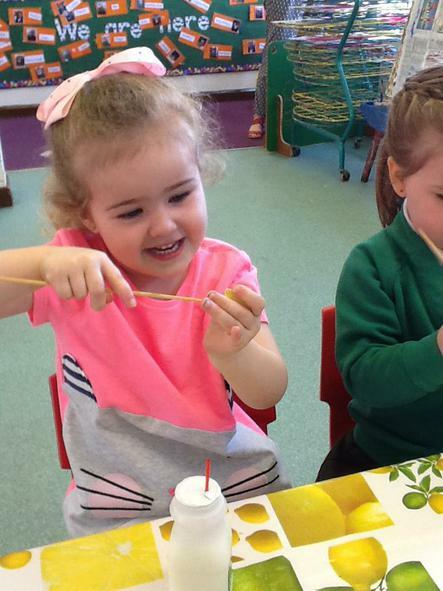 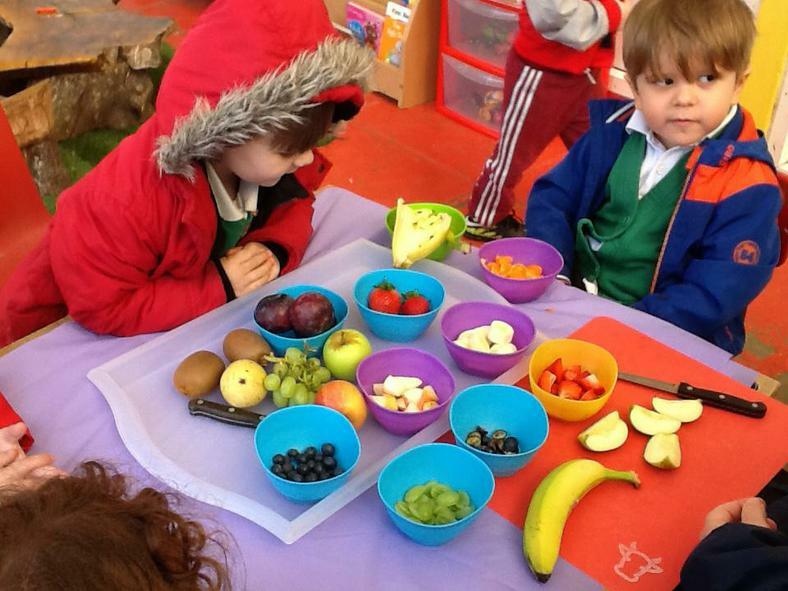 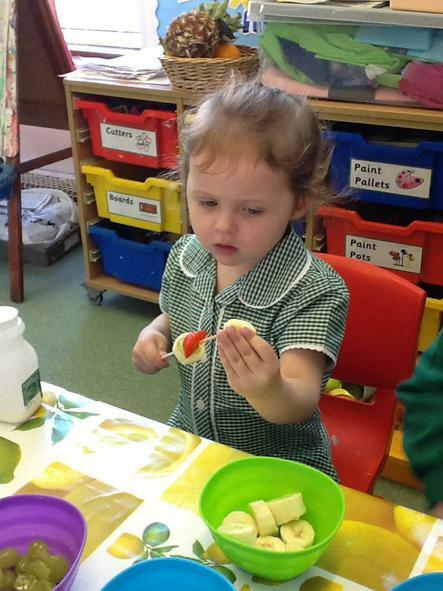 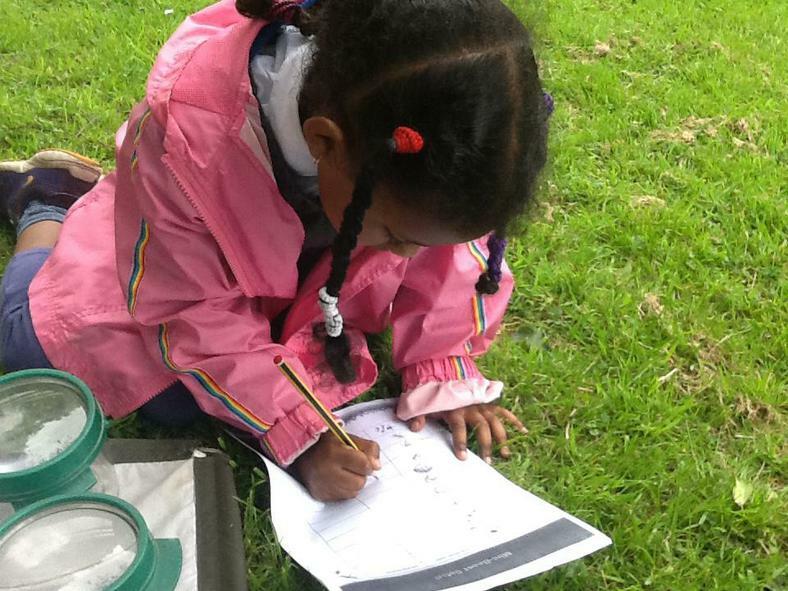 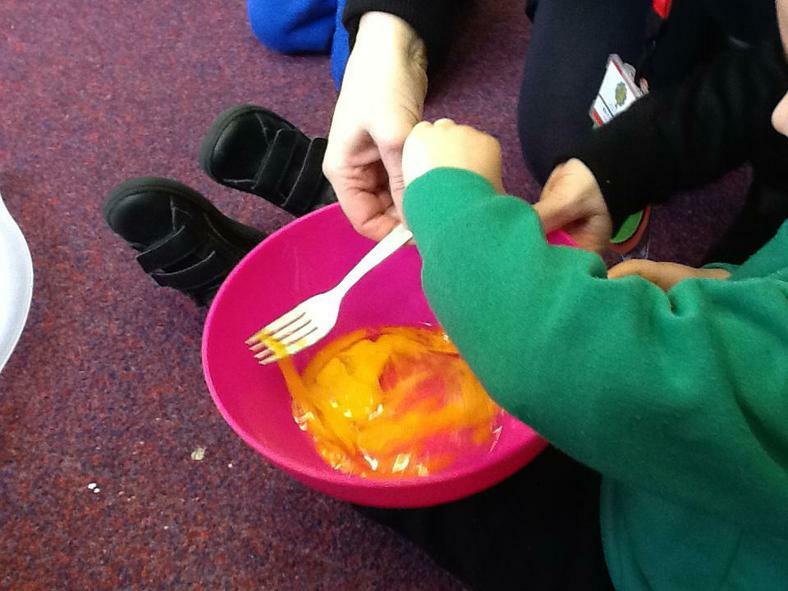 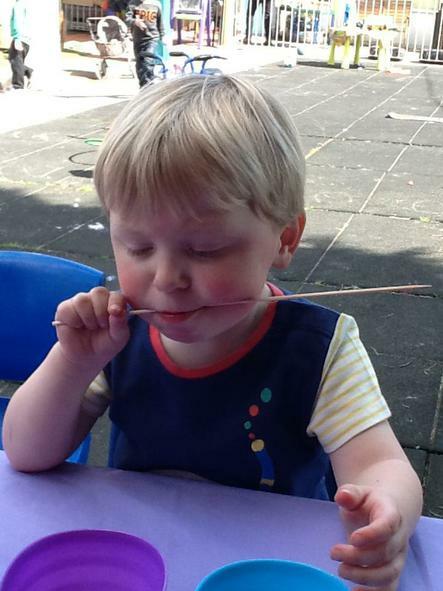 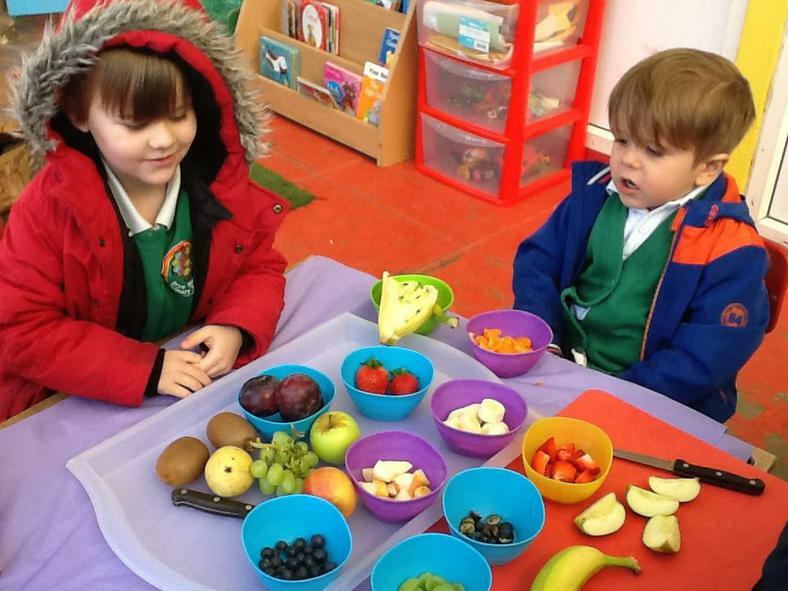 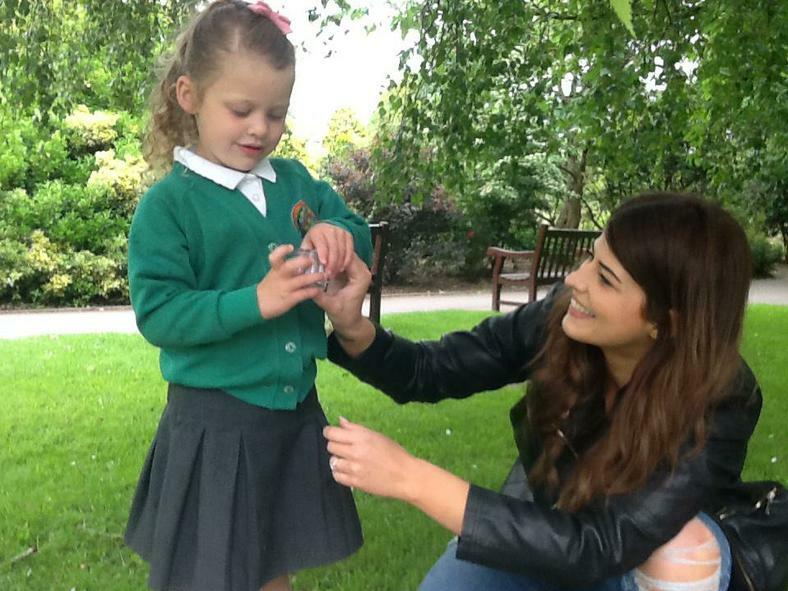 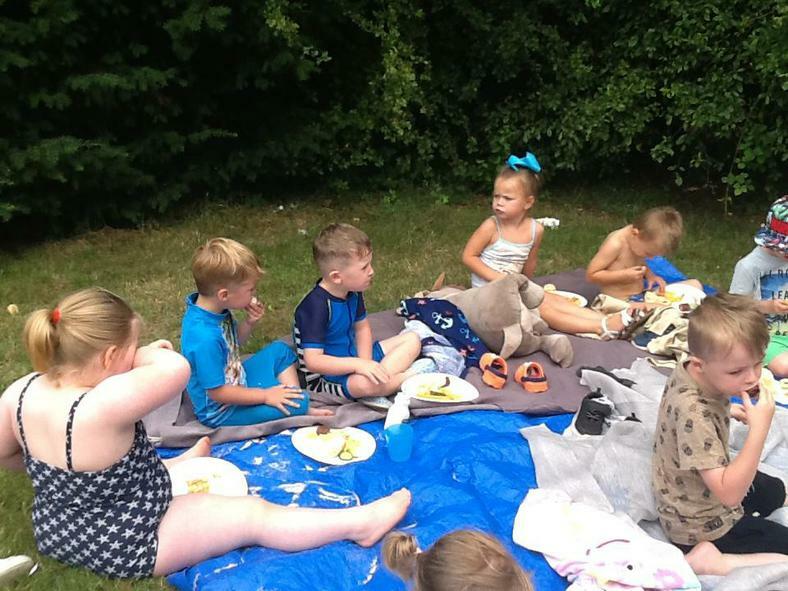 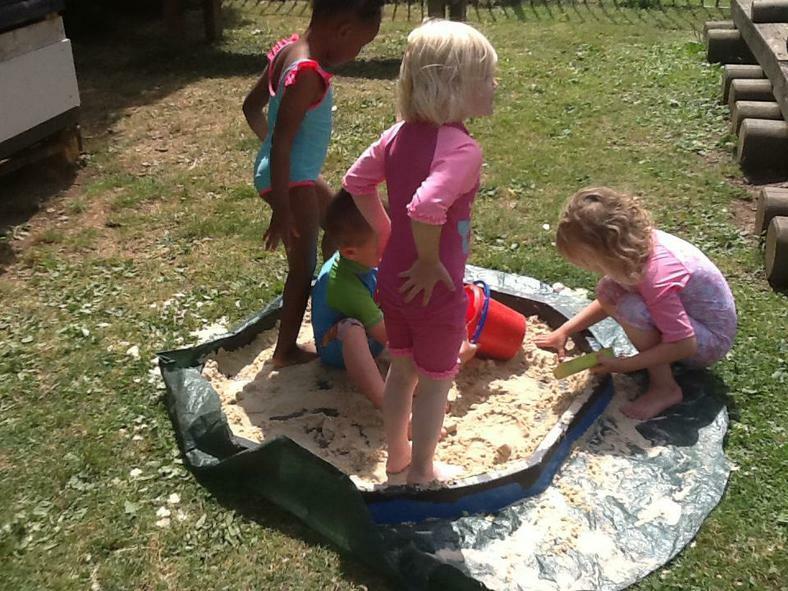 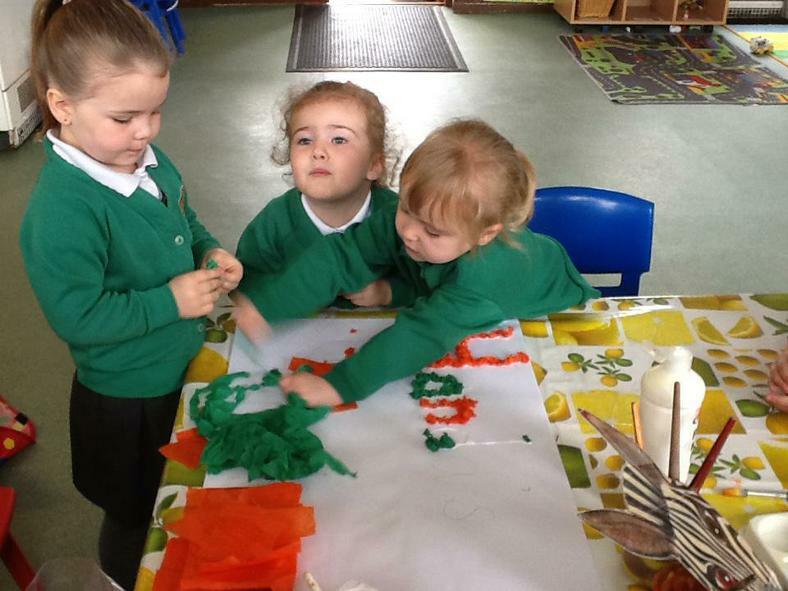 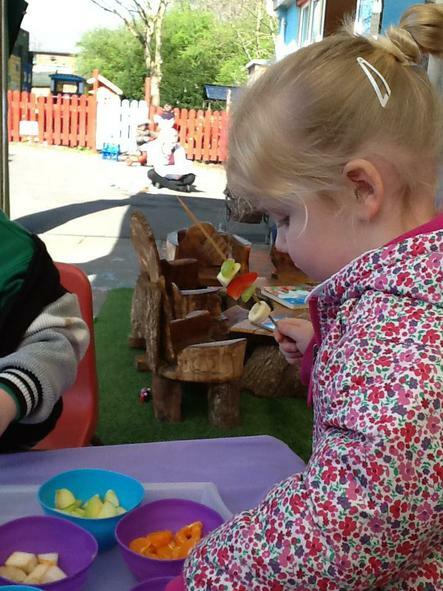 During the first few weeks of your child starting we informally assess where they are with their development, this is nothing to worry about and it is done through fun activities, such as for maths, naming and matching colours and shapes. 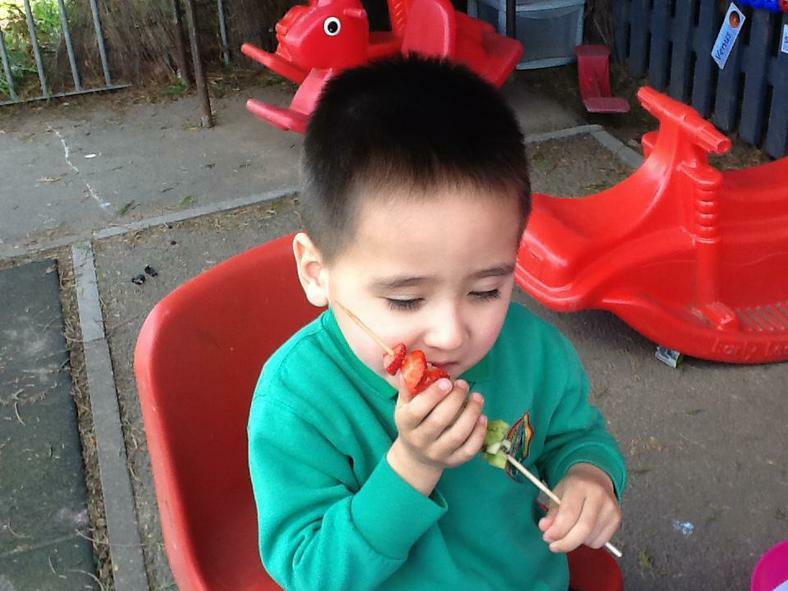 We also do a language assessment, checking their understanding and how well they can communicate, again if we have any concerns we will speak to you. 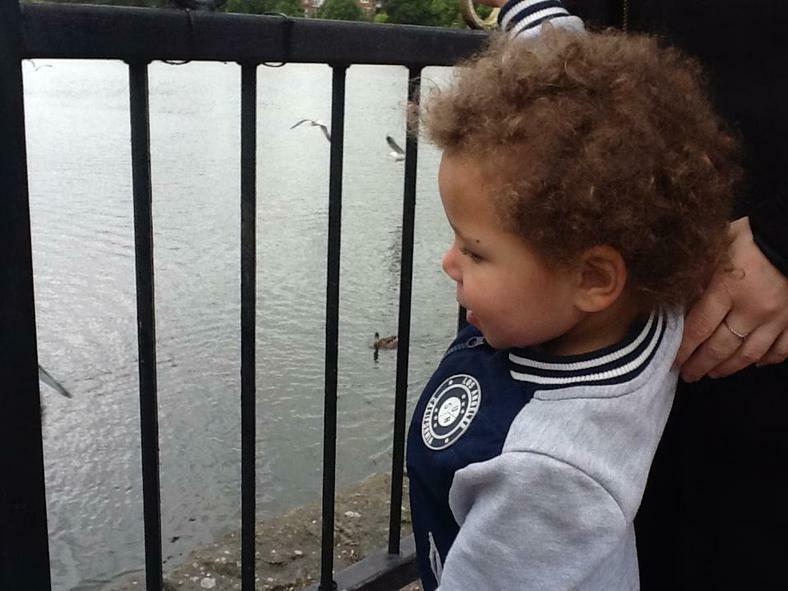 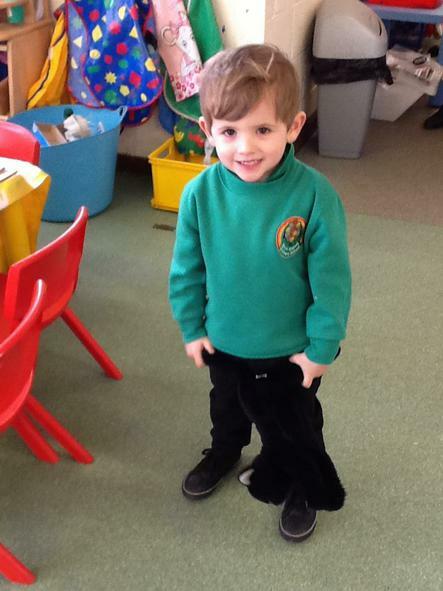 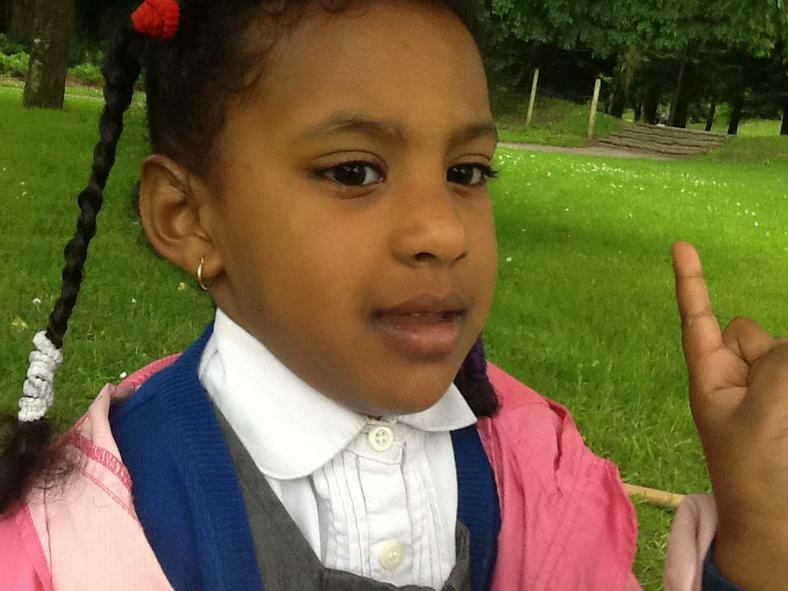 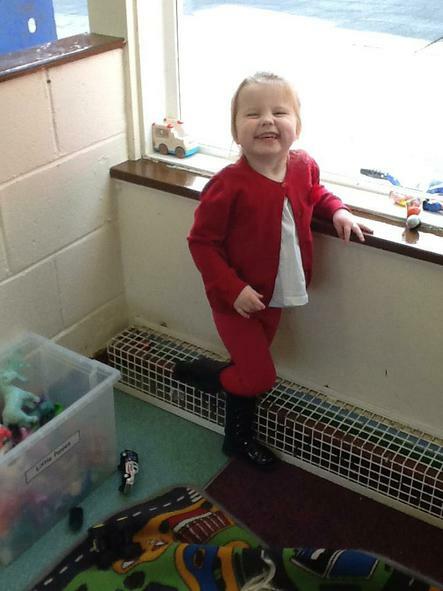 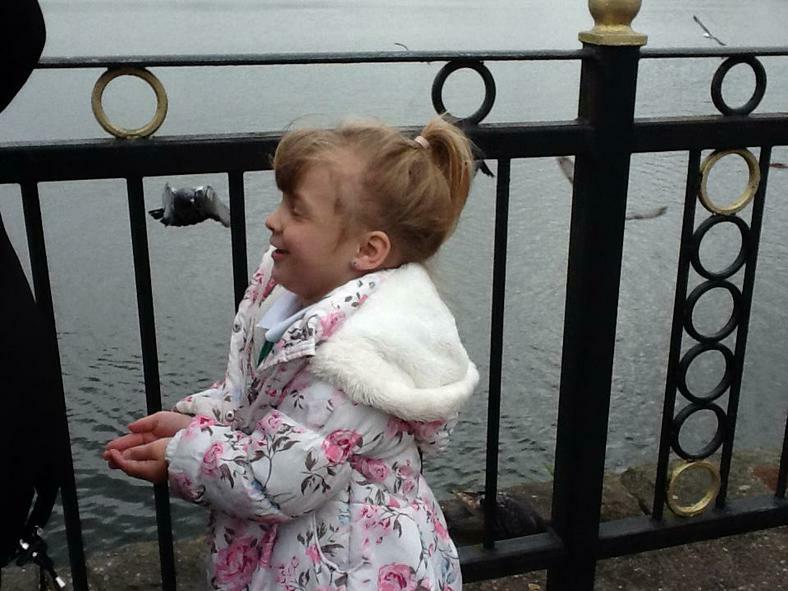 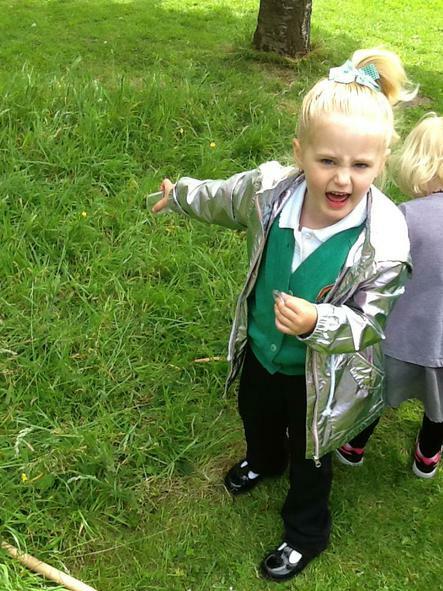 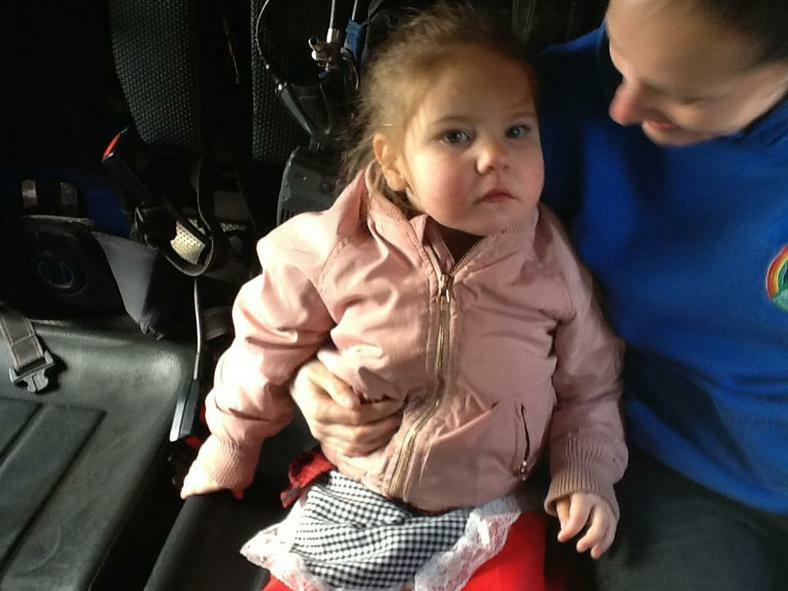 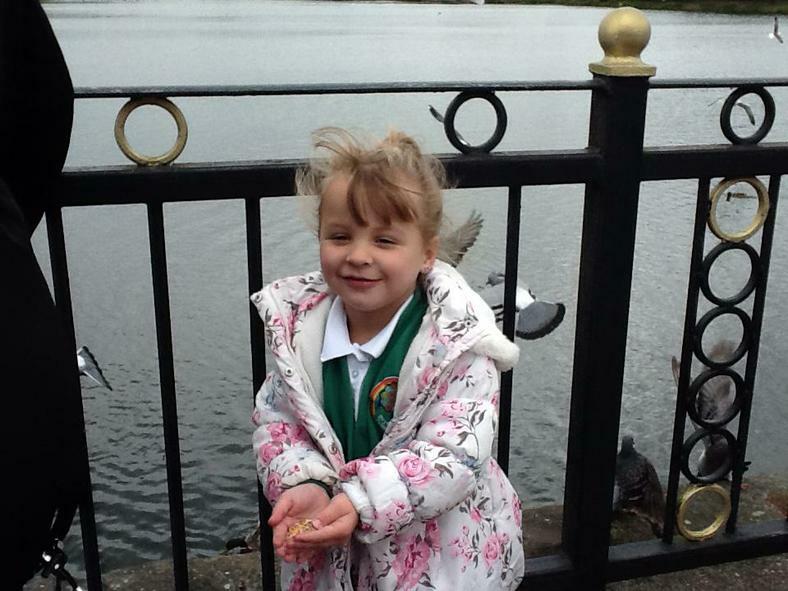 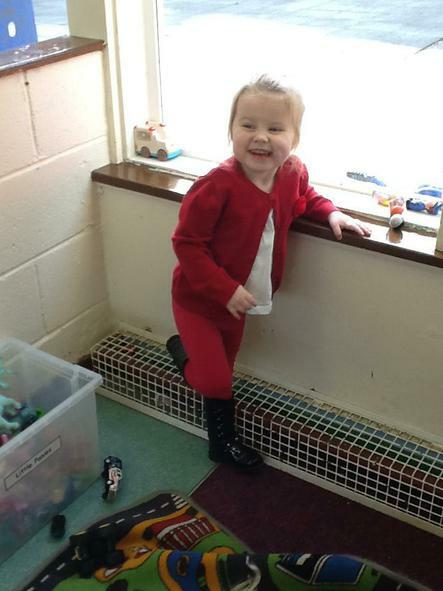 We also look at their Personal and Social Development, such as putting their coats on and using the toilet independently. 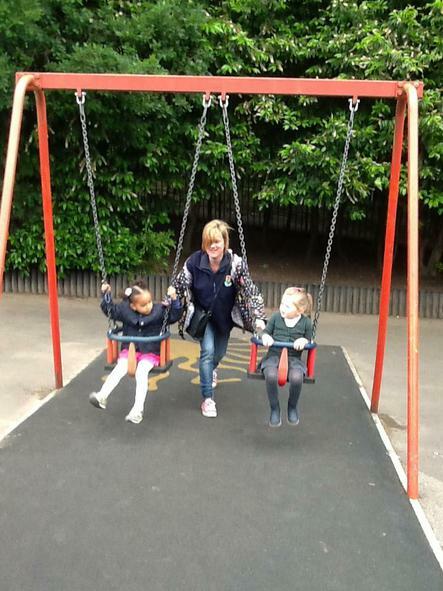 This week we are focussing on Families. 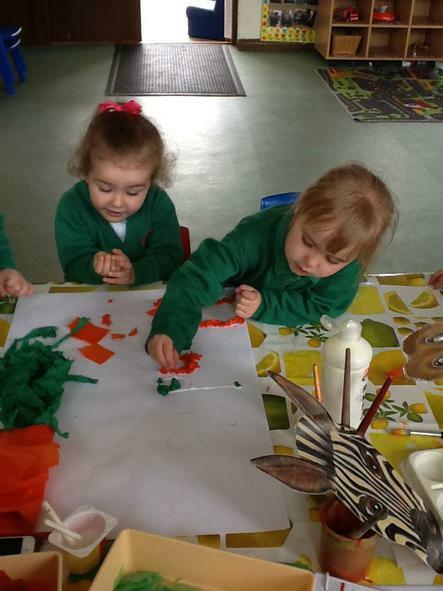 We will be learning the story of 'The Three Little Pigs' and singing our rhyme 'This Little Piggy went to Market'. 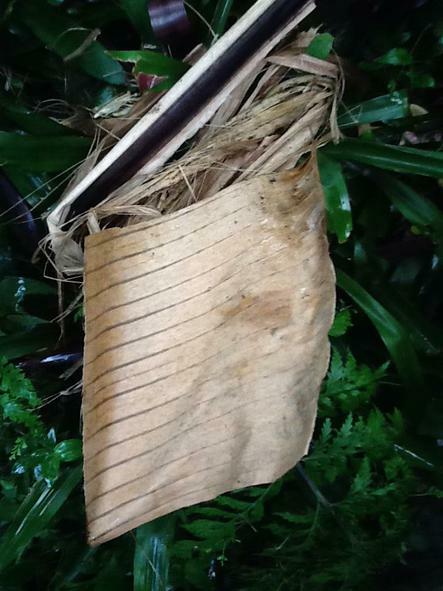 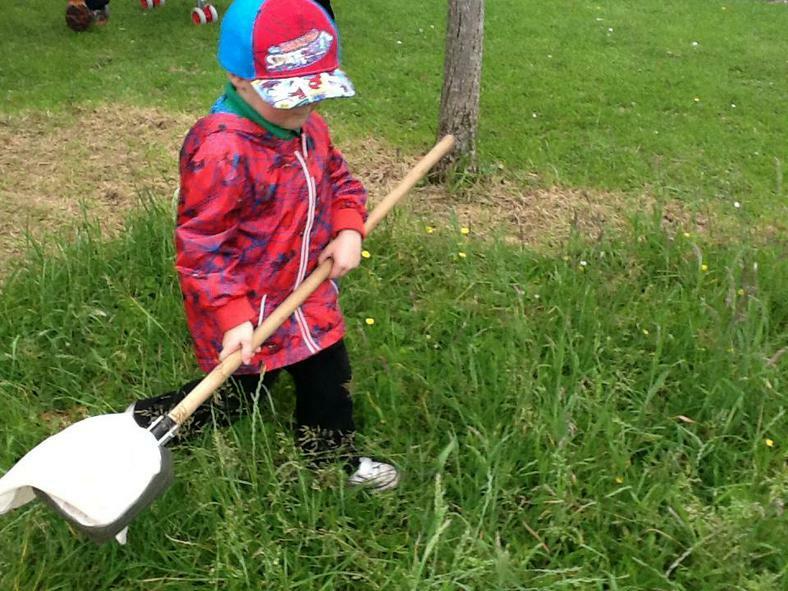 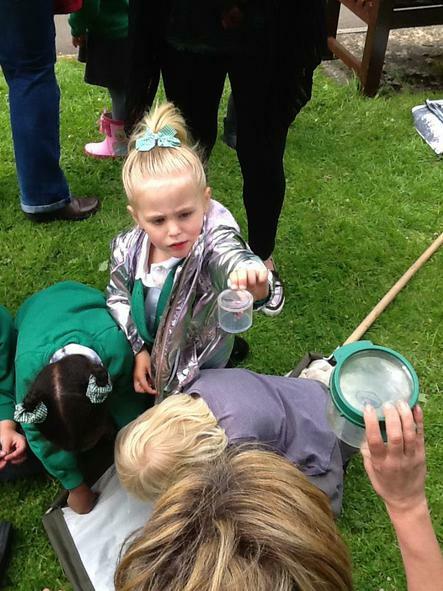 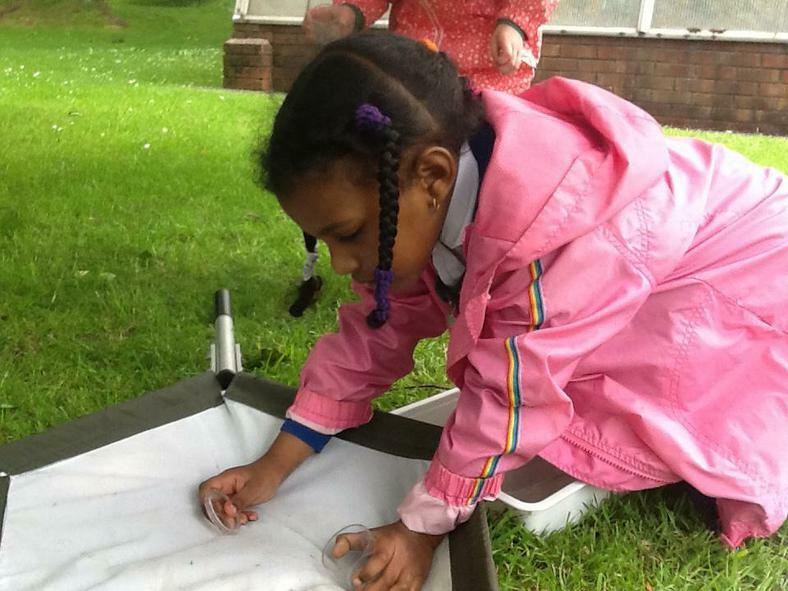 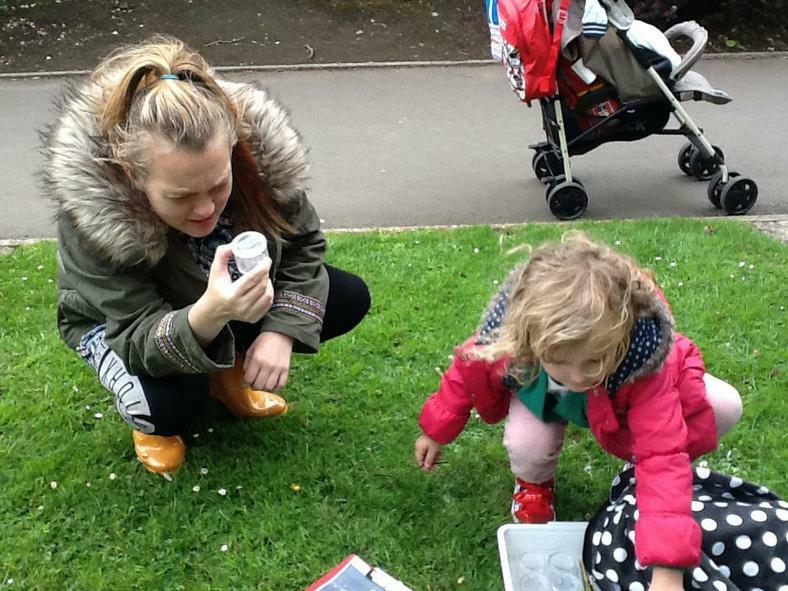 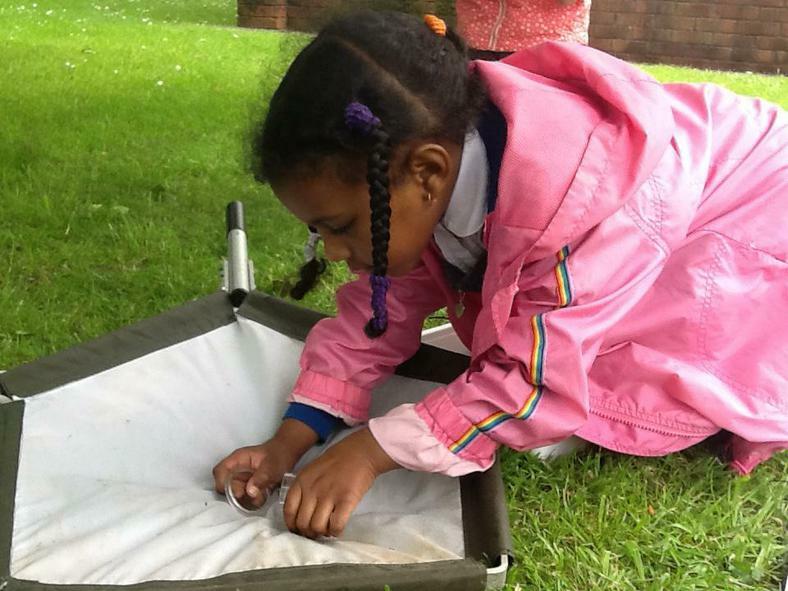 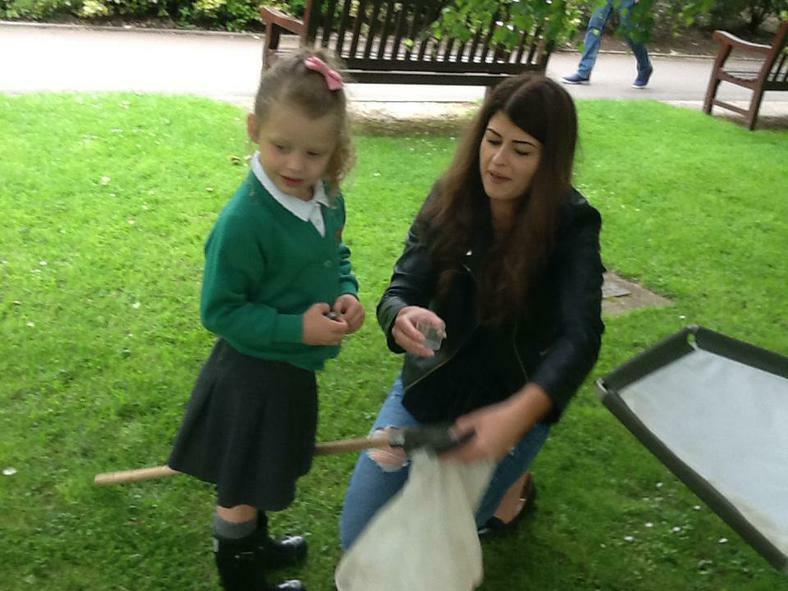 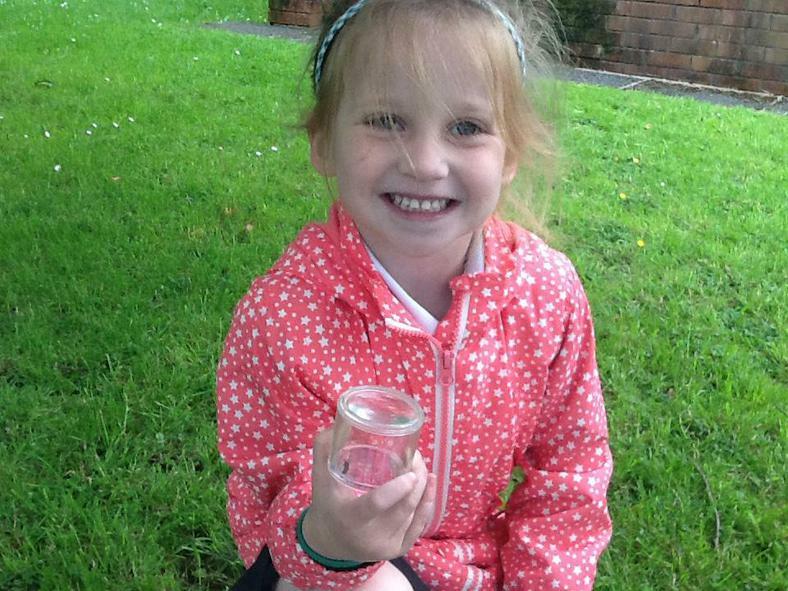 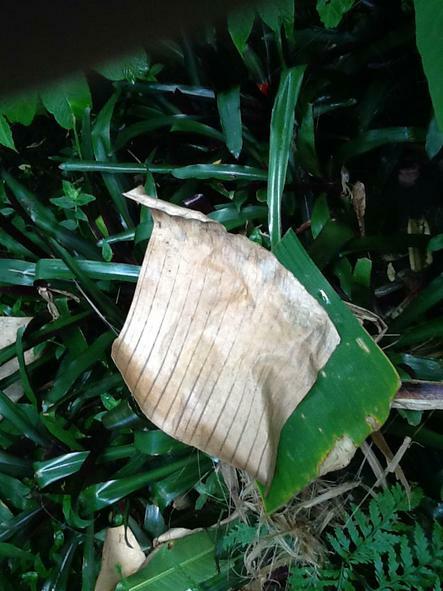 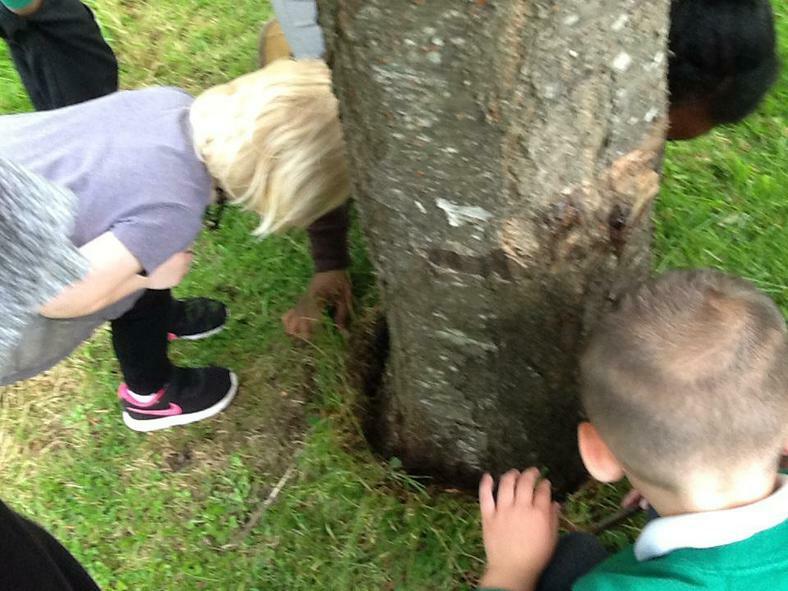 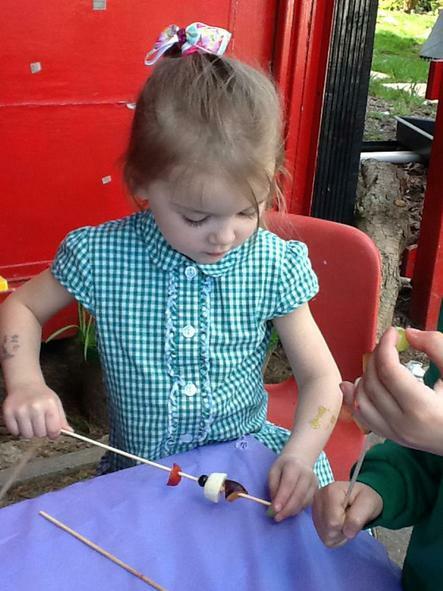 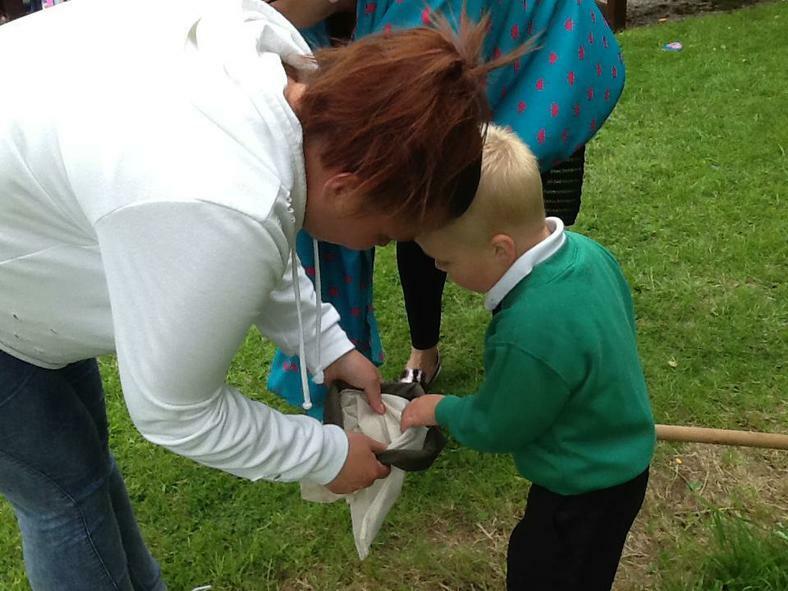 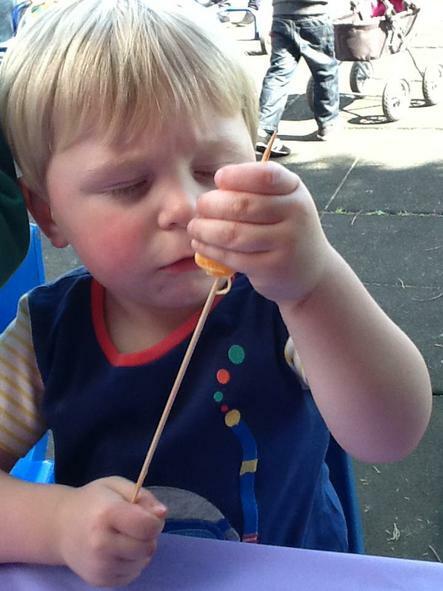 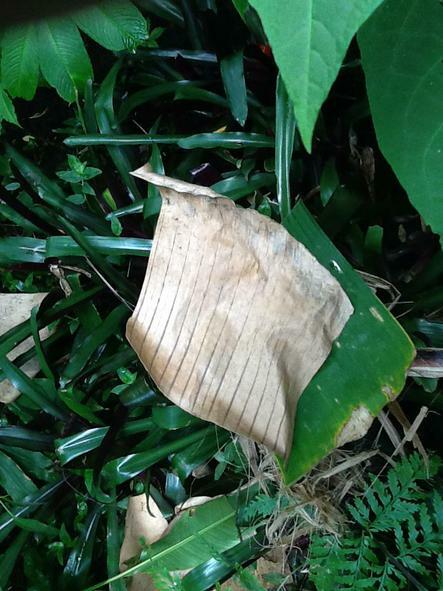 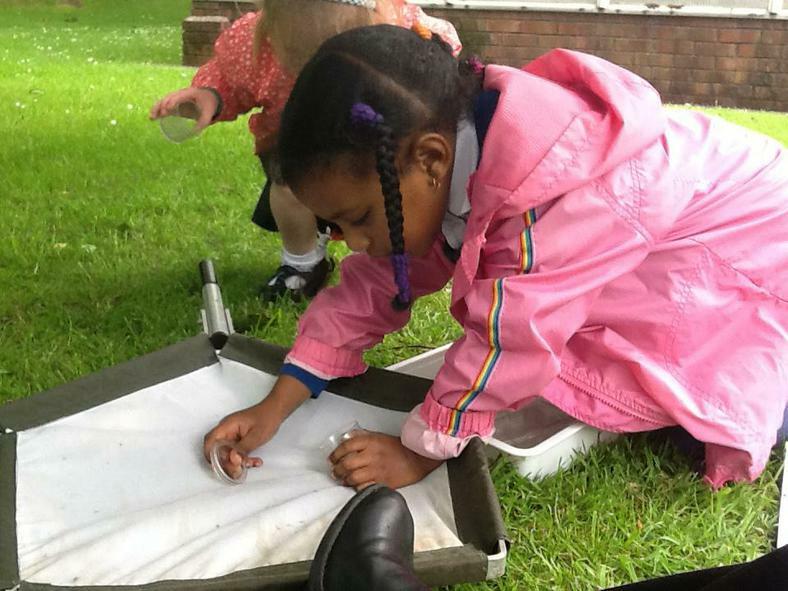 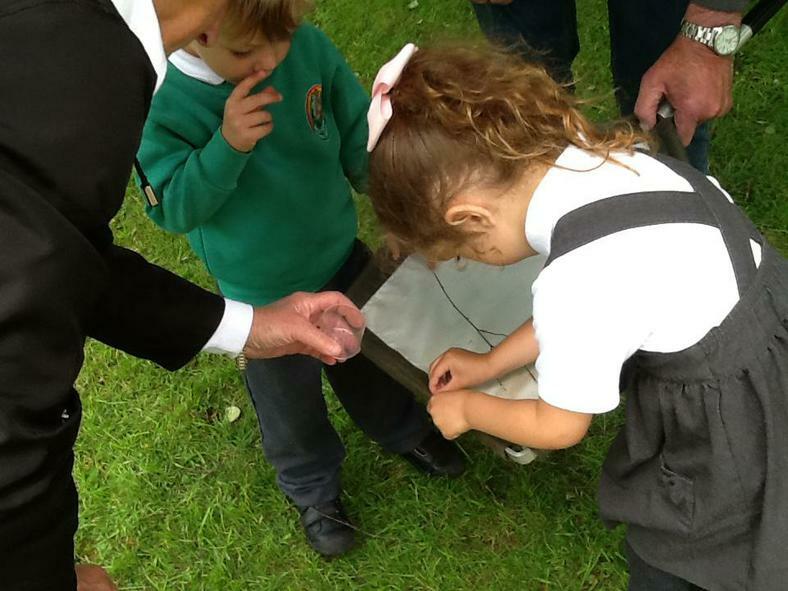 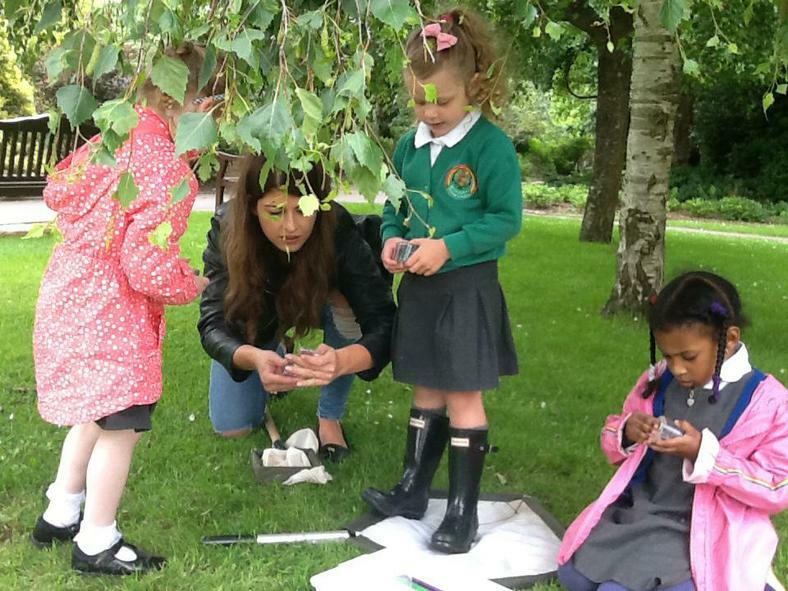 Our activities will be focussed on making houses outside using various natural and man made materials. 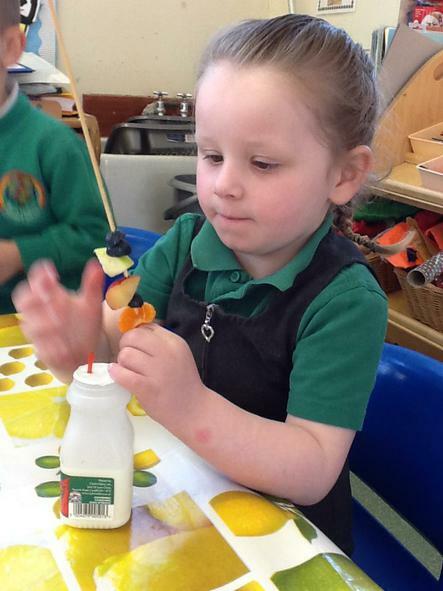 We will be assessing shape and colour knowledge by making shape houses. 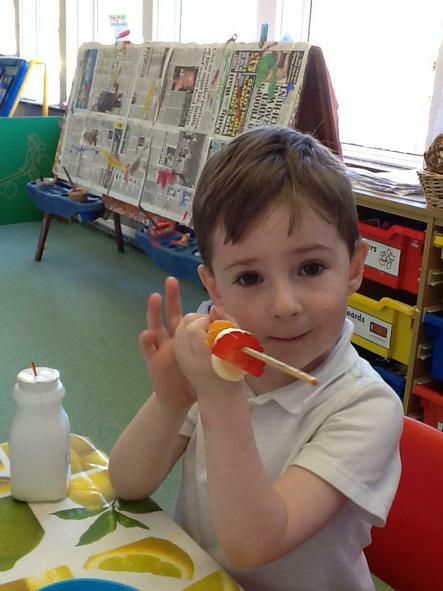 We will also be making our houses using collage materials/lolly sticks and representing the people who live in our house using our fingerprints. 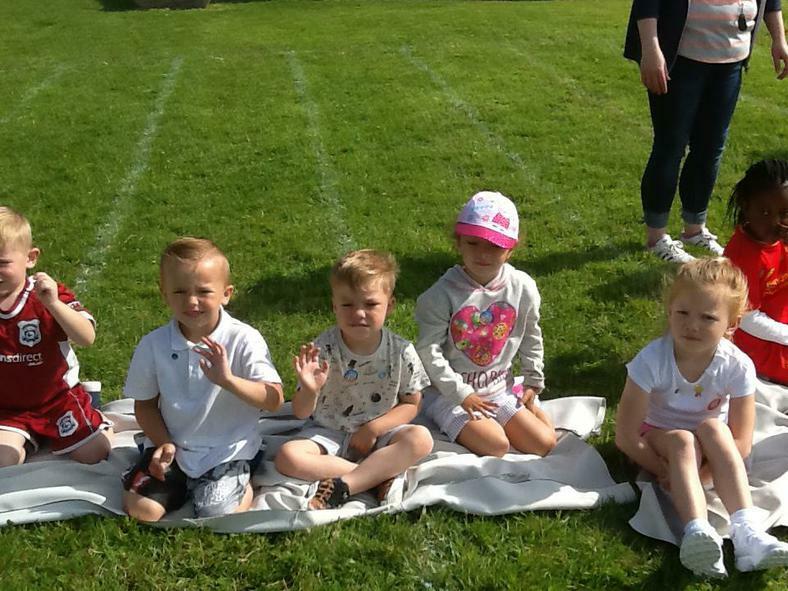 Every week we will be doing 'Mini me yoga' on a Tuesday in the class and our PE sessions will take place on a Thursday usually in the hall. 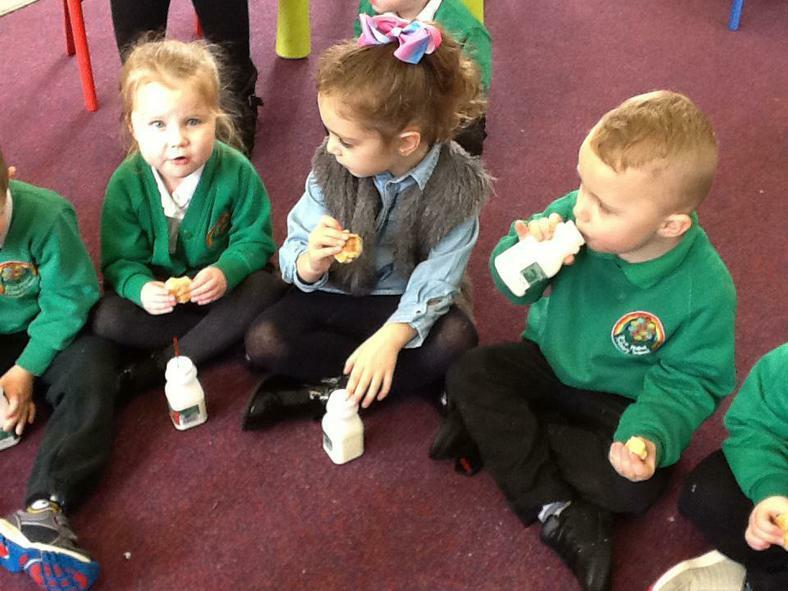 Please remember £1 a week snack money. 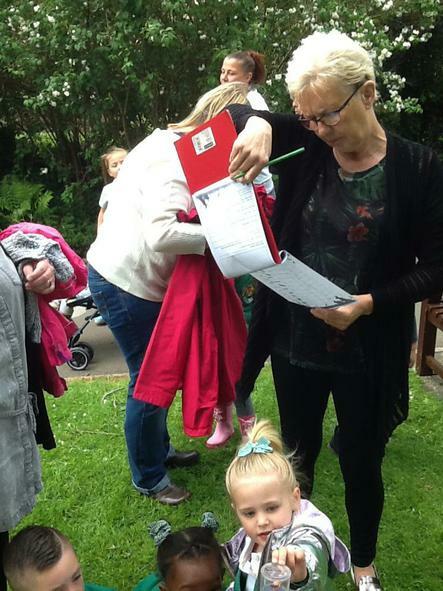 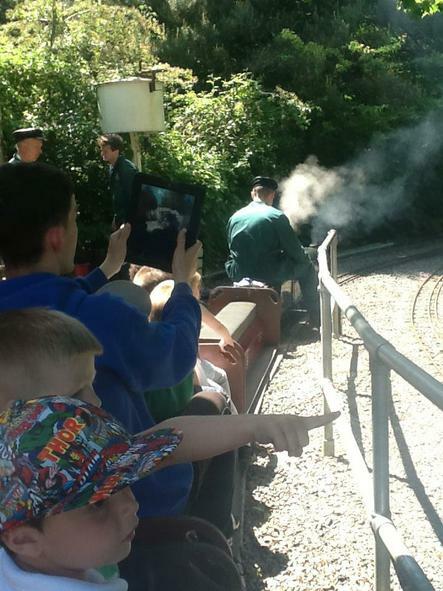 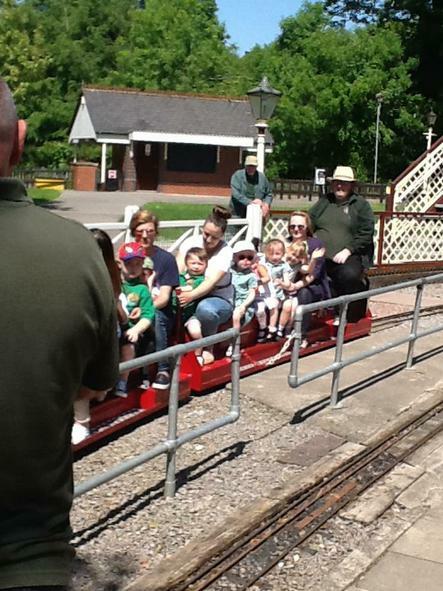 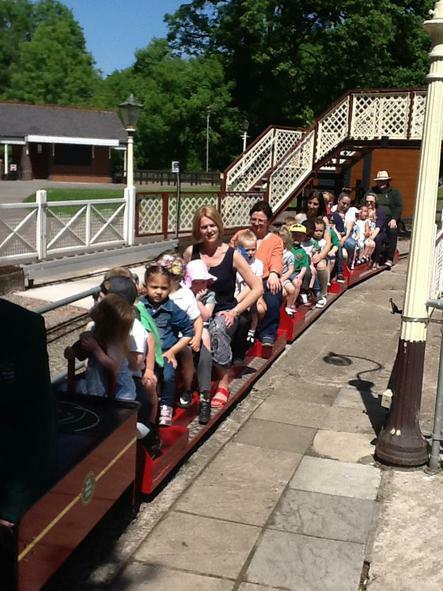 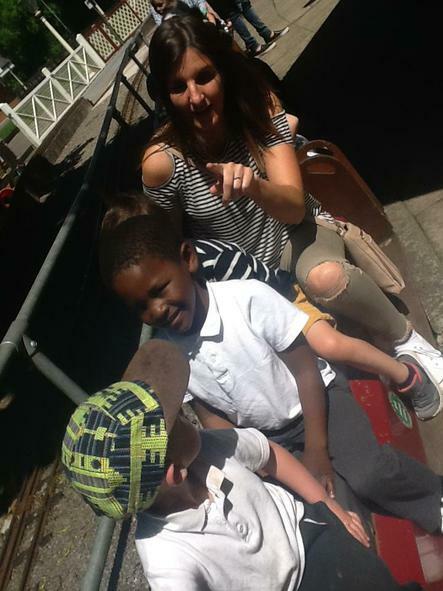 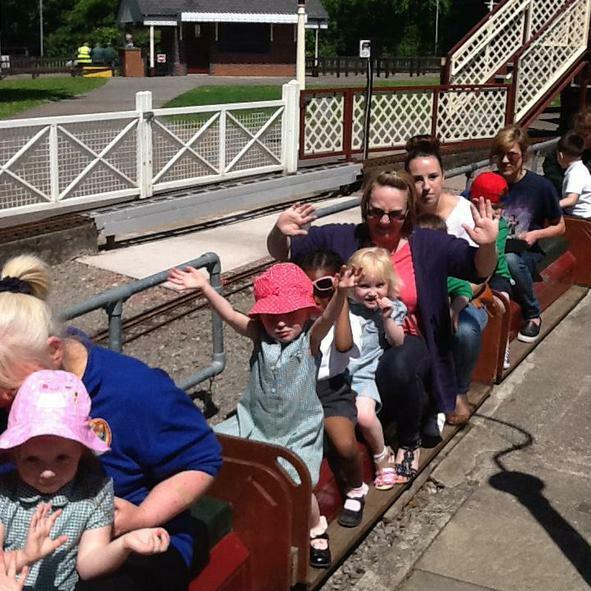 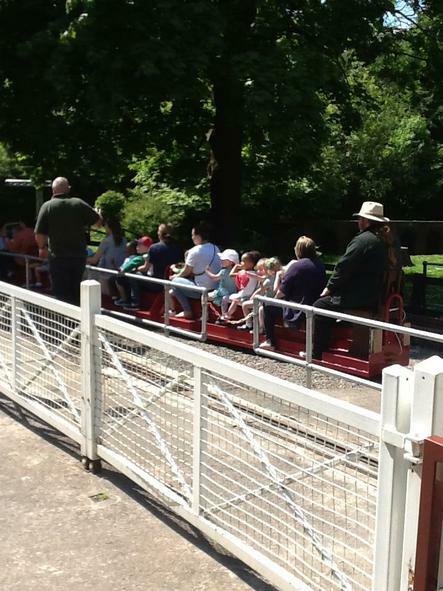 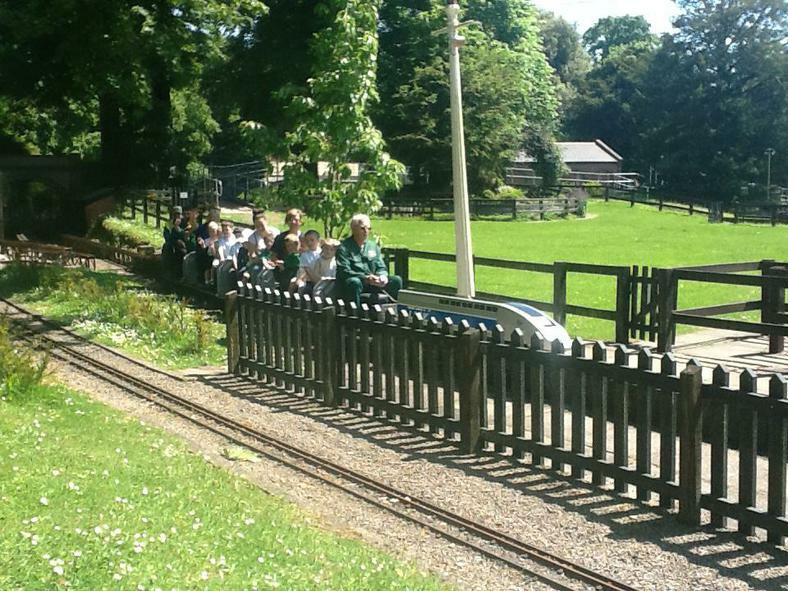 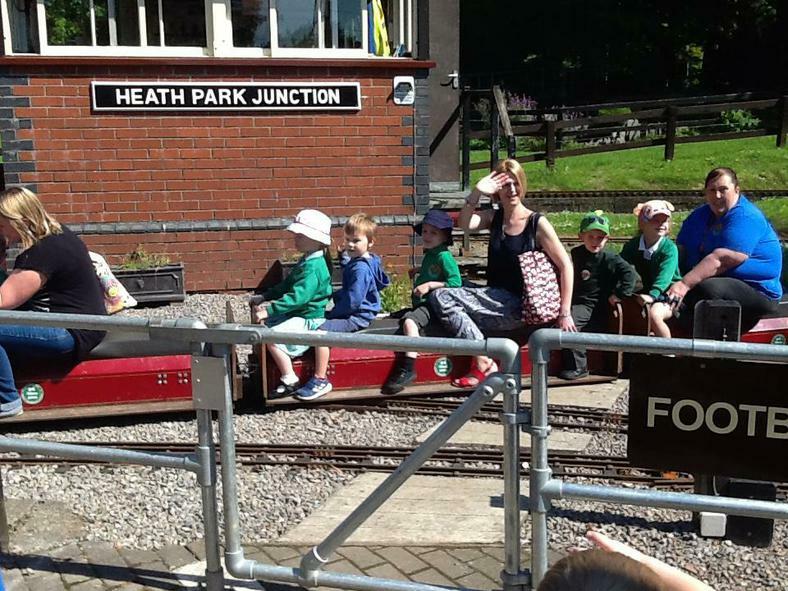 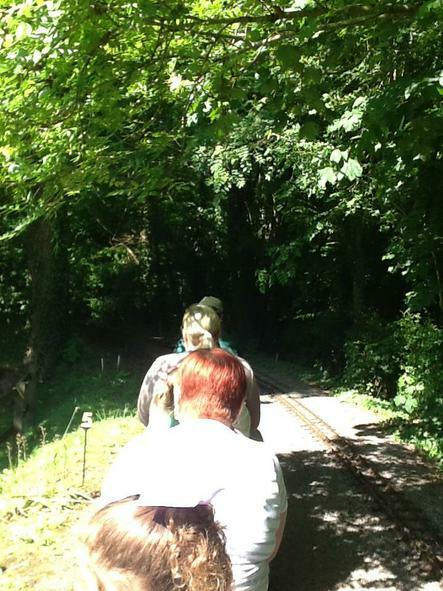 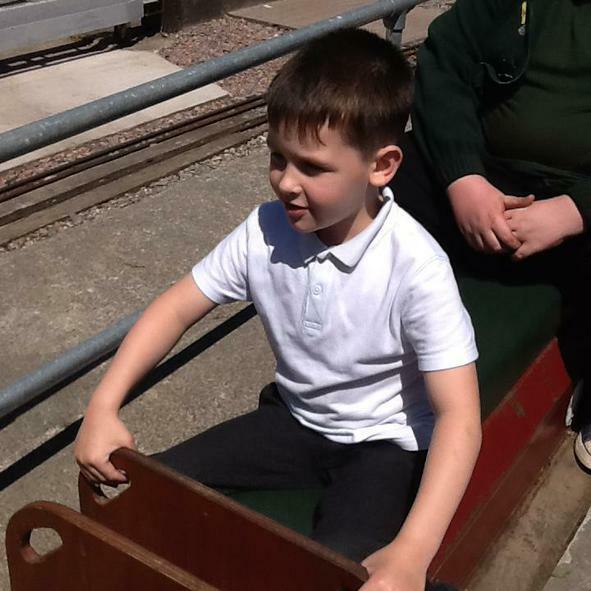 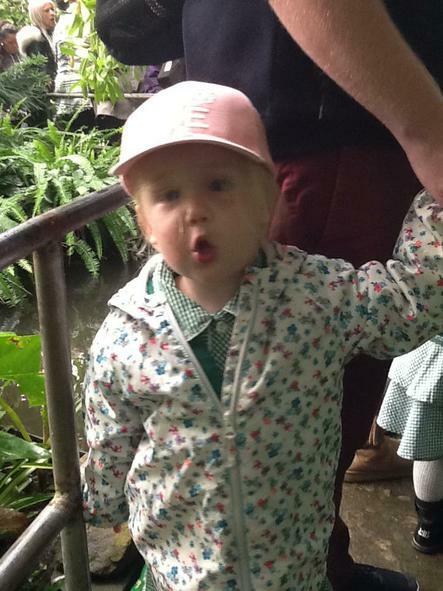 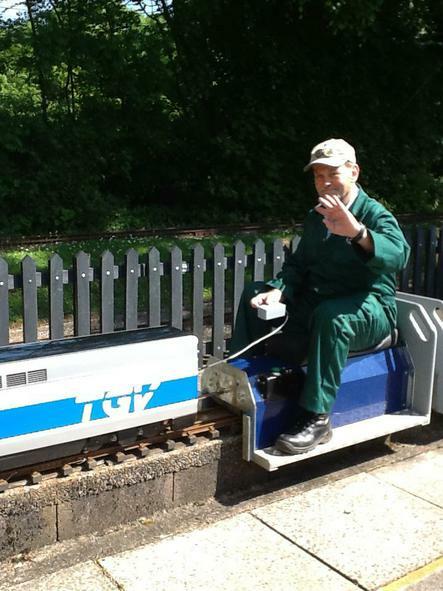 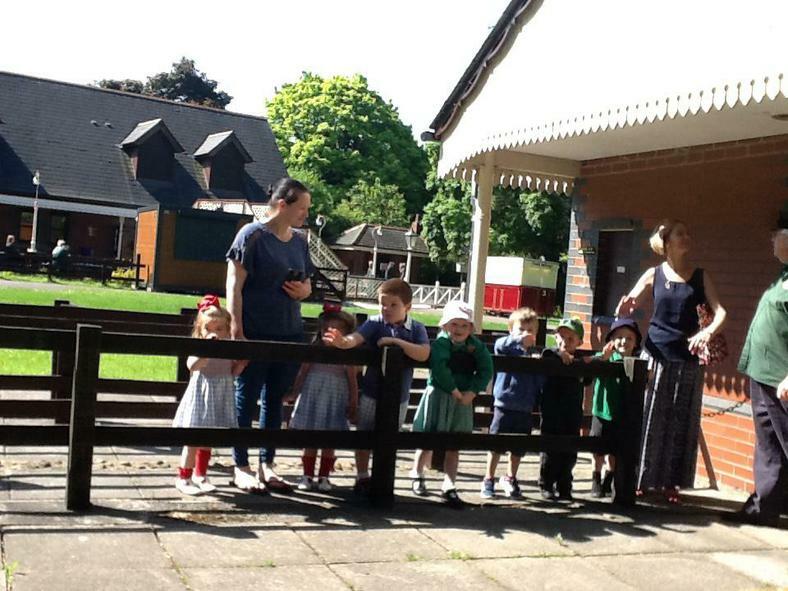 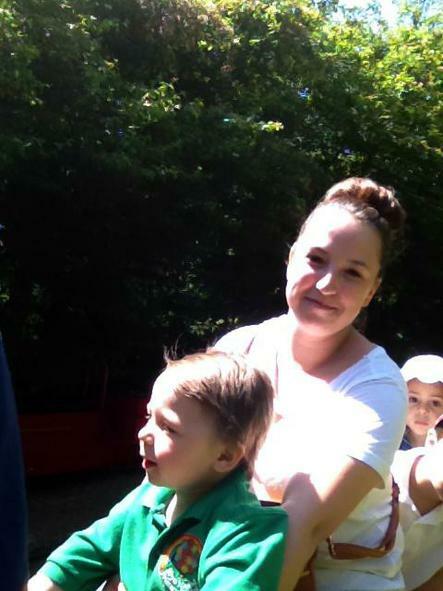 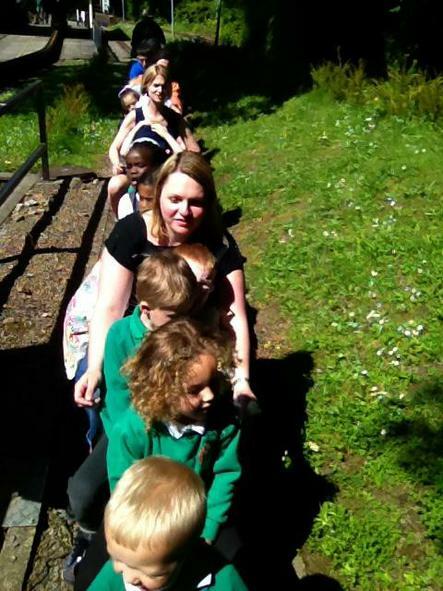 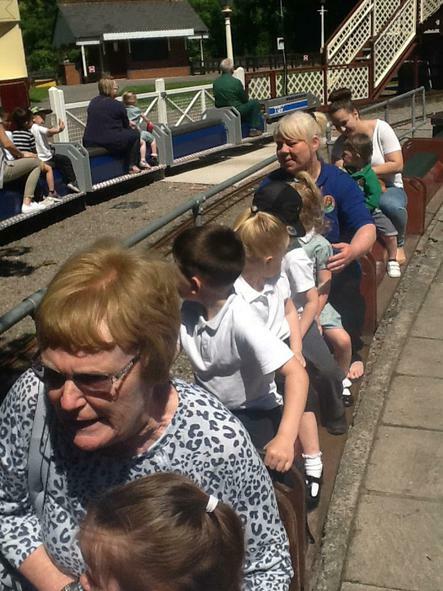 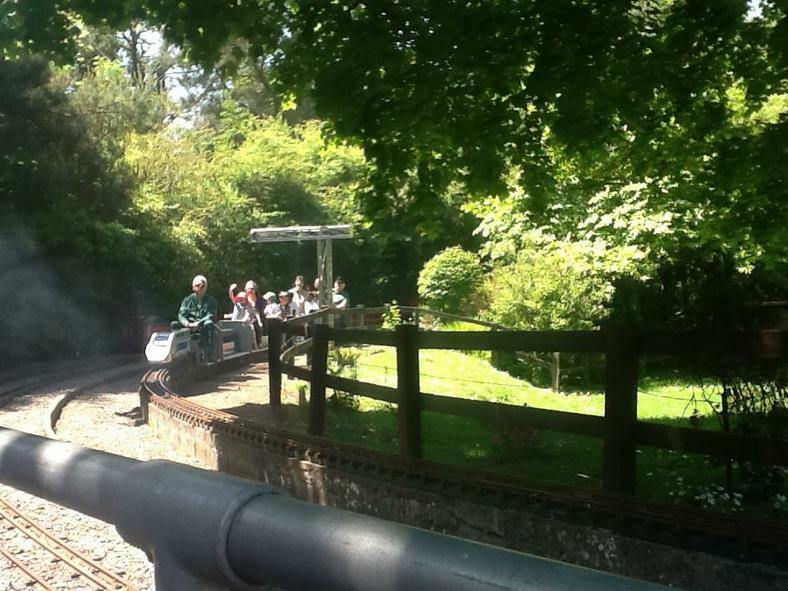 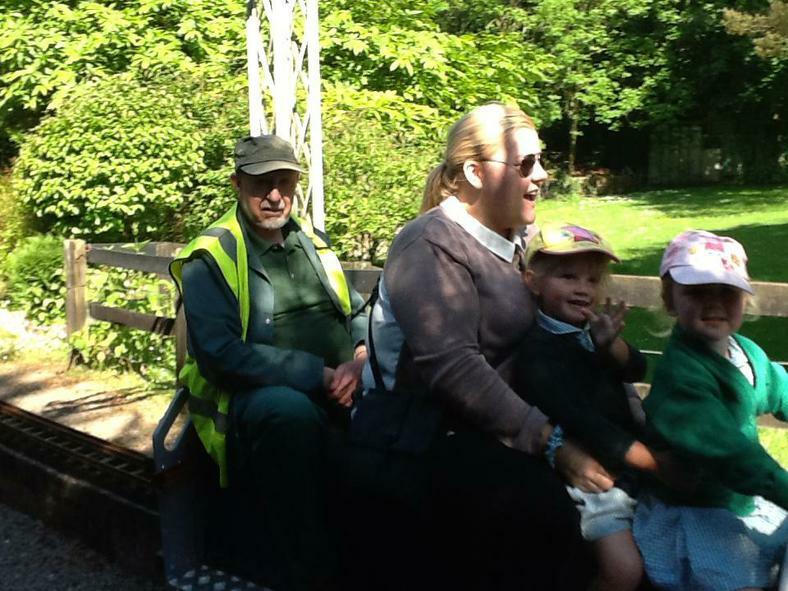 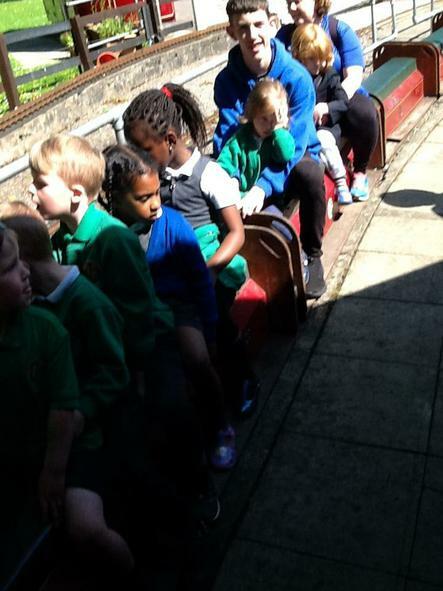 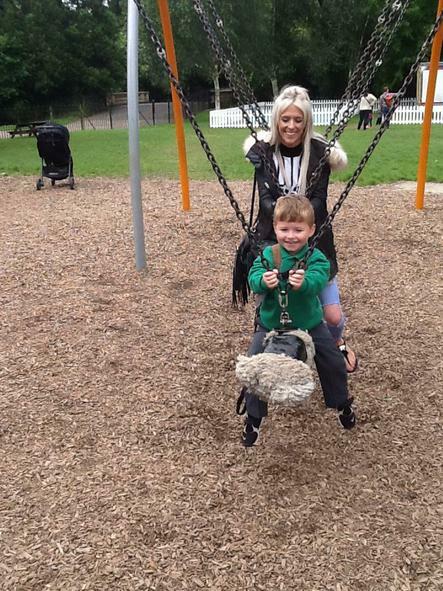 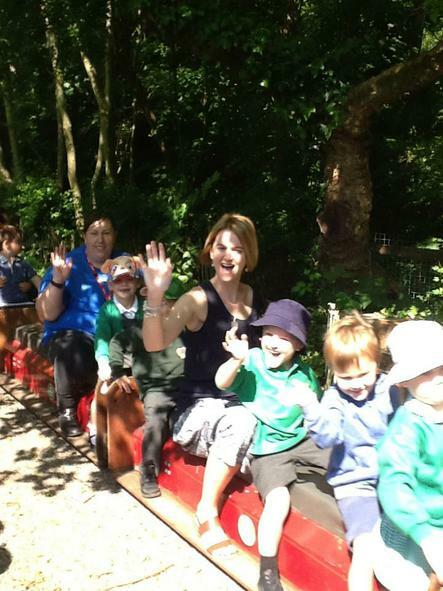 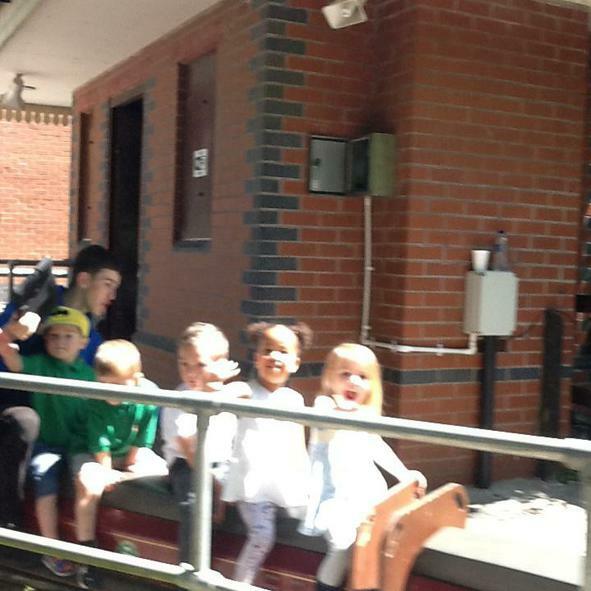 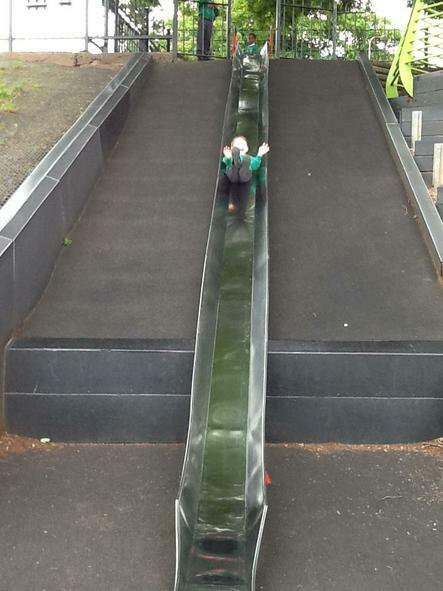 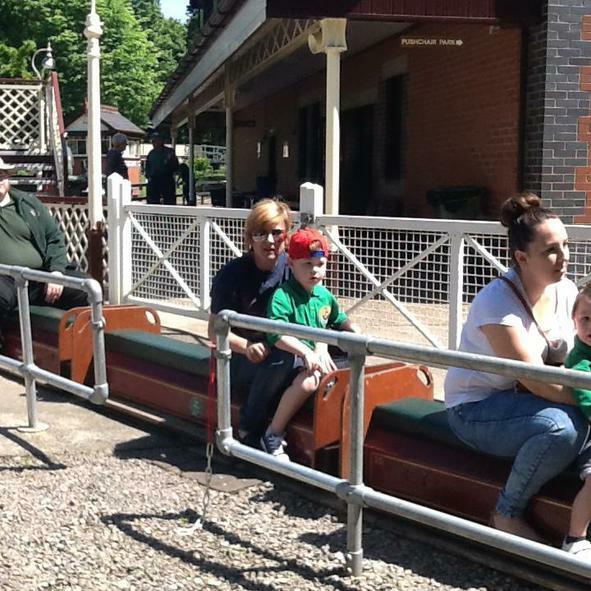 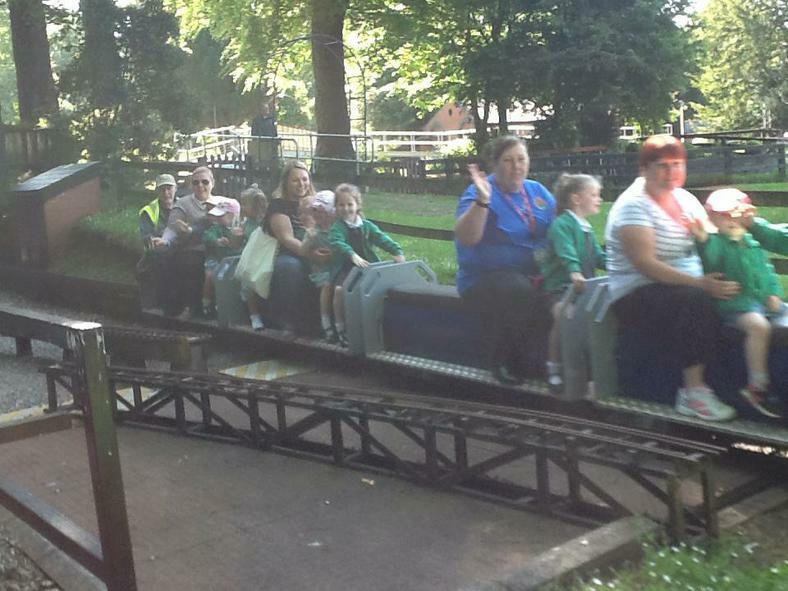 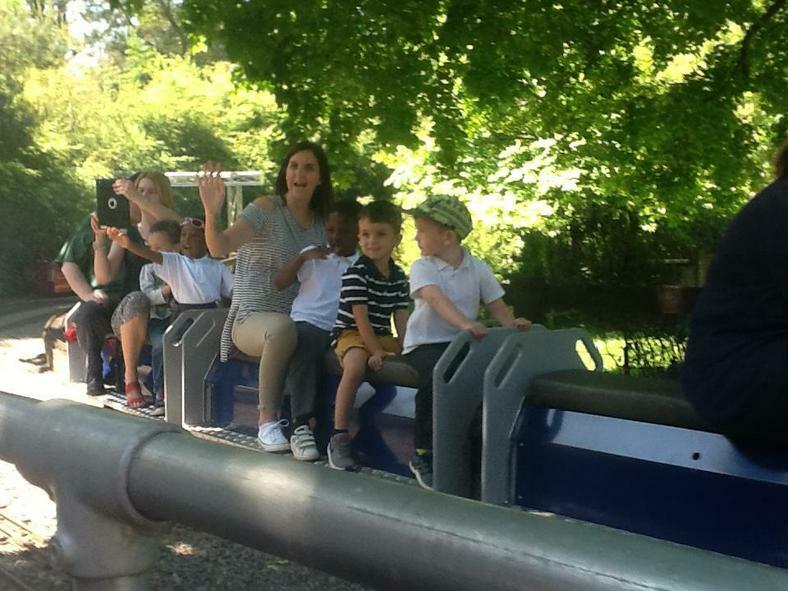 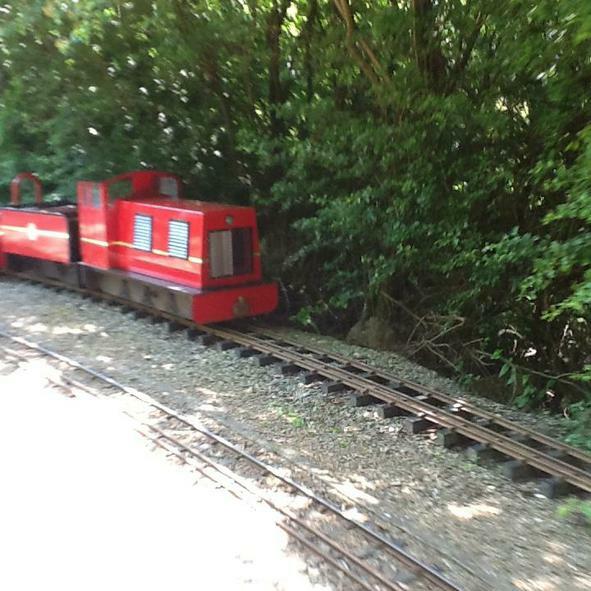 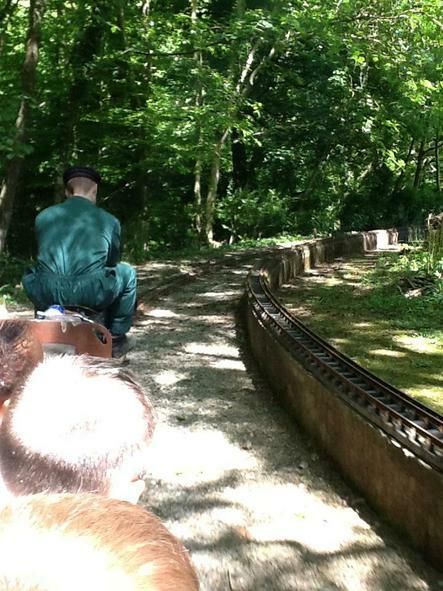 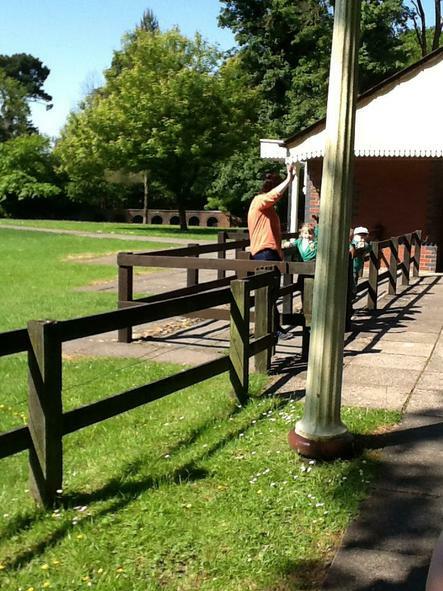 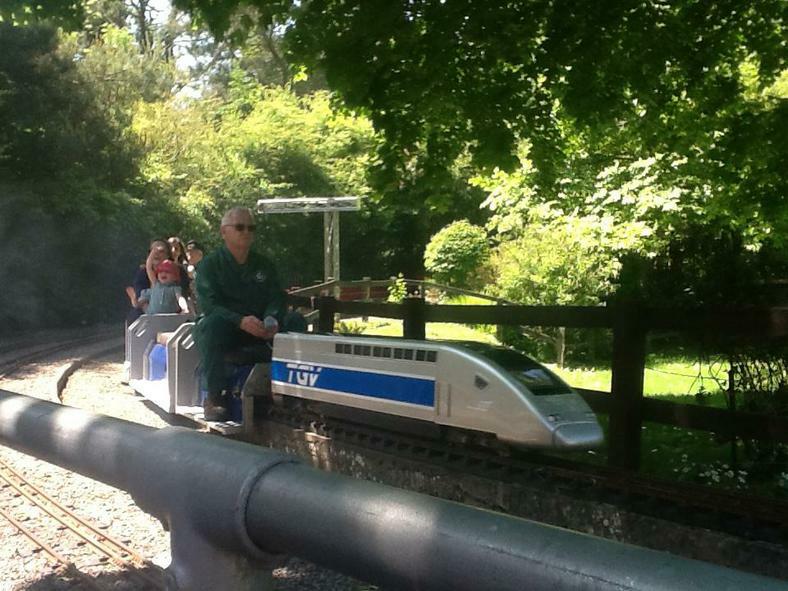 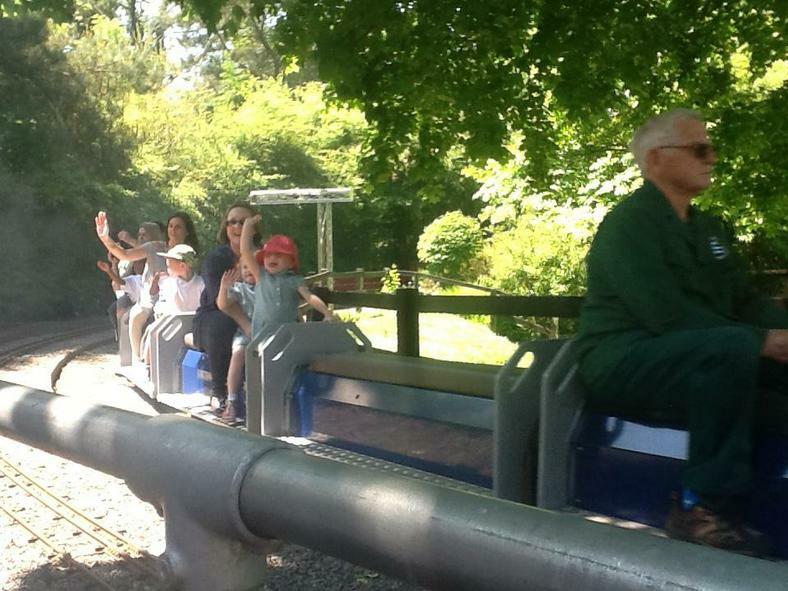 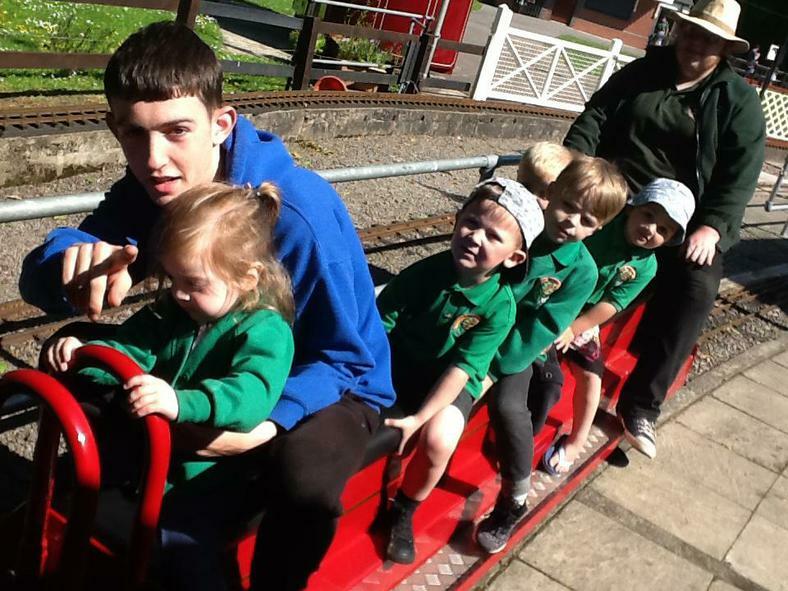 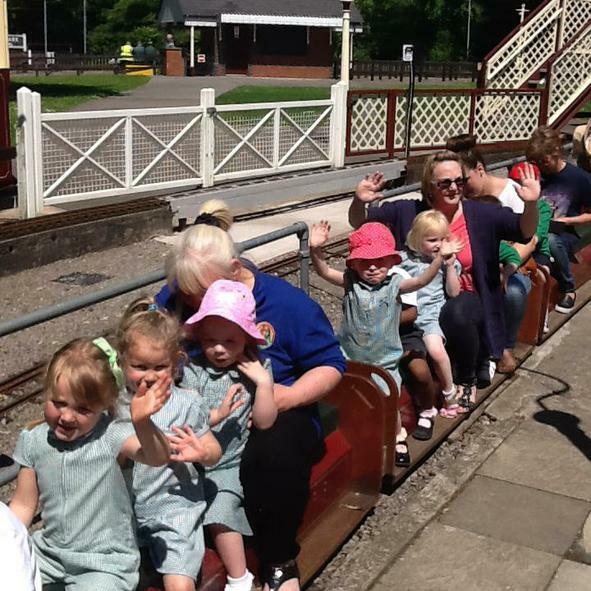 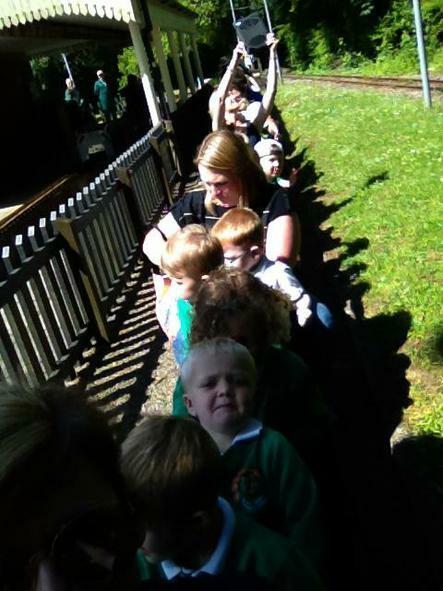 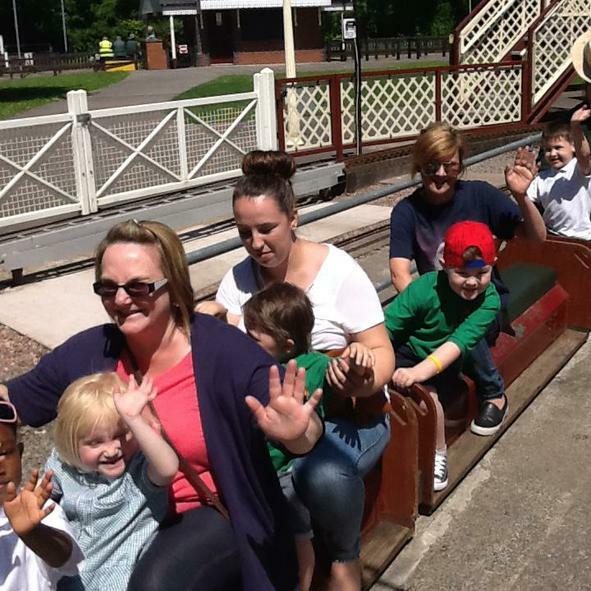 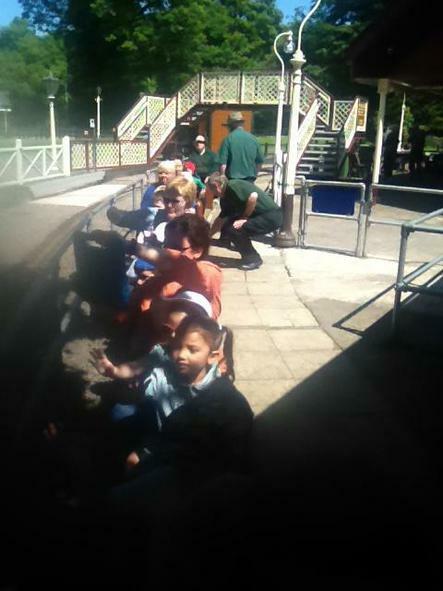 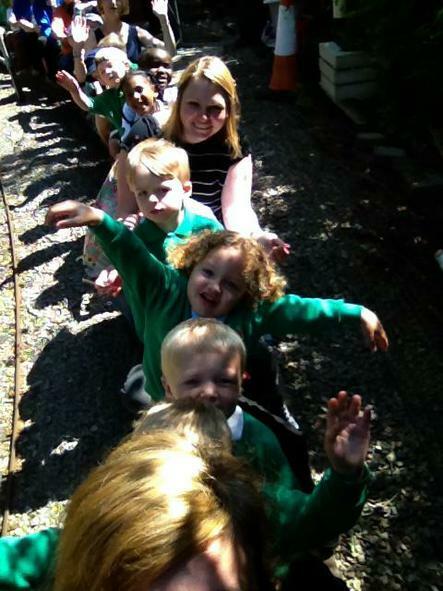 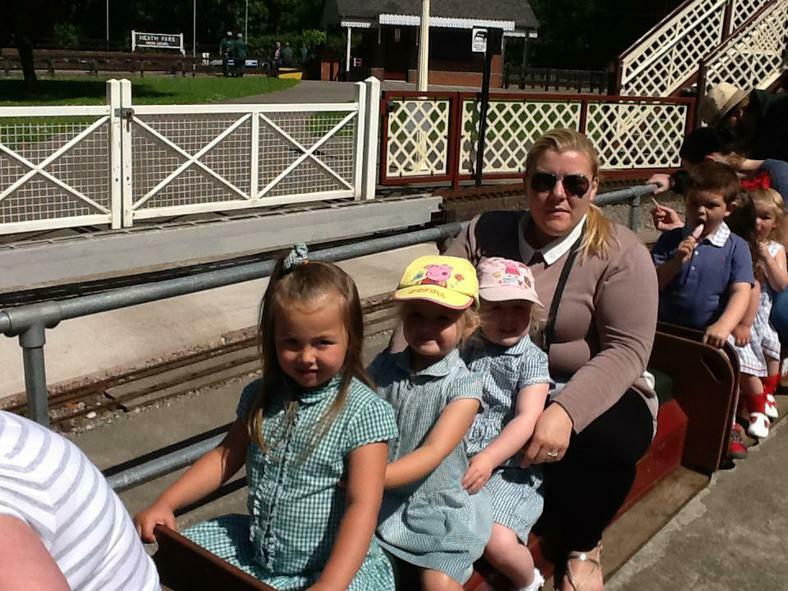 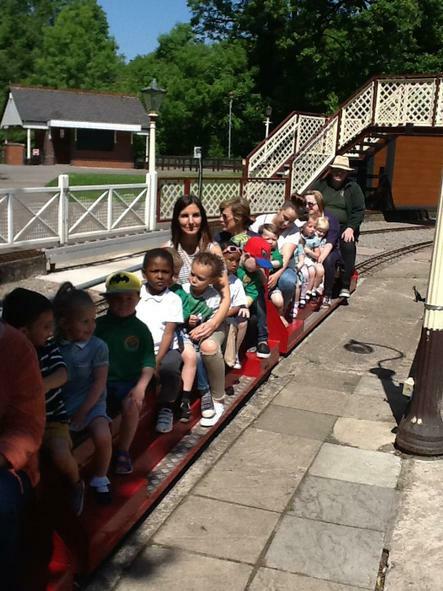 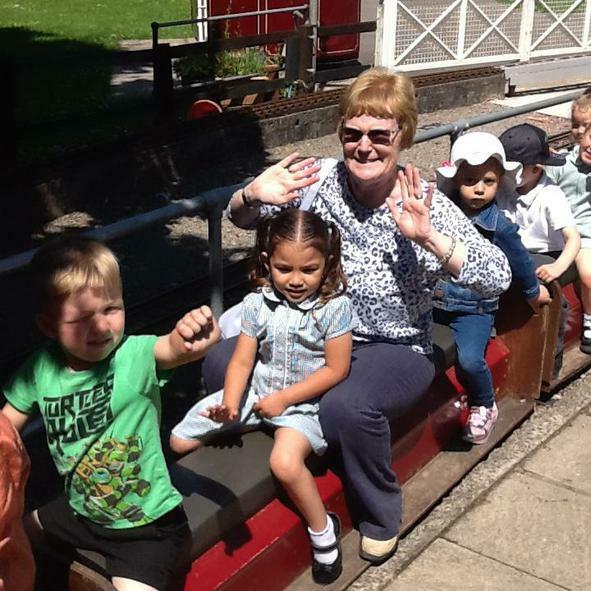 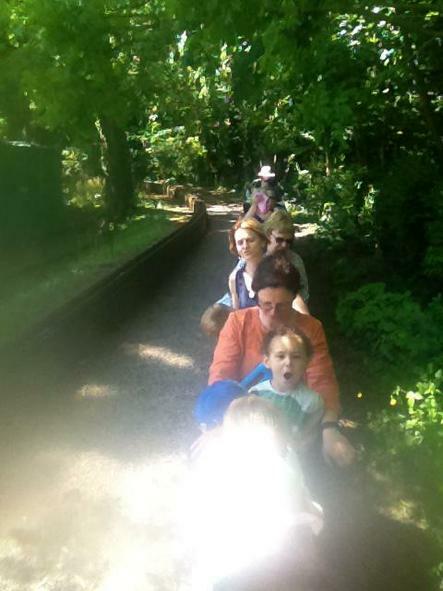 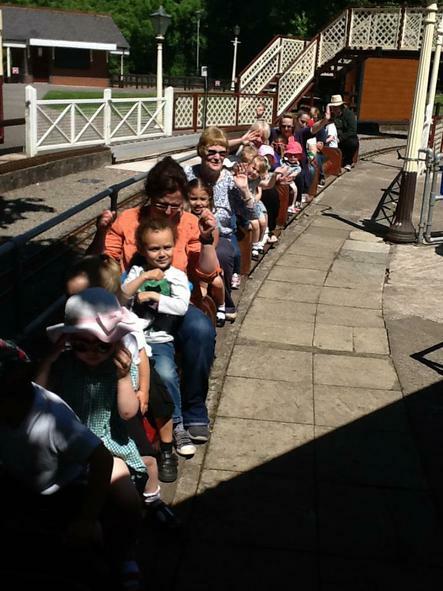 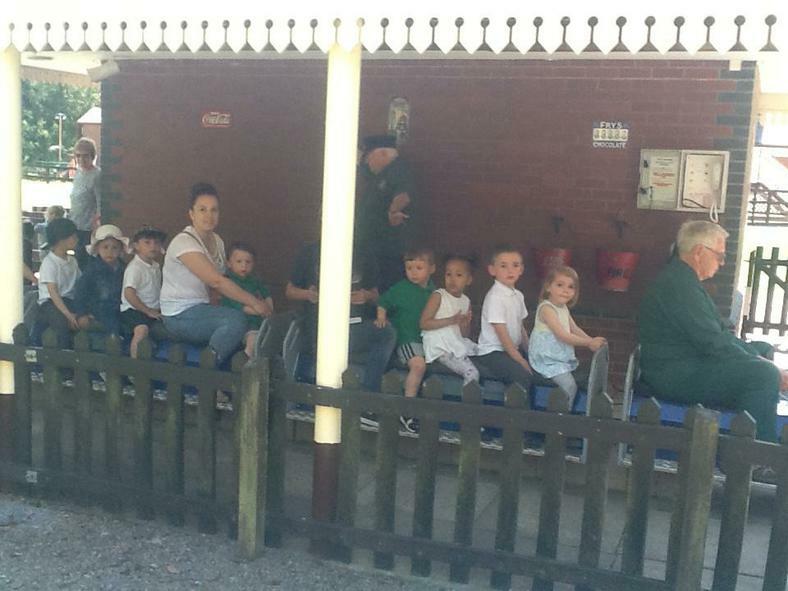 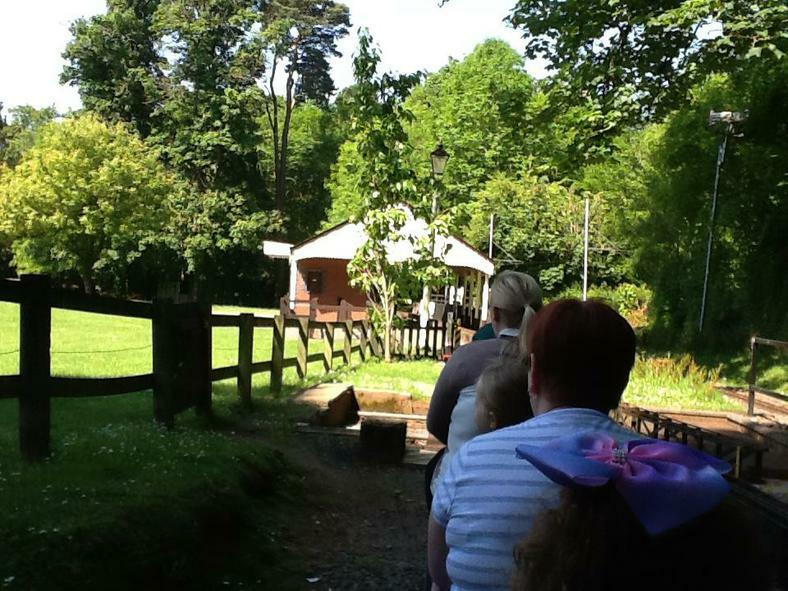 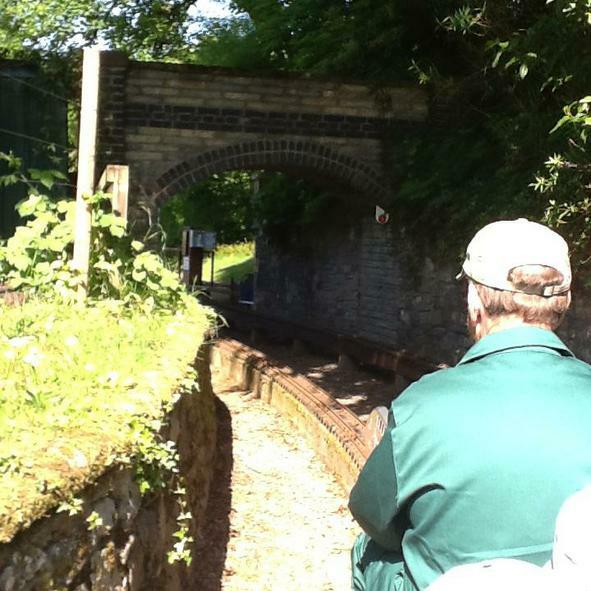 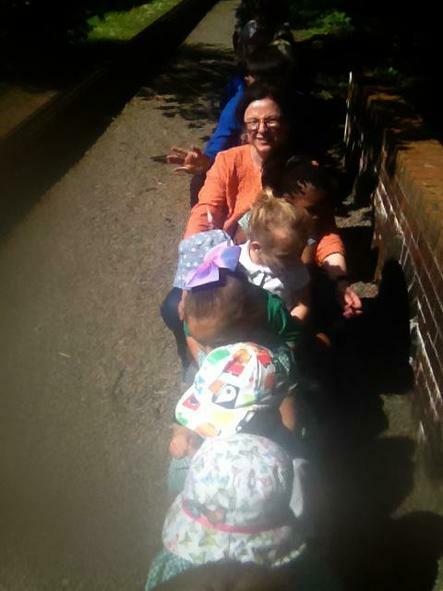 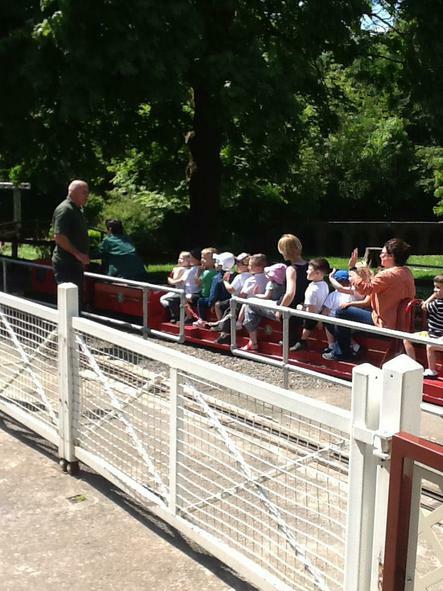 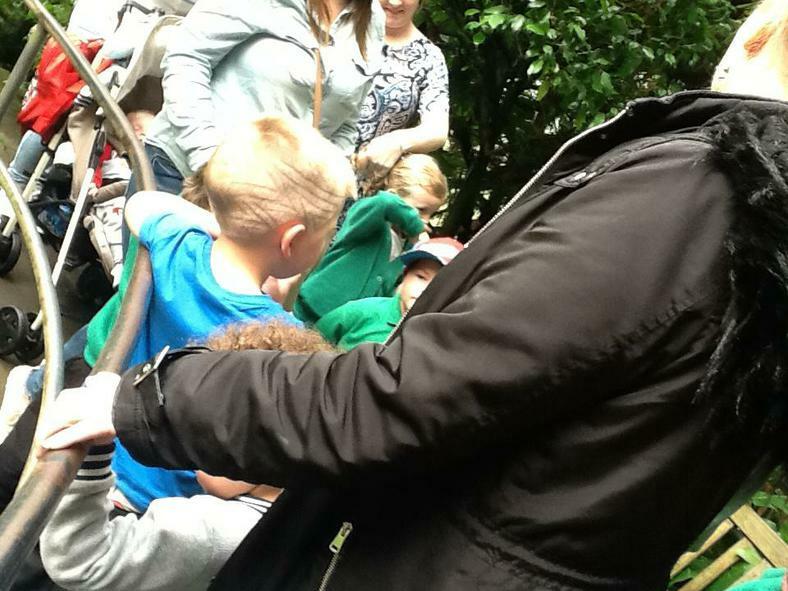 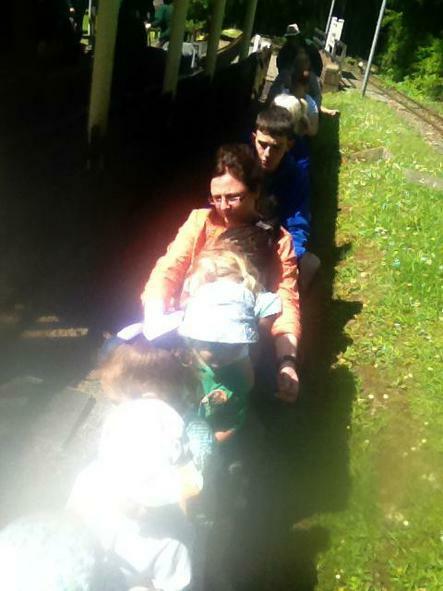 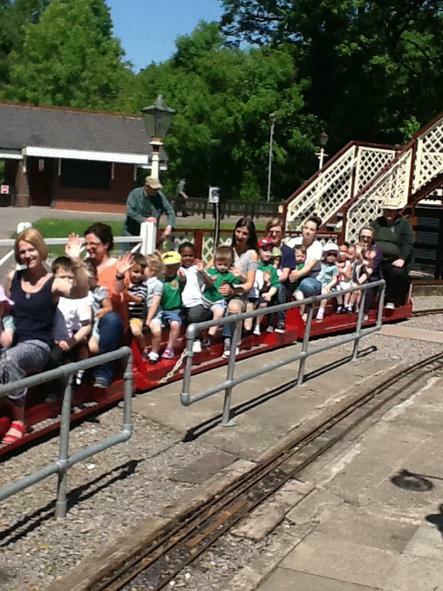 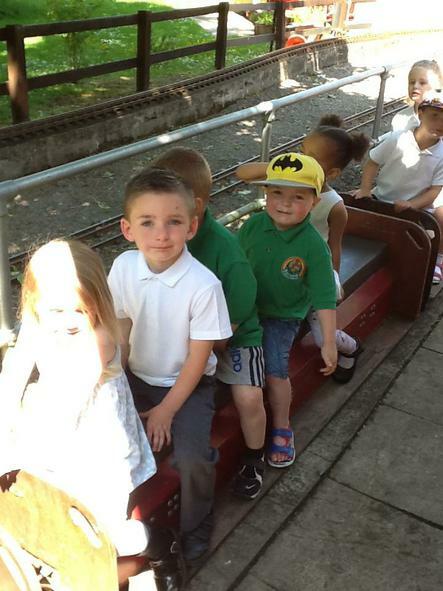 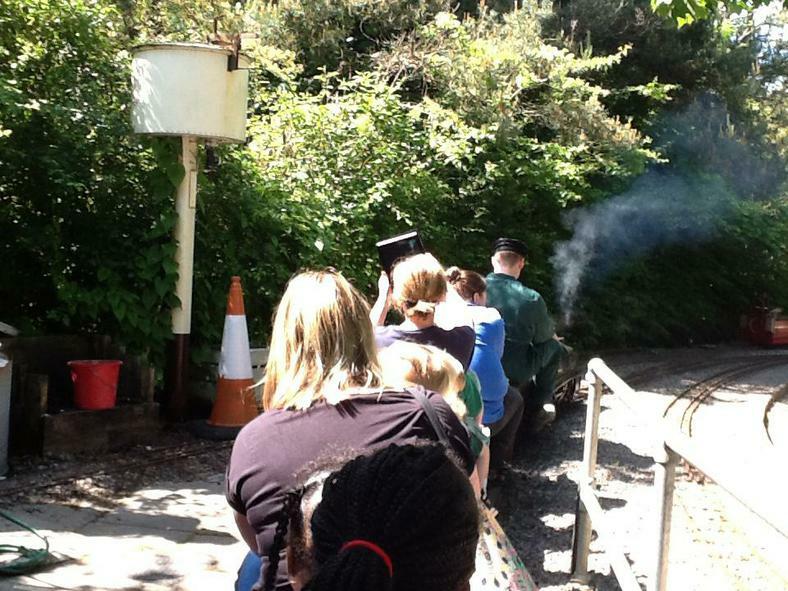 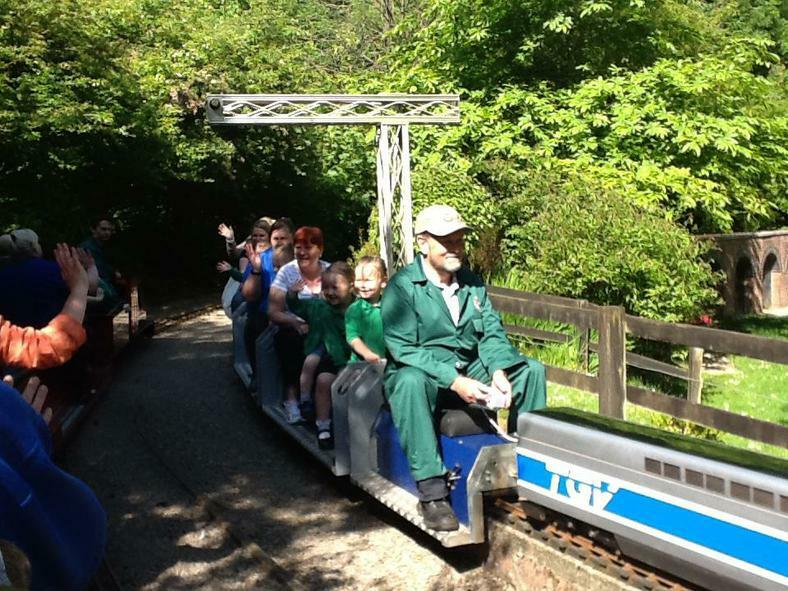 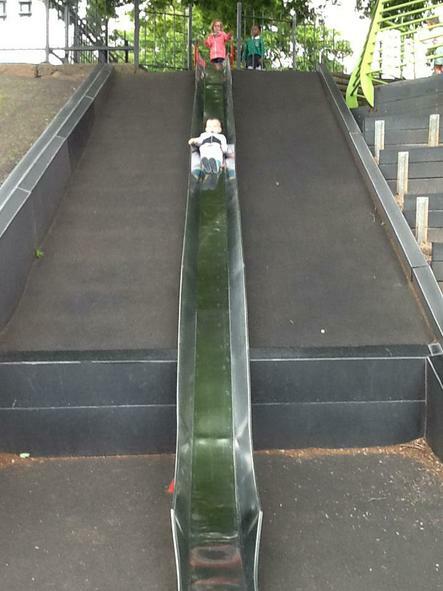 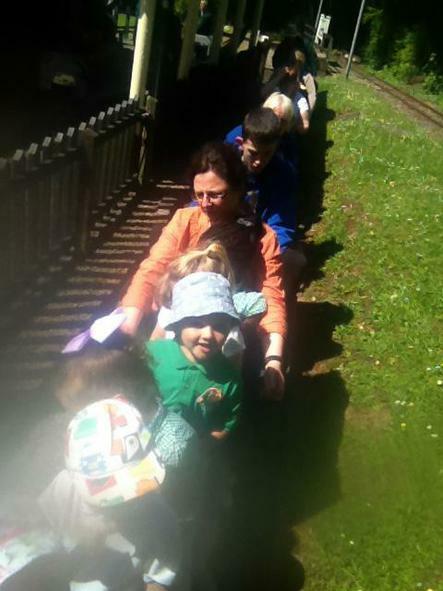 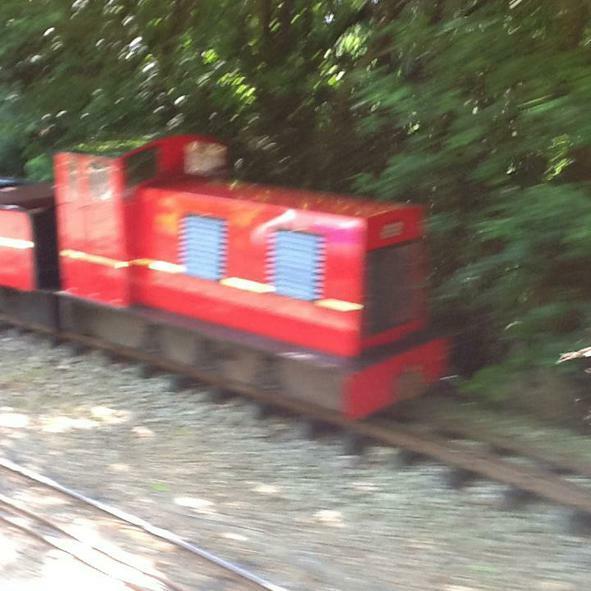 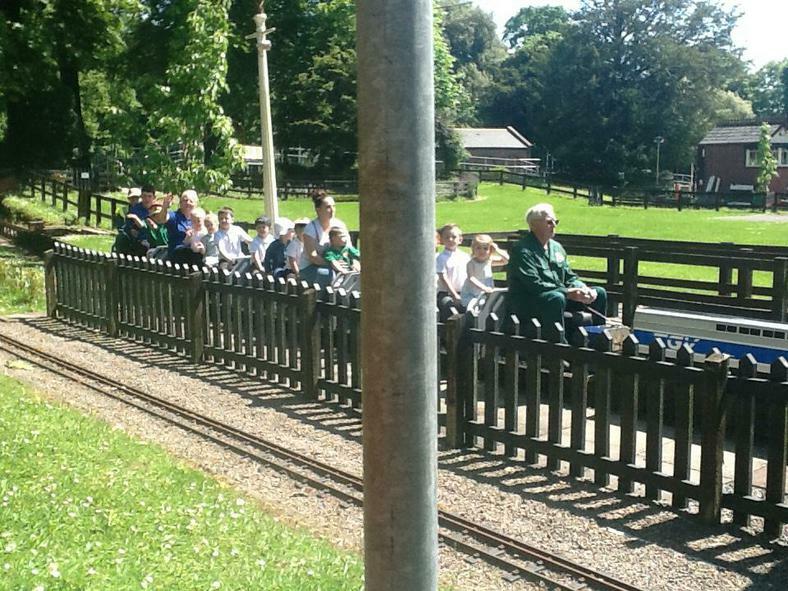 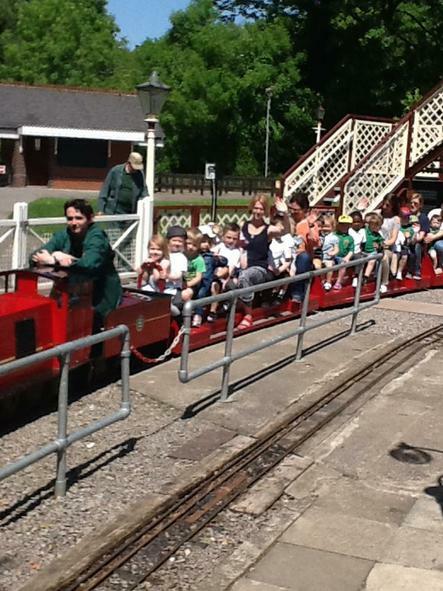 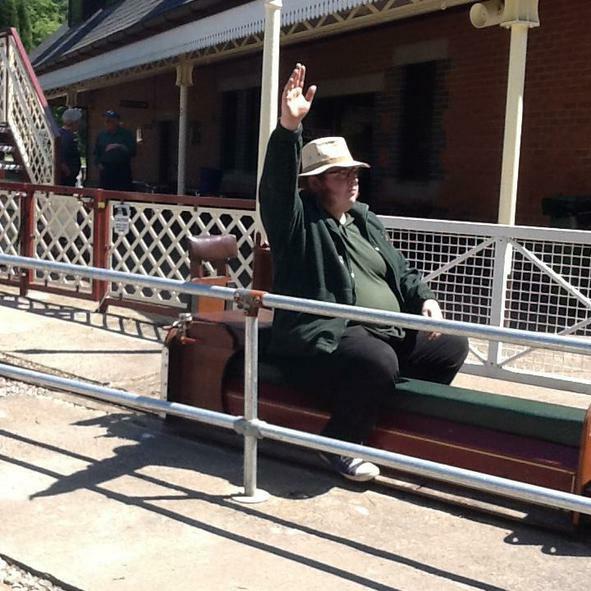 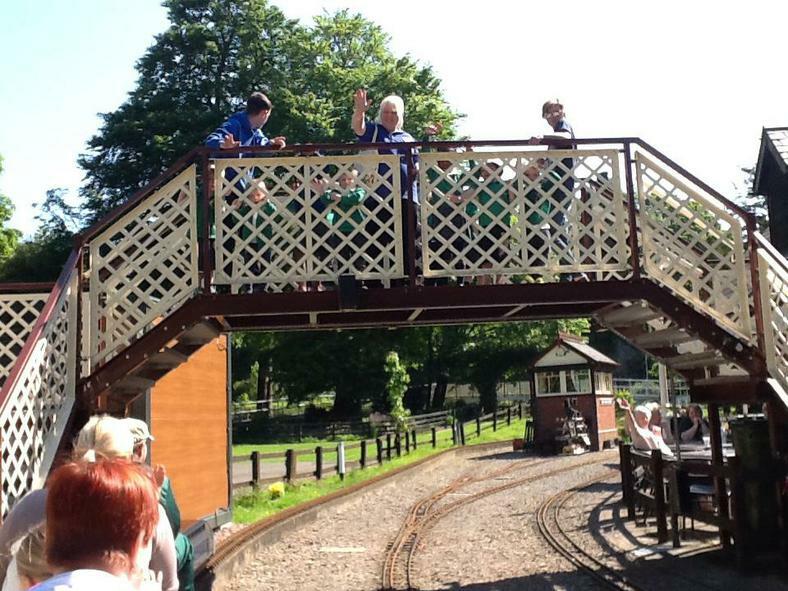 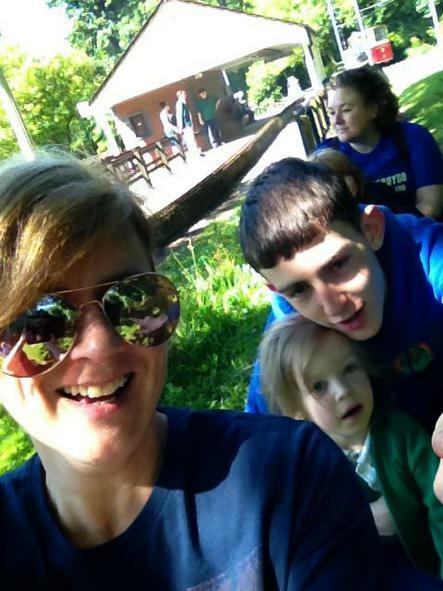 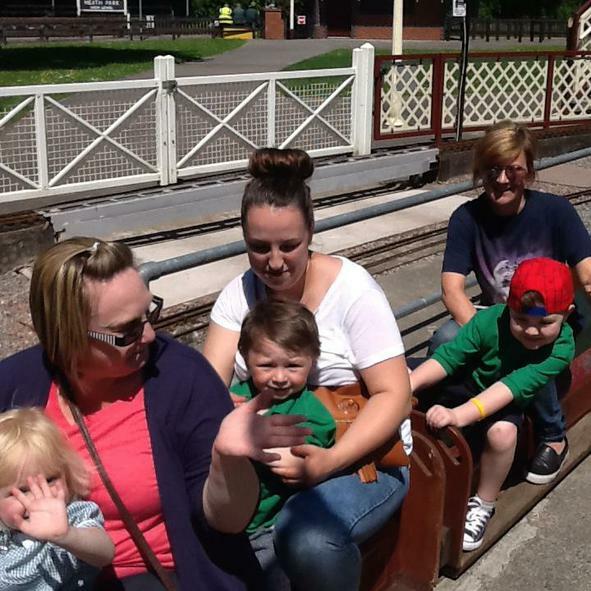 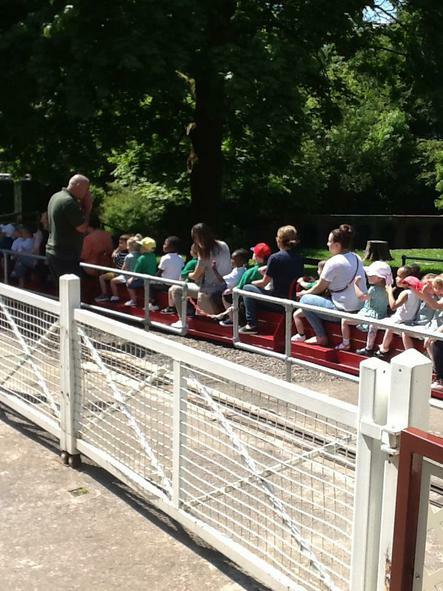 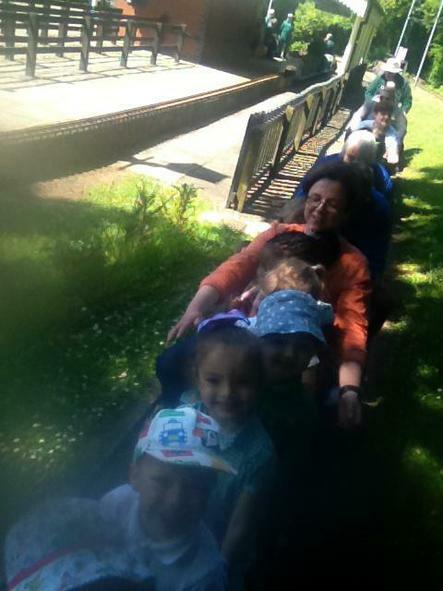 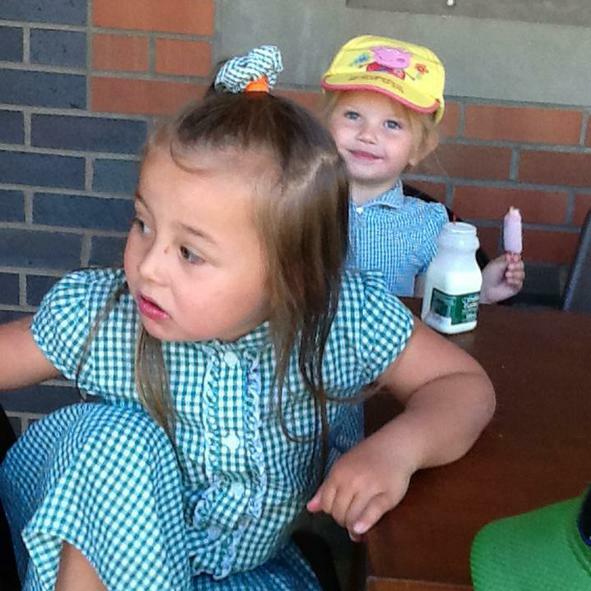 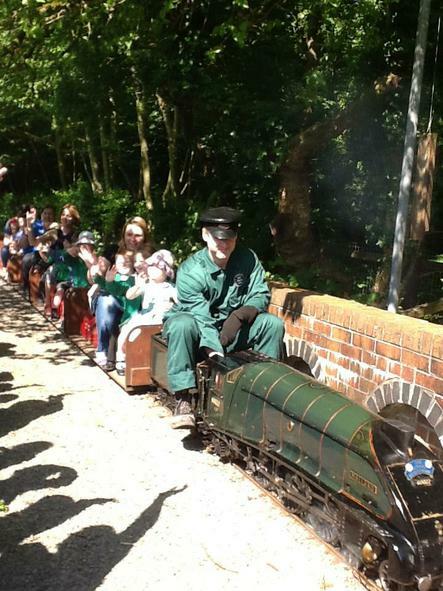 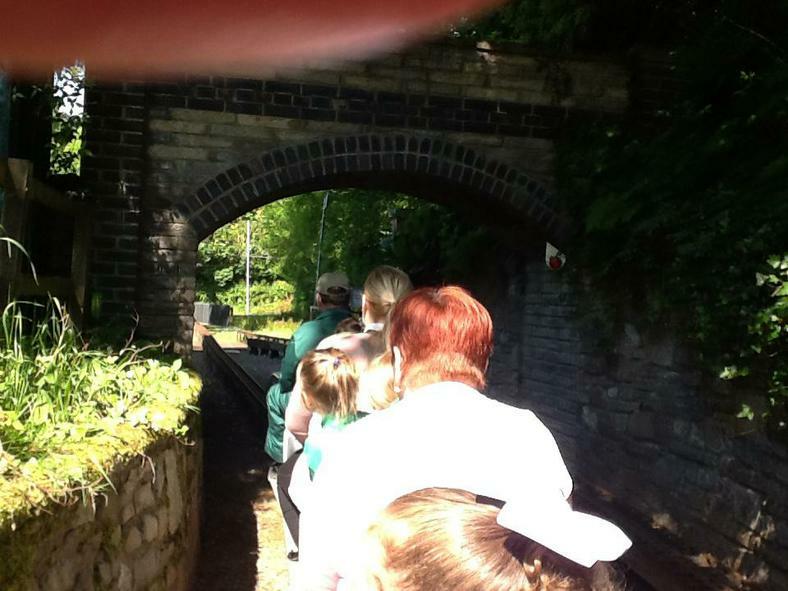 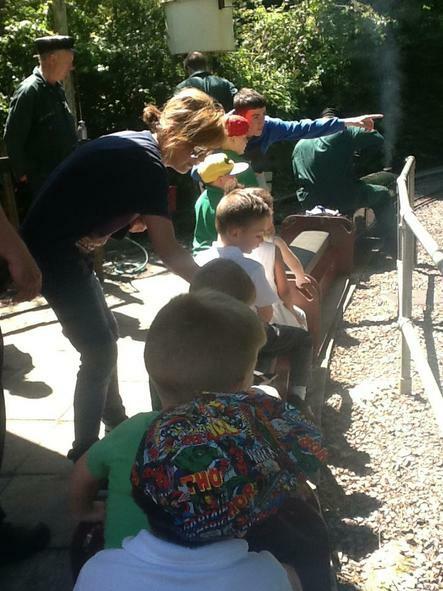 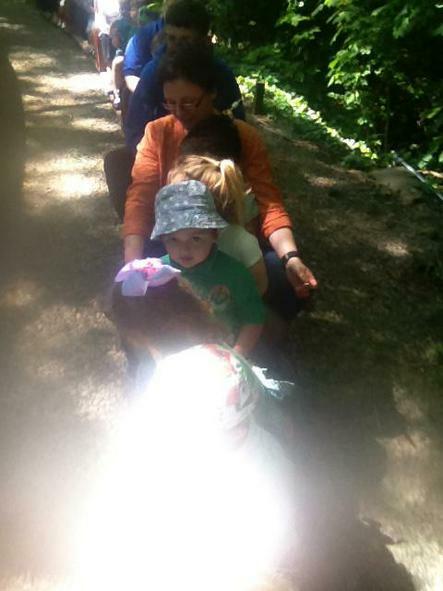 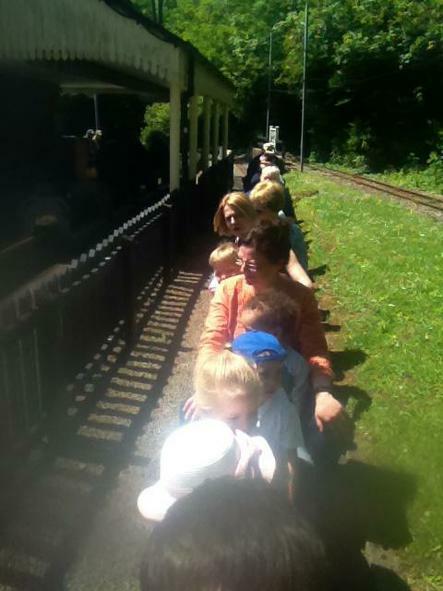 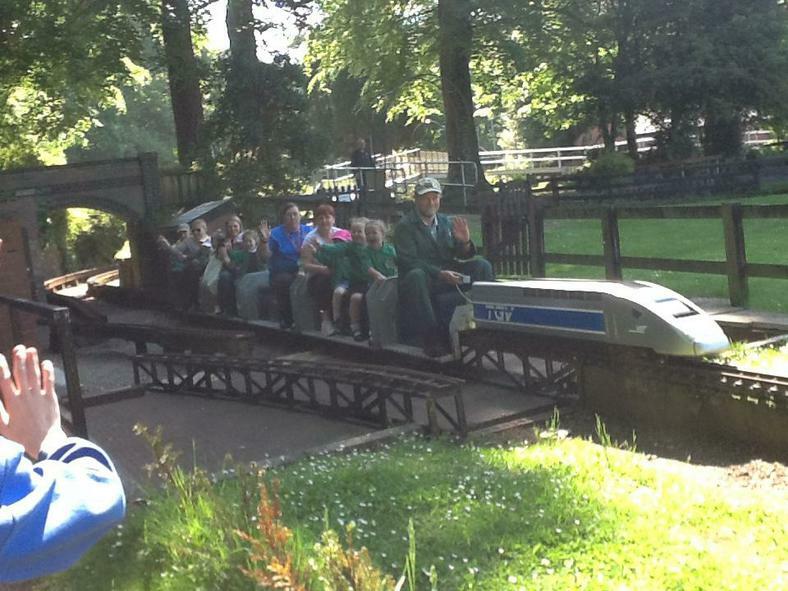 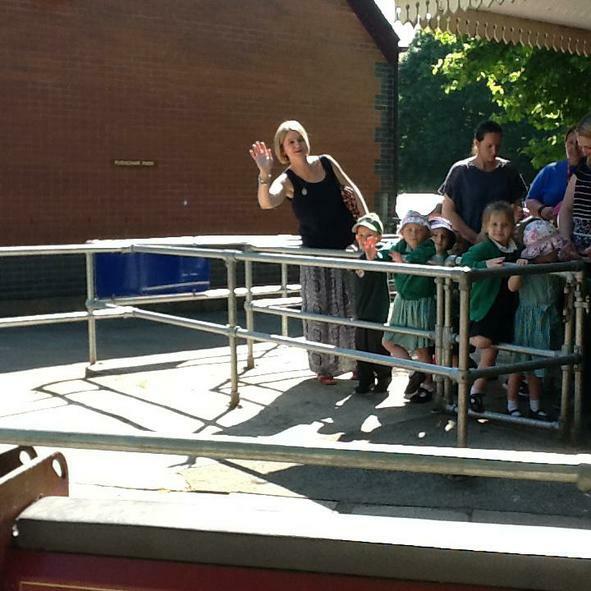 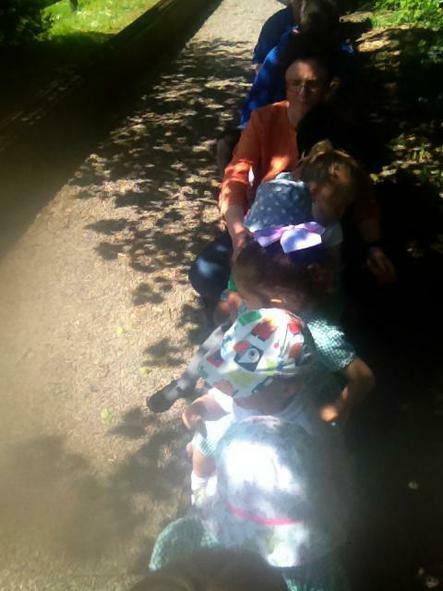 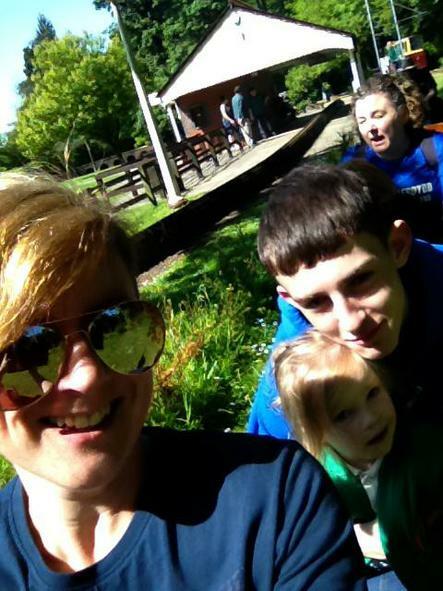 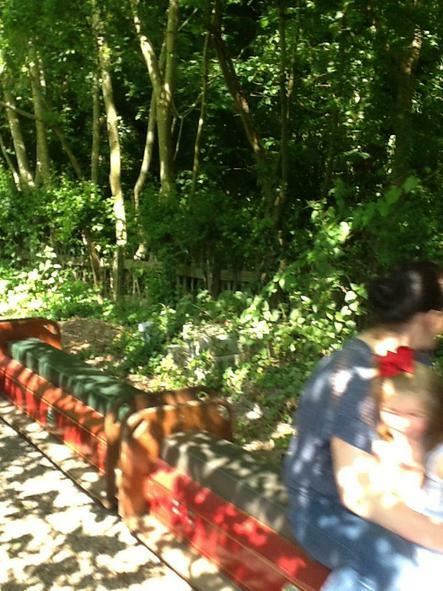 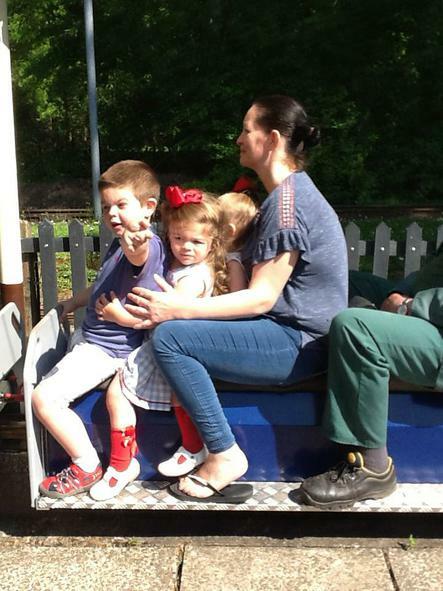 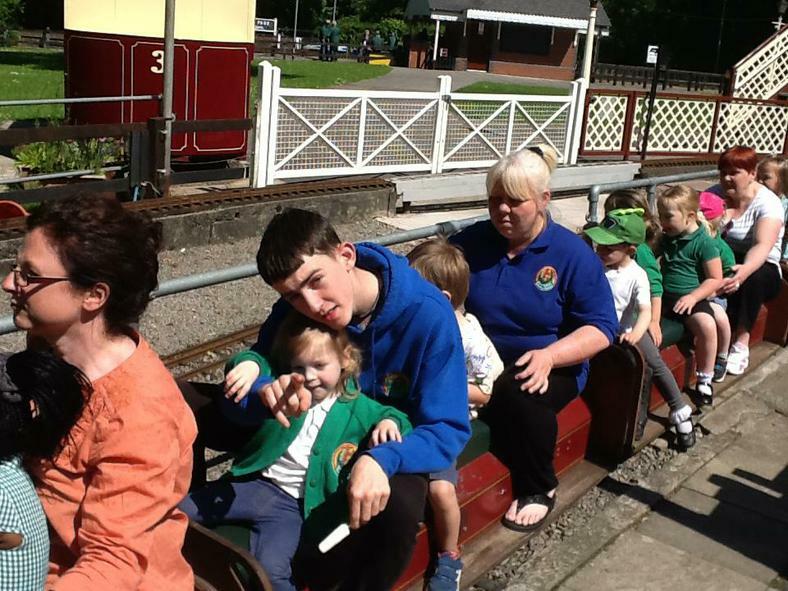 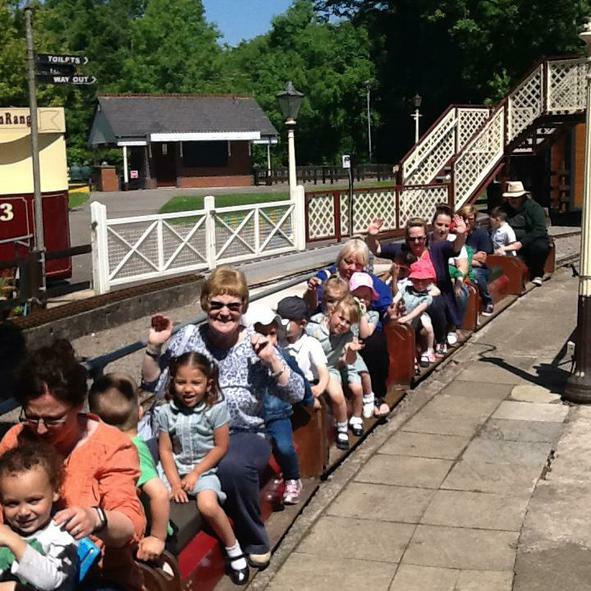 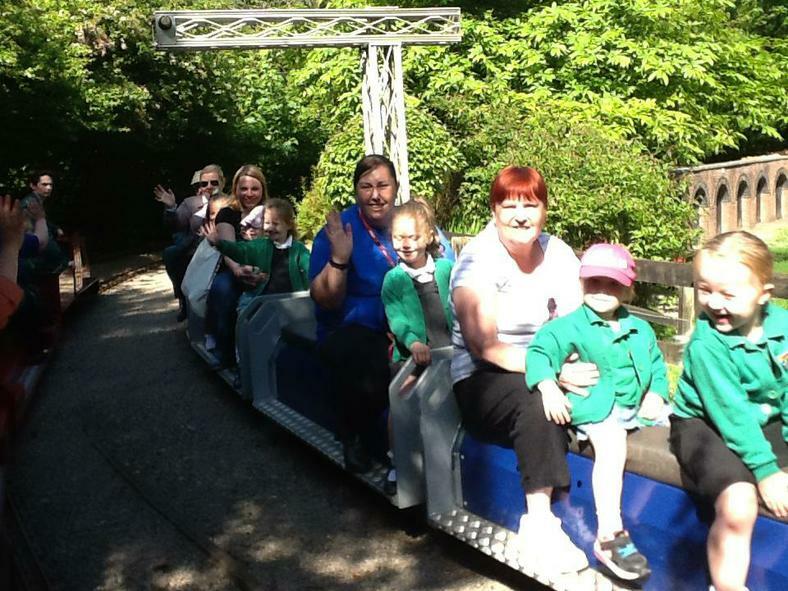 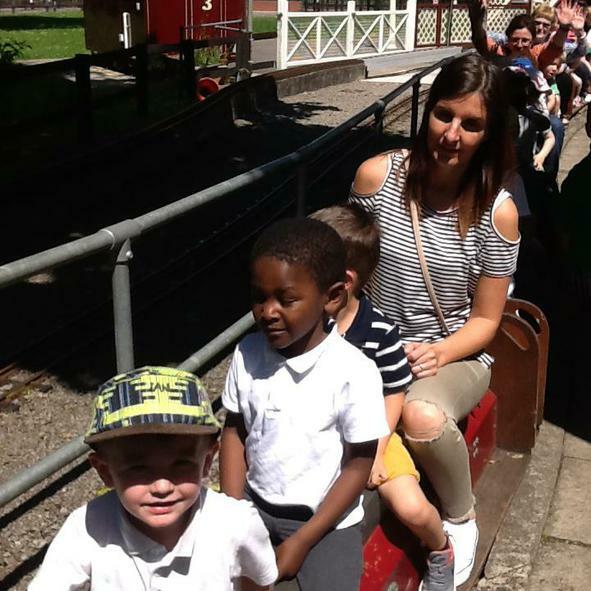 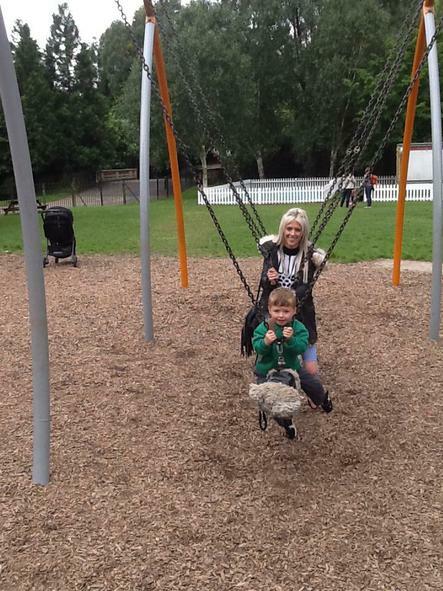 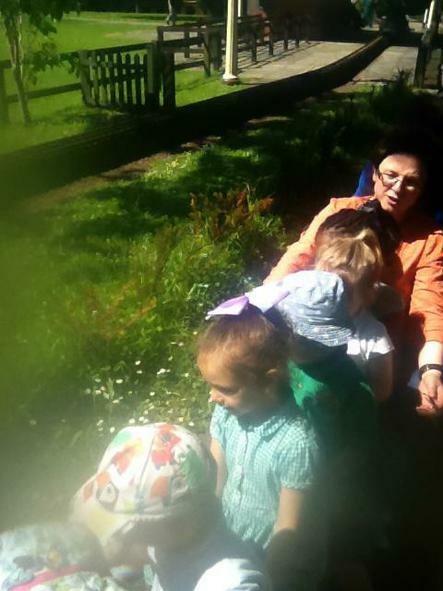 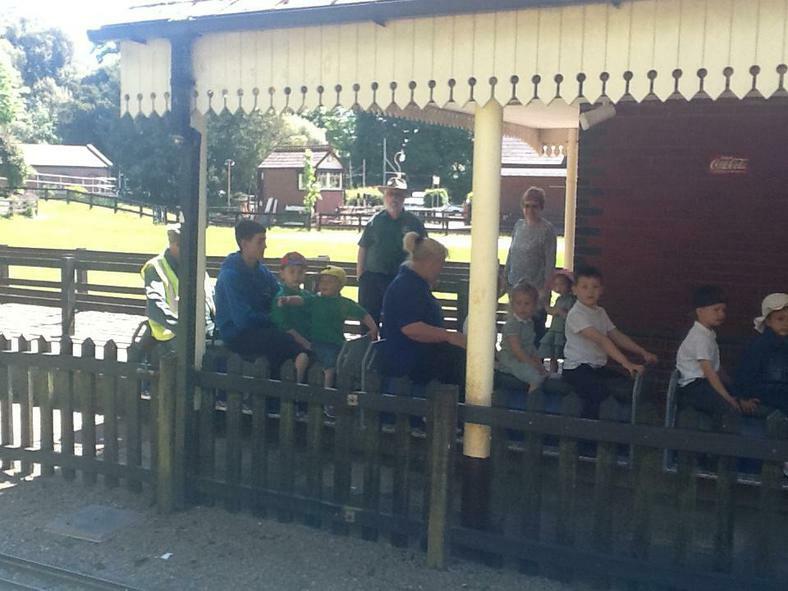 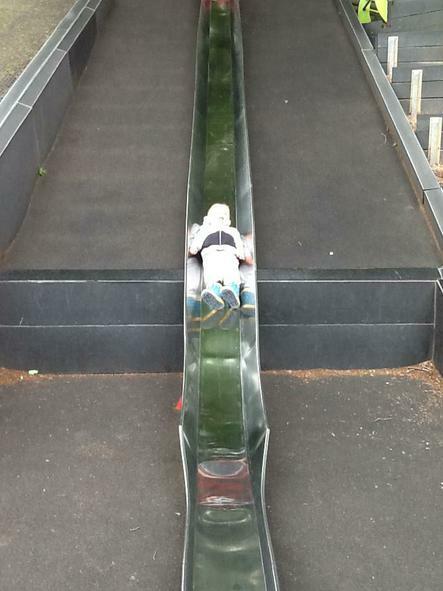 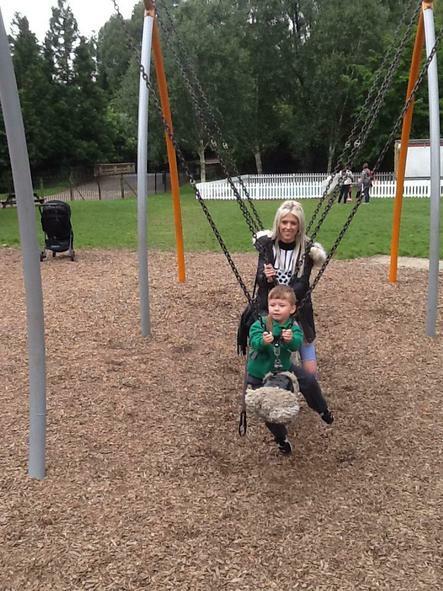 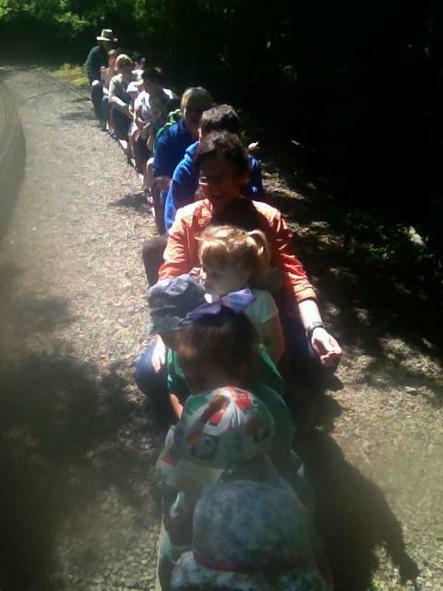 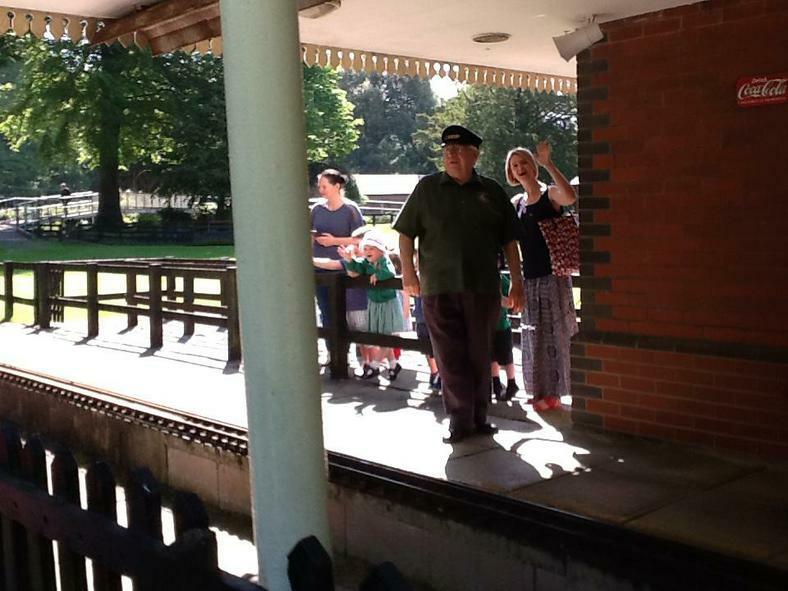 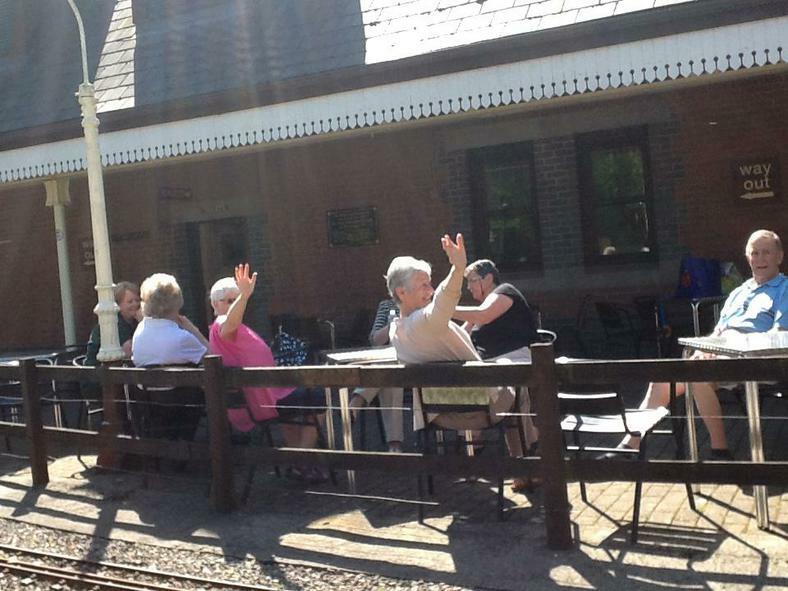 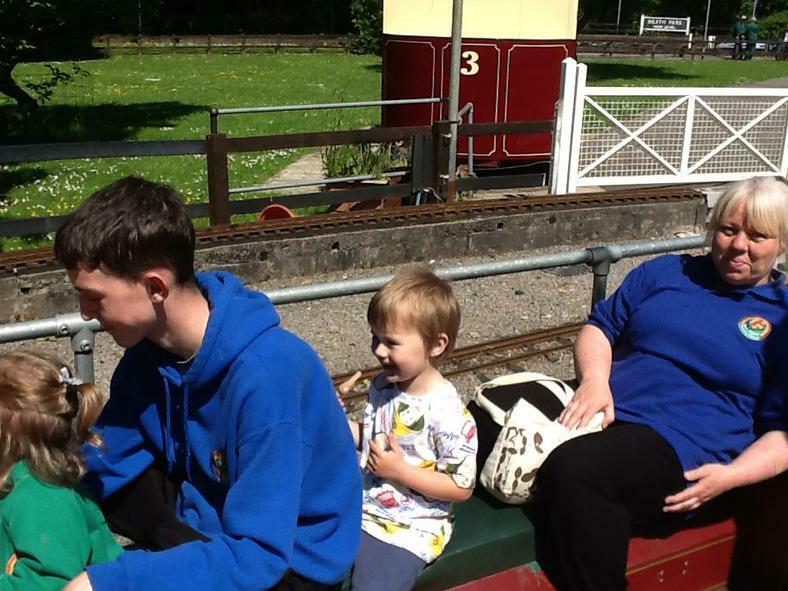 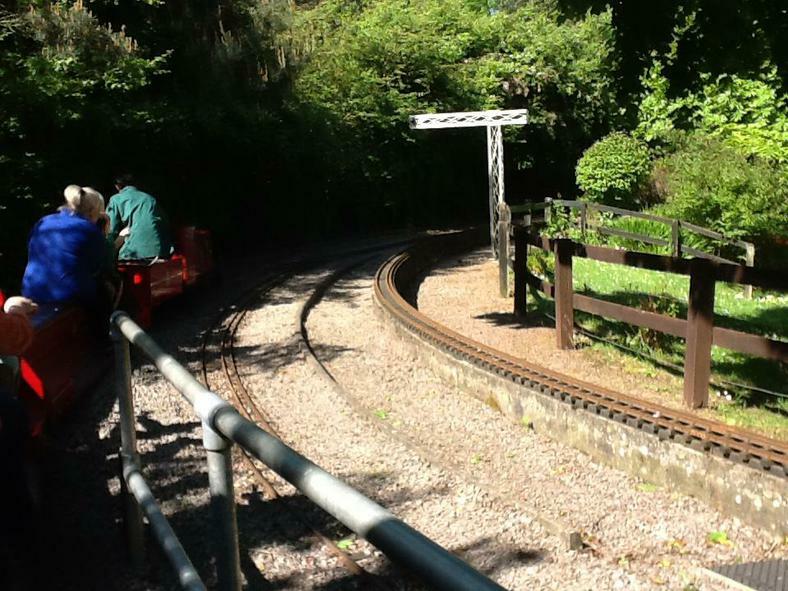 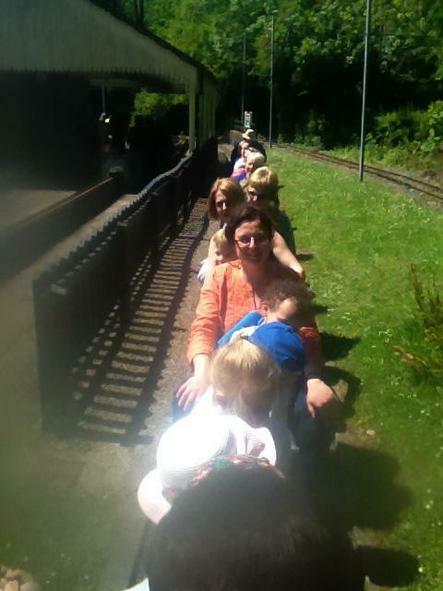 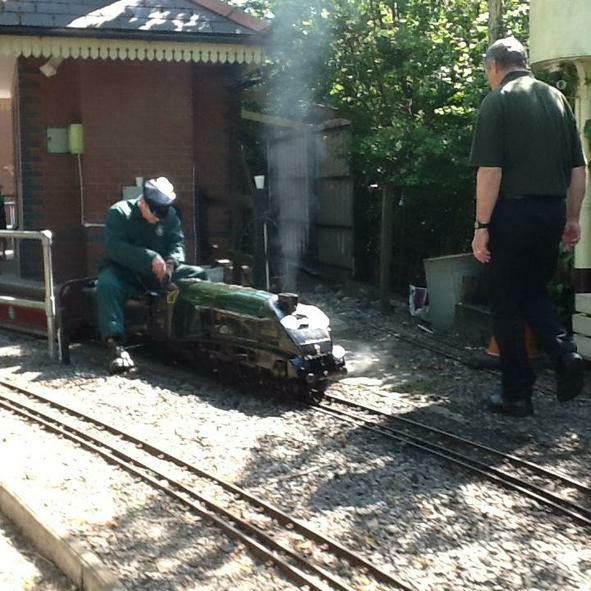 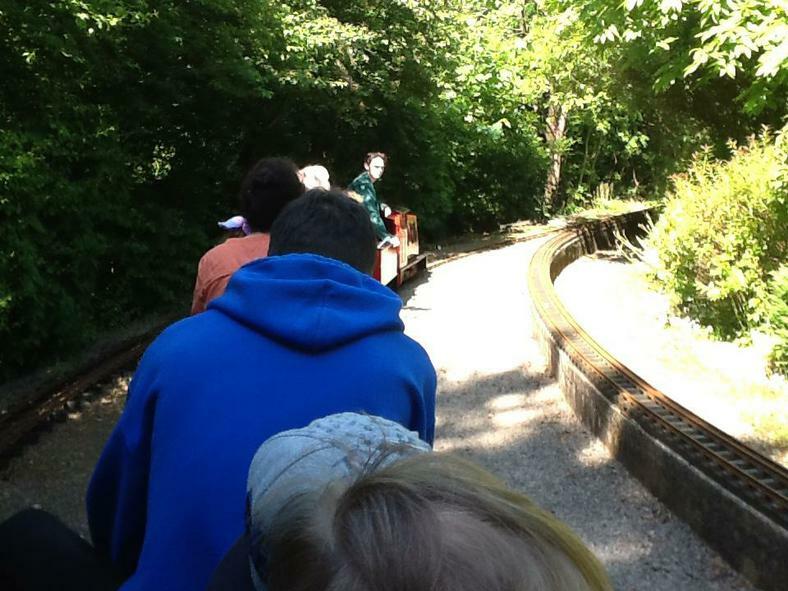 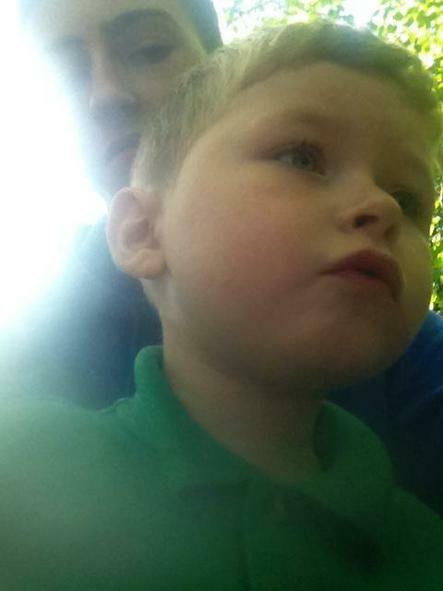 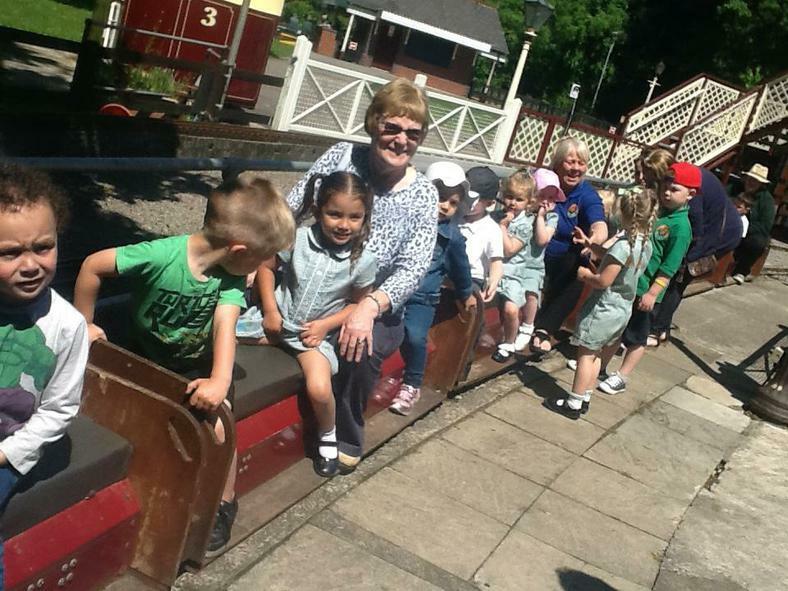 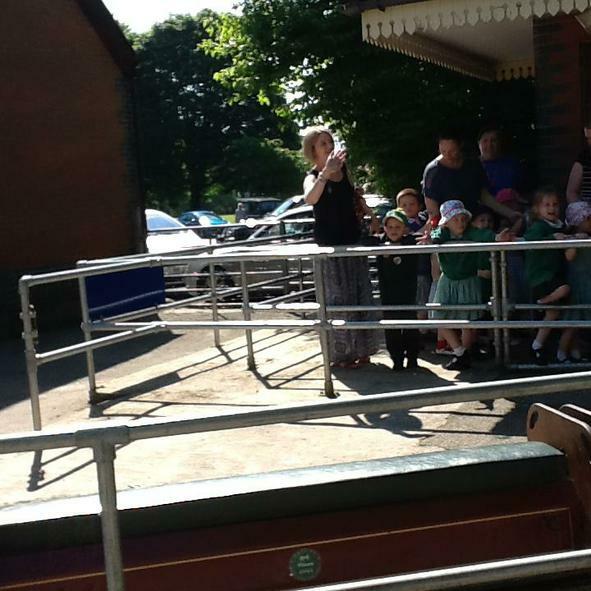 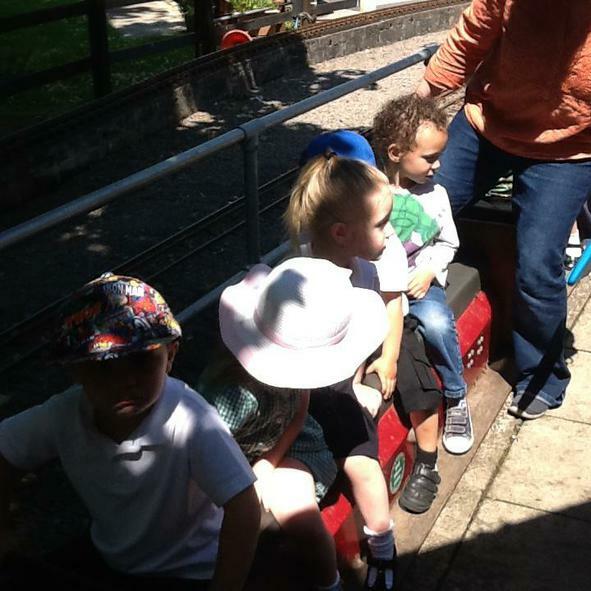 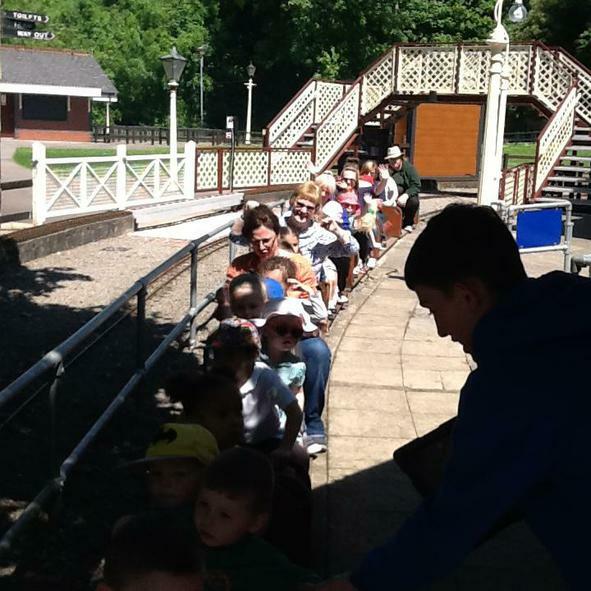 What a wonderful time we all had yesterday at Heath Park Miniature Railway. 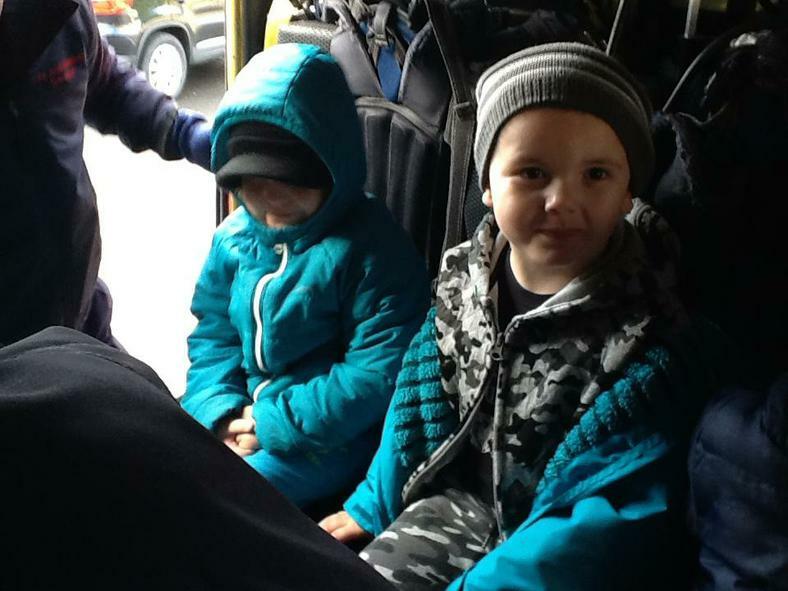 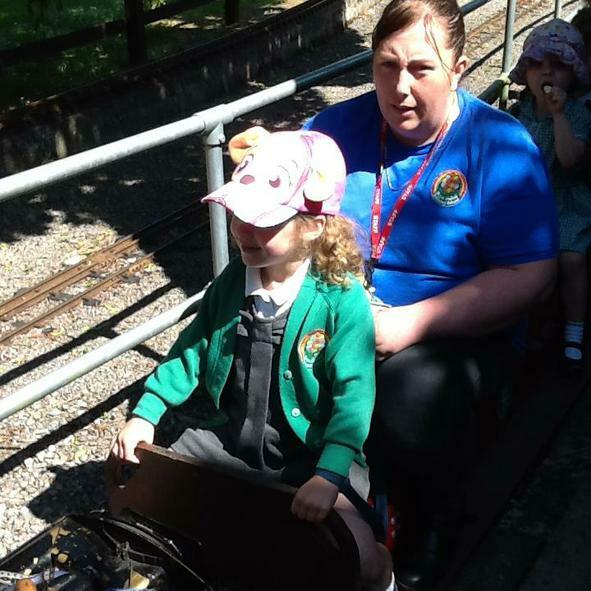 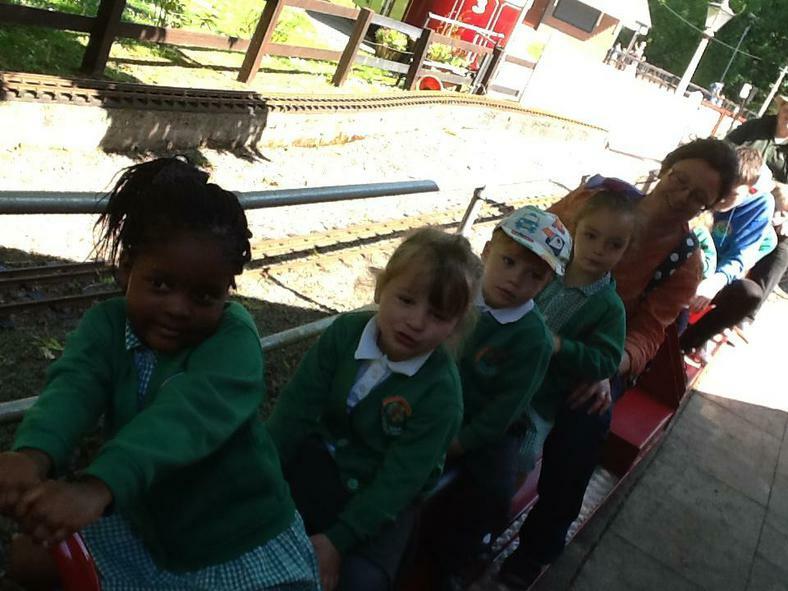 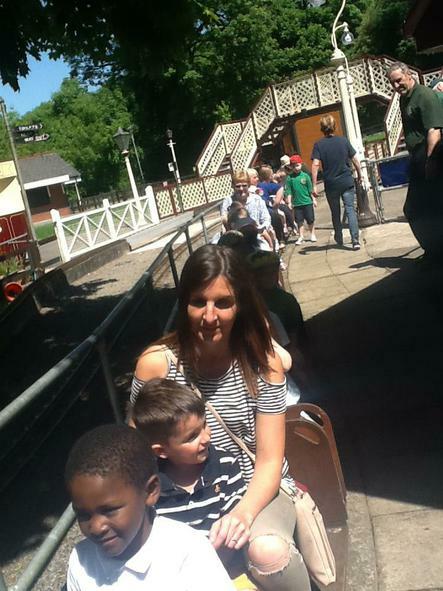 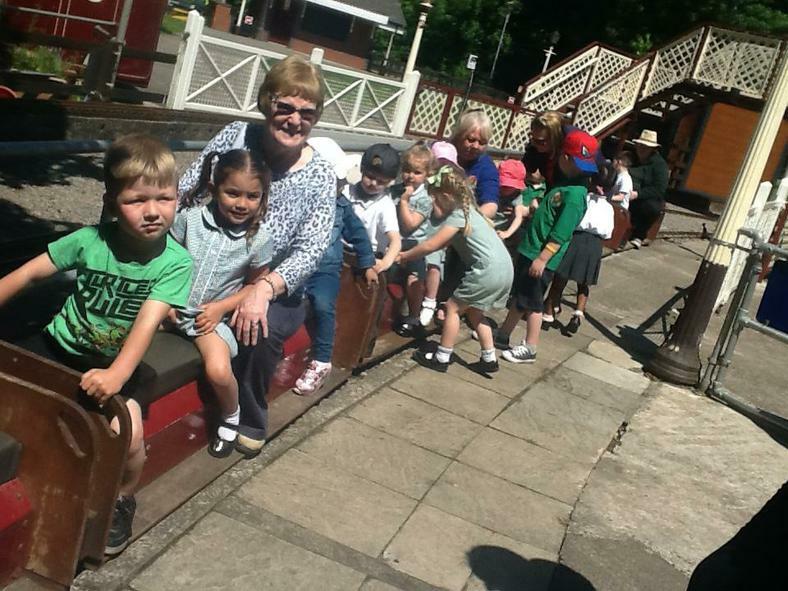 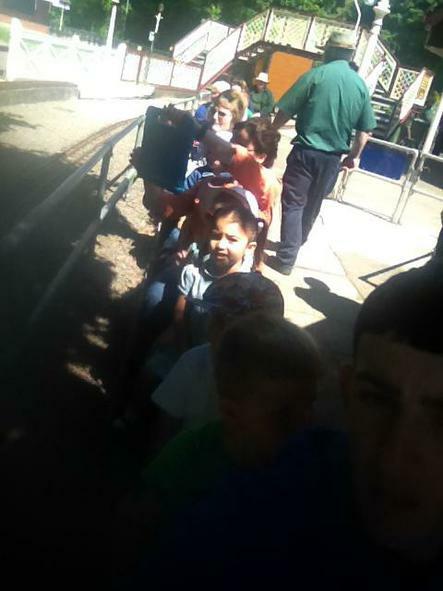 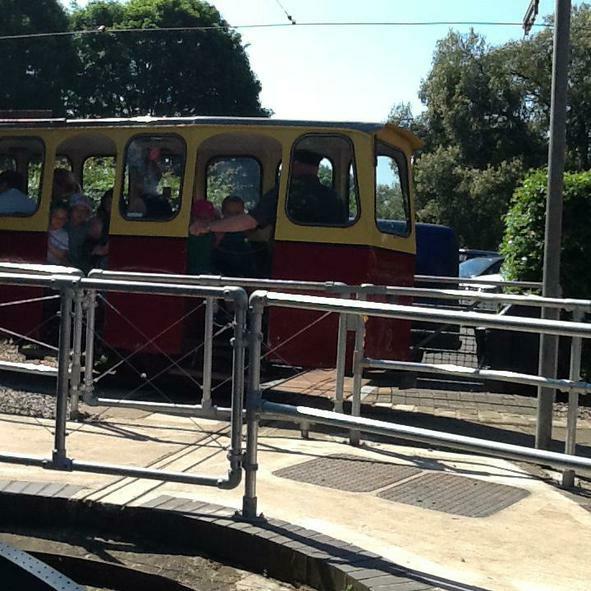 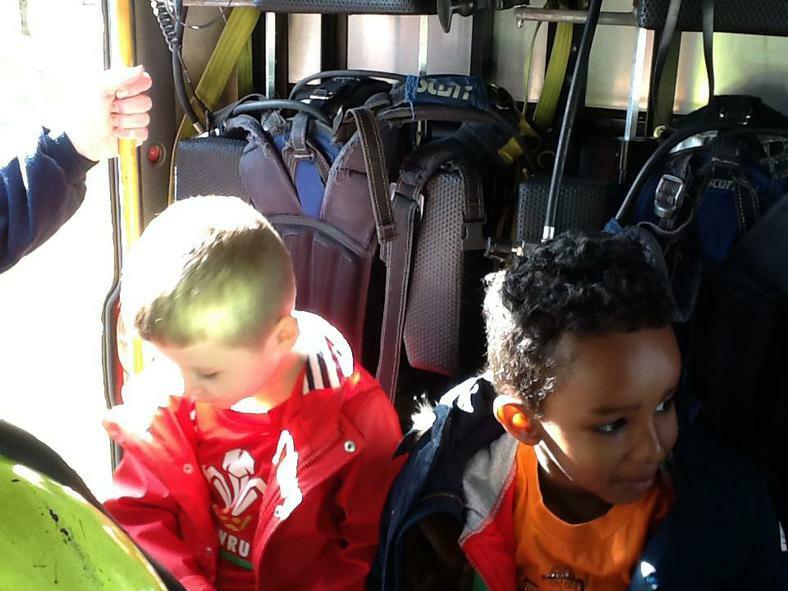 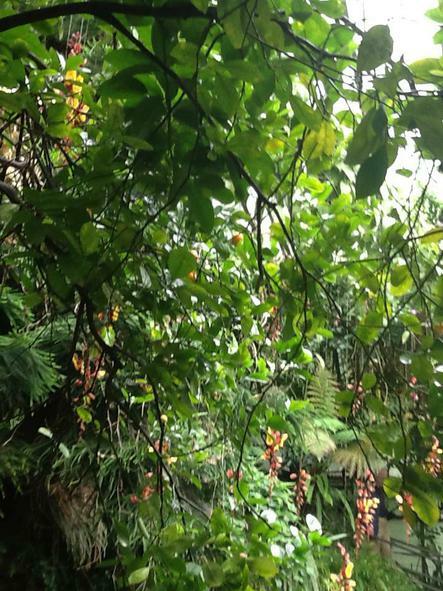 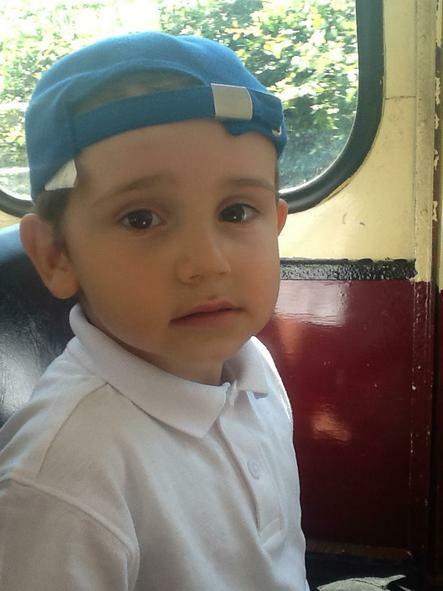 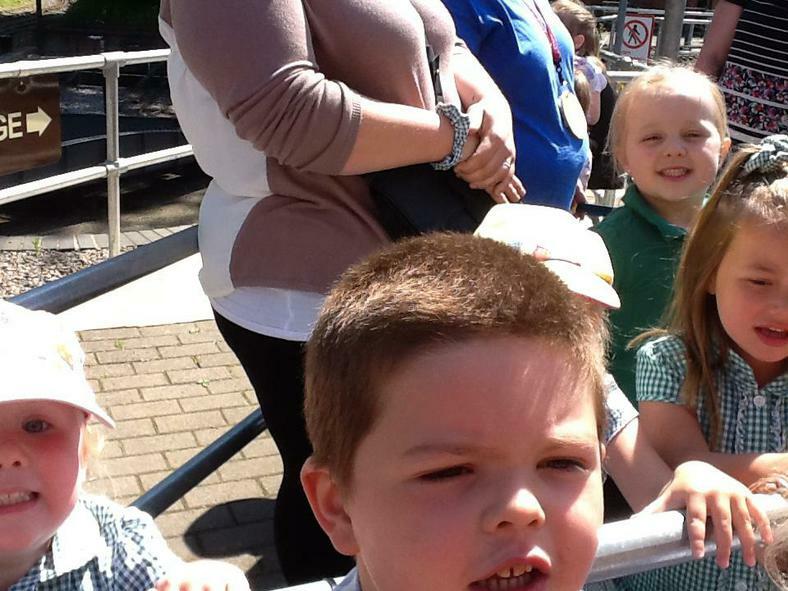 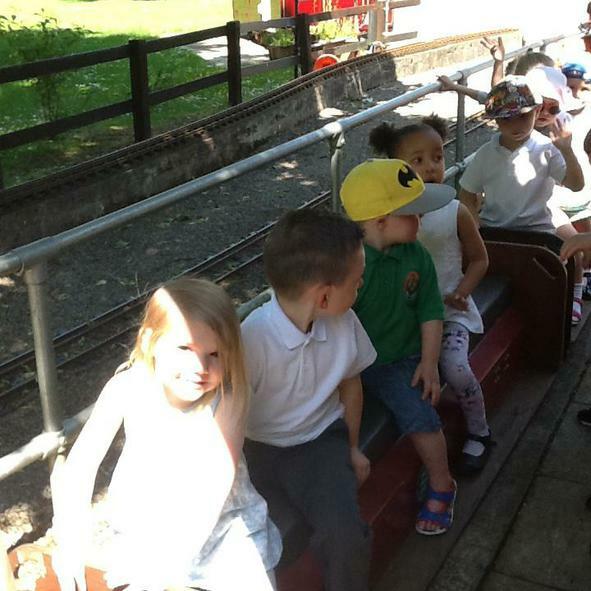 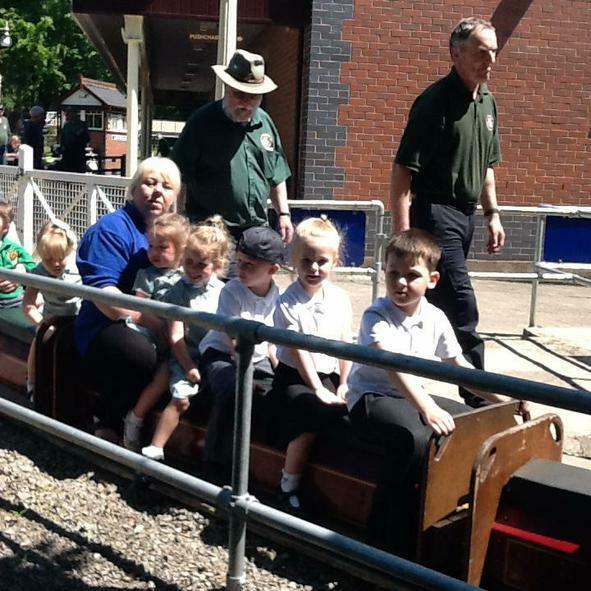 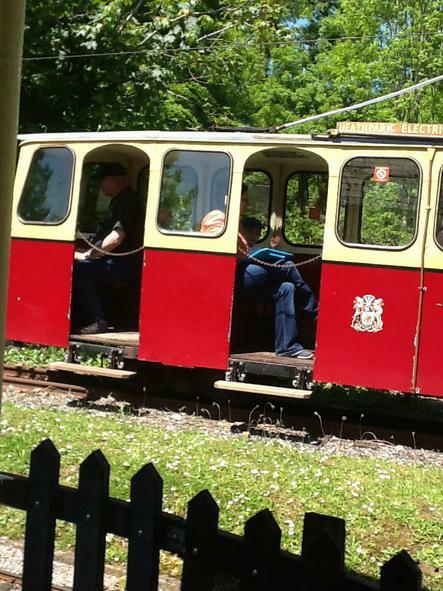 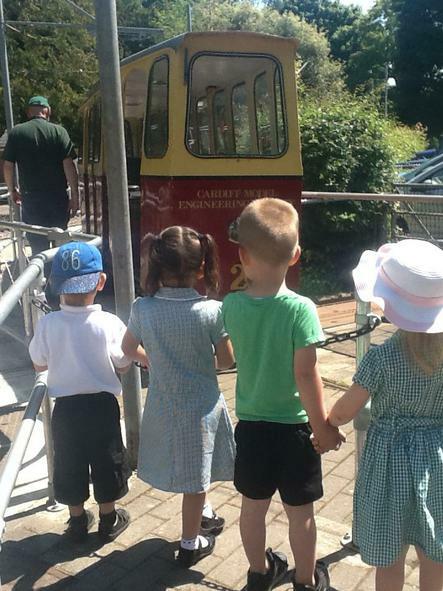 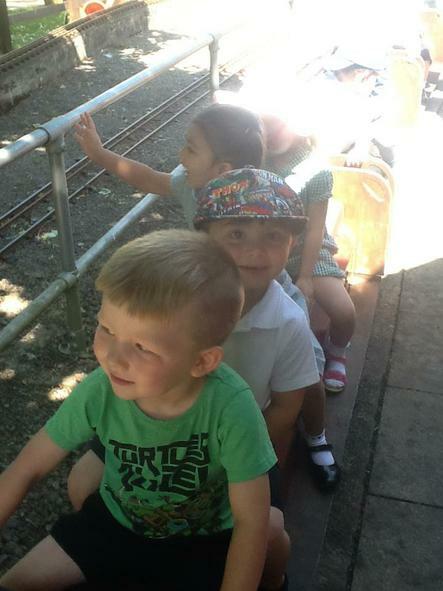 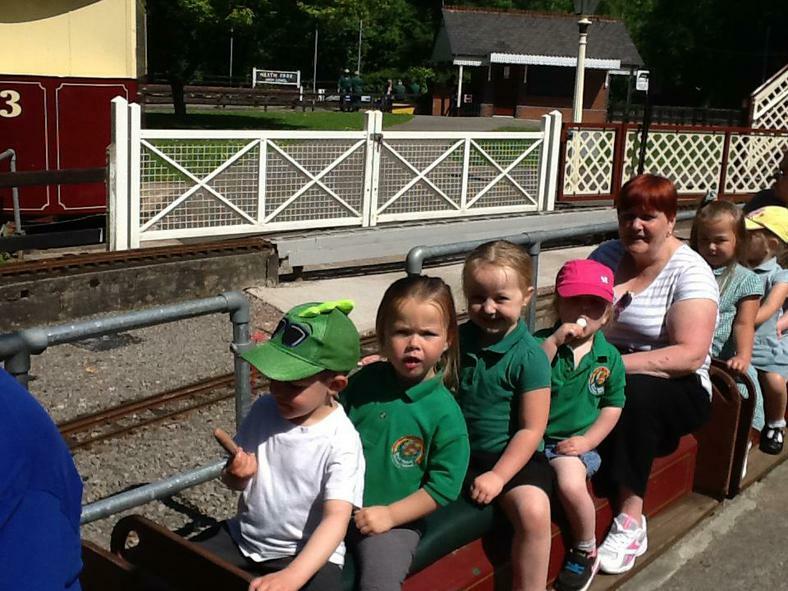 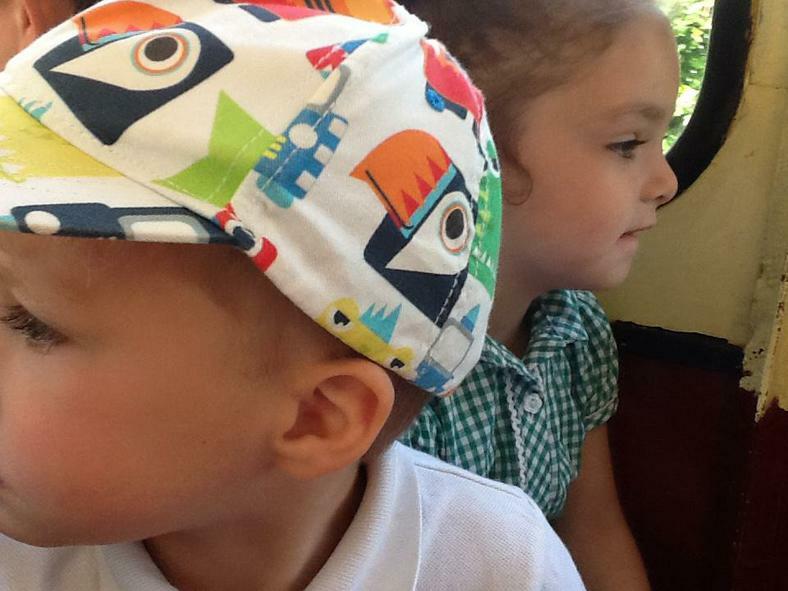 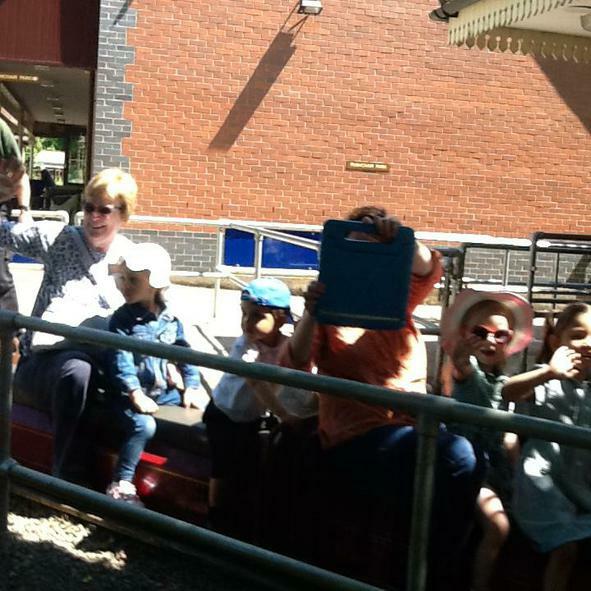 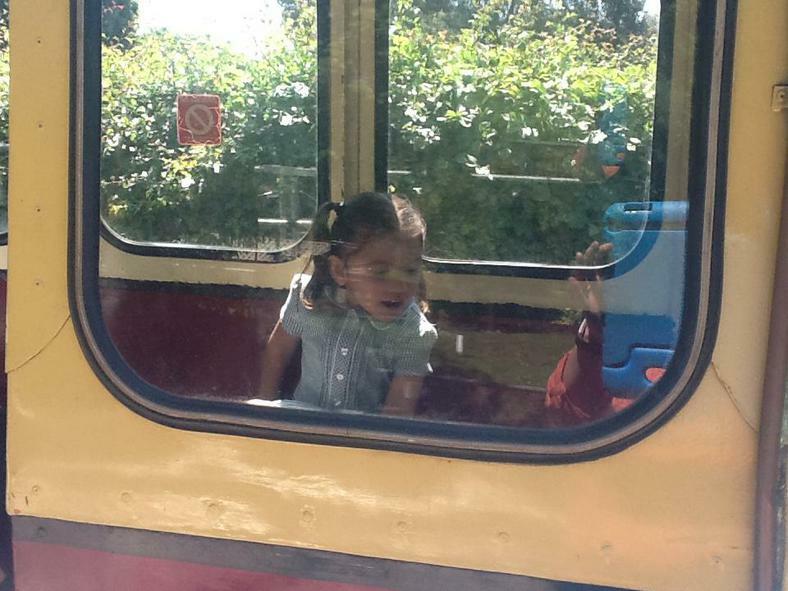 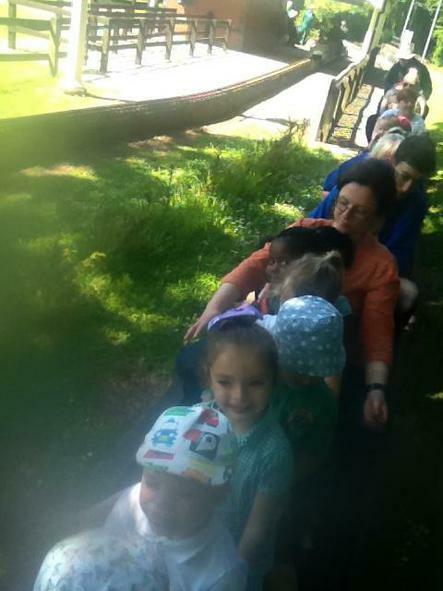 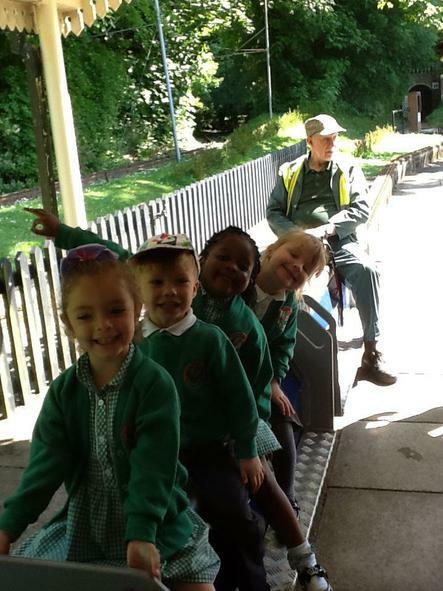 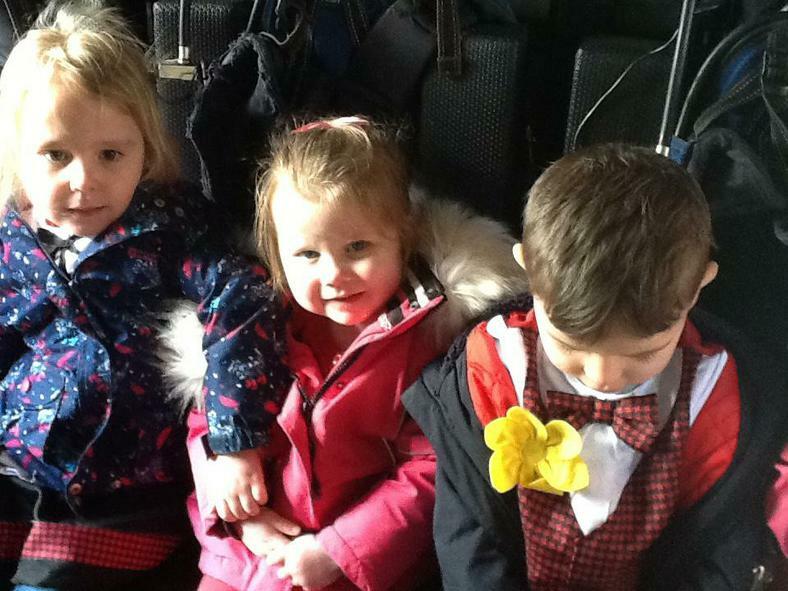 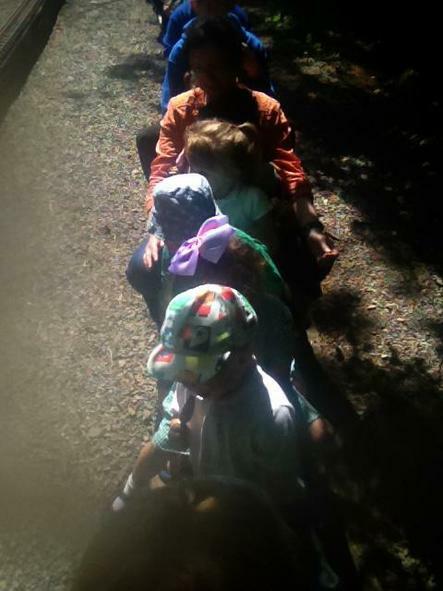 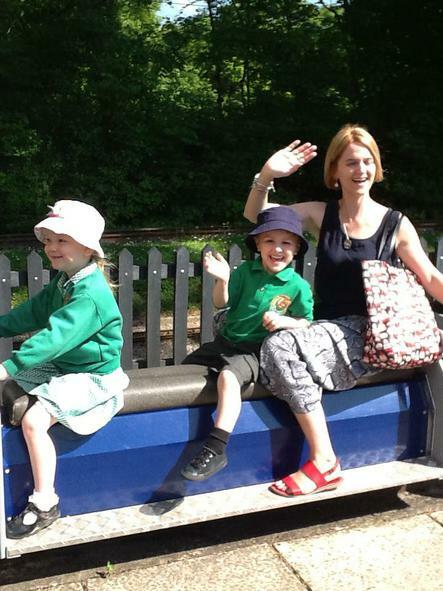 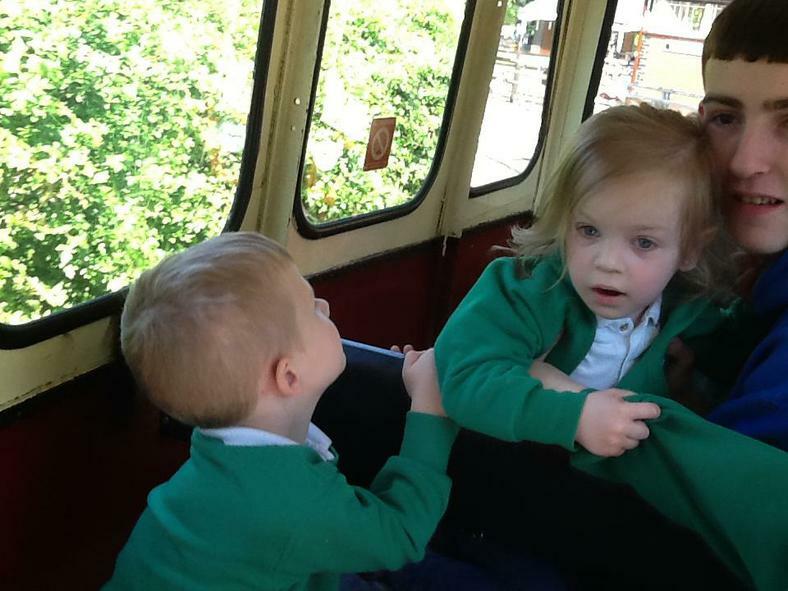 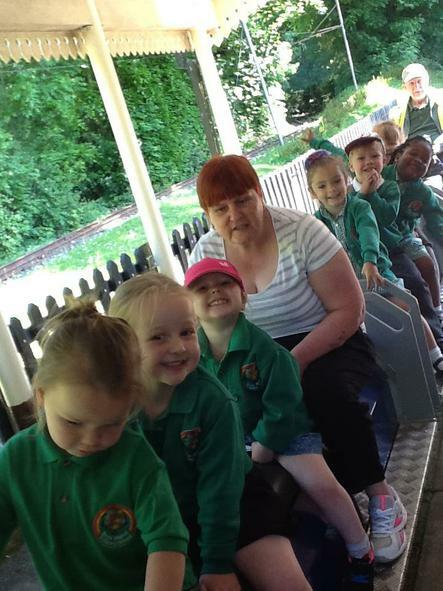 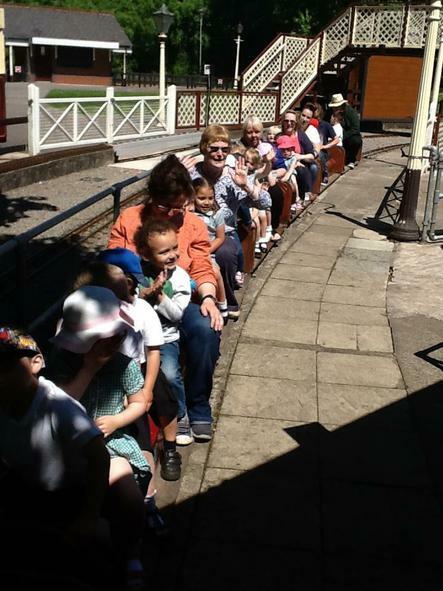 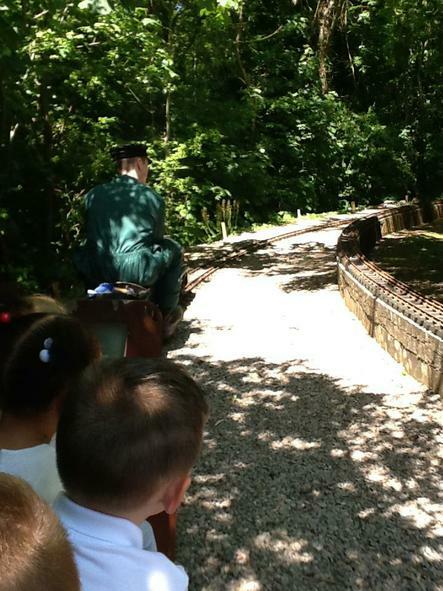 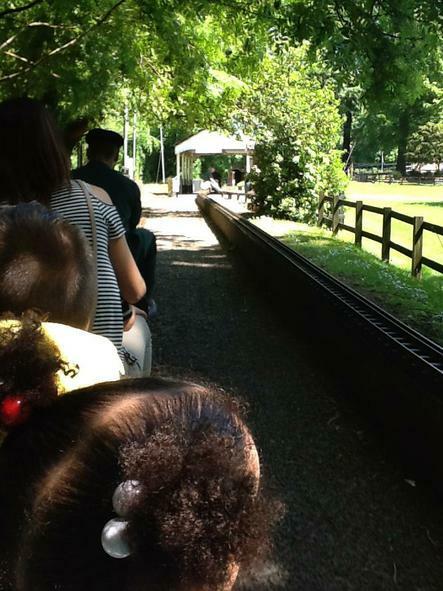 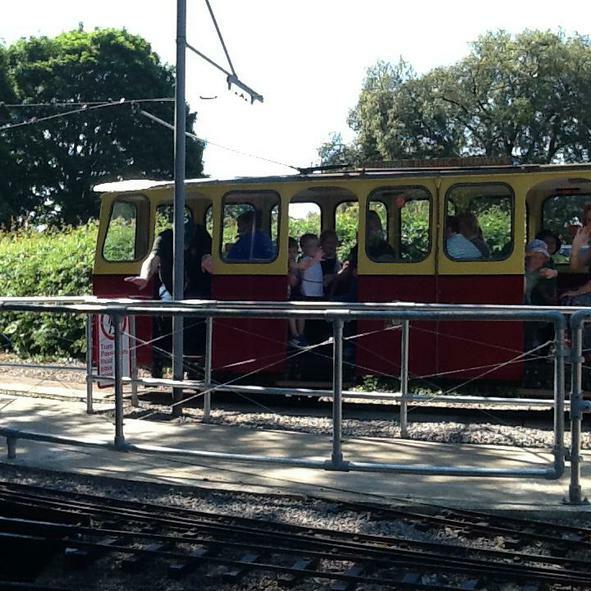 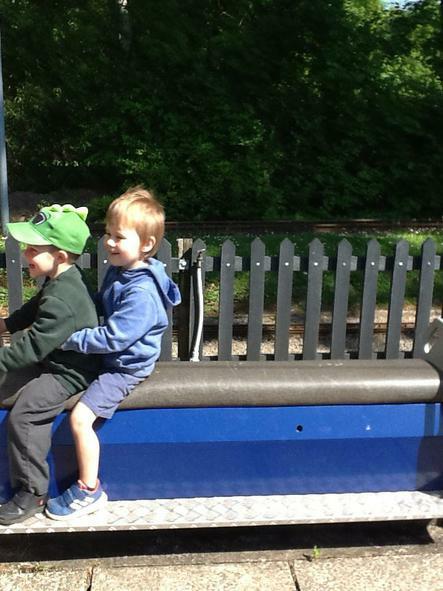 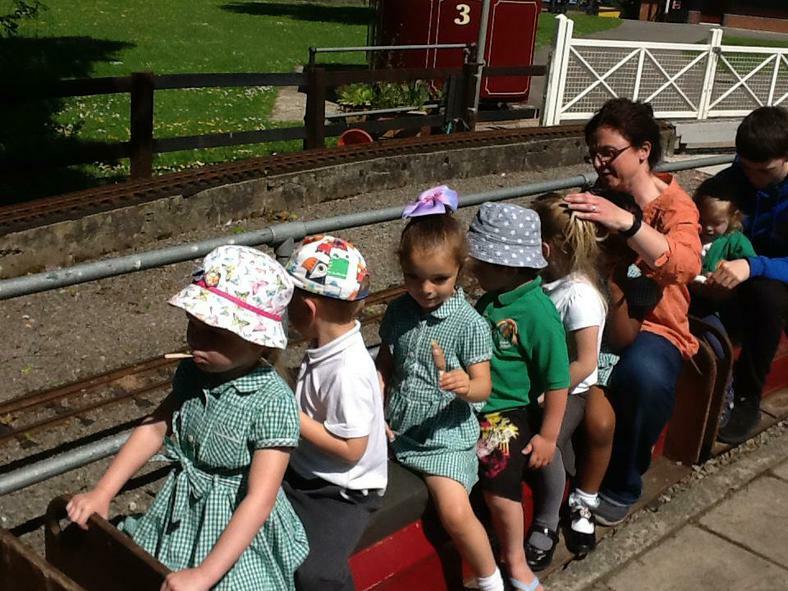 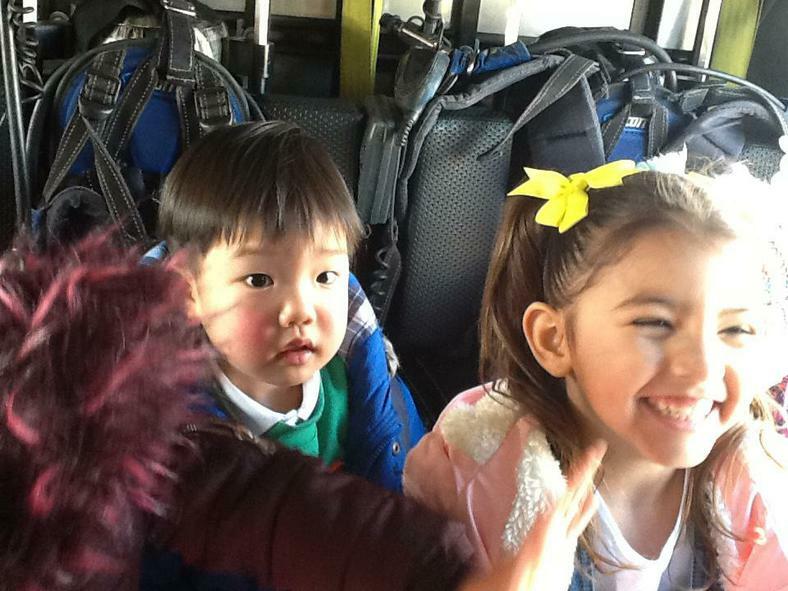 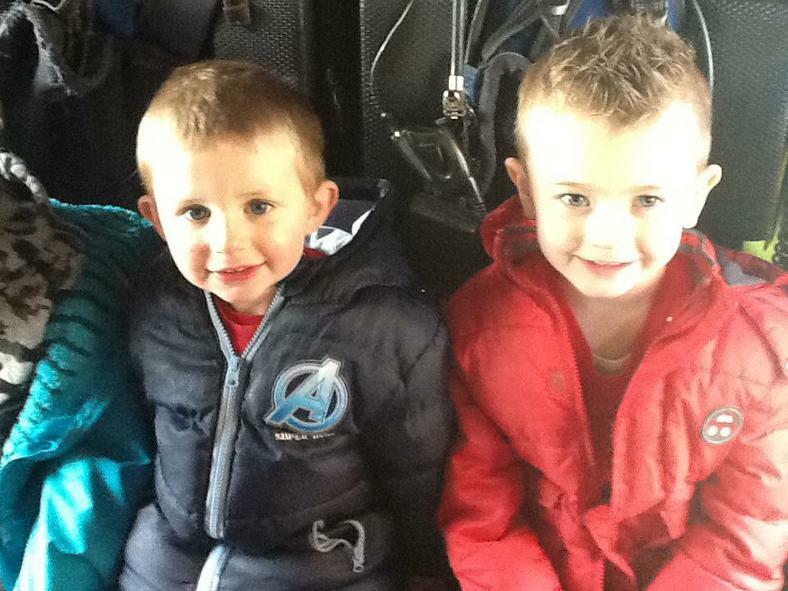 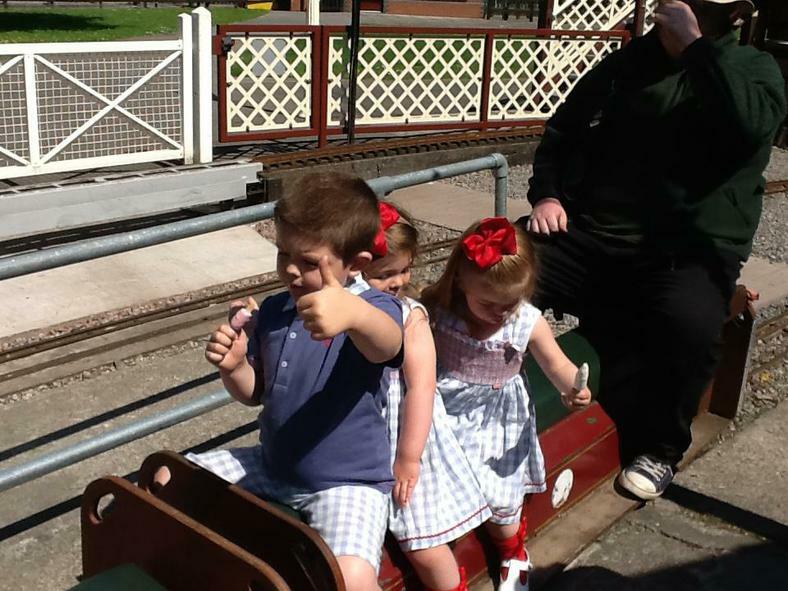 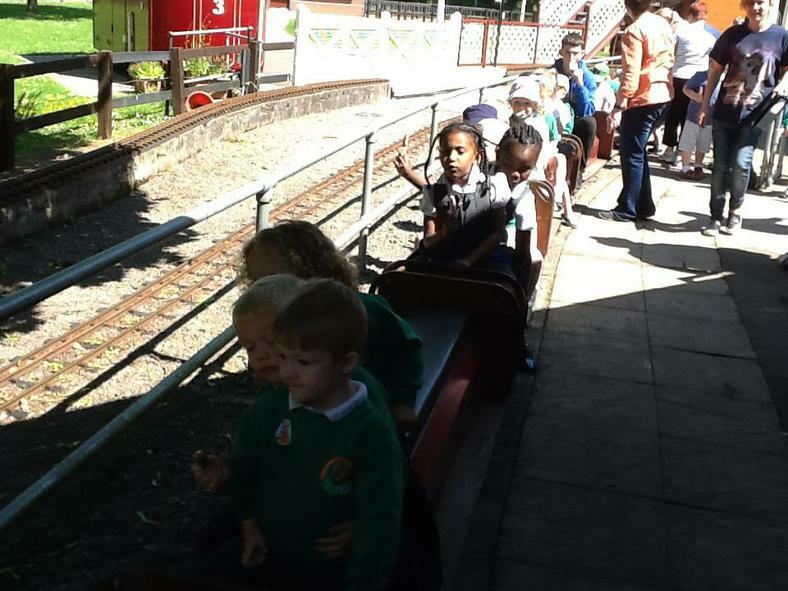 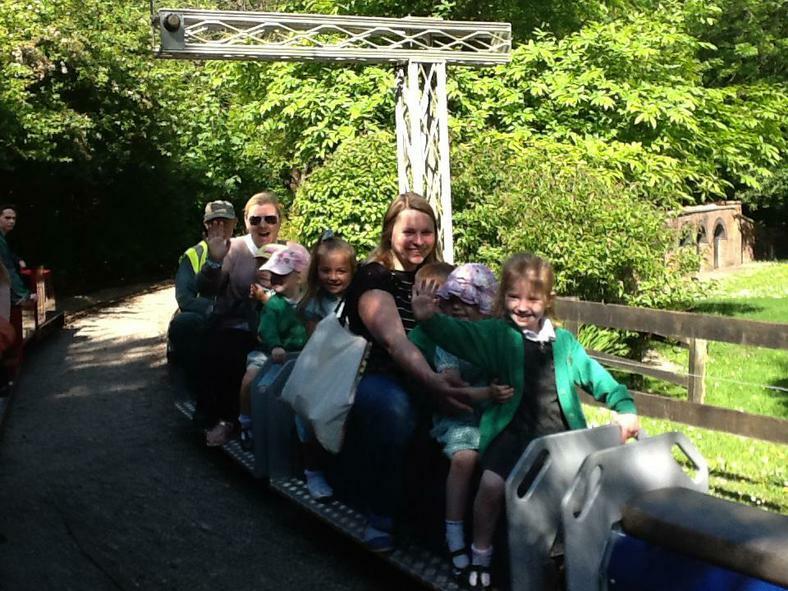 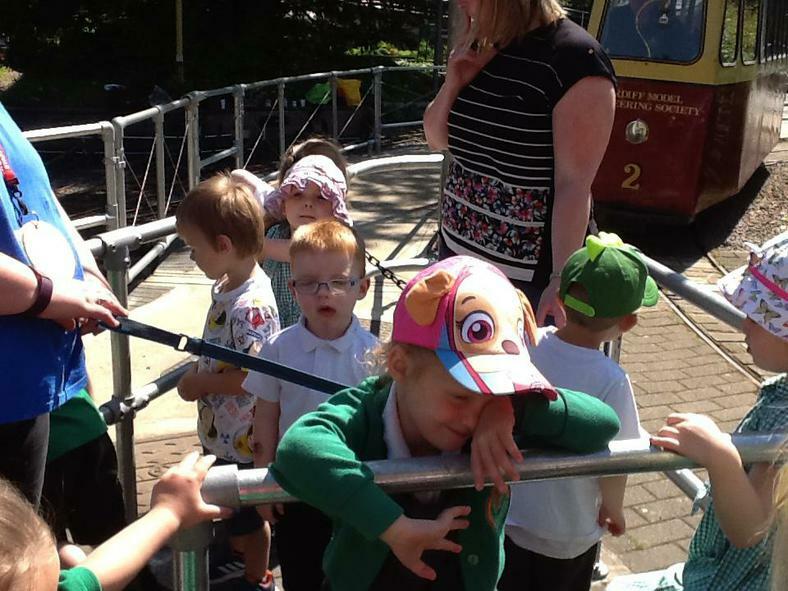 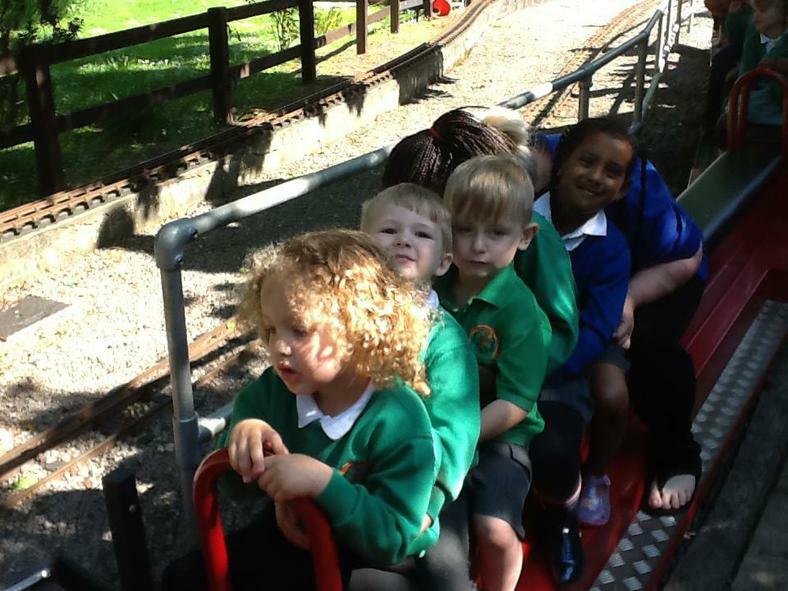 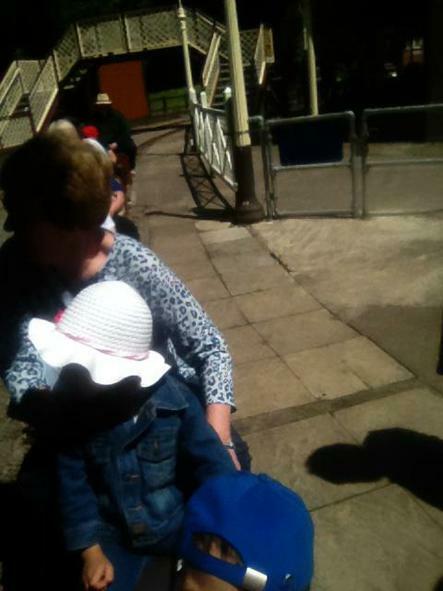 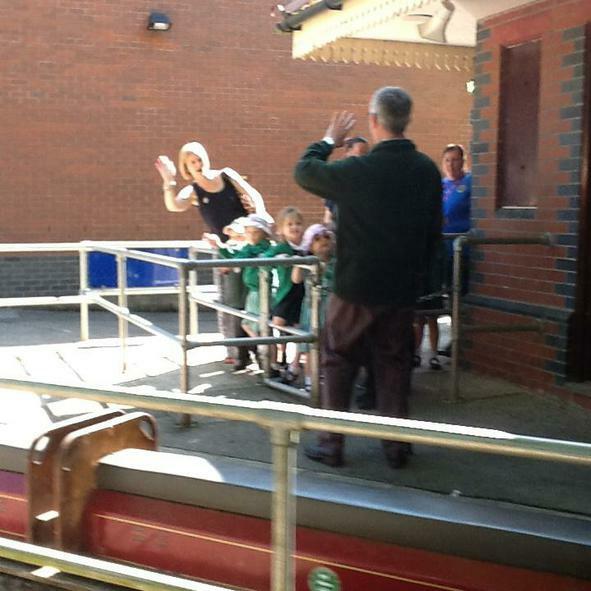 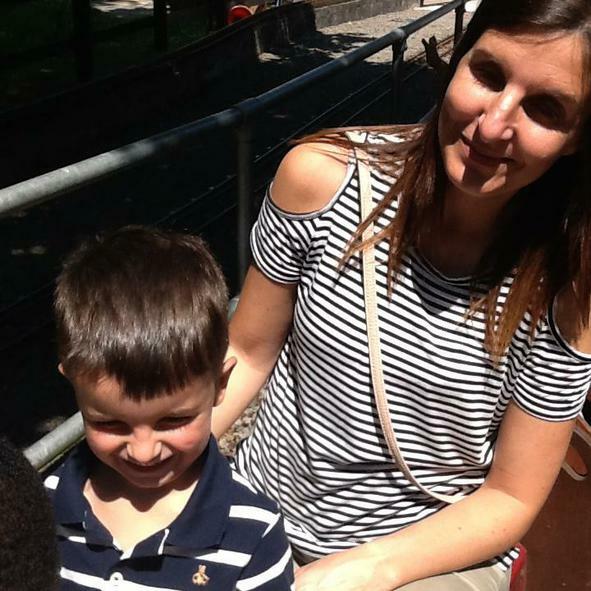 Weather was beautiful , the children loved riding on all the trains and the tram. 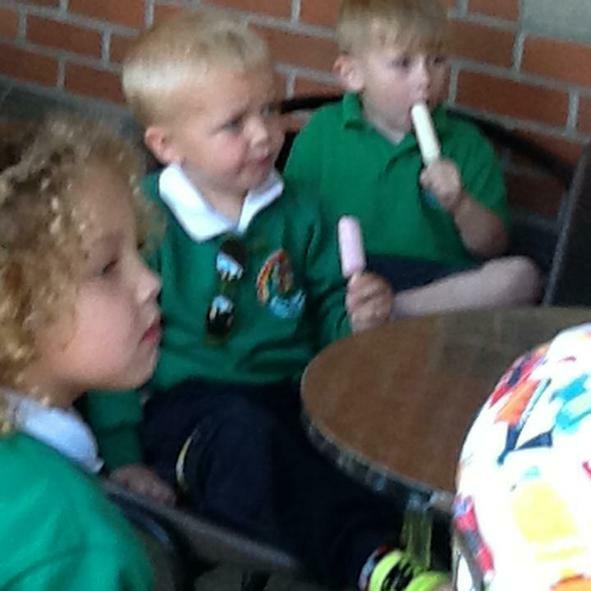 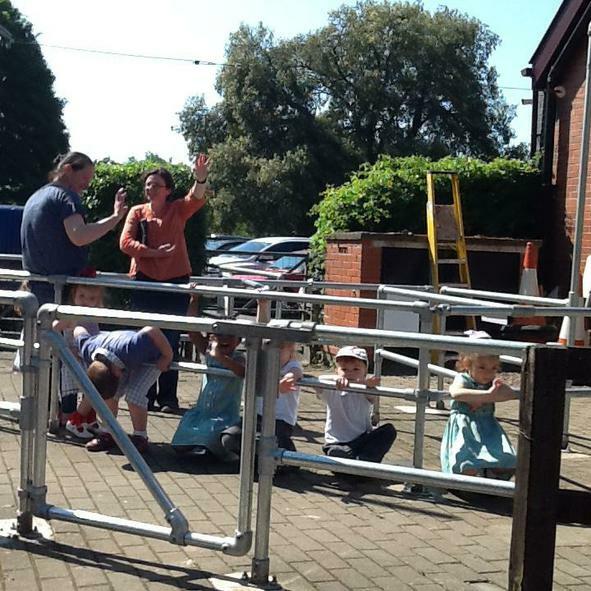 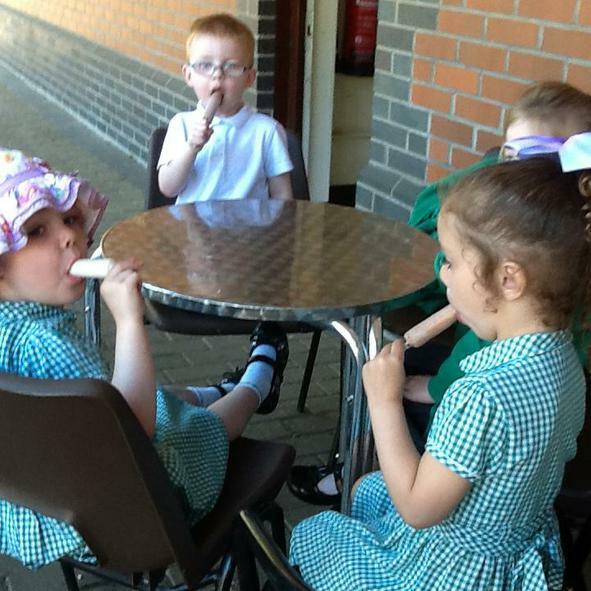 A huge thank you to all the men and woman from the Cardiff Model Engineering Society for being so welcoming and providing refreshments and delicious ice cream to all our children. 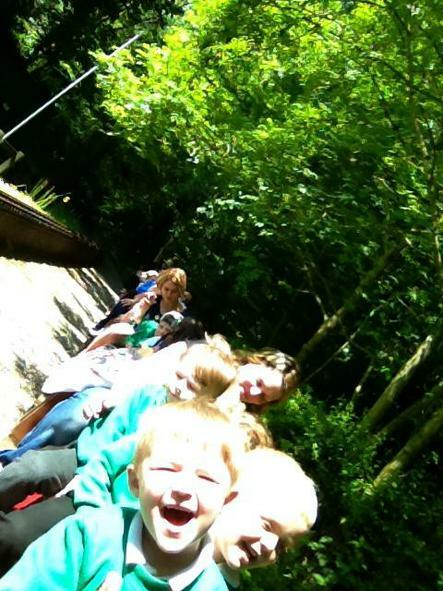 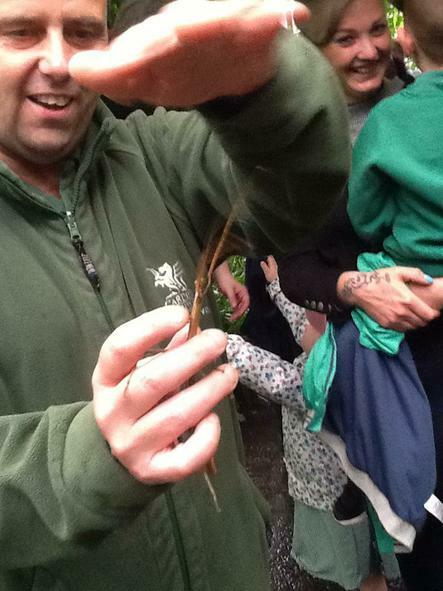 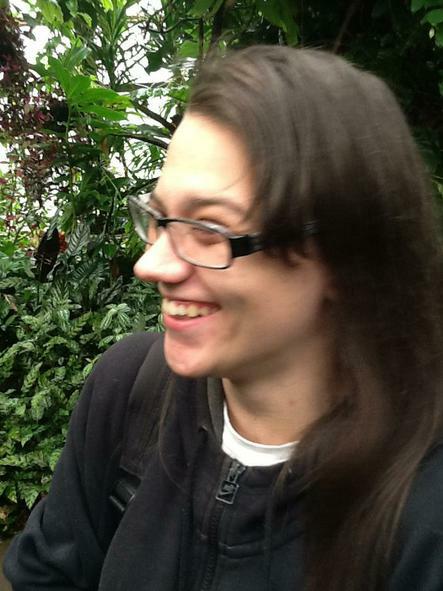 Huge smiles had by all. 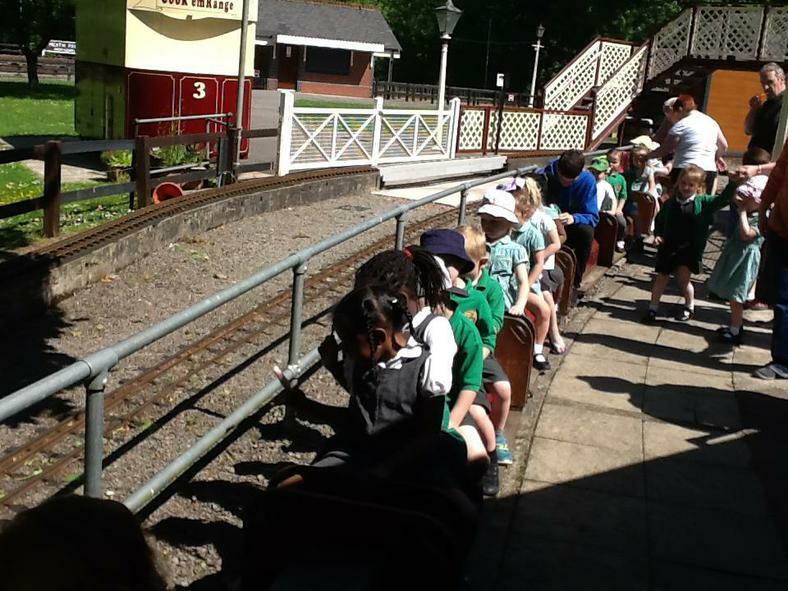 This week our focused texts are 'The Train Ride and 'Mr Gumpys Motor Car Outing'. 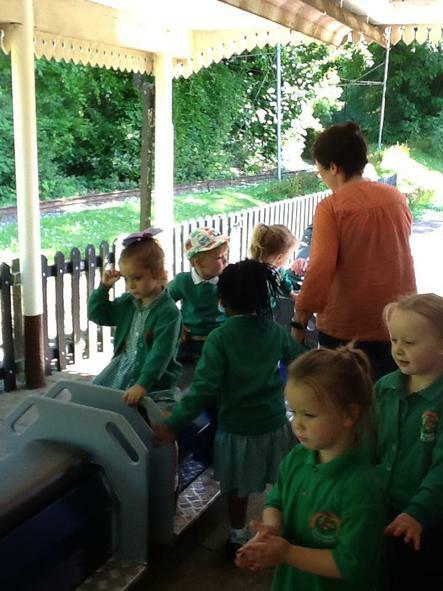 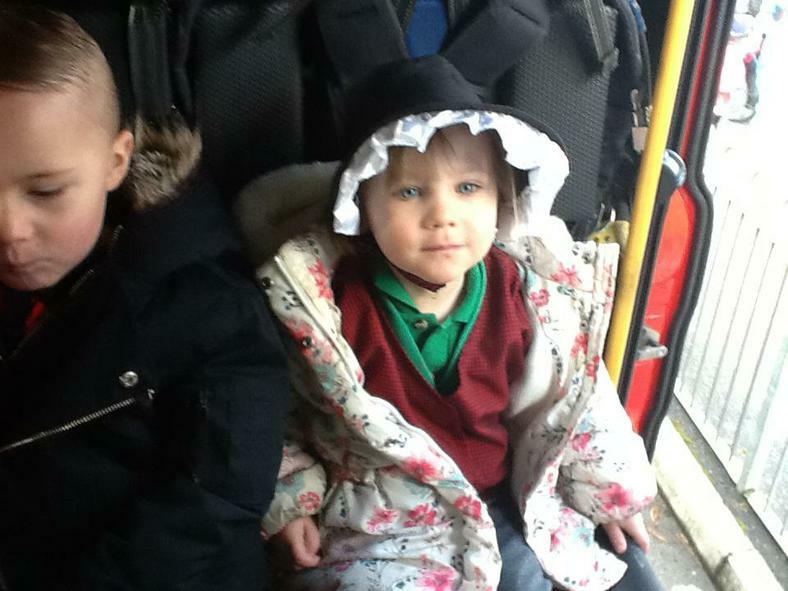 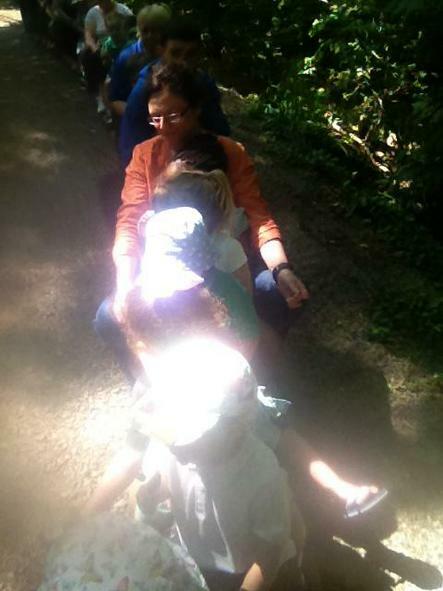 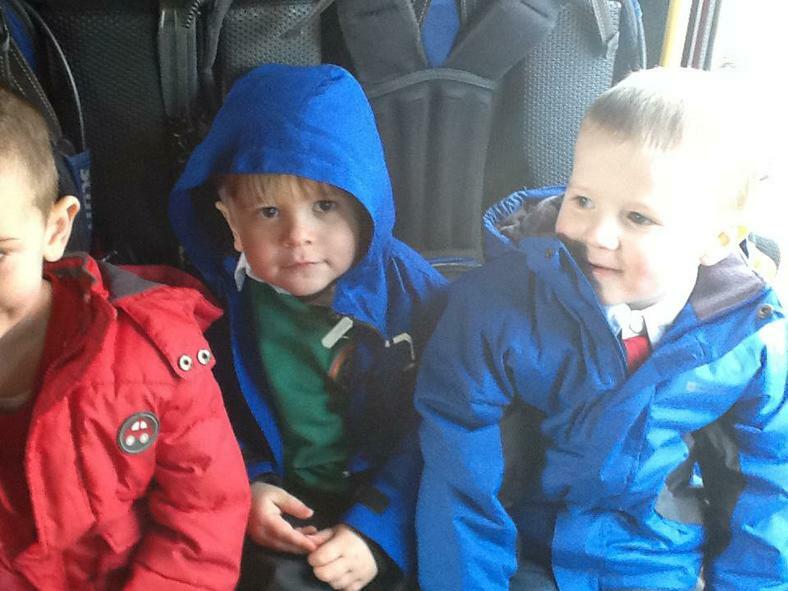 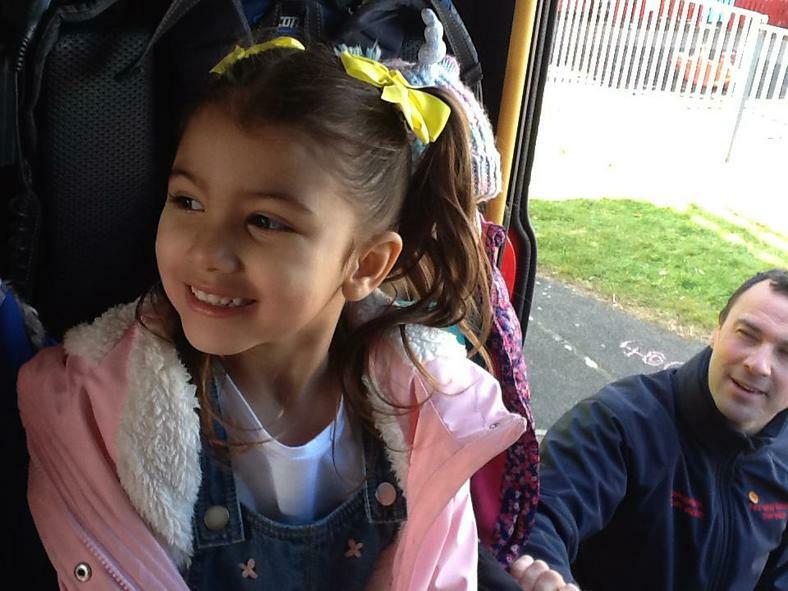 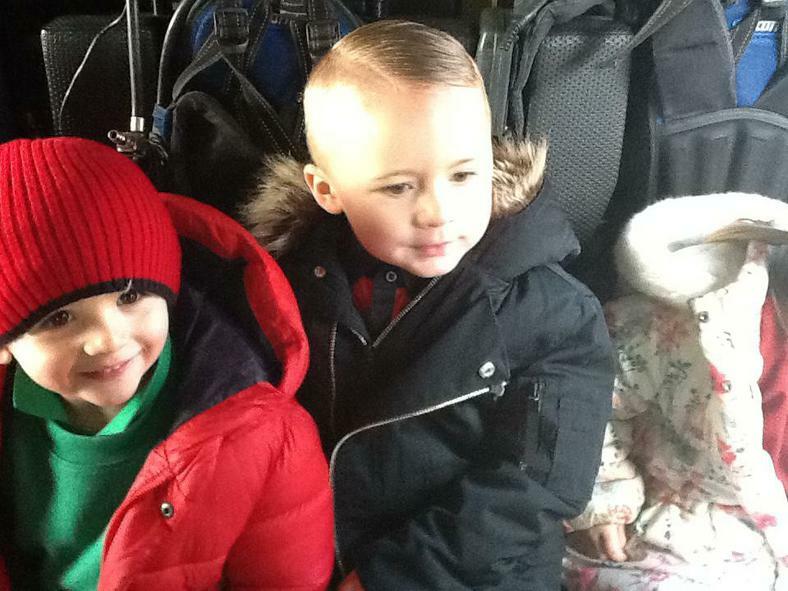 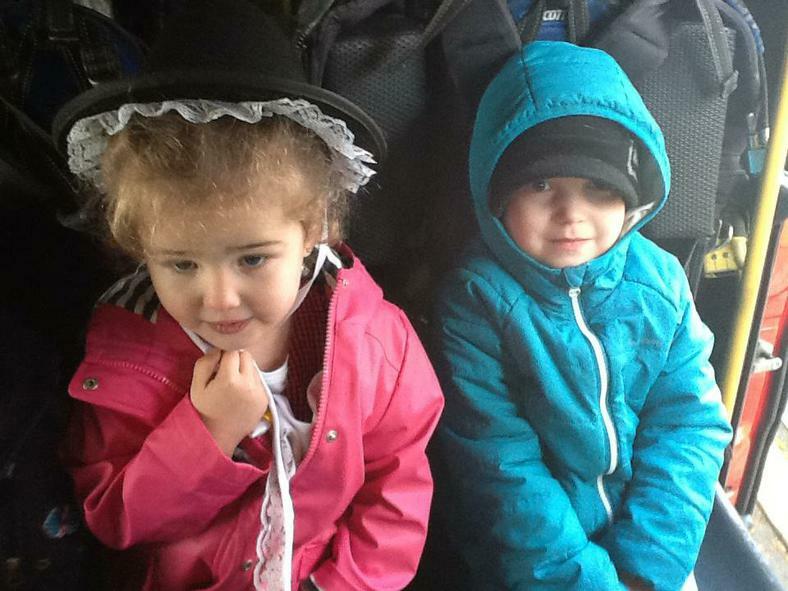 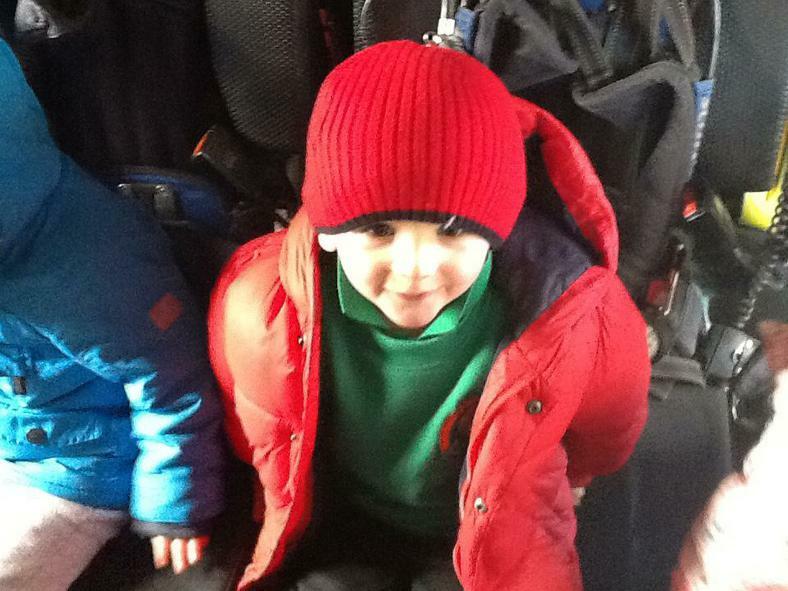 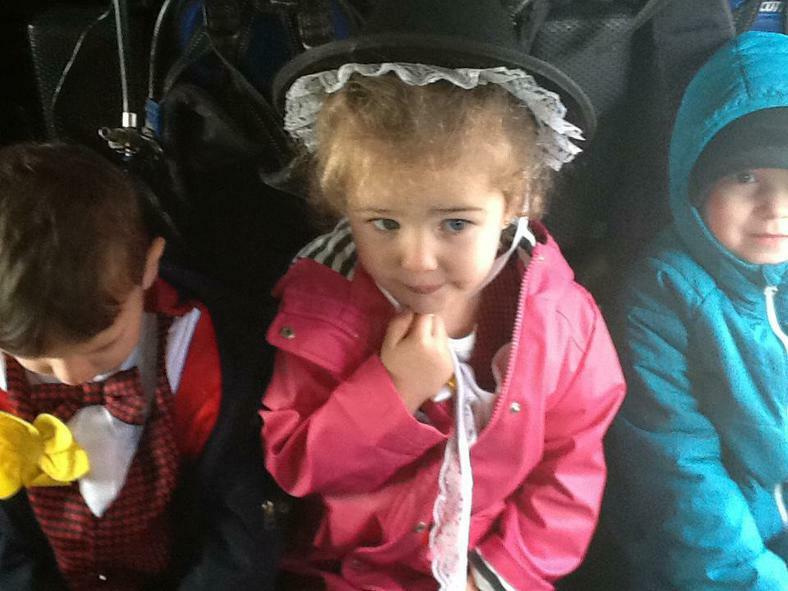 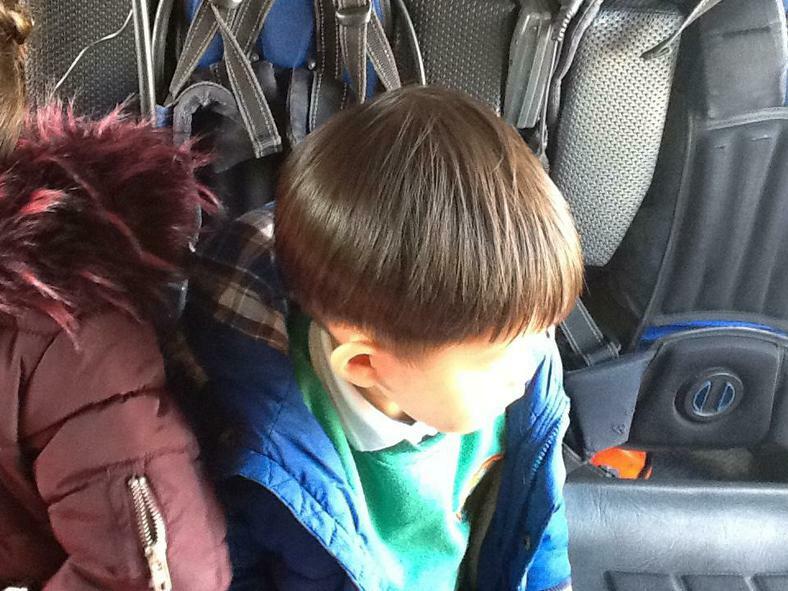 Our Nursery rhyme is 'Wheels on the bus', changing it slightly to the 'Wheels on the car'. 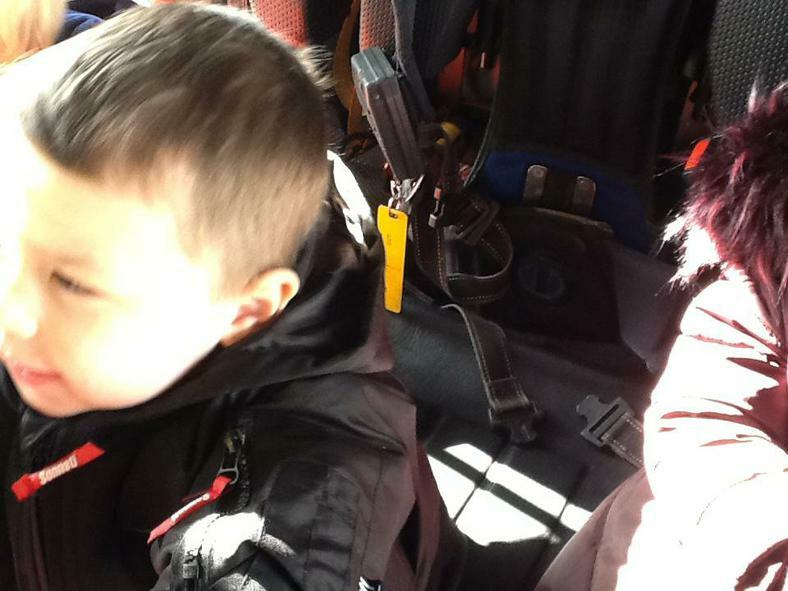 Through this version we hope to teach the children parts of the car that they may not be familiar with. 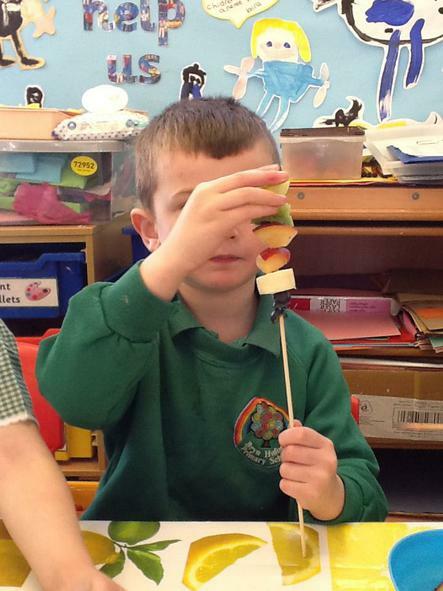 The children will be designing a car that they will make using junk material throughout the week. 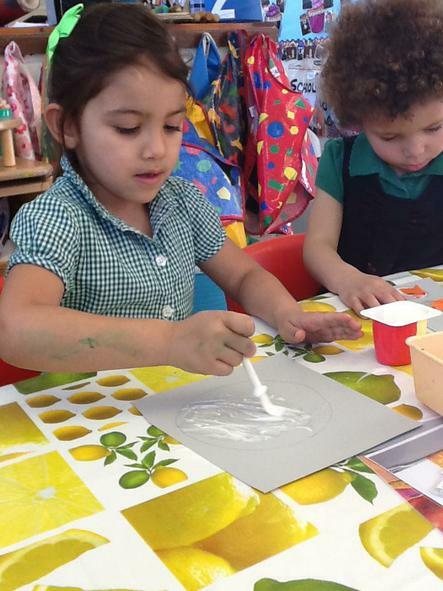 We will be using the pattern trundle wheels outside using paint to mark make. 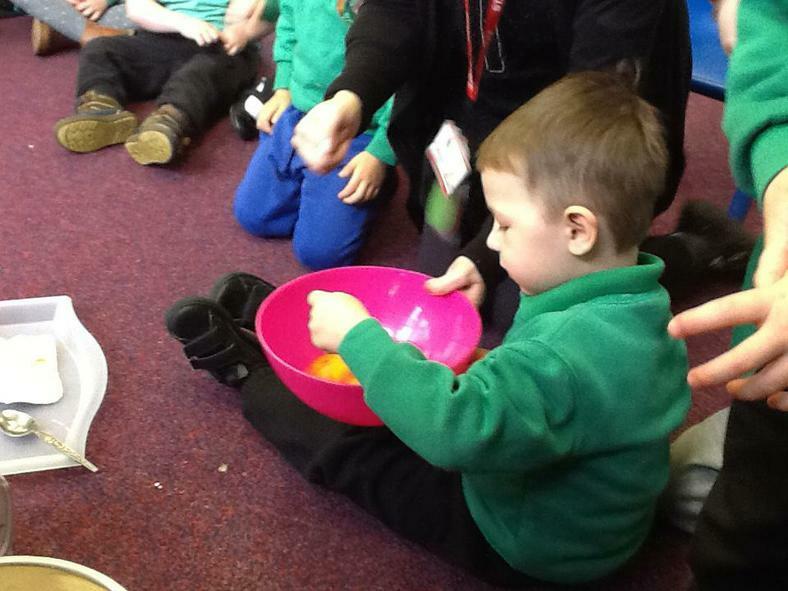 We will be sorting using cars, we will be sorting by size and colour. 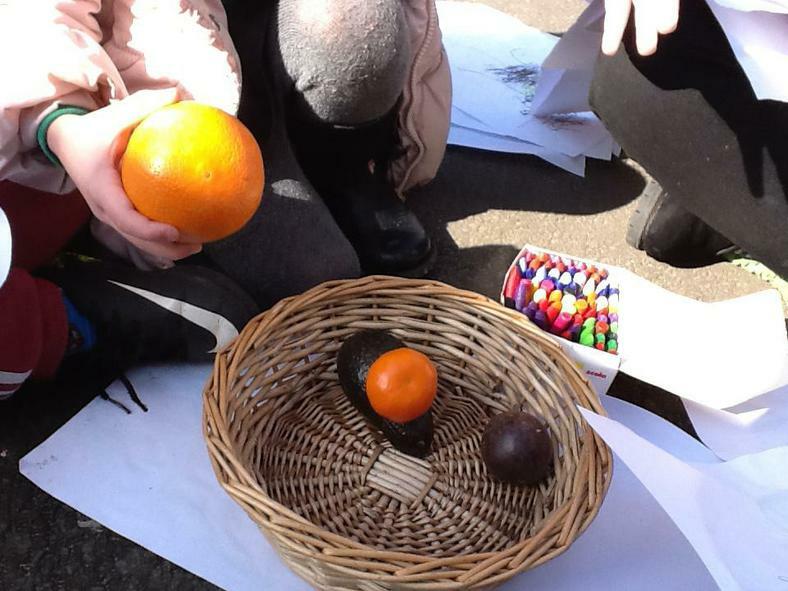 We will be creating a new class graph to replace 'Our favourite fruit' one. 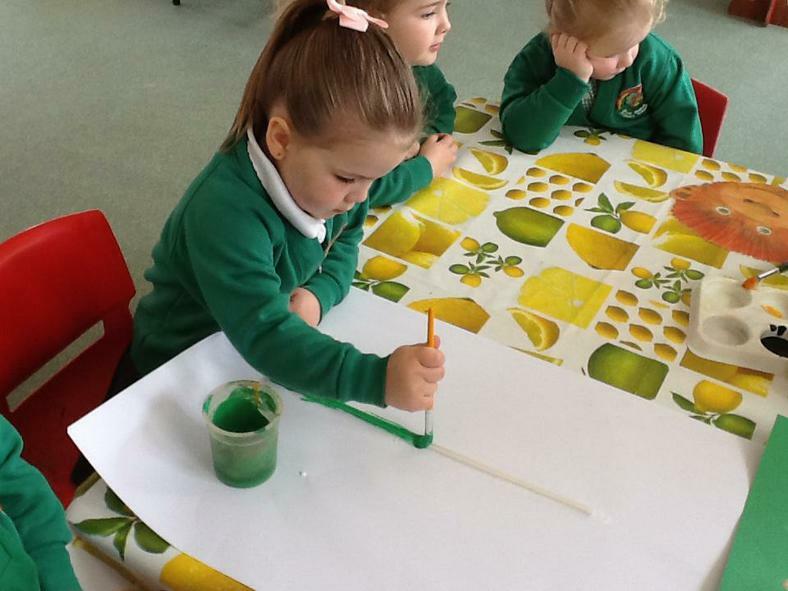 The new graph will be of cars, scooters and bikes and we will be recording this data and looking at the most and least popular colours and who has a bike, scooter and car. 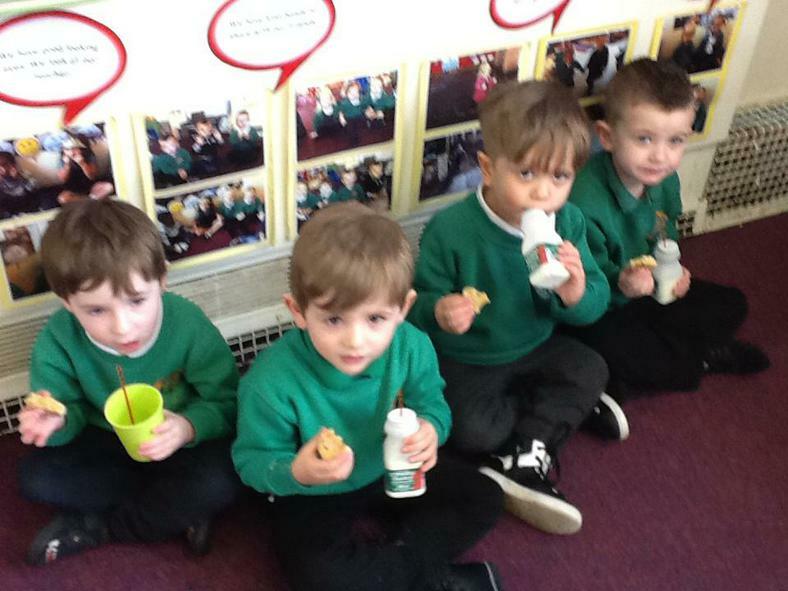 Please remember snack money is £1 each week. 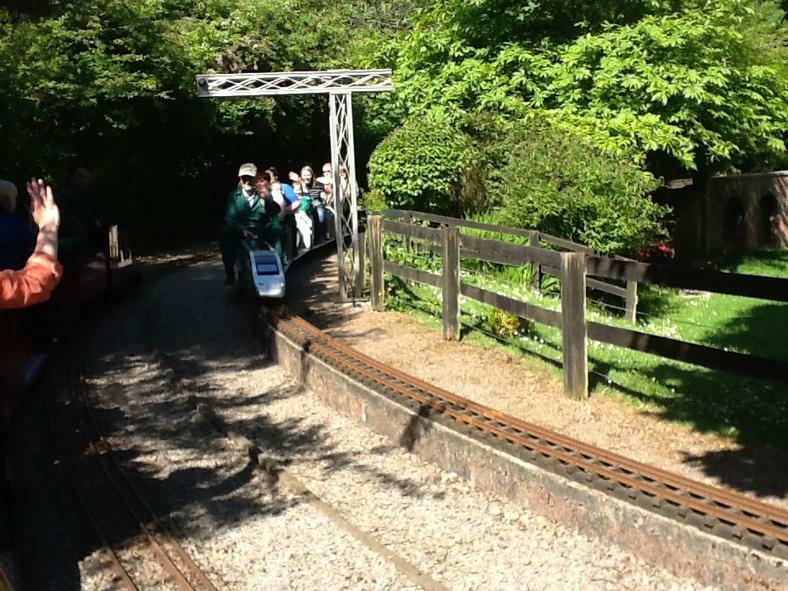 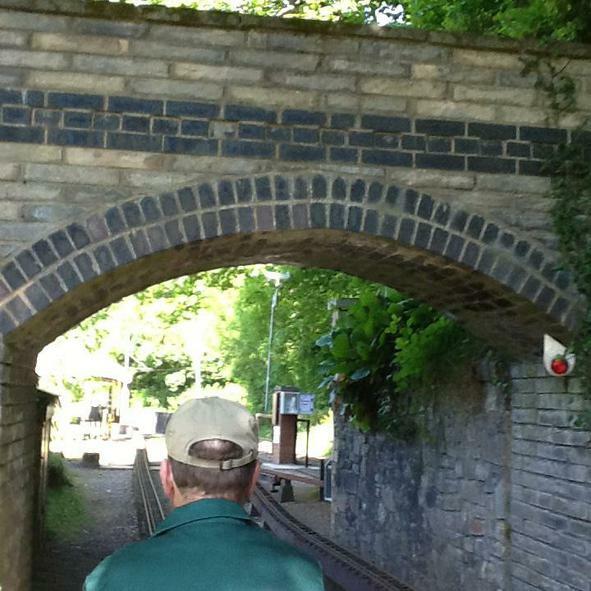 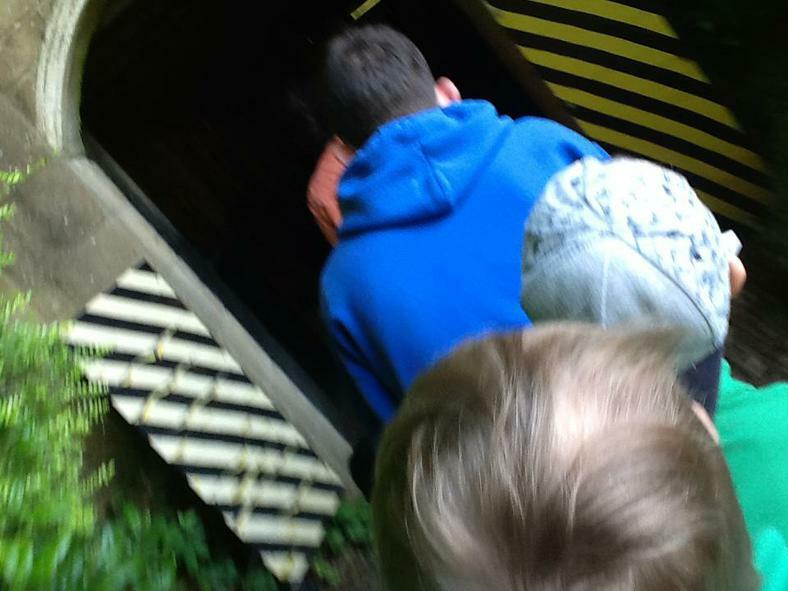 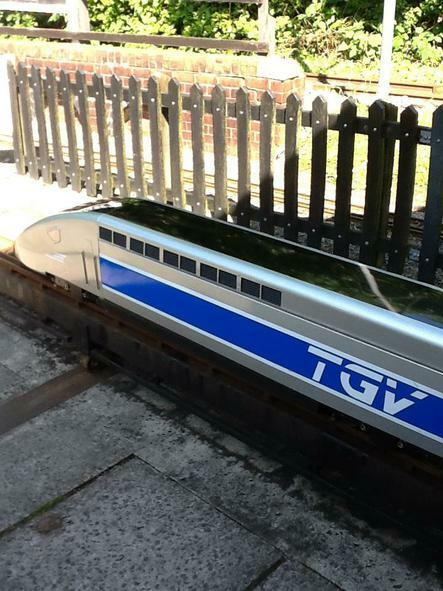 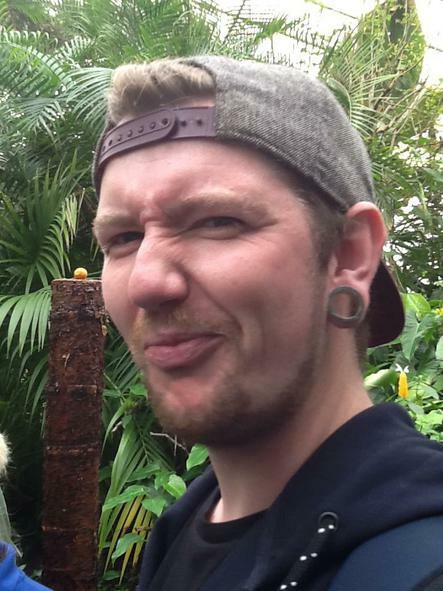 Also for those who haven't paid and returned consent forms for the 'Heath Miniature Railway' trip please see me this week. 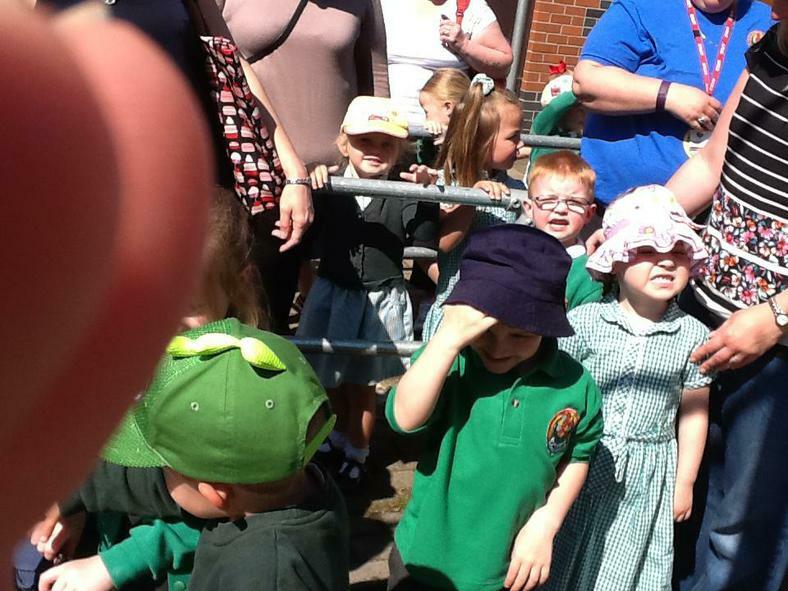 Also note the change of Nursery times for that day only. 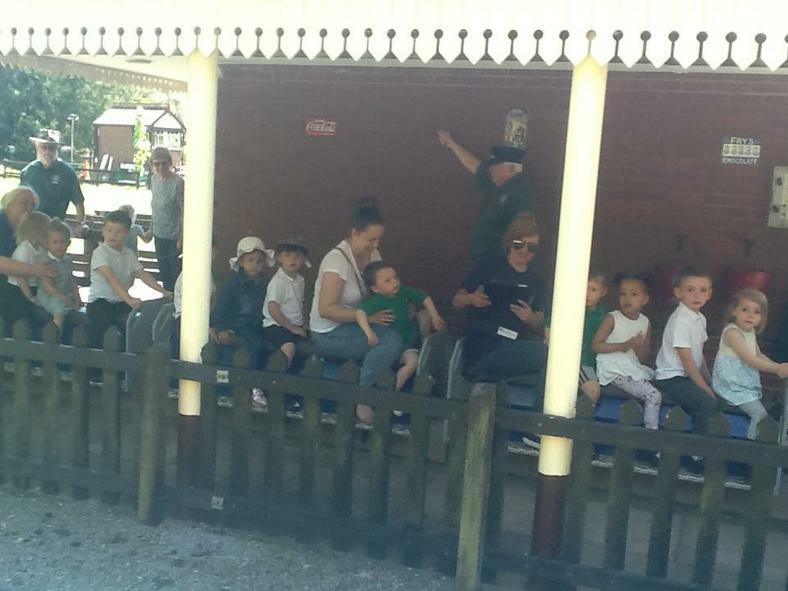 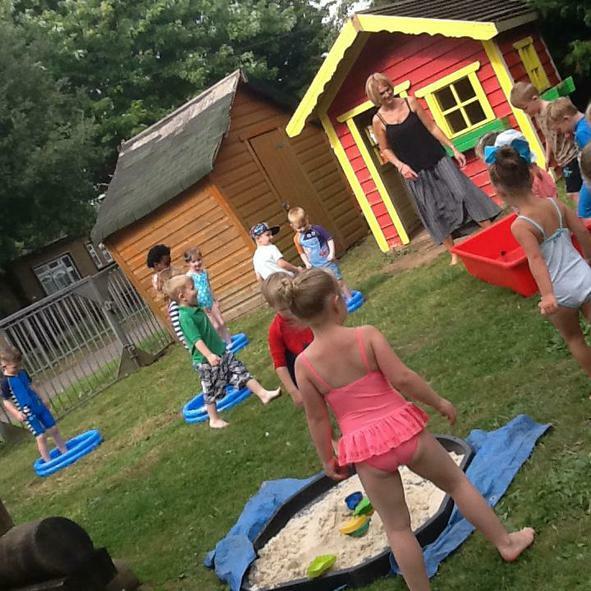 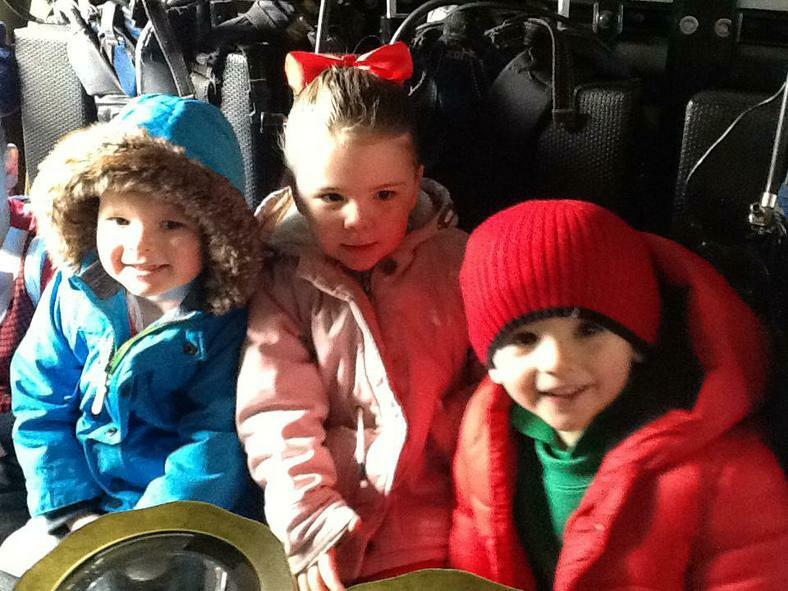 What a wonderful trip we all had yesterday exploring Cefn Mably farm , children had so much fun feeding the animals and playing in the soft play area . 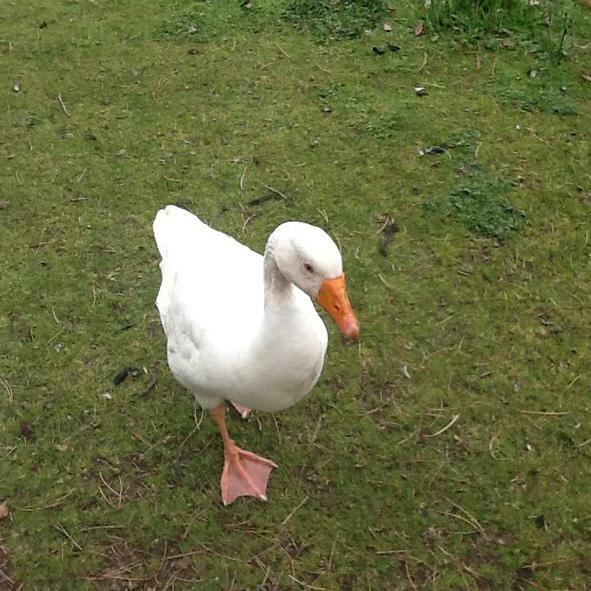 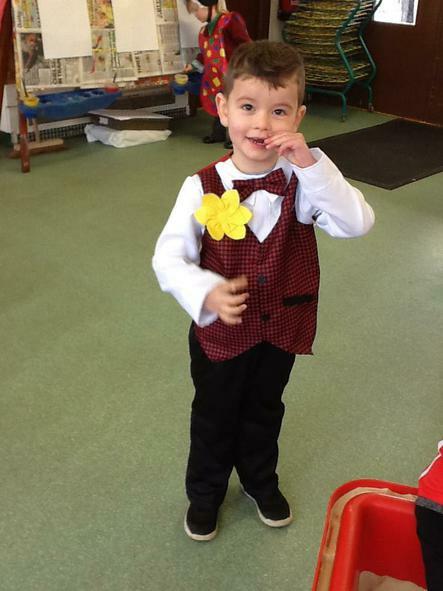 Welcome back, I hope you all had a lovely Easter break. 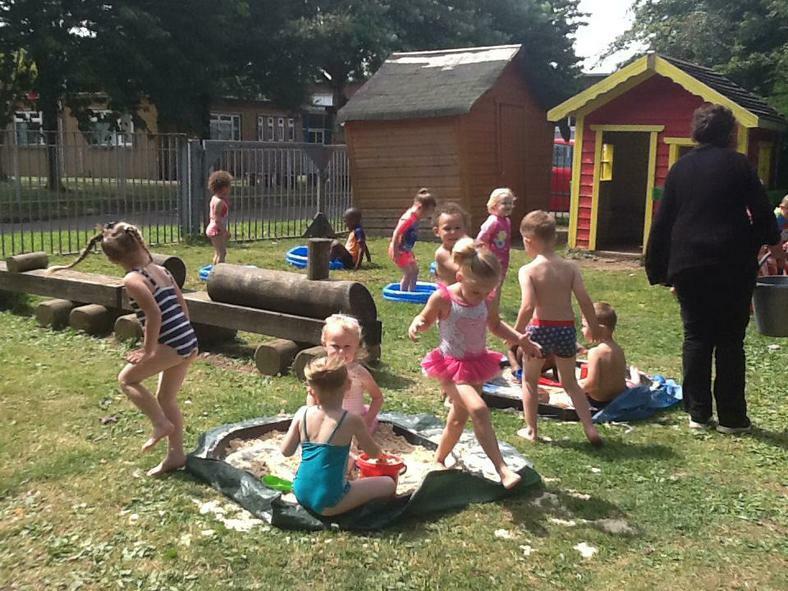 This half term is only 5 weeks and what a busy 5 weeks we will have. 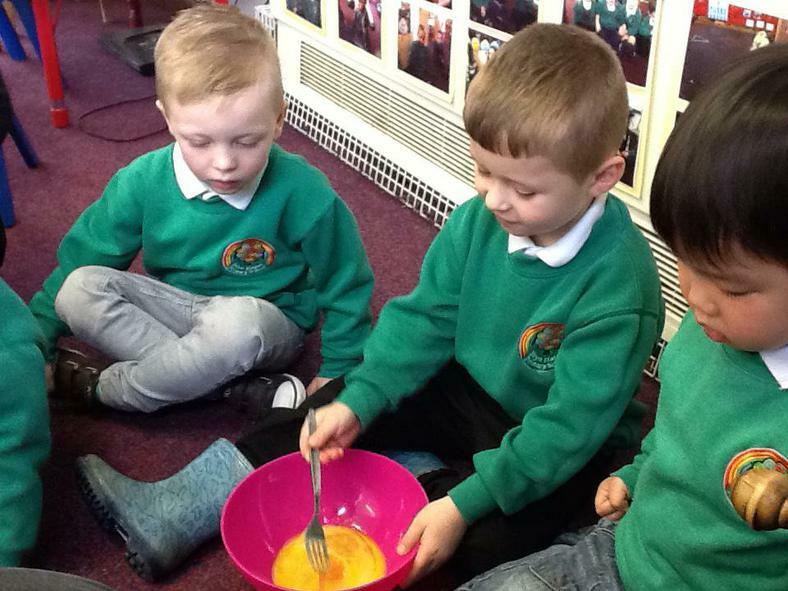 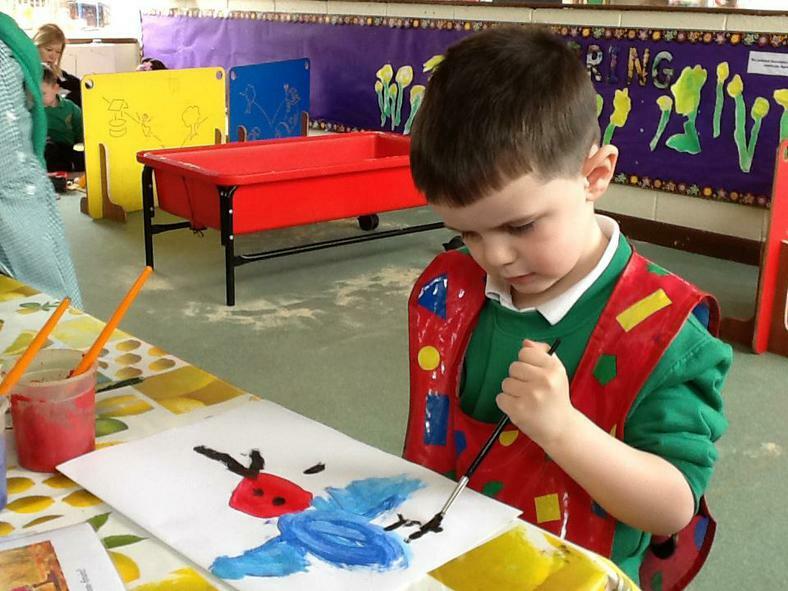 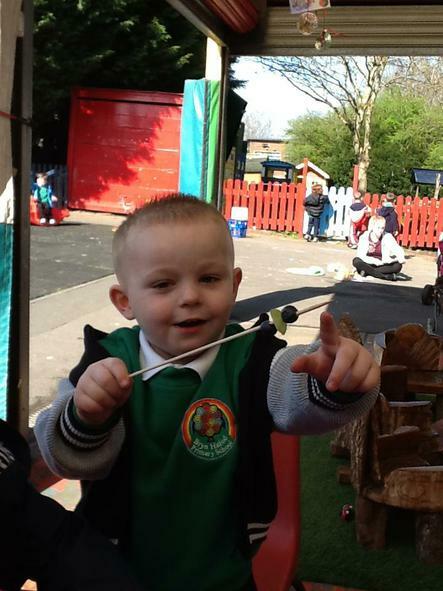 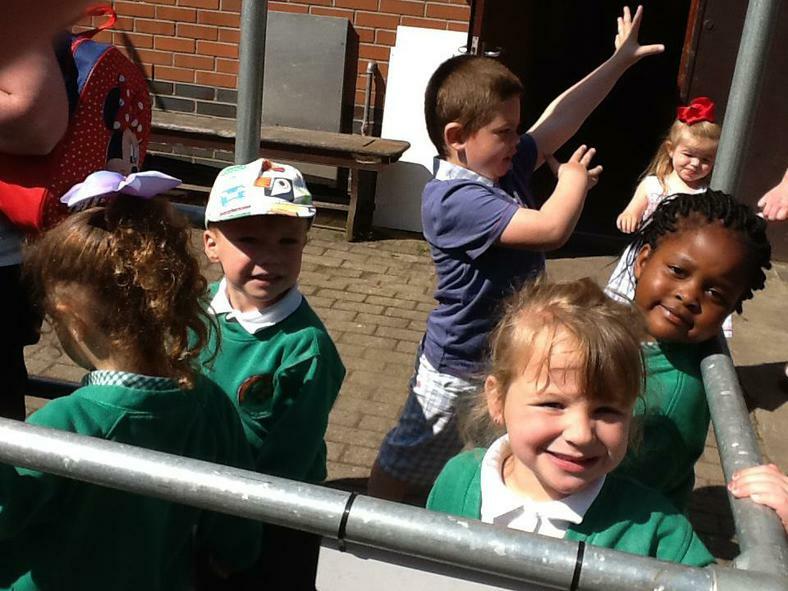 We have our new Easter starters this week and next week, please make the parents and children feel as welcome as you do and show them what a fantastic Nursery we are. 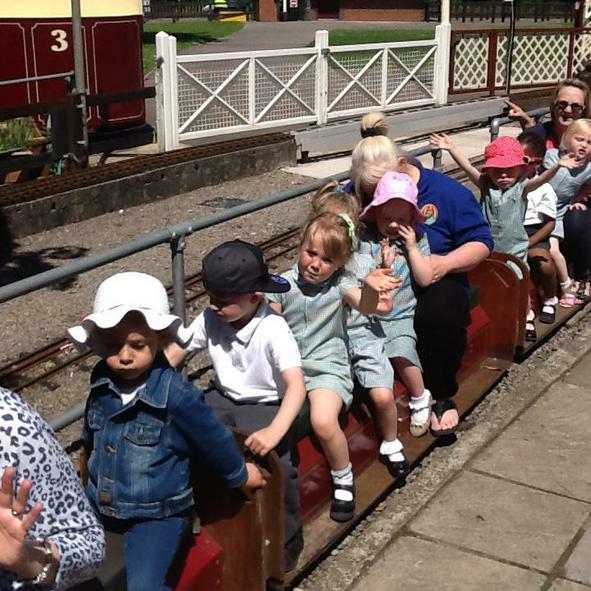 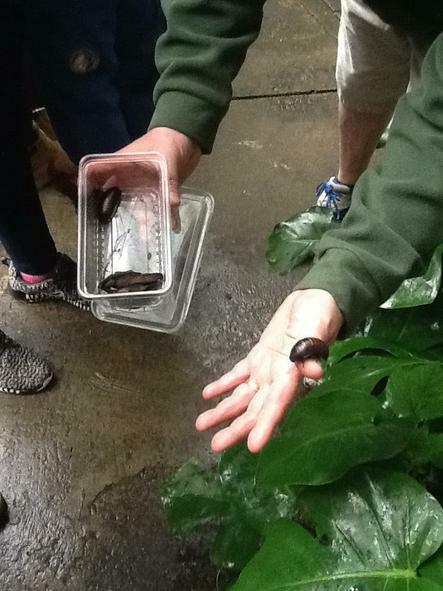 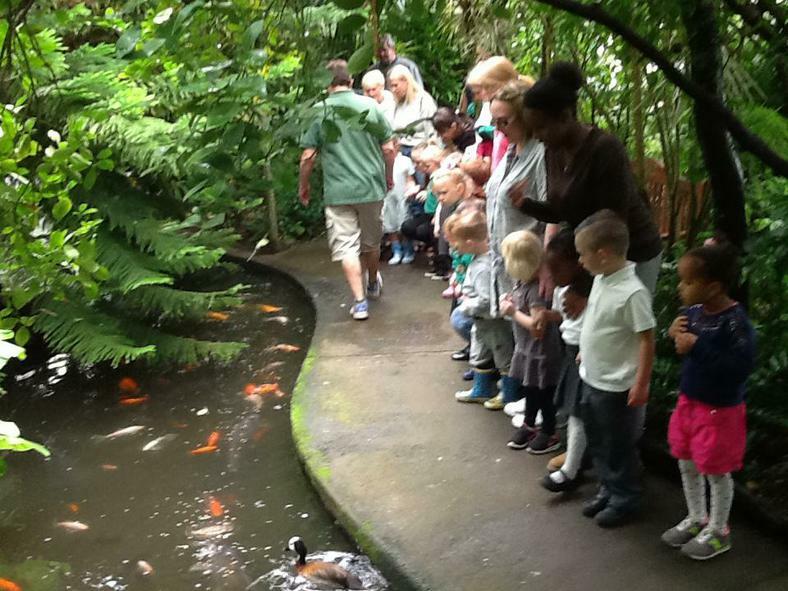 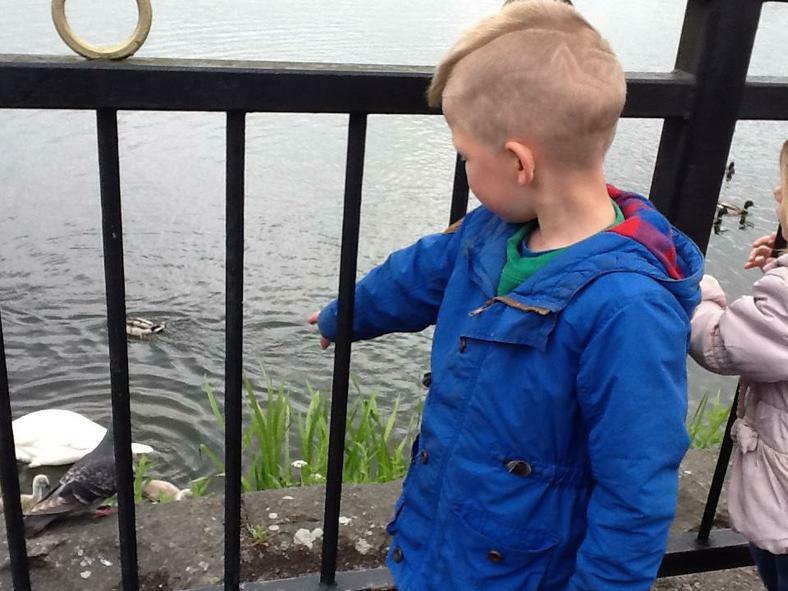 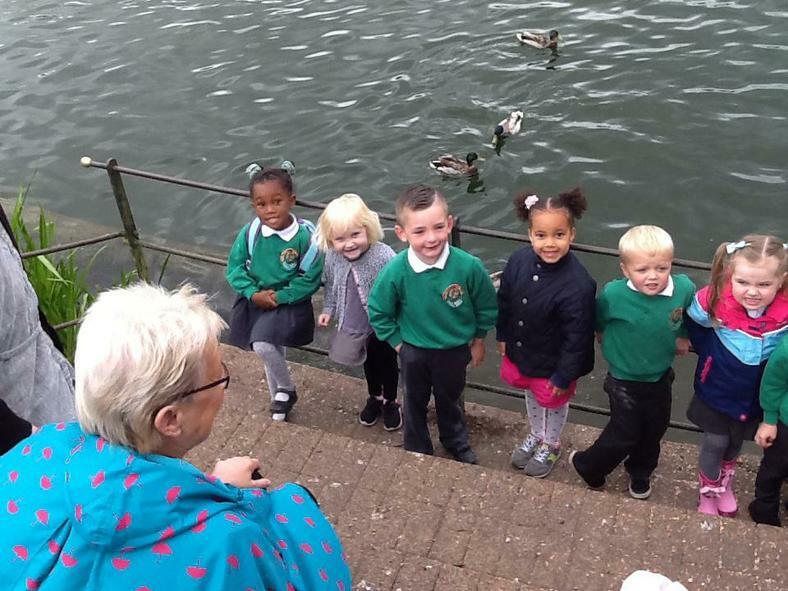 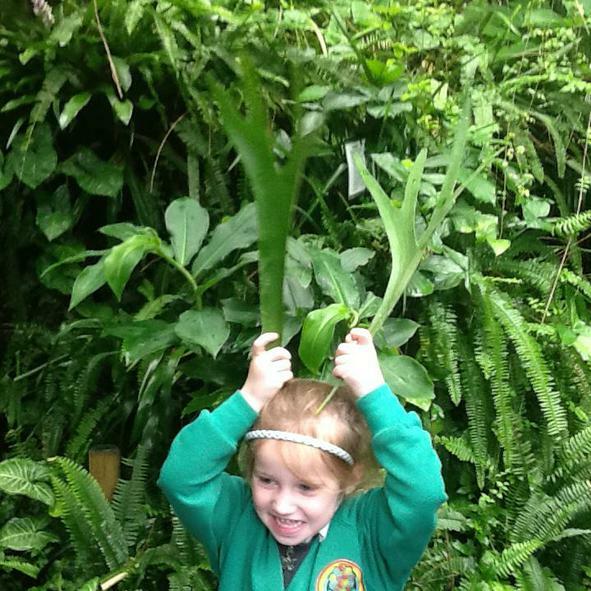 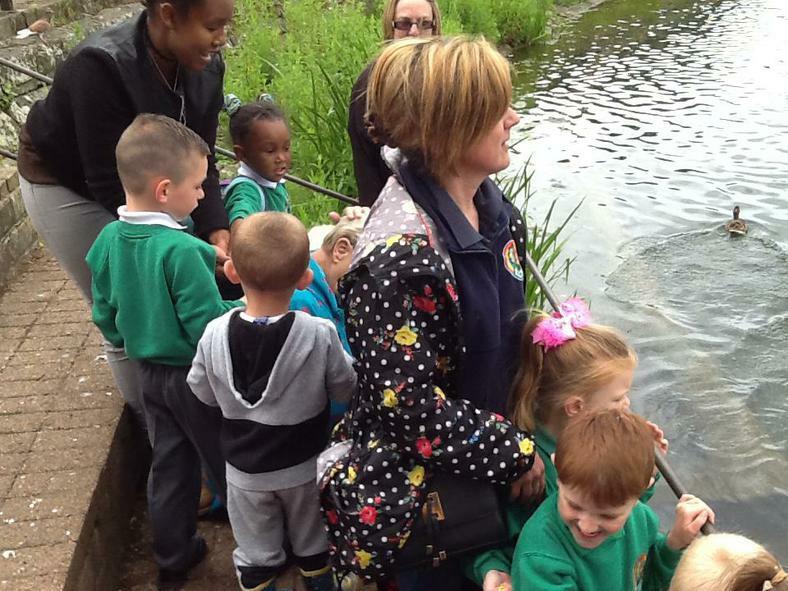 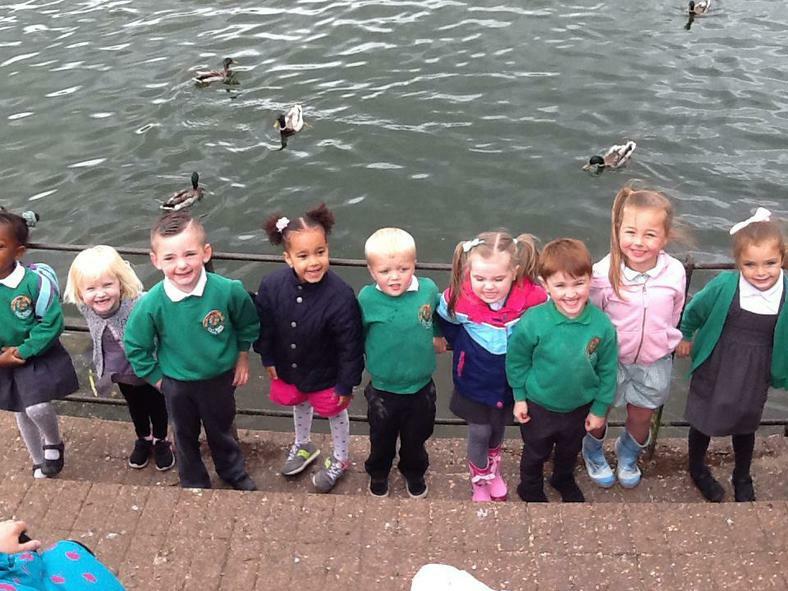 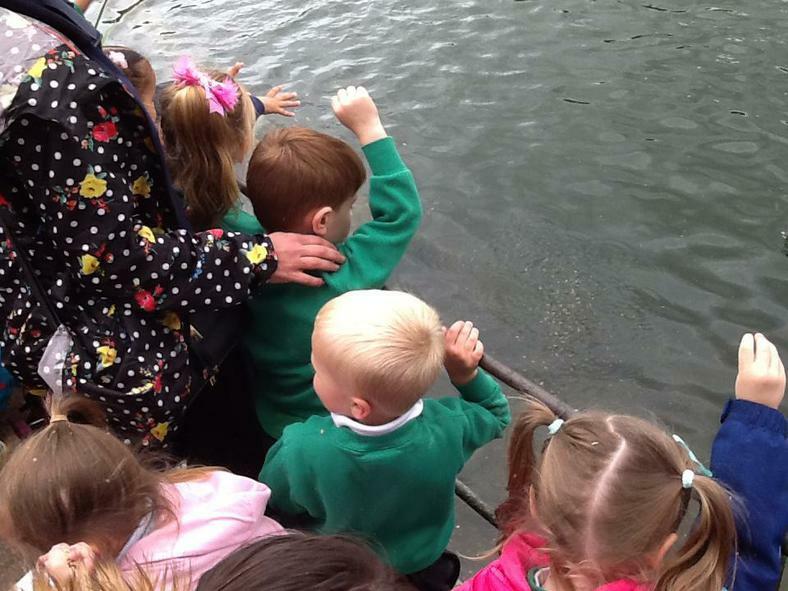 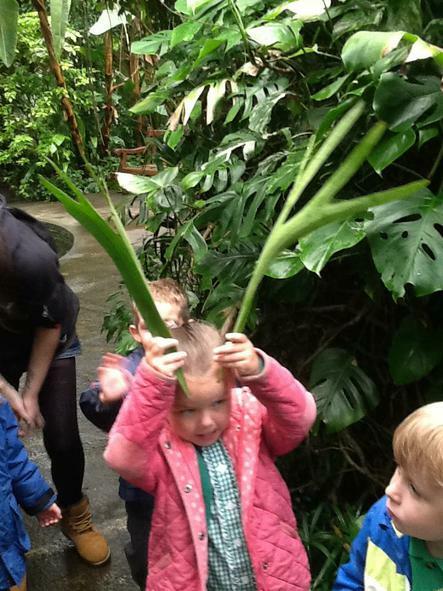 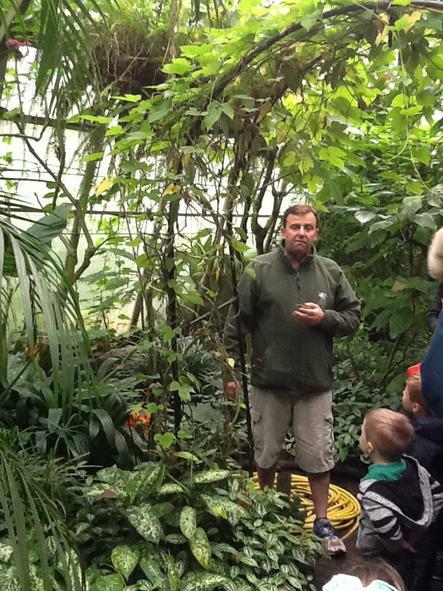 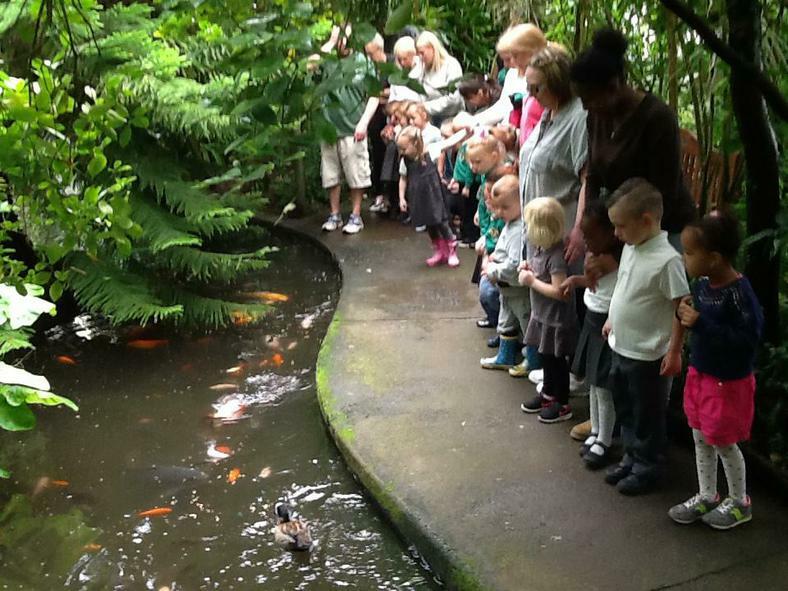 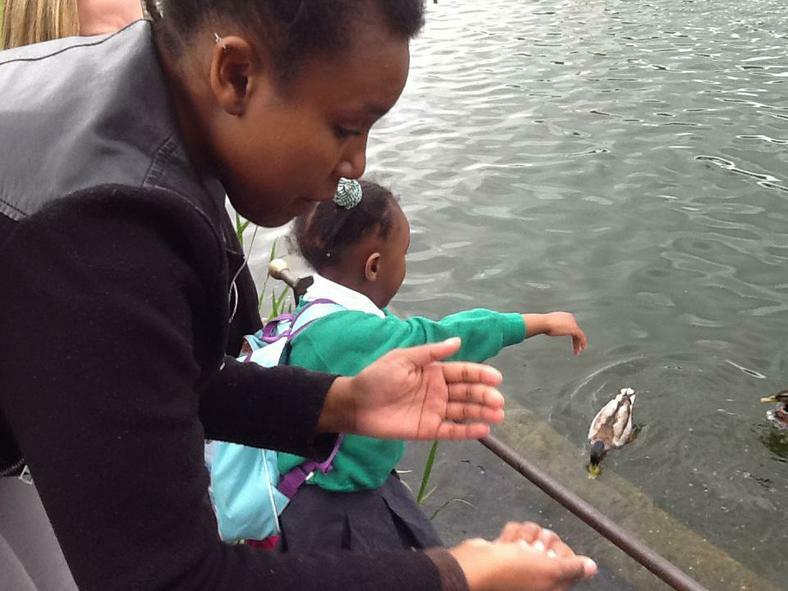 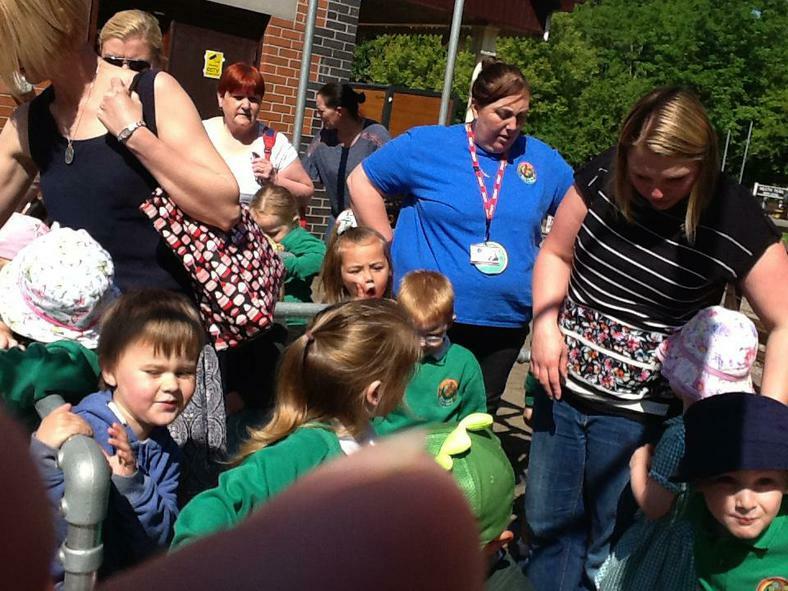 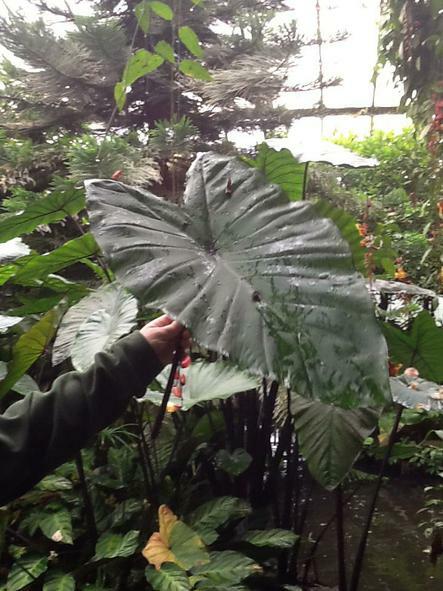 We have our Nursery trip next Thursday 4th May, Please see me if there are any outstanding money or consent forms. 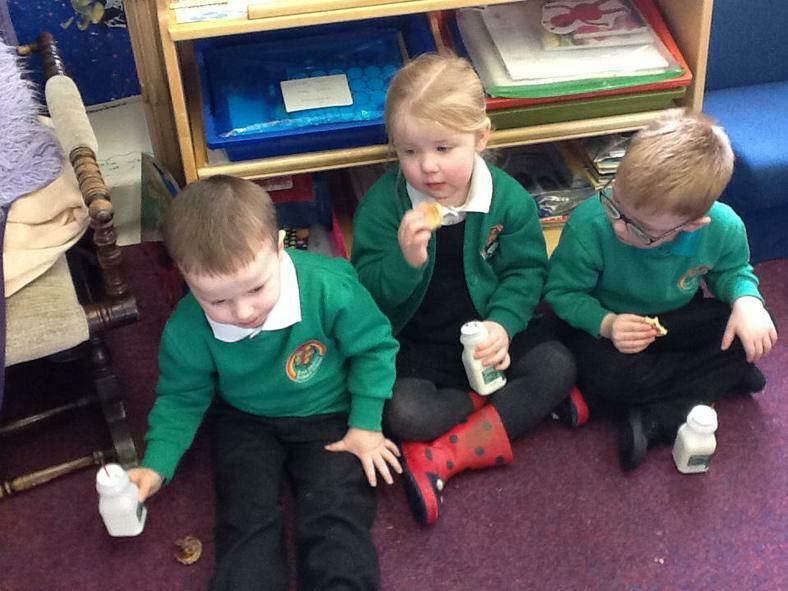 Remember snack money is £1 a week and everyone needs to pay. 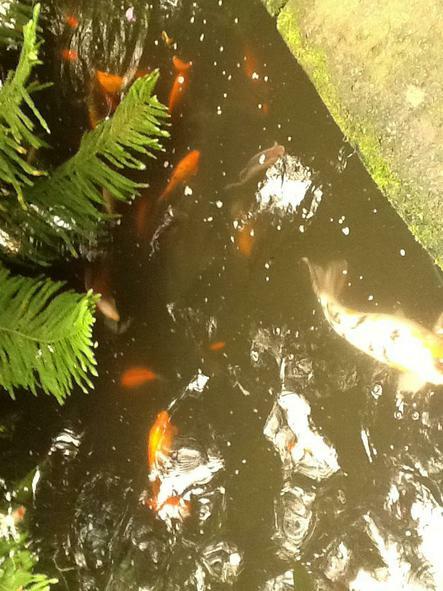 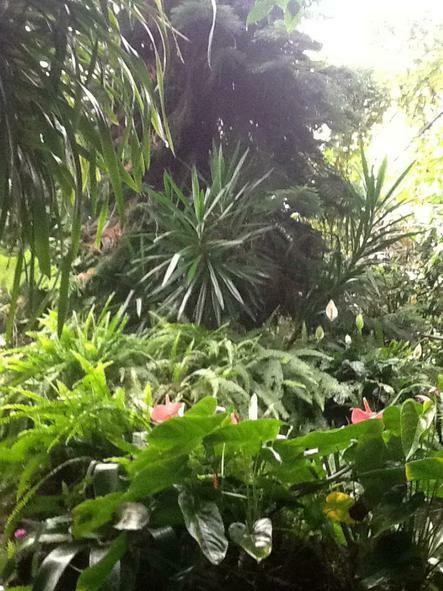 We have lots of money outstanding, again please pay as soon as possible. 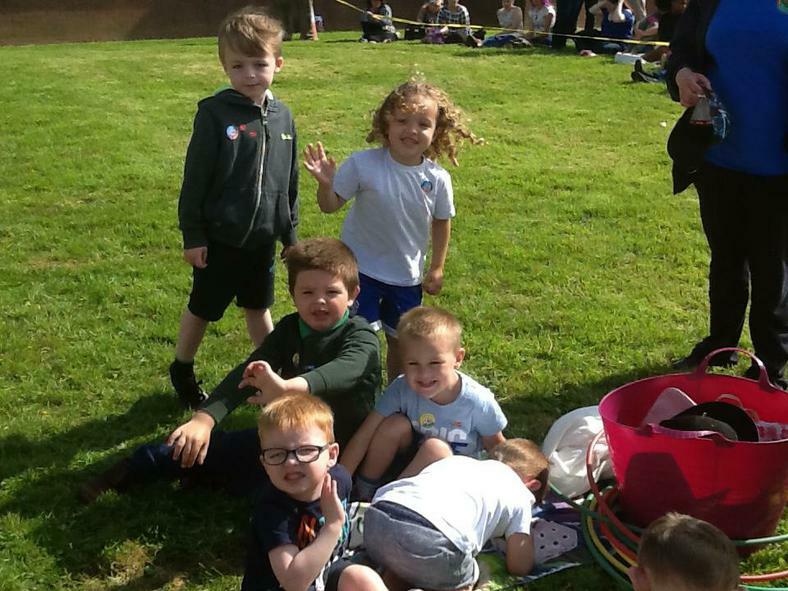 I have attached our Overview for this half term and this will give you an insight into what we will be up to over the next 5 weeks. 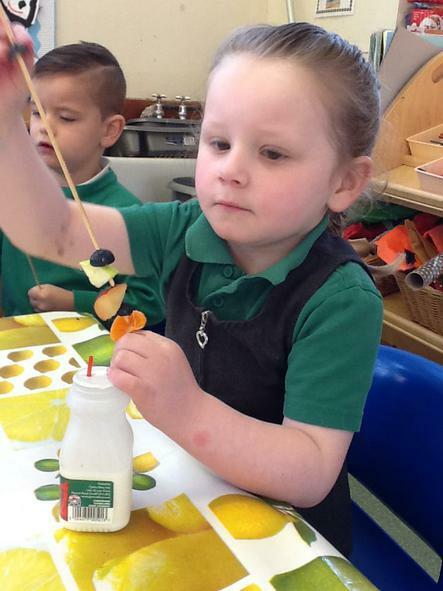 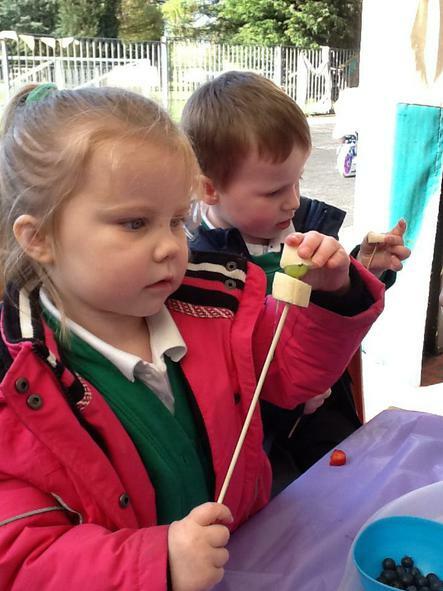 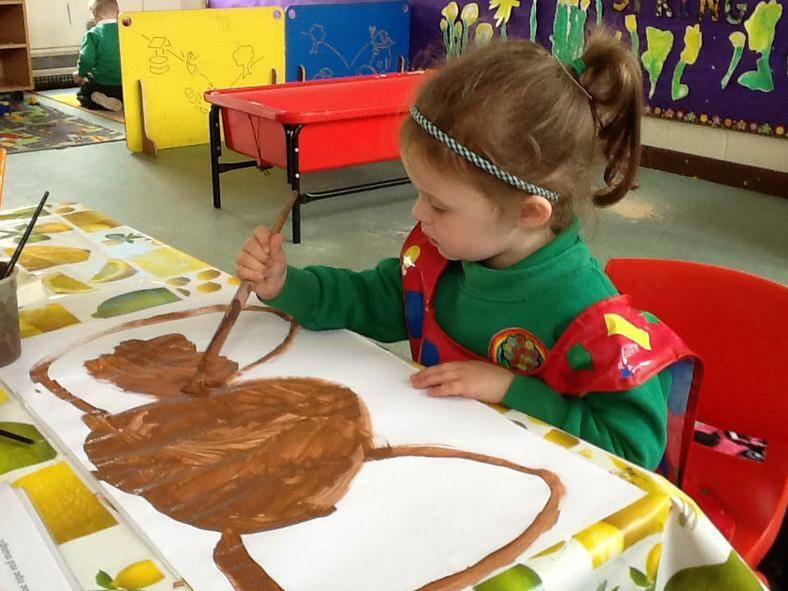 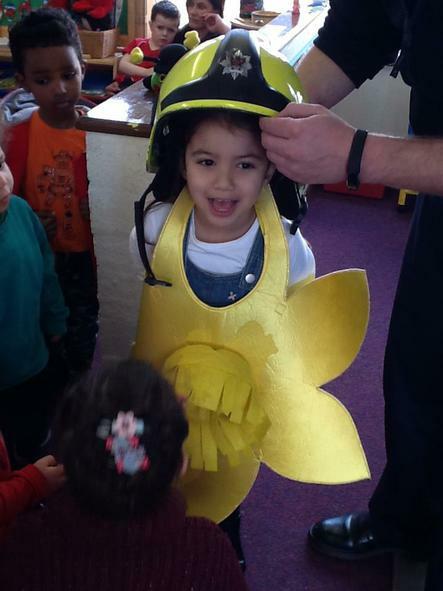 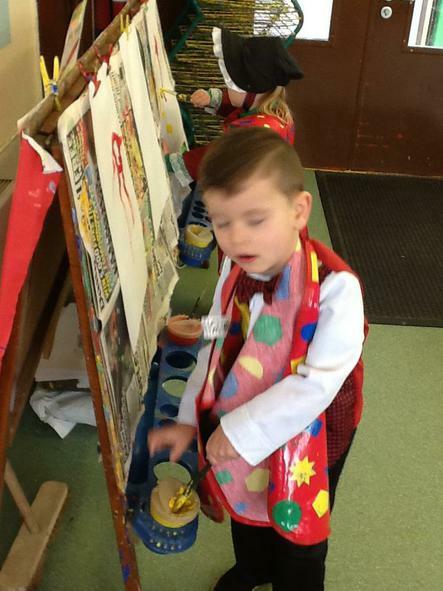 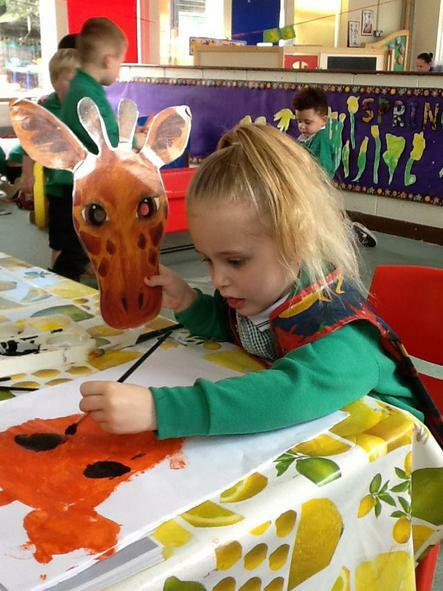 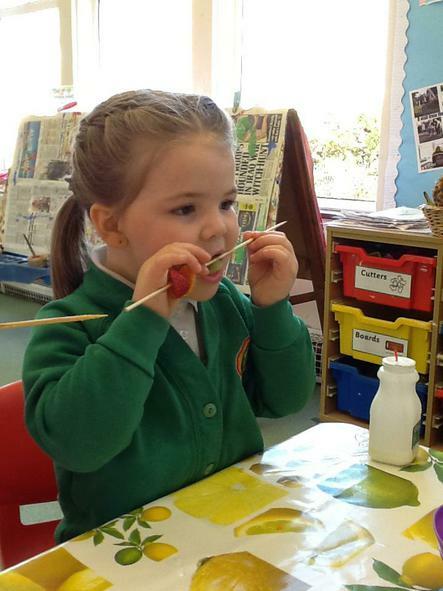 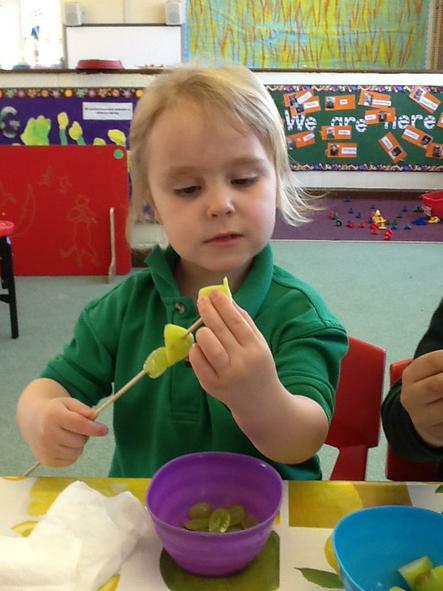 This week we have a fun filled busy week learning about the Easter Story and participating in Easter activities. 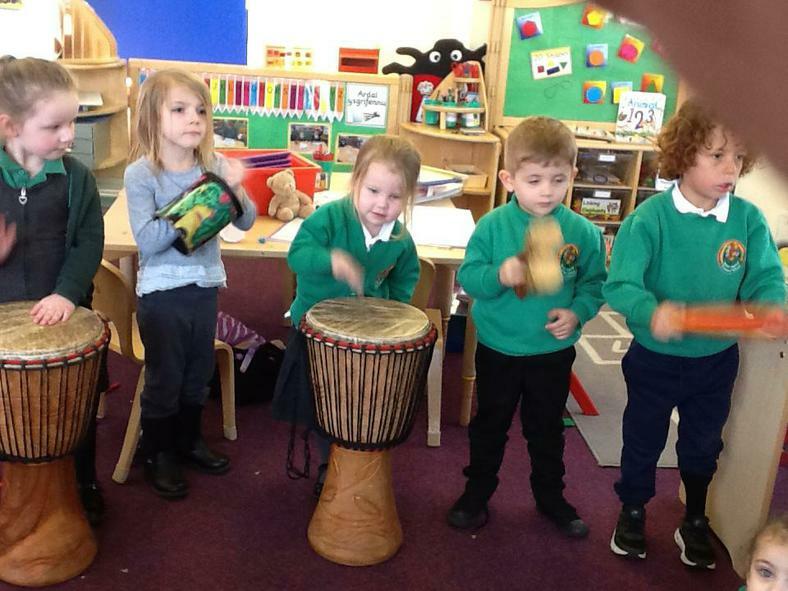 We will be learning the rhyme "Hot cross buns". 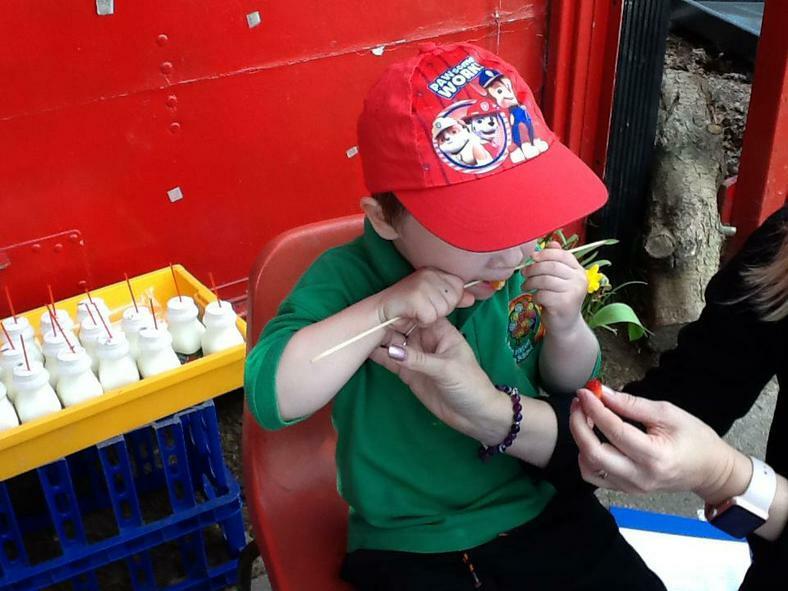 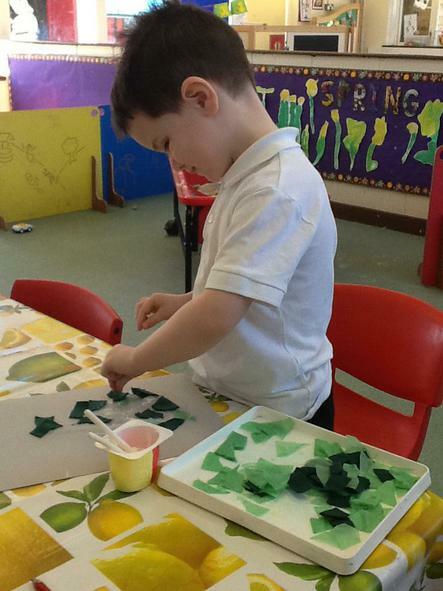 We will be printing with paint, looking at patterns on Eggs, learning some 2D shape names, and making some crafty creative goodies ready for Easter. 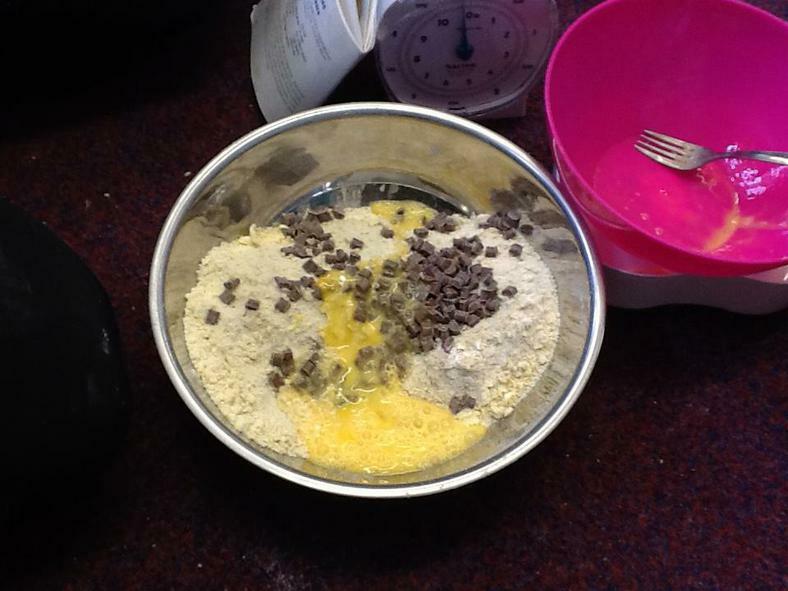 We will be making Easter chocolate nests with Sue. 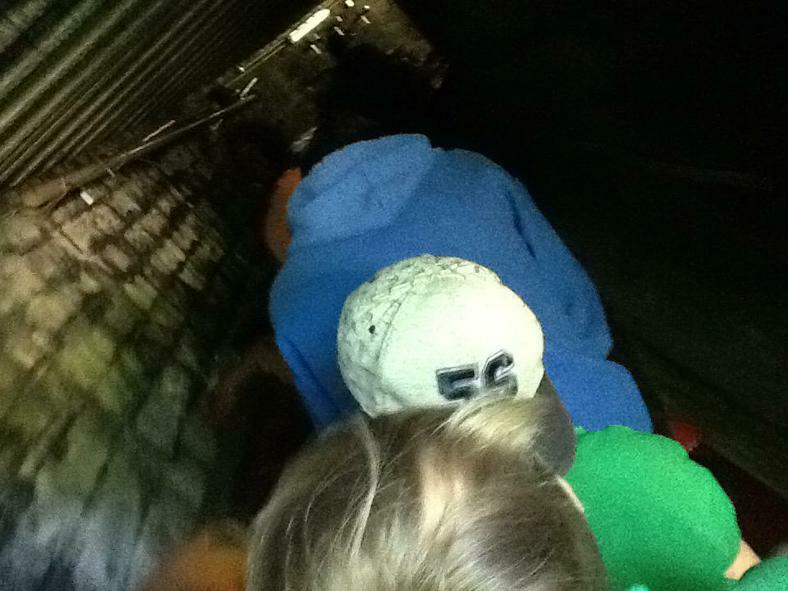 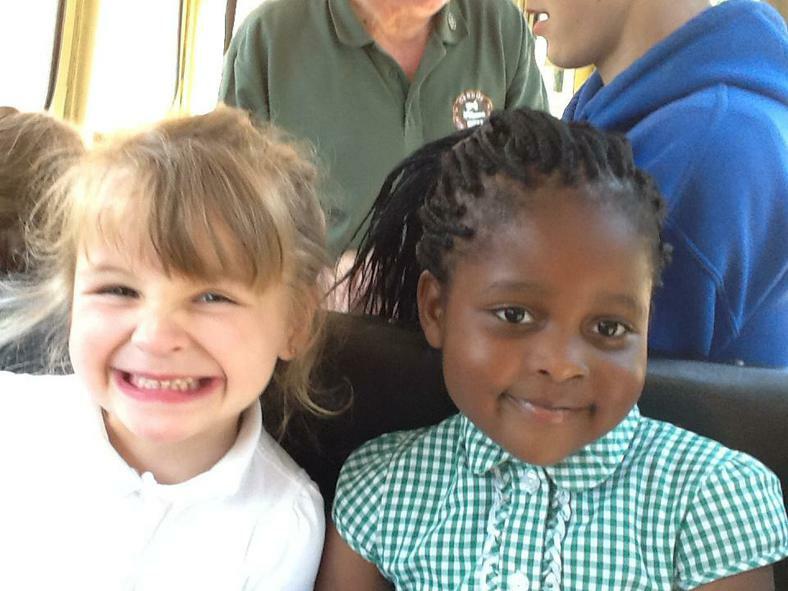 If you haven't confirmed or paid for our trip to the Farm on the 4th May, please do so this week as I need to confirm the coach and farm numbers by this Friday. 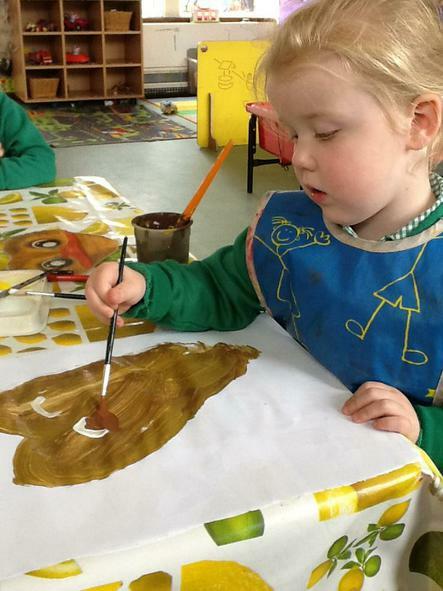 This week our colour table is Gold. 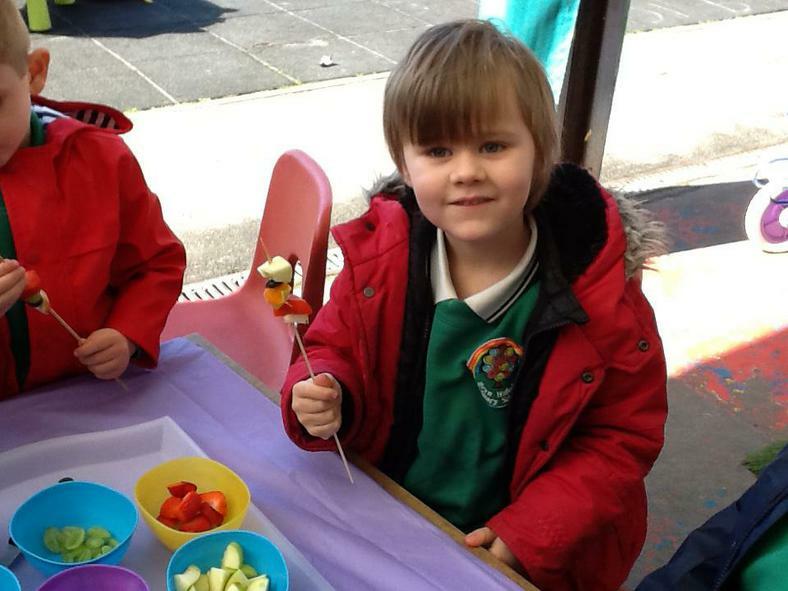 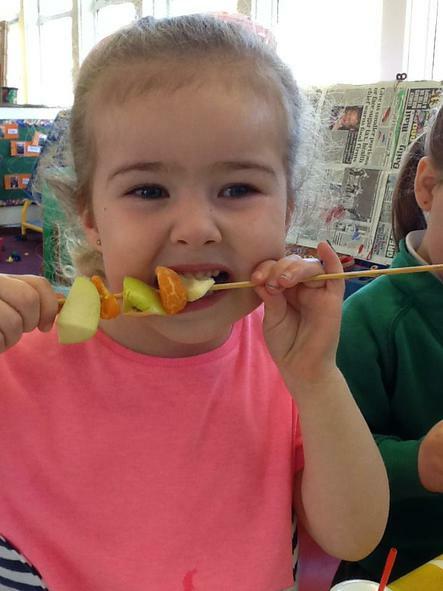 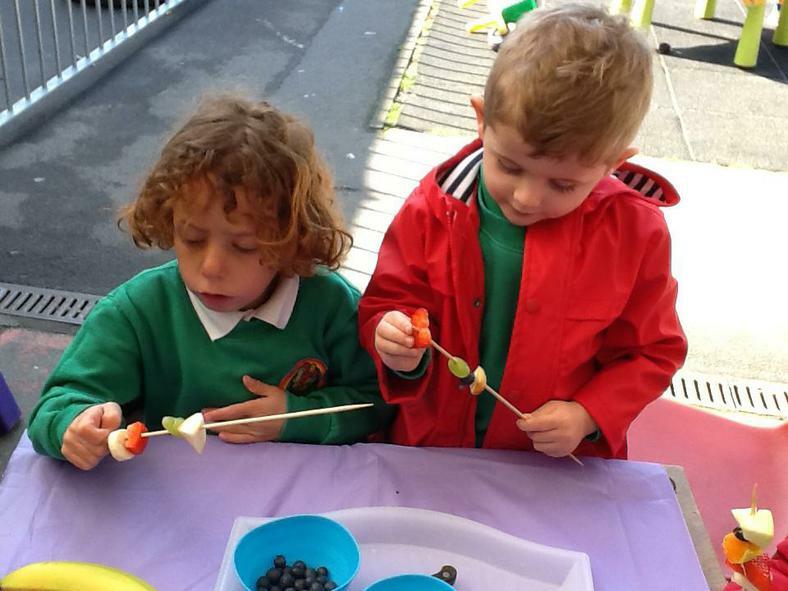 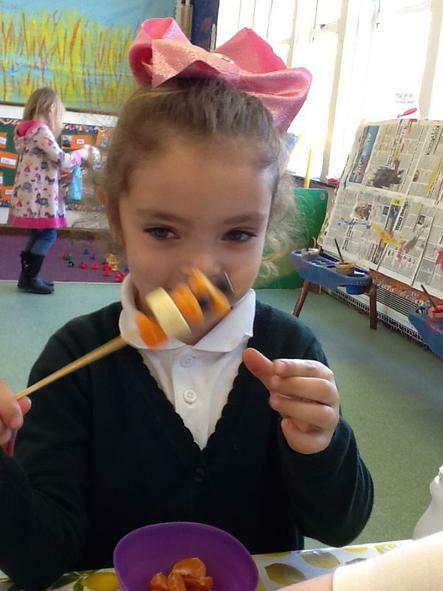 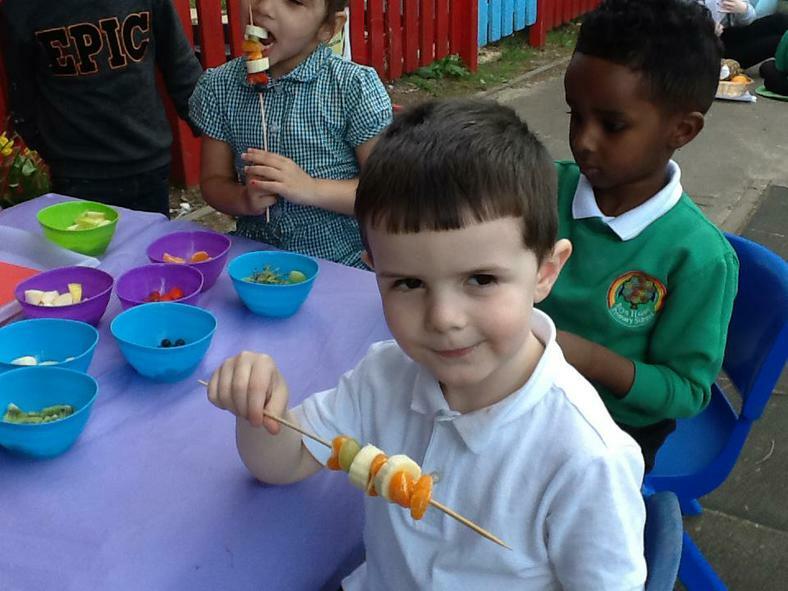 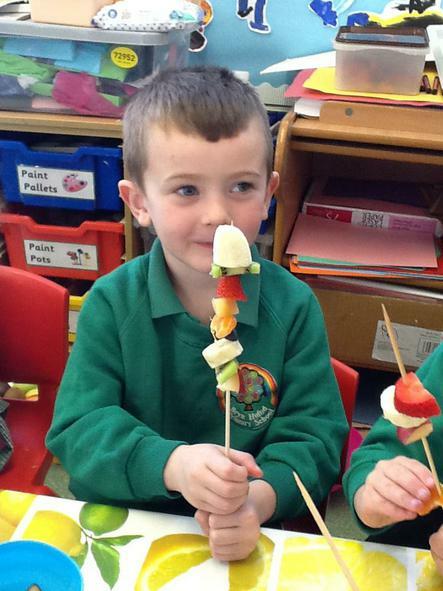 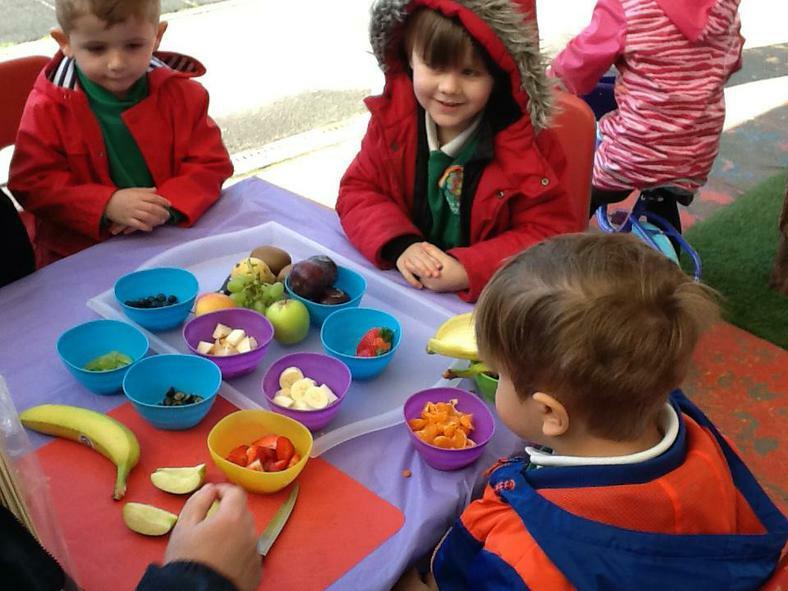 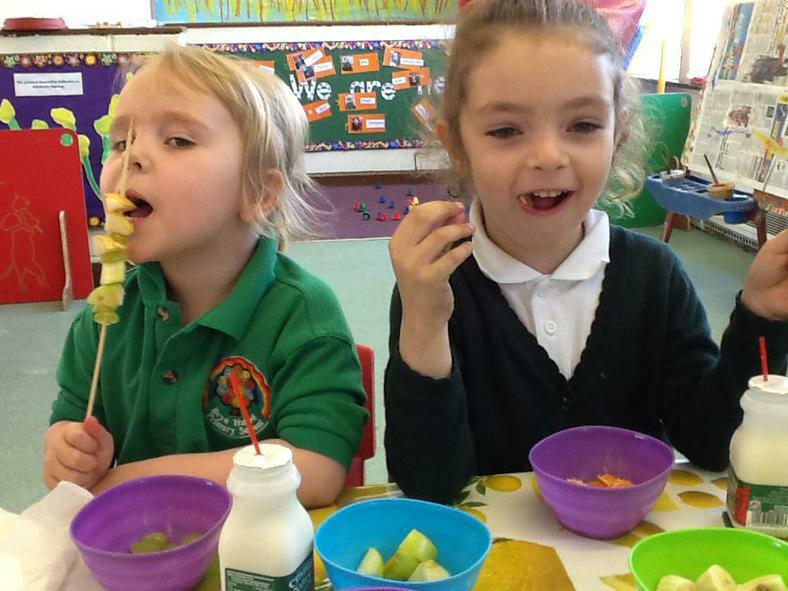 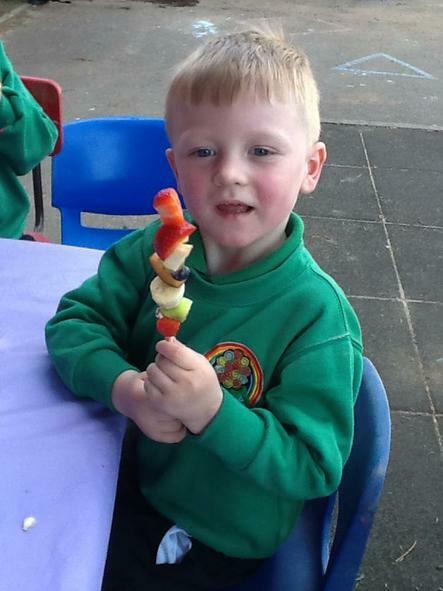 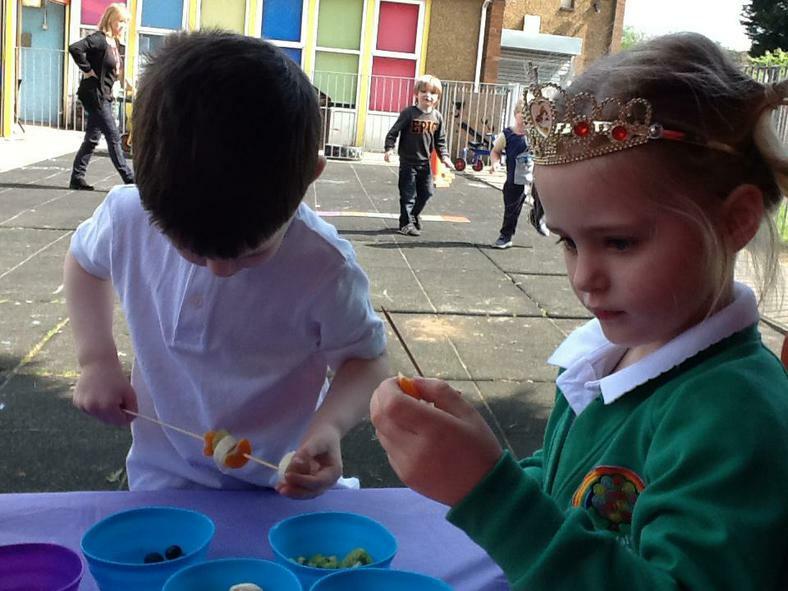 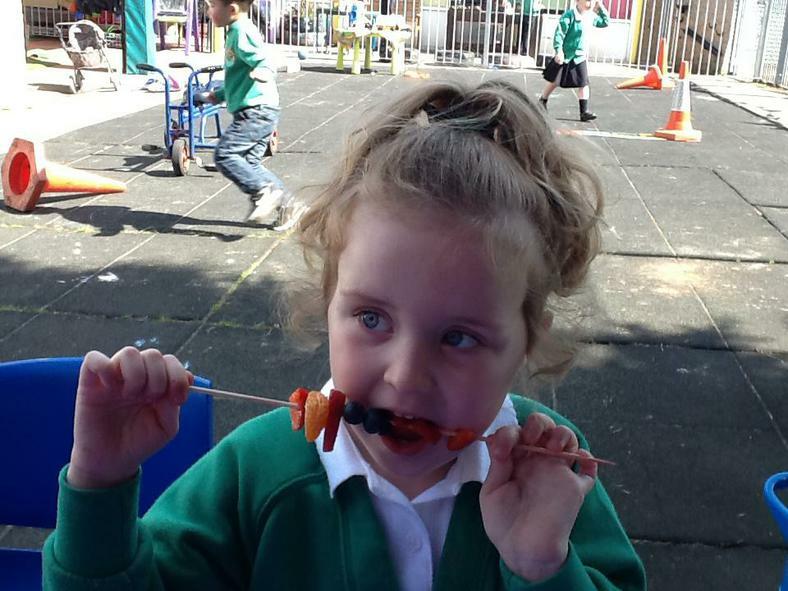 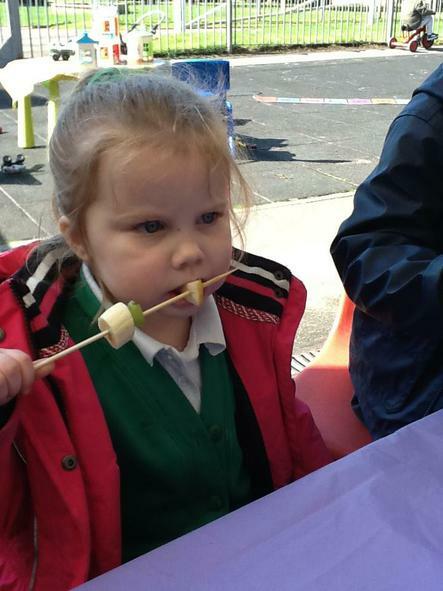 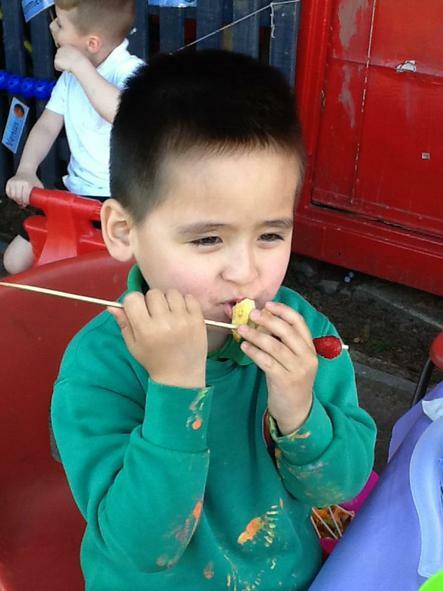 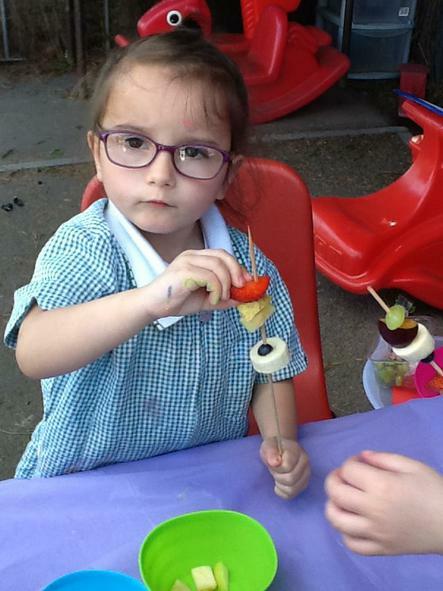 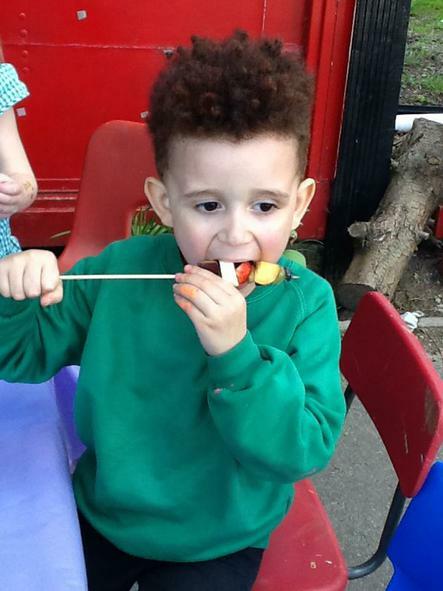 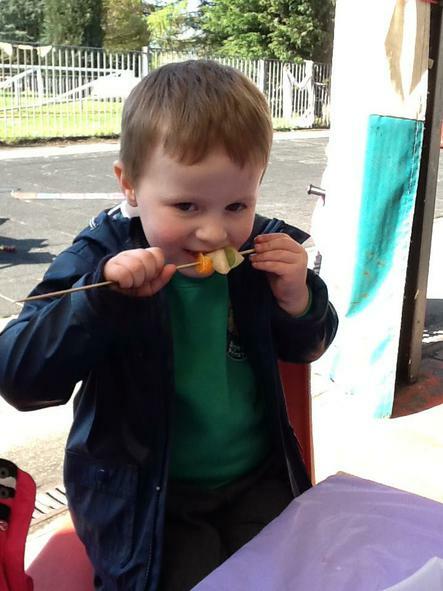 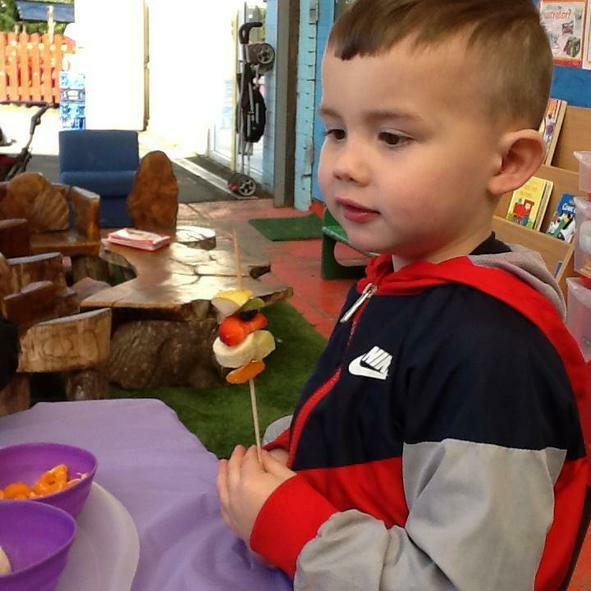 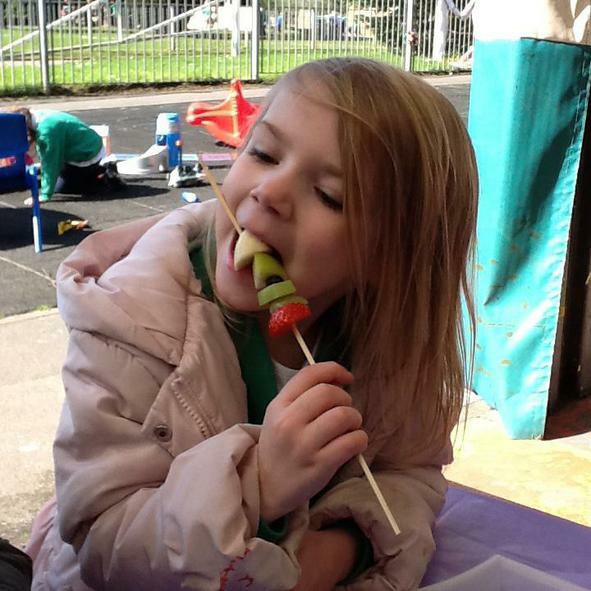 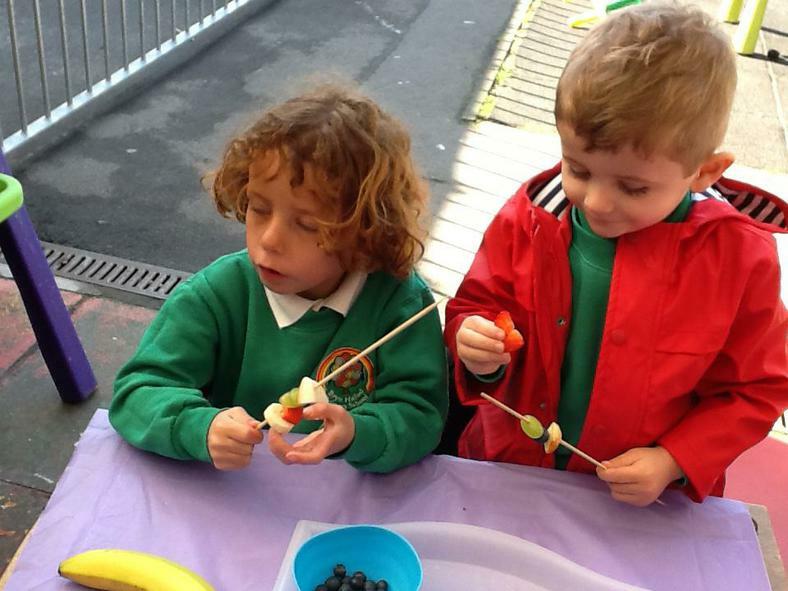 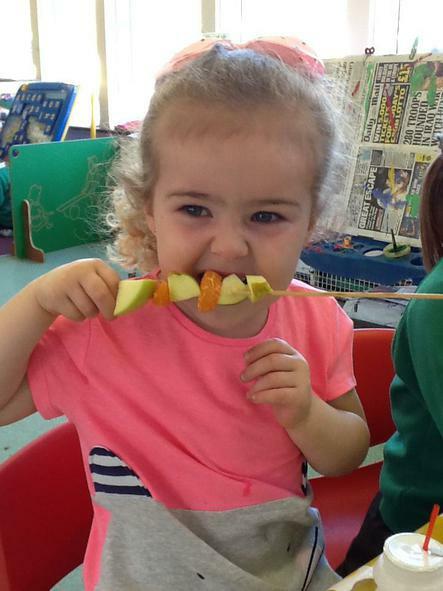 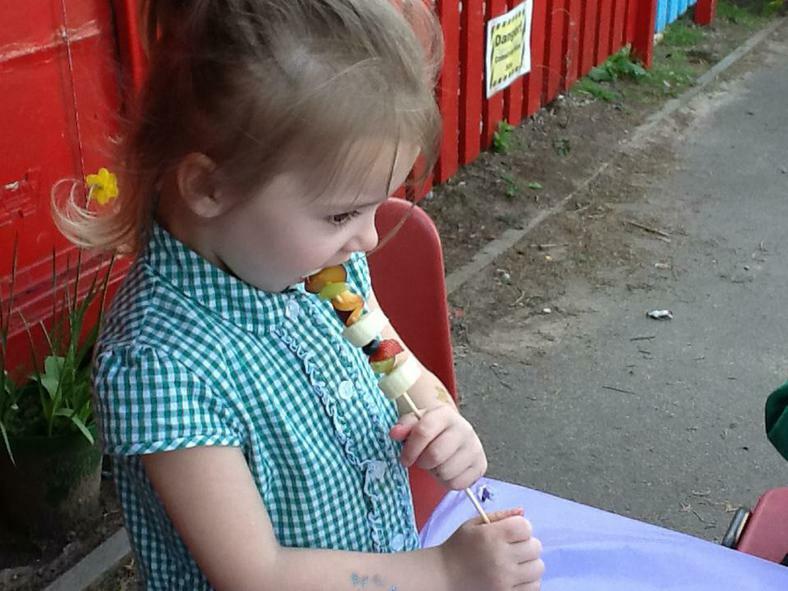 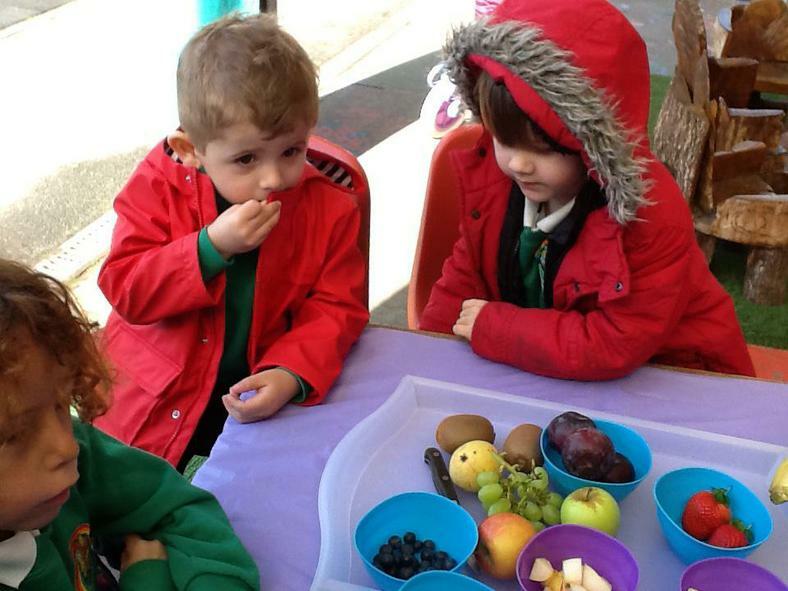 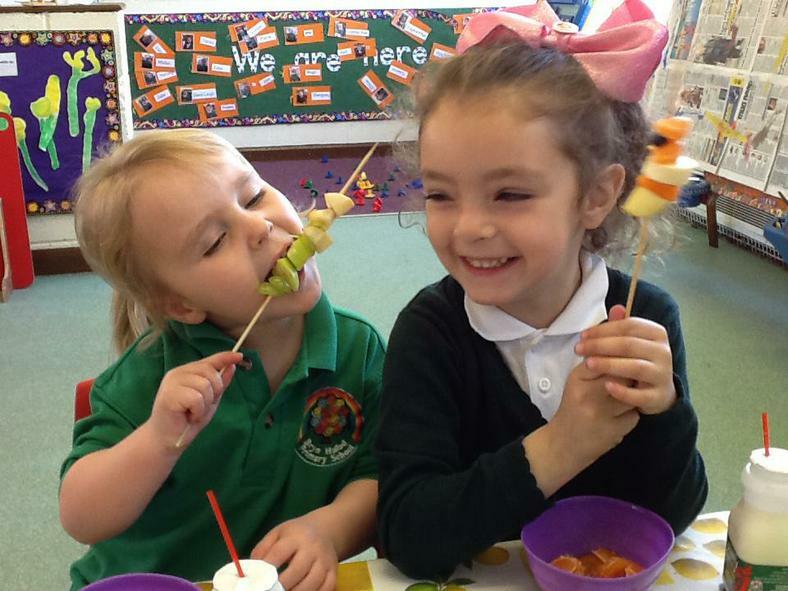 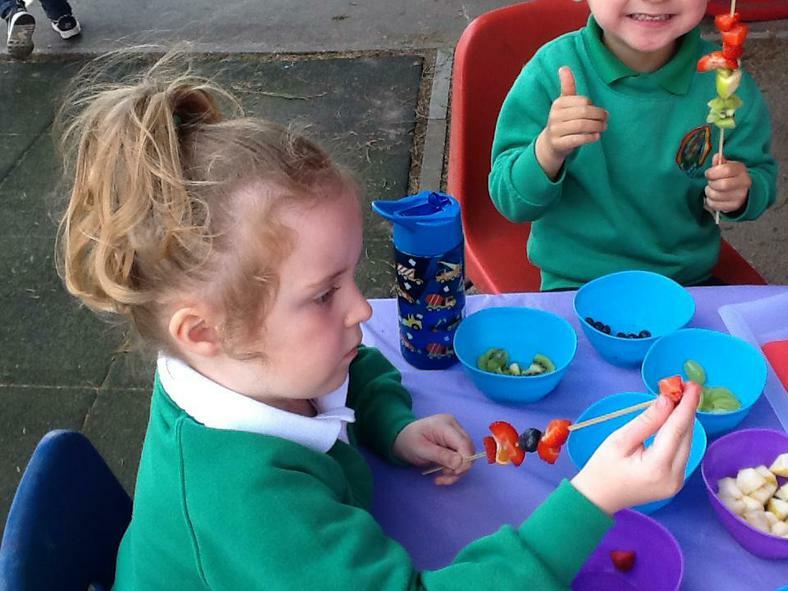 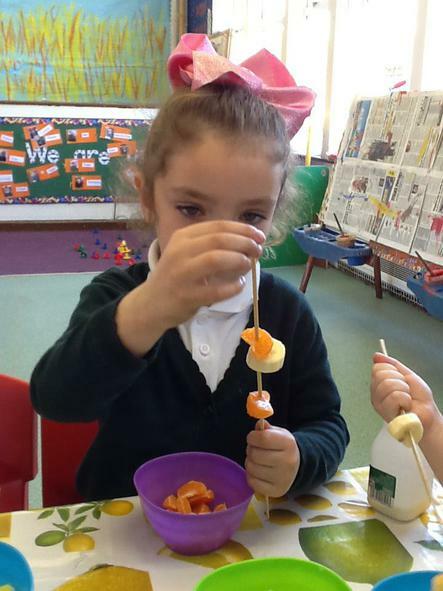 Also remember that snack is £1 a week, it is important that everyone pays as it enables us to provide a variety of snack and craft activity materials for Nursery children. 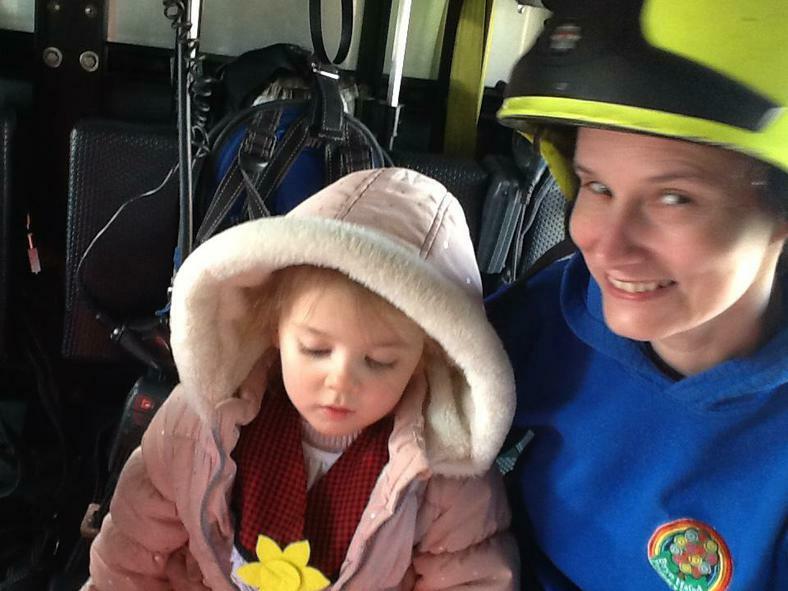 Many thanks for your continued support, enjoy the Easter break! 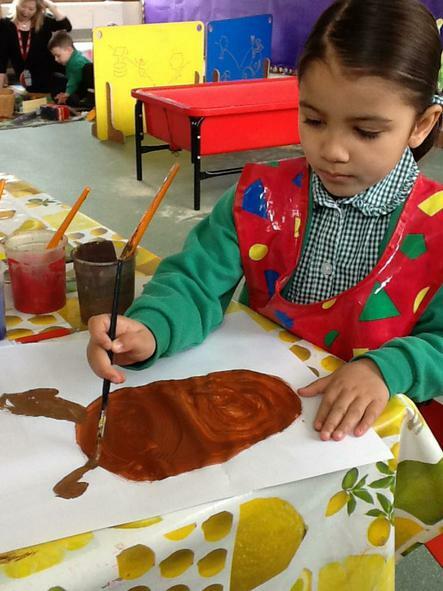 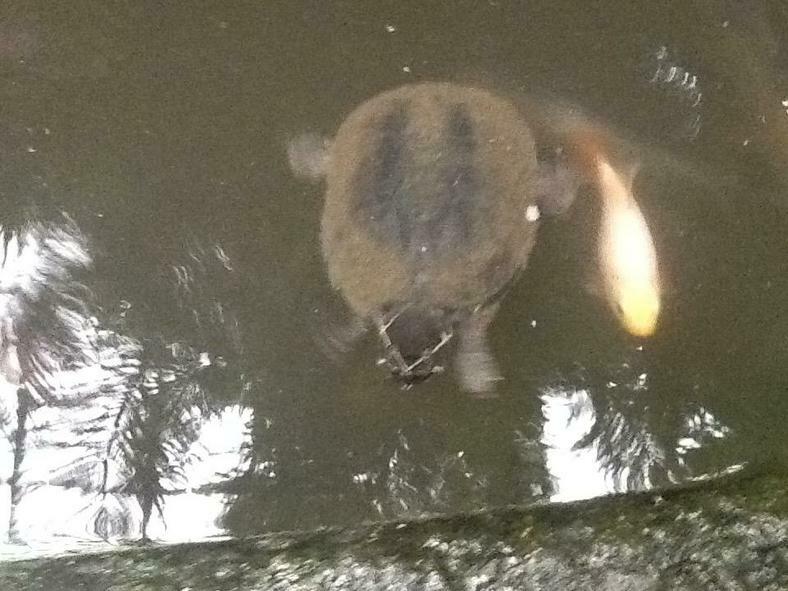 This week our focussed text is "The Hare and the Tortoise". 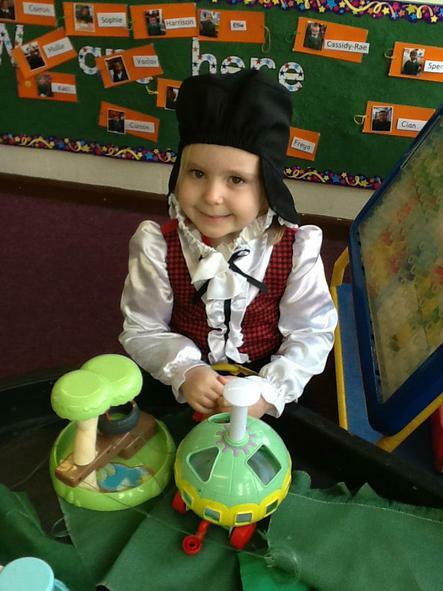 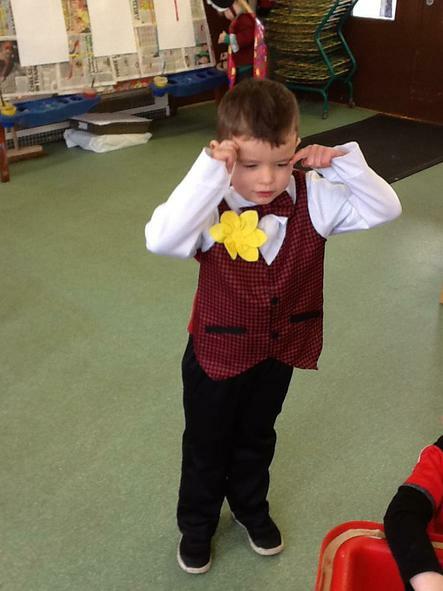 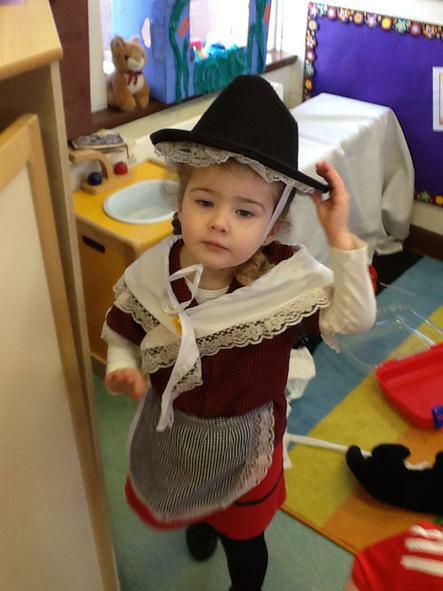 Our Nursery rhyme of the week is "ten little numbers". 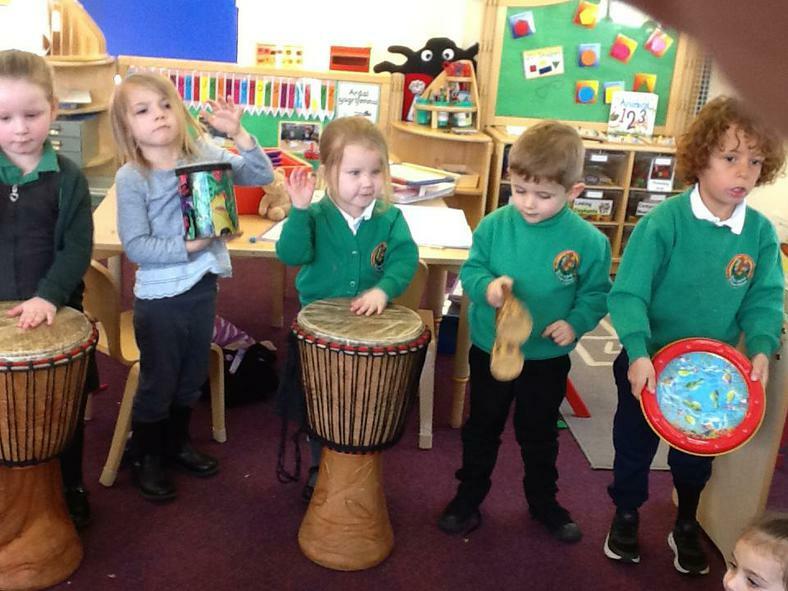 We will be recording the children singing using the microphone and some backing music if they choose it. 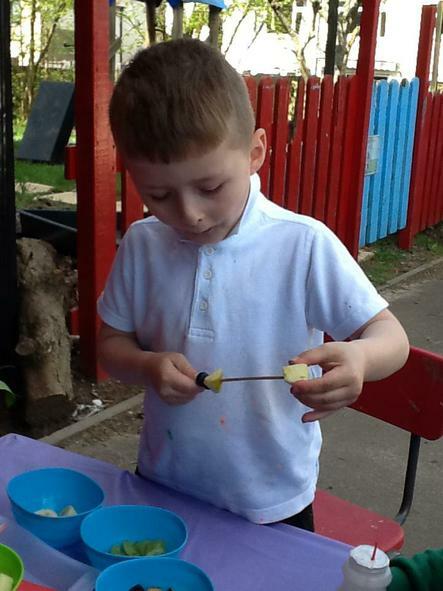 We will be cutting and sticking using different coloured materials to identify our colour knowledge. 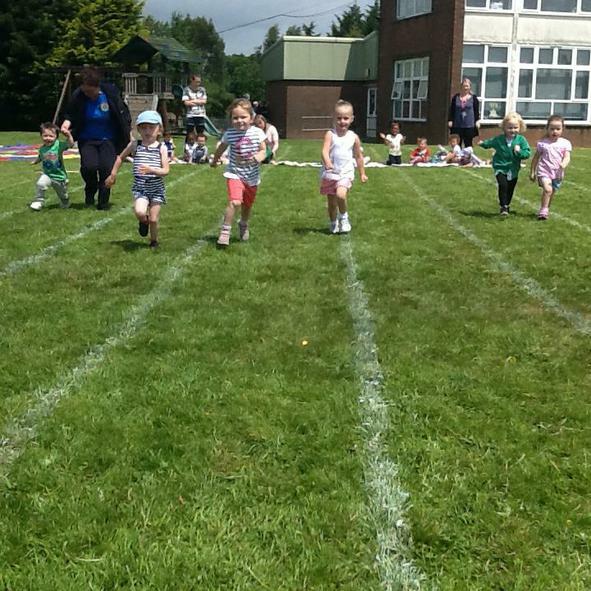 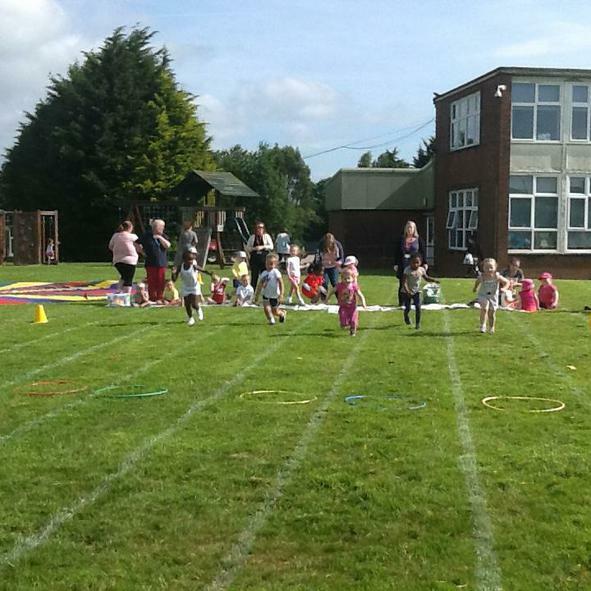 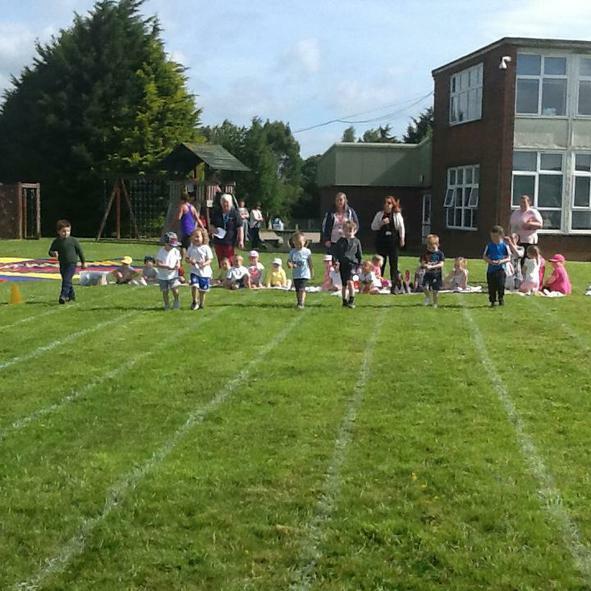 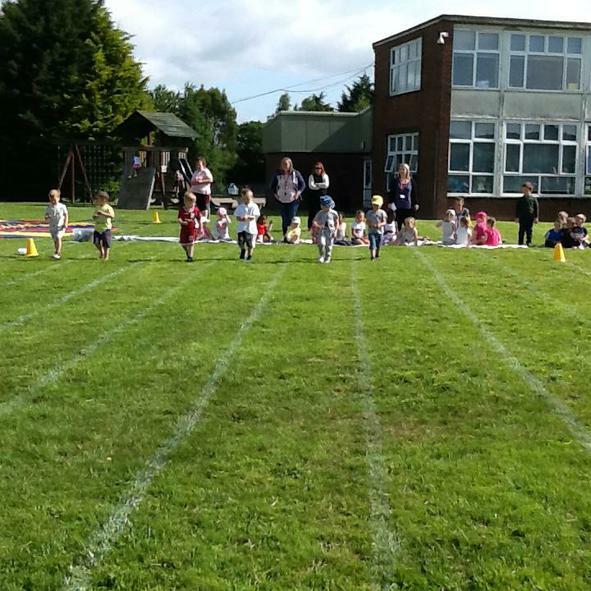 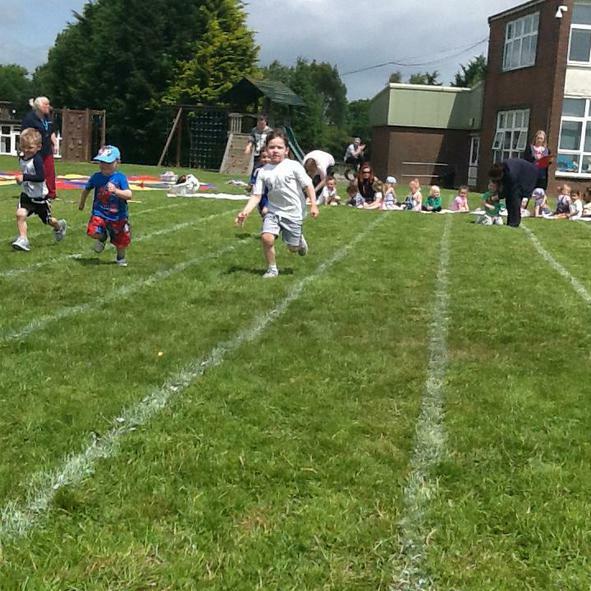 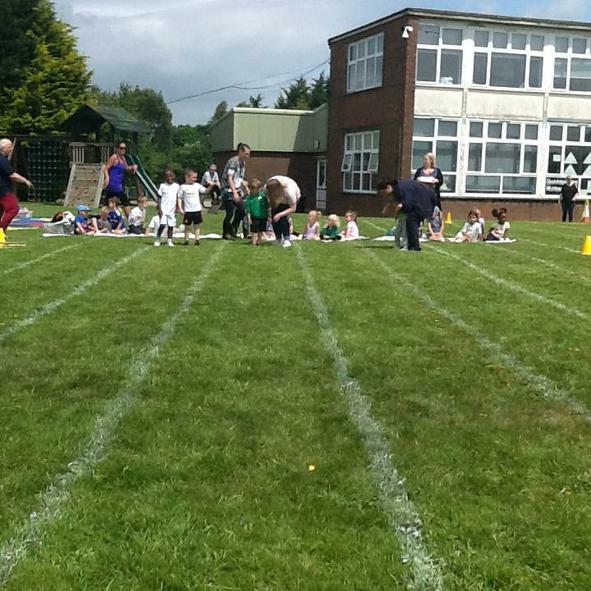 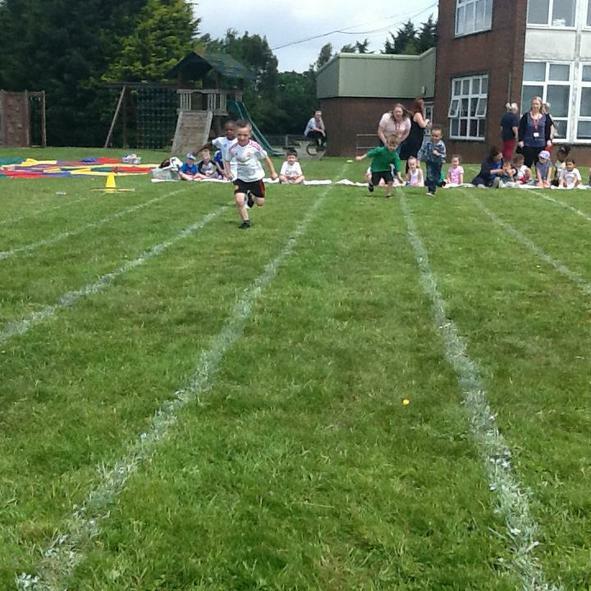 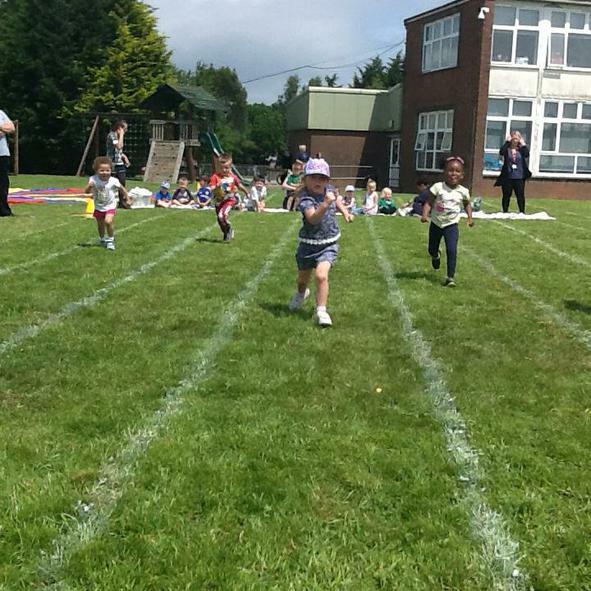 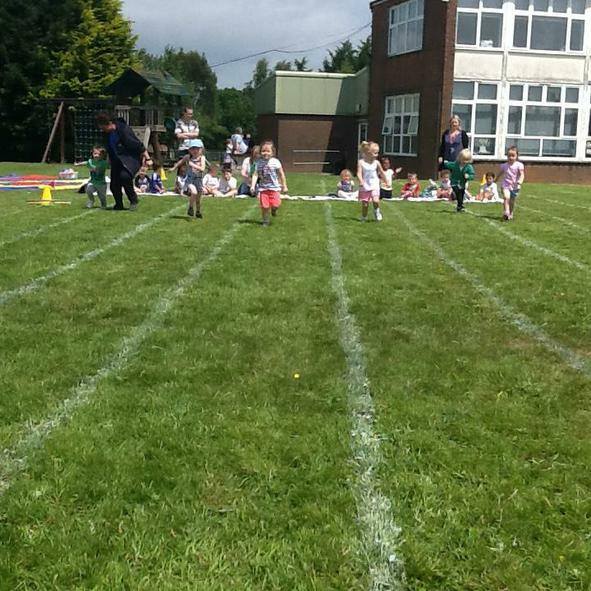 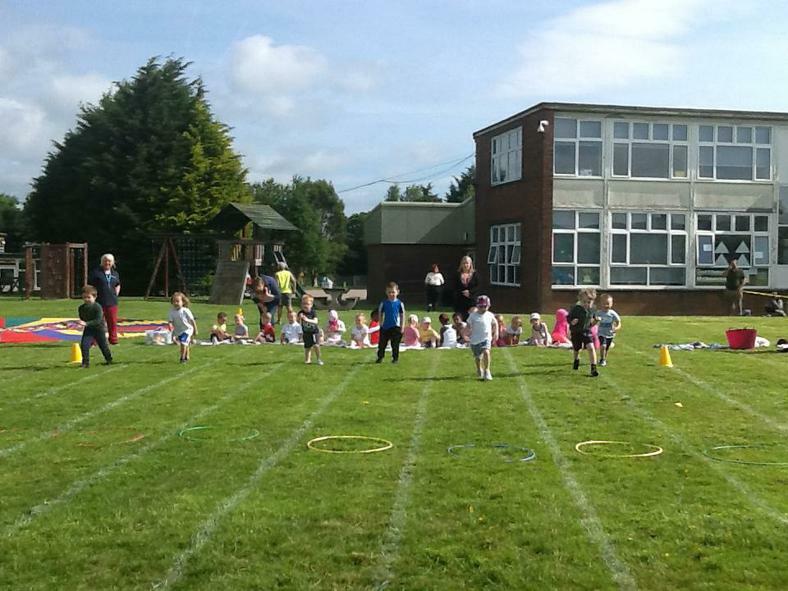 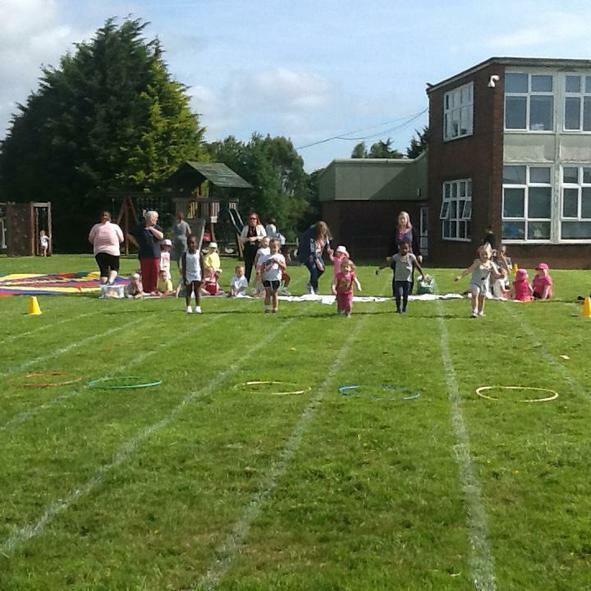 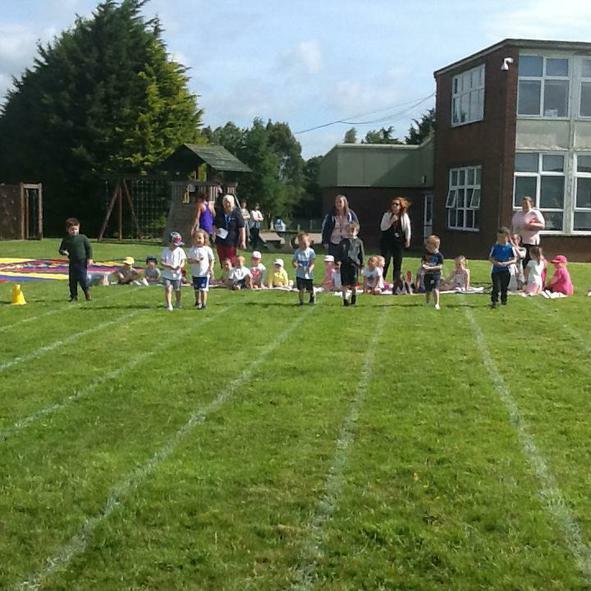 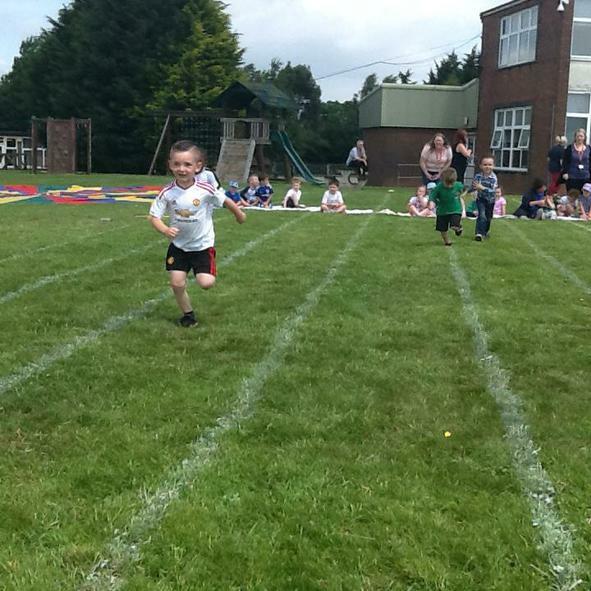 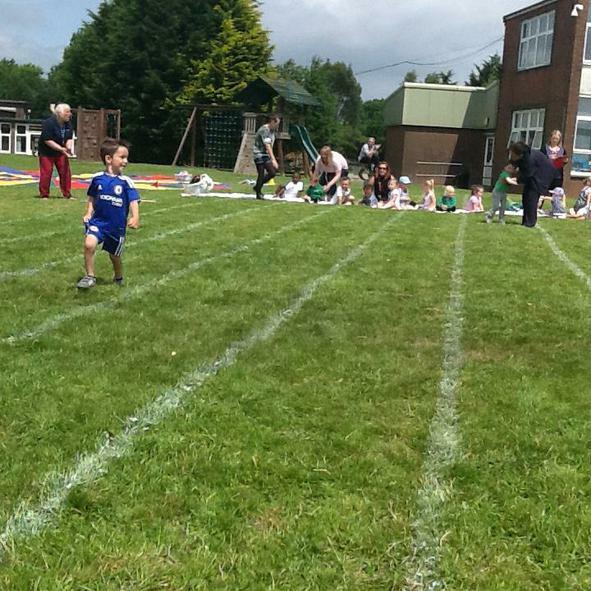 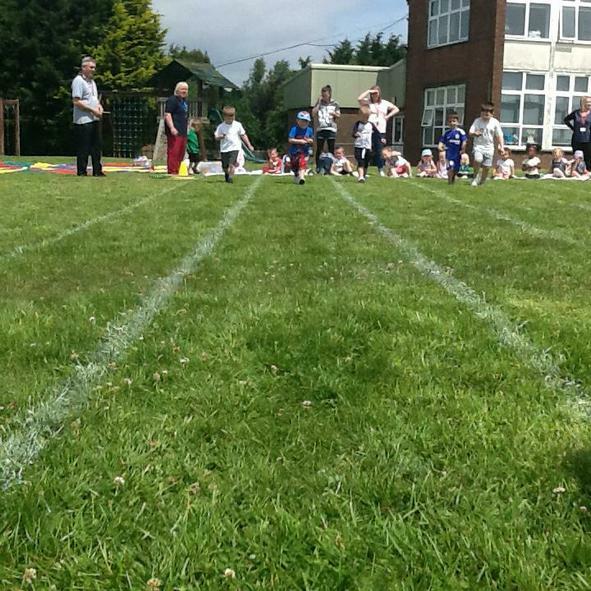 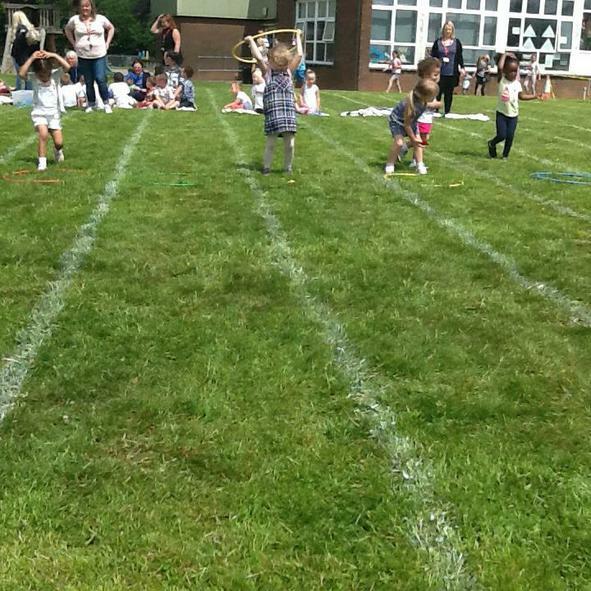 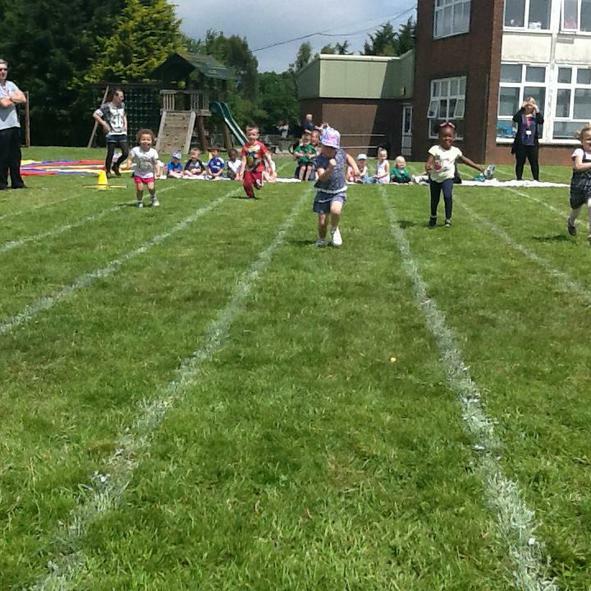 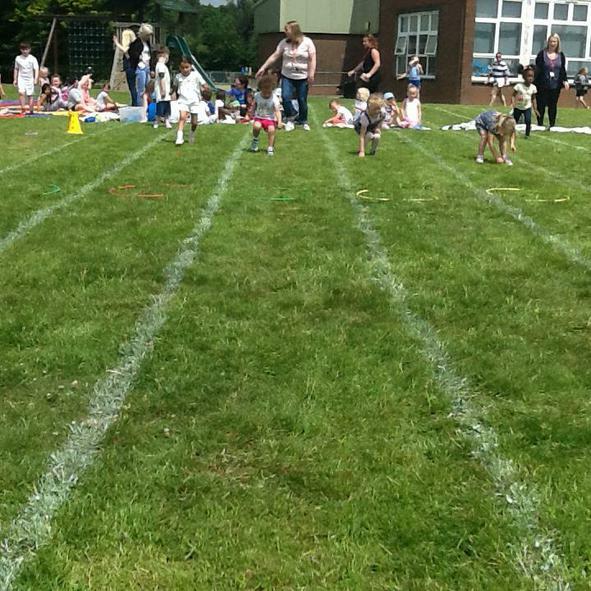 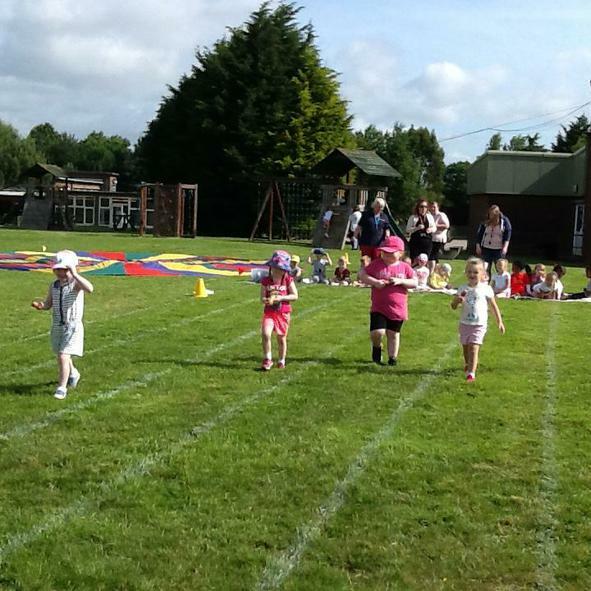 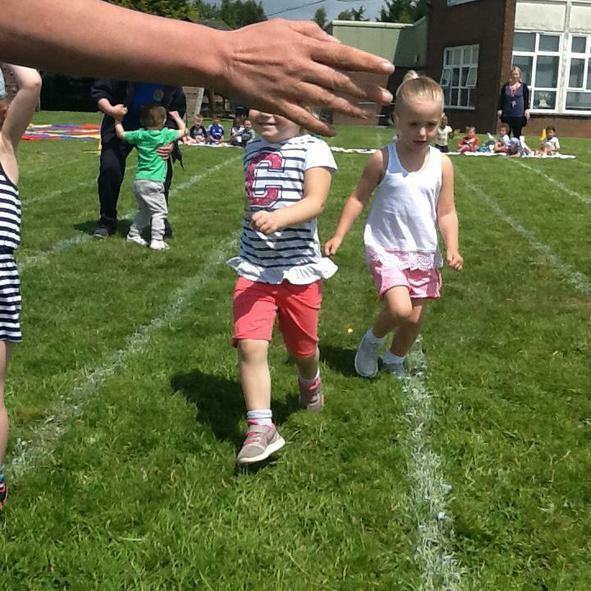 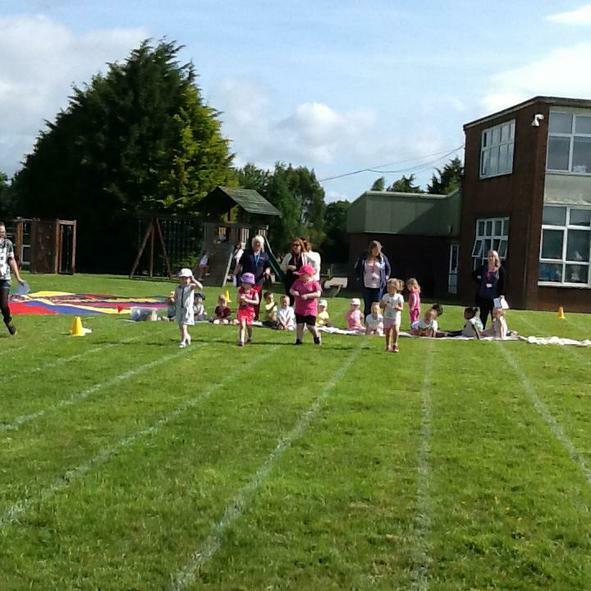 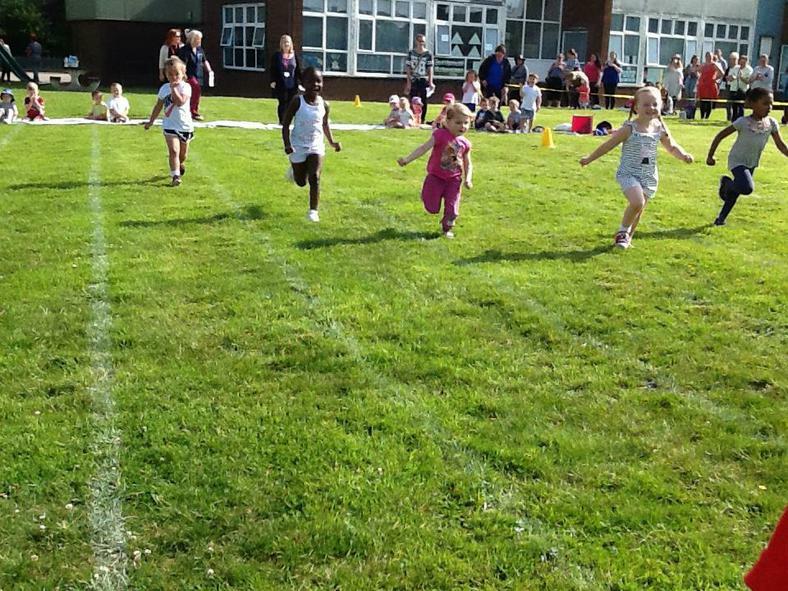 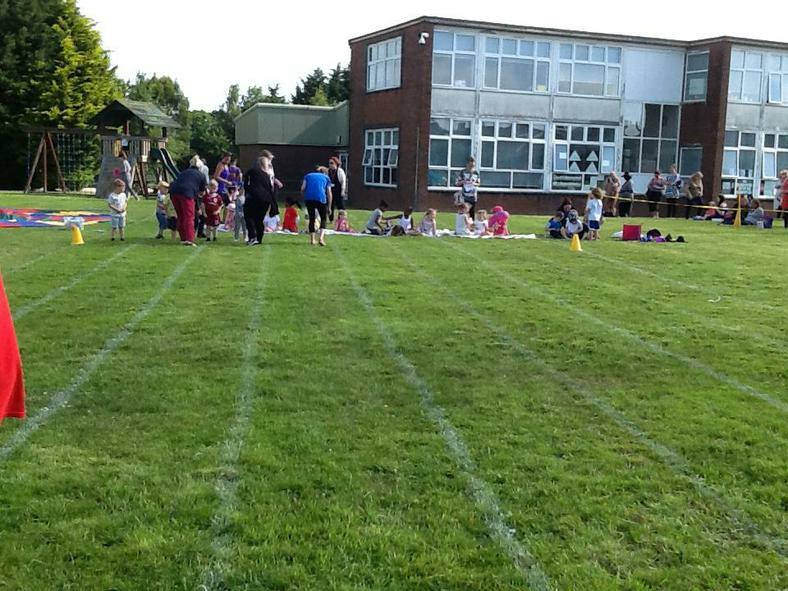 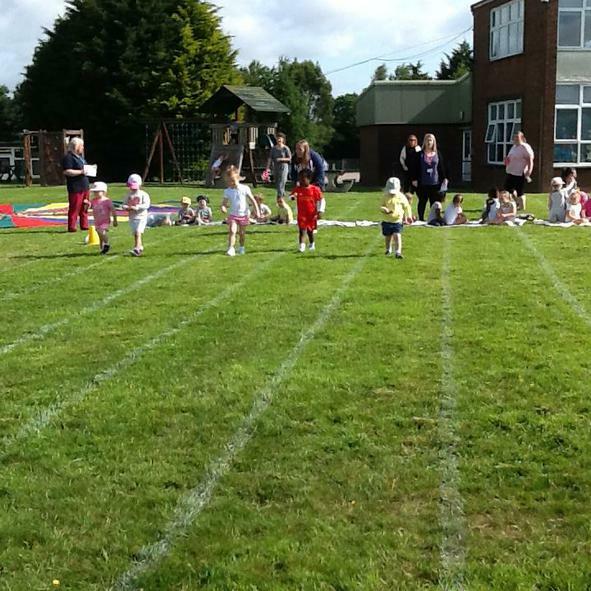 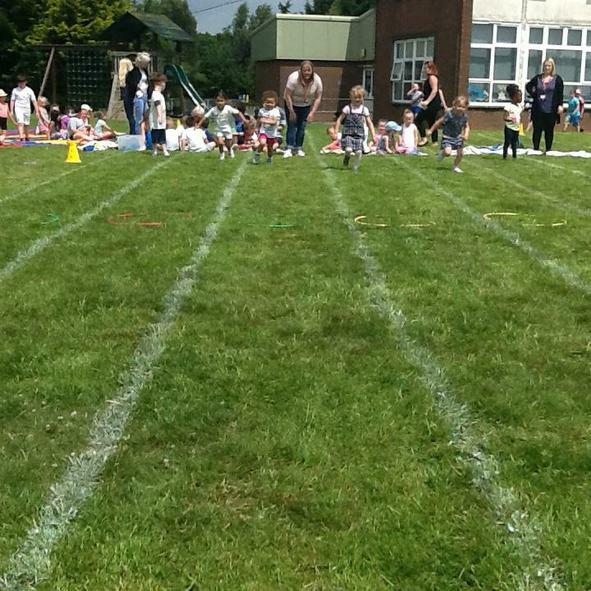 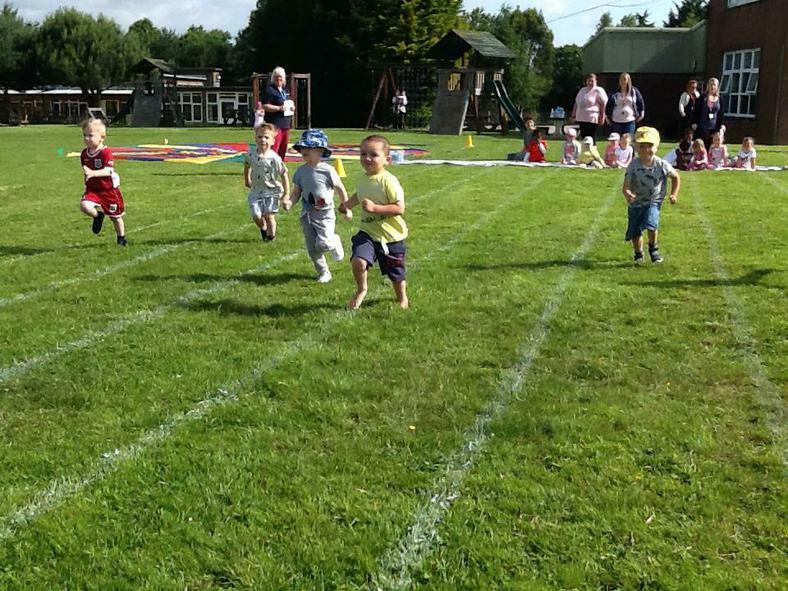 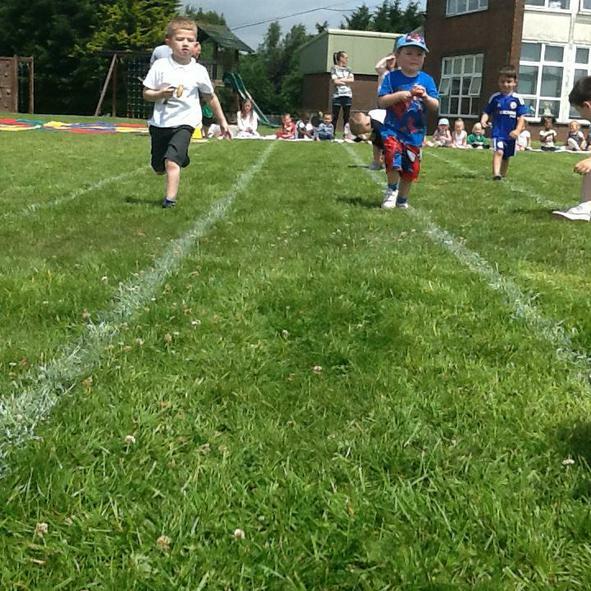 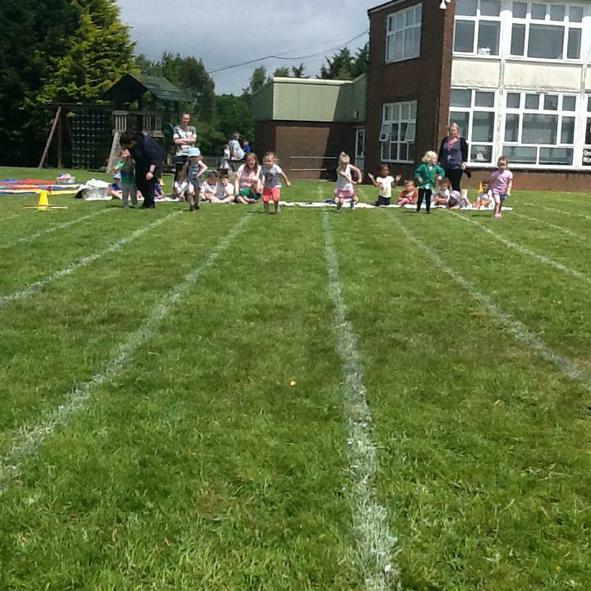 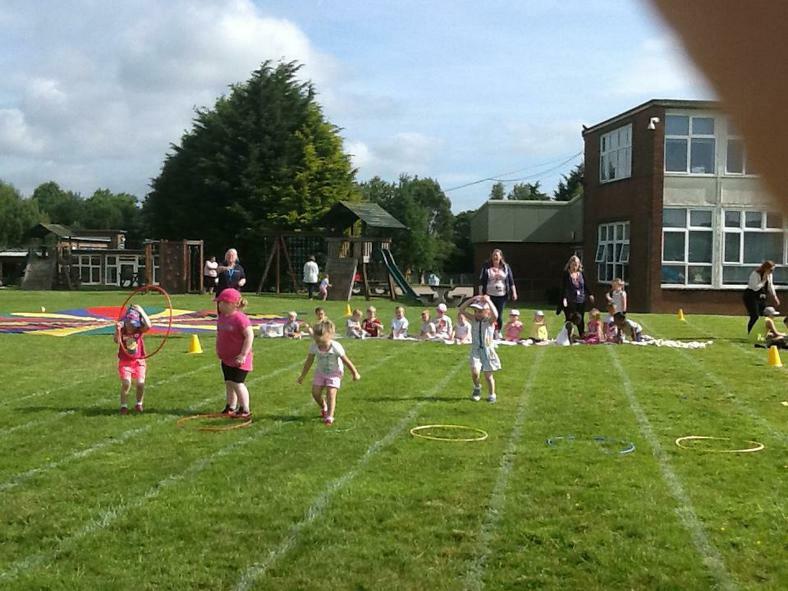 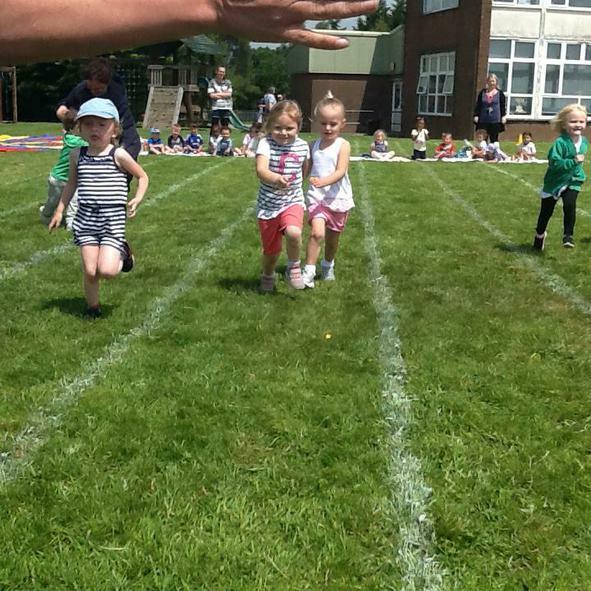 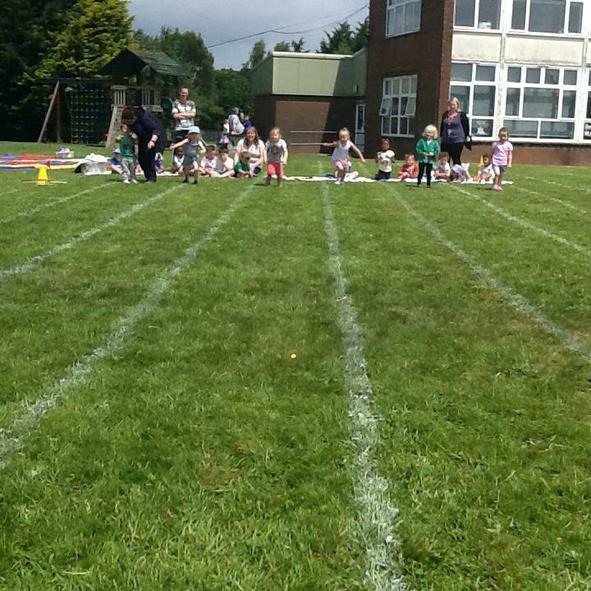 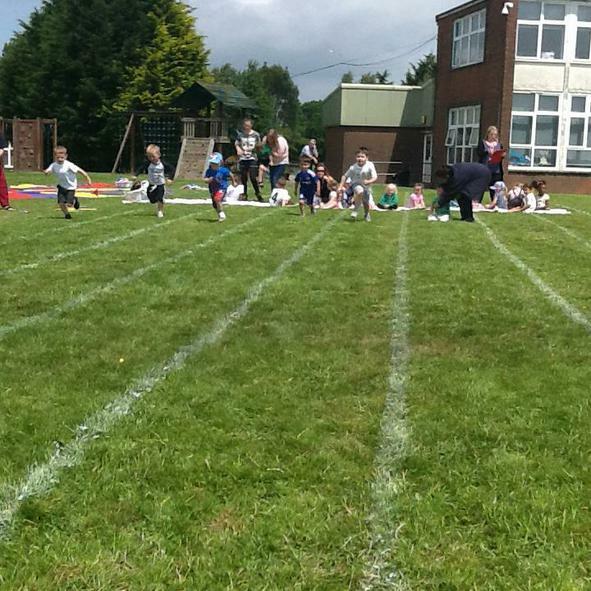 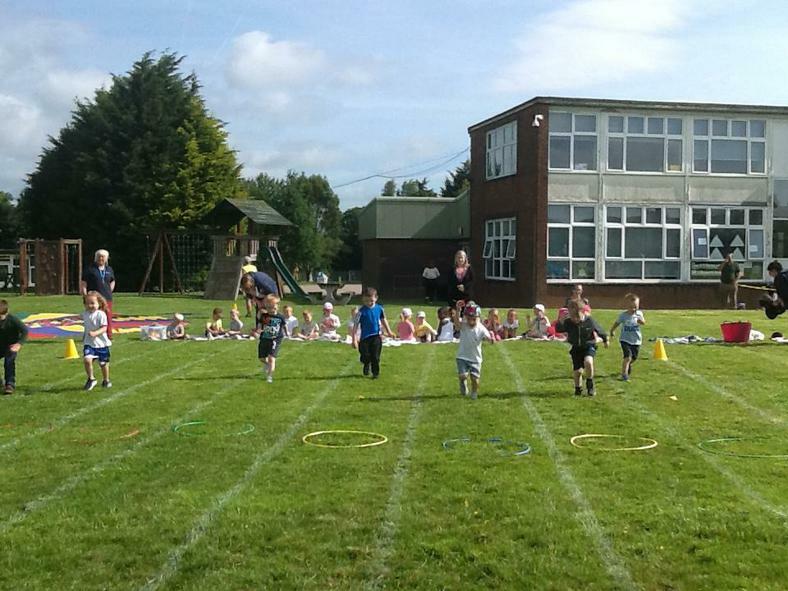 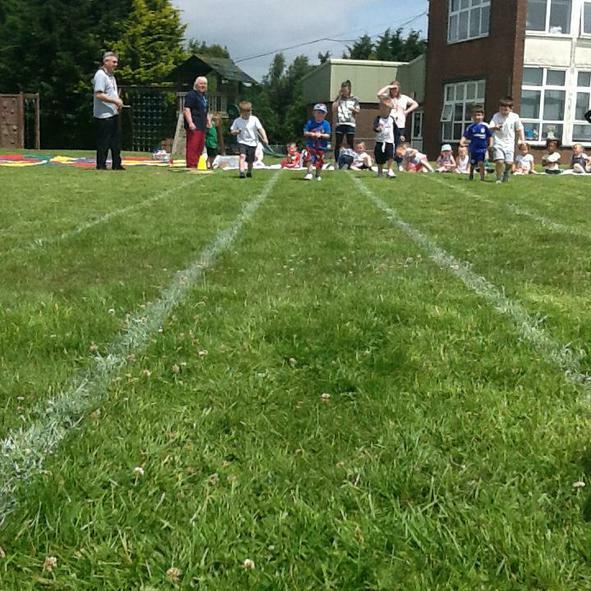 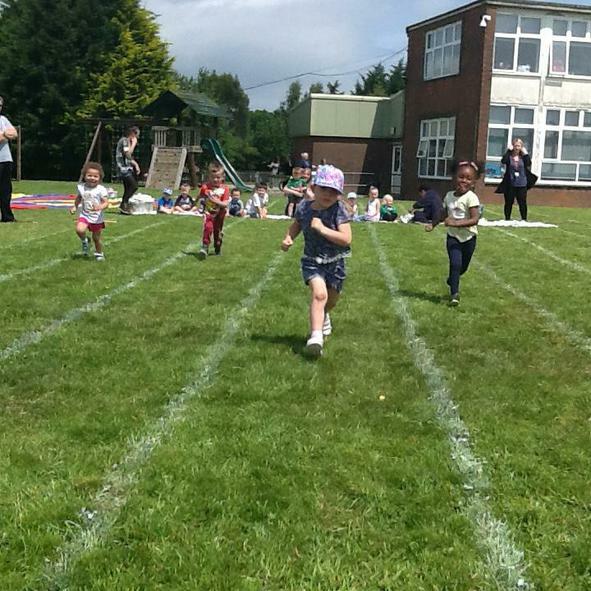 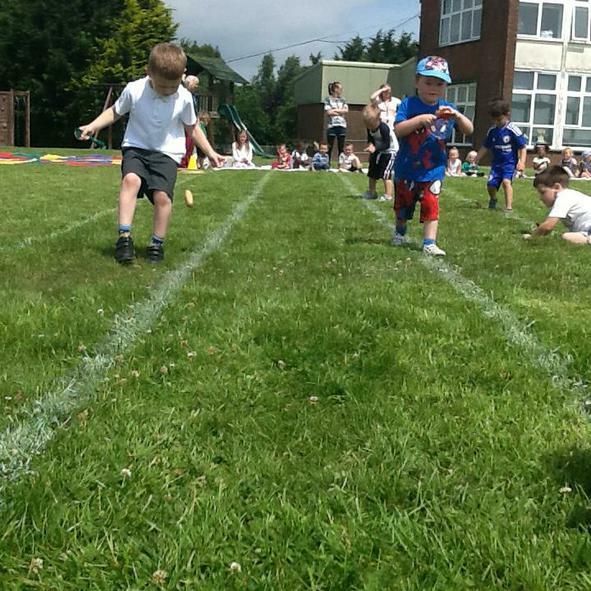 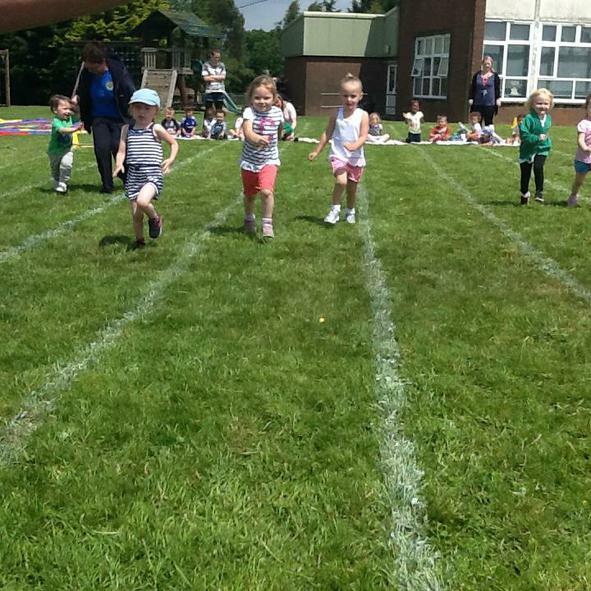 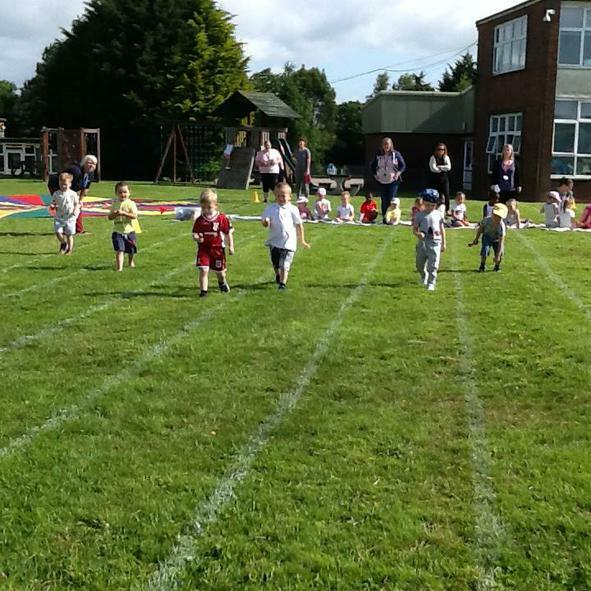 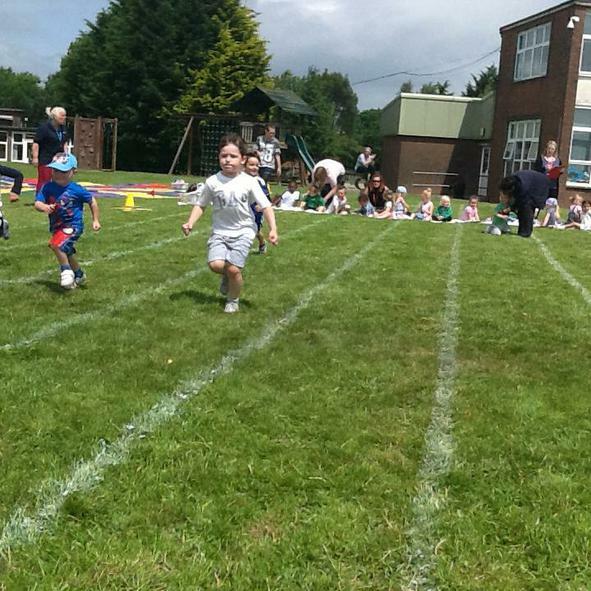 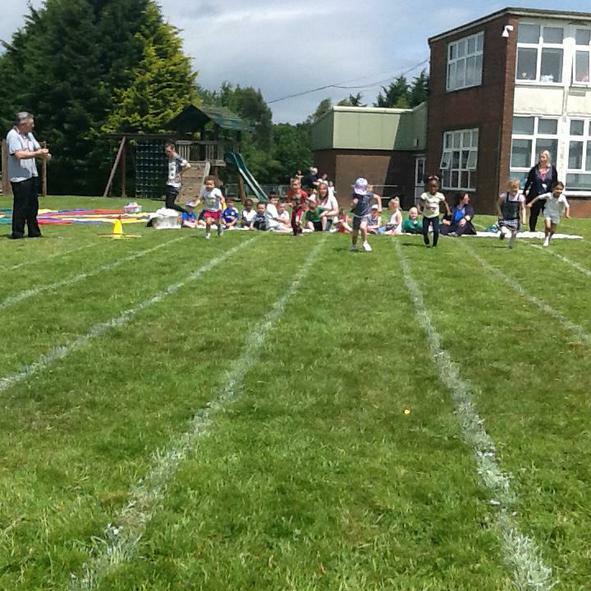 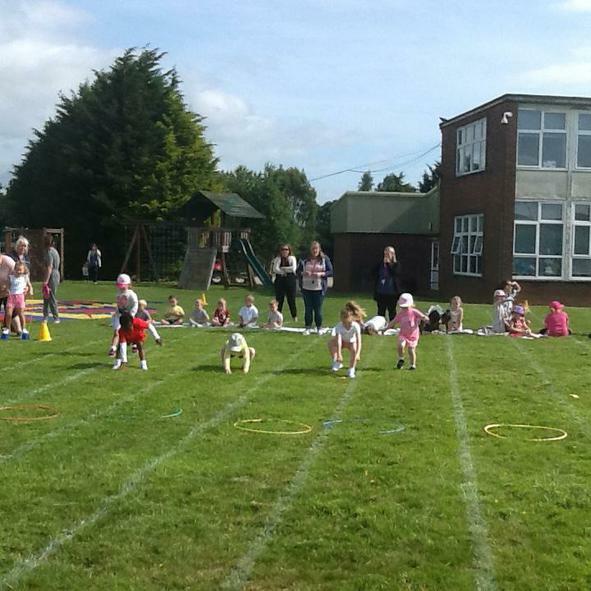 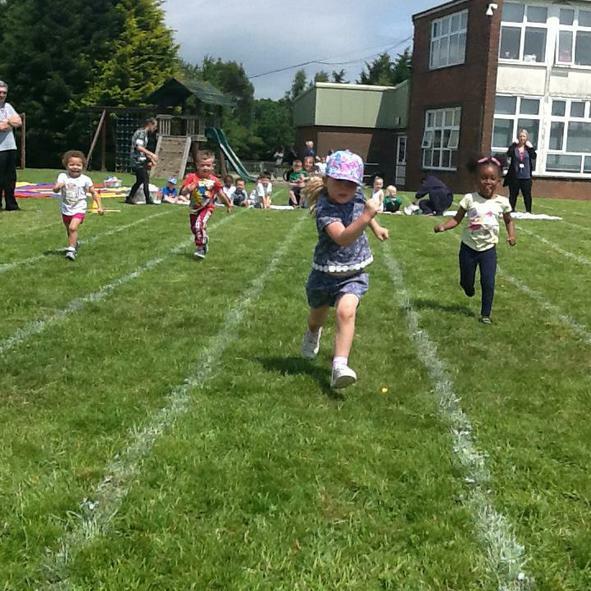 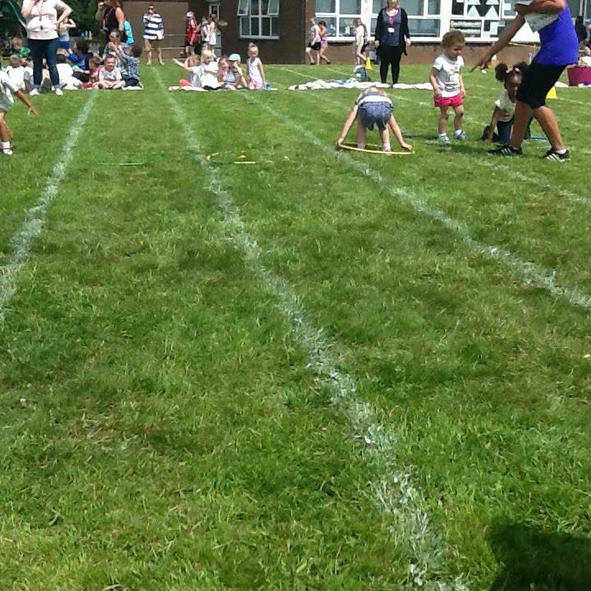 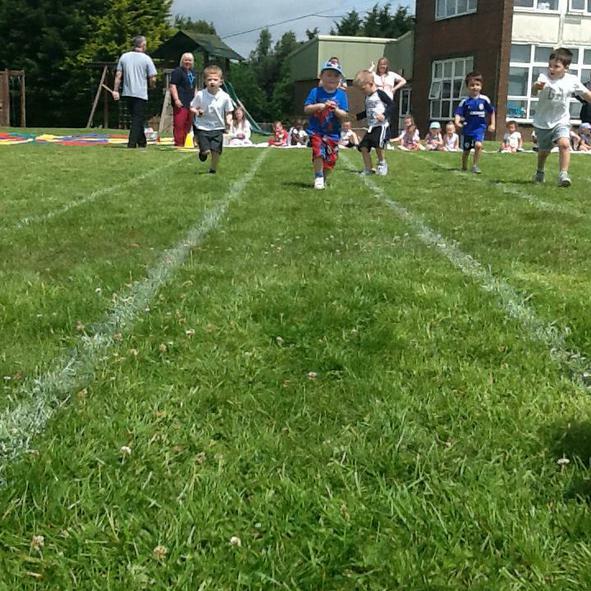 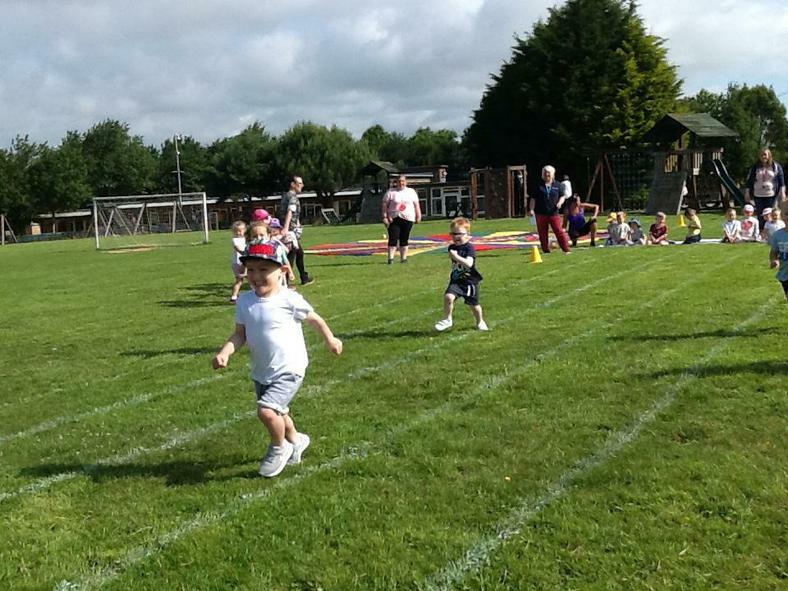 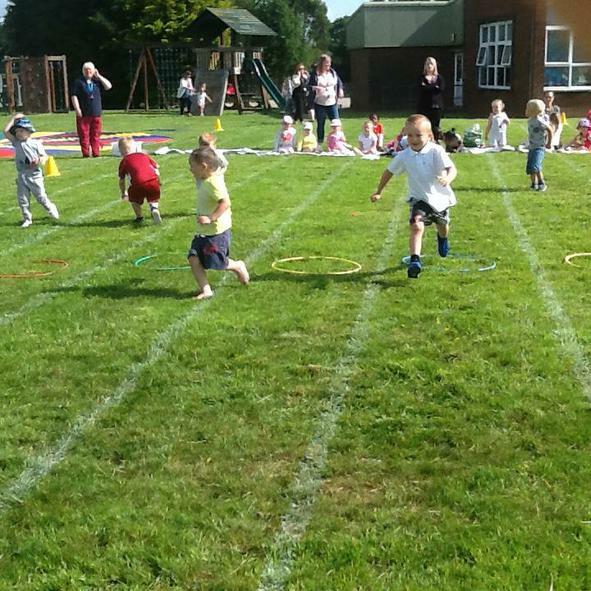 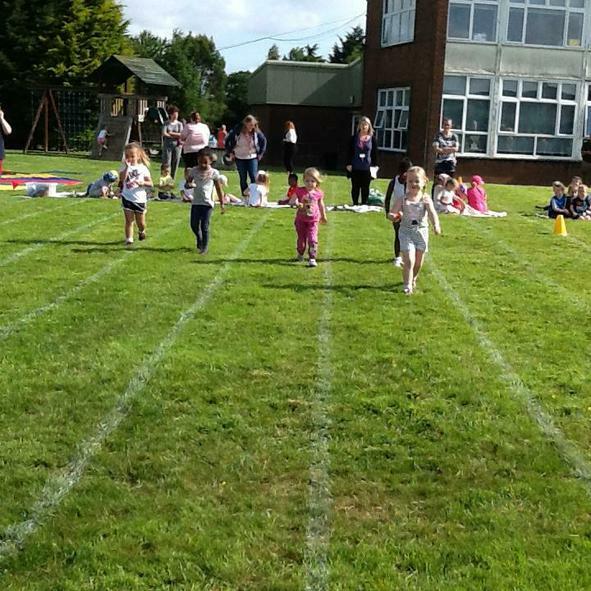 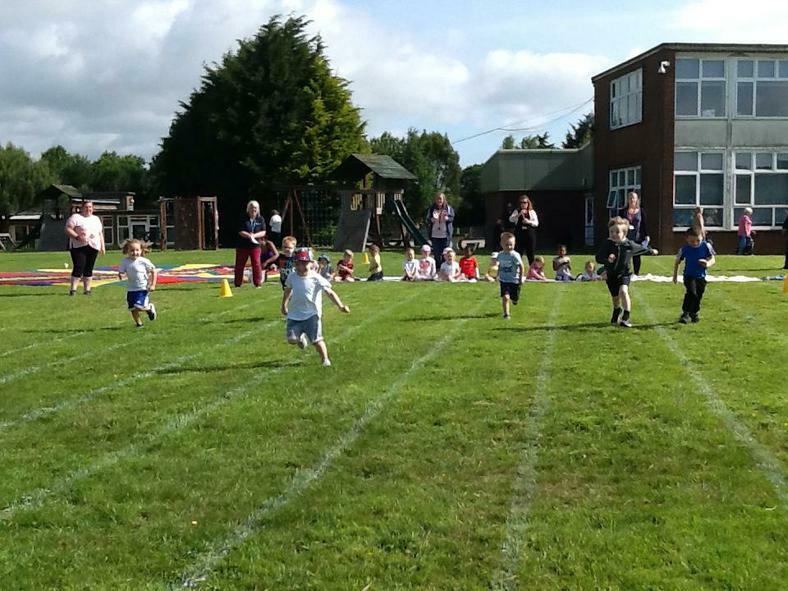 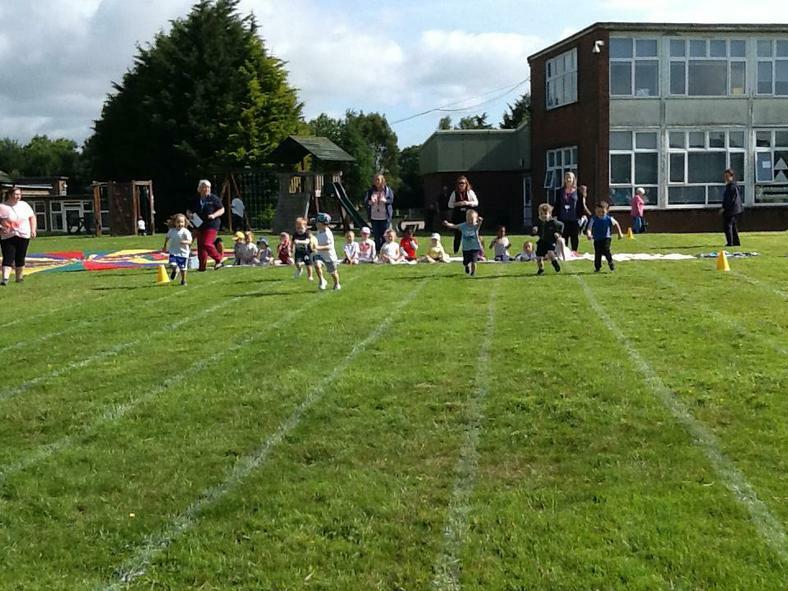 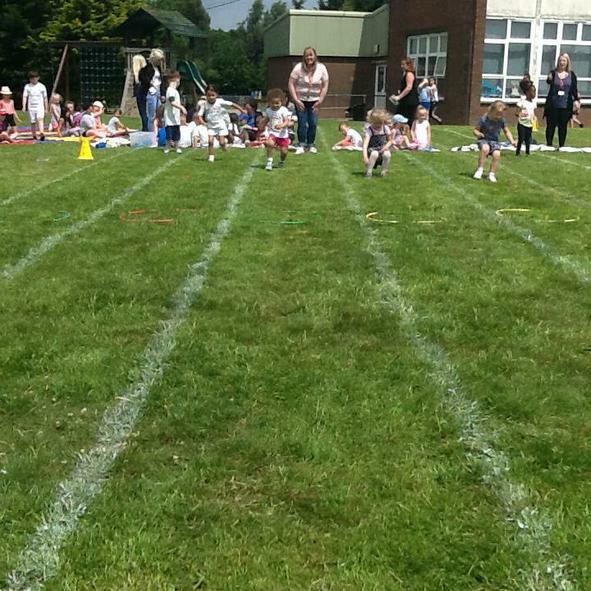 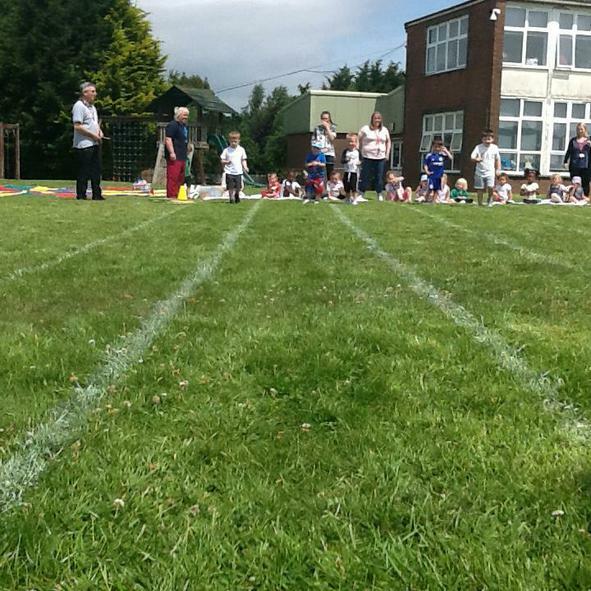 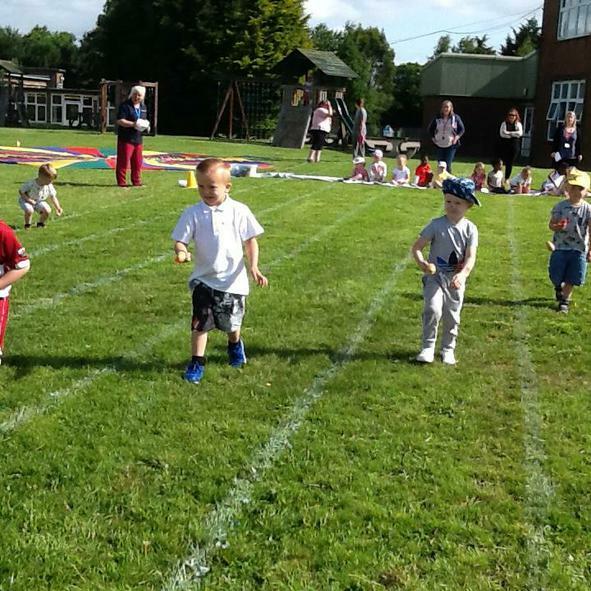 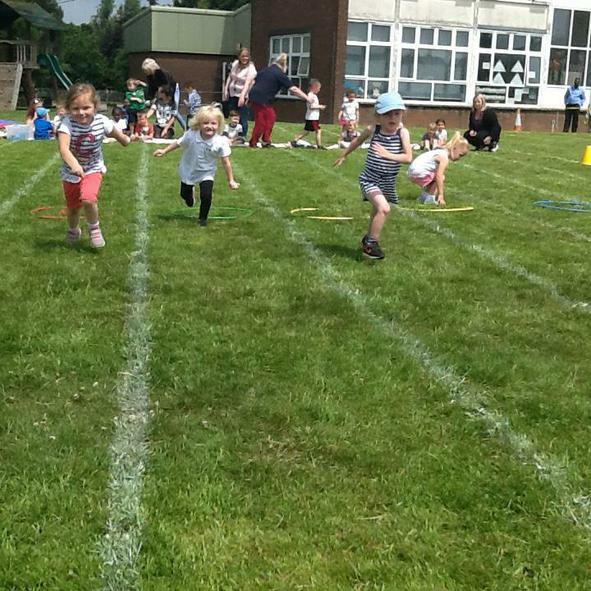 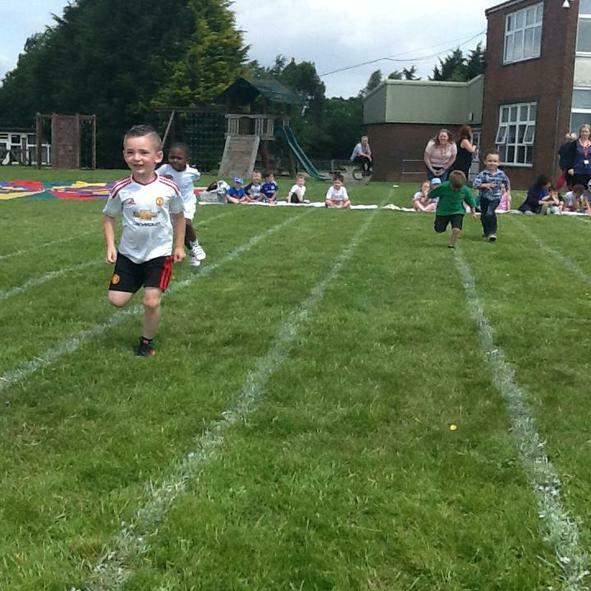 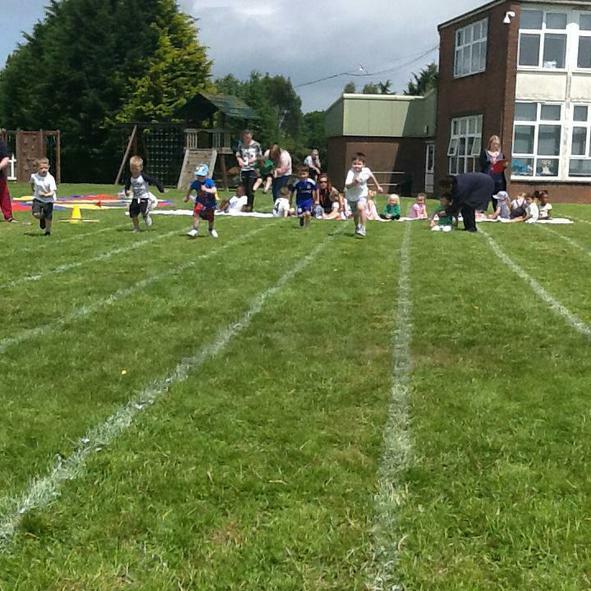 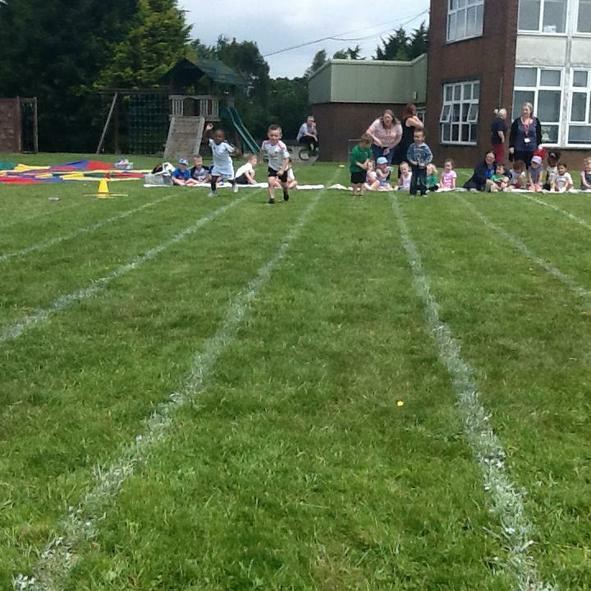 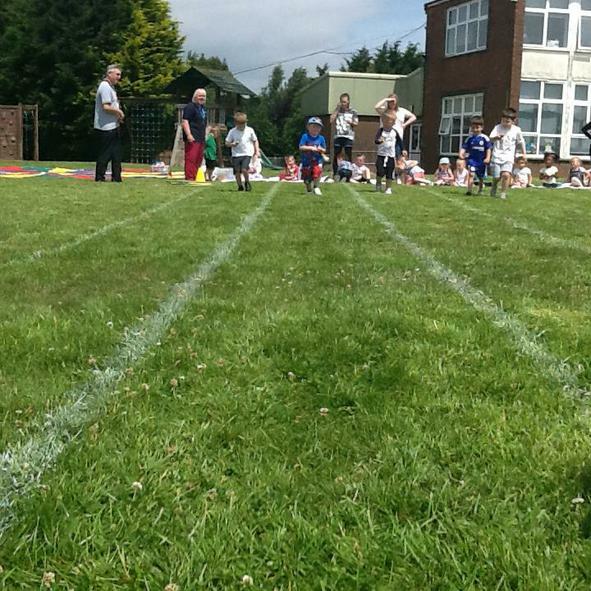 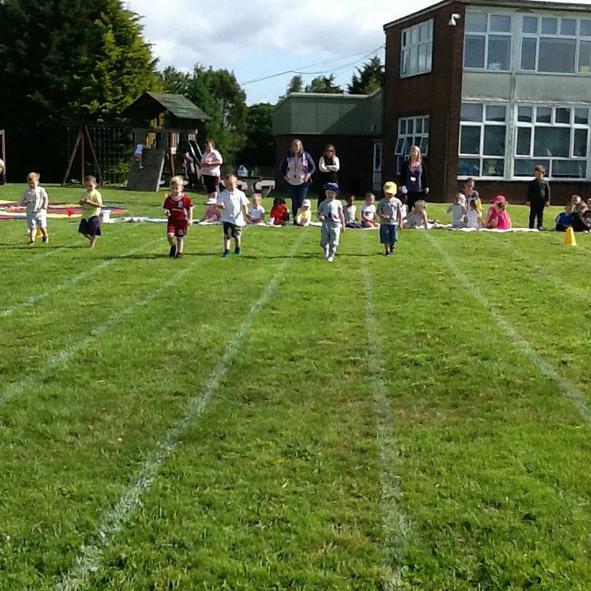 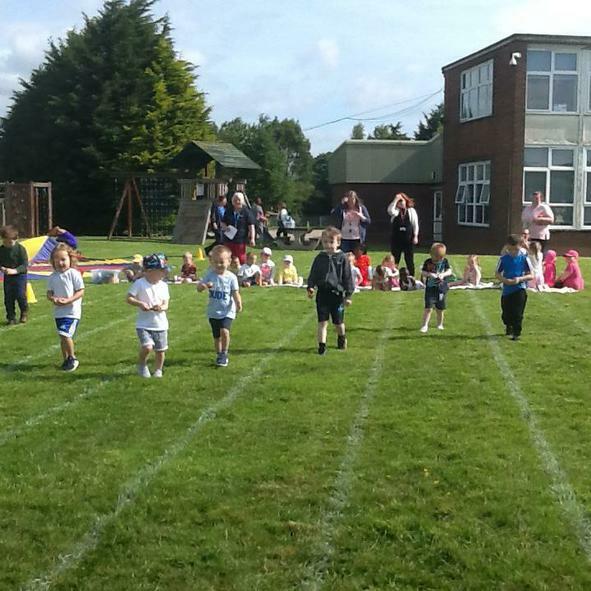 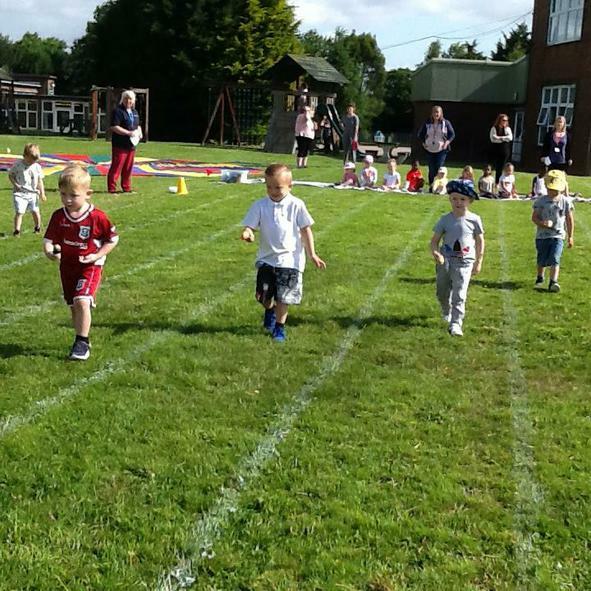 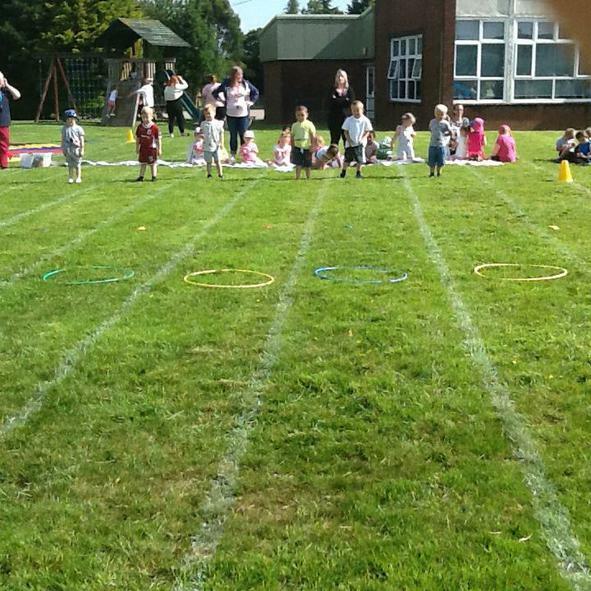 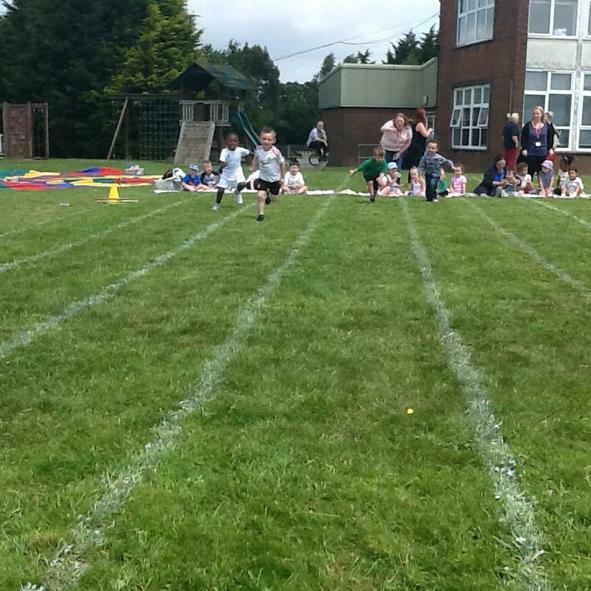 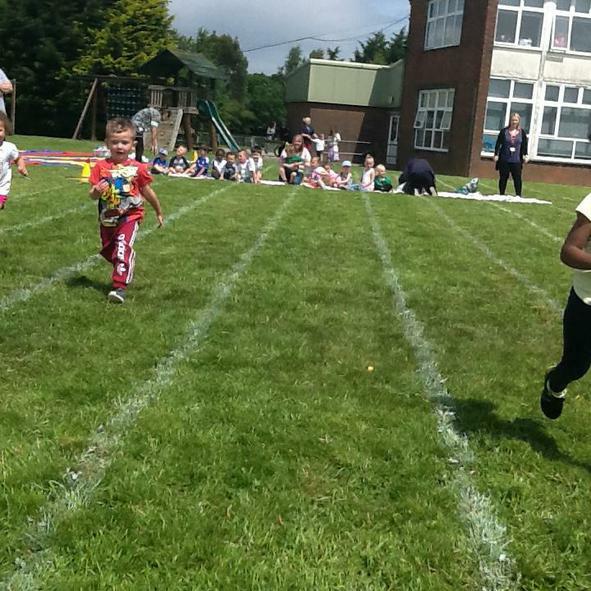 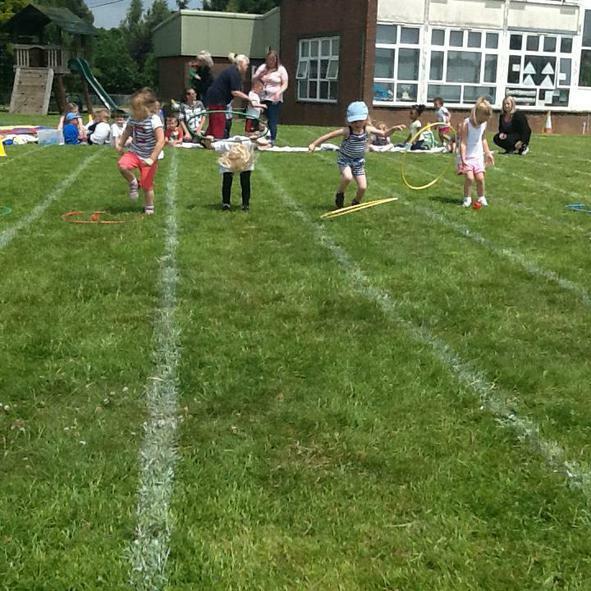 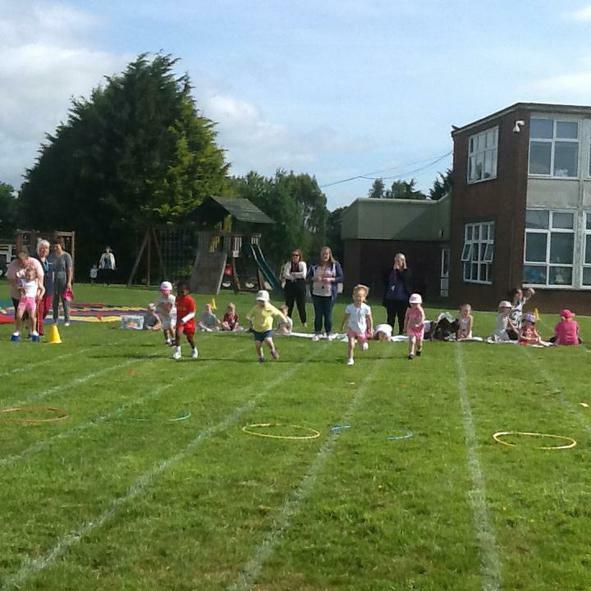 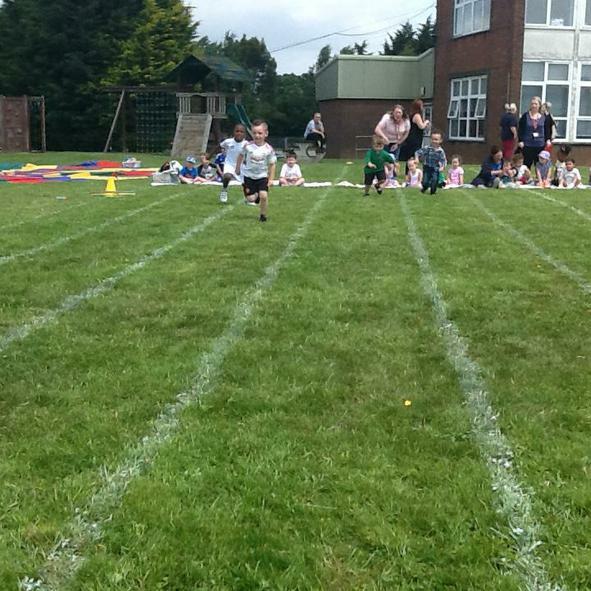 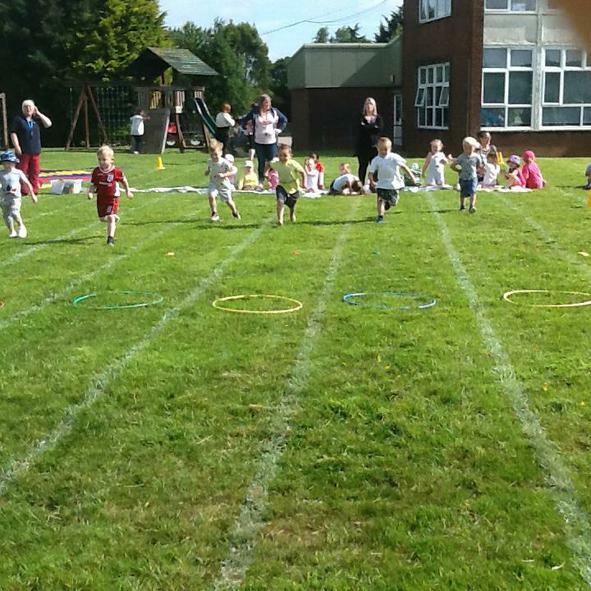 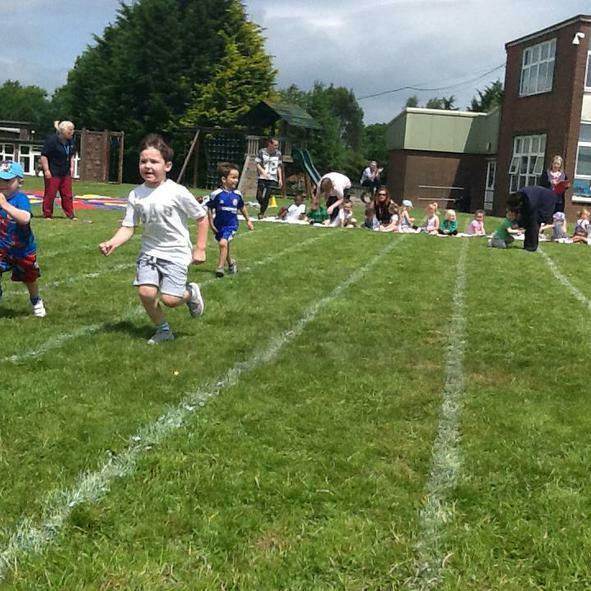 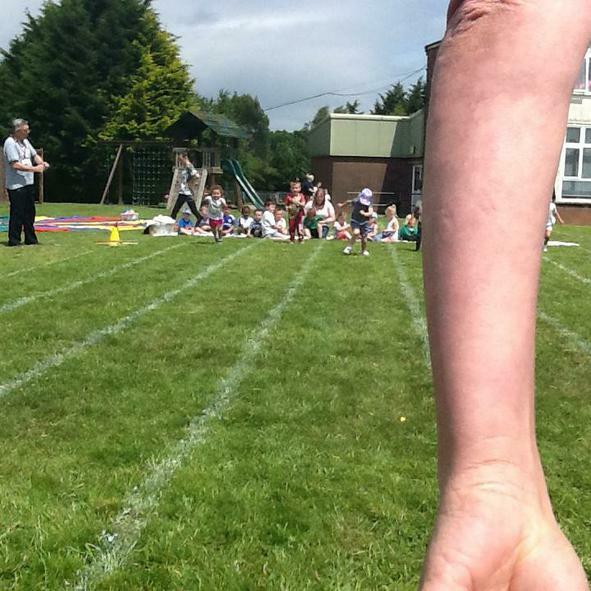 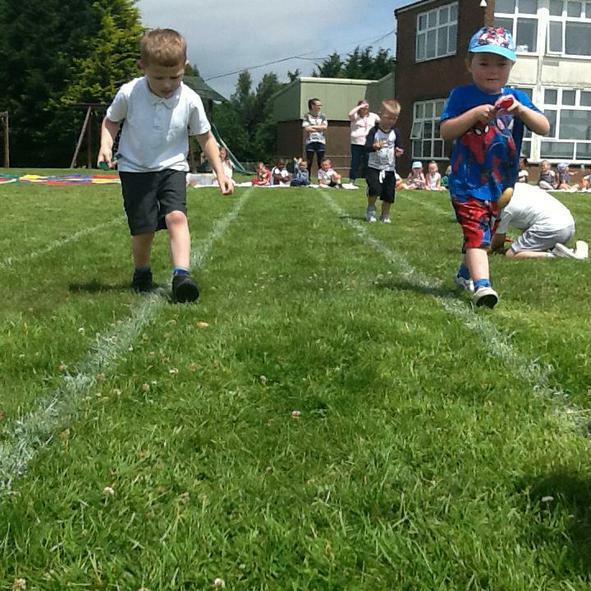 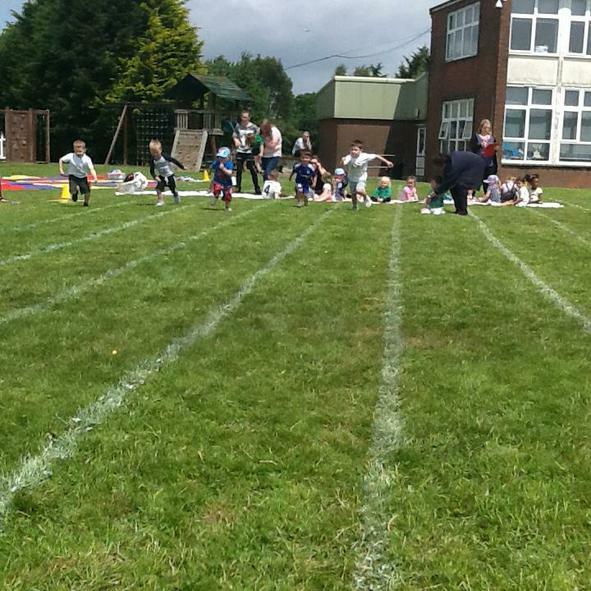 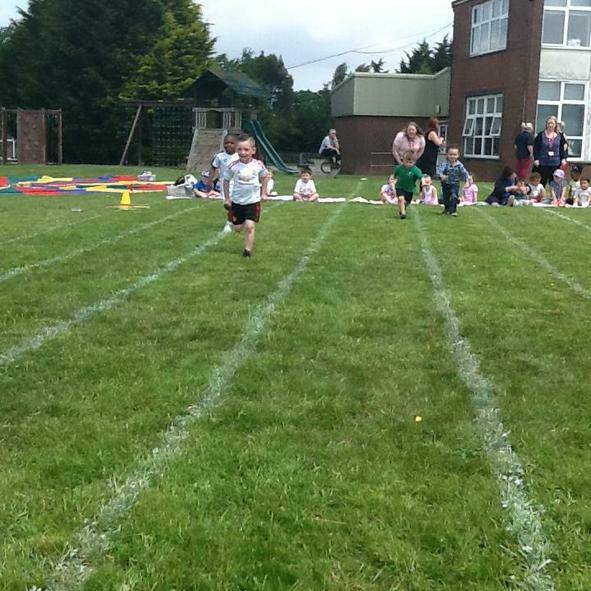 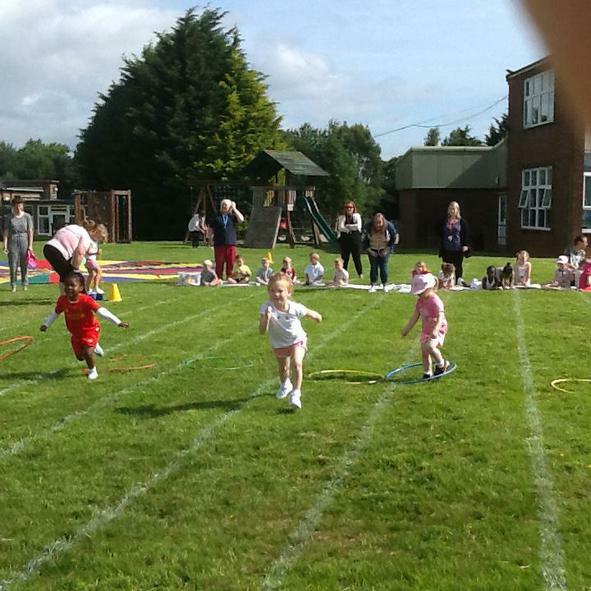 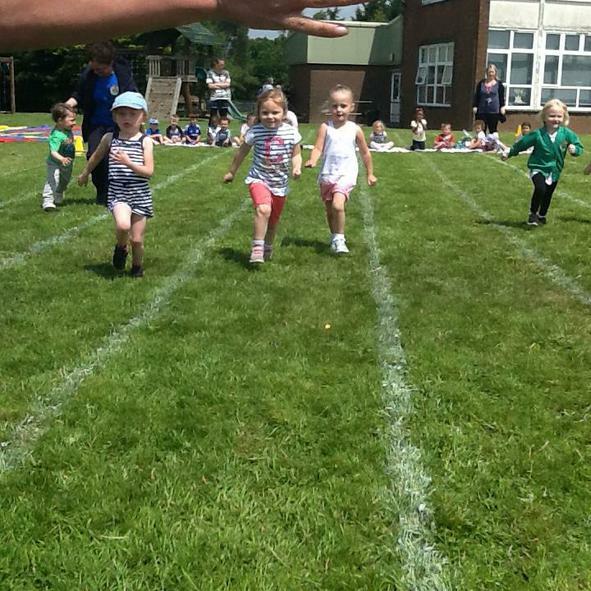 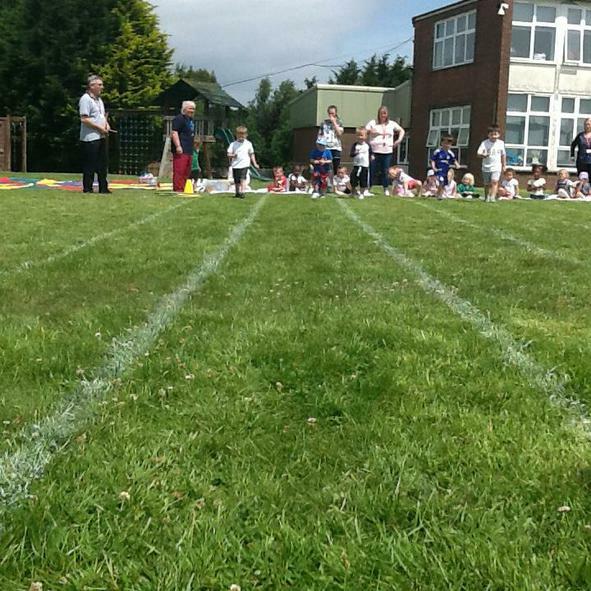 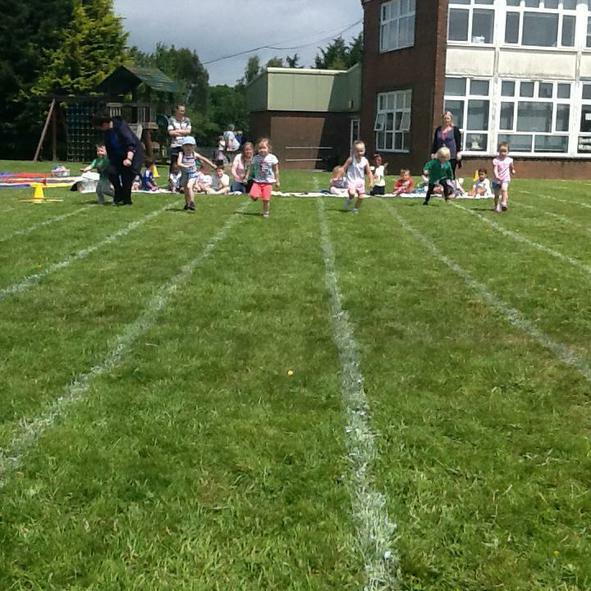 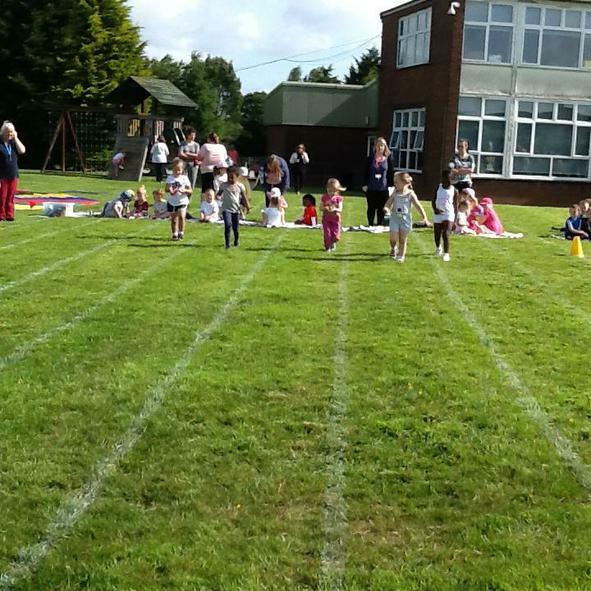 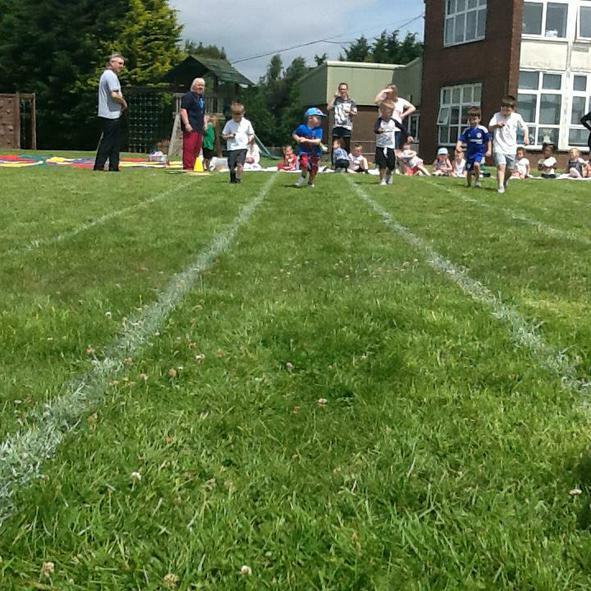 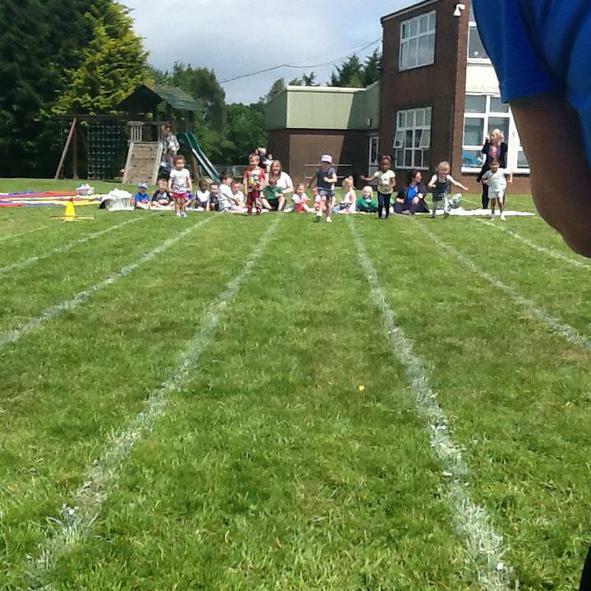 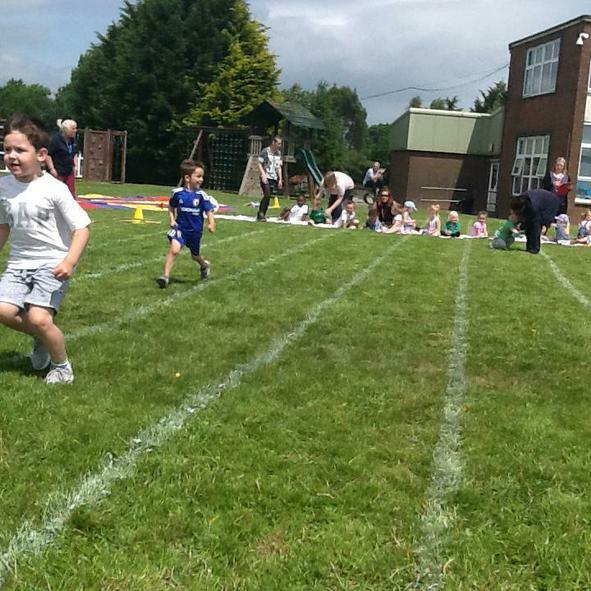 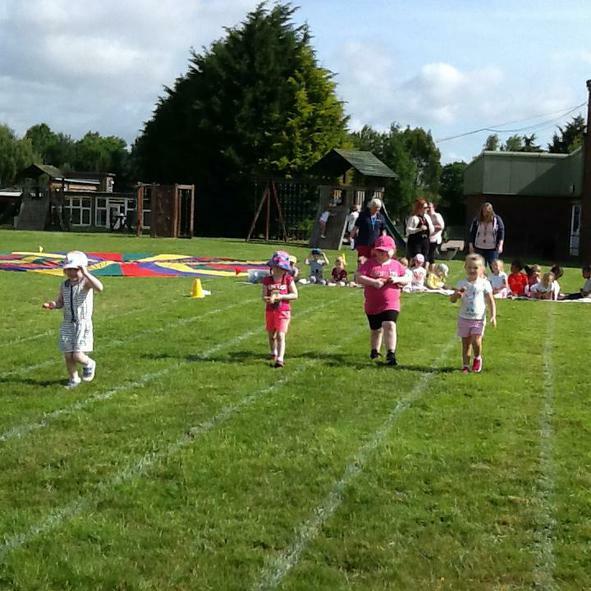 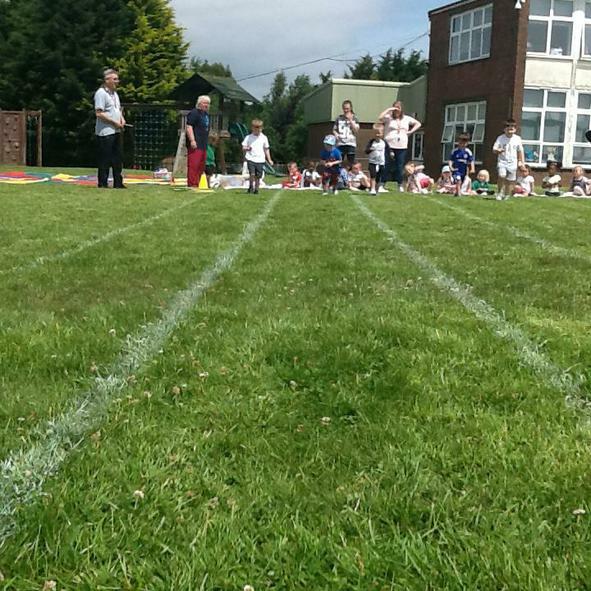 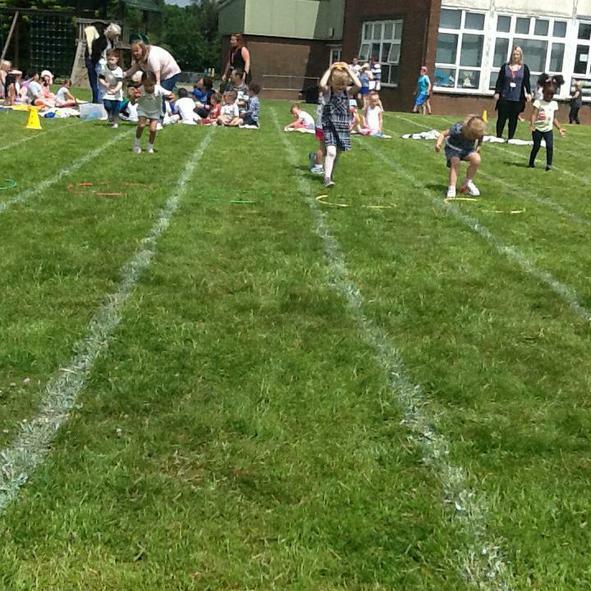 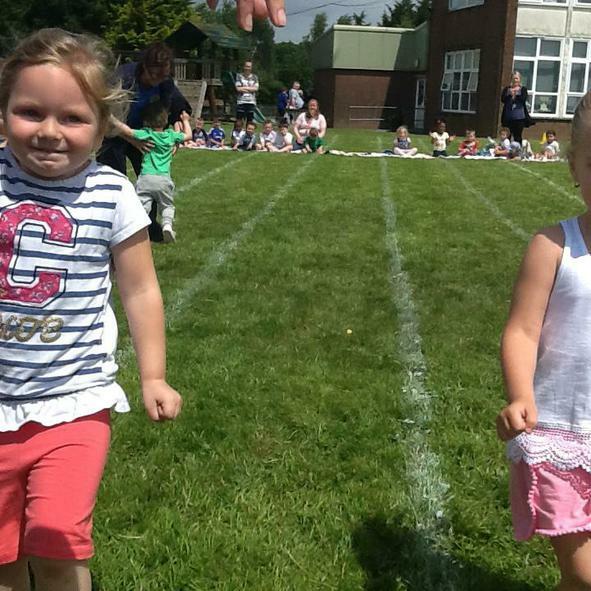 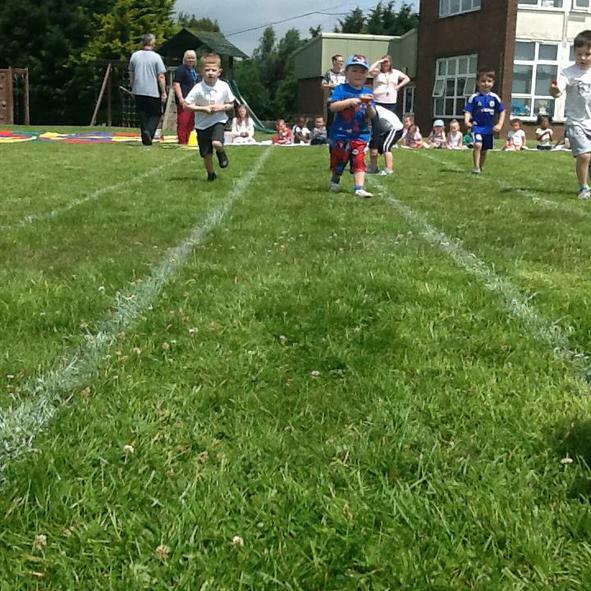 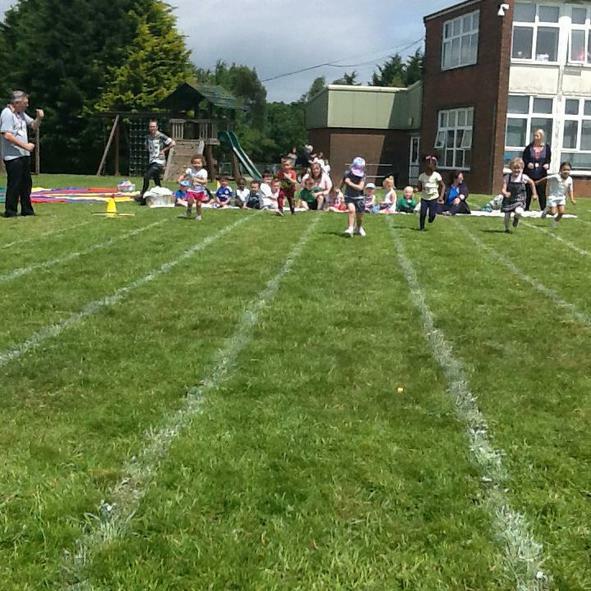 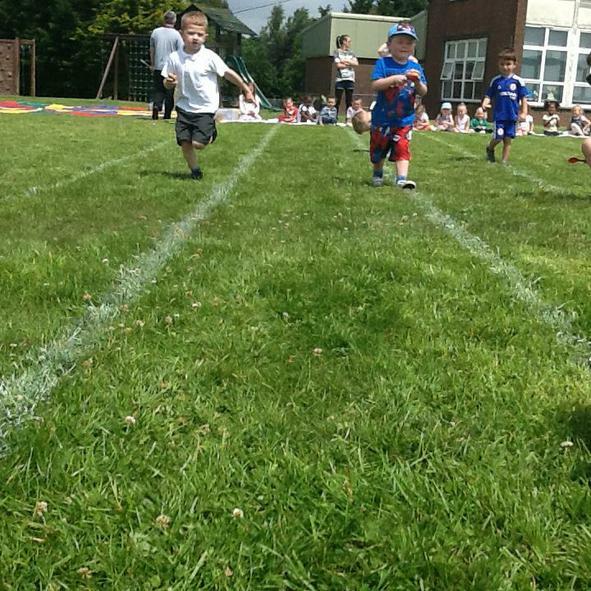 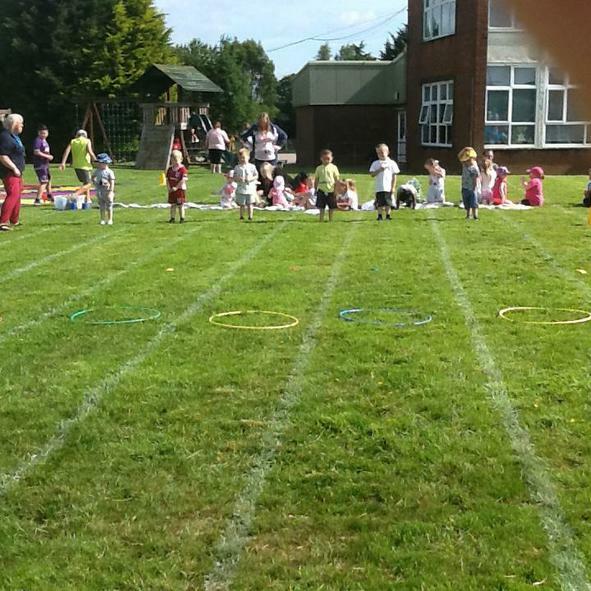 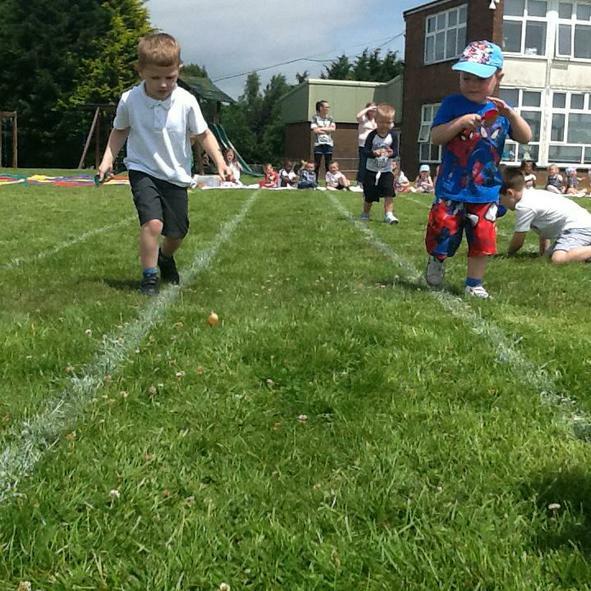 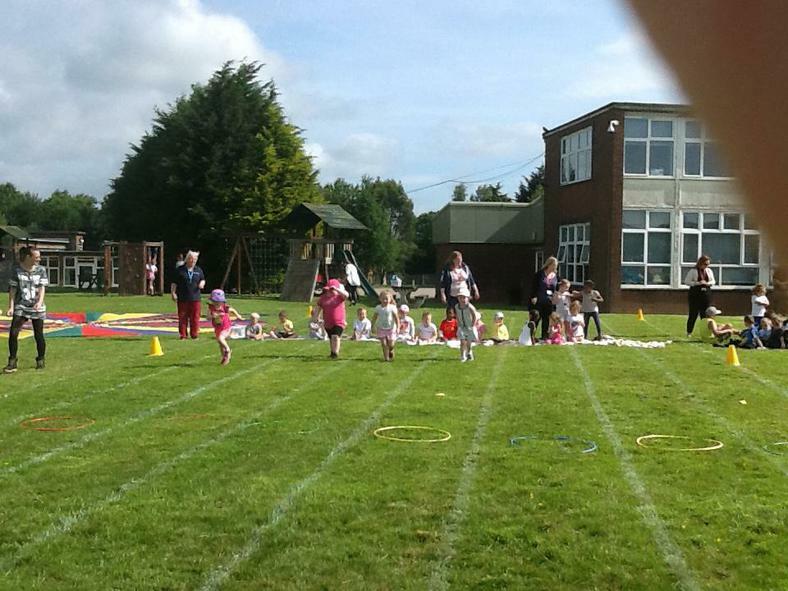 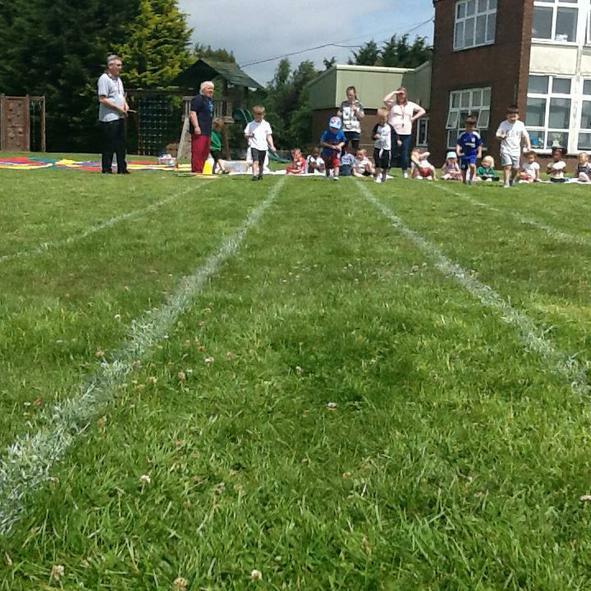 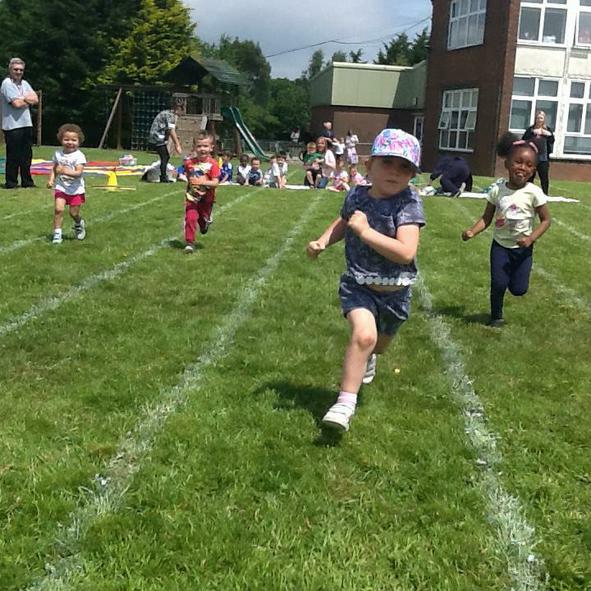 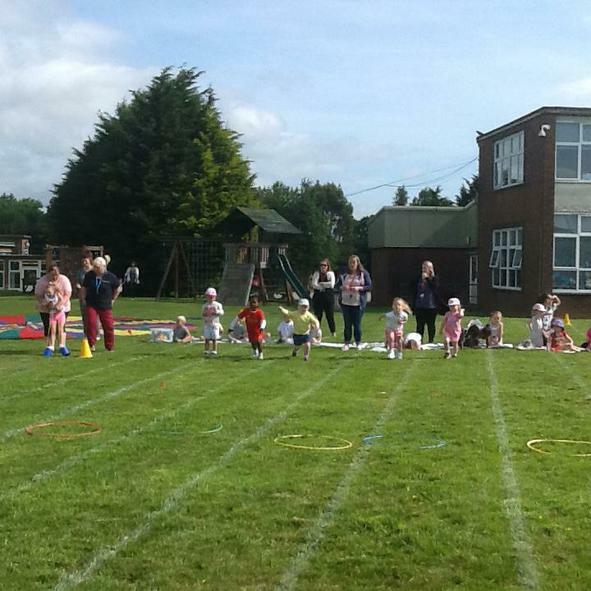 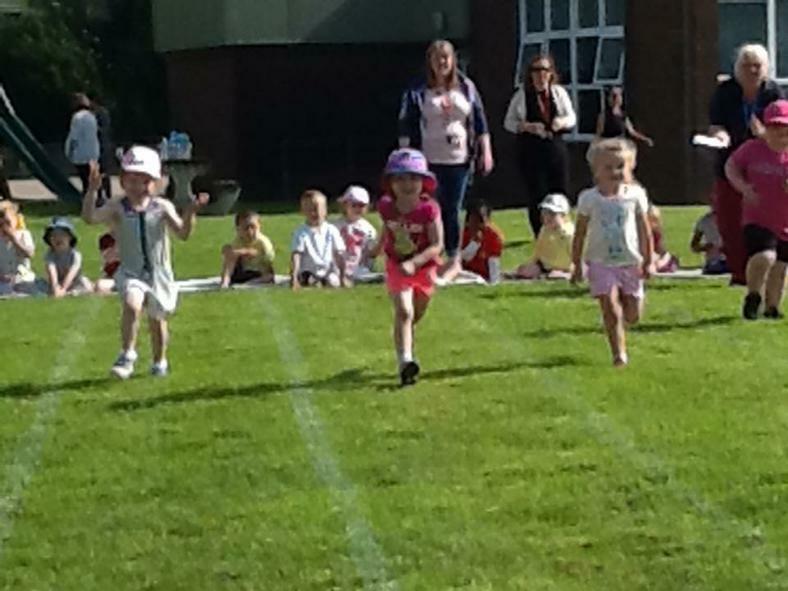 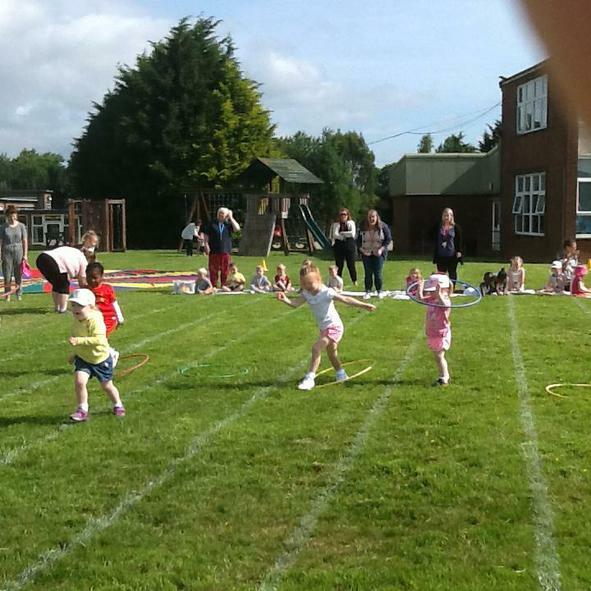 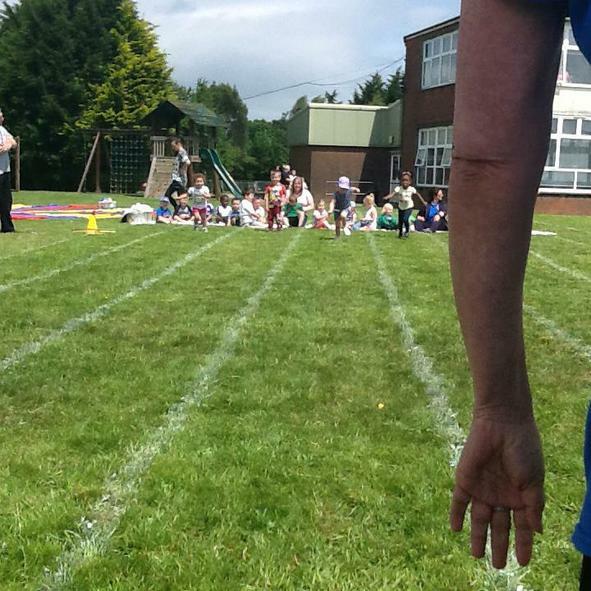 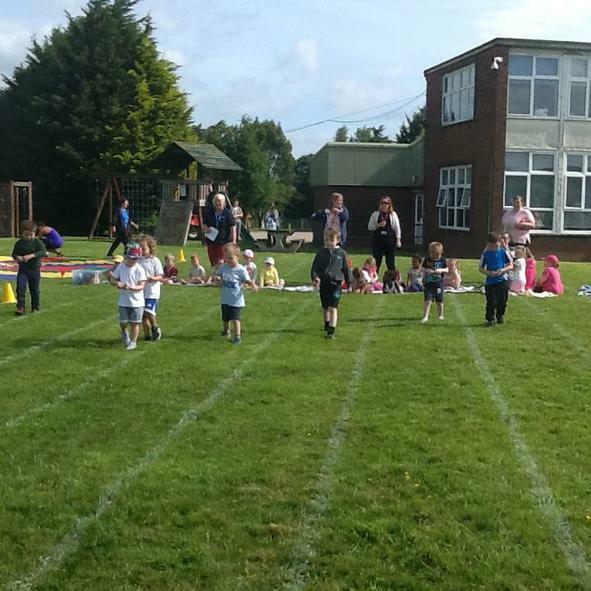 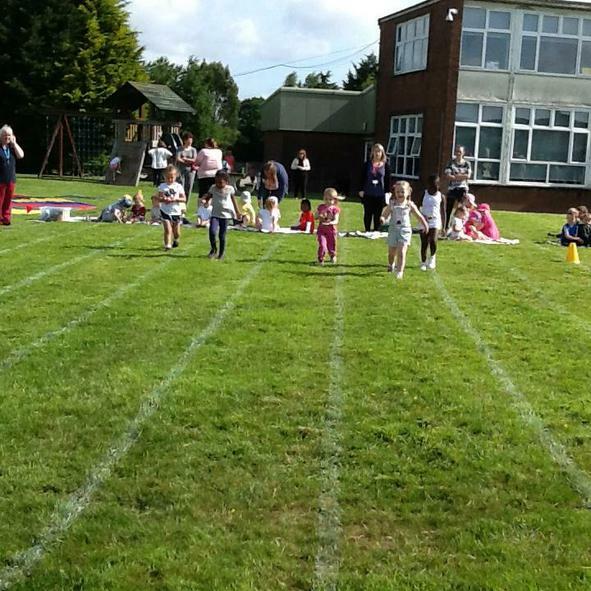 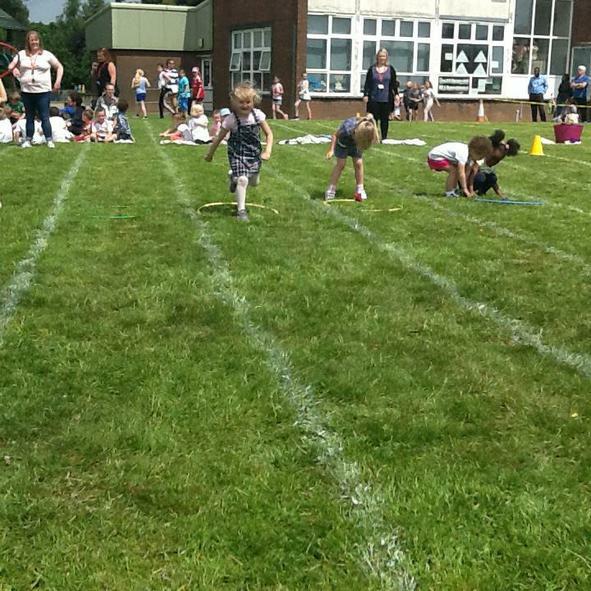 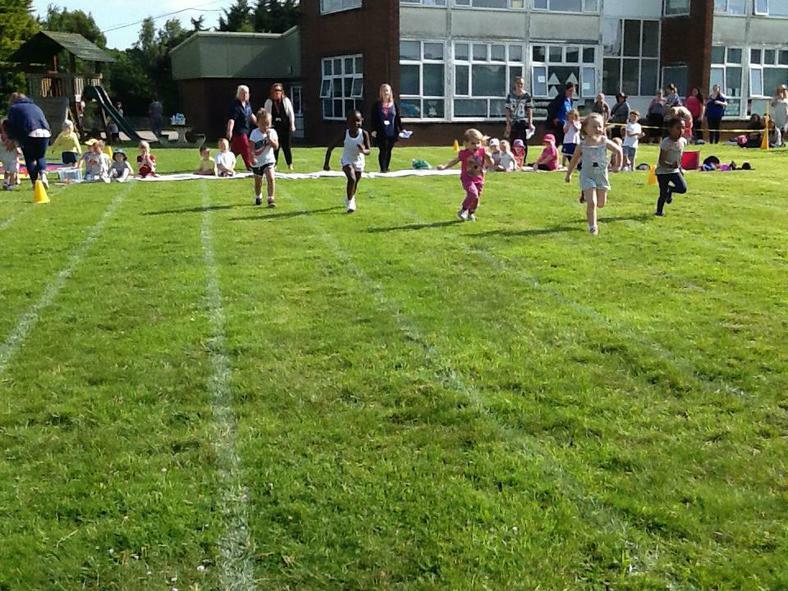 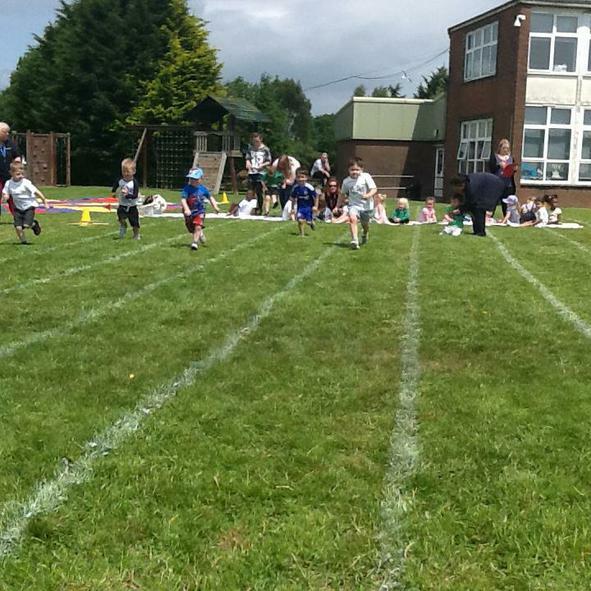 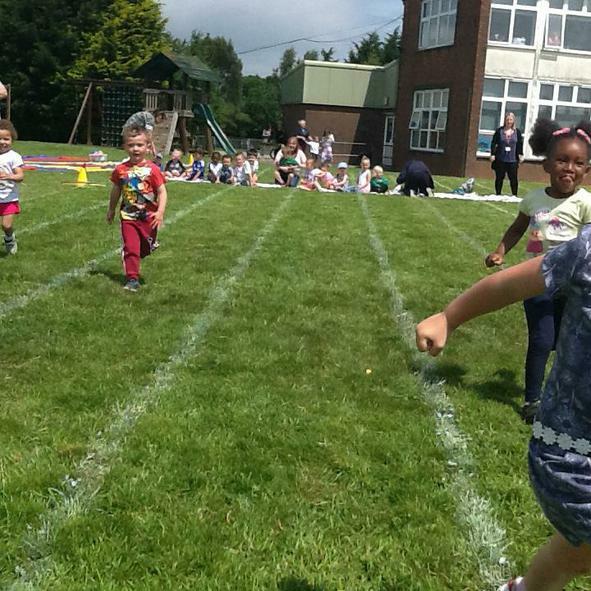 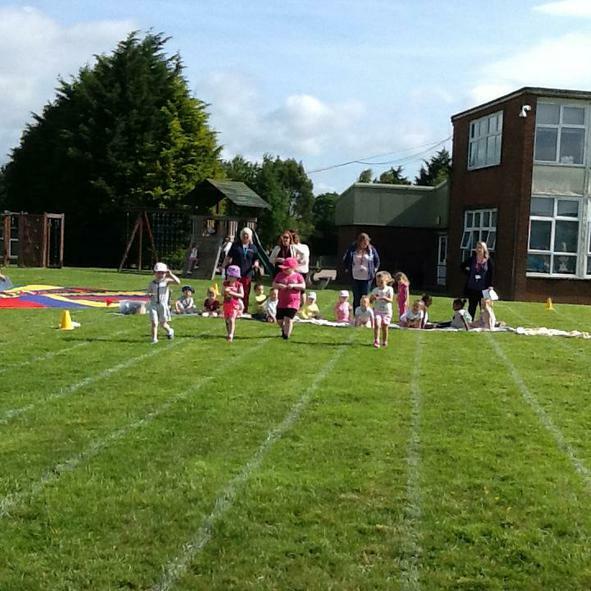 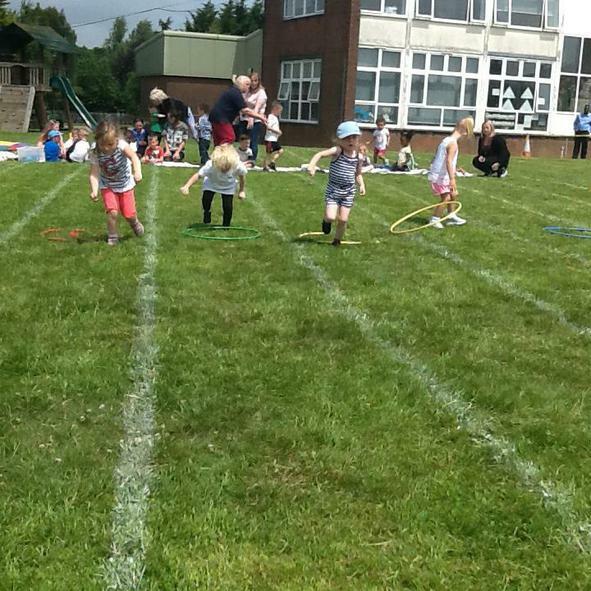 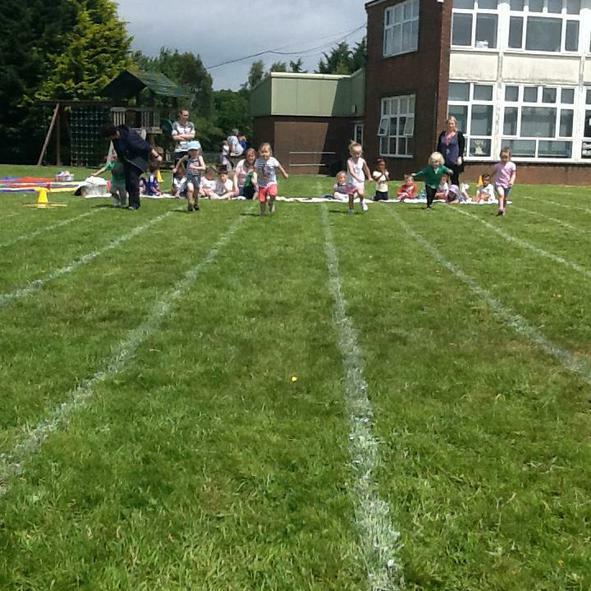 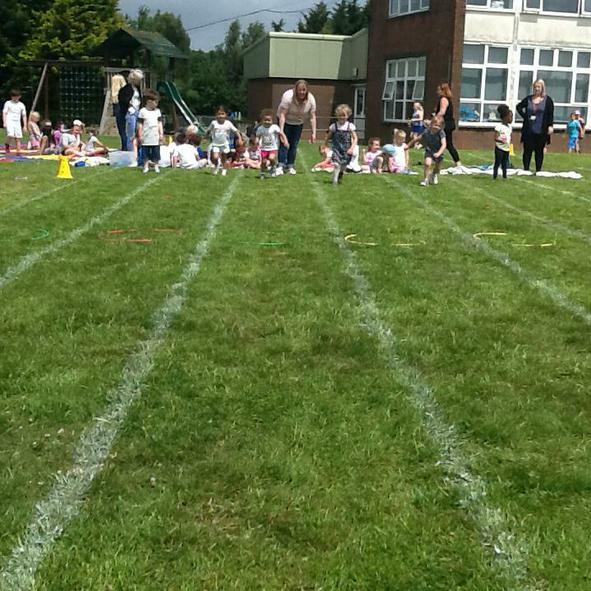 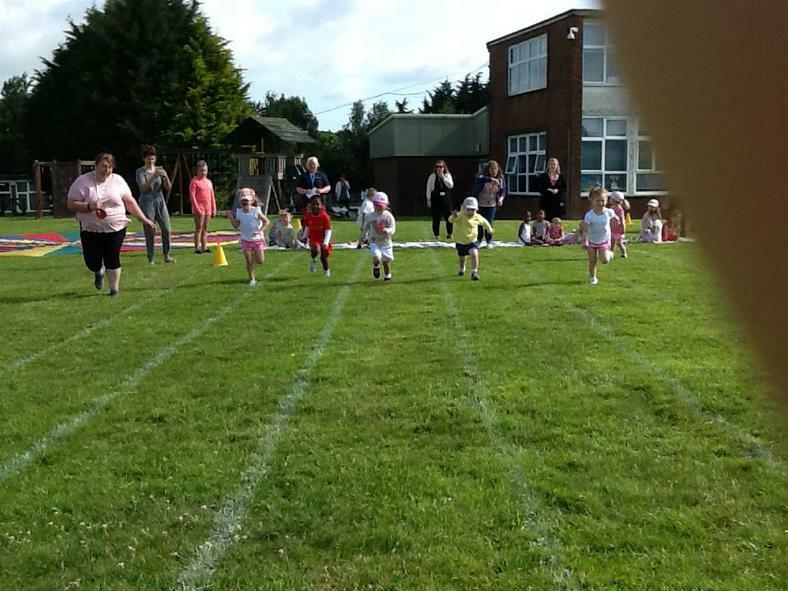 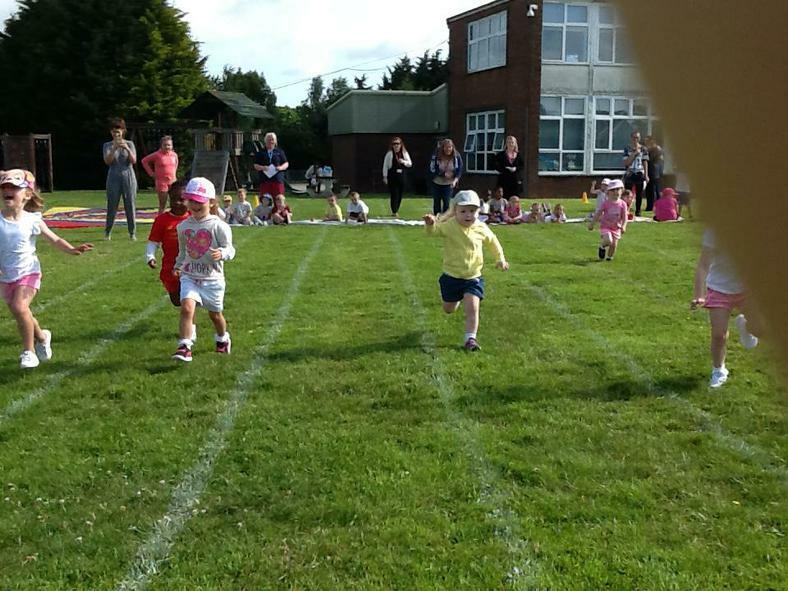 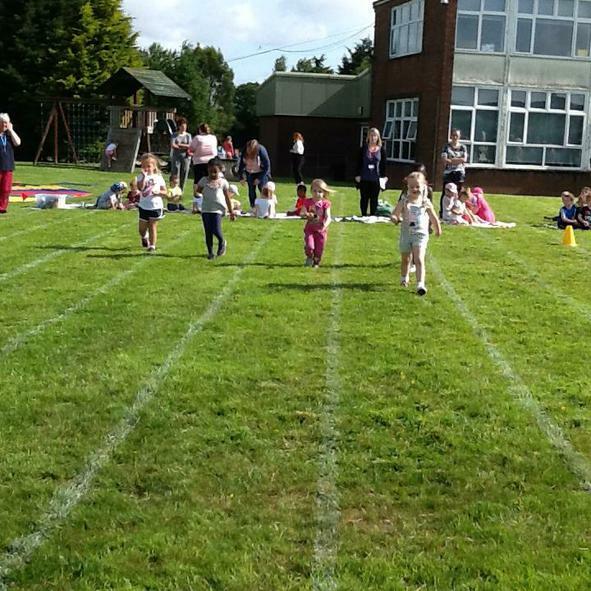 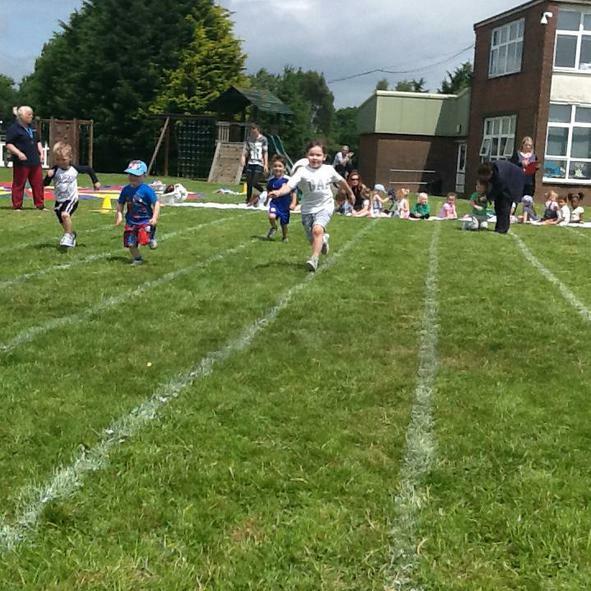 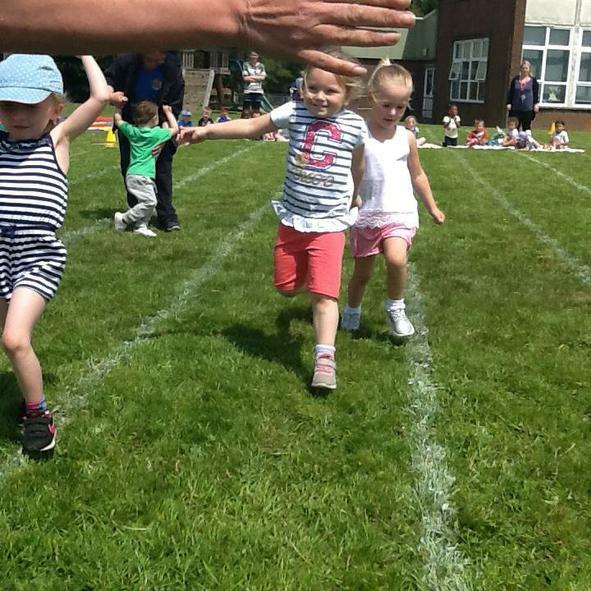 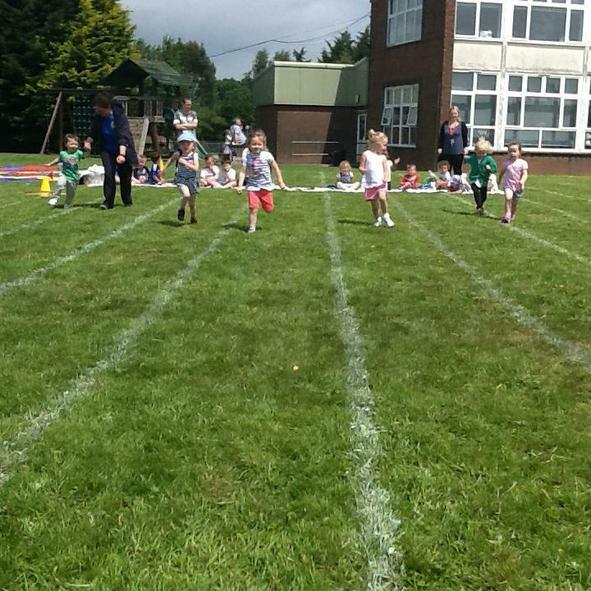 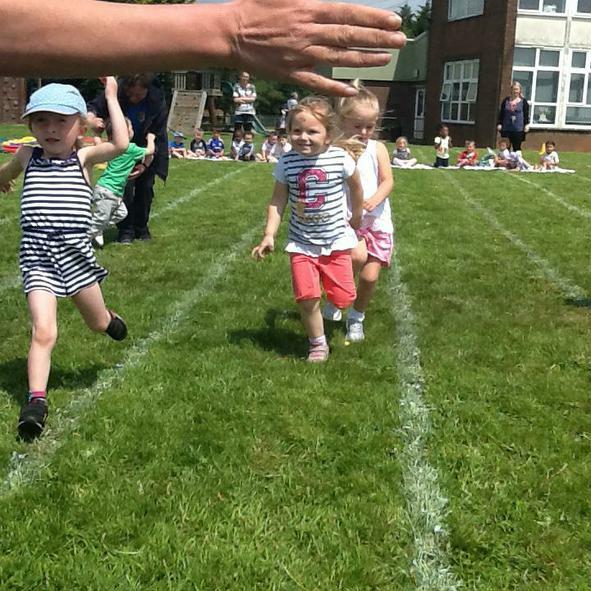 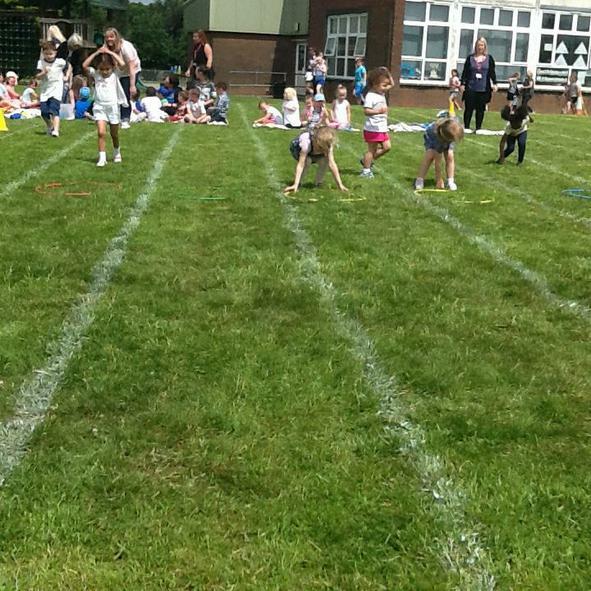 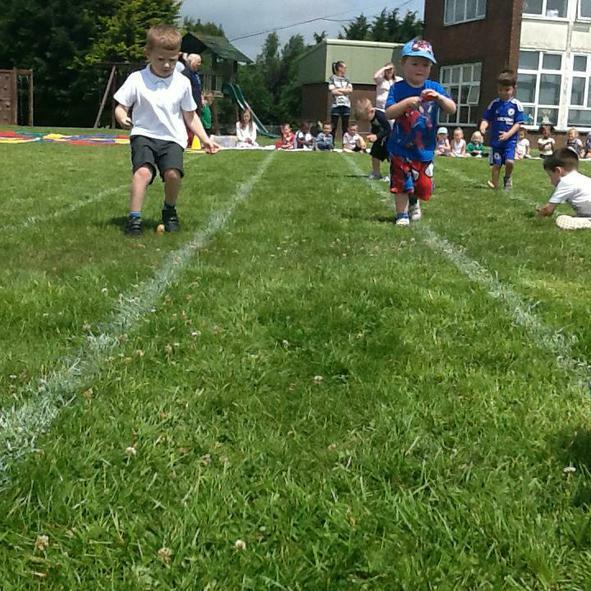 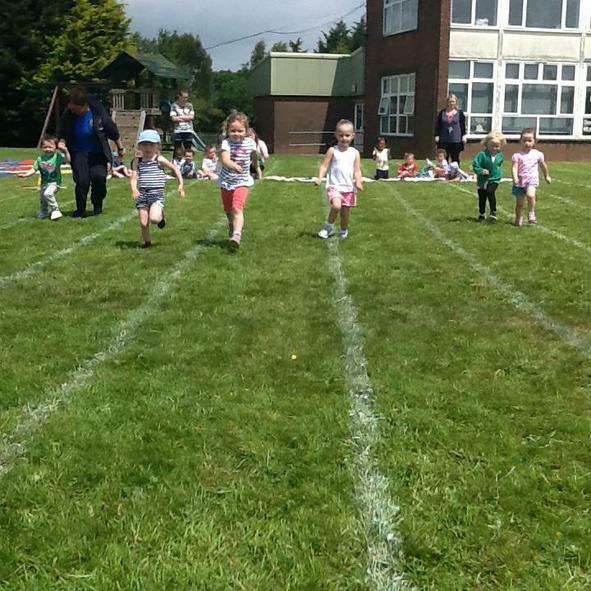 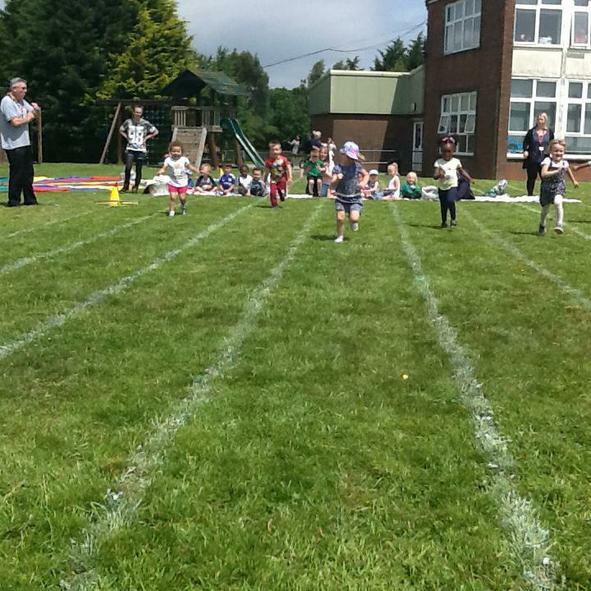 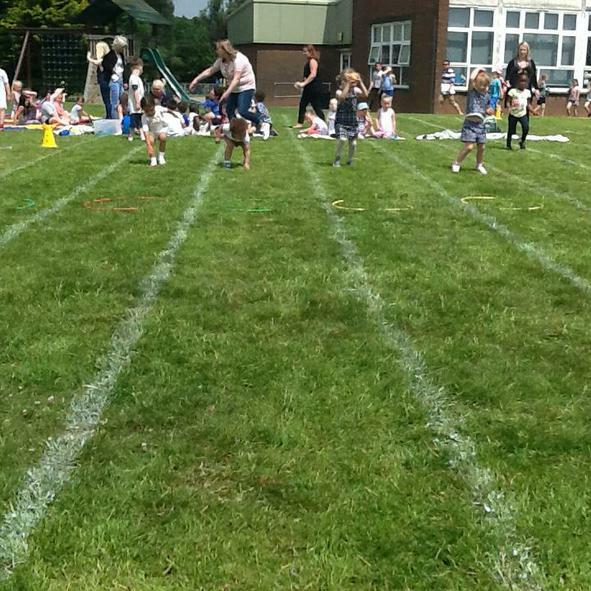 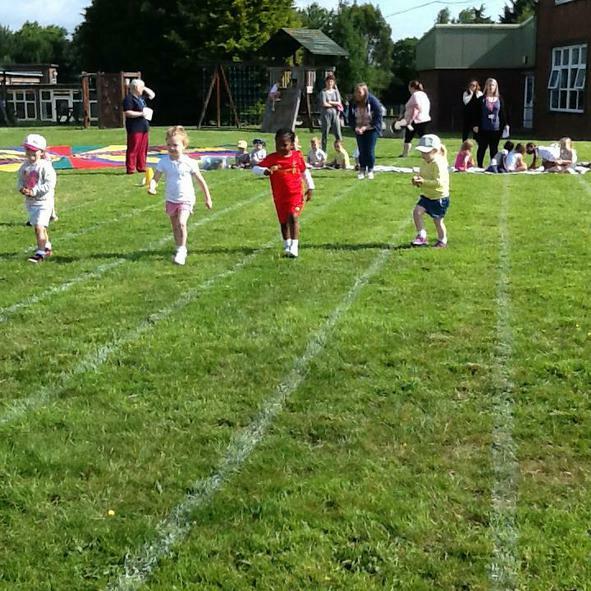 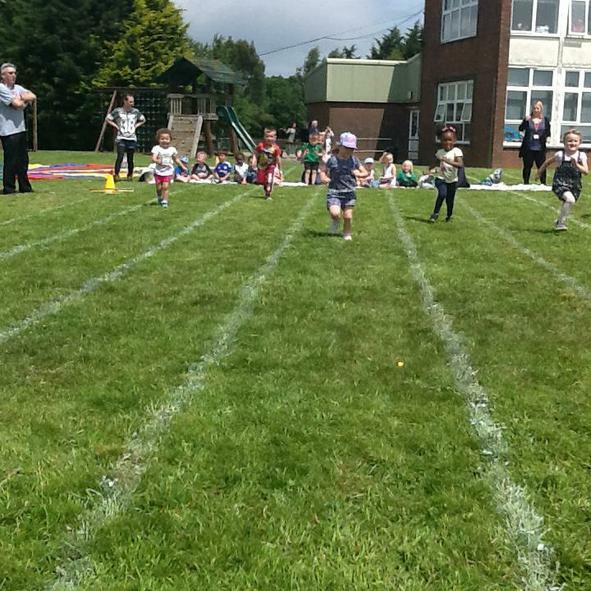 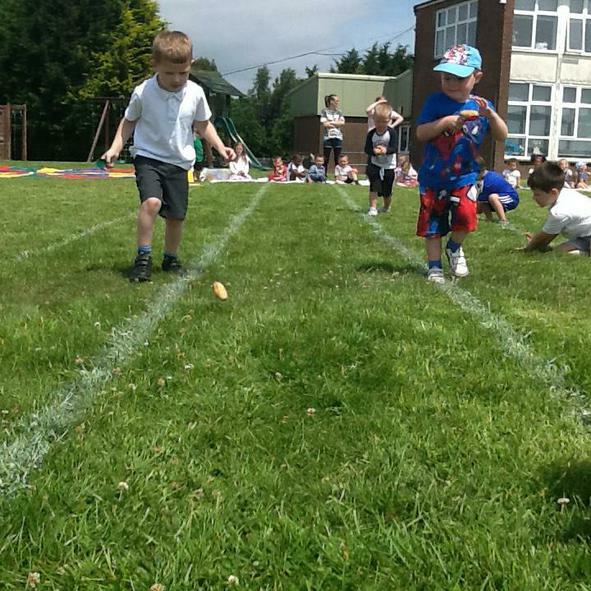 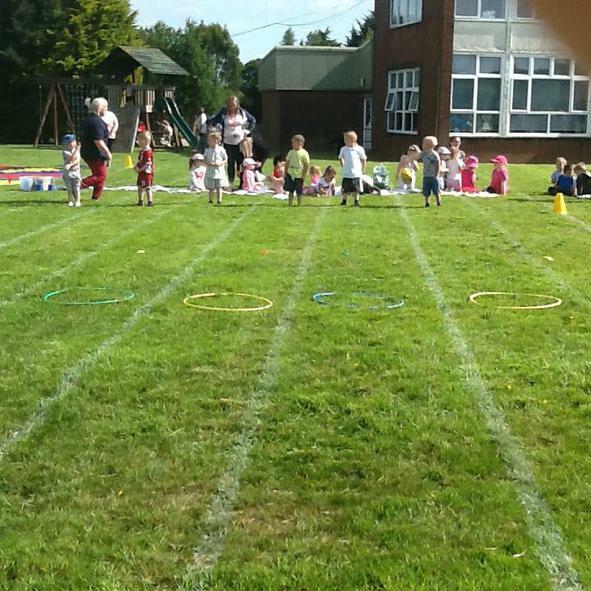 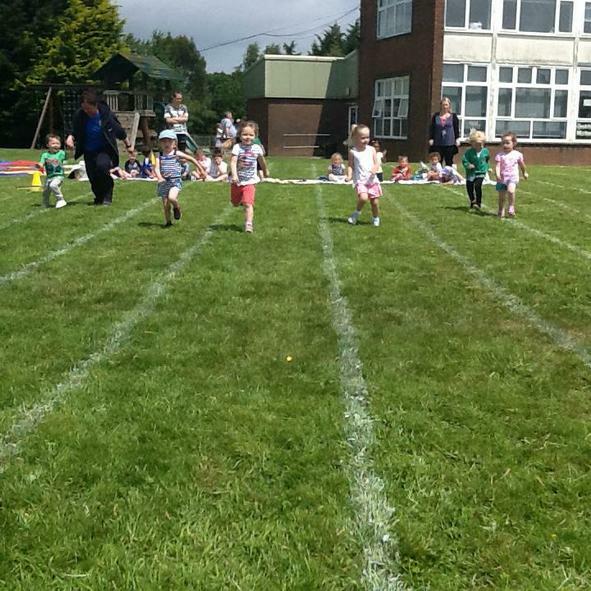 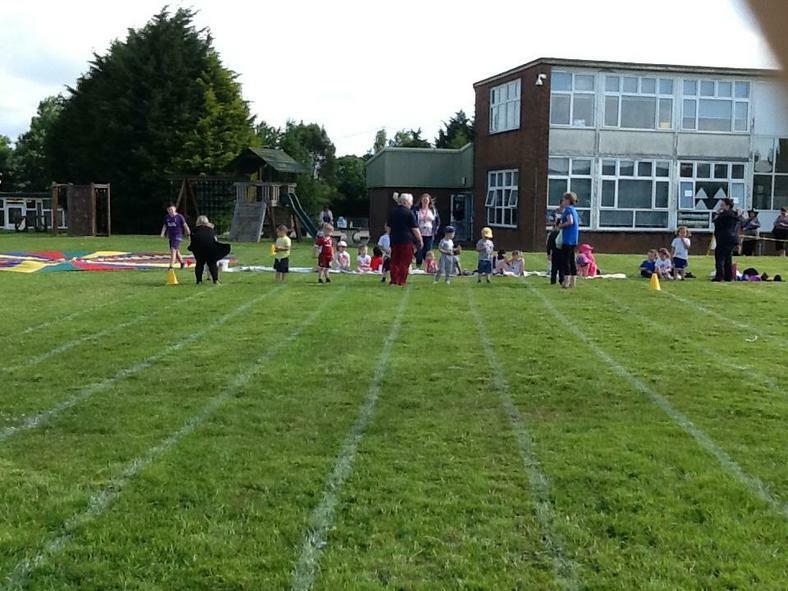 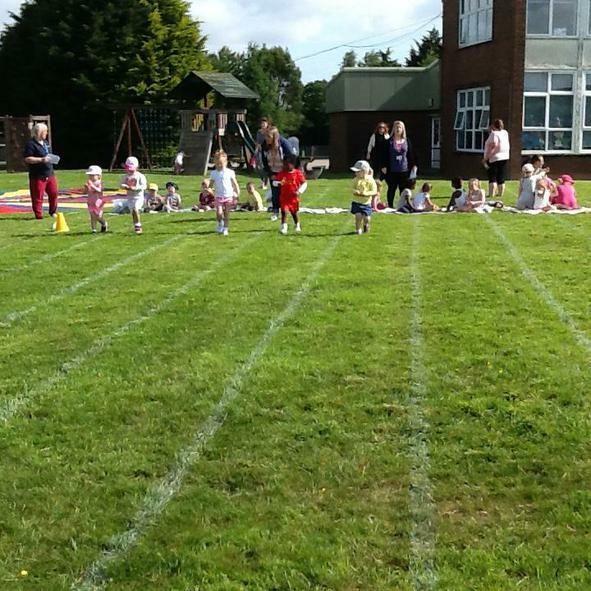 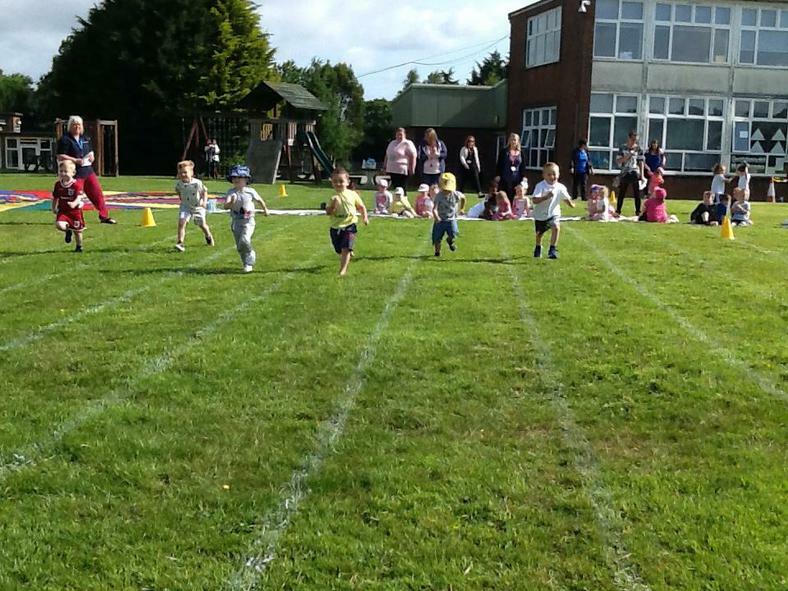 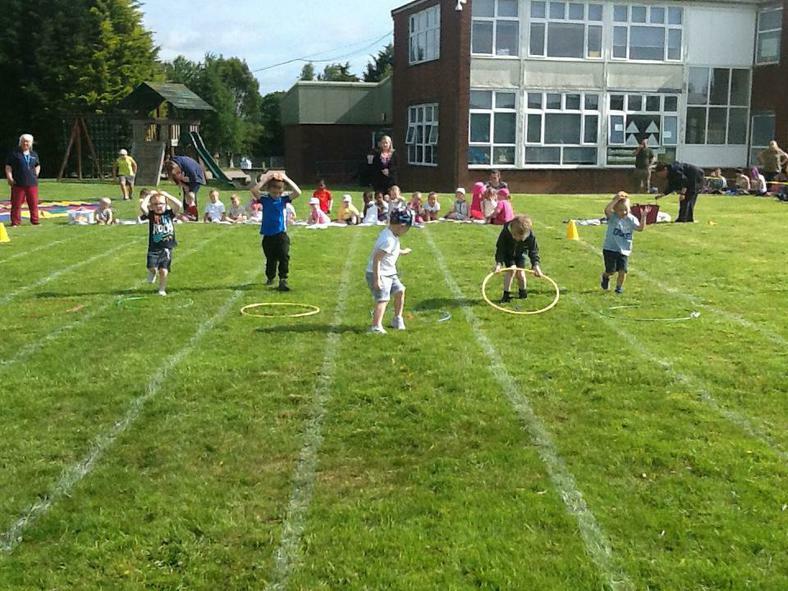 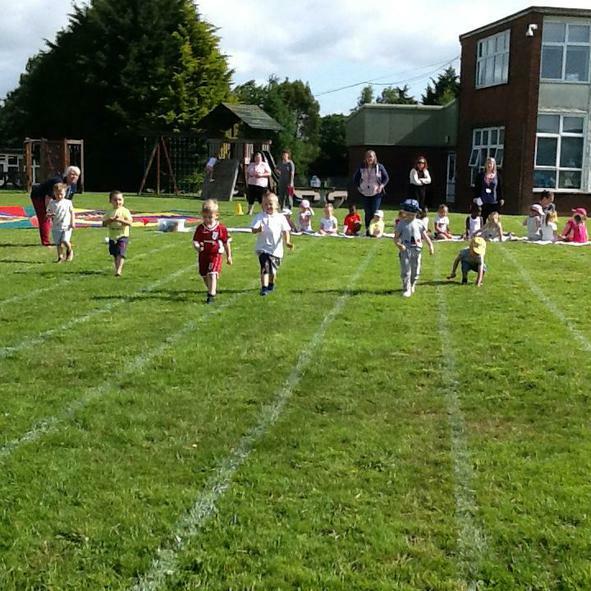 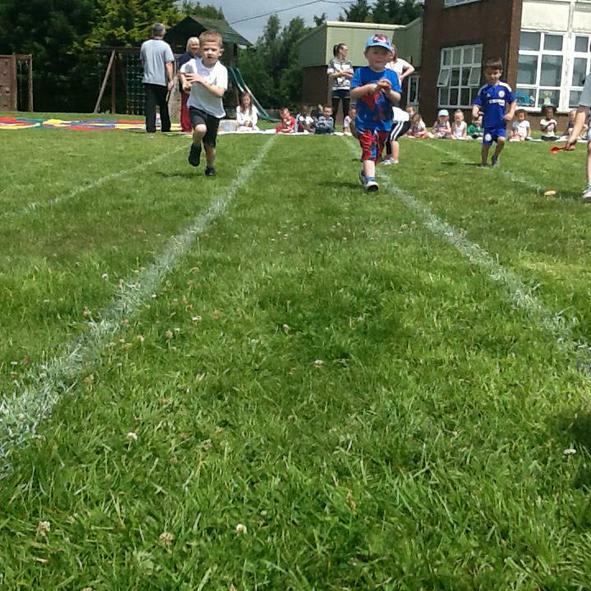 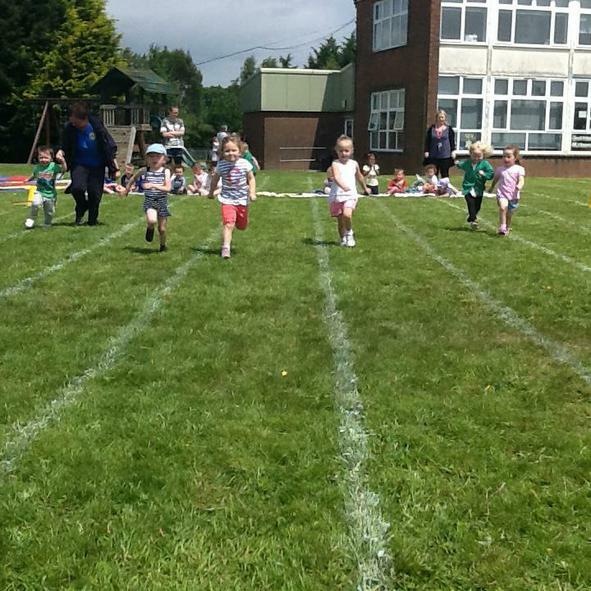 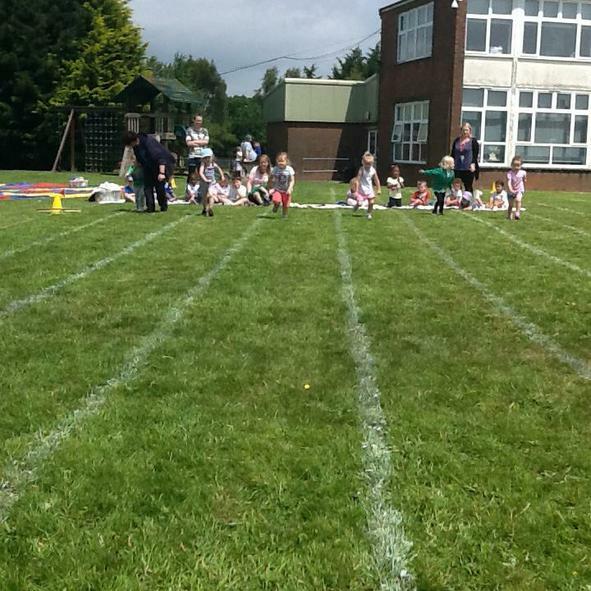 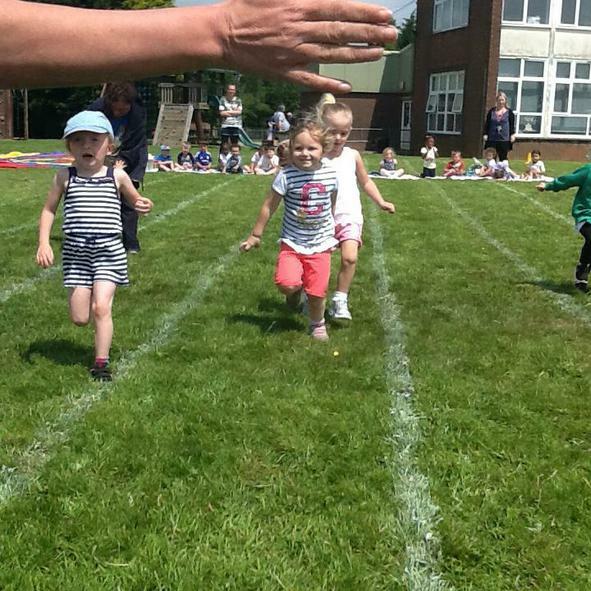 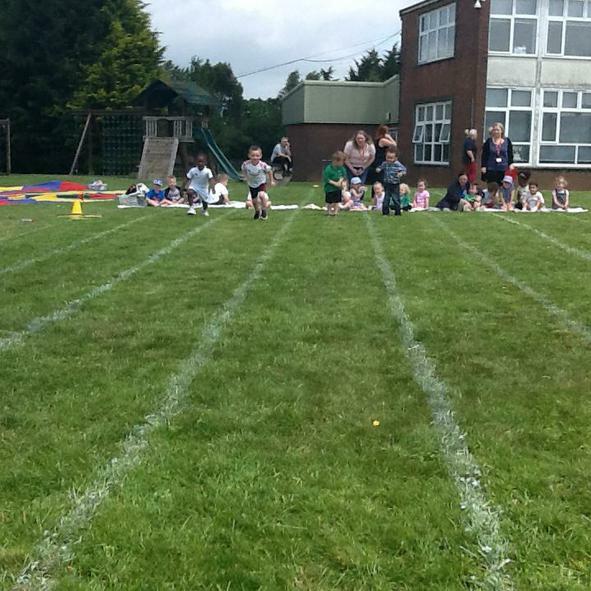 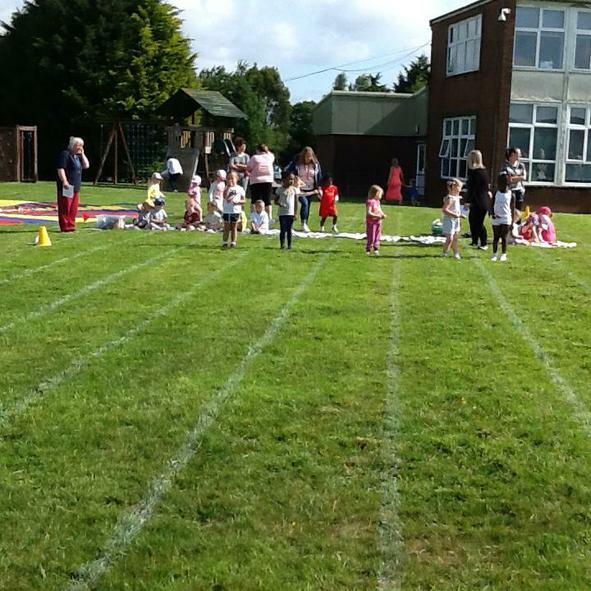 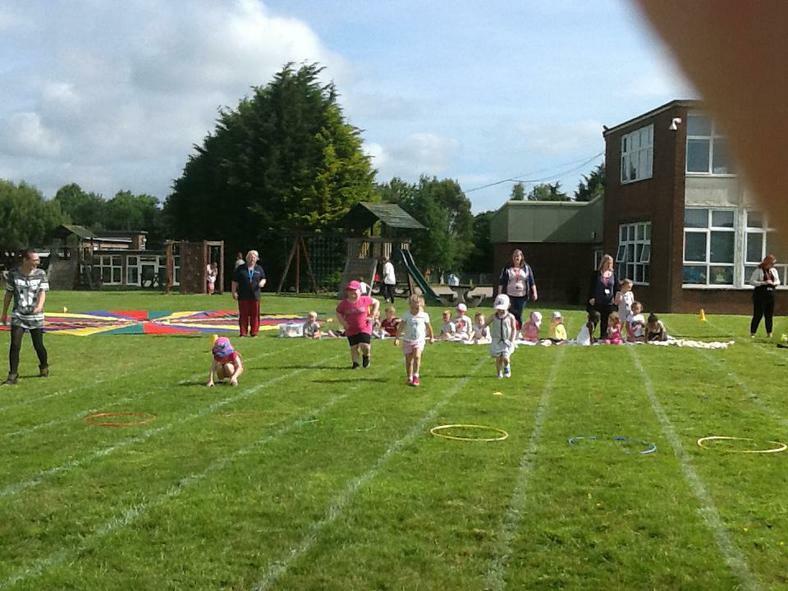 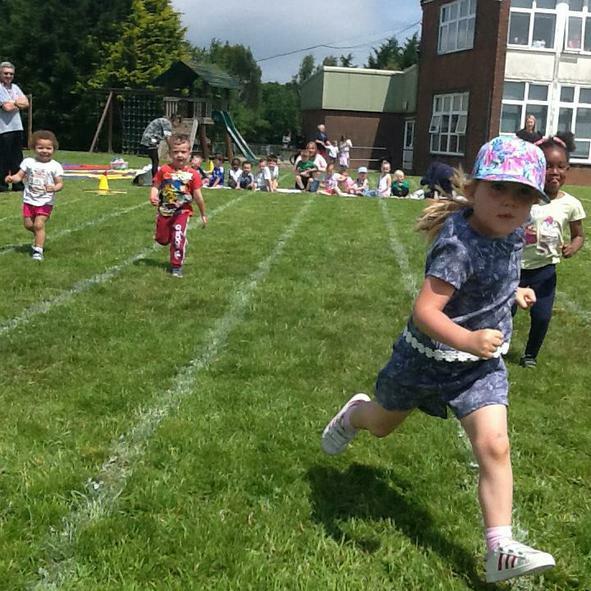 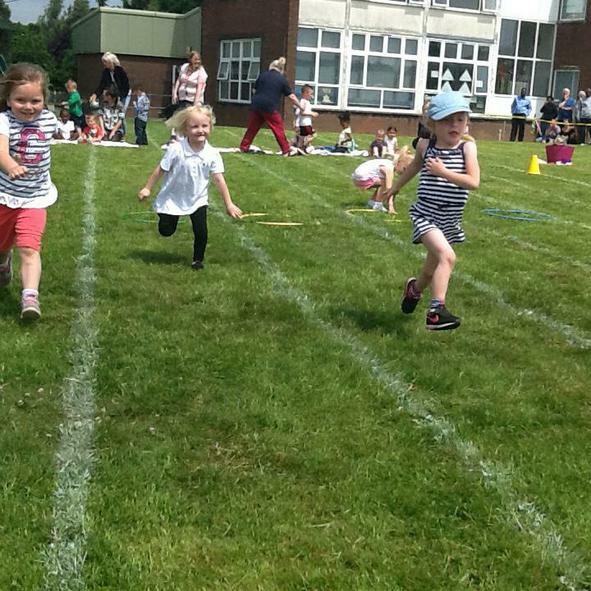 The children will be racing outside, choosing whether to be the fast Hare or the slow and steady Tortoise. 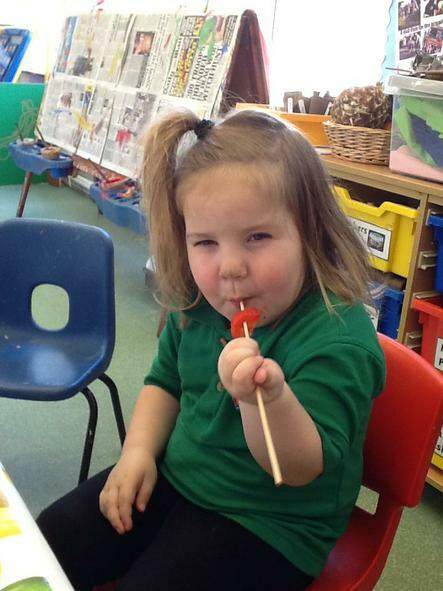 We will have the opportunity to act out the story using stick puppets that we make. 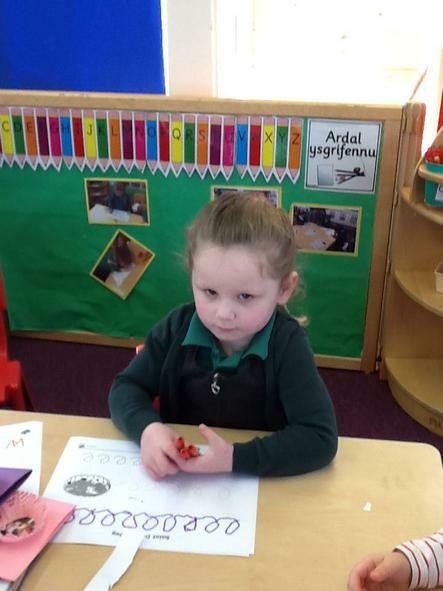 We will also have a counting activity, we will be recognising and writing numbers 1-3, 1-5, and 1-10. 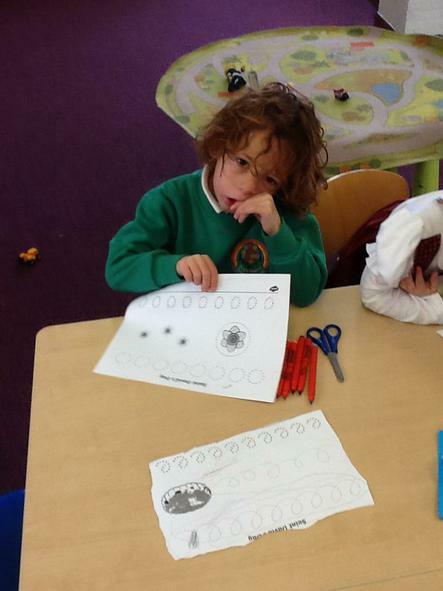 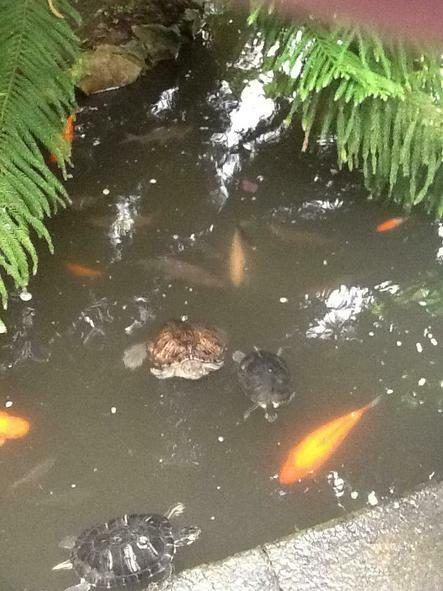 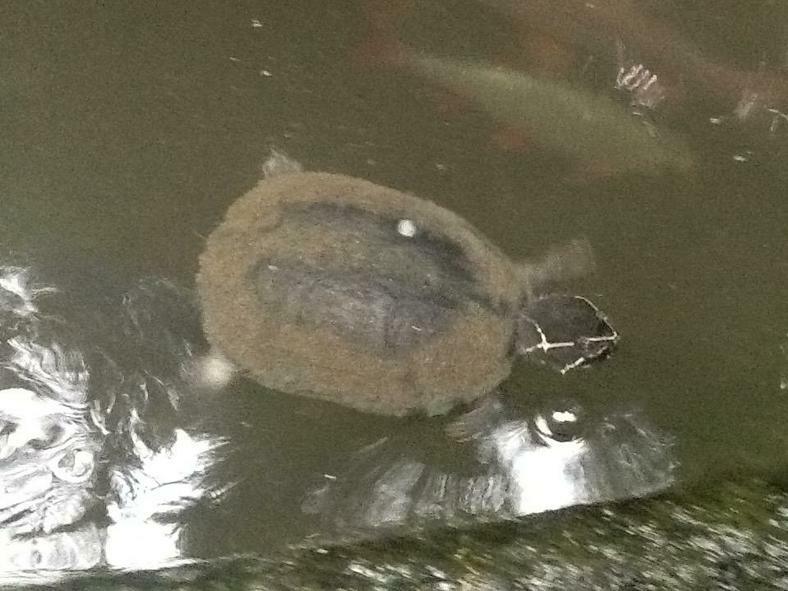 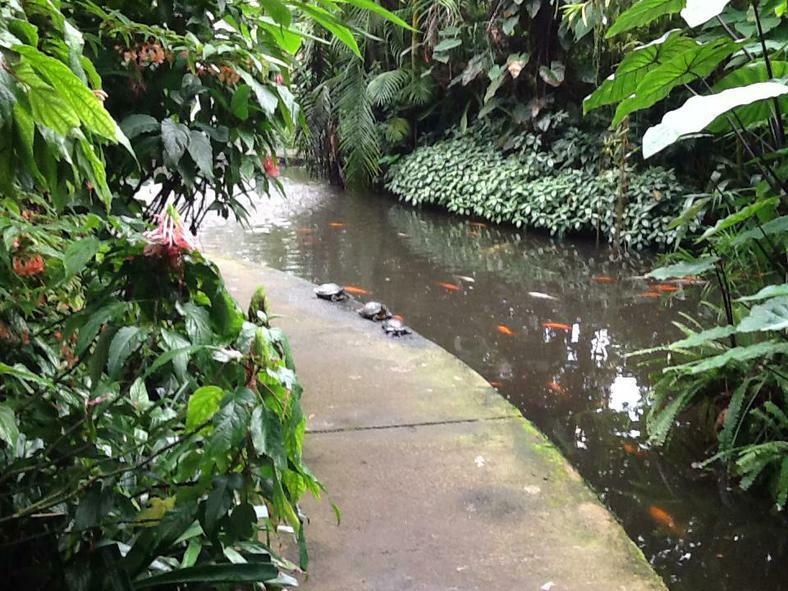 We will then be sticking the matching amount of tortoises/hares to the corresponding number. 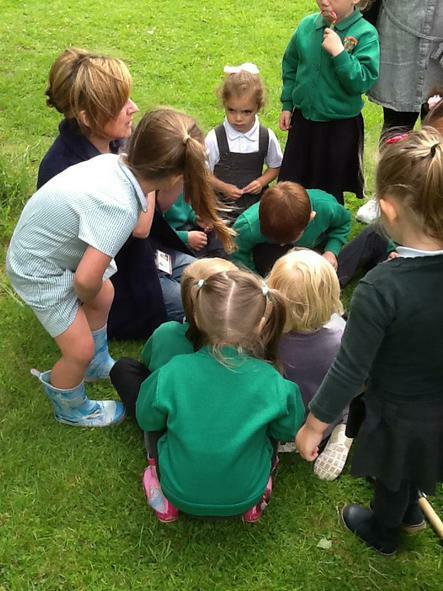 This week our focus texts are 'Five Minutes Peace' and 'Peace at Last' by Jill Murphy. 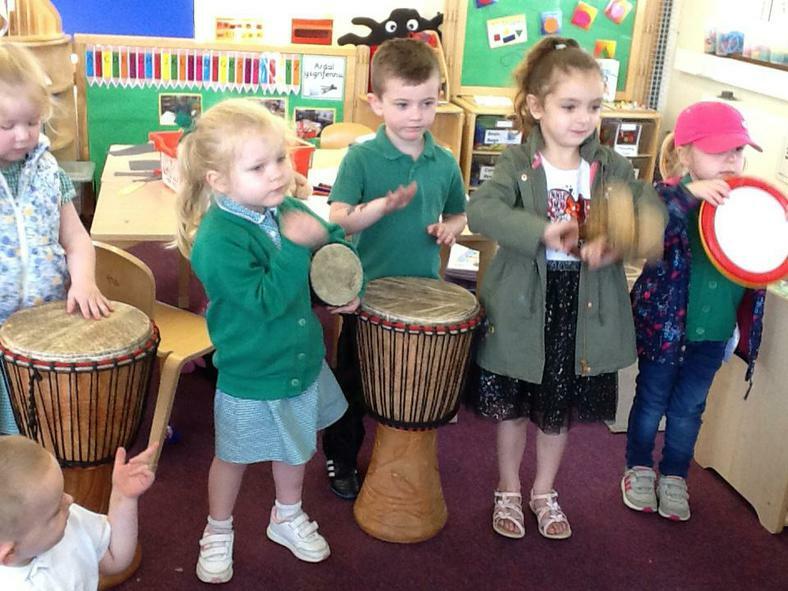 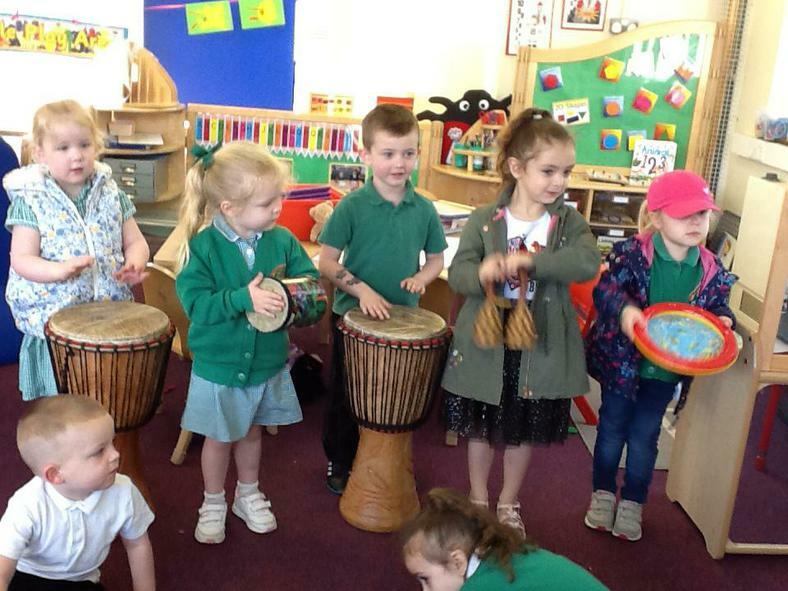 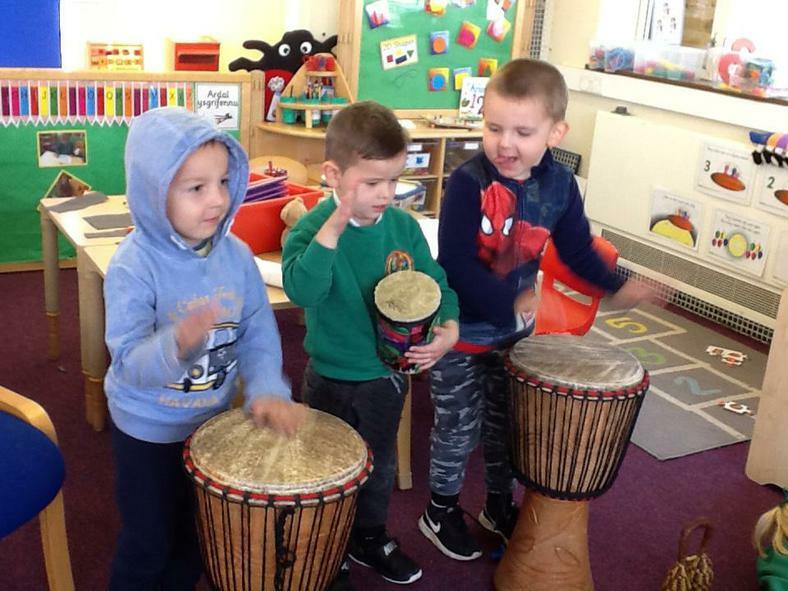 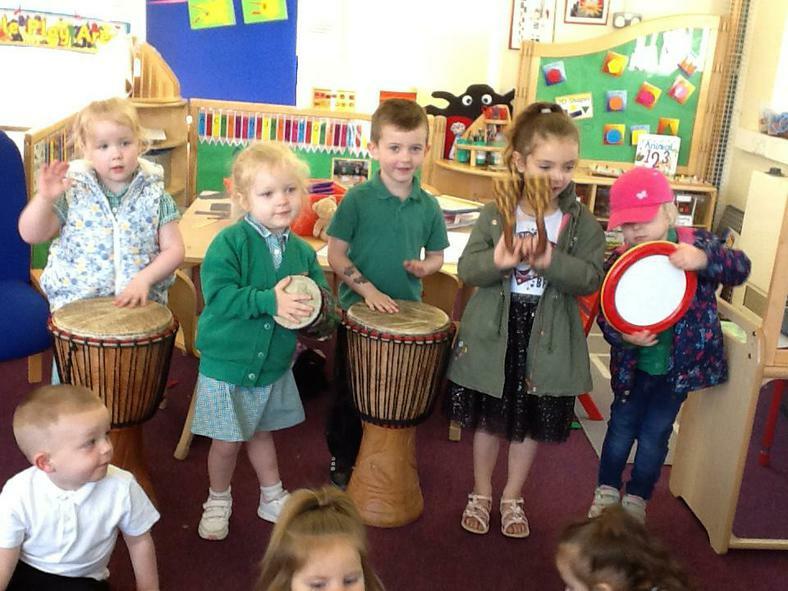 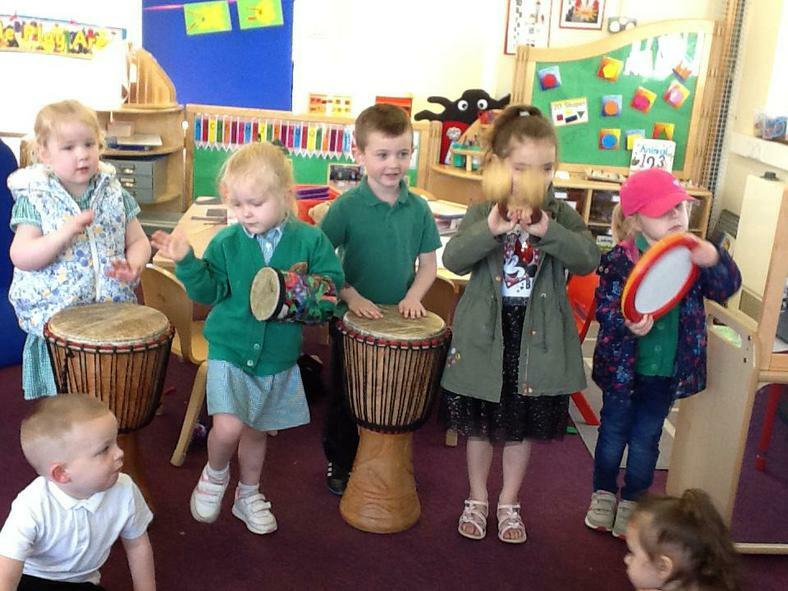 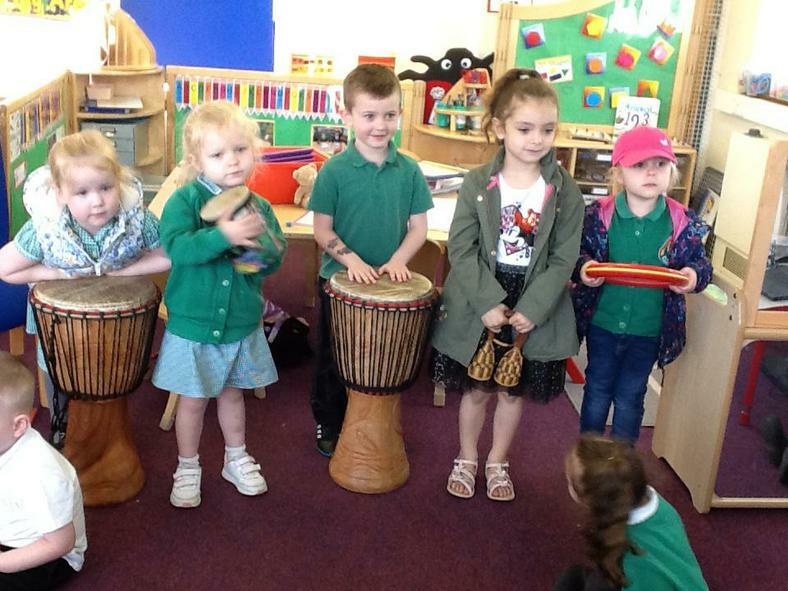 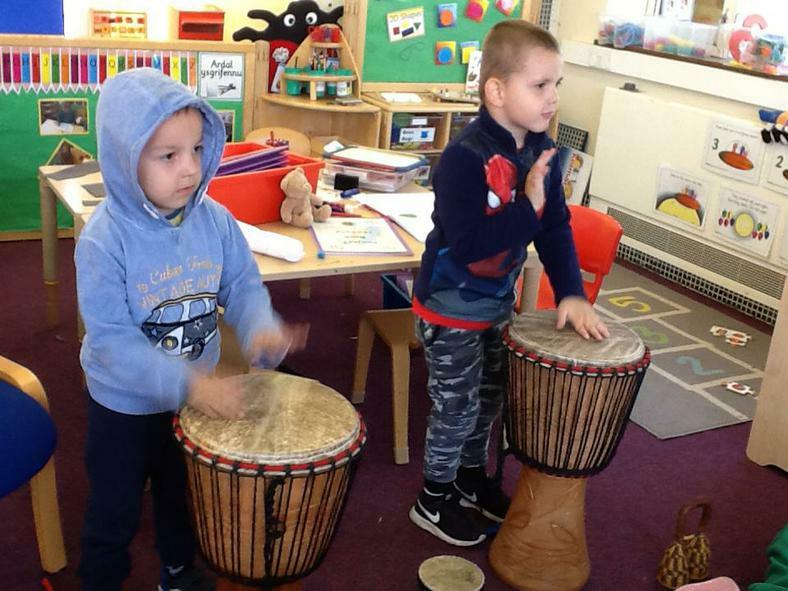 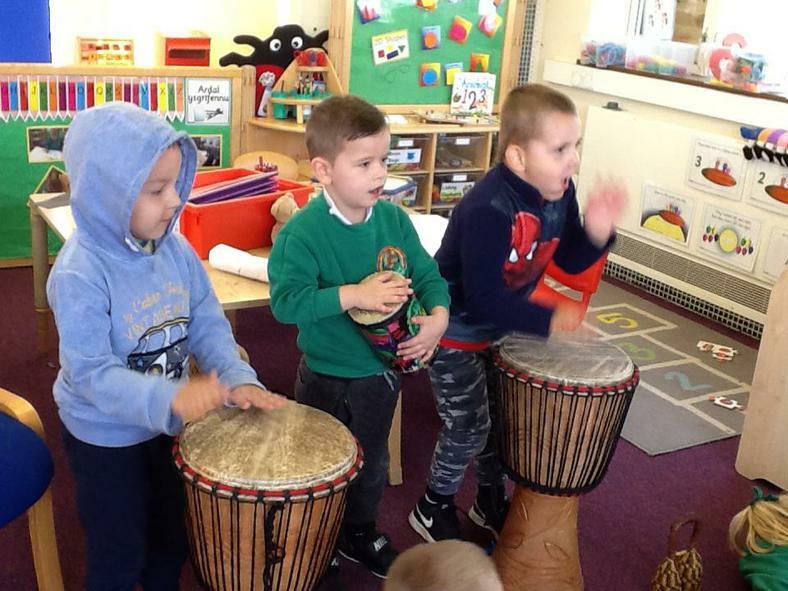 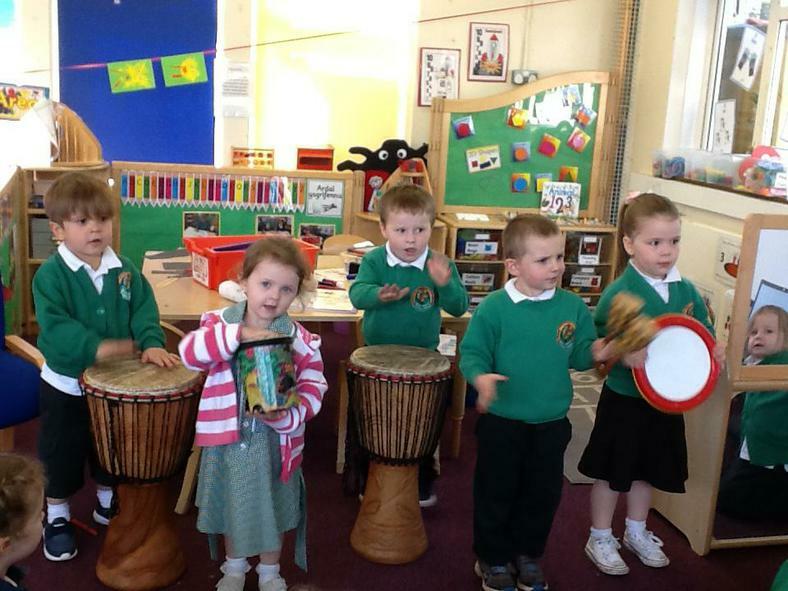 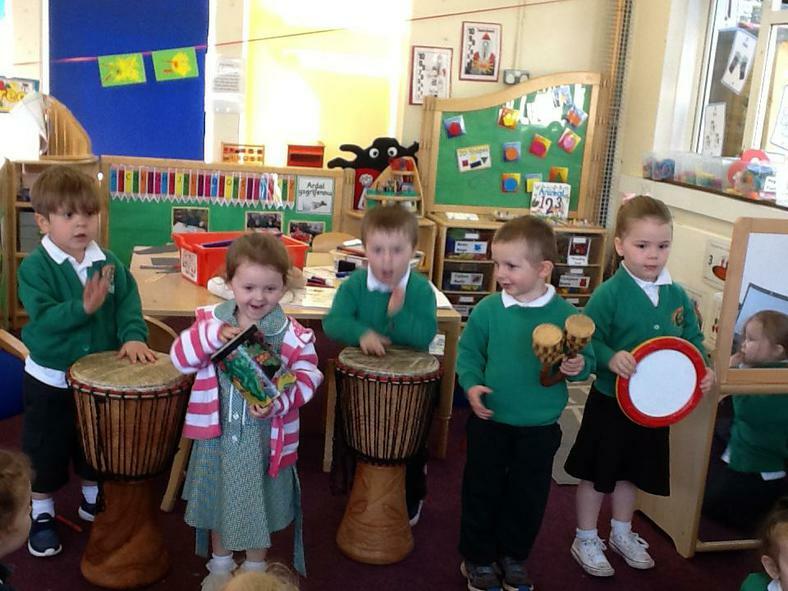 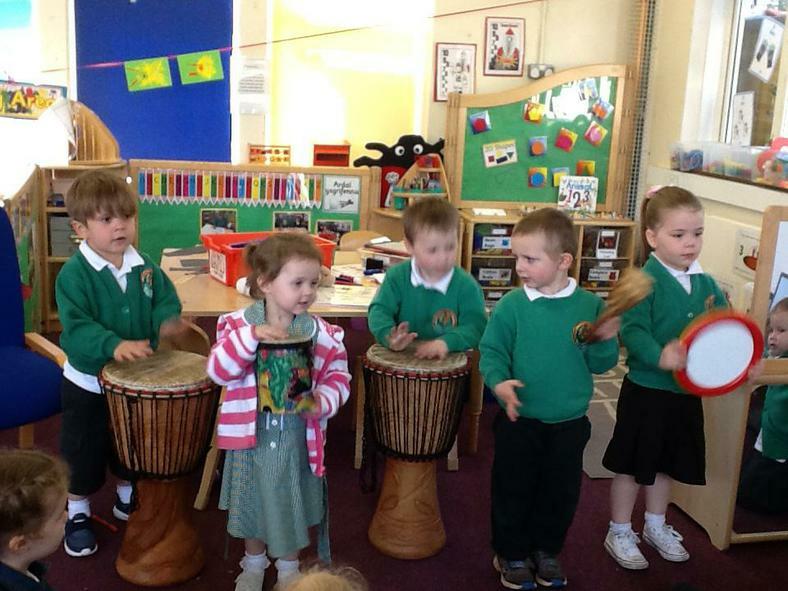 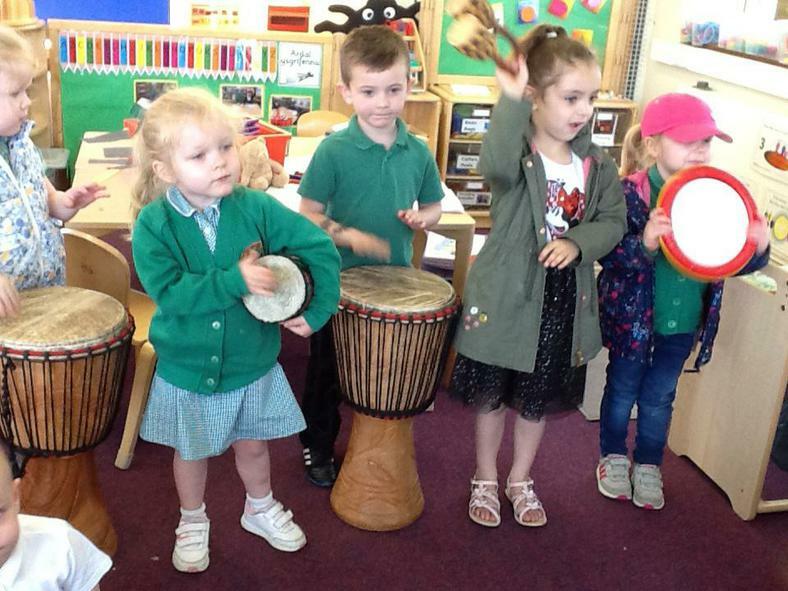 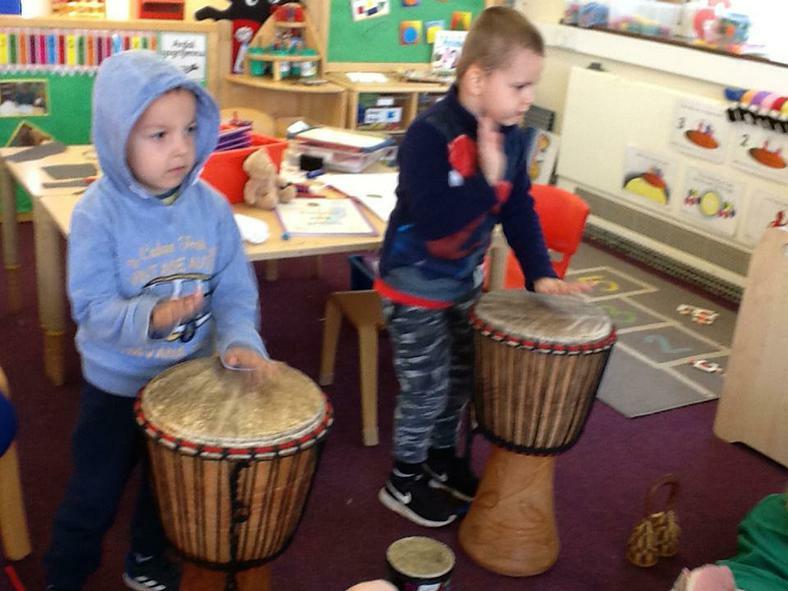 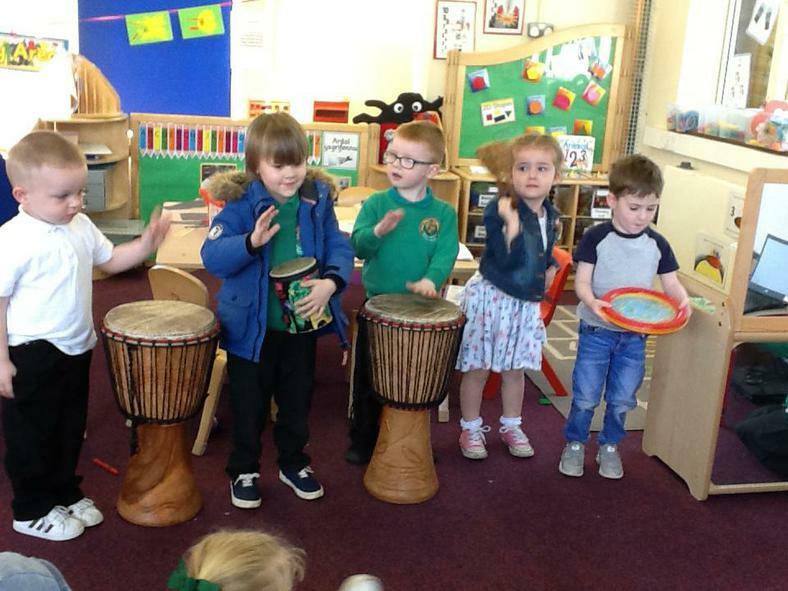 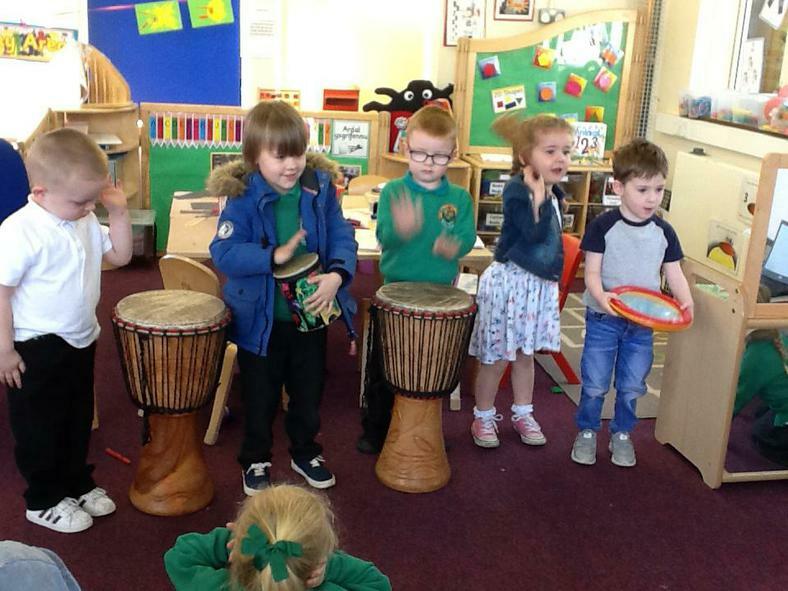 Our rhymes we will be learning and singing are Animal Boogie song and 'If your happy and you know it shake your shaker, beat your drum. 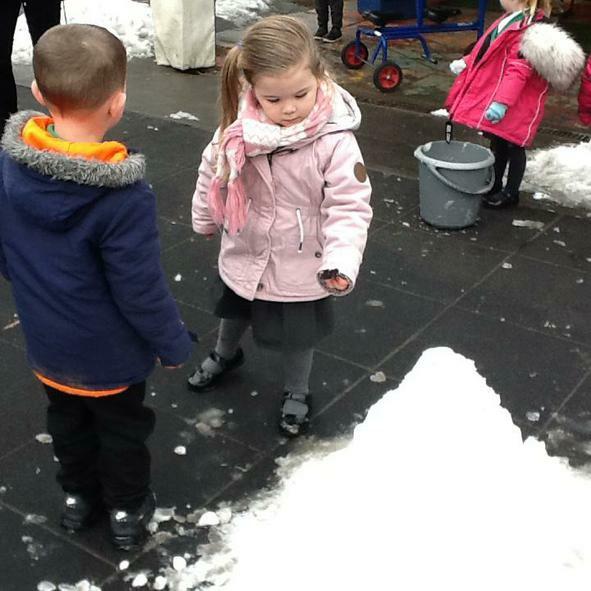 Colour of the week is White. 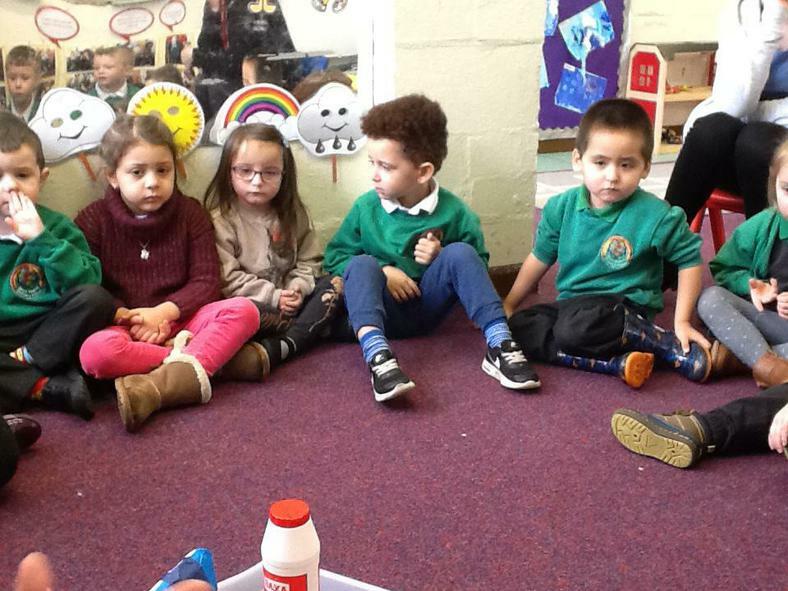 We will be playing Bingo linked to 'Peace at Last', going on a sound/listening walk around the school, playing a listening game on the listening centre using headphones and identifying the different sounds. 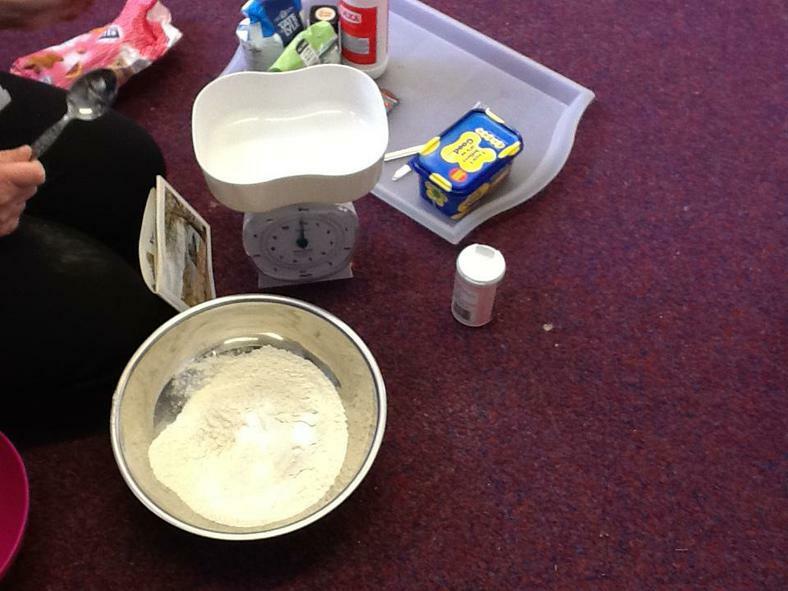 We will be making musical instruments using junk material, these will be coming home with the children when complete. 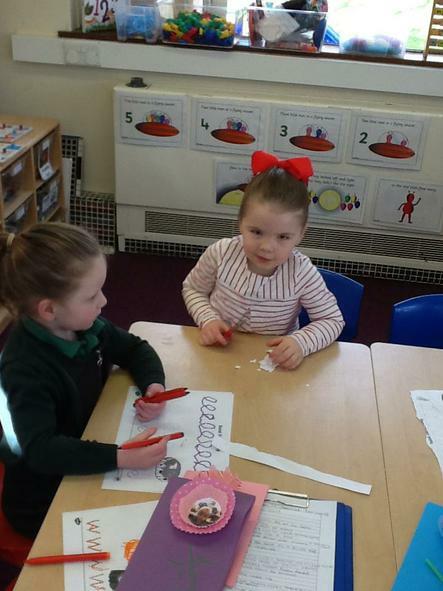 We will be focusing on ordinal numbers, first, second, third and last. 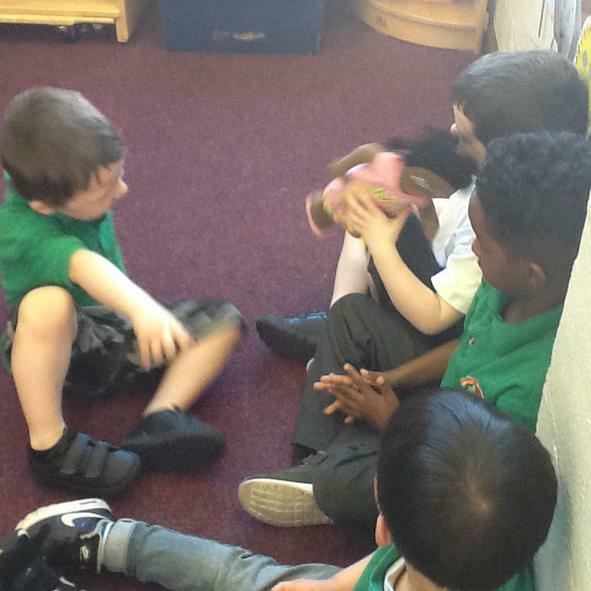 We will also be looking at size and colour using the compare bears, most importantly we will be having lots of fun!!! 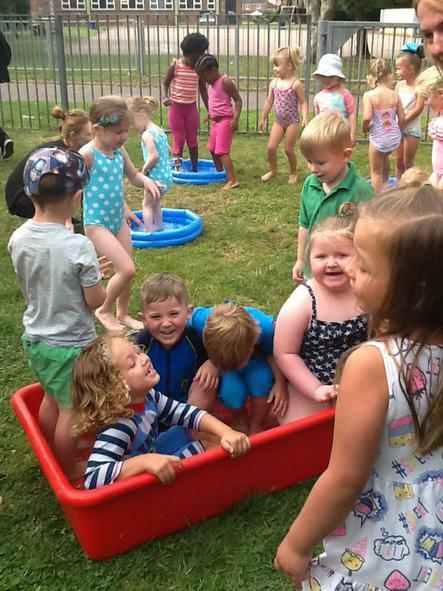 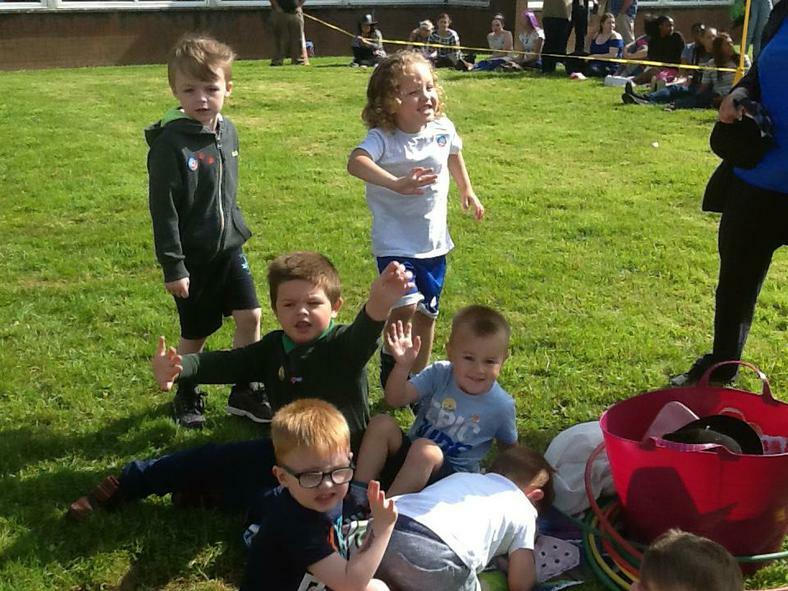 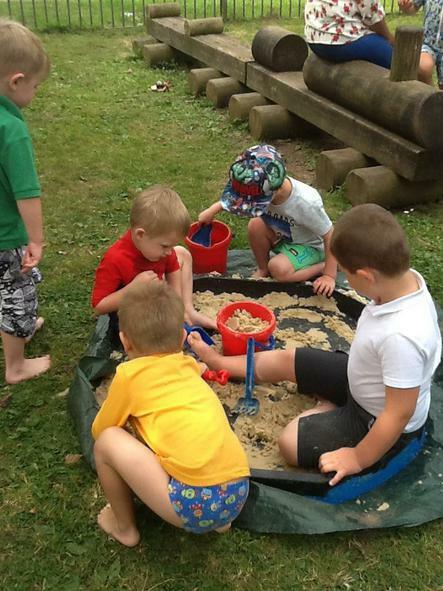 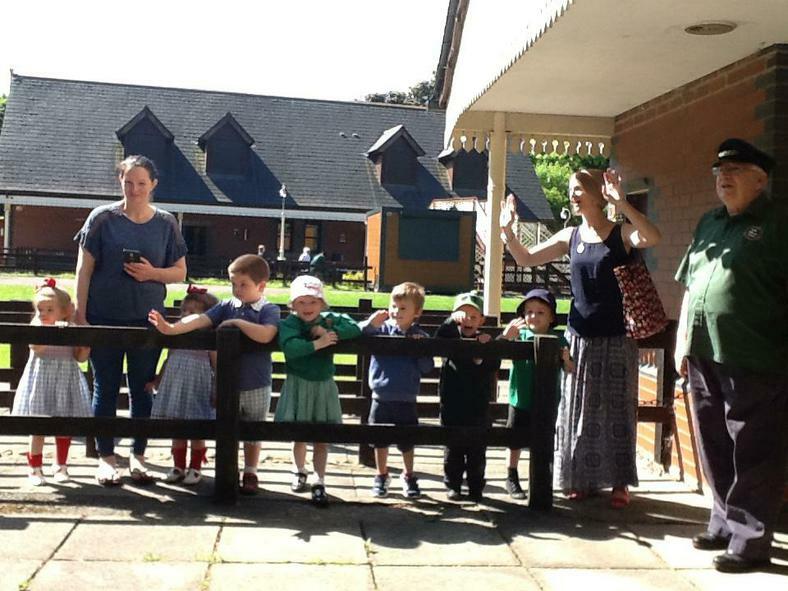 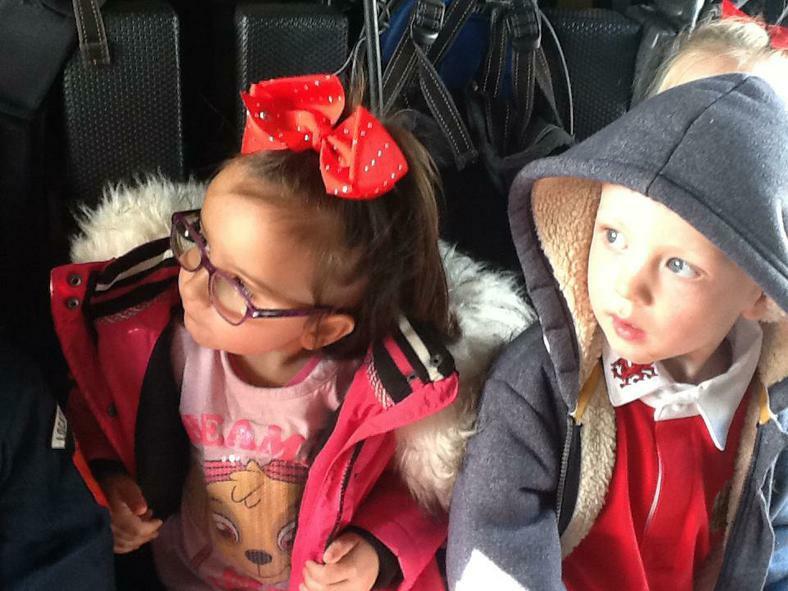 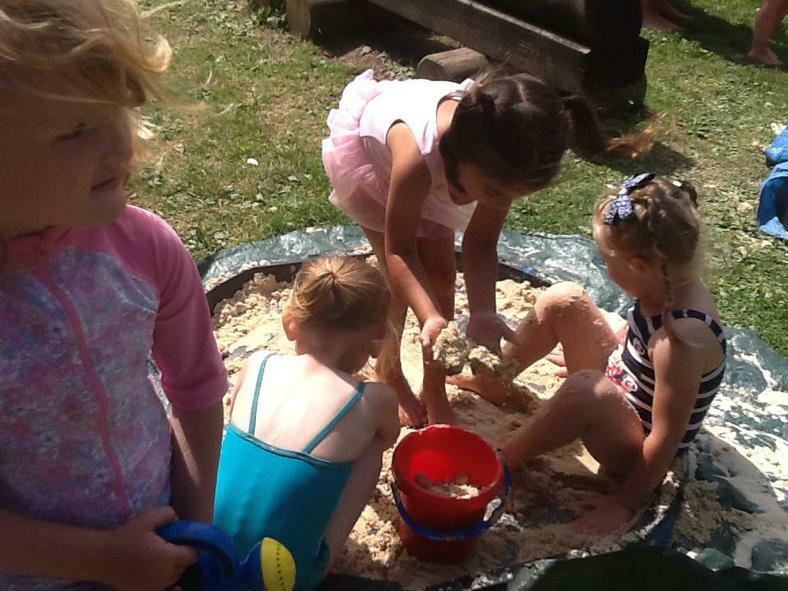 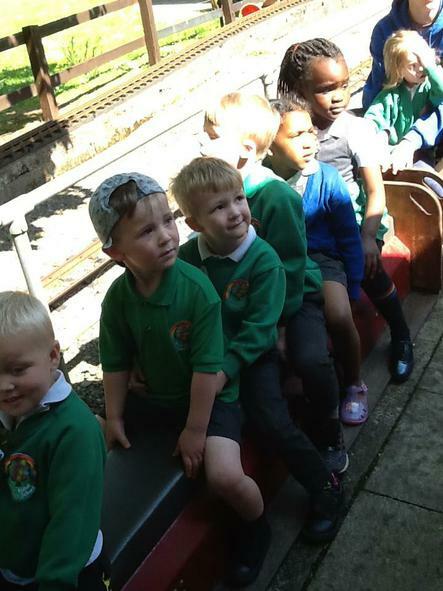 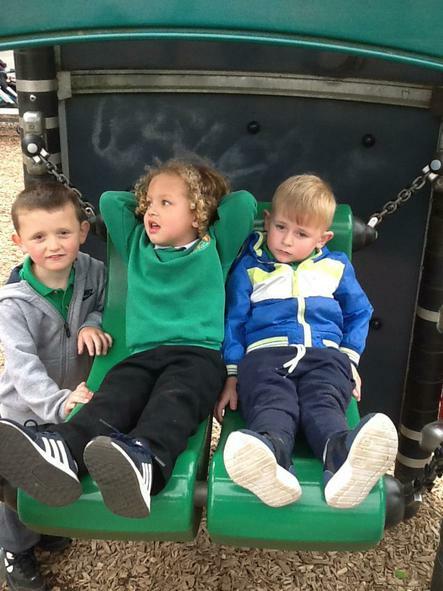 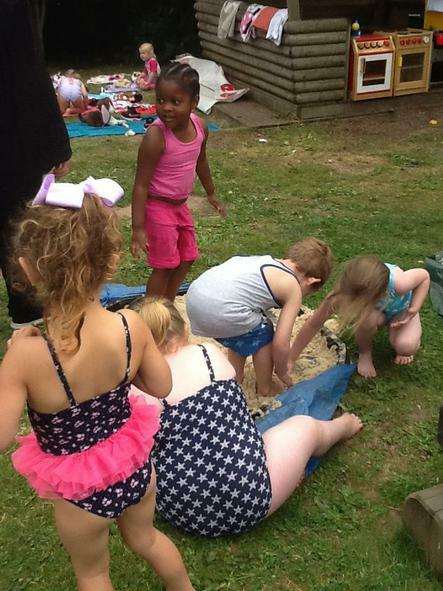 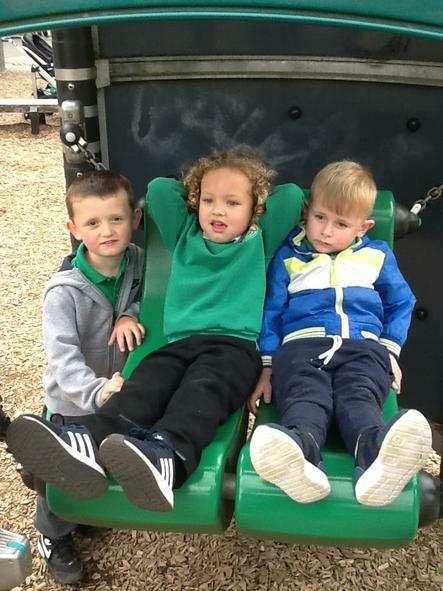 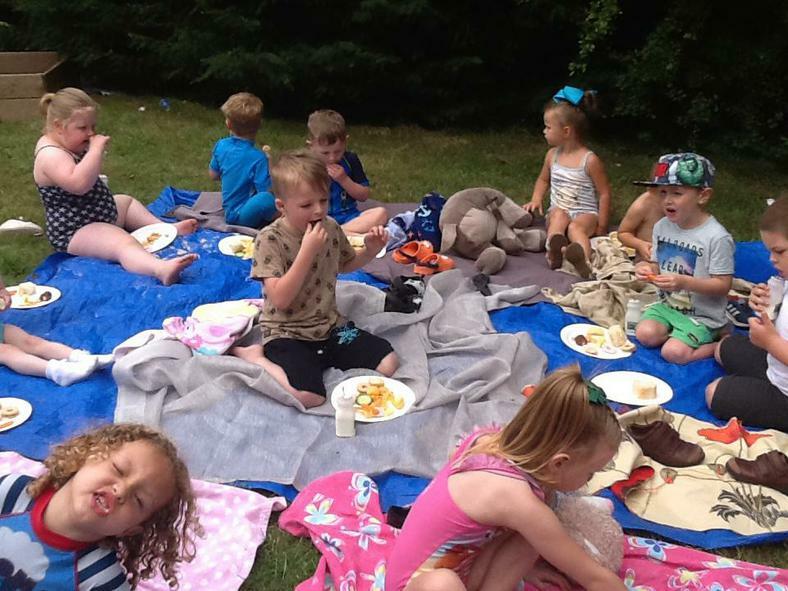 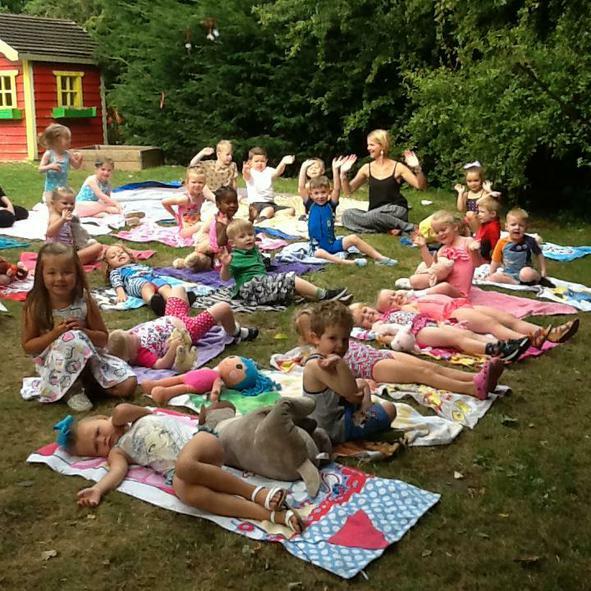 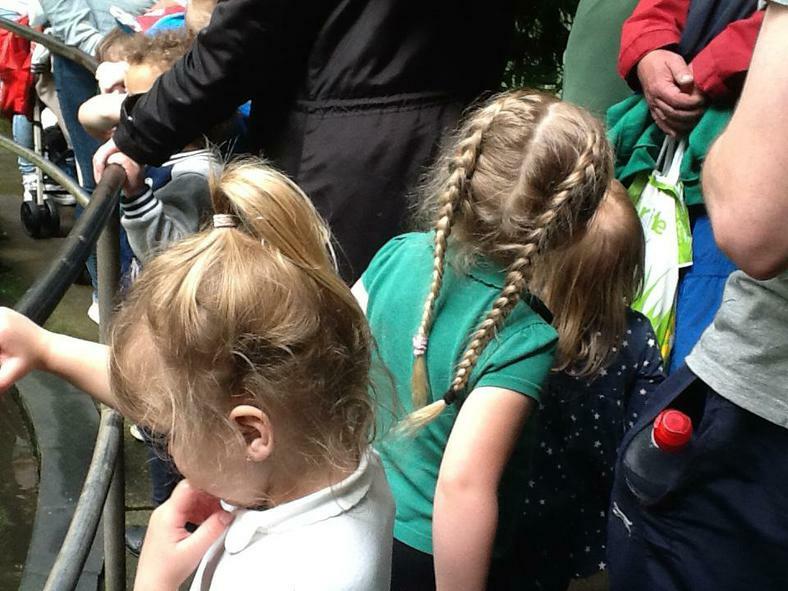 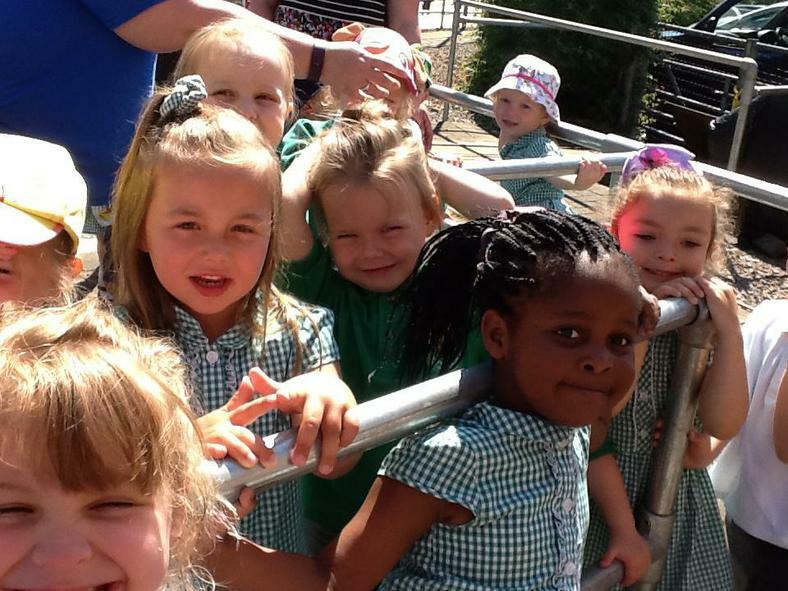 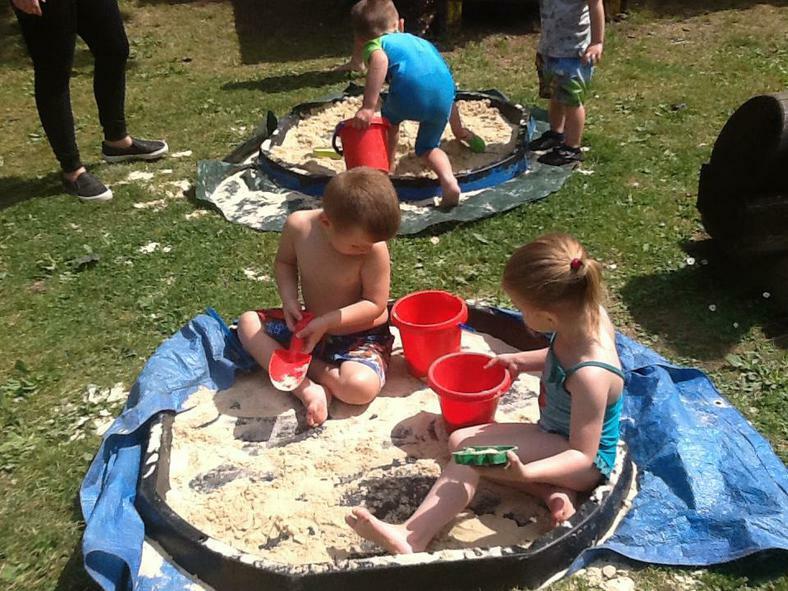 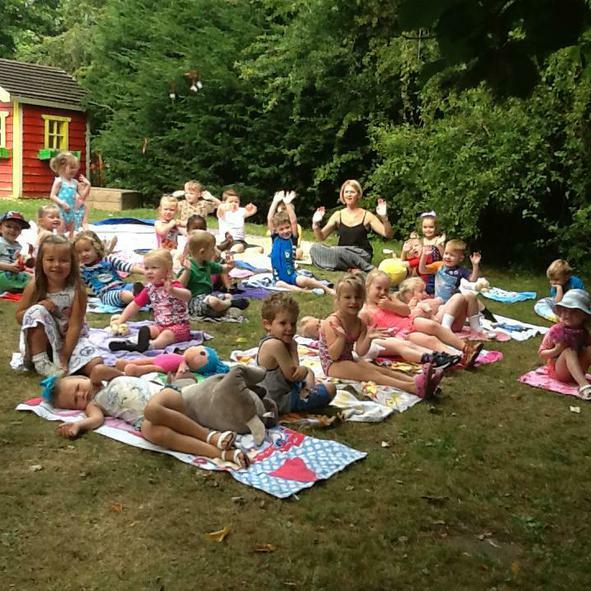 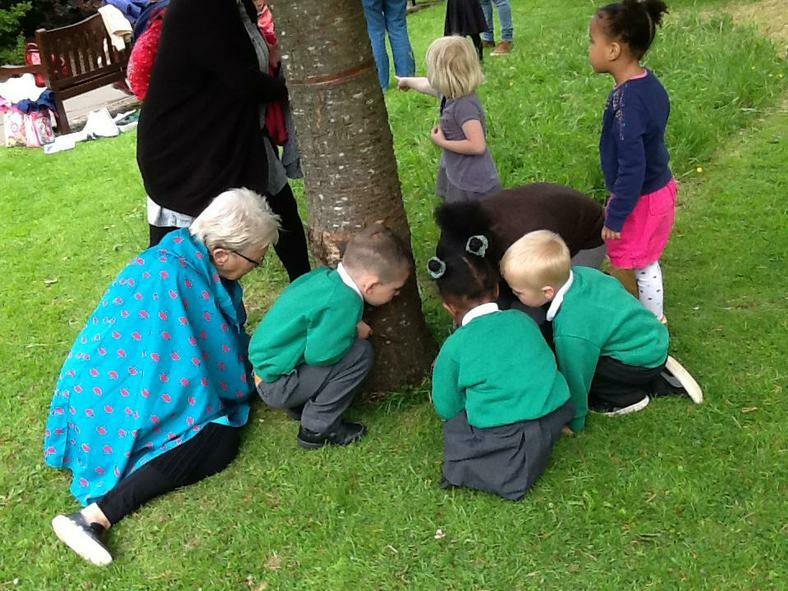 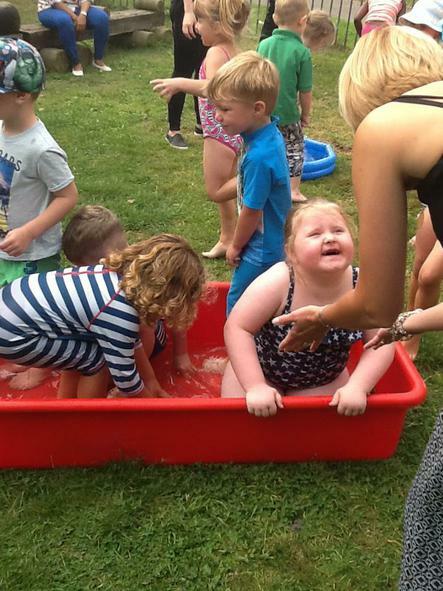 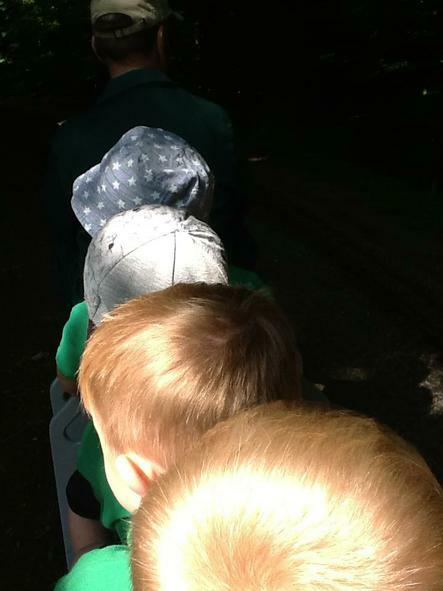 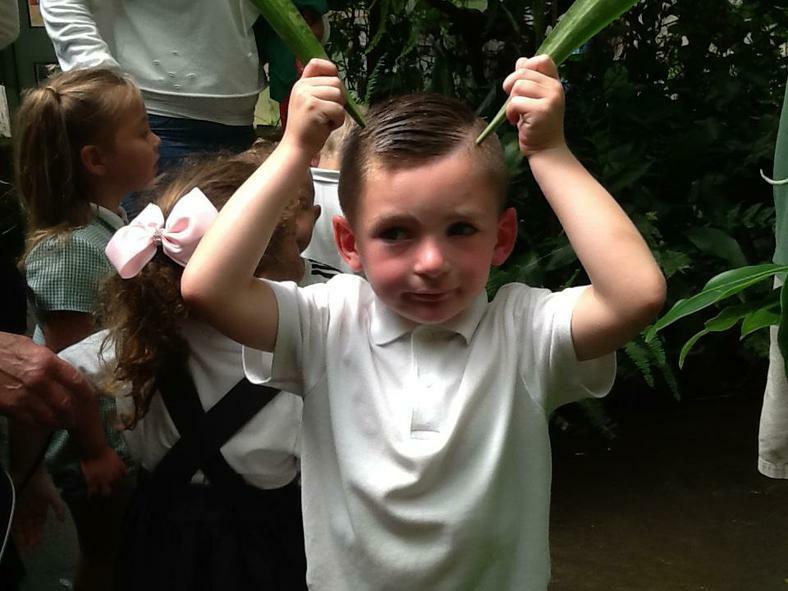 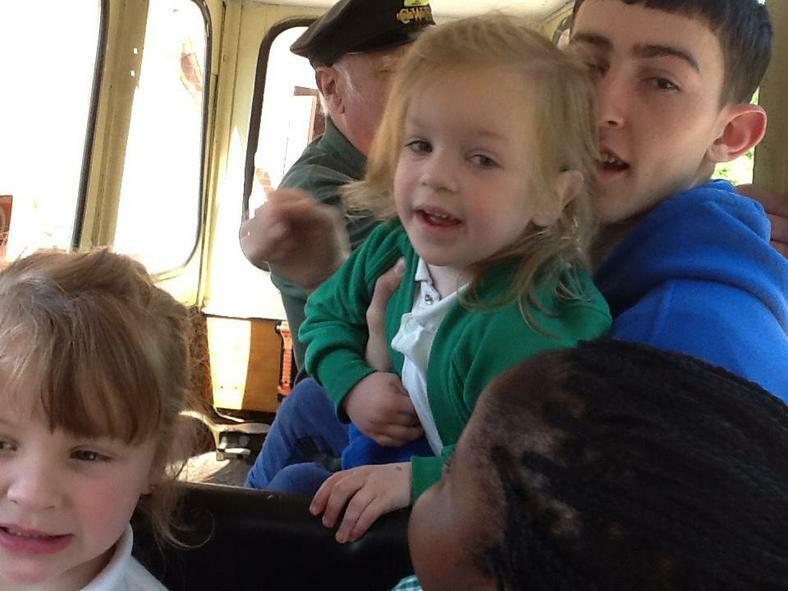 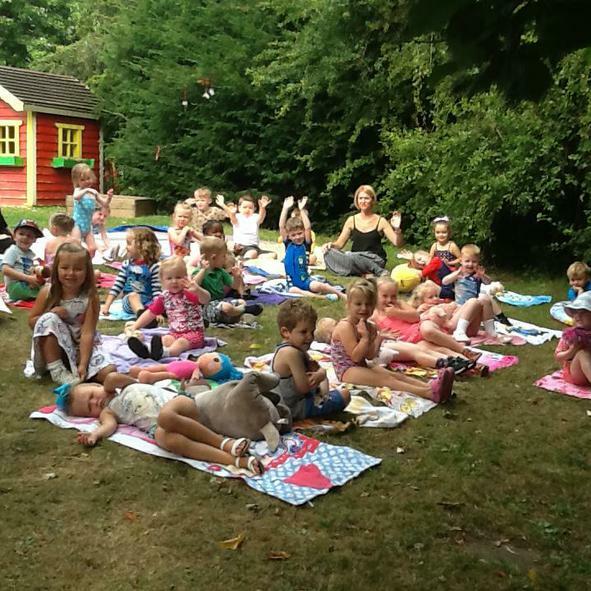 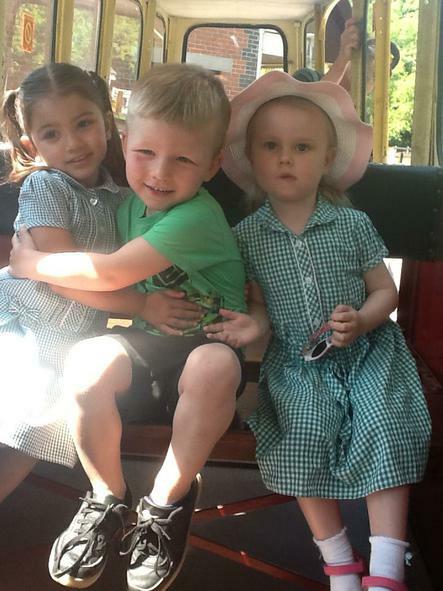 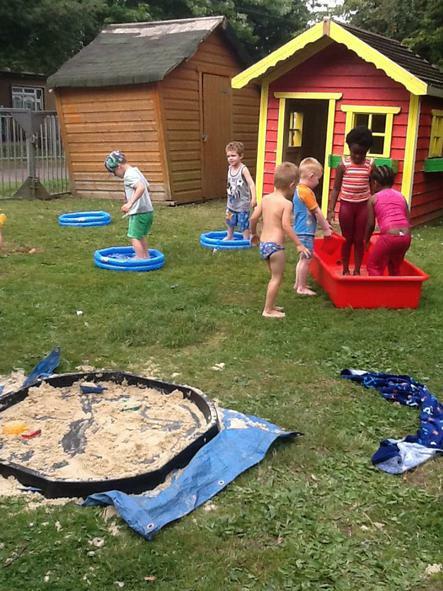 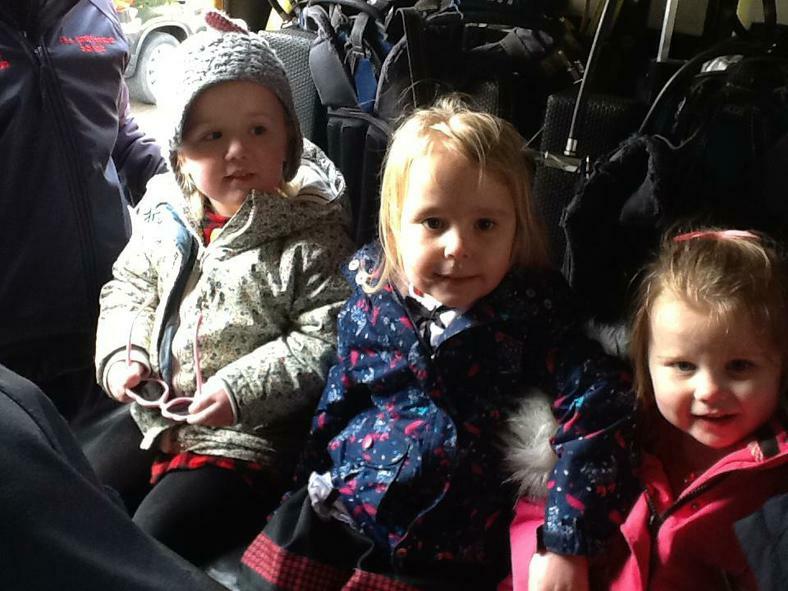 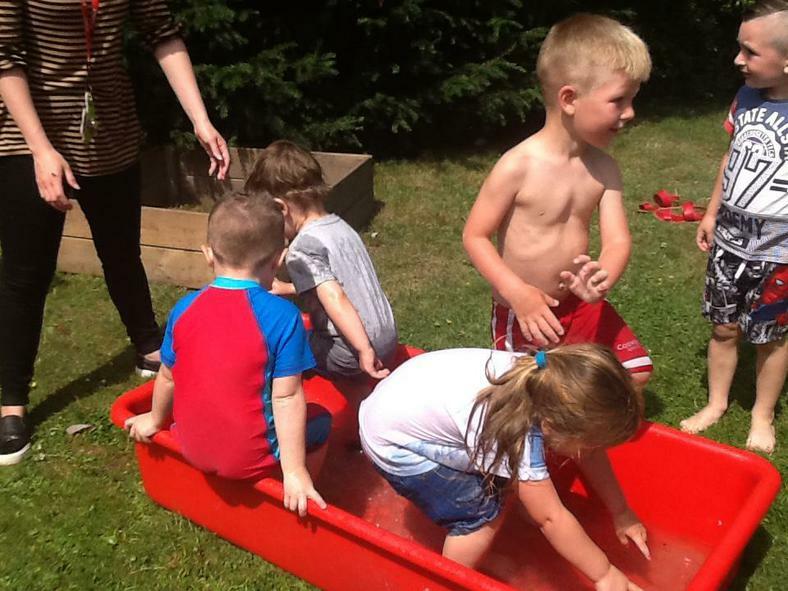 I have arranged our Summer Nursery trip to 'Cefn Mably Farm' on Thursday 4th May, this will be an exciting experience for you and your child to spend time at the farm. 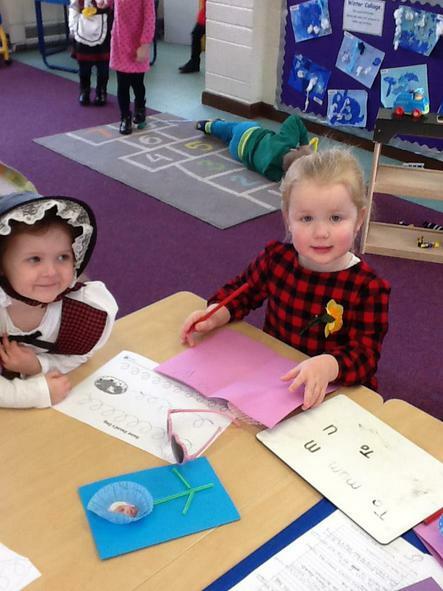 There will be a letter home this week. 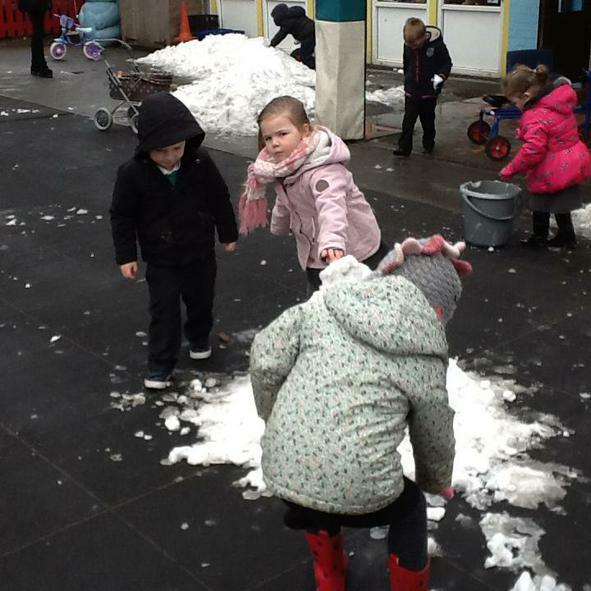 Welcome back after a half term break. 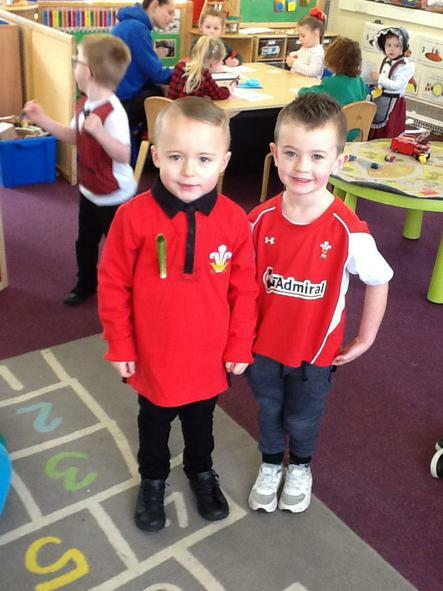 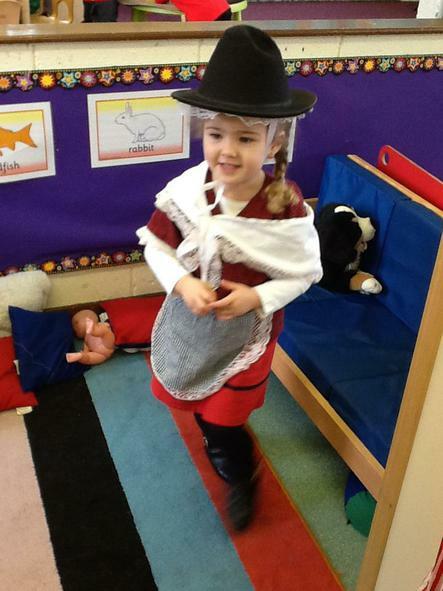 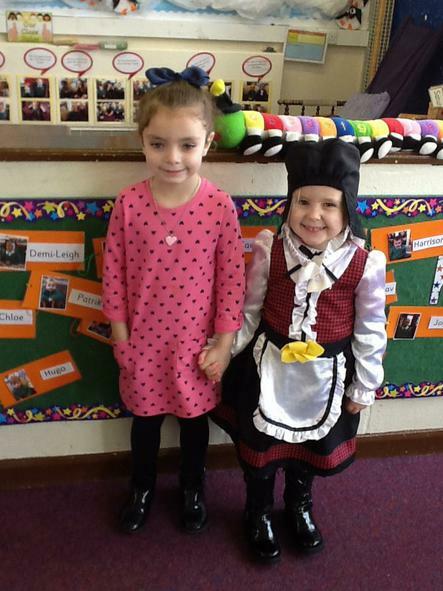 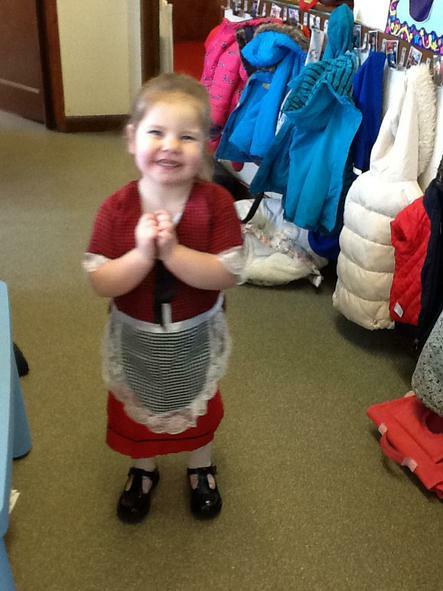 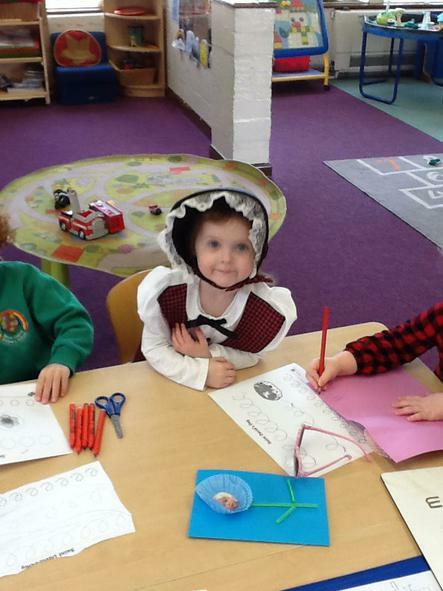 This term we start with a busy week that includes Pancake day and St Davids Day. 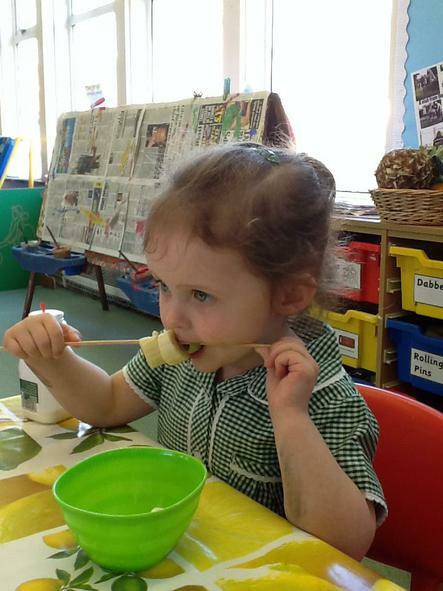 Our focussed text this week is Mr Wolfs Pancakes and our nursery rhyme of the week is 'Un, du, tri banana'. 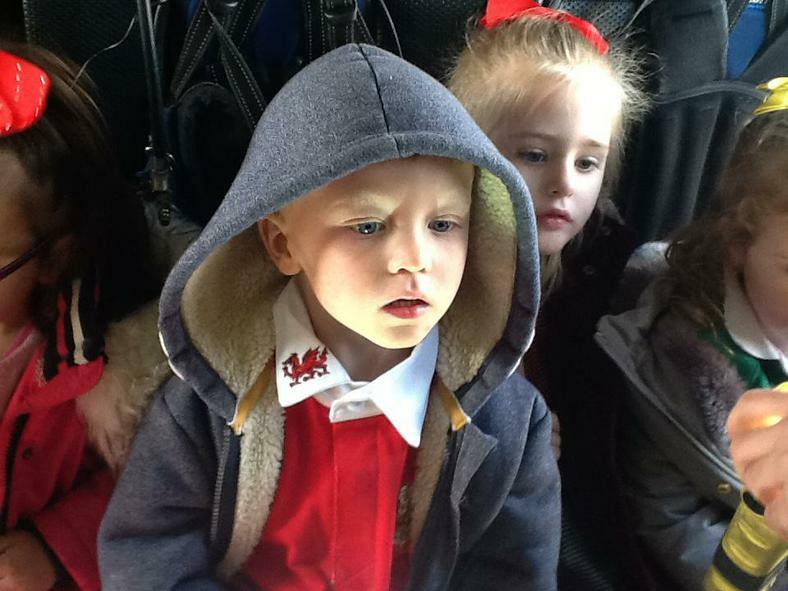 We will be learning about St David and watching a short video clip about our patron Saint. 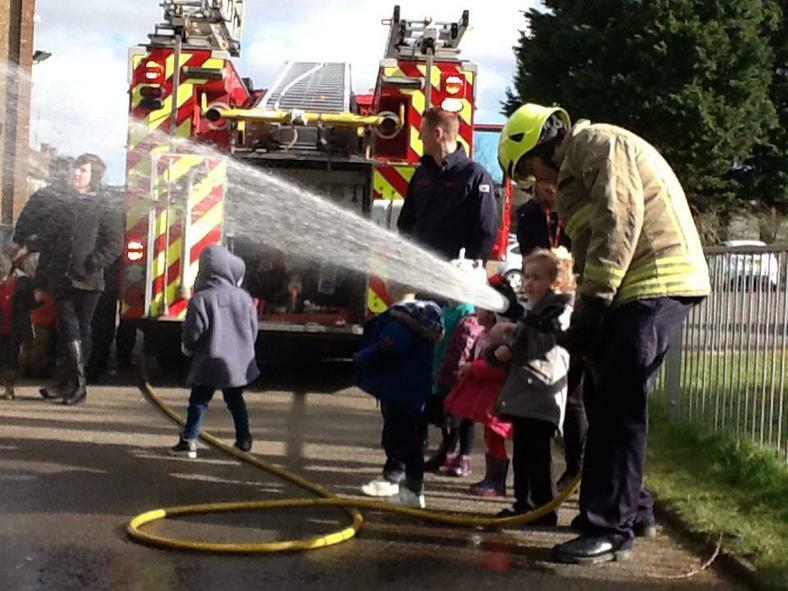 We will be busy engaging in numerous activities linked to this. 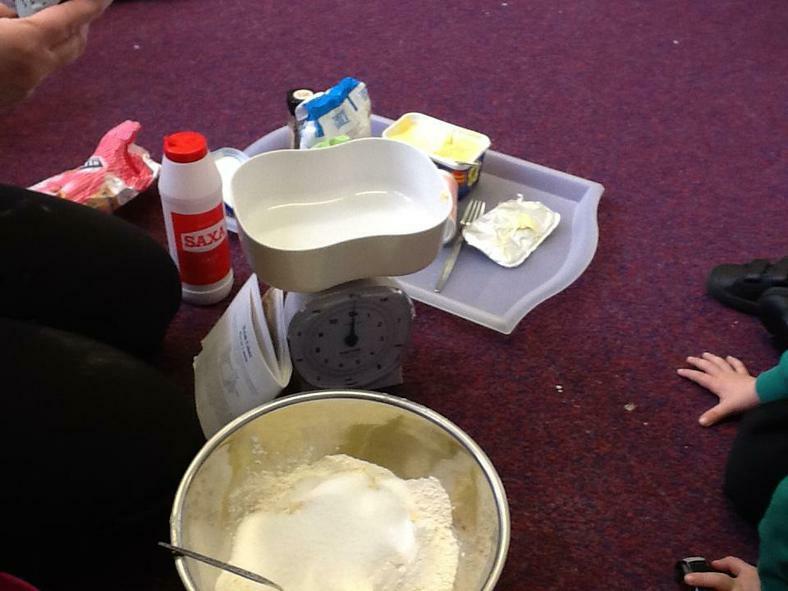 We will be making, cooking and most importantly eating pancakes on Tuesday. 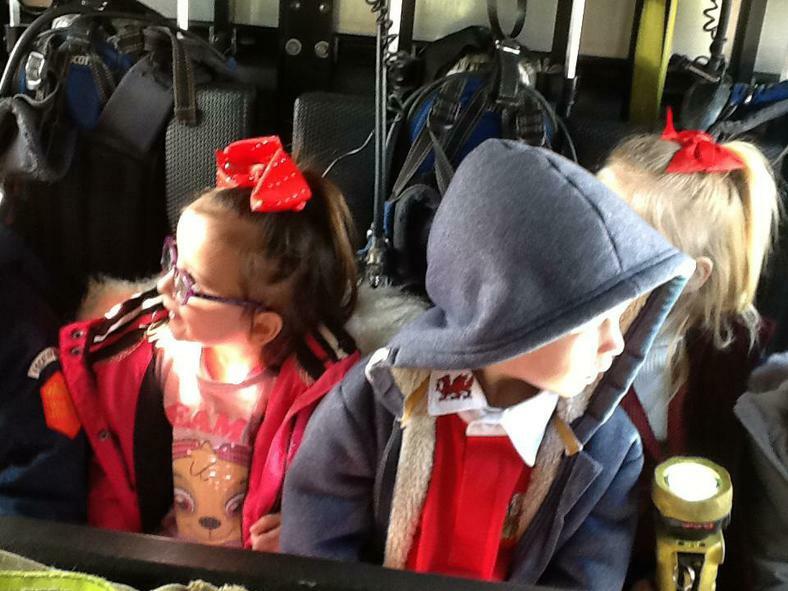 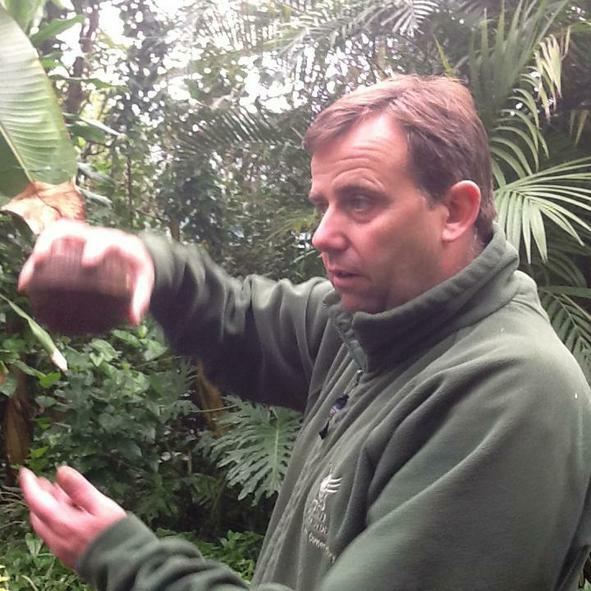 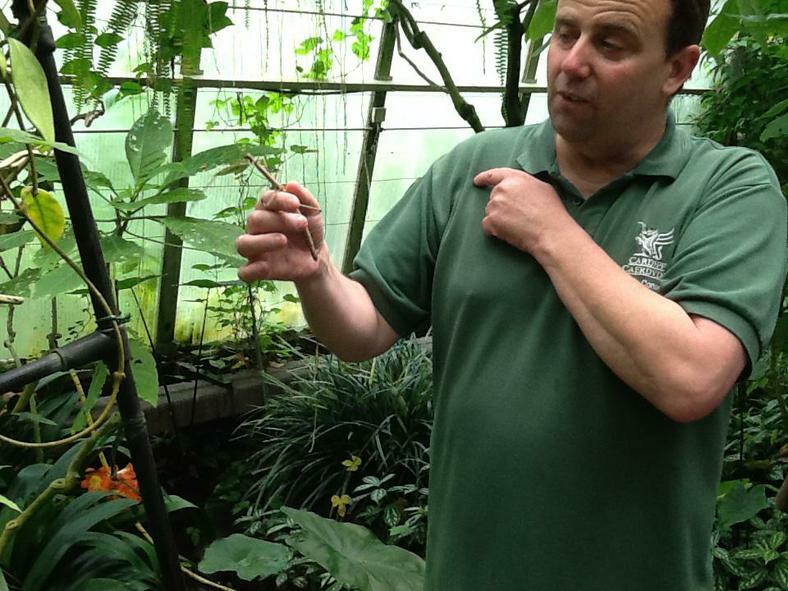 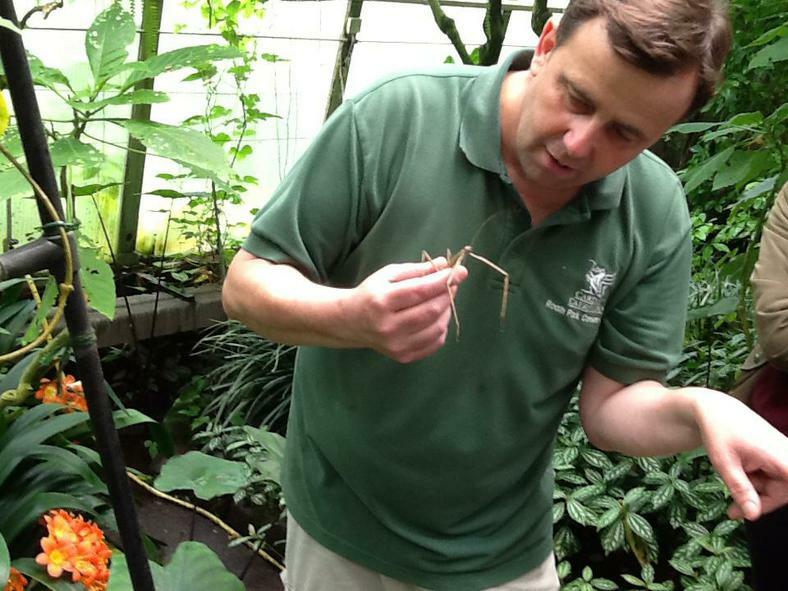 We will be tasting welsh cakes and looking at traditional welsh things, including leeks, daffodils and dragons. 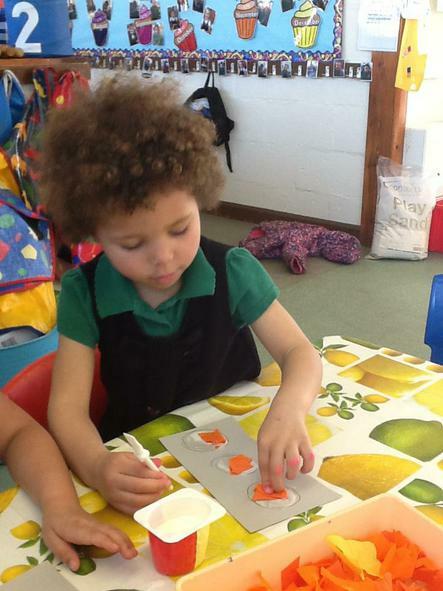 Our colour table this week will be PINK. 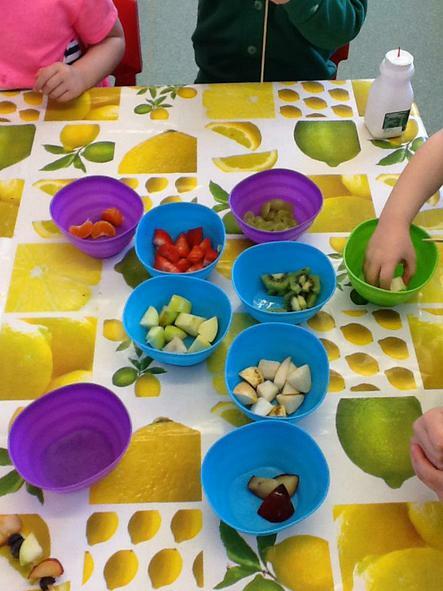 Please encourage your child to bring something from home for this table. 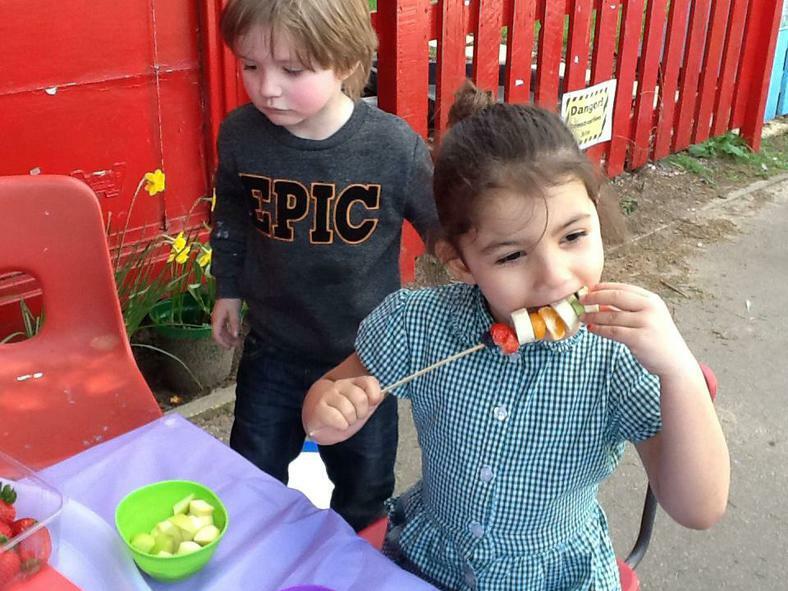 Remember that snack money is £1 per week payable weekly or termly, this half term is 6 weeks. 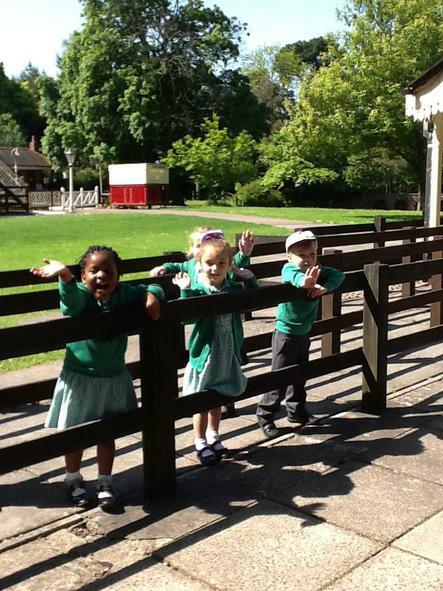 If you owe from last term we will let you know how much you owe. 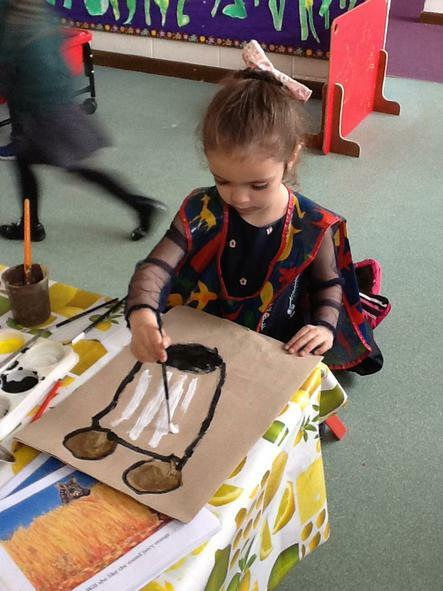 Book bags and communication books should be brought to Nursery daily, the bags should be emptied of your child's paintings and certificates etc. 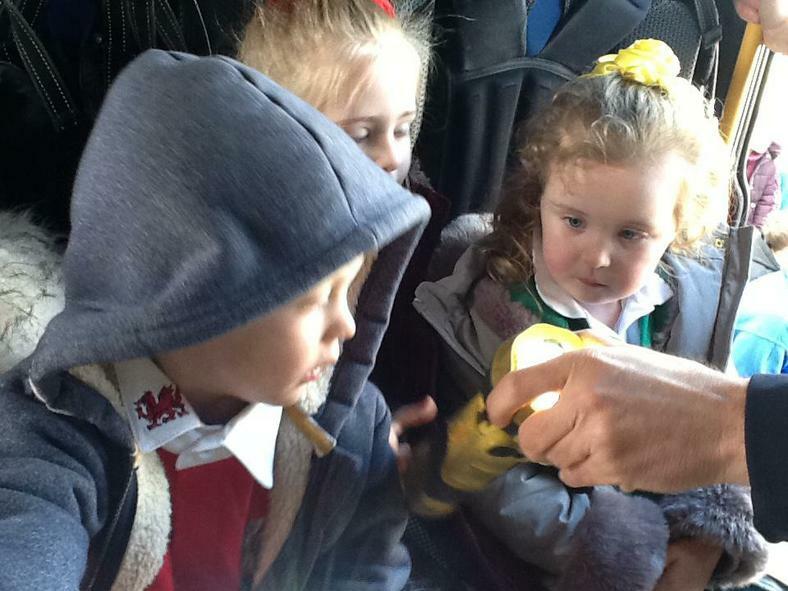 These are for you to keep, all we need in the bag is the communication book and £1 snack money. 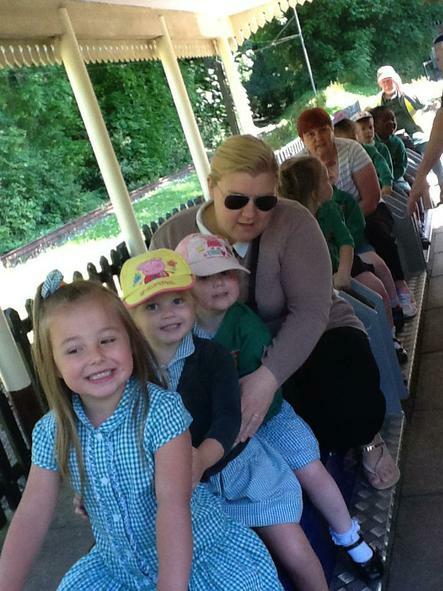 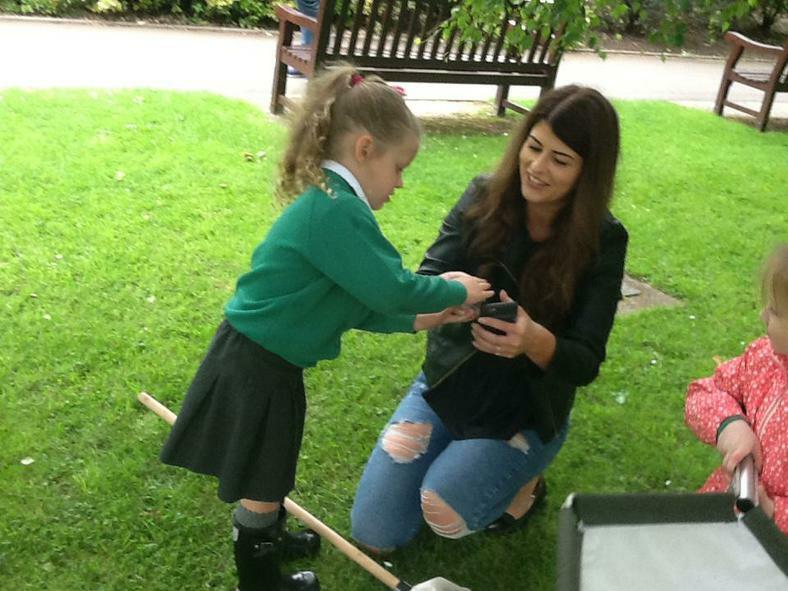 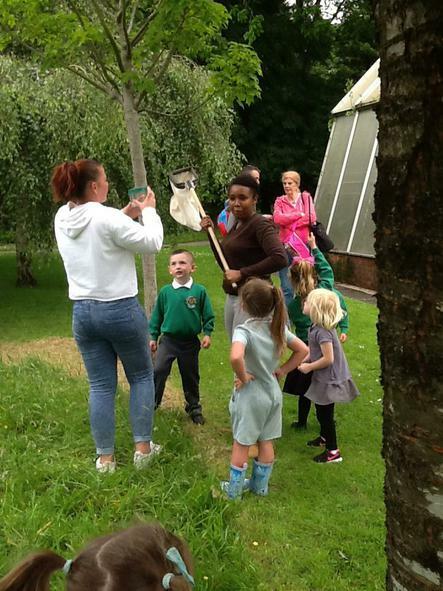 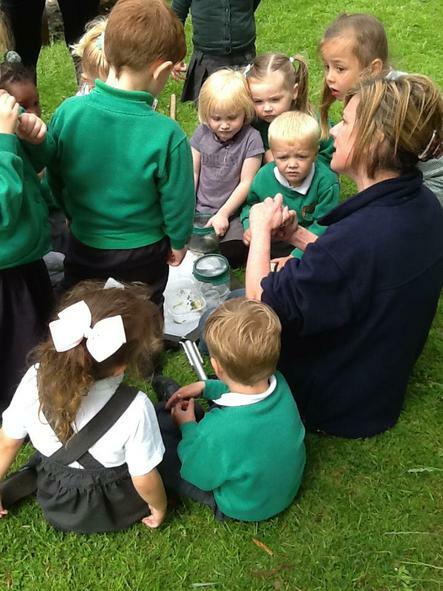 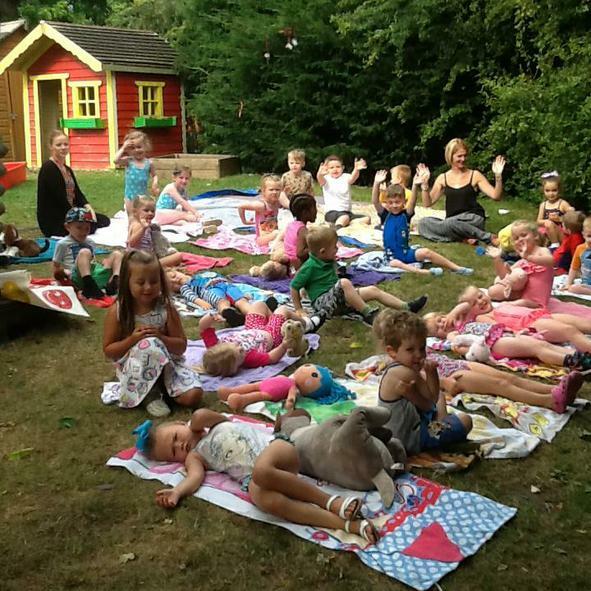 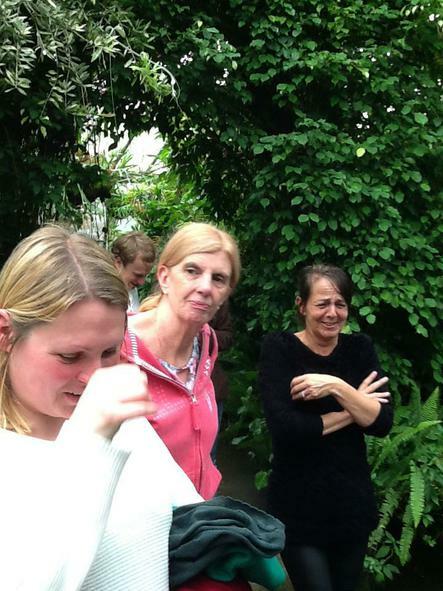 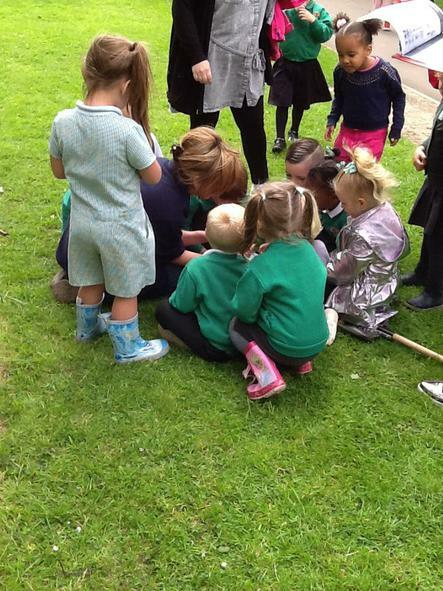 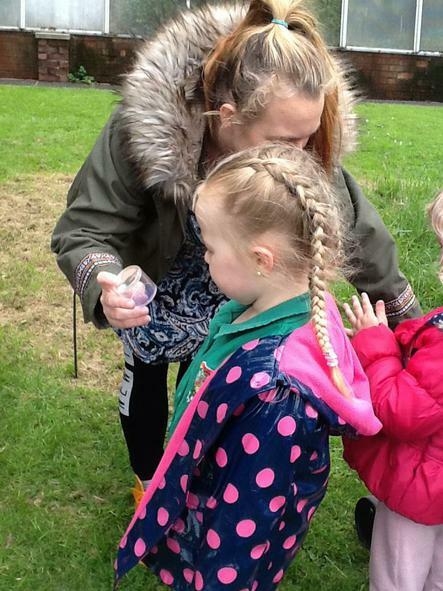 Mrs Shears and the Nursery team. 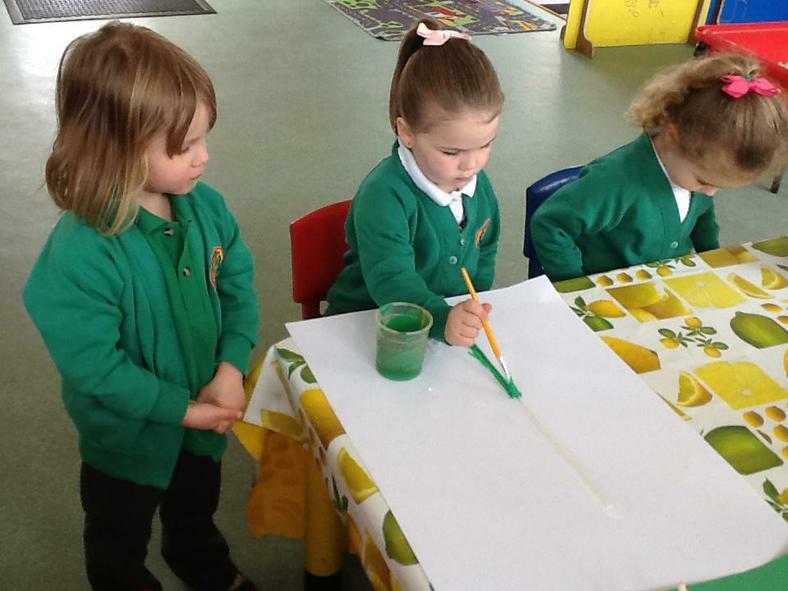 This week our colour table is BLUE. 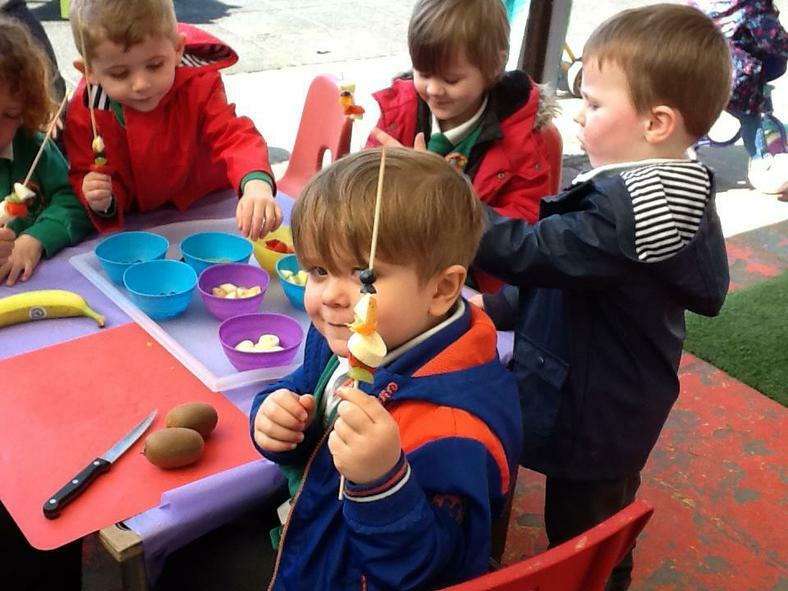 We are learning about Potatoes. 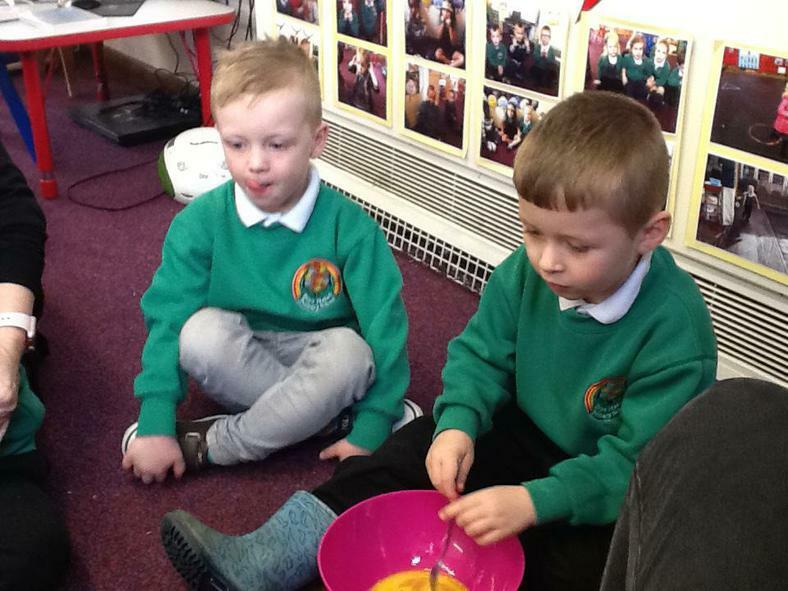 Our focussed text is 'Supertato'......what a fantastic story!!! 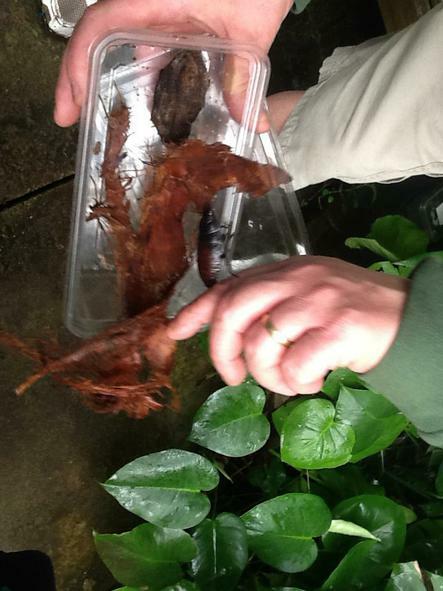 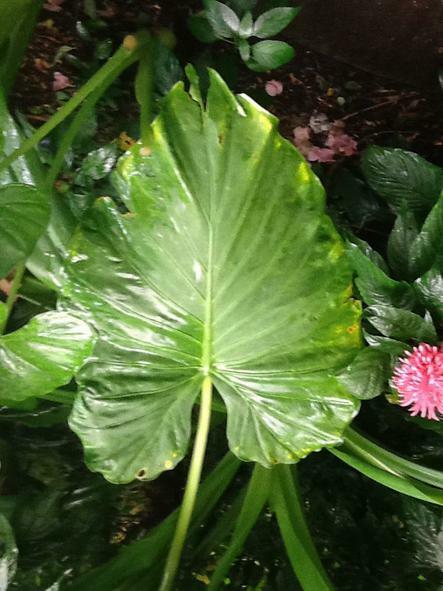 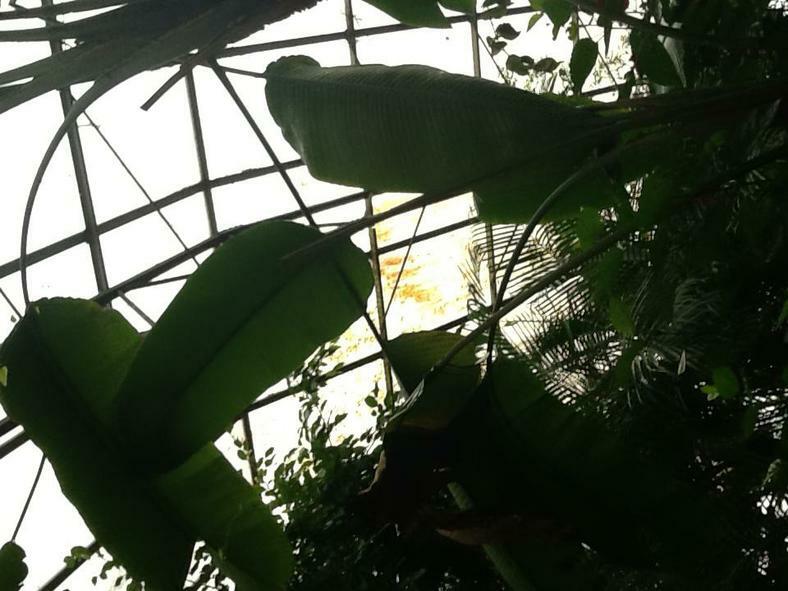 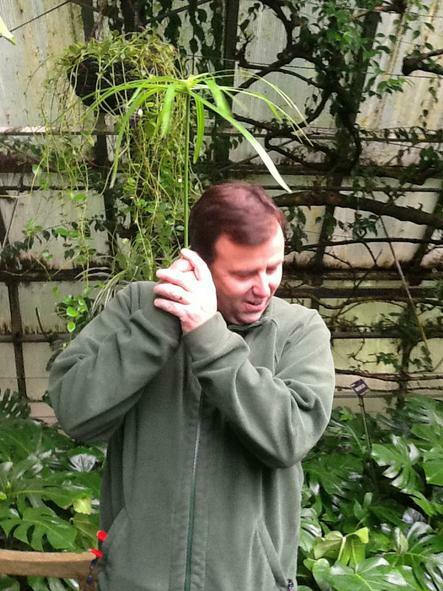 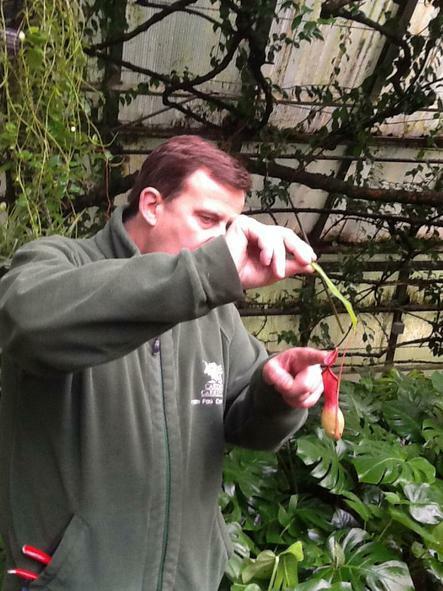 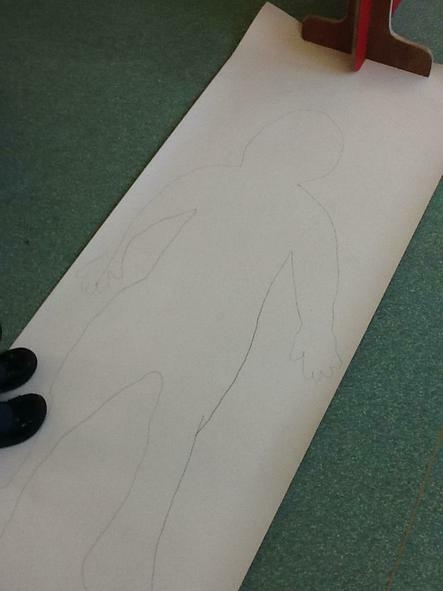 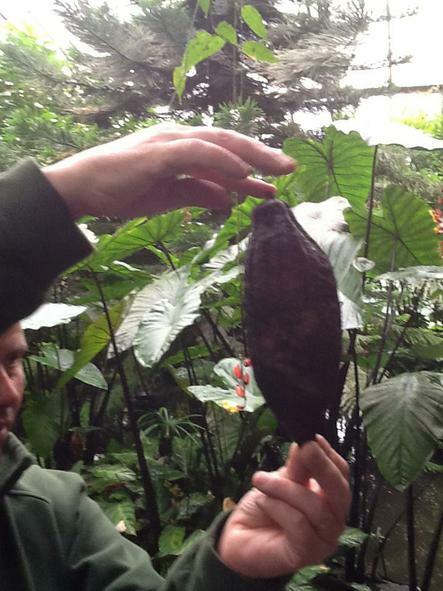 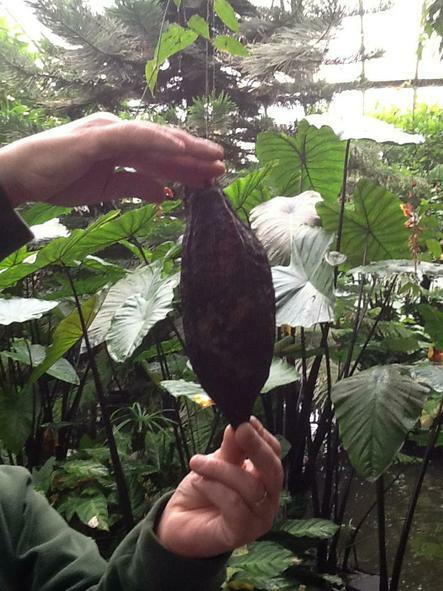 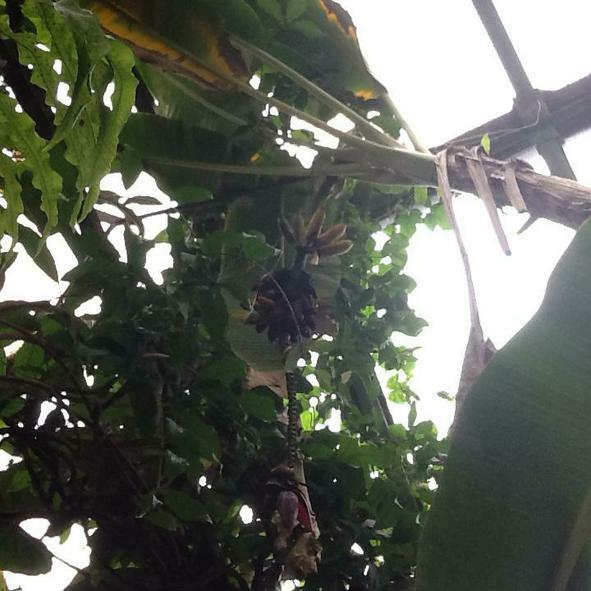 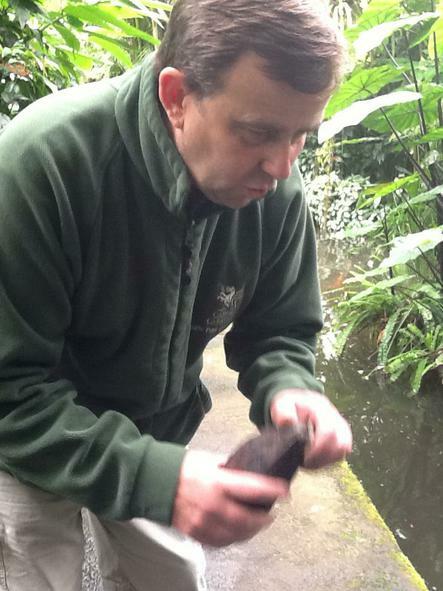 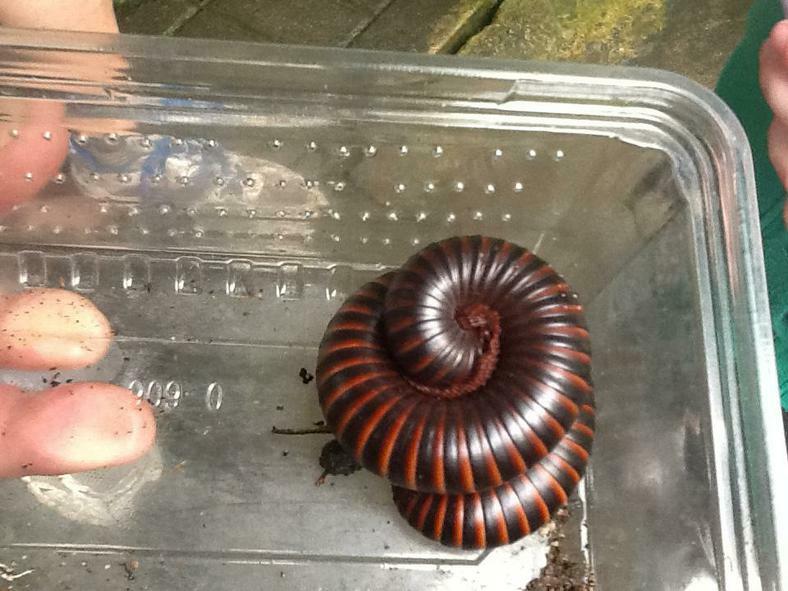 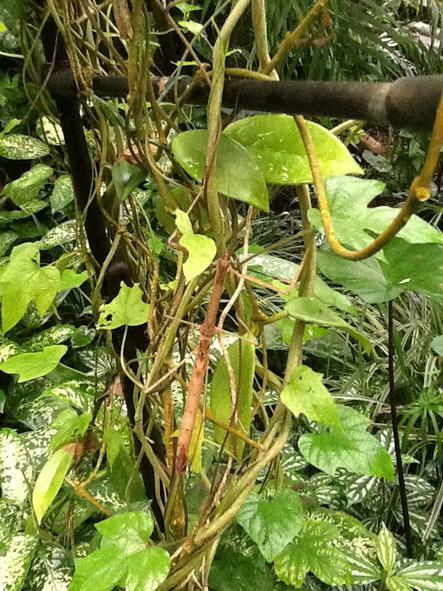 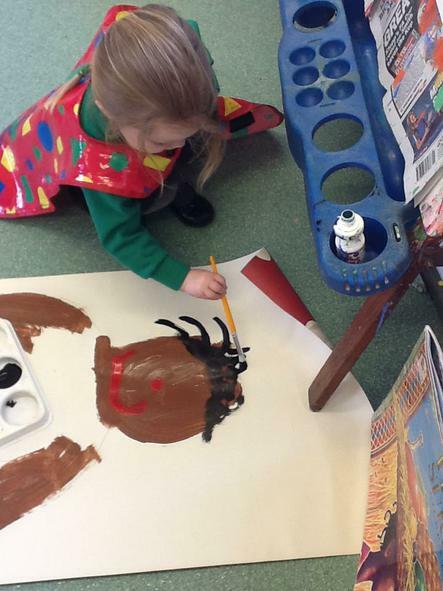 We will be looking at what sort of vegetable he is and who he helps. 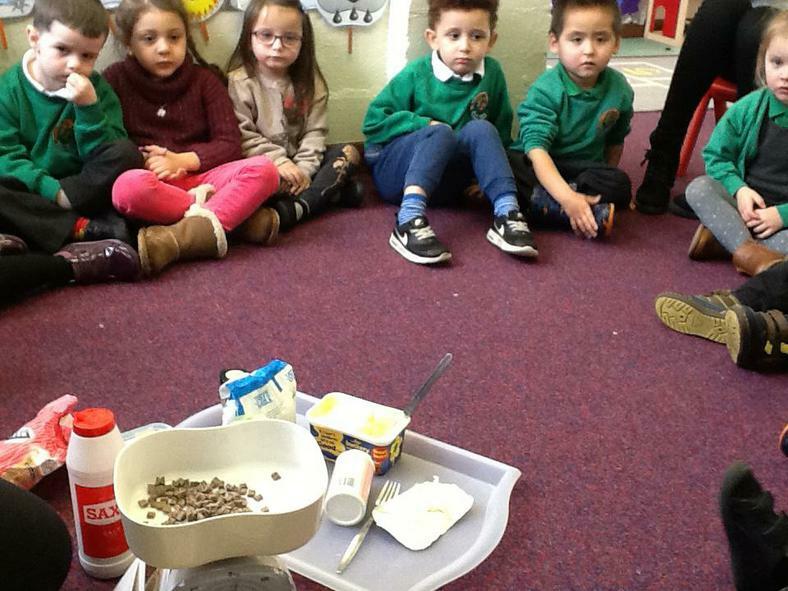 We will be learning our rhyme...'One potato, two potato etc. 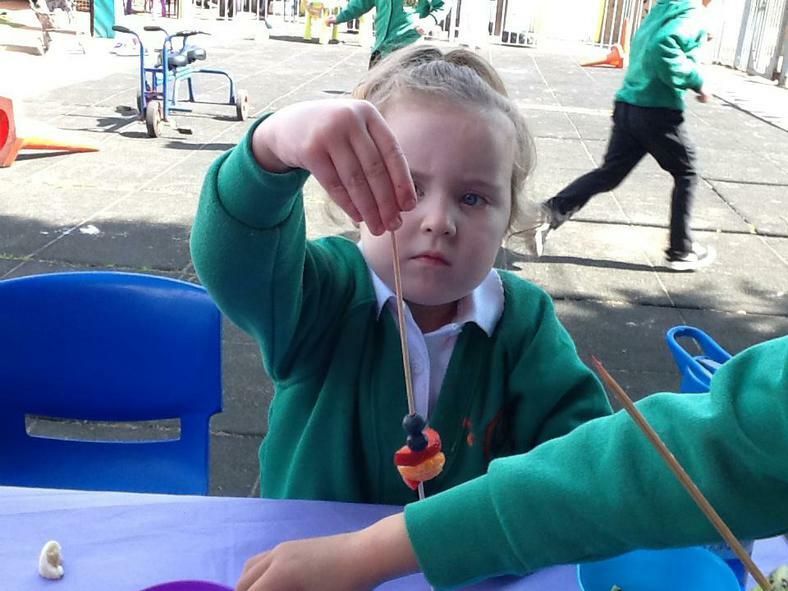 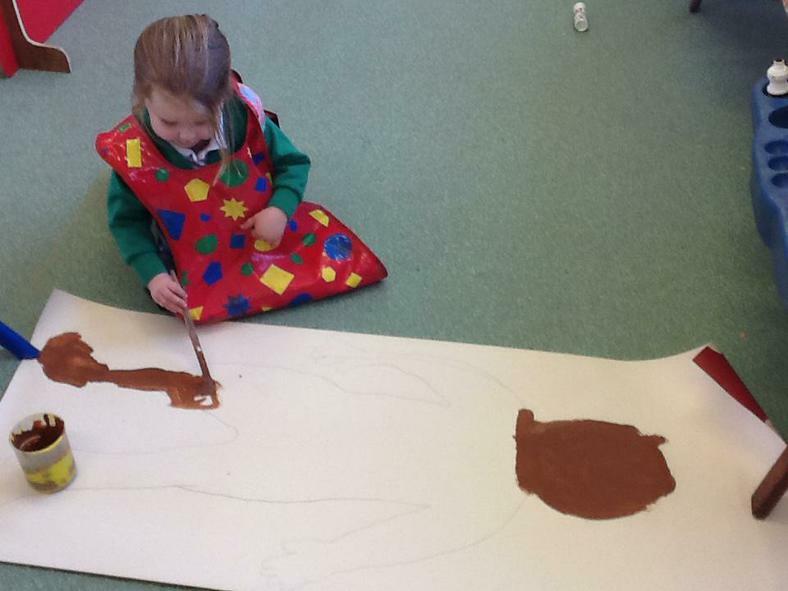 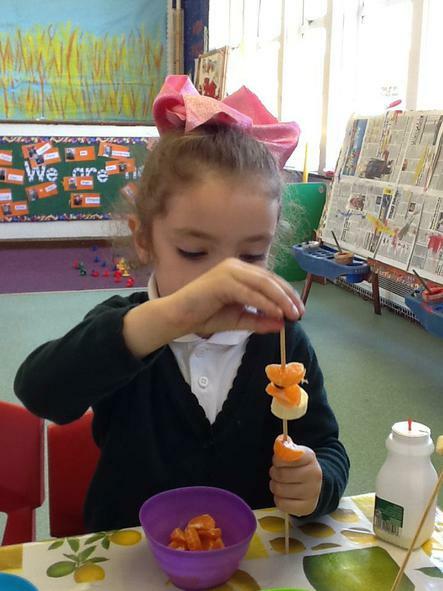 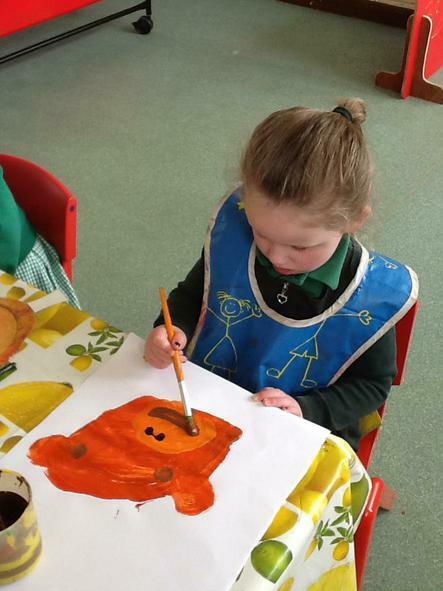 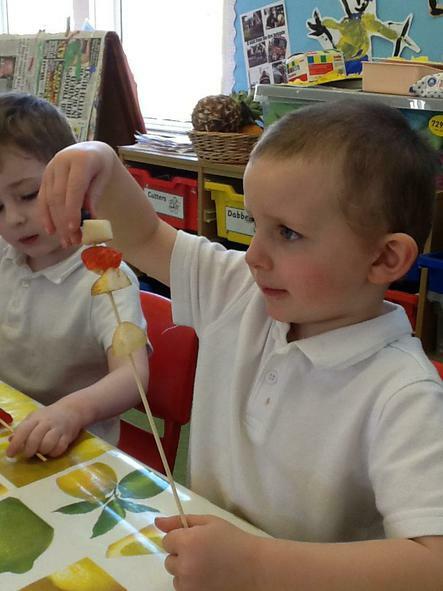 The children will be designing their own 'Supertato' and then when they bring their potato into Nursery we will decorate it using their design. 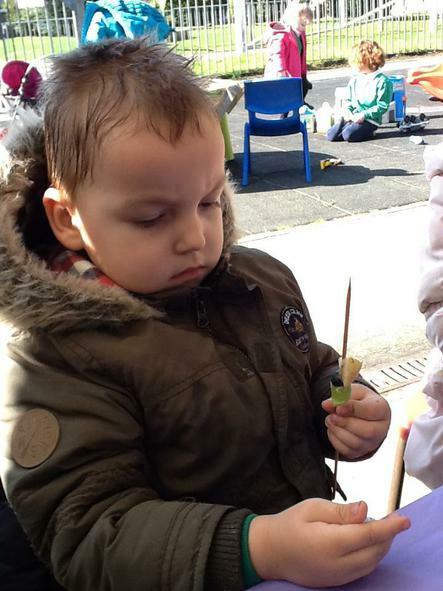 The children will also be sequencing their 'How to plant a bean' pictures, while doing this we will be thinking about their prior learning and practising their cutting and sticking skills. 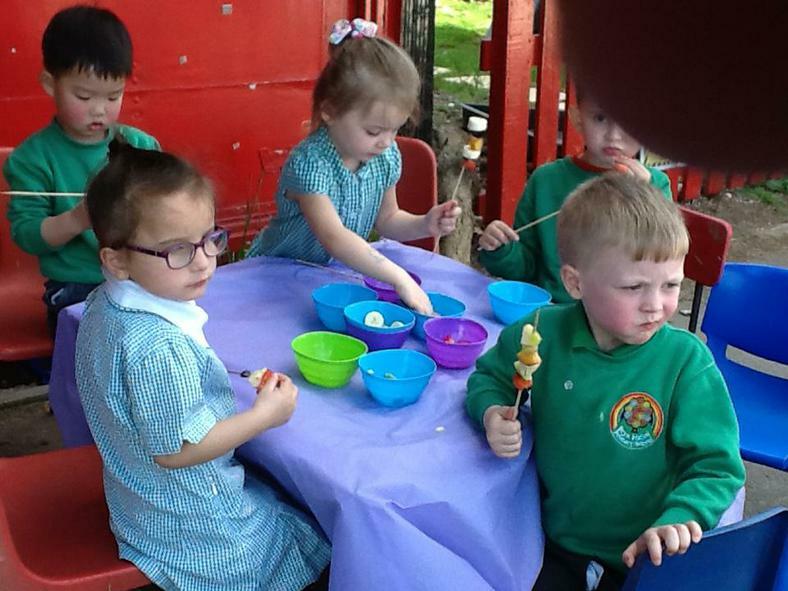 We will be having a Potato tasting session on Tuesday, trying lots of potato products and rating them with a smiley or sad face. 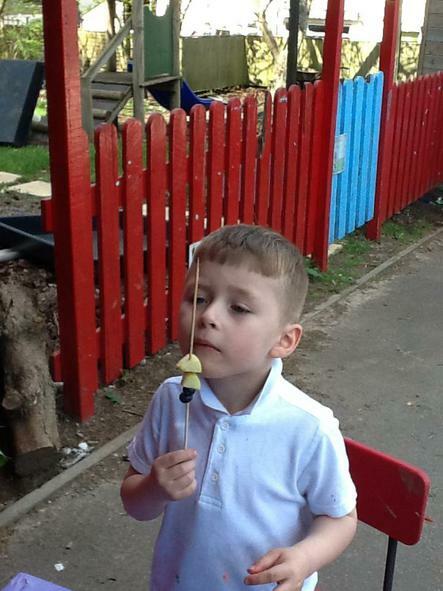 We will be planting potatoes on Thursday and Friday. 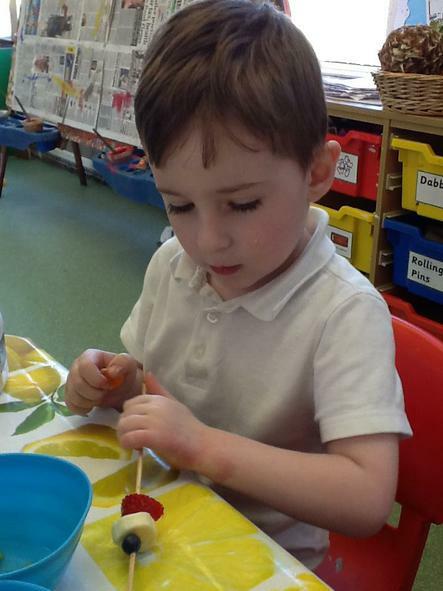 We will also be celebrating Valentines Day by creating collaboratively lovely Red hearts. 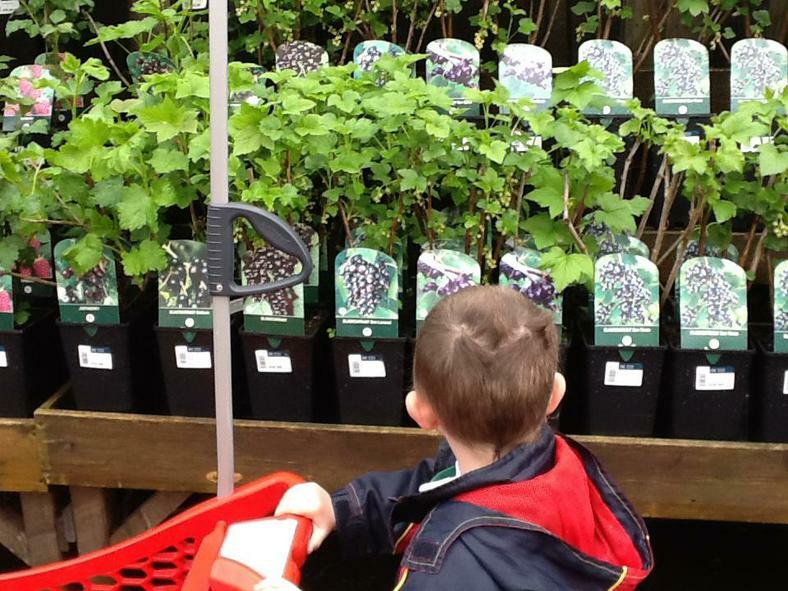 This week is all about PURPLE. 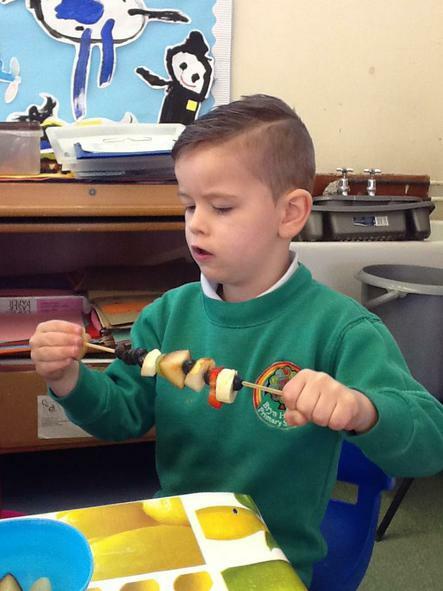 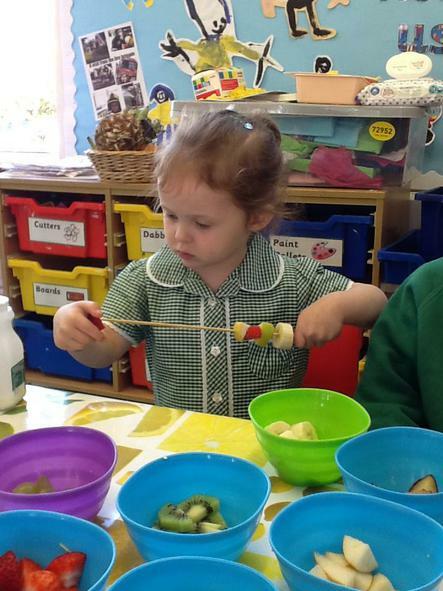 Our focussed text is 'Oliver's Vegetables'. 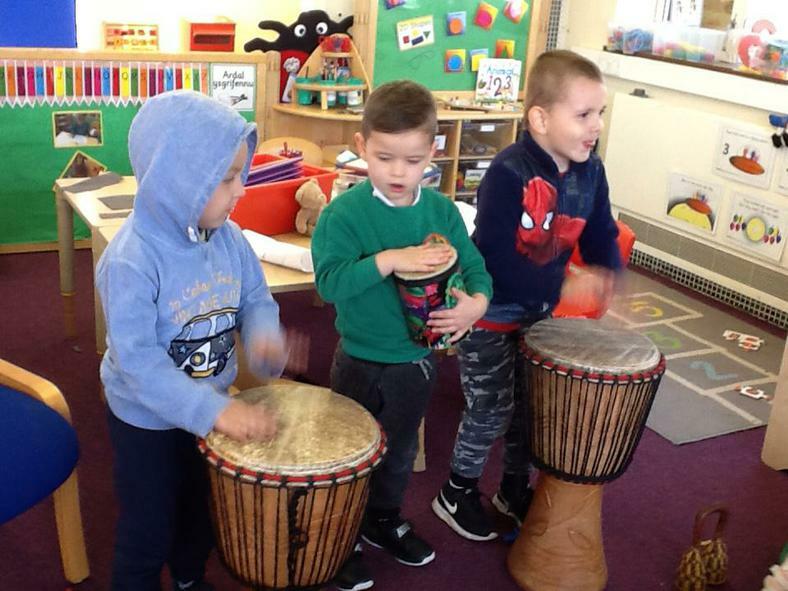 Our Nursery rhyme of the week is 'Cauliflower Fluffy, Cabbages green' You can find this song on Youtube and sing along with your child. 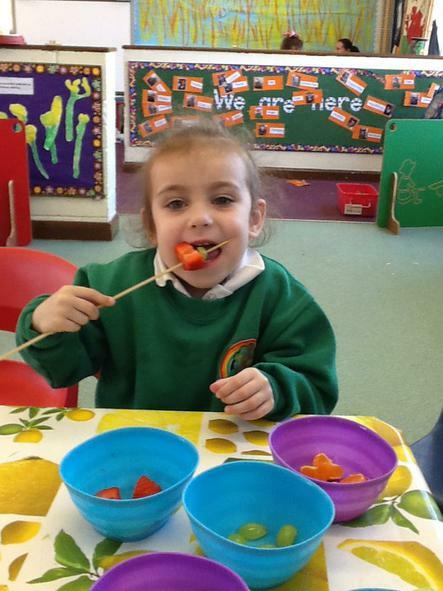 We will be playing vegetable Bingo, this is so that we can identify different vegetables and take turns when playing a game with our friends. 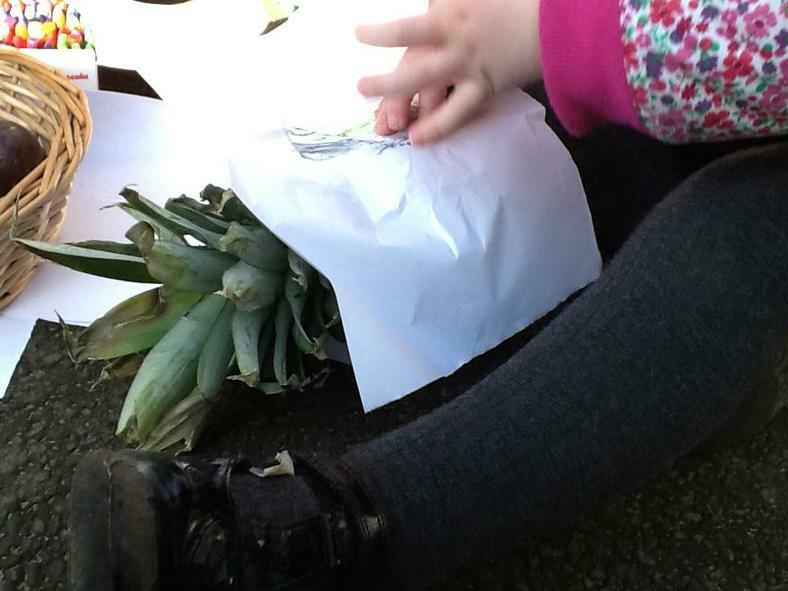 We will be identifying and sorting lots of vegetables in the soil. 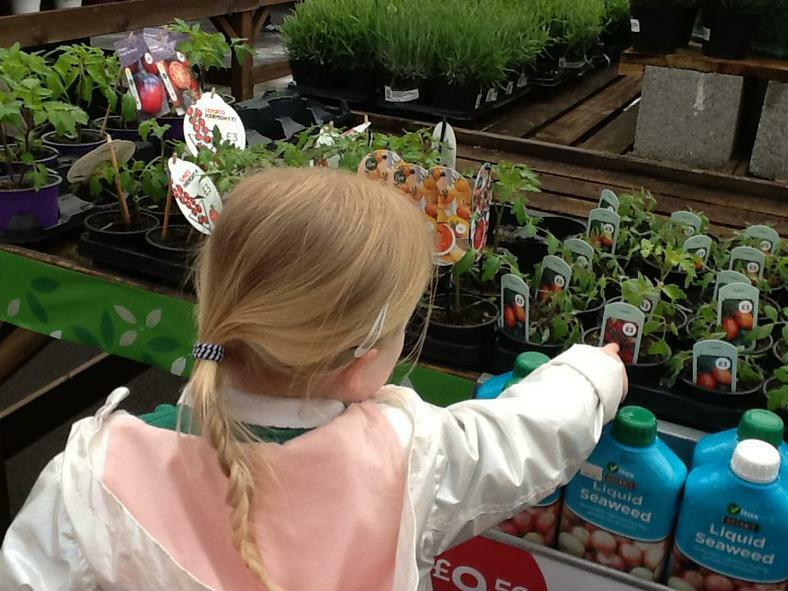 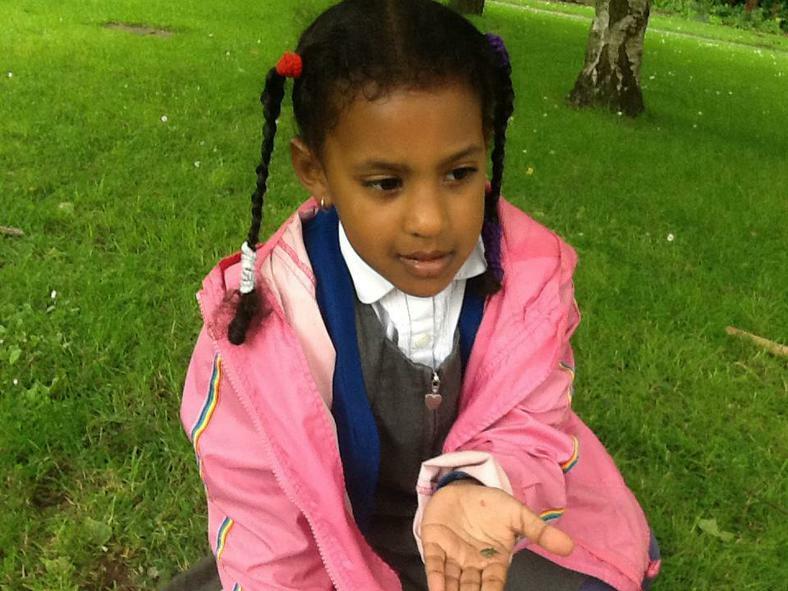 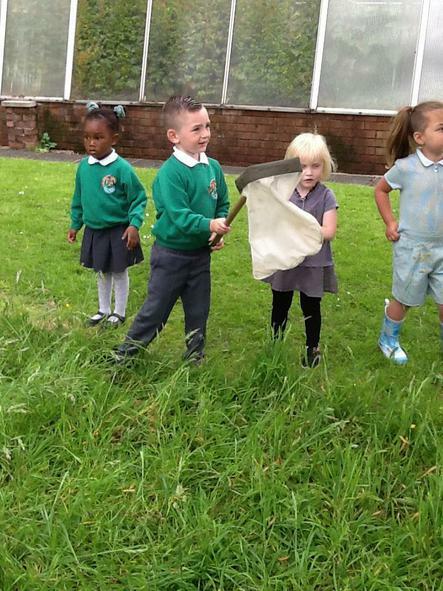 We will be planting seeds in our digging patch outdoors. 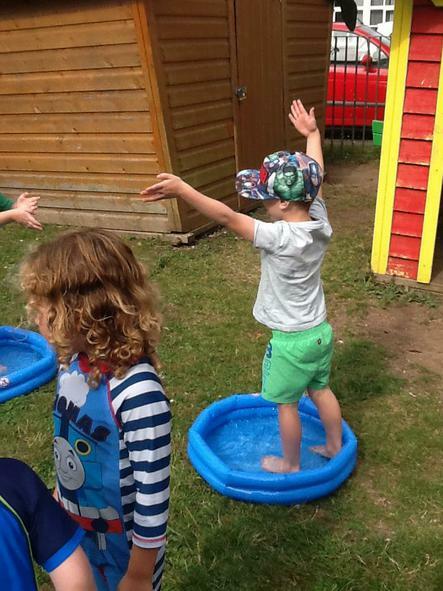 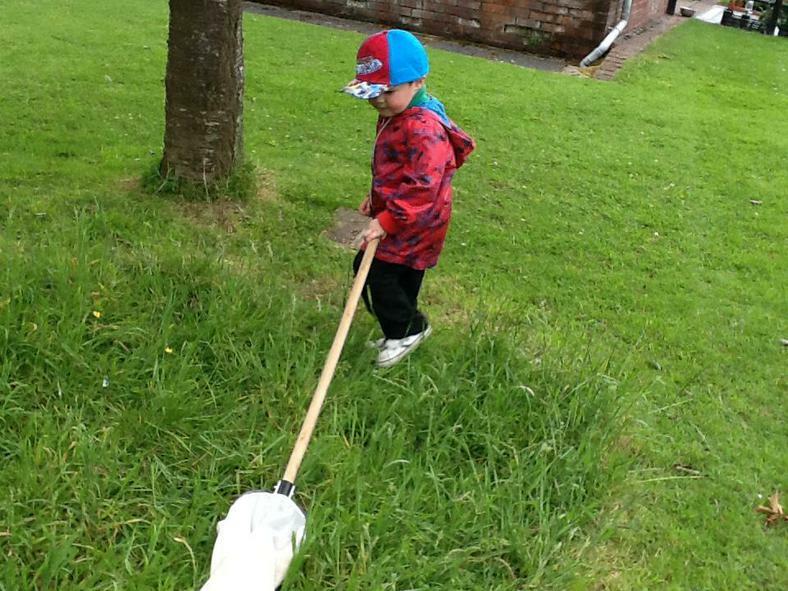 The children will experience lots of independent activities both indoors and outdoors so please ensure they are appropriately dressed. 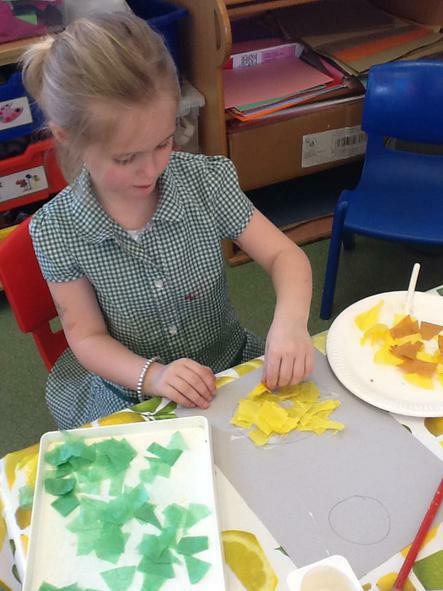 There will also be a variety of Teacher led activities including vegetable printing, creating our own repeating patterns. 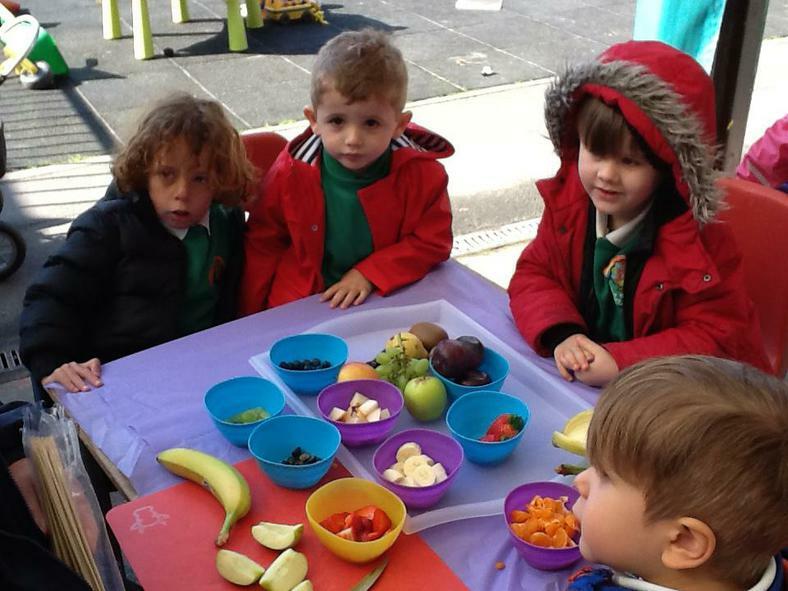 Please ensure that you pay your £1 a week snack money and that your child's book bag and communication book comes into school daily. 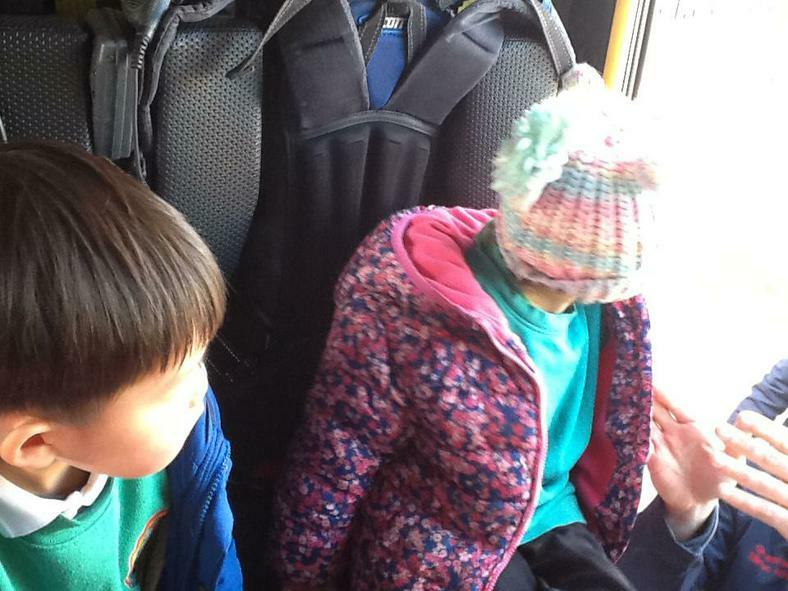 If you have misplaced the book or bag, please let me know and we can get it replaced. 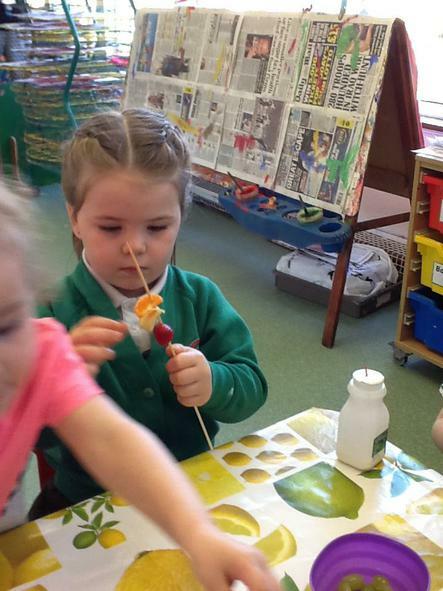 This week we will be Celebrating Chinese New Year. 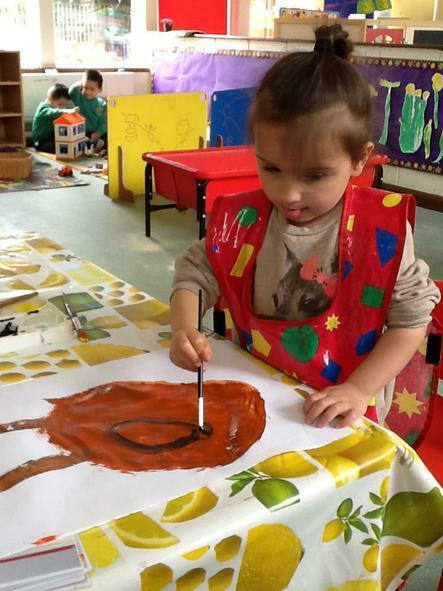 It is the year of the Rooster. 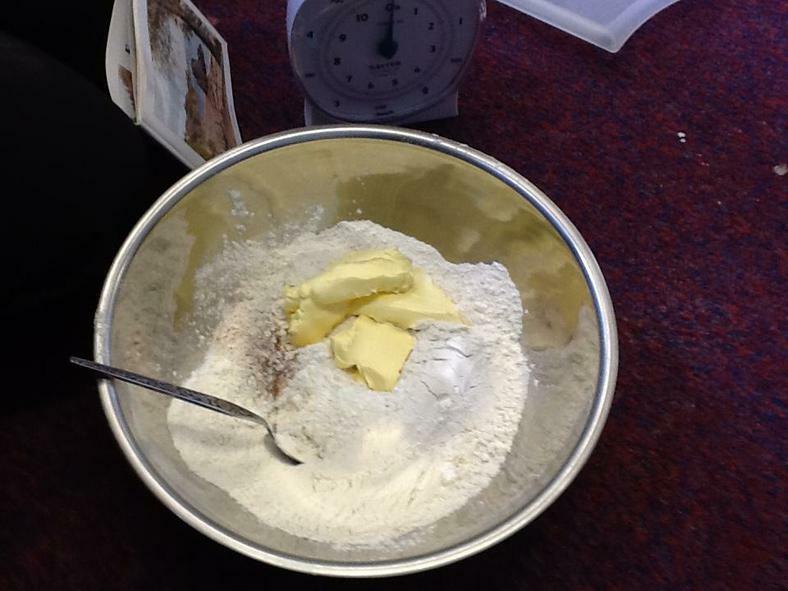 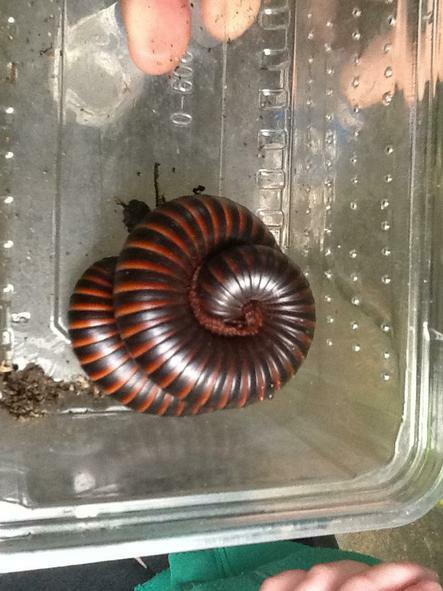 The children will be making Red money envelopes and bringing these home with a CHOCOLATE gold coin! 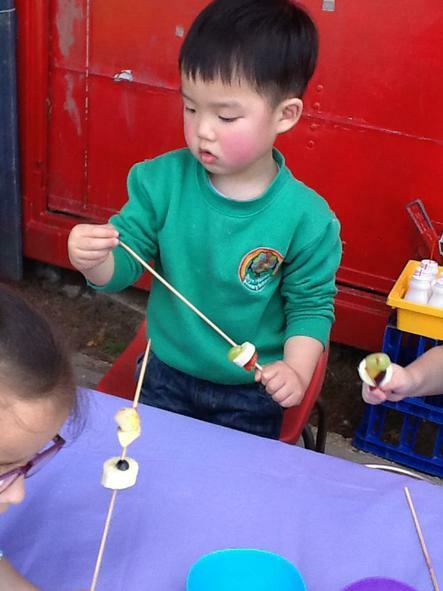 We will also be tasting traditional Chinese food, such as Noodles and Vegetarian Spring Rolls. 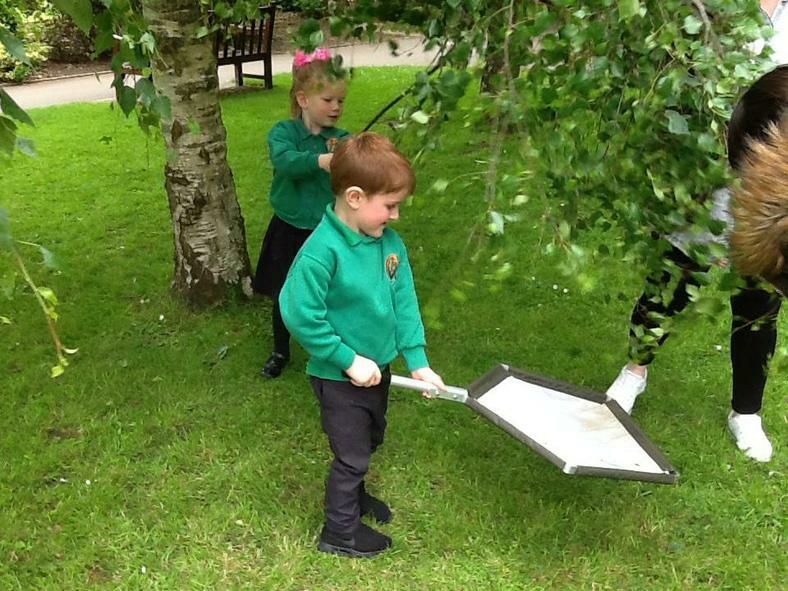 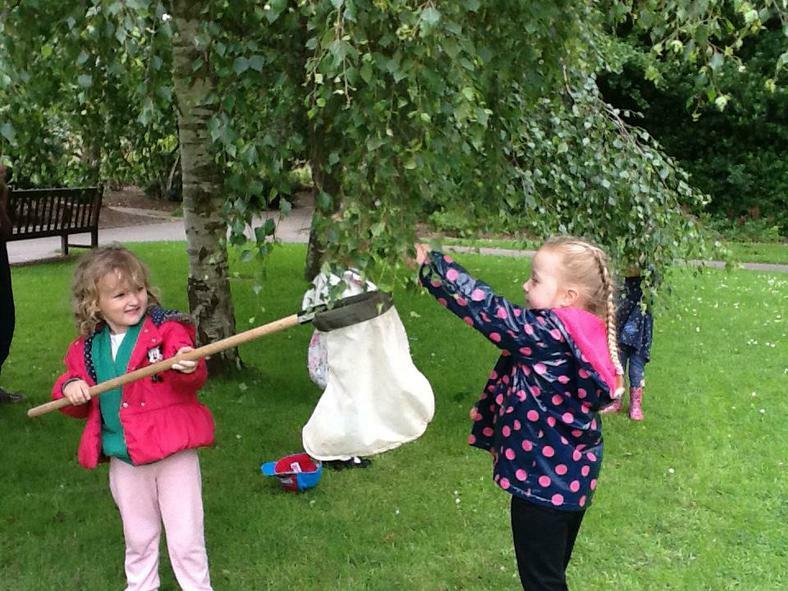 The children will be creating their own blossom trees and working collaboratively to create class lantern blossom trees........Photos to follow. 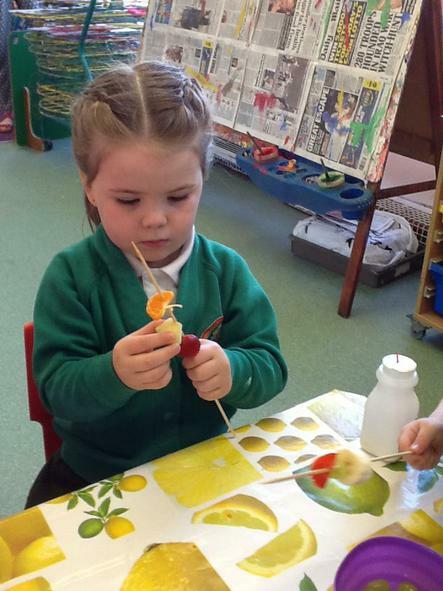 The children will also be creating a 'Collage class Rooster'. 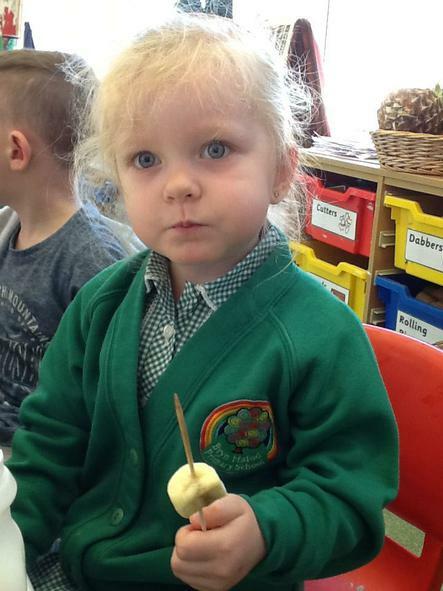 We will also be reading the story of 'The Enormous Turnip', we will be looking at turnips, tasting them, counting them and ordering them in size order, smallest to biggest! 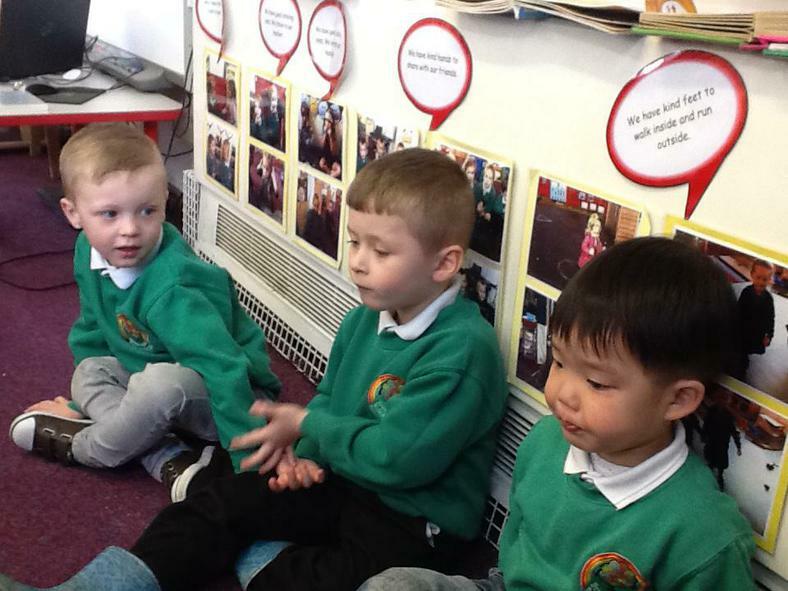 We will be sequencing the story and retelling it to our friends.